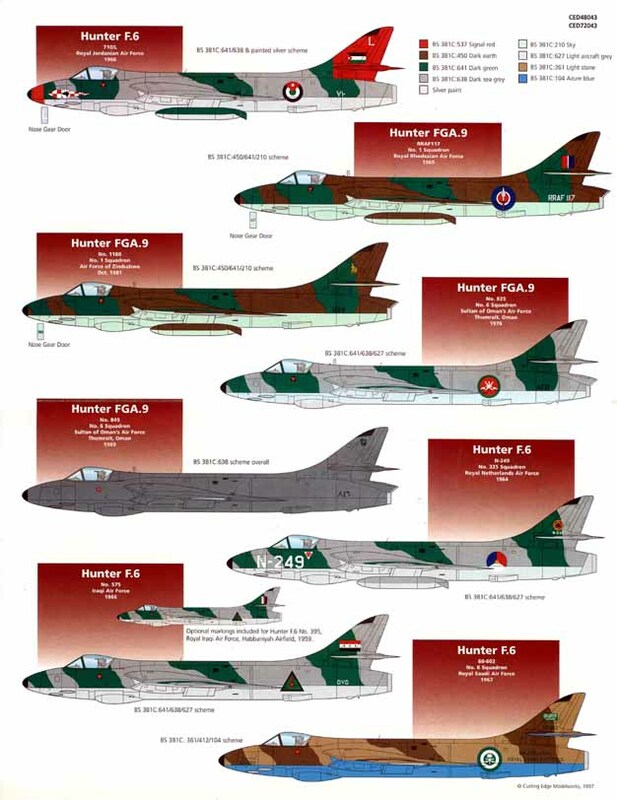 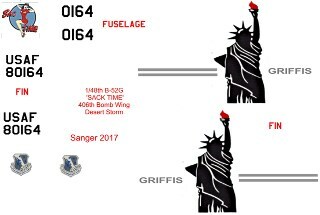 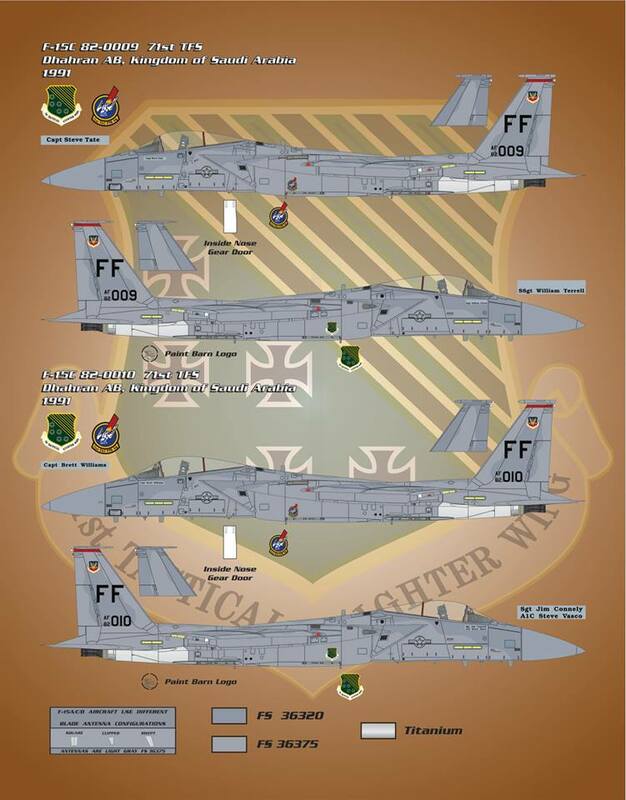 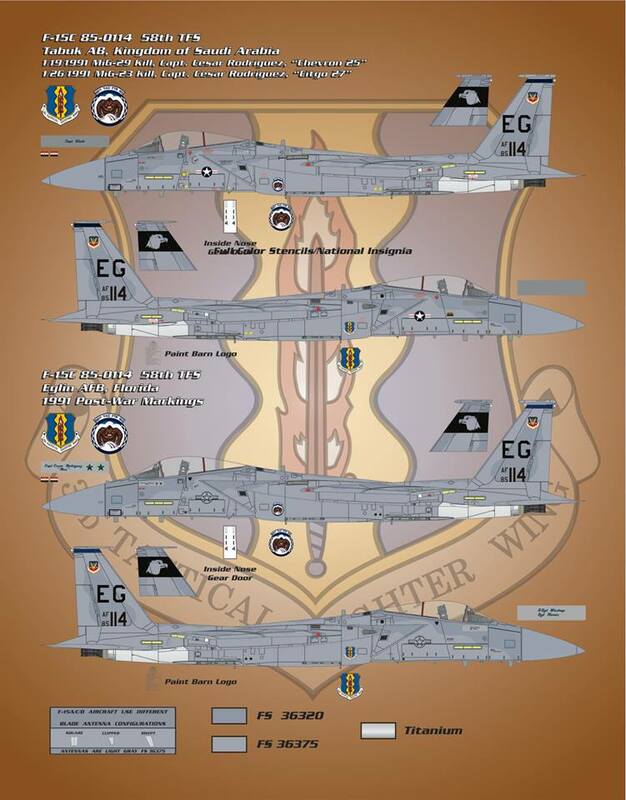 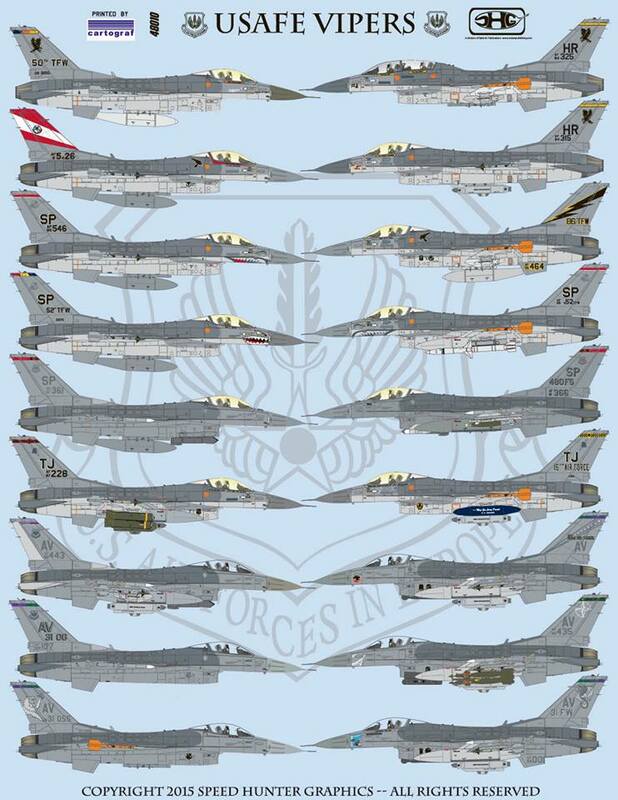 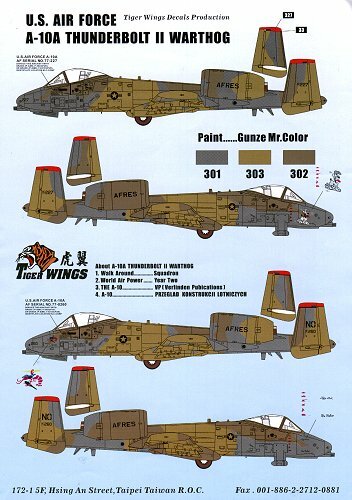 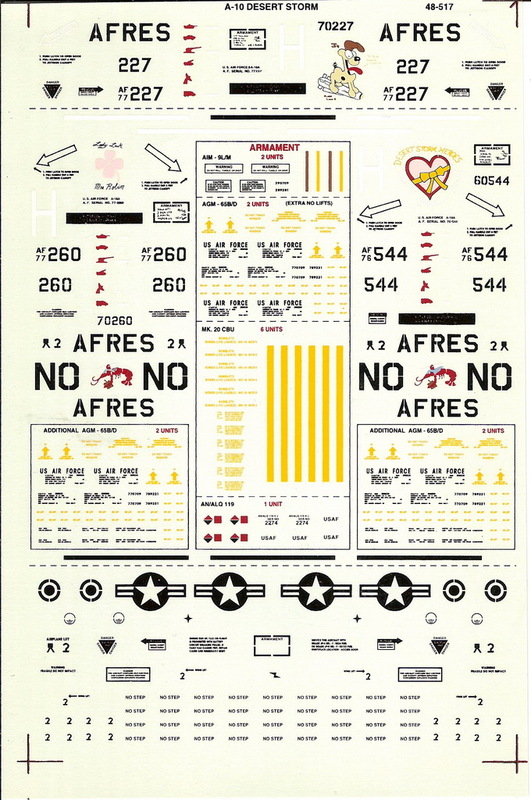 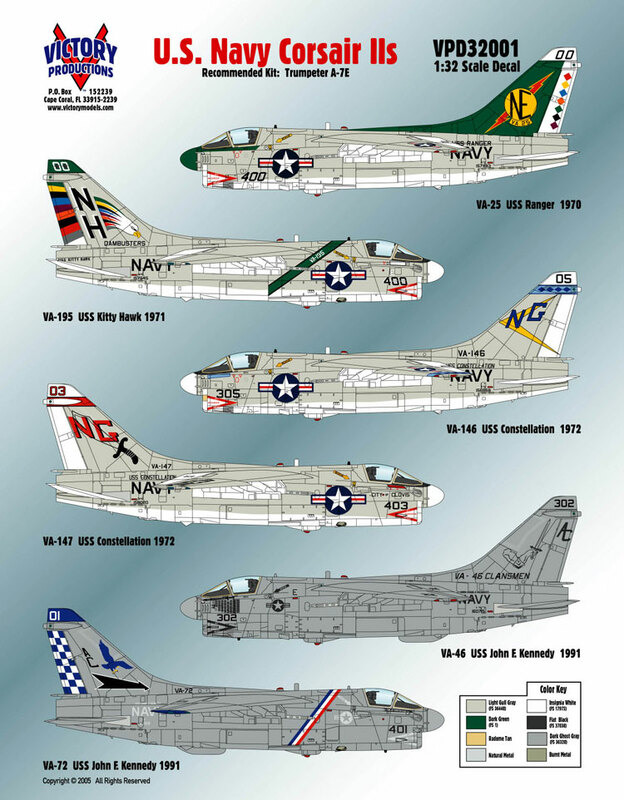 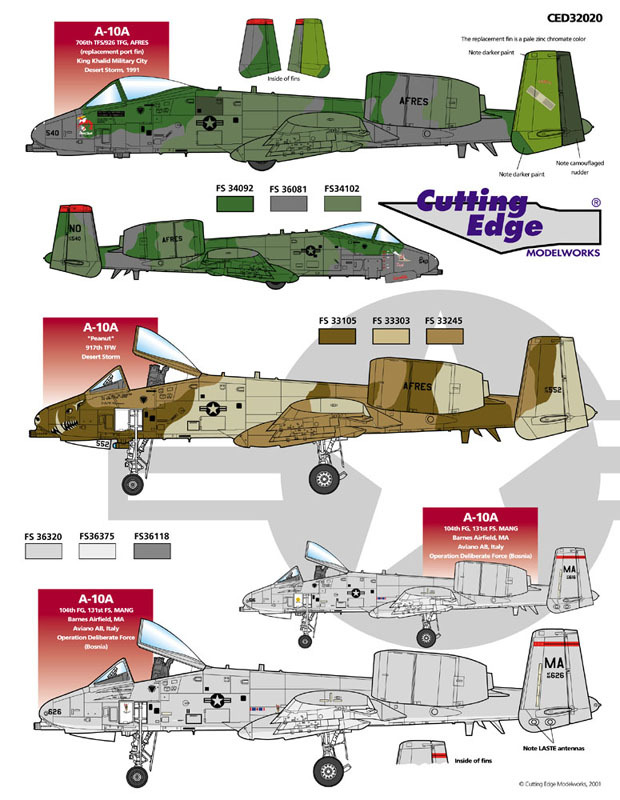 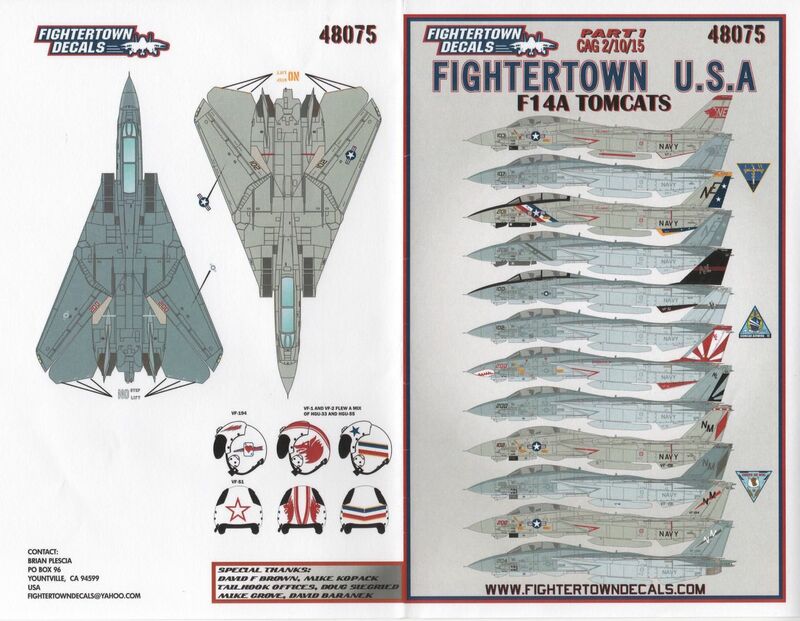 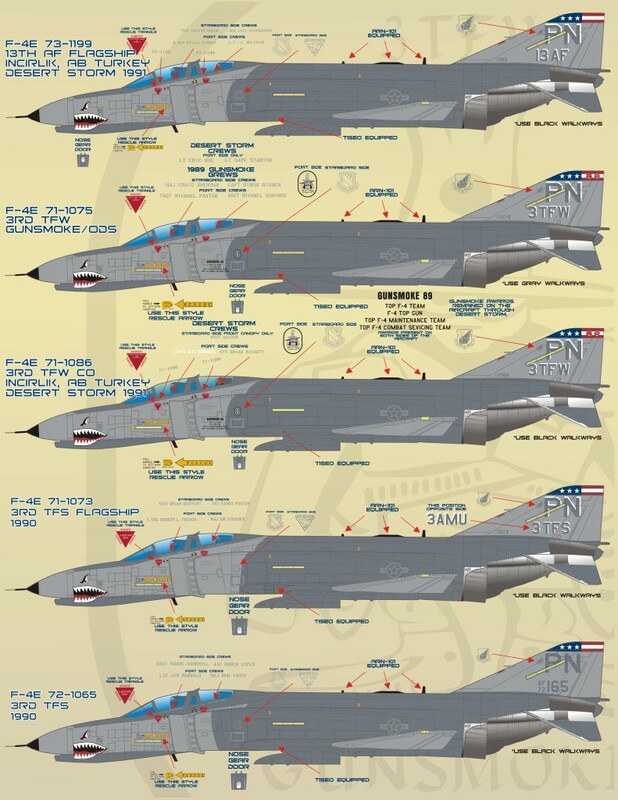 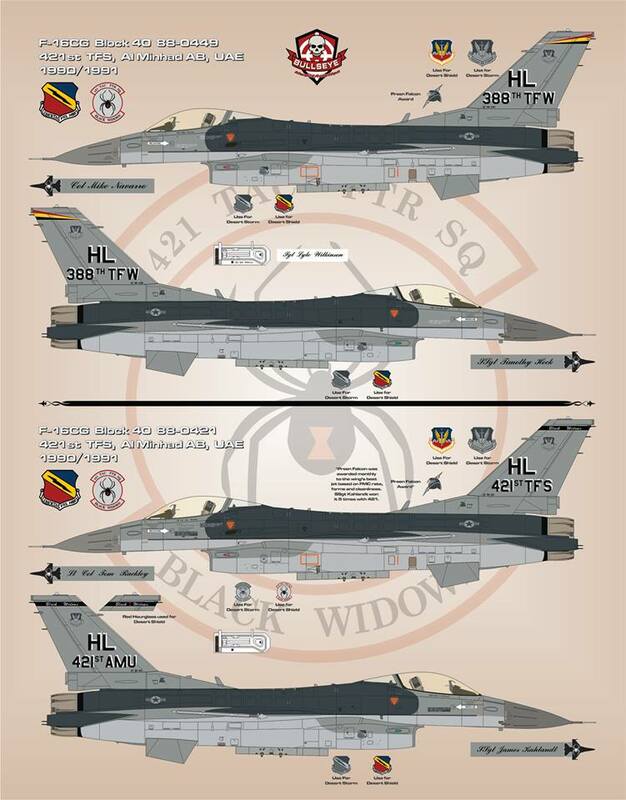 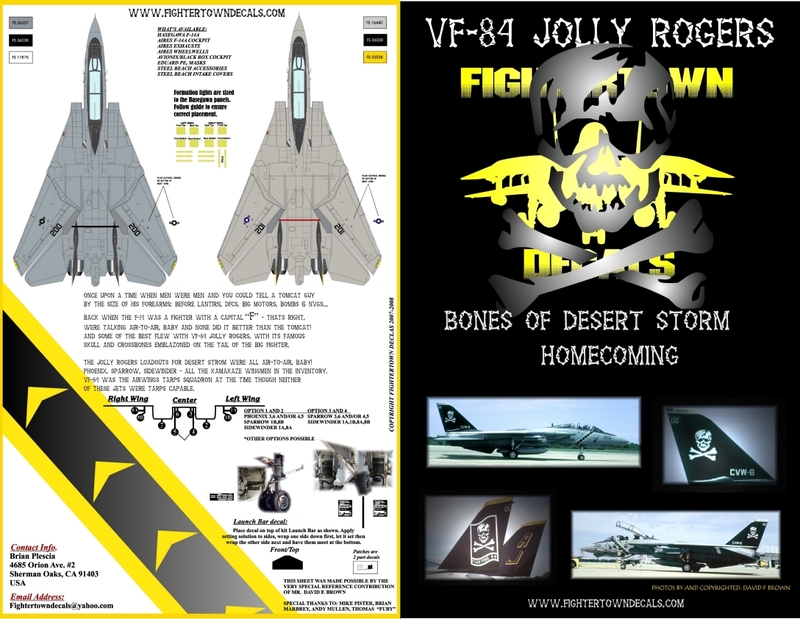 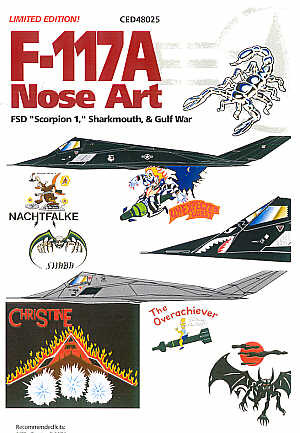 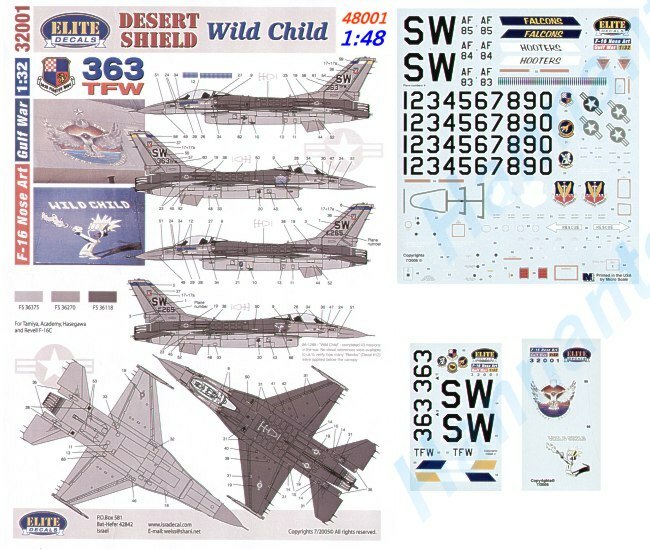 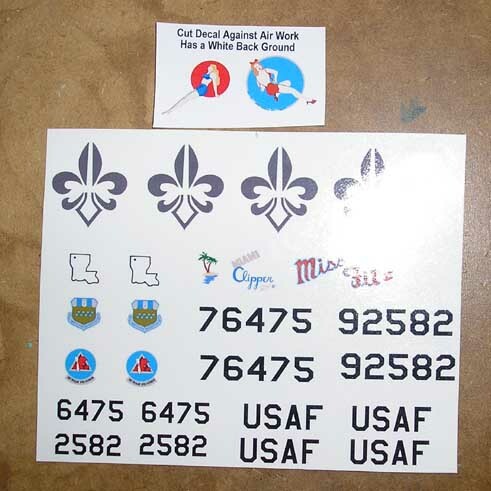 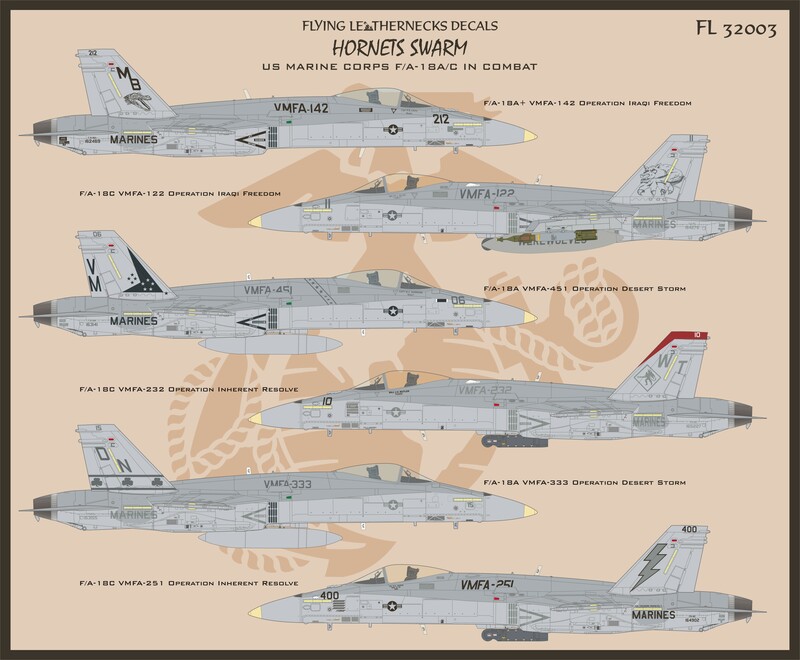 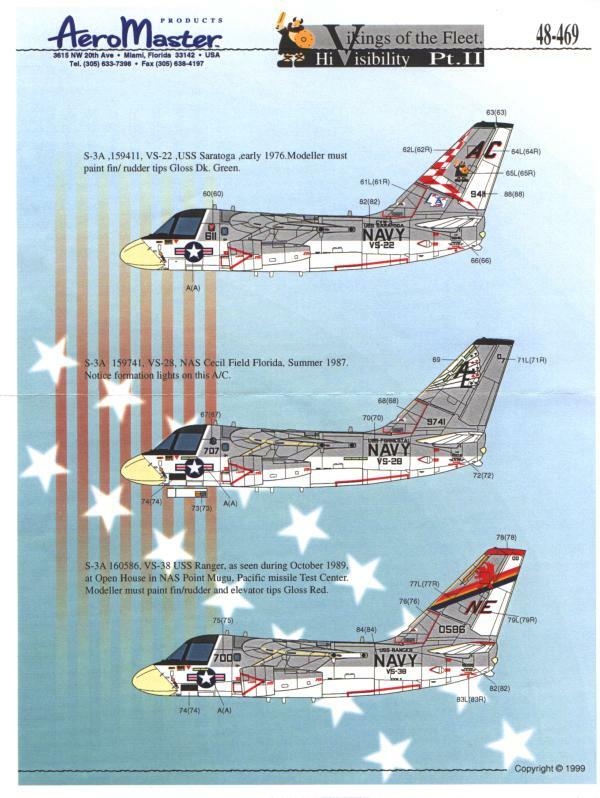 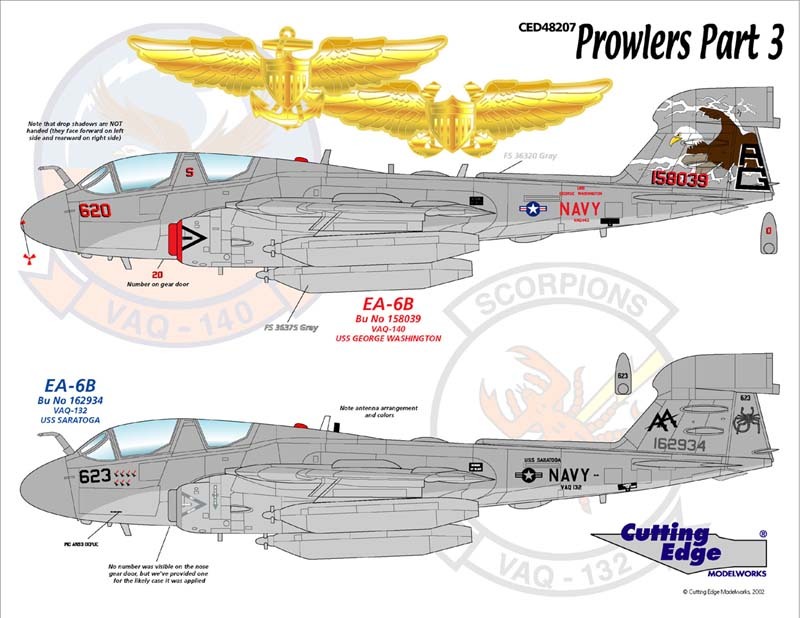 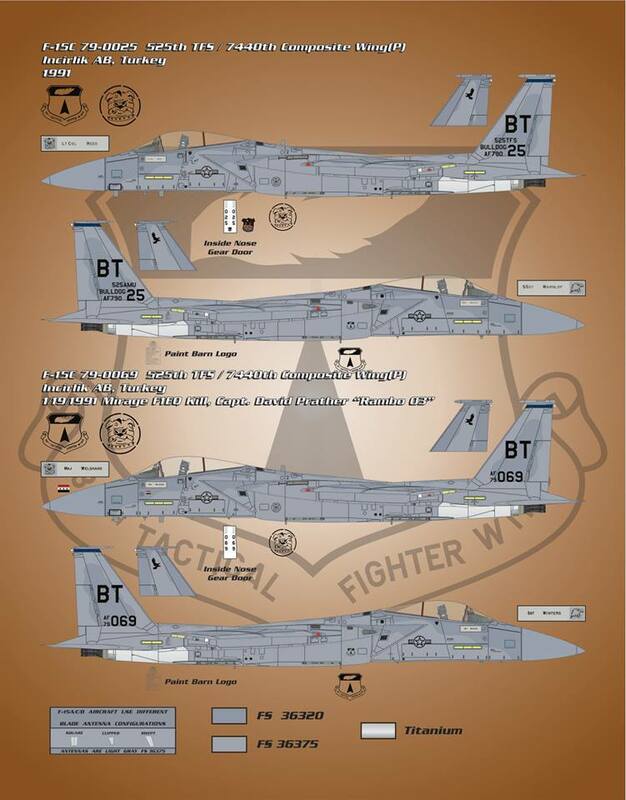 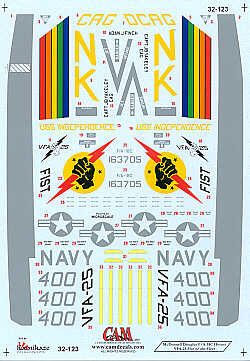 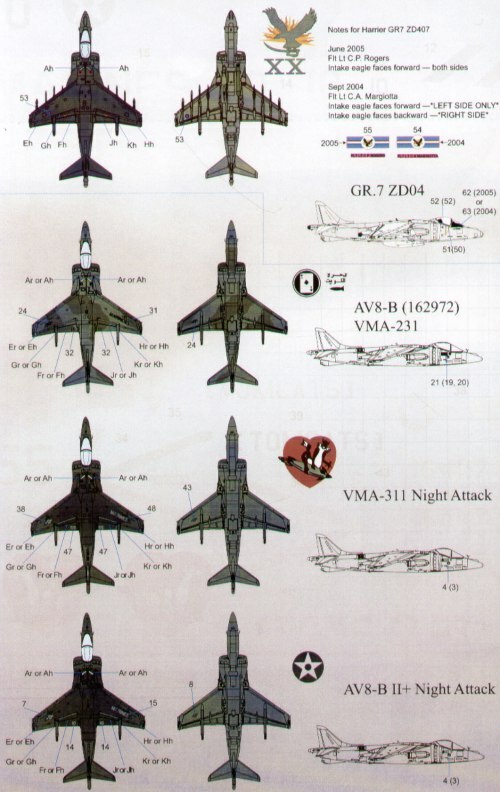 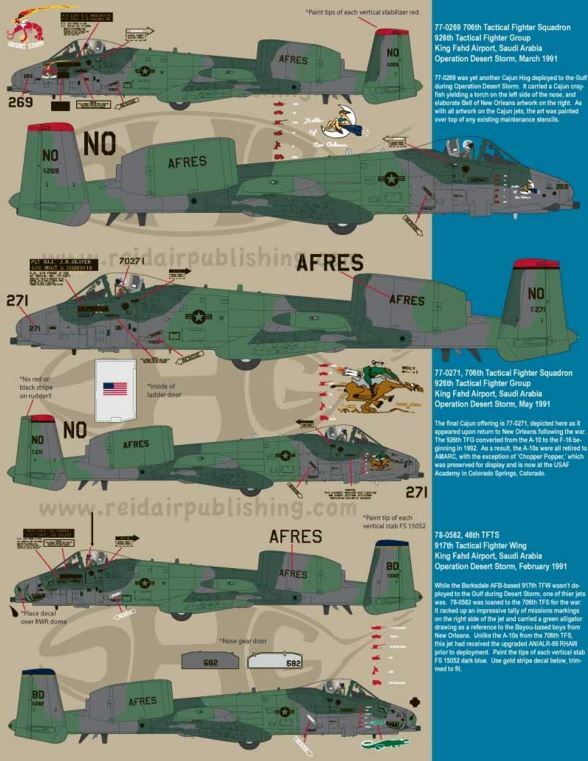 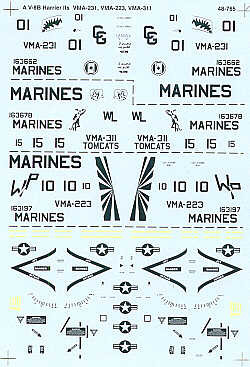 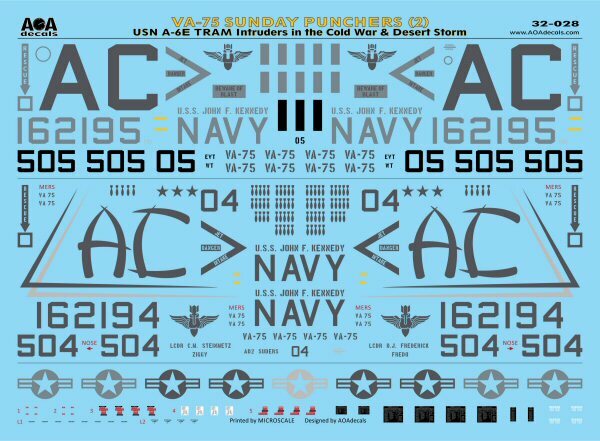 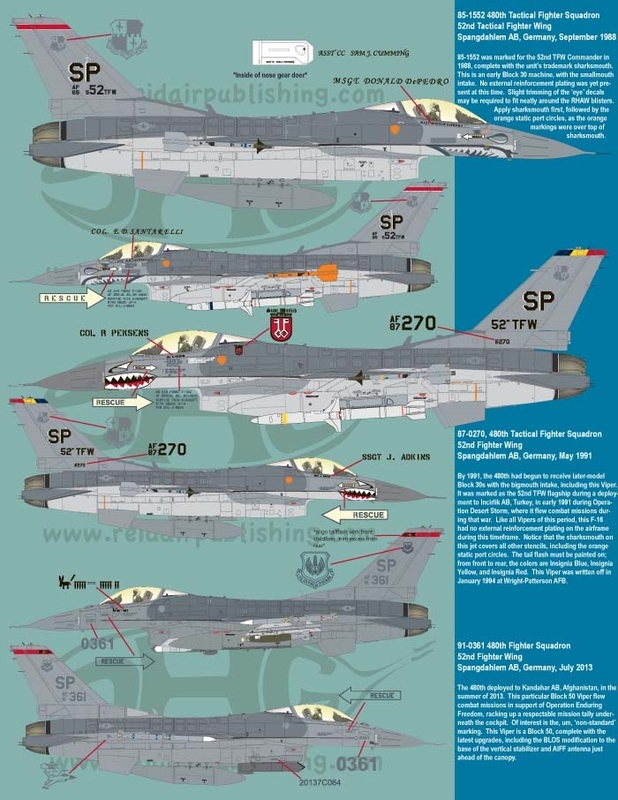 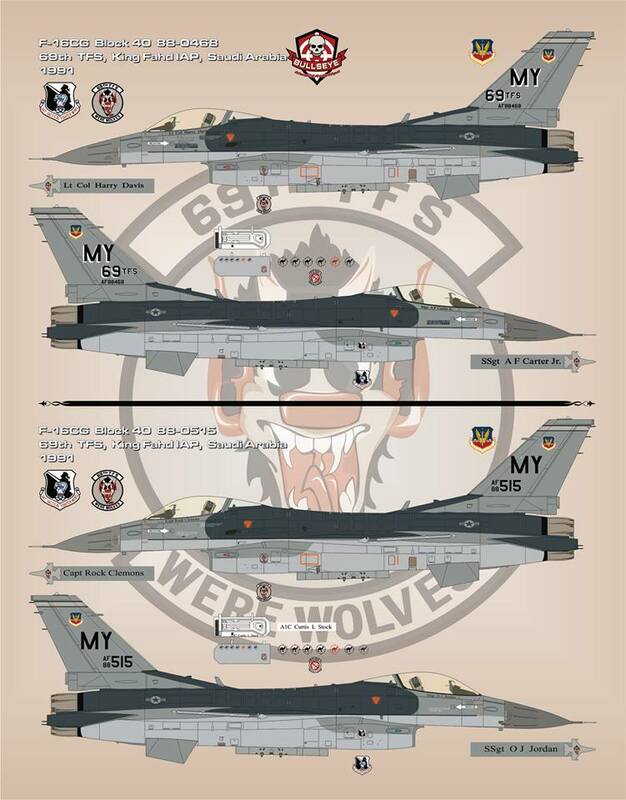 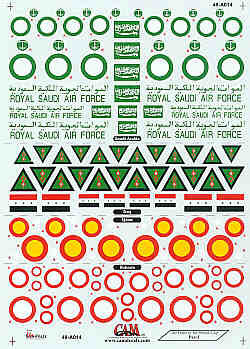 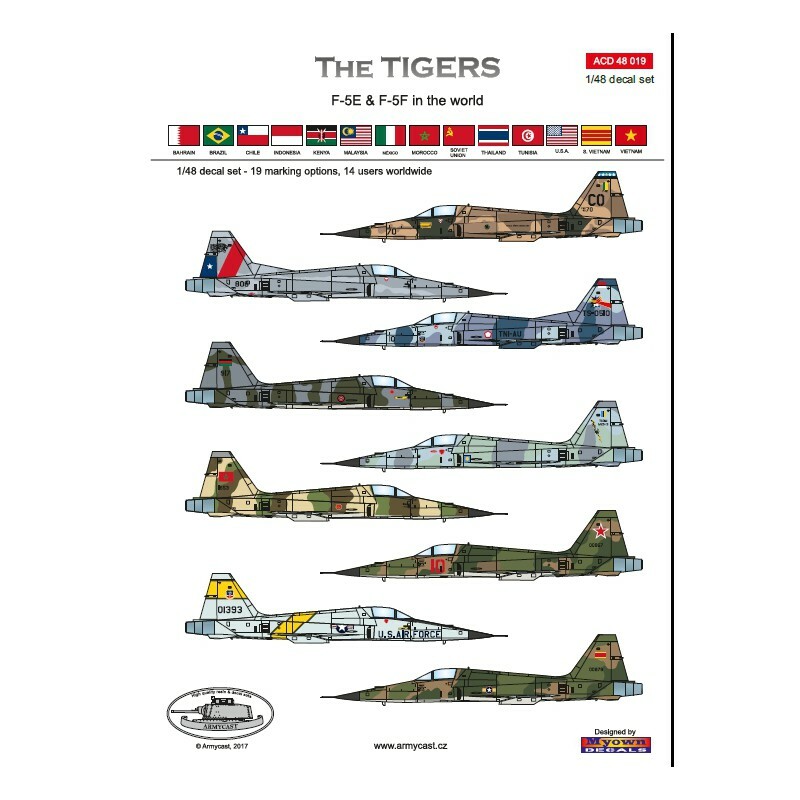 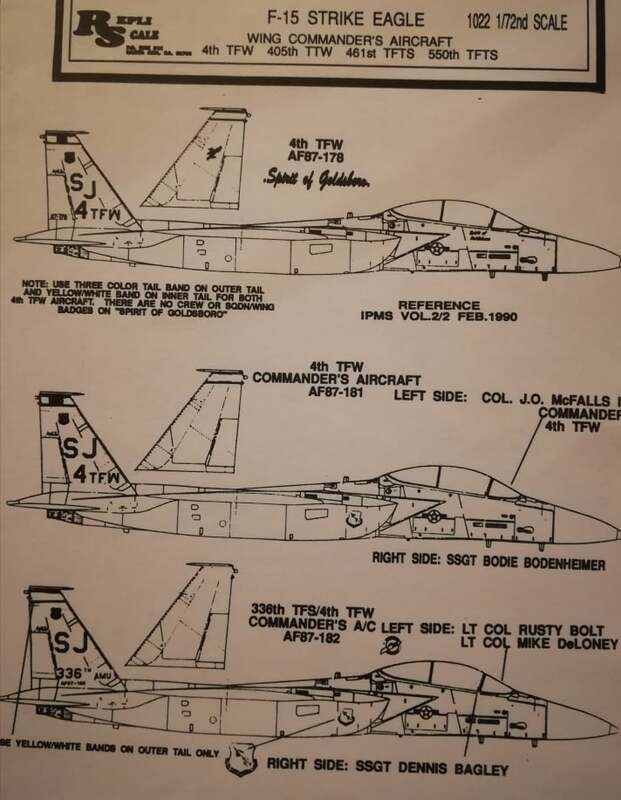 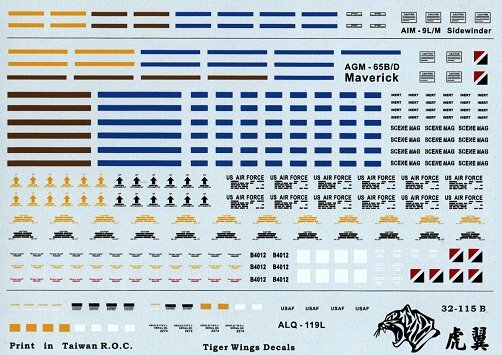 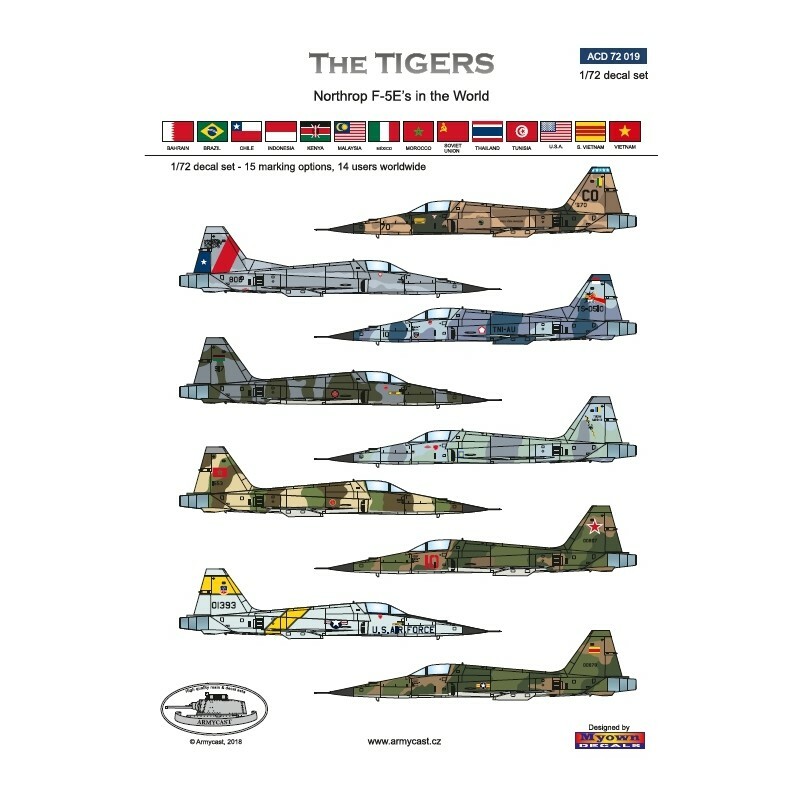 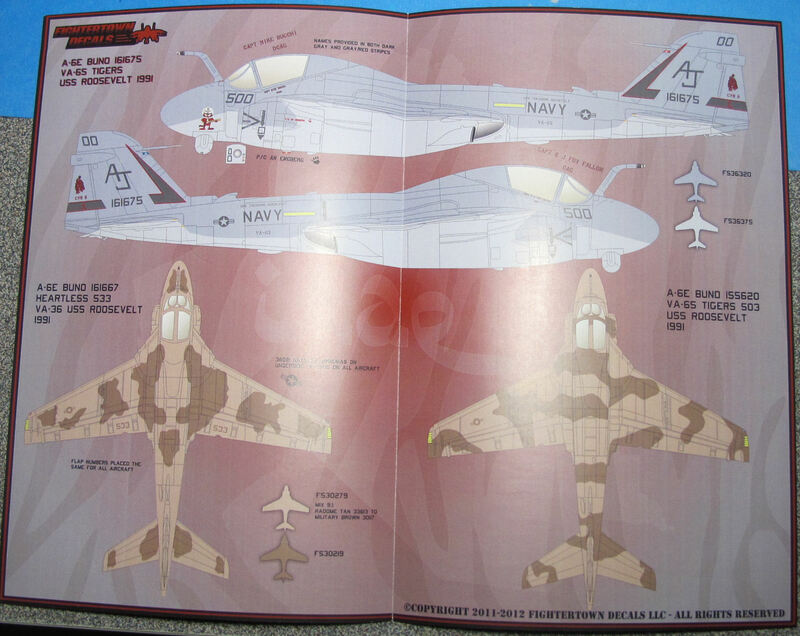 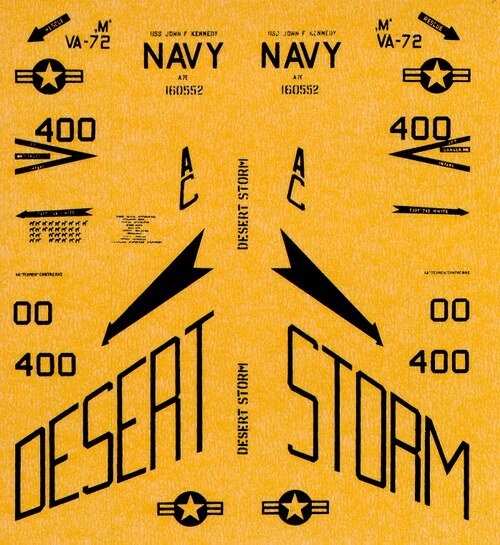 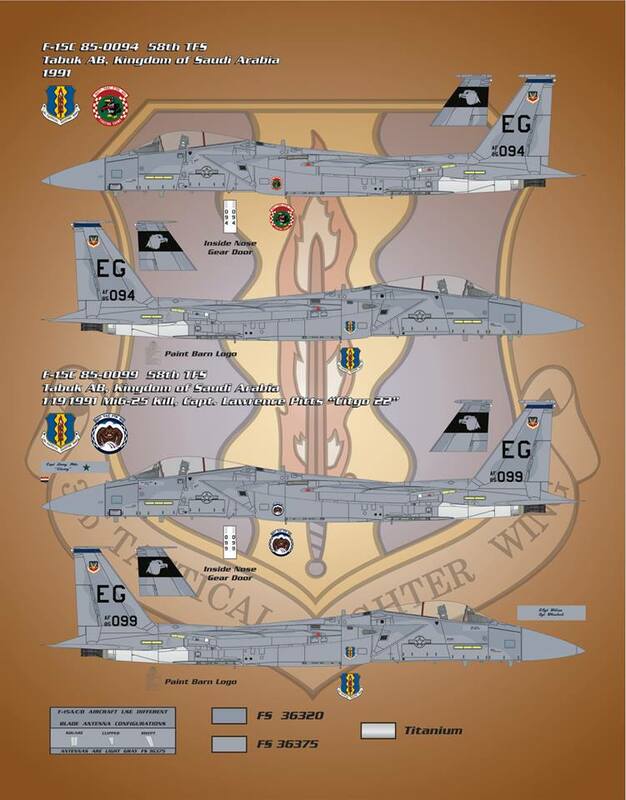 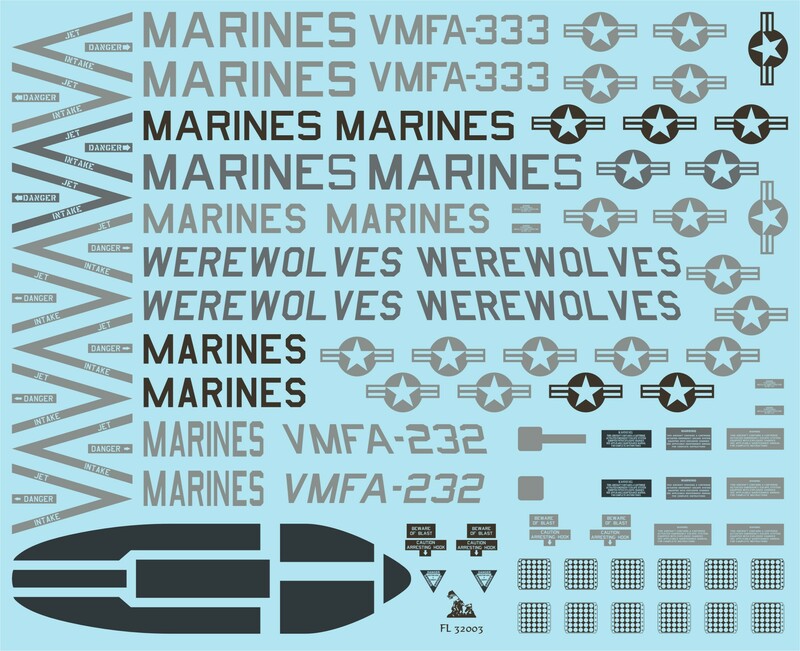 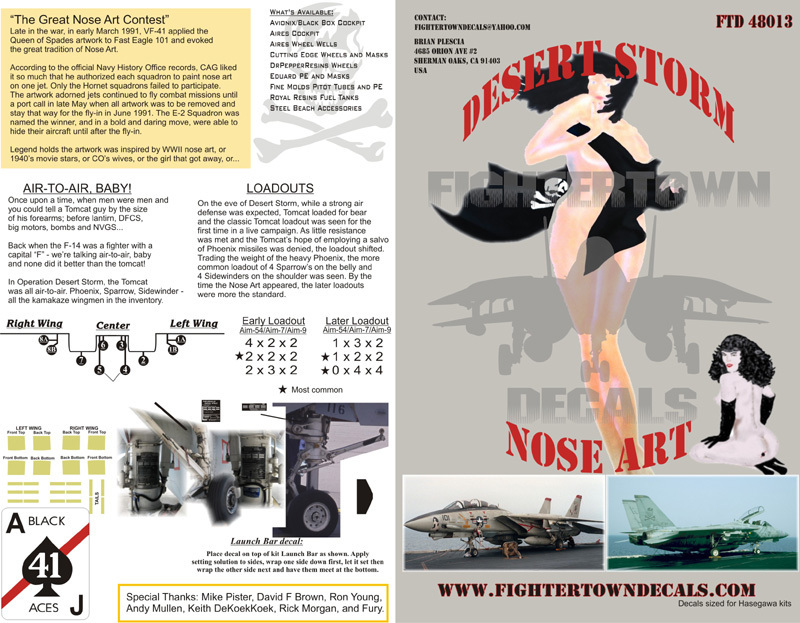 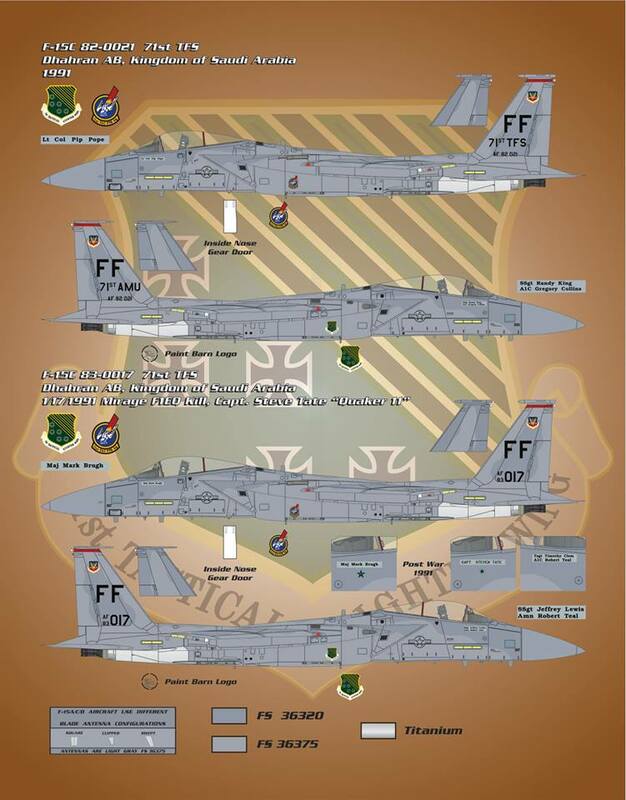 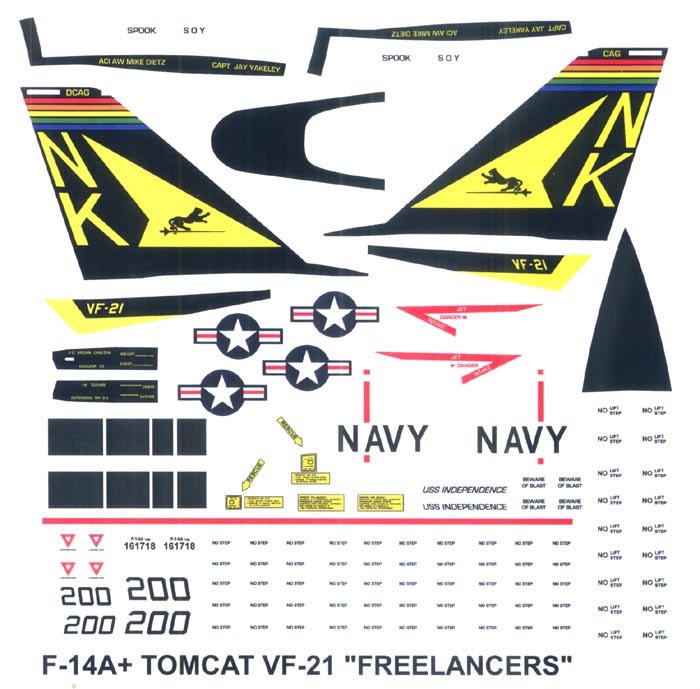 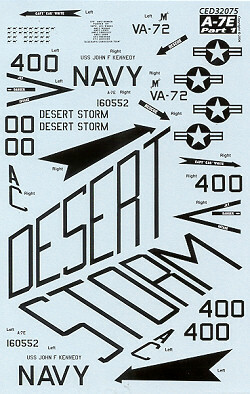 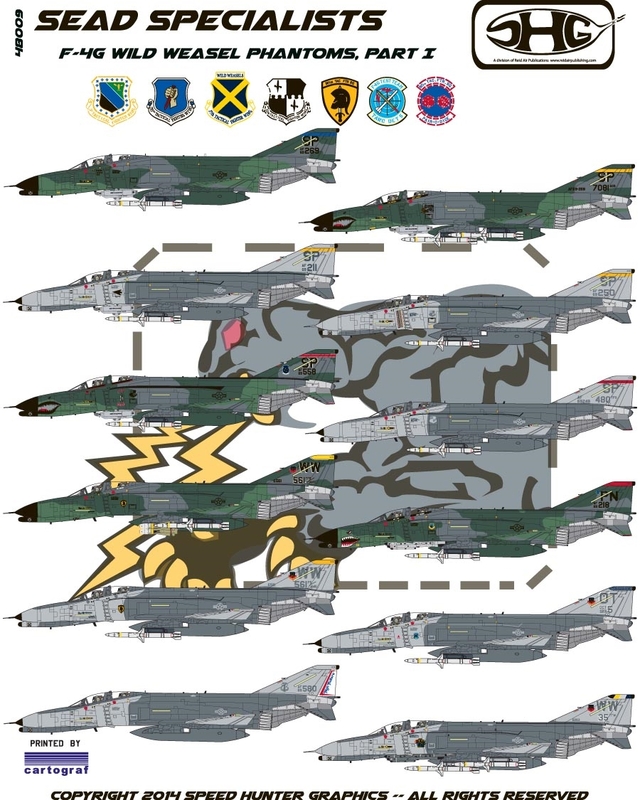 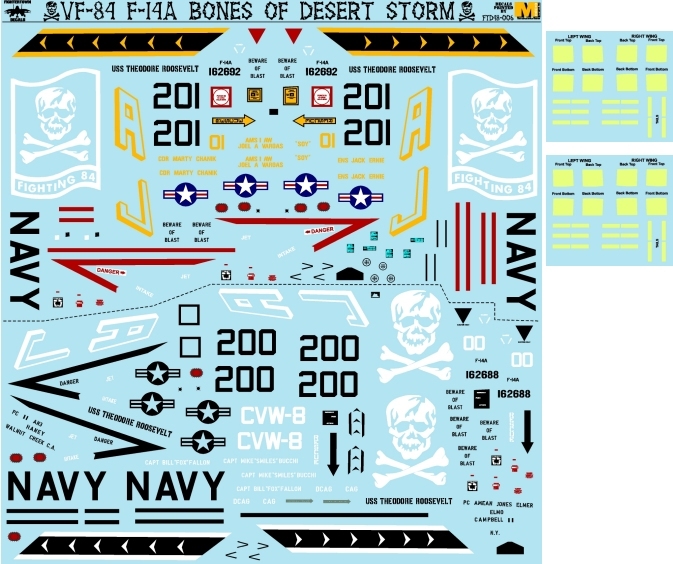 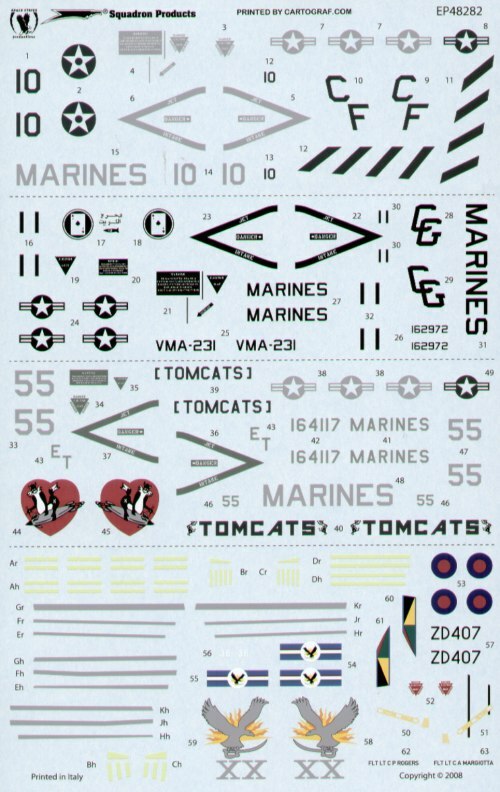 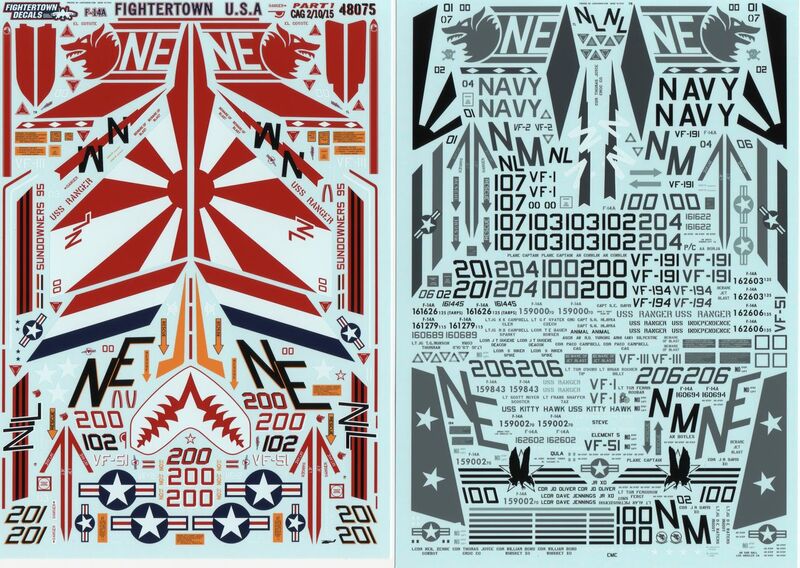 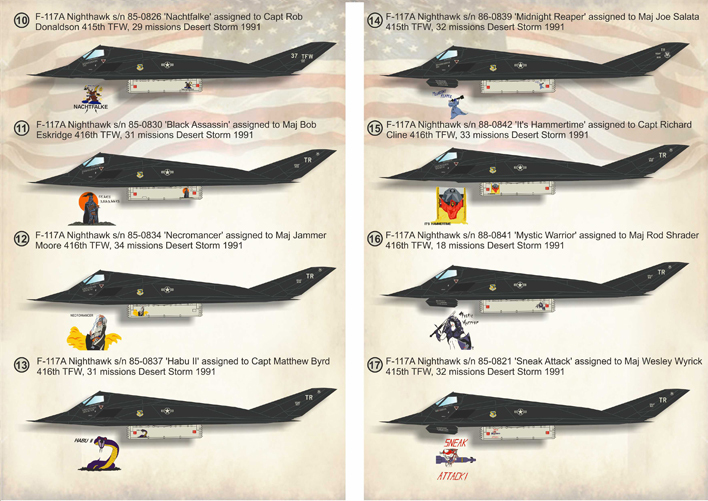 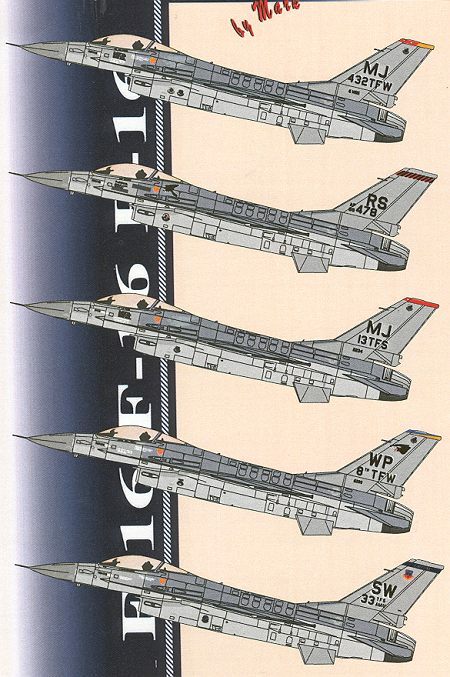 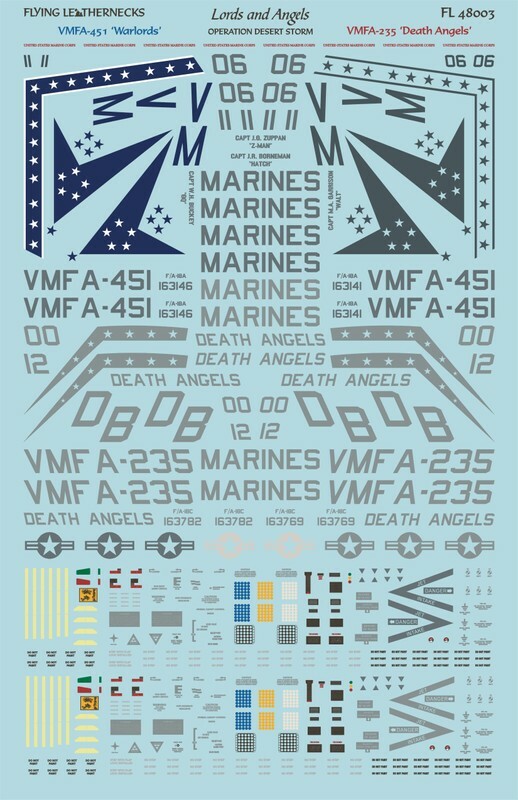 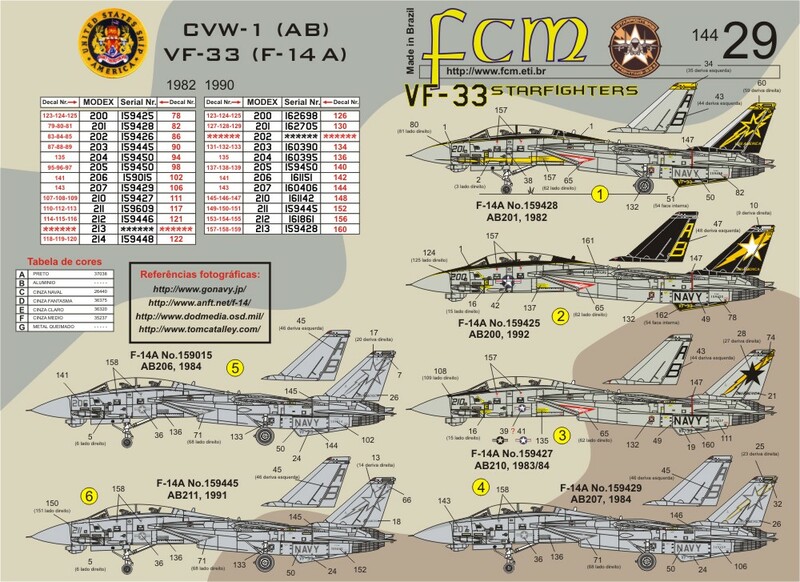 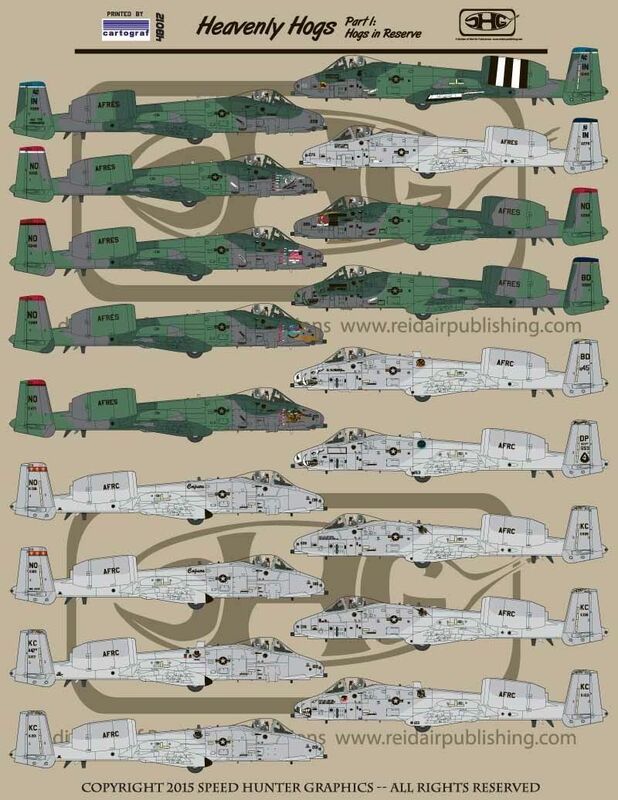 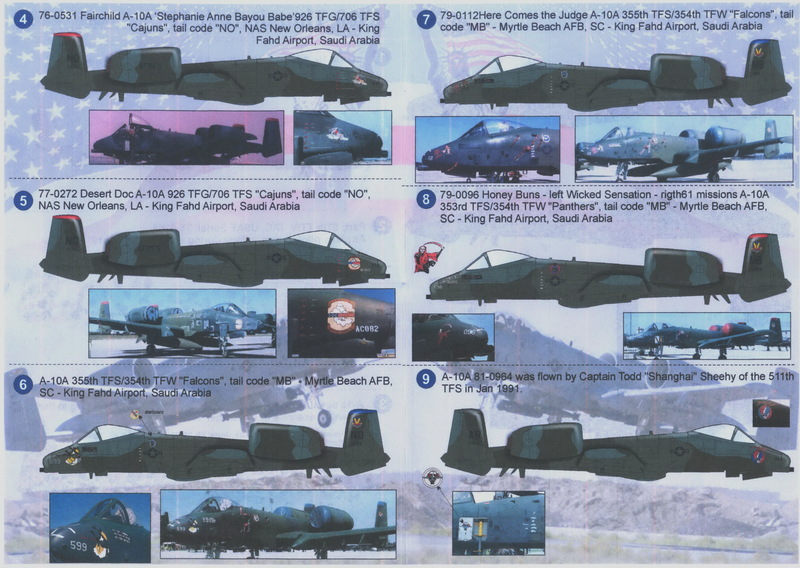 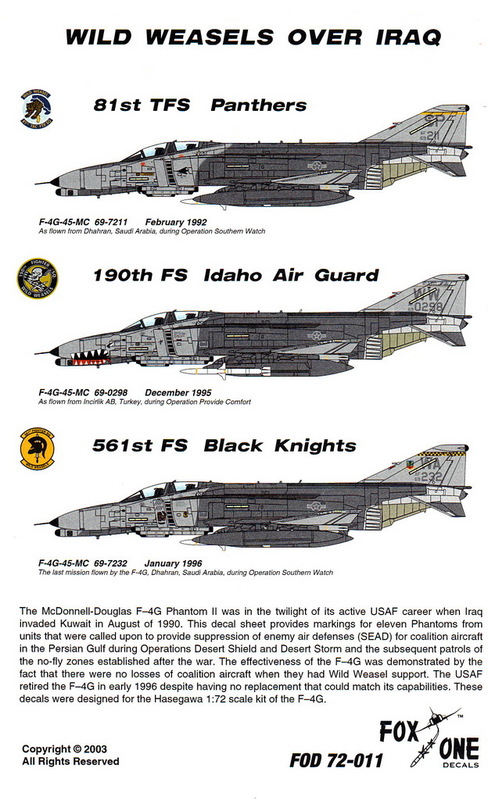 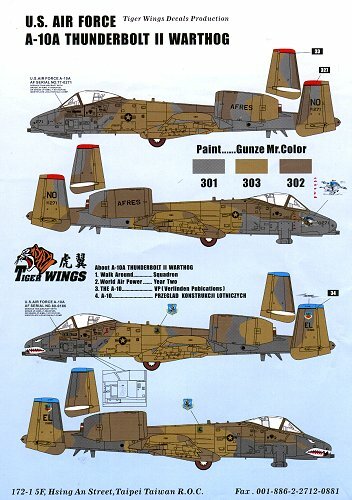 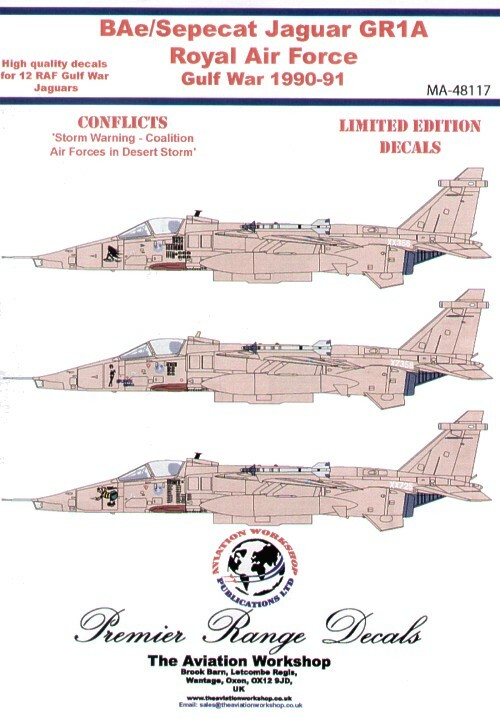 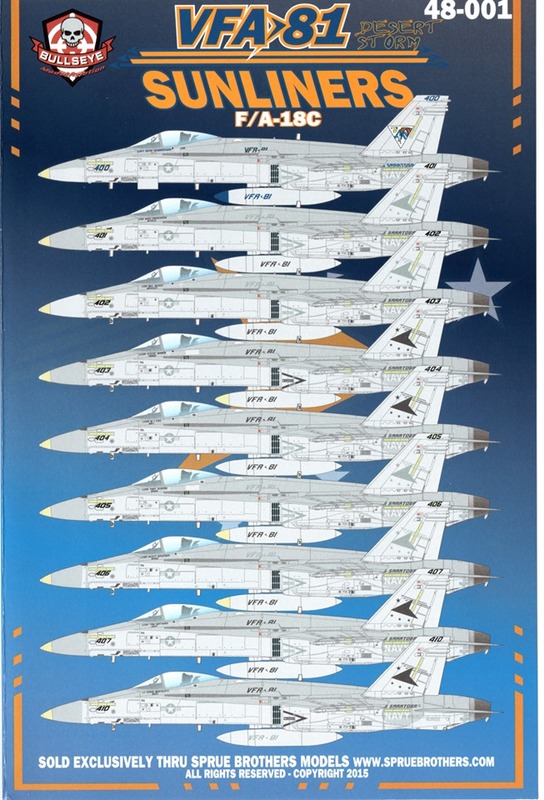 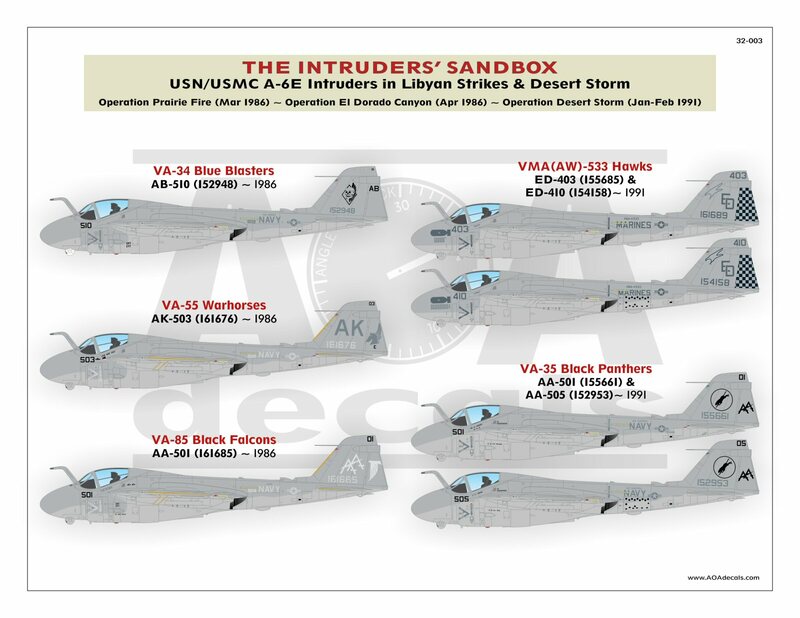 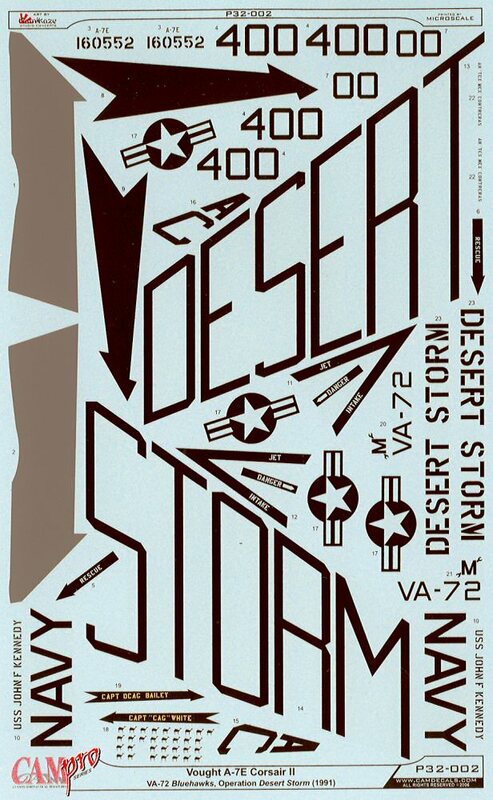 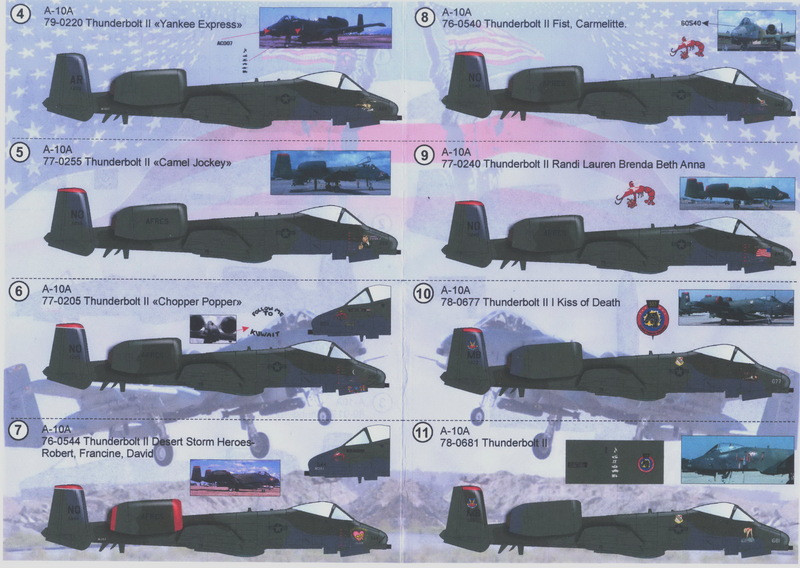 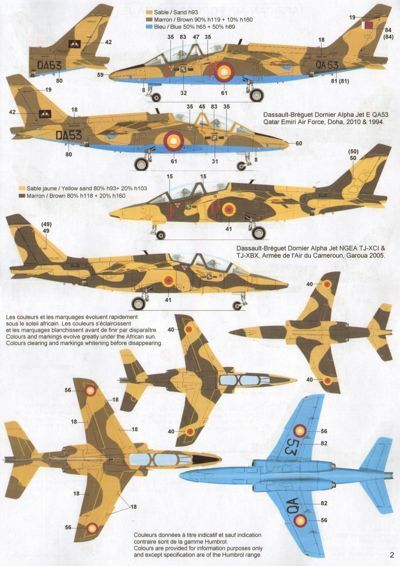 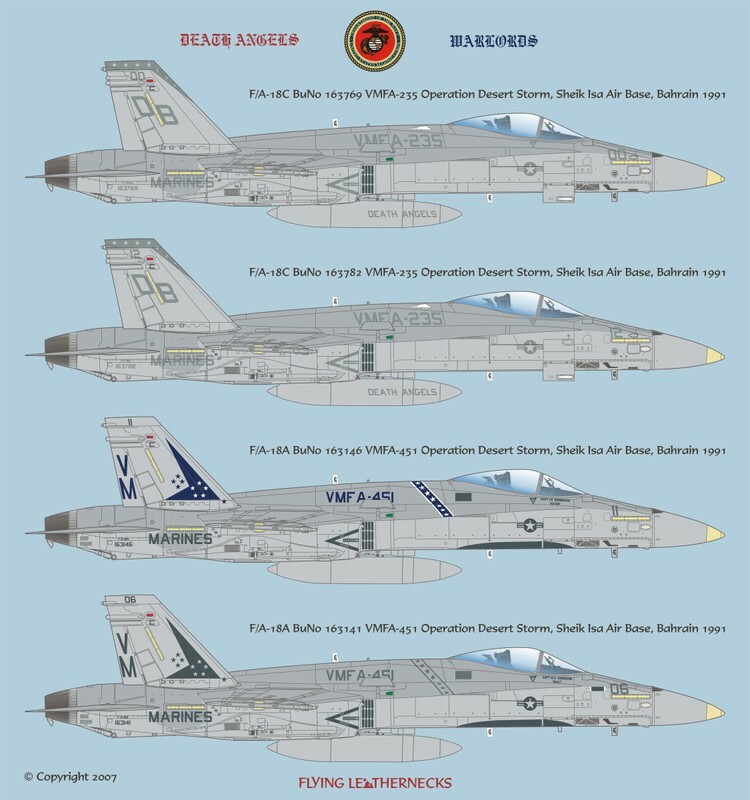 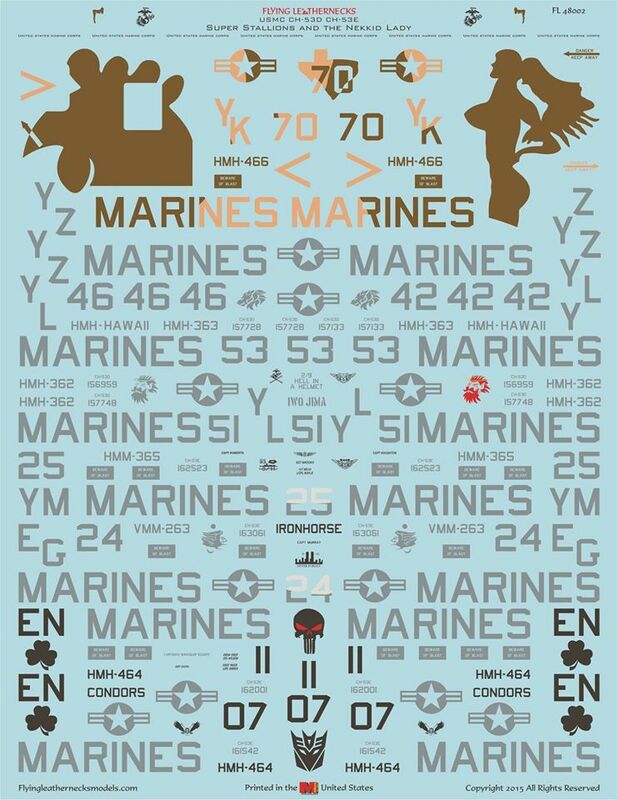 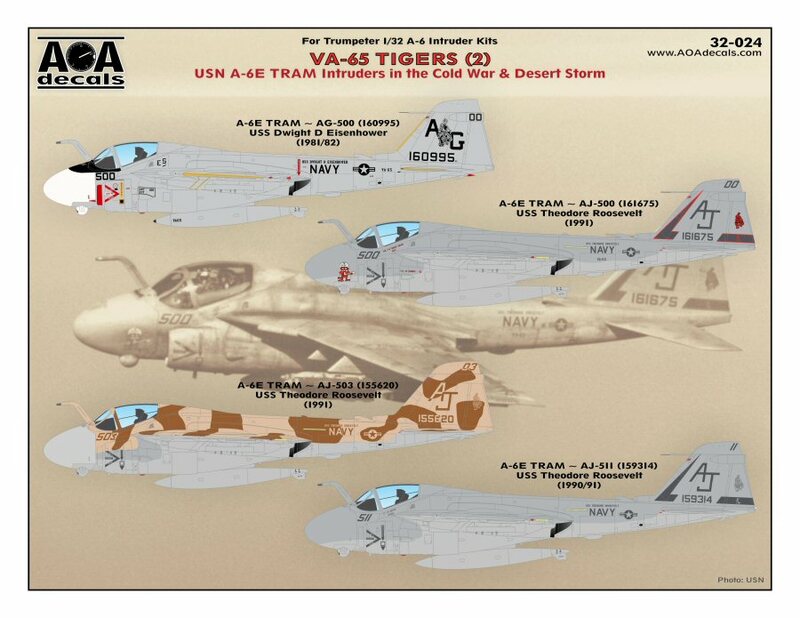 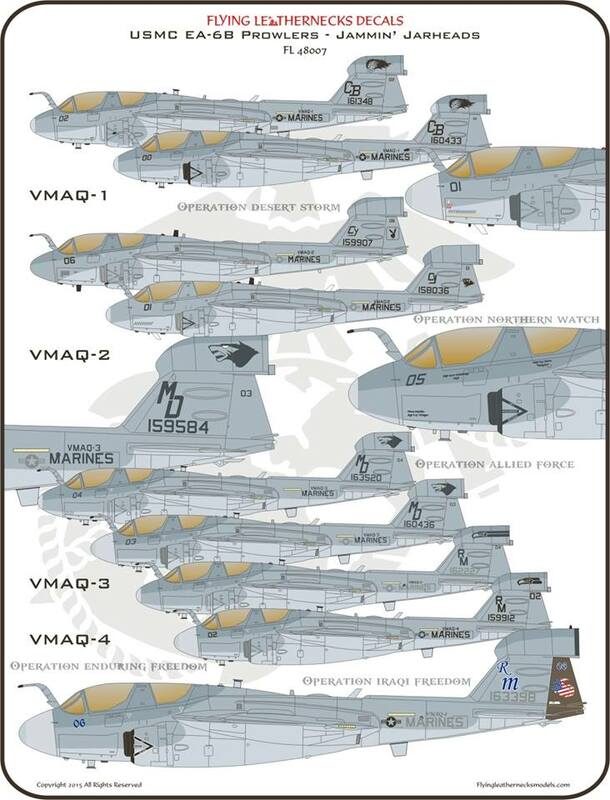 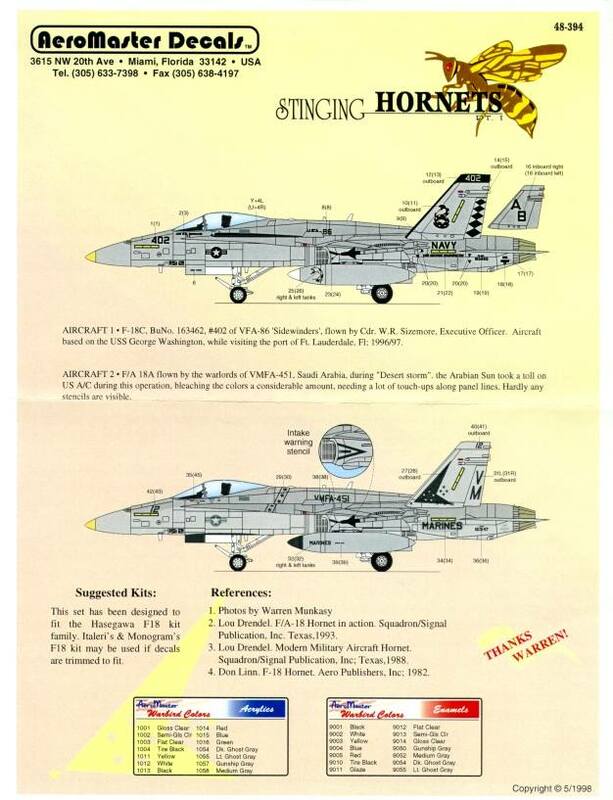 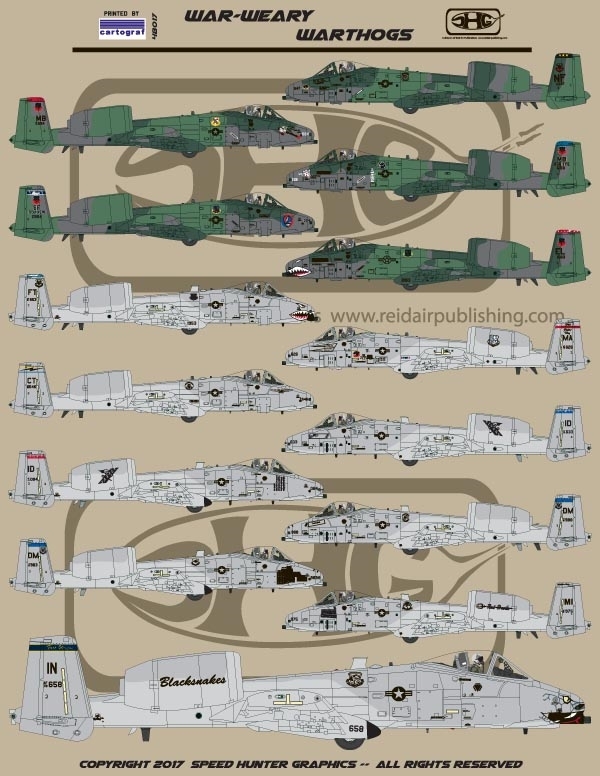 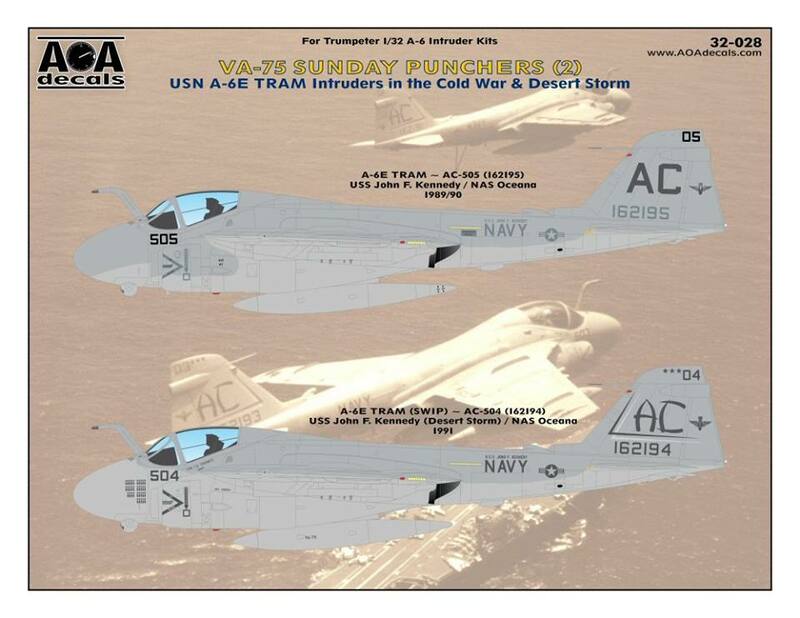 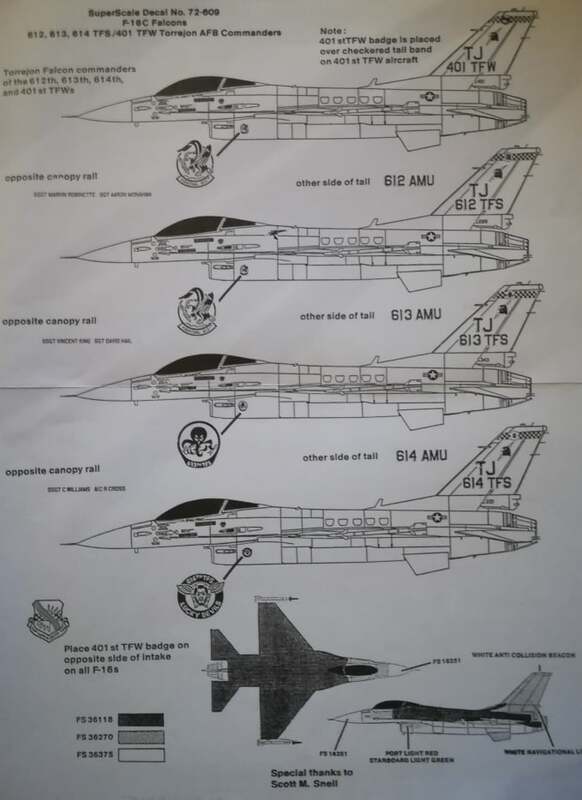 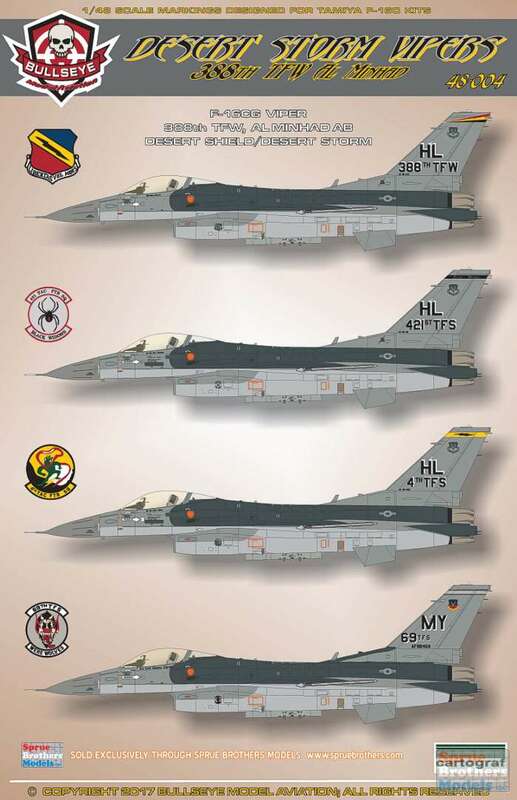 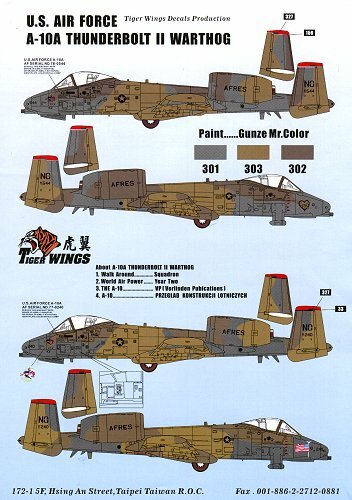 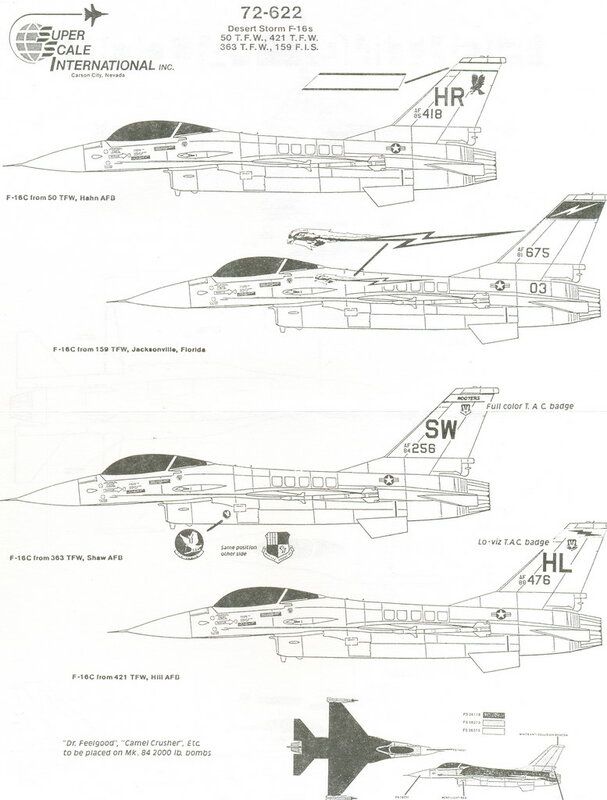 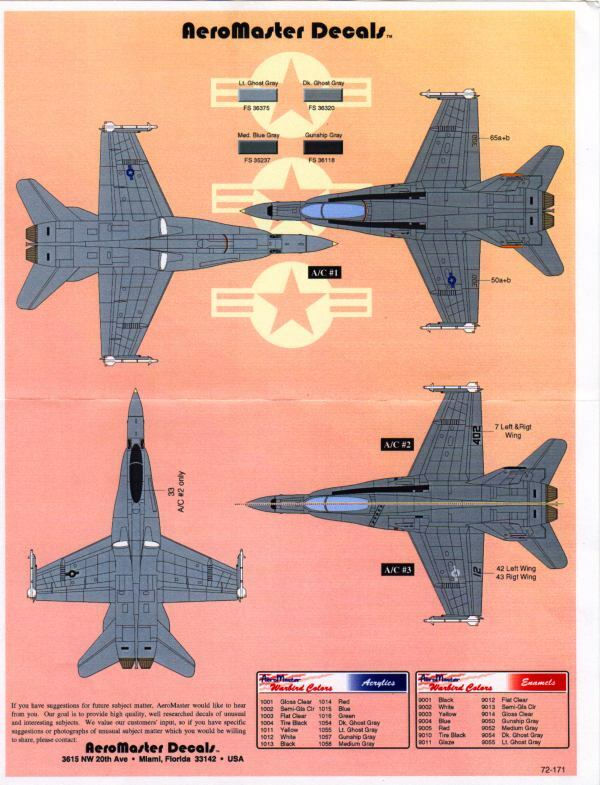 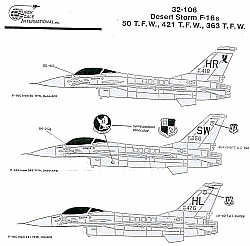 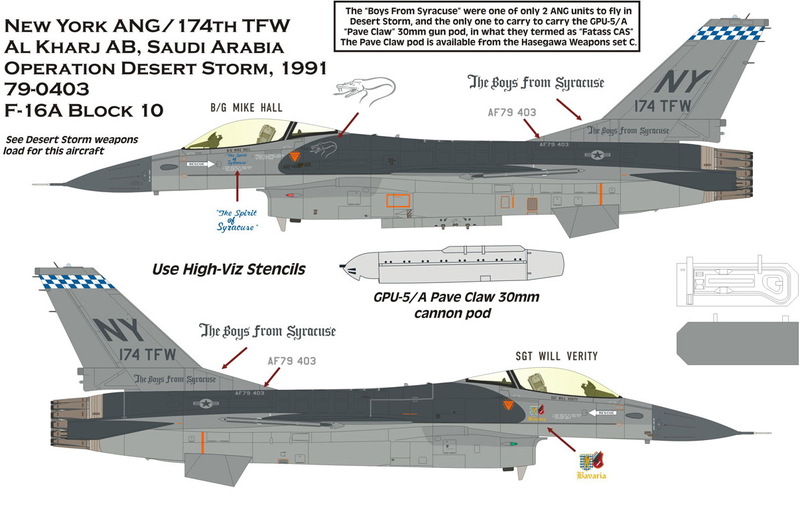 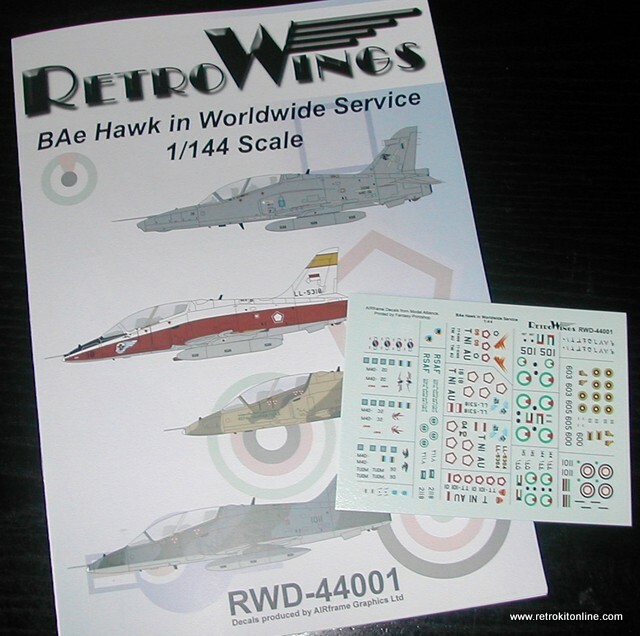 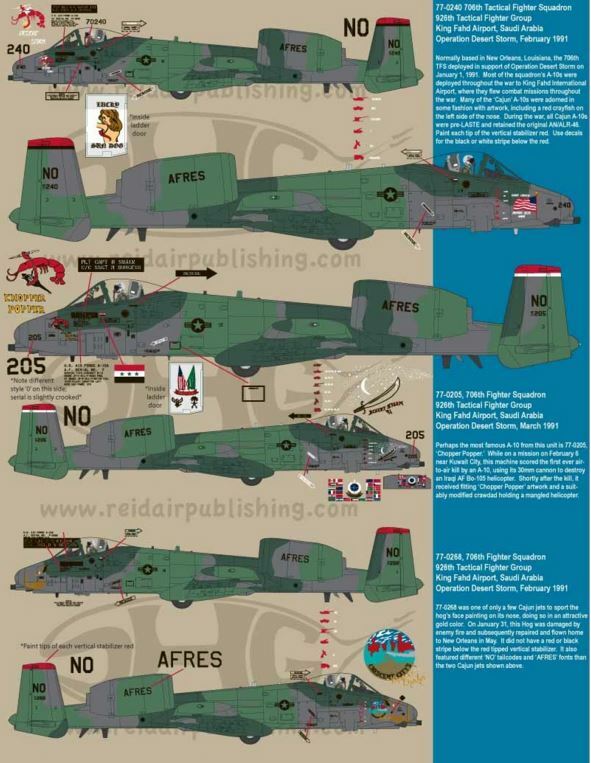 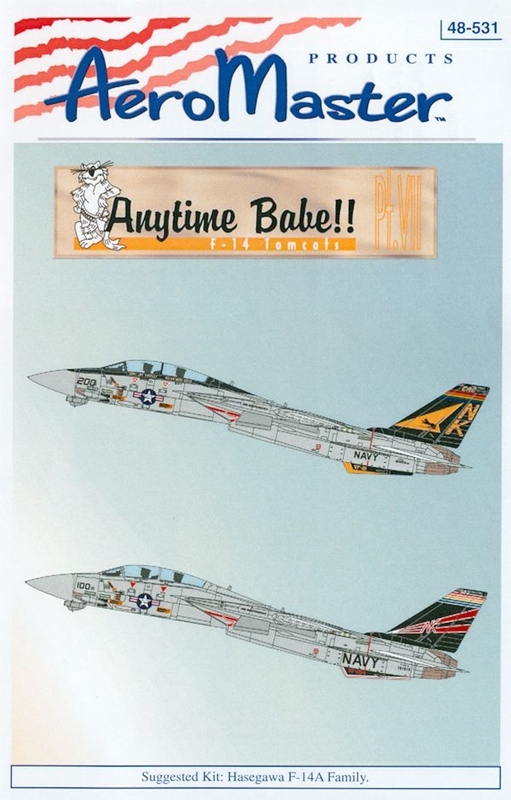 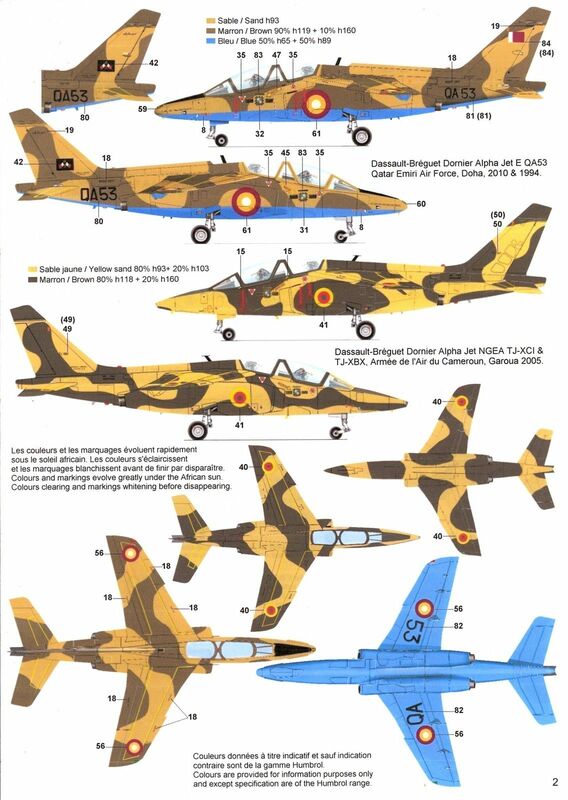 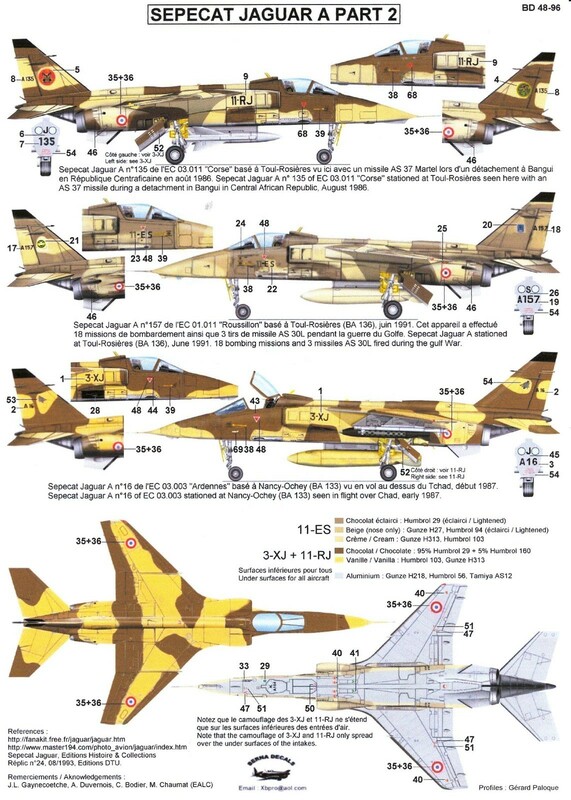 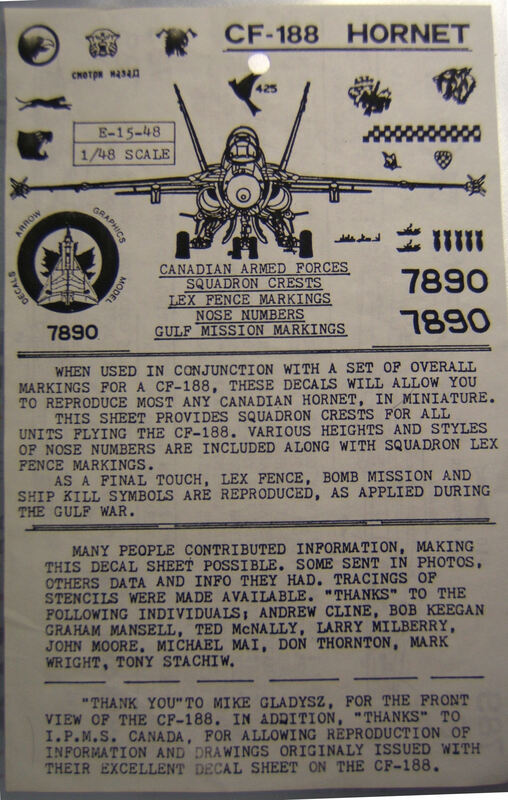 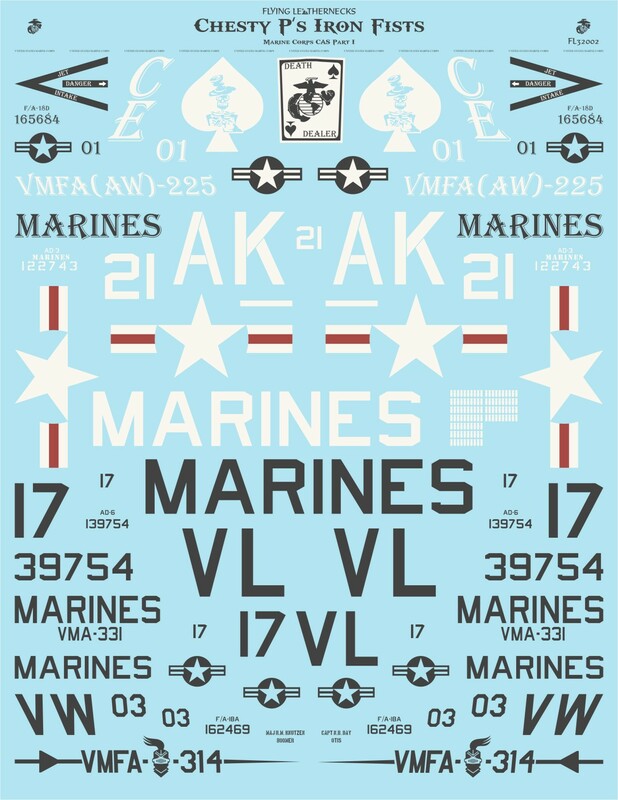 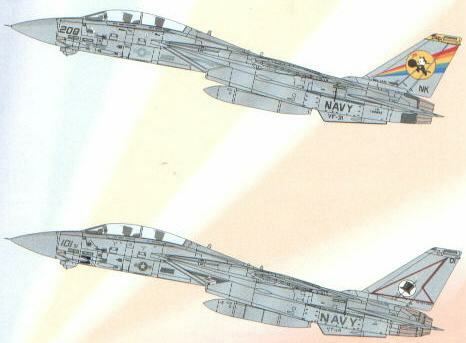 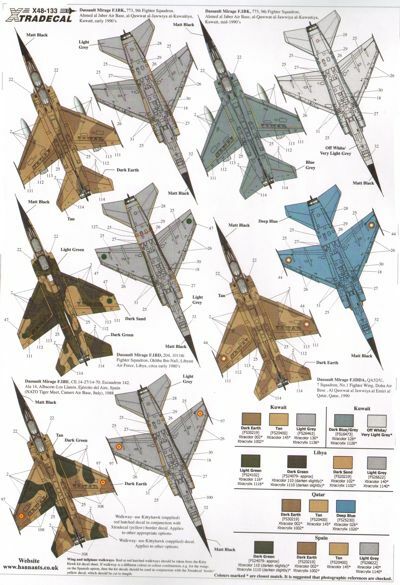 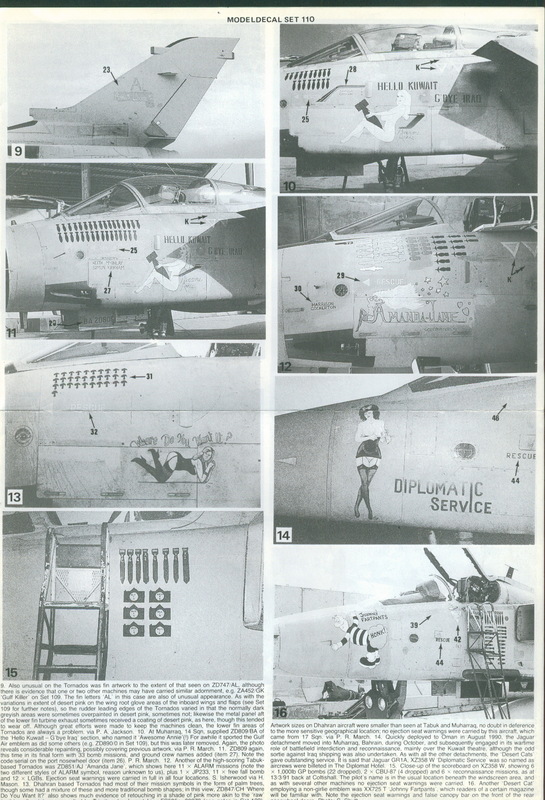 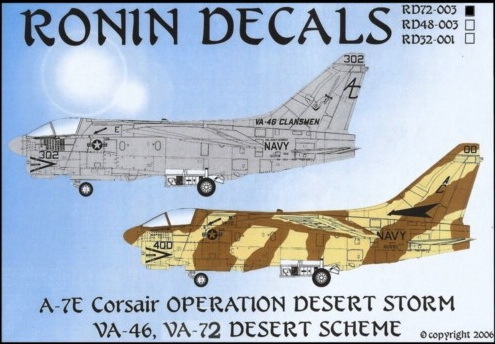 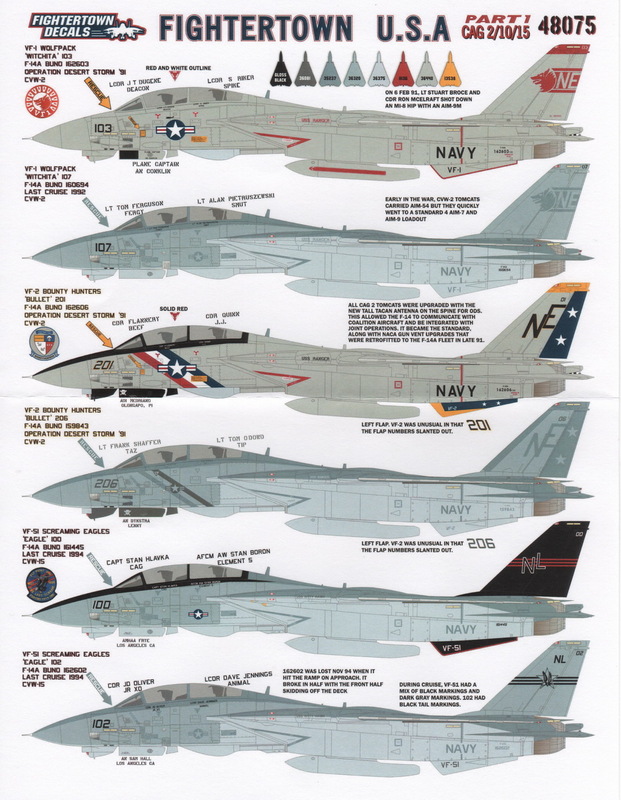 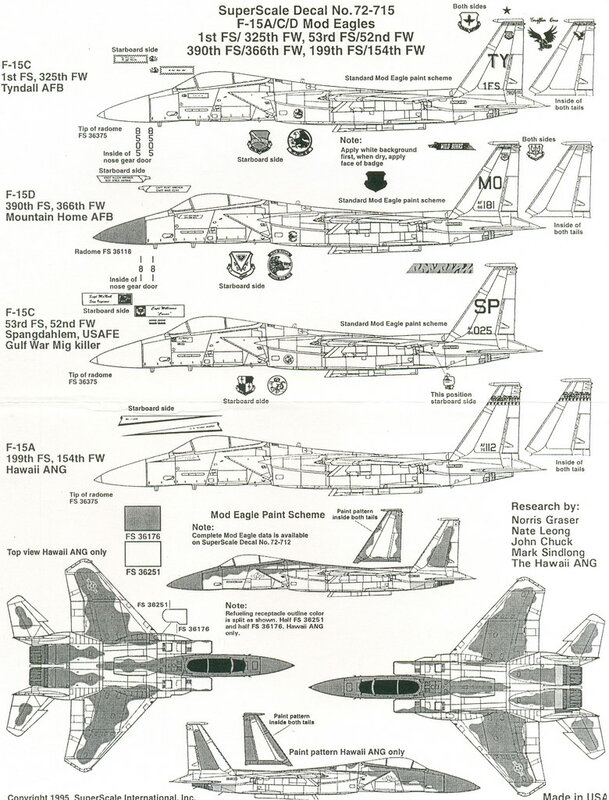 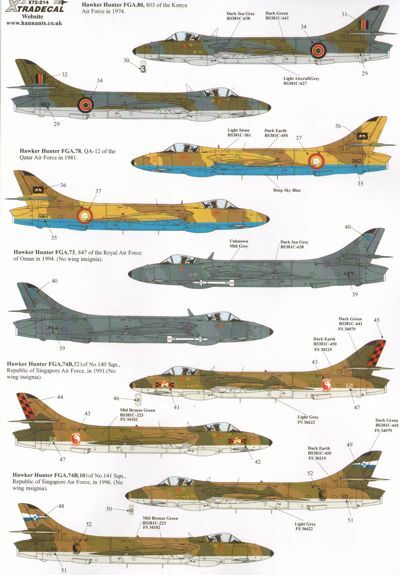 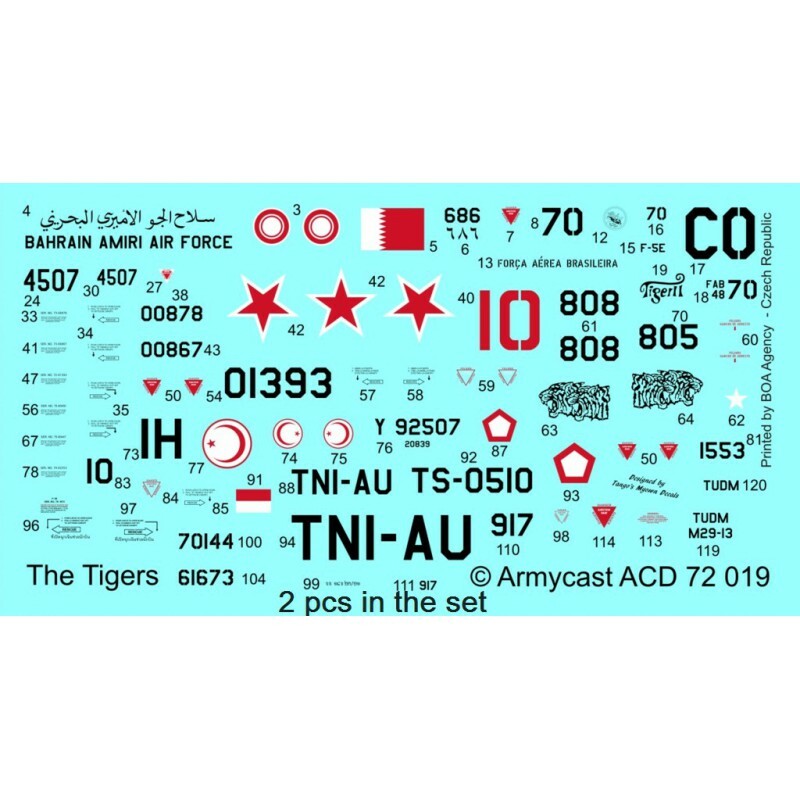 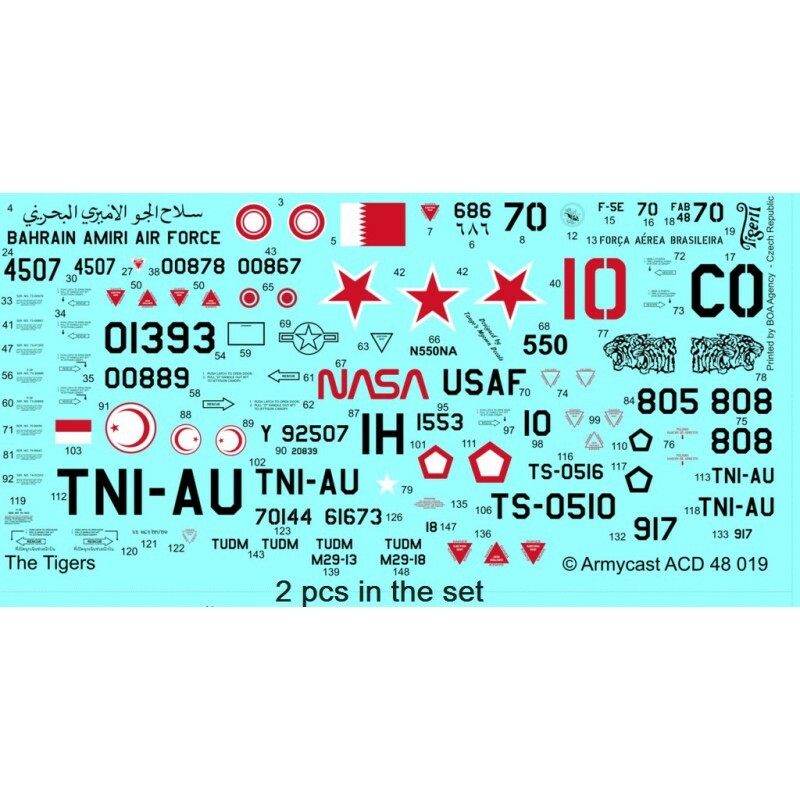 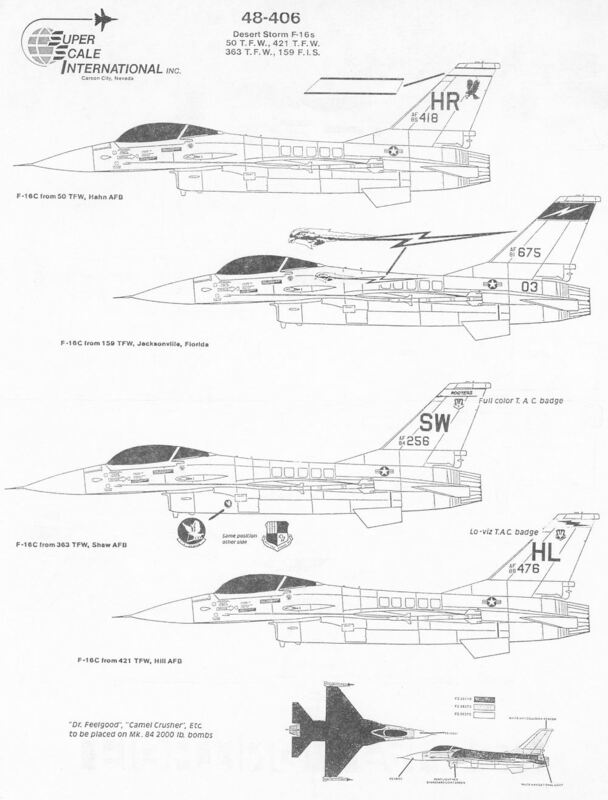 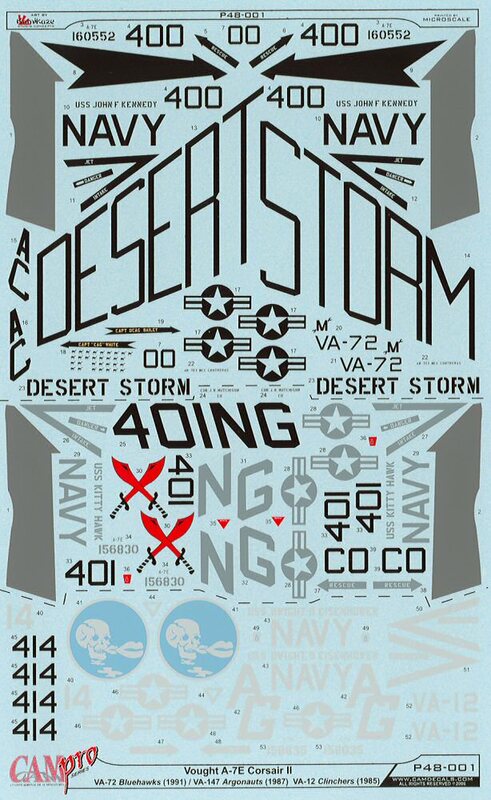 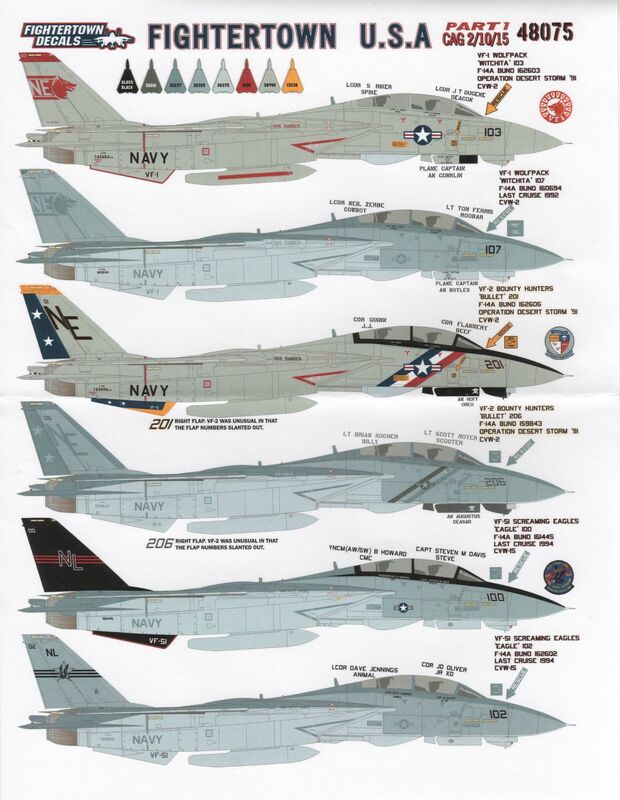 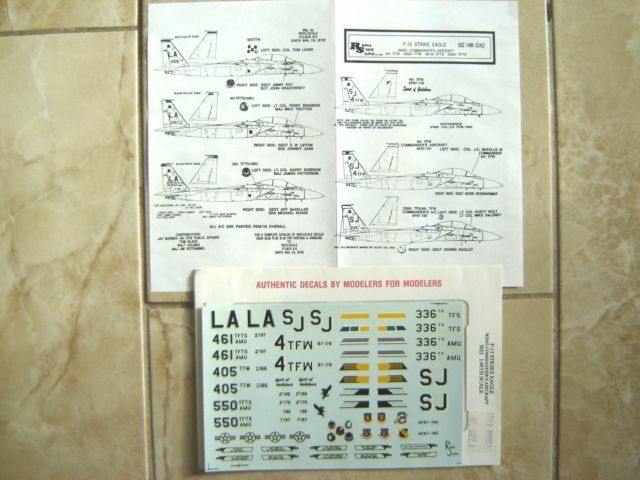 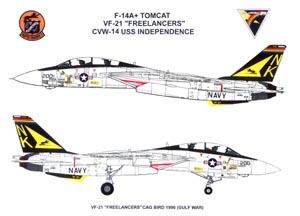 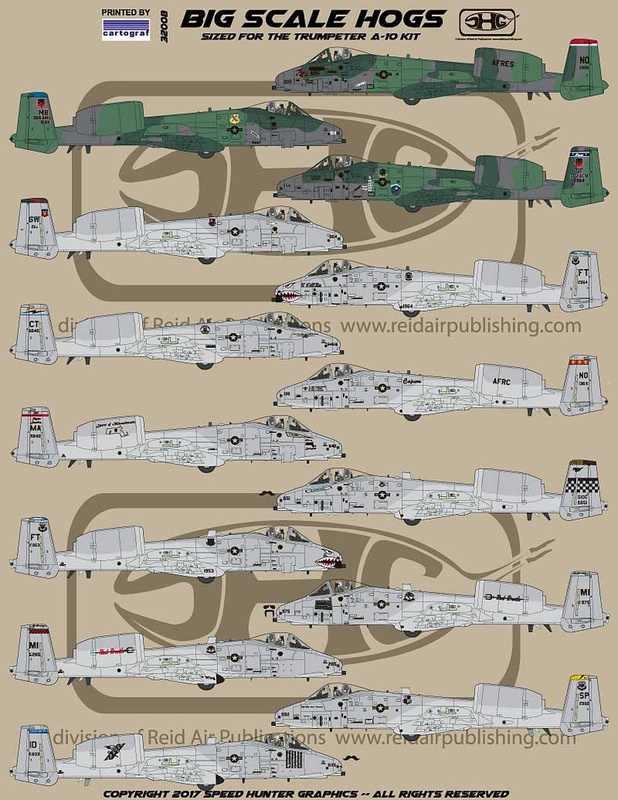 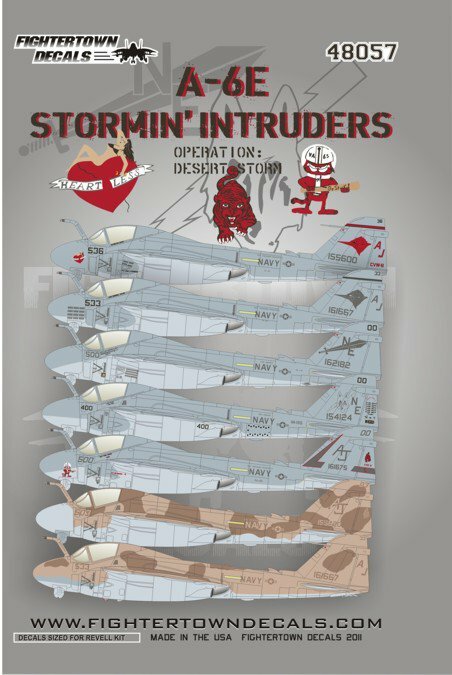 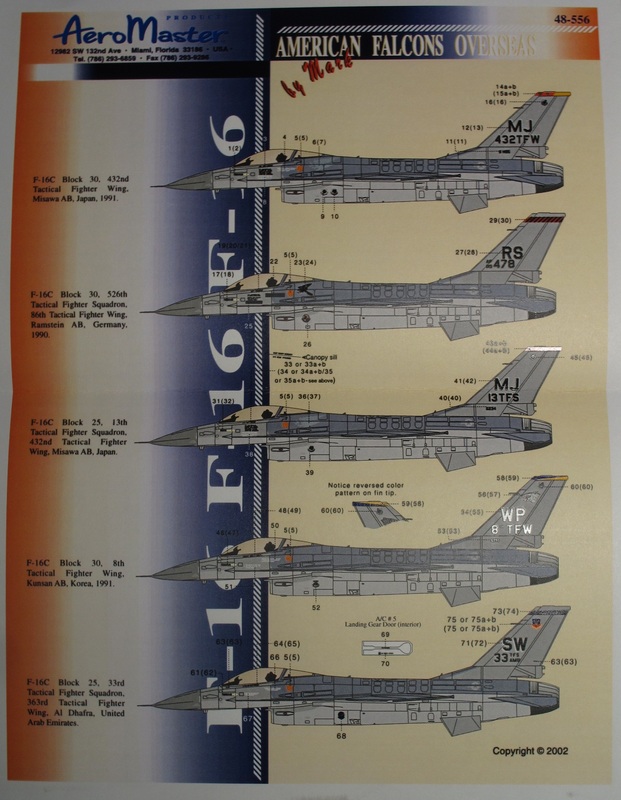 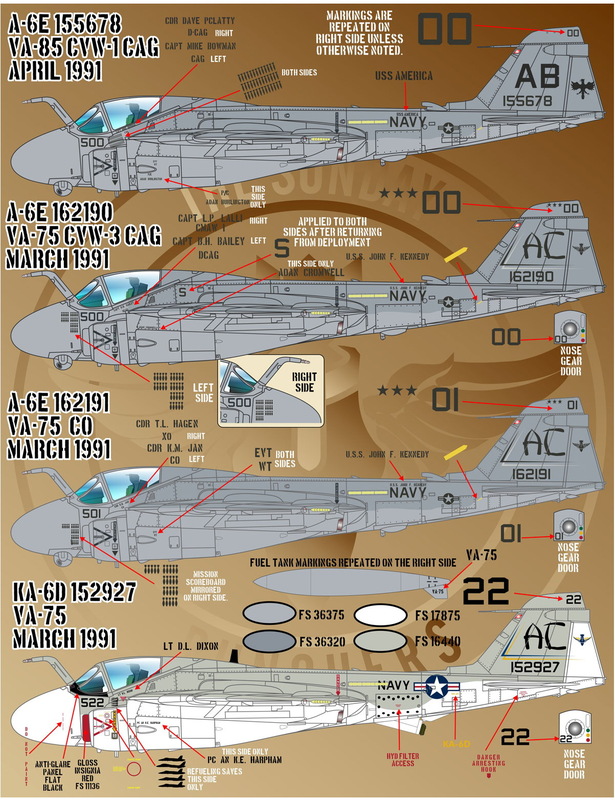 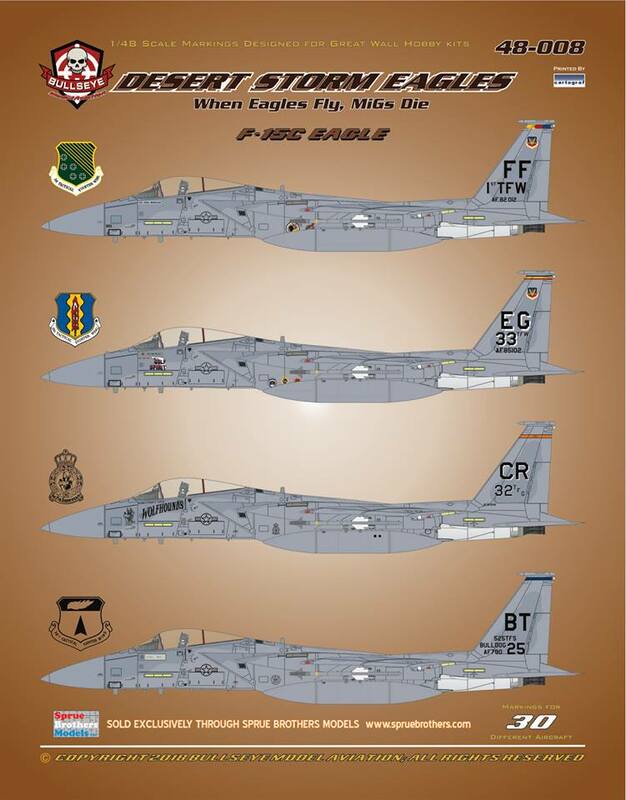 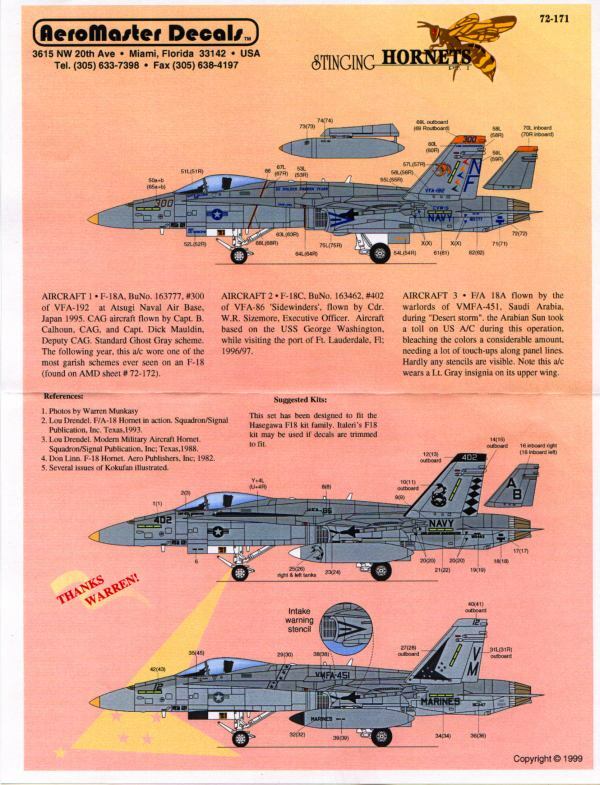 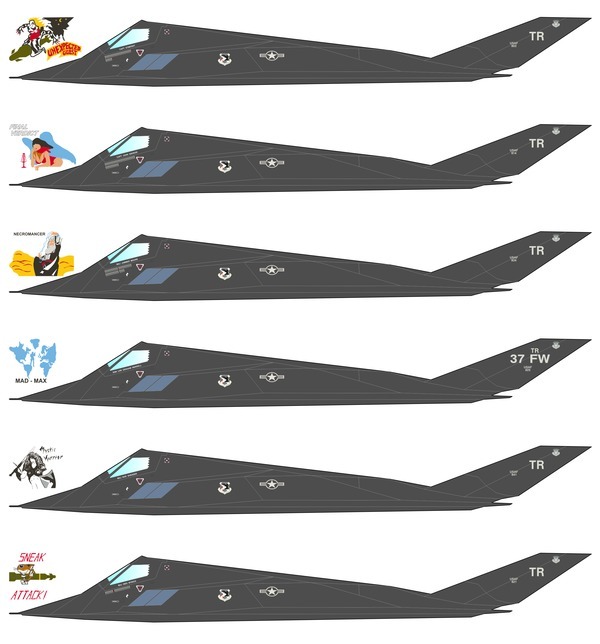 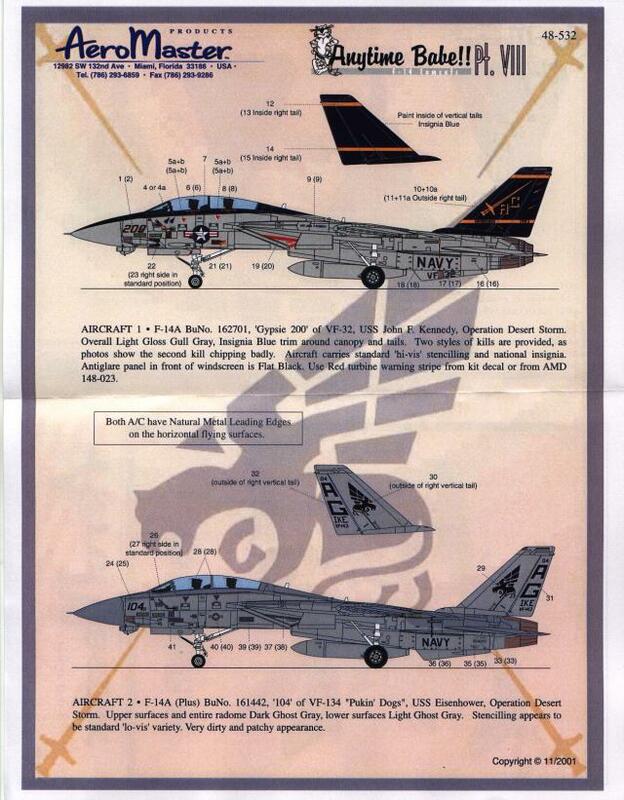 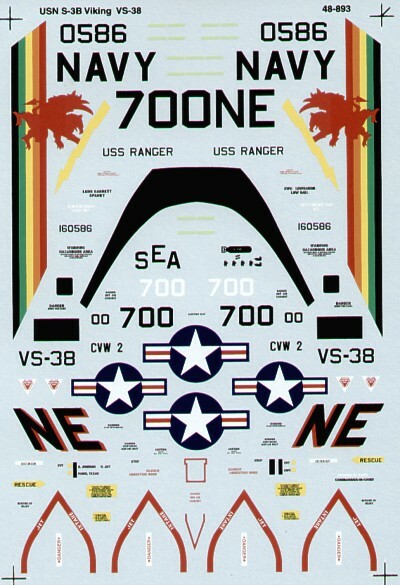 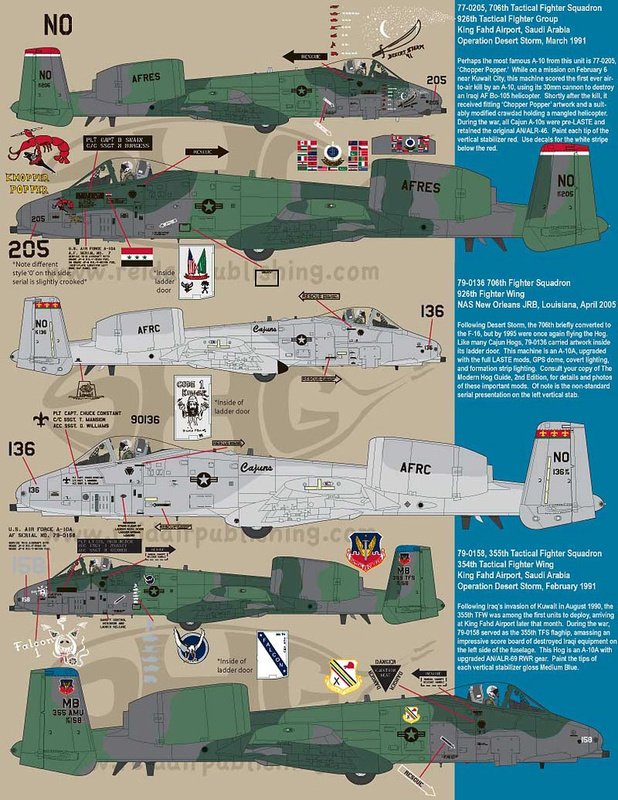 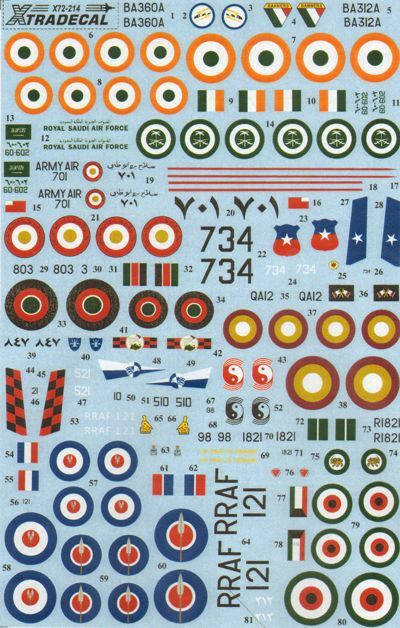 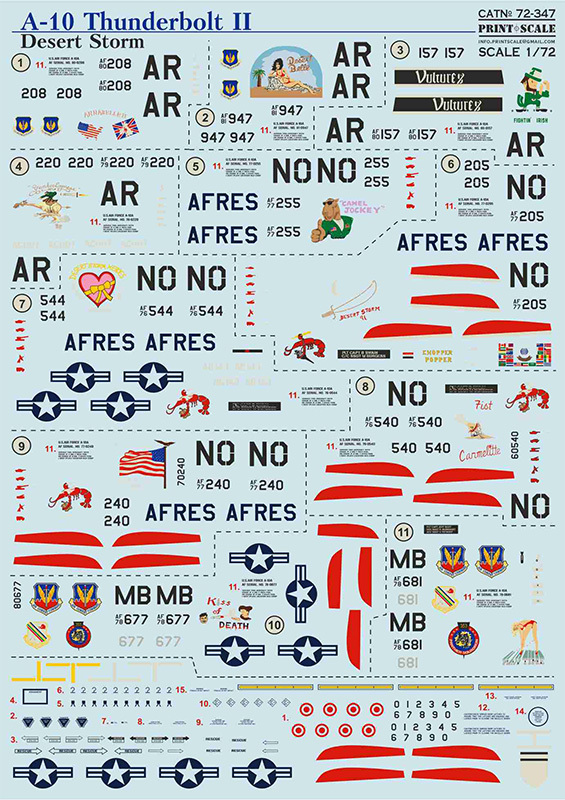 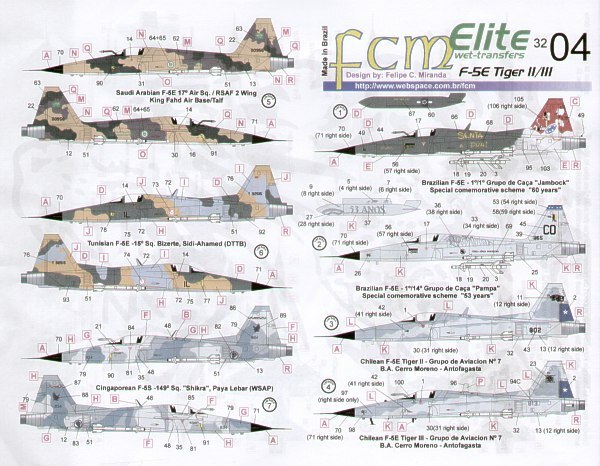 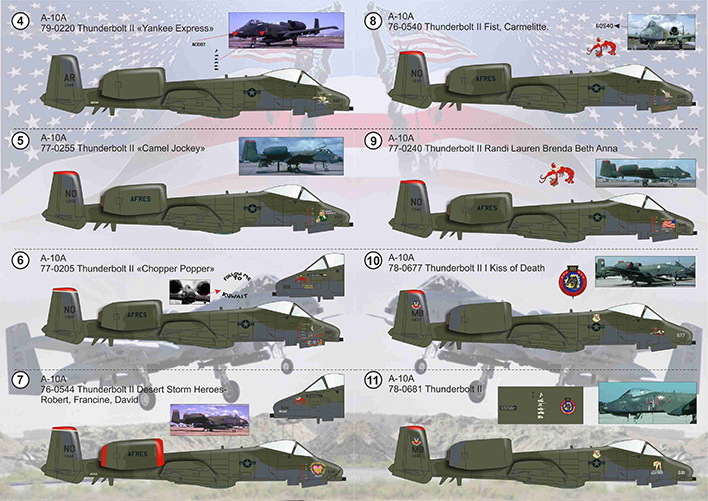 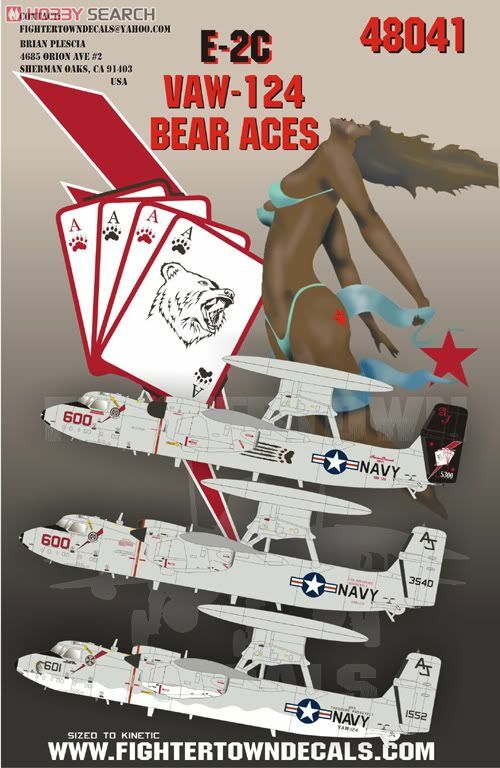 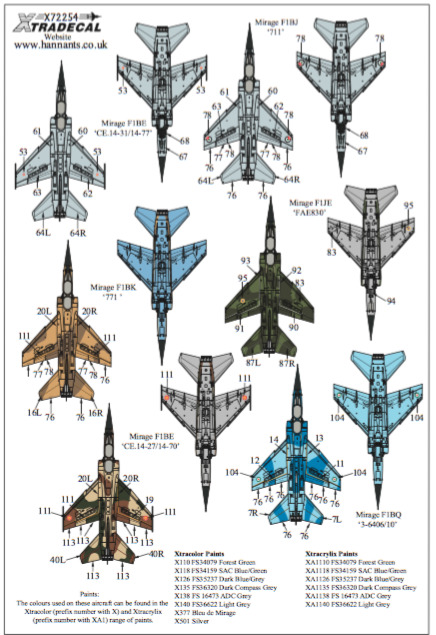 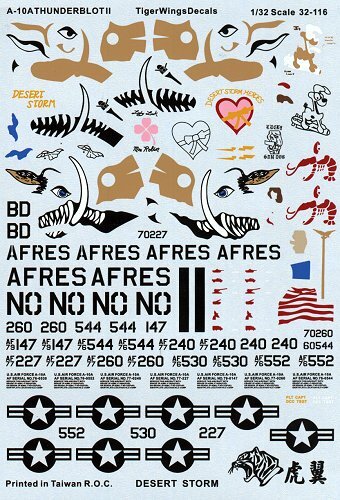 Tiger Wing Decals - 48-116 77-0227/NO "Ya ya ya Grace we licked ´em", 76-0544/NO "Desert Storm Heroes - Robert, Francine, David", 77-0240/NO "Randi Lauren Brenda Beth Anna", 77-0260/NO "Lady Luck Mrs. Robbins Four Leaf Clover"
* Note: Marking is black, but Repliscale have them grey, which is wrong. 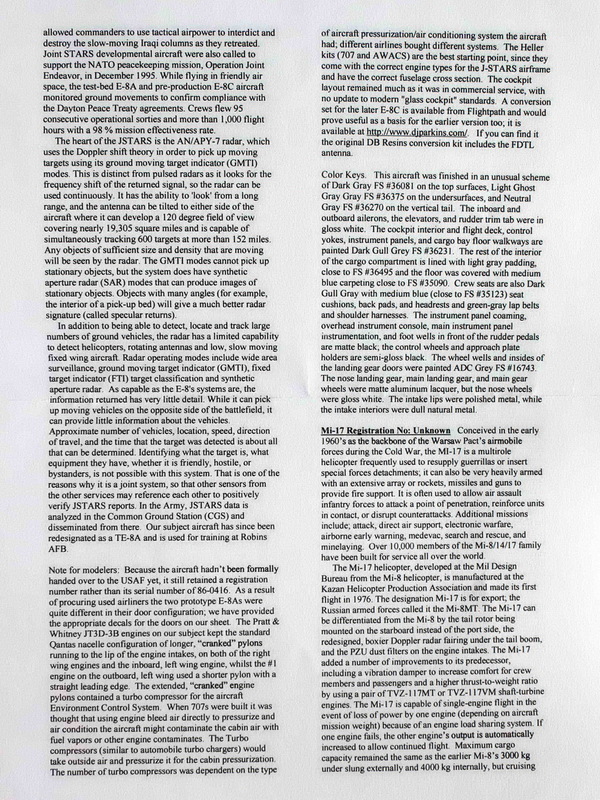 Helm of the knight is also wrong. 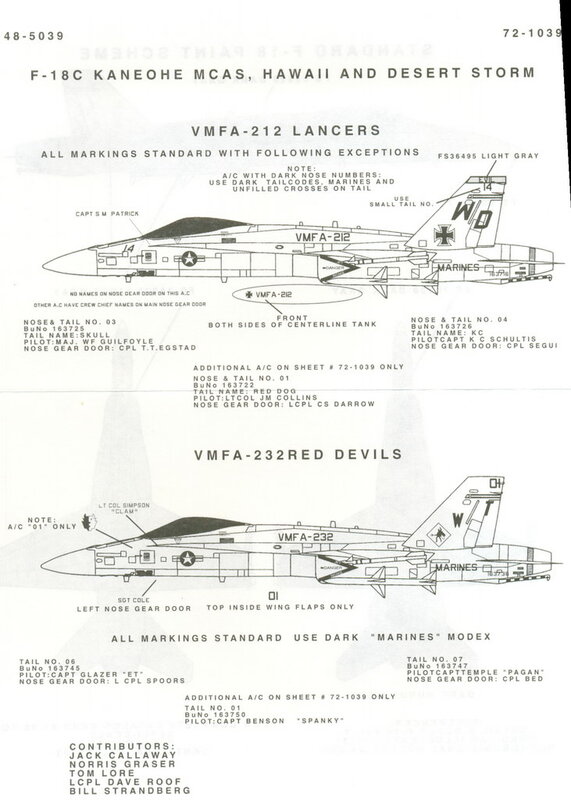 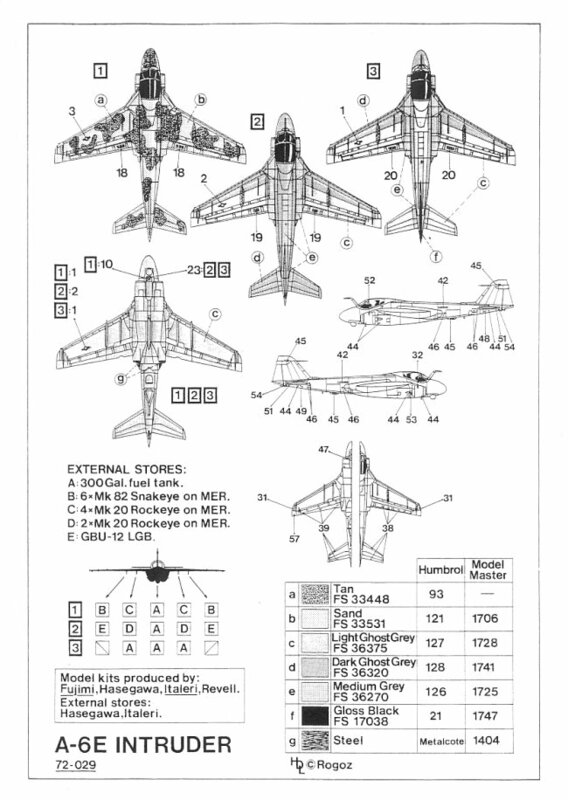 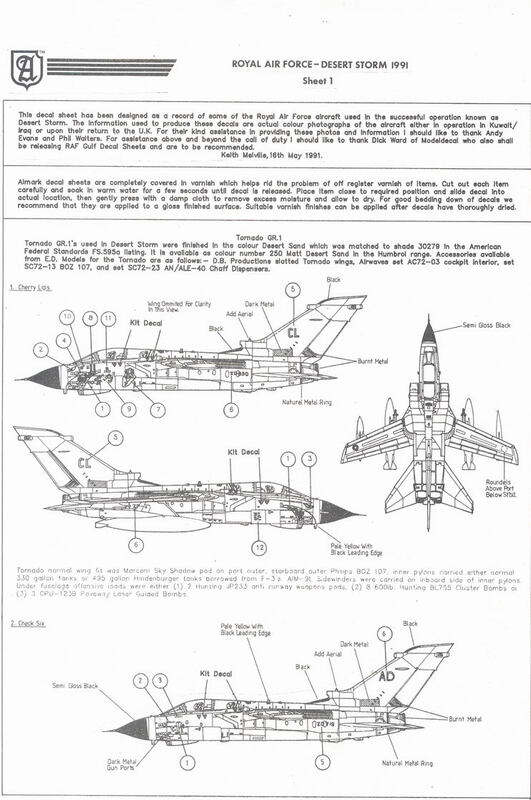 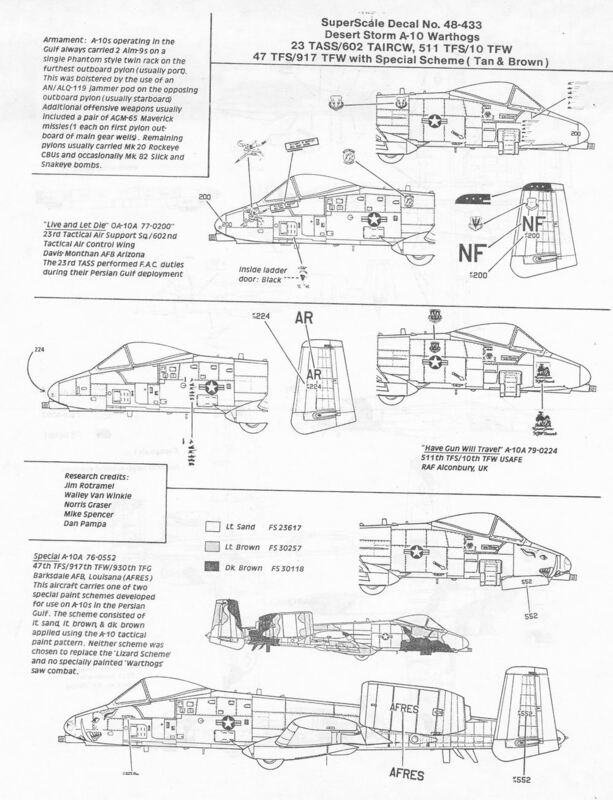 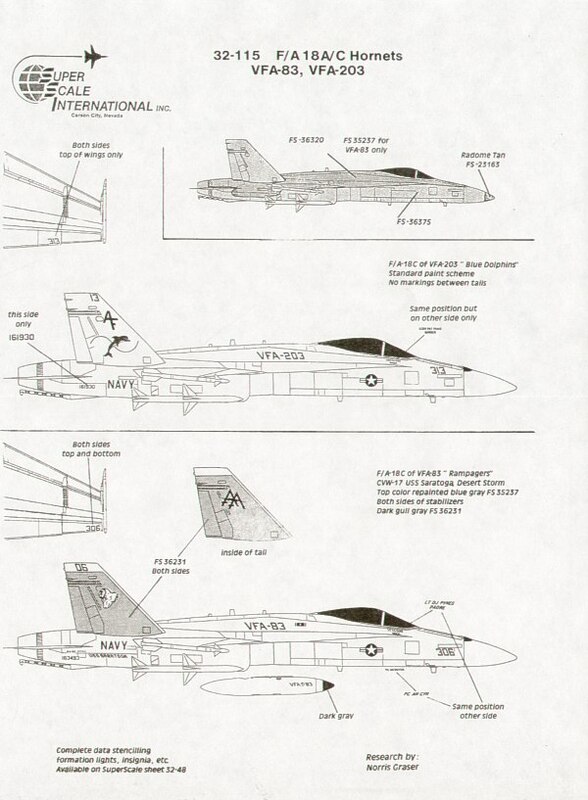 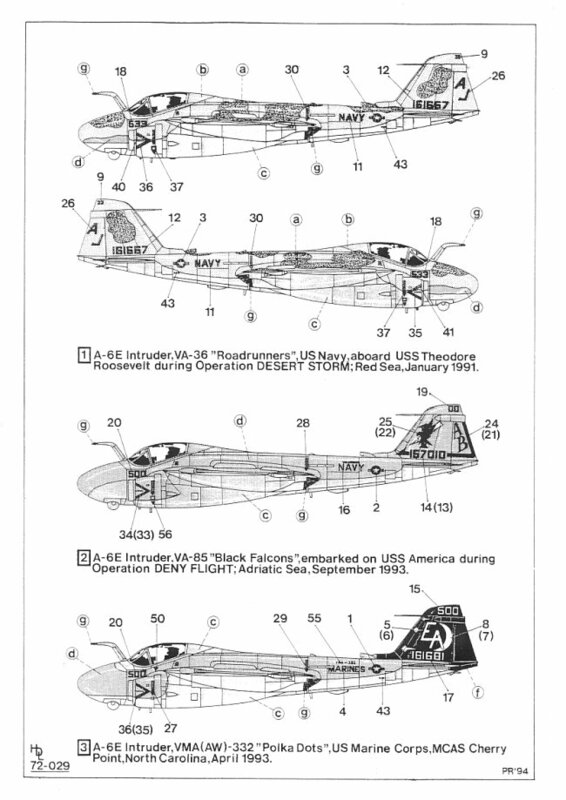 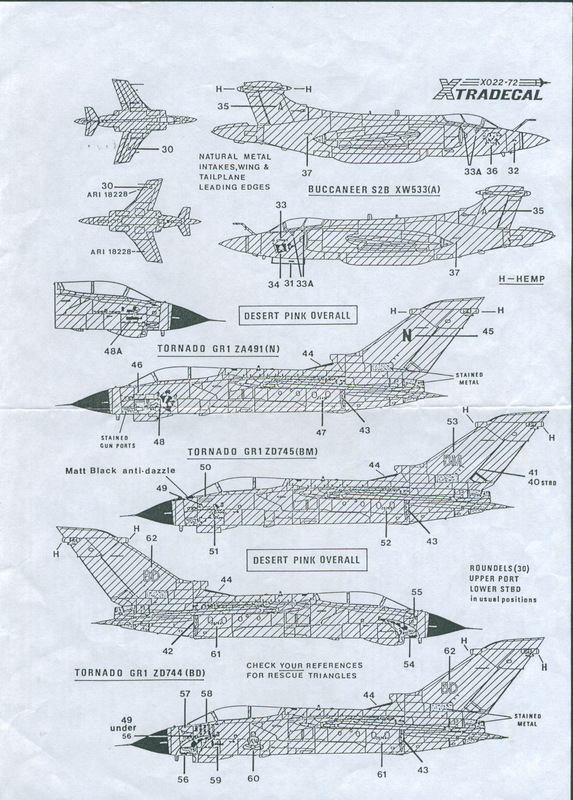 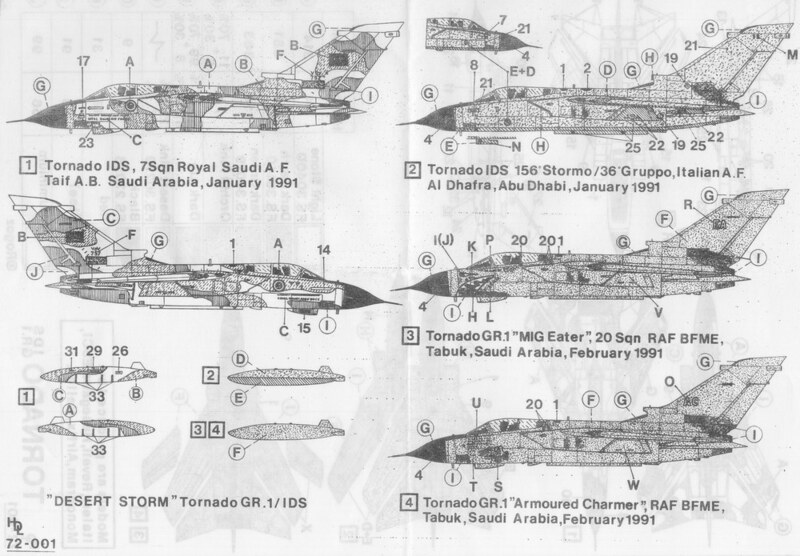 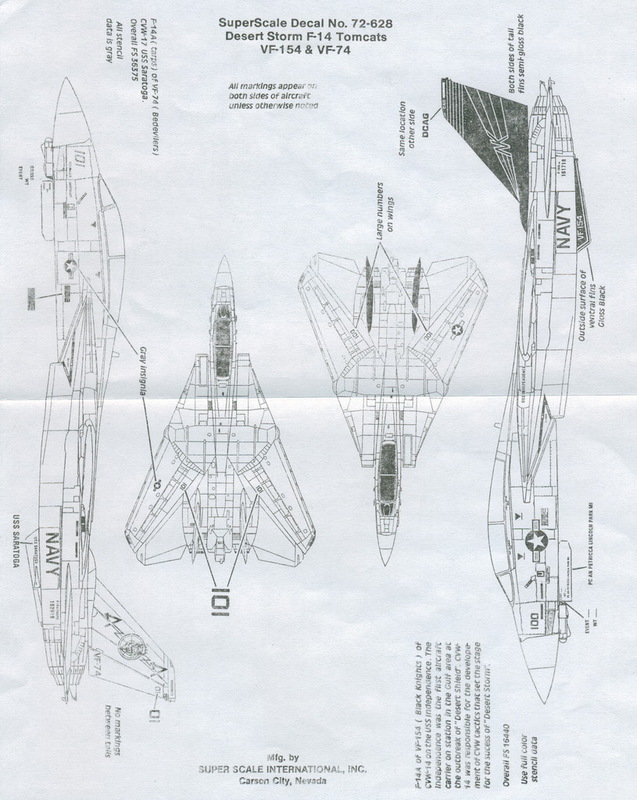 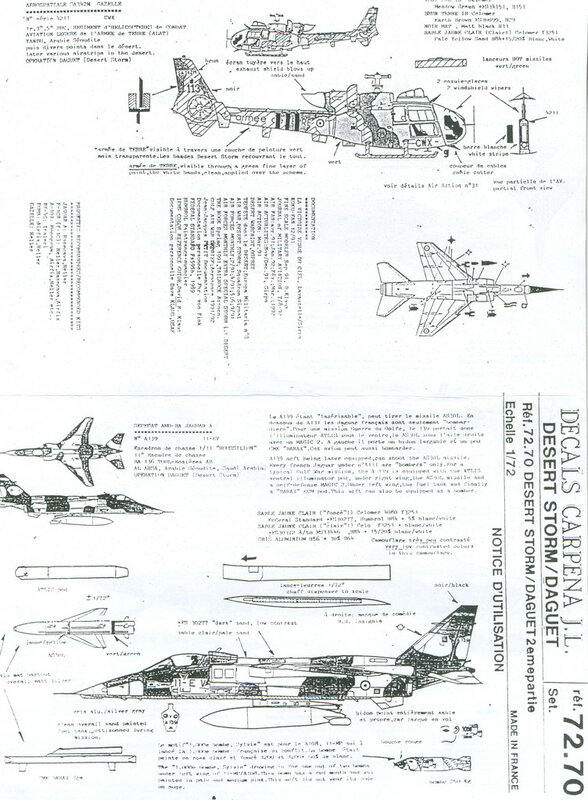 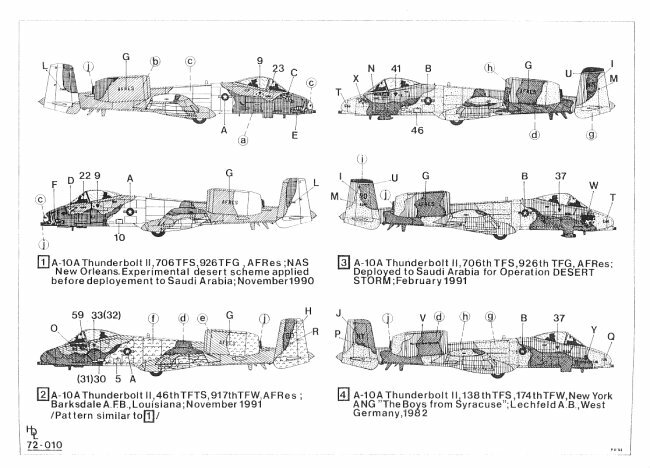 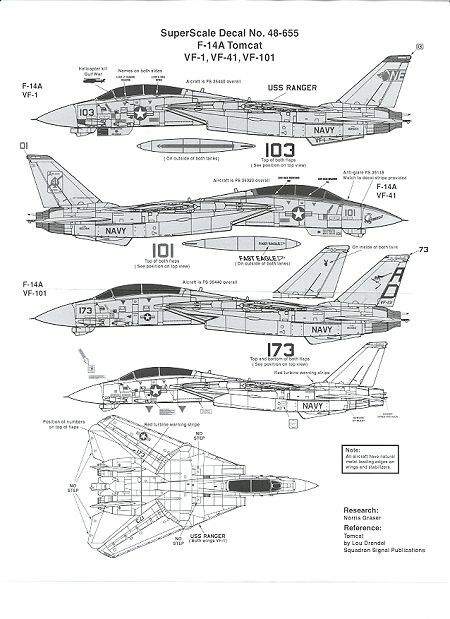 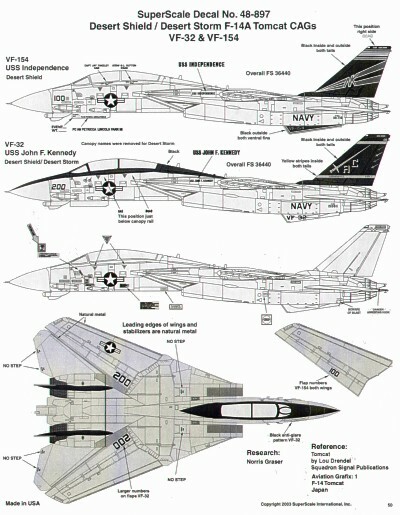 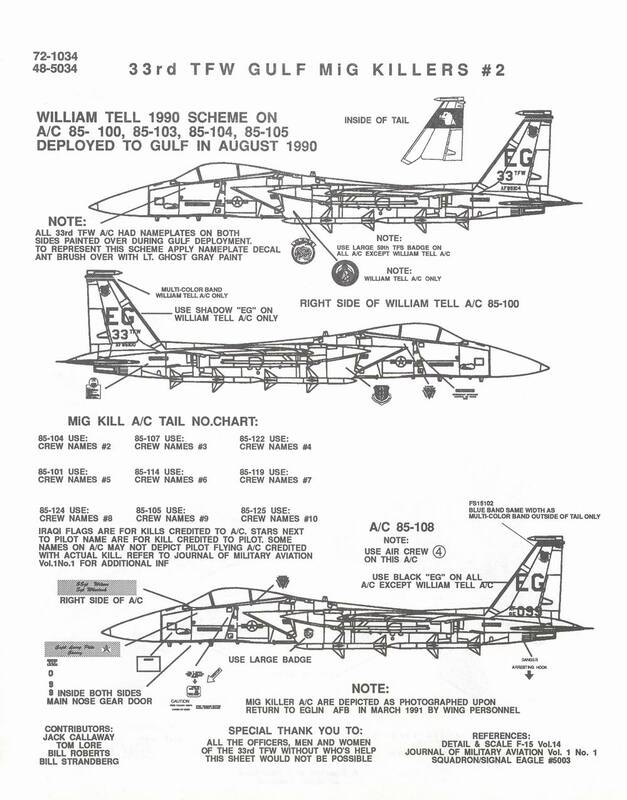 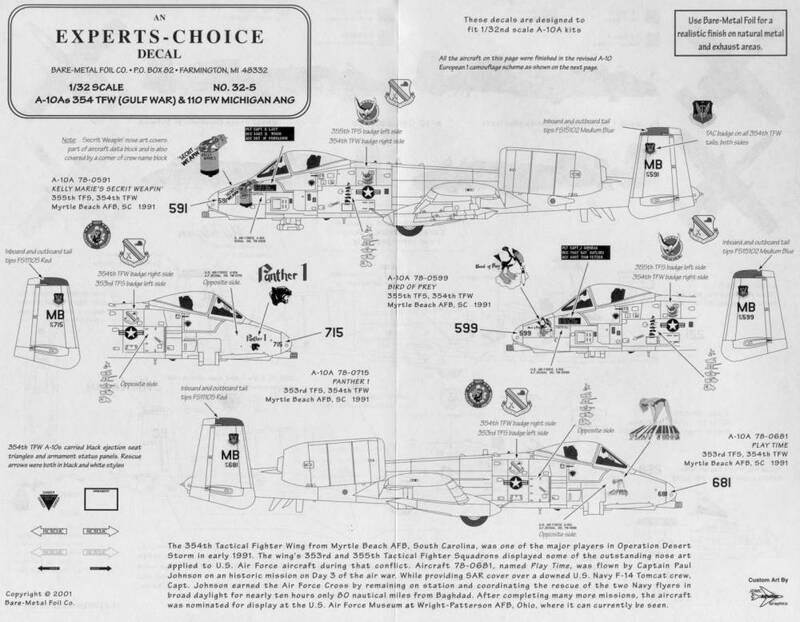 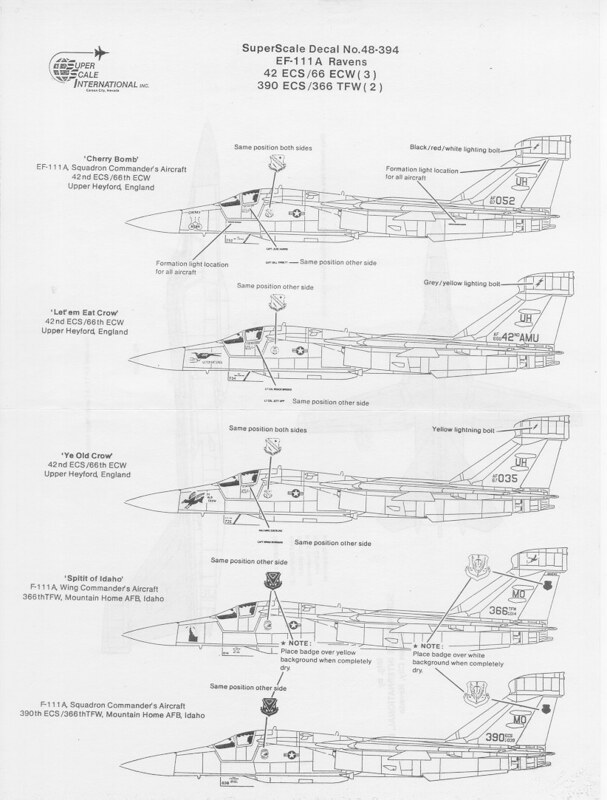 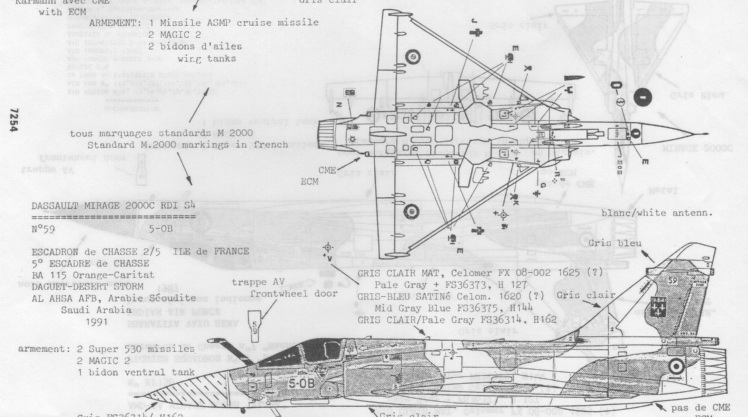 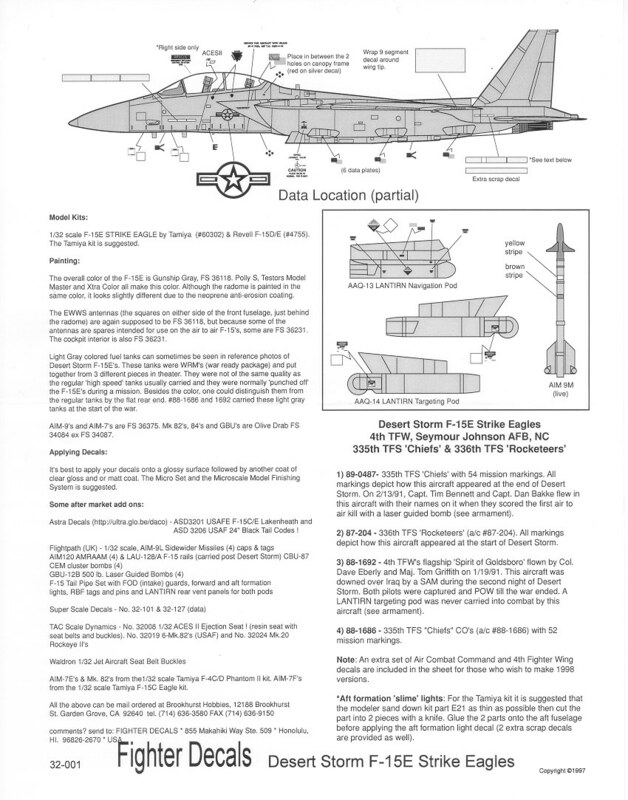 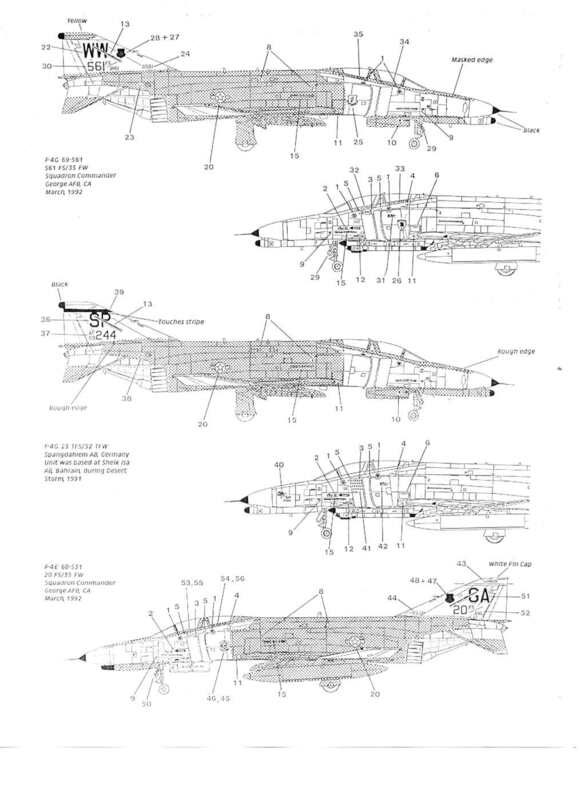 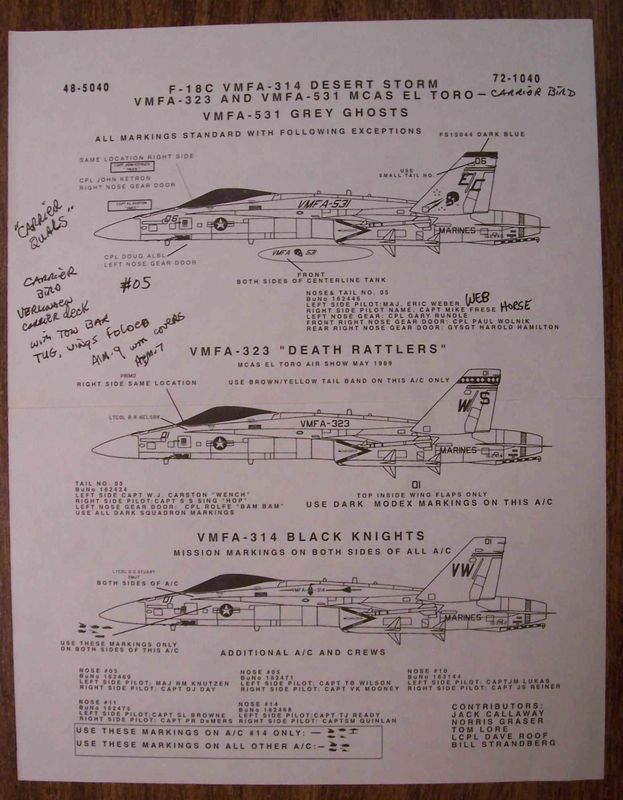 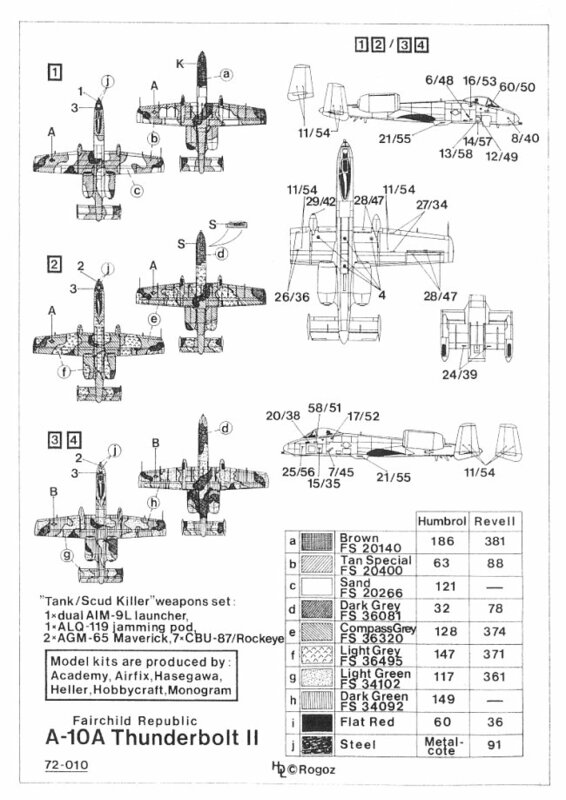 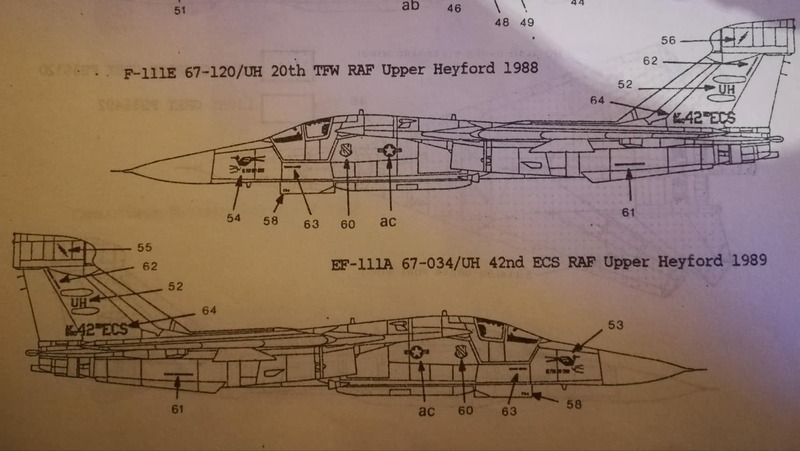 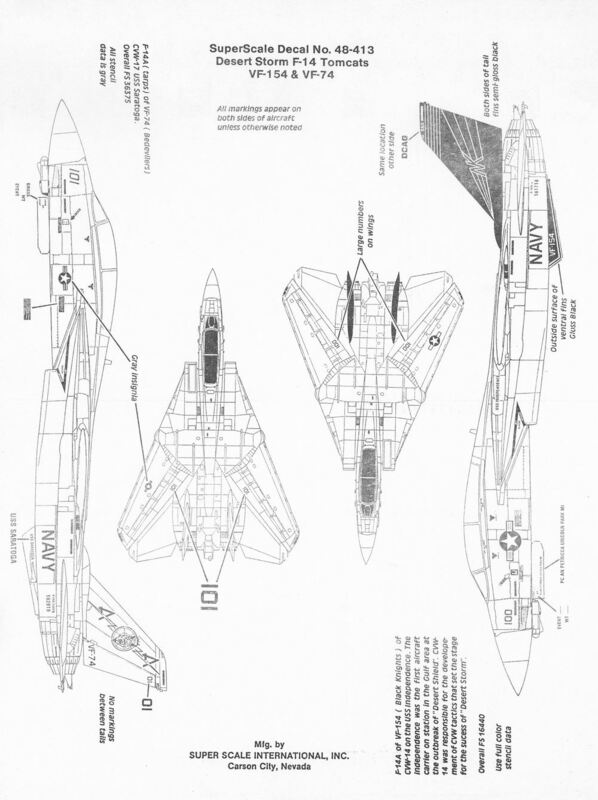 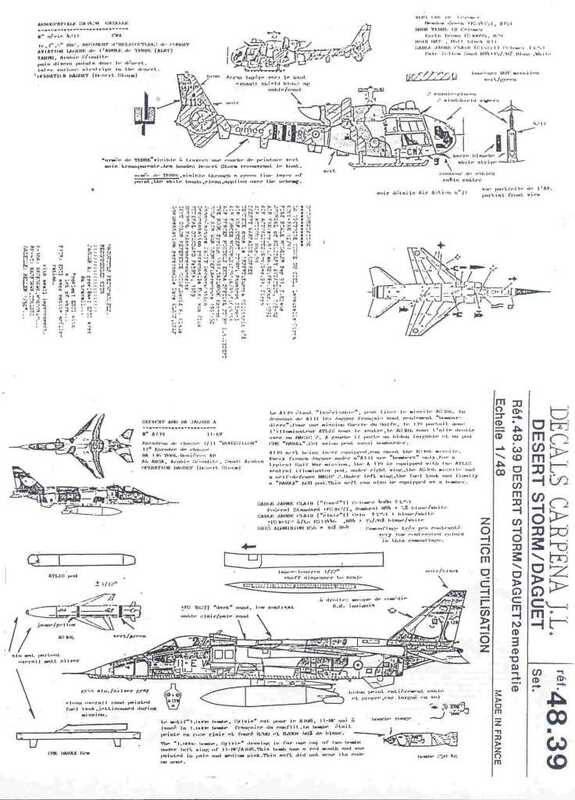 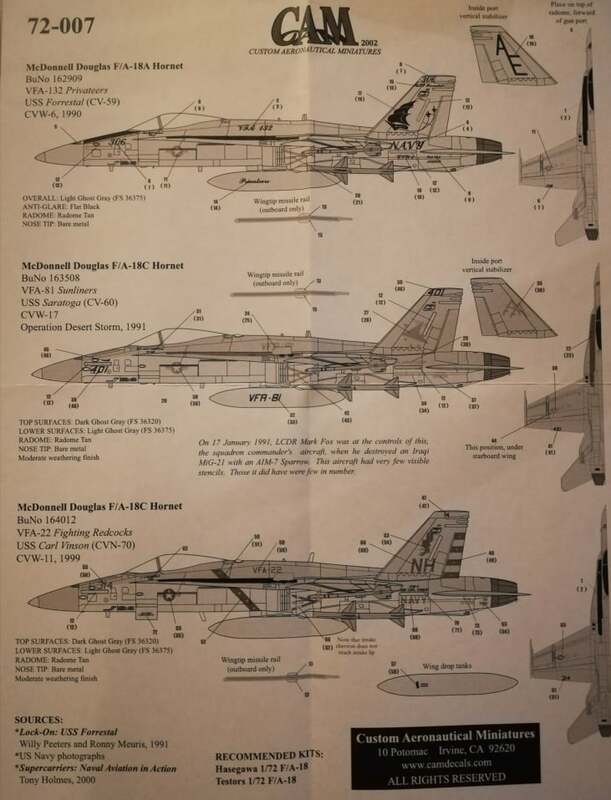 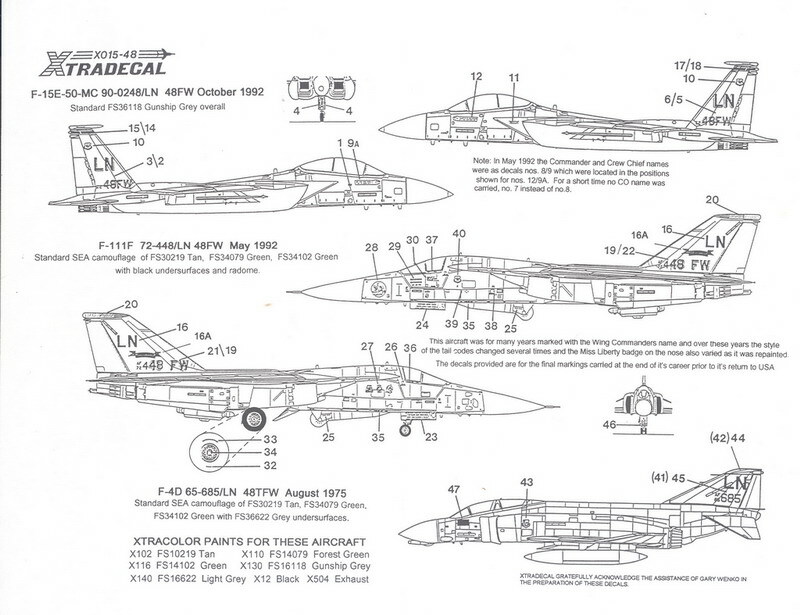 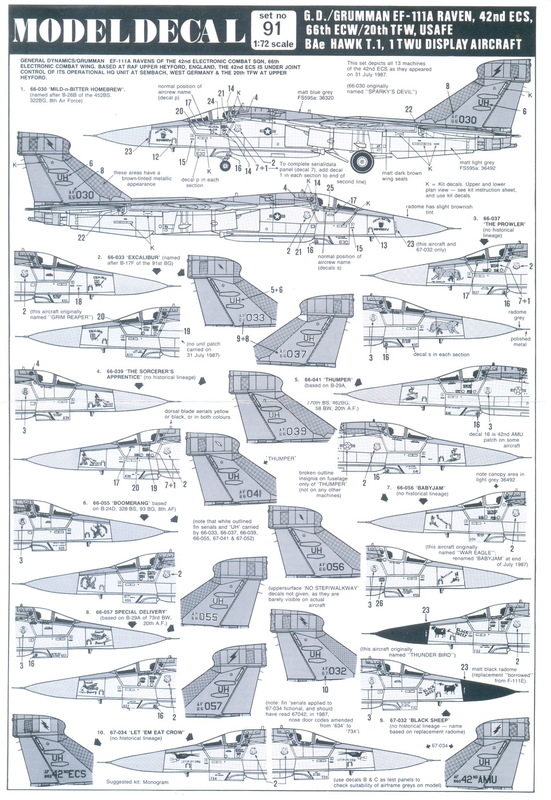 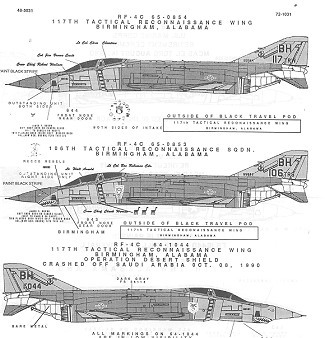 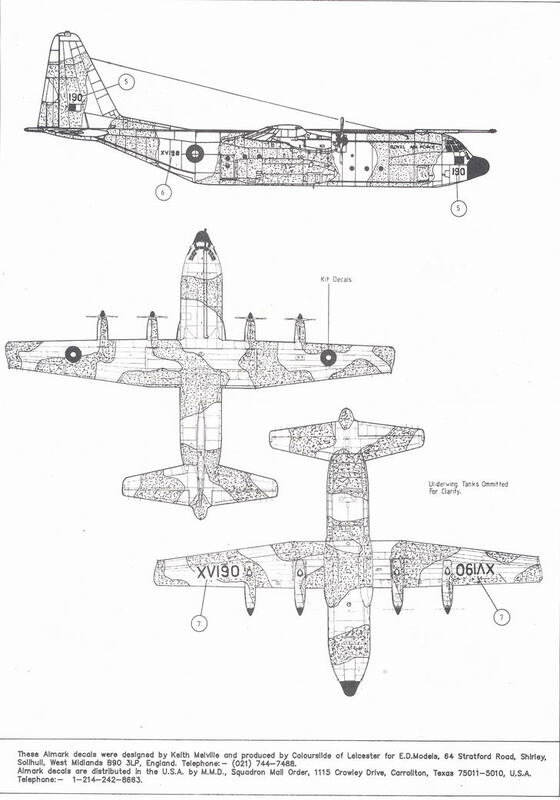 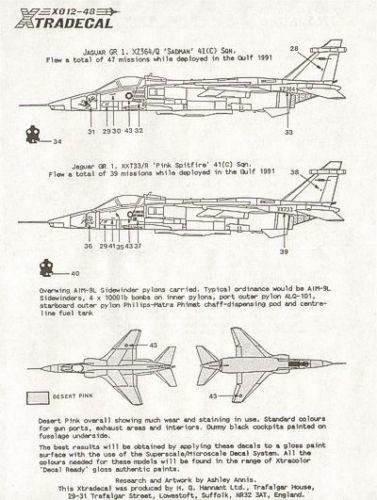 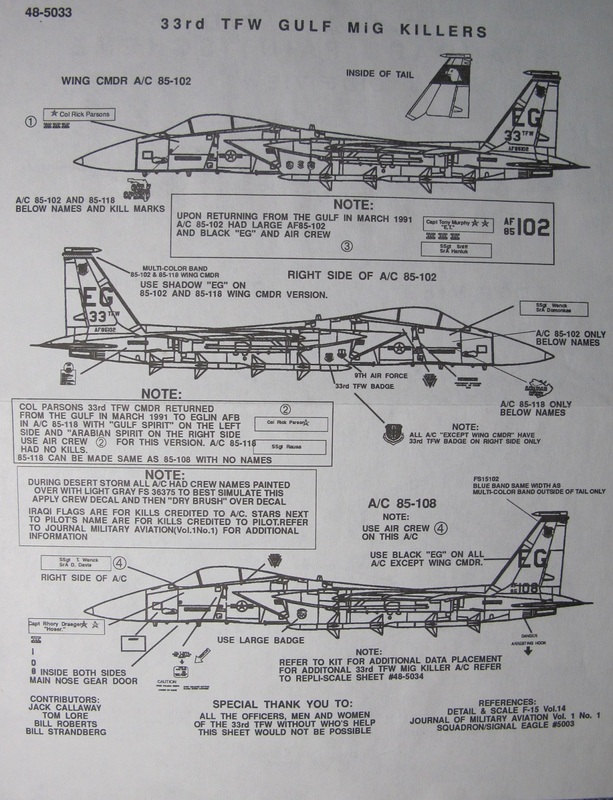 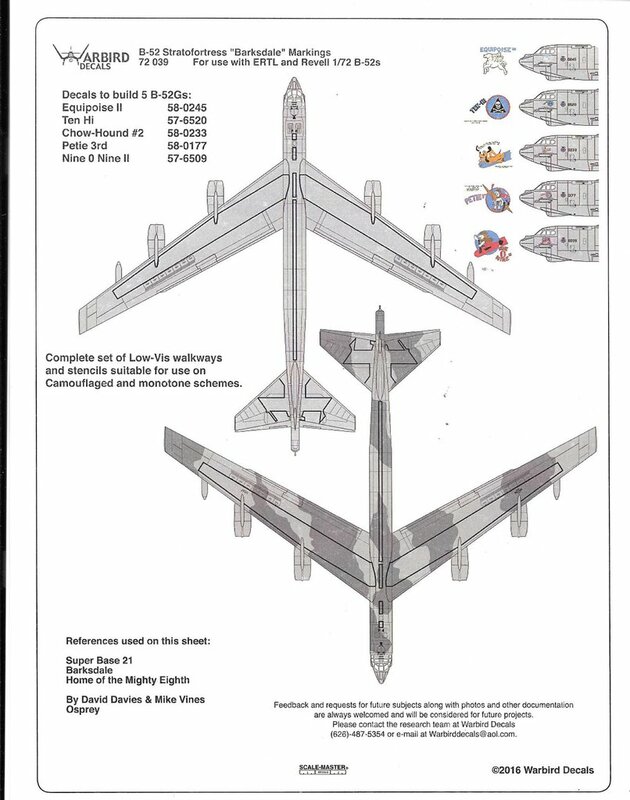 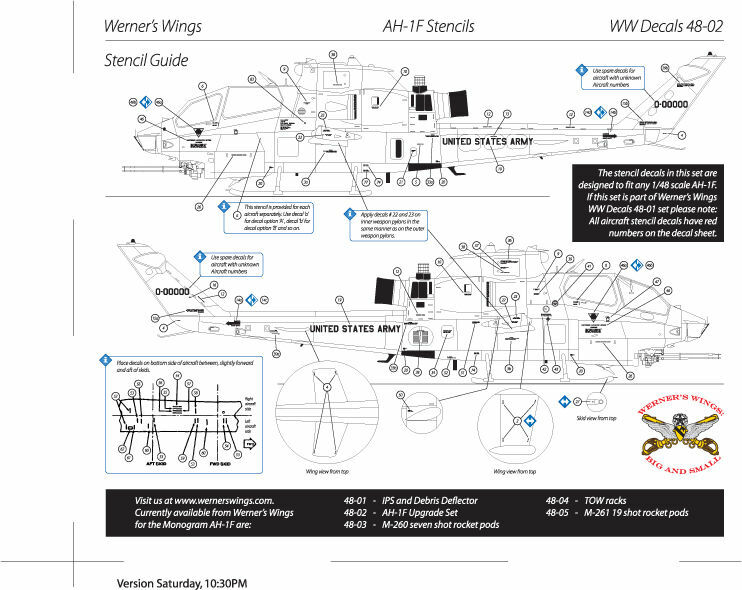 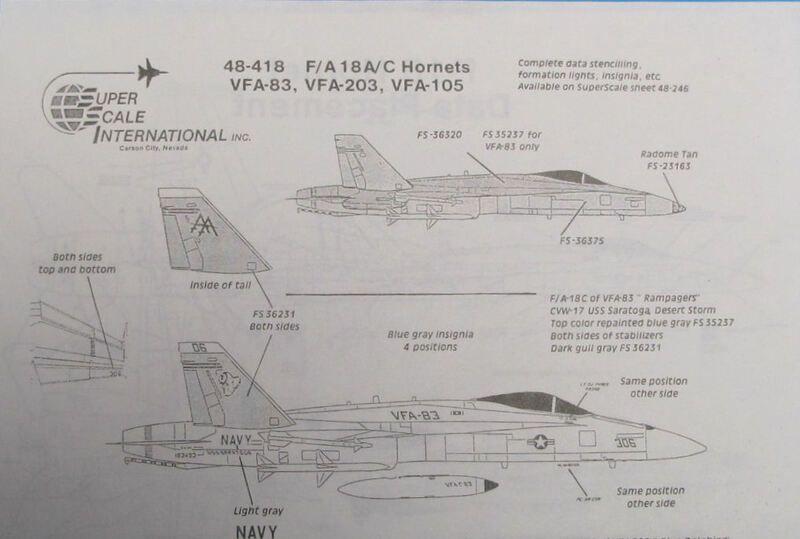 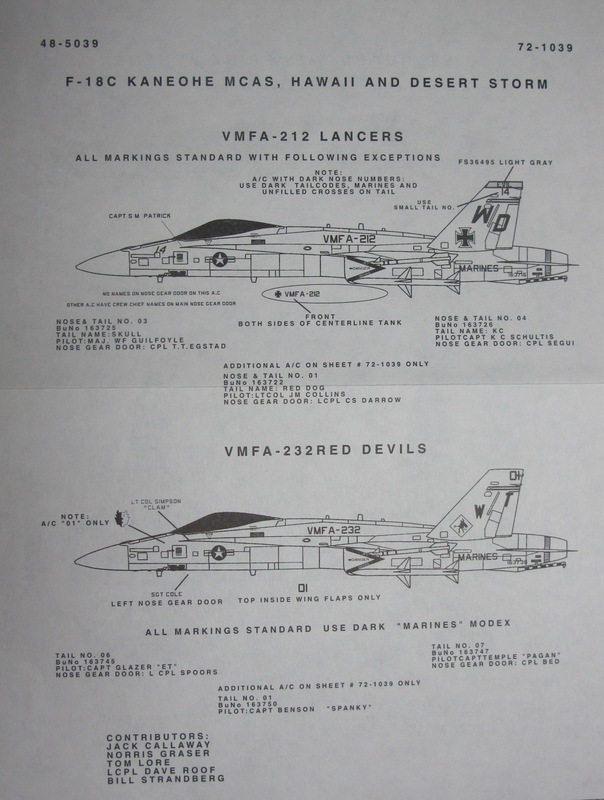 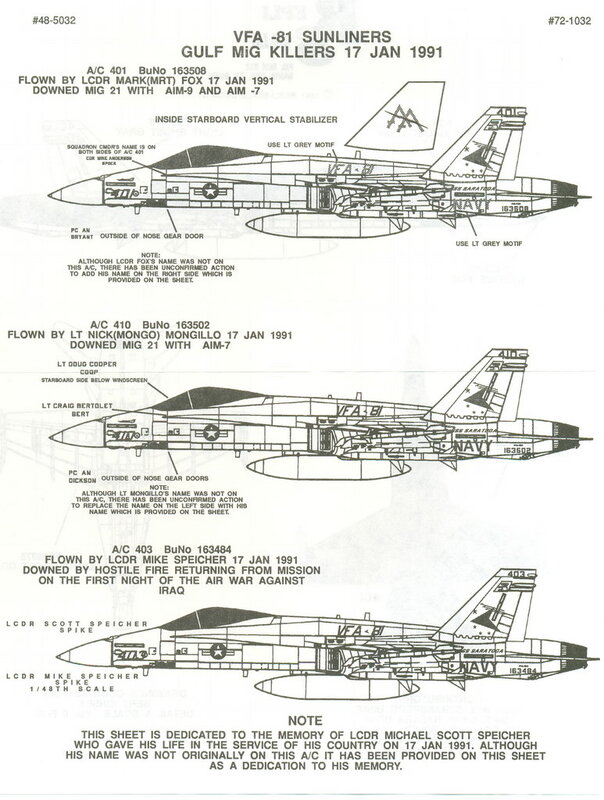 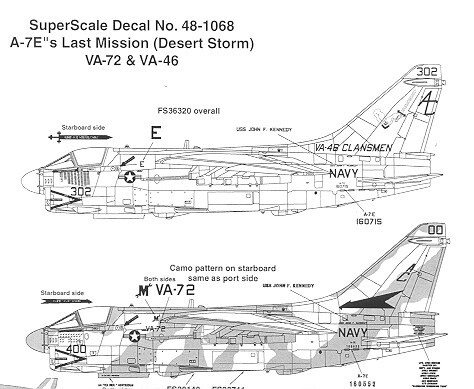 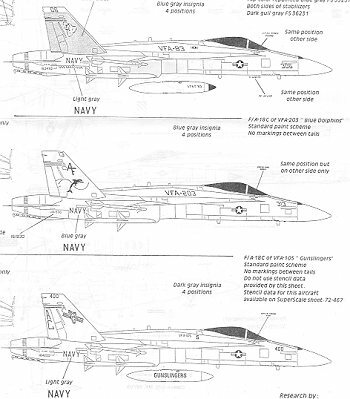 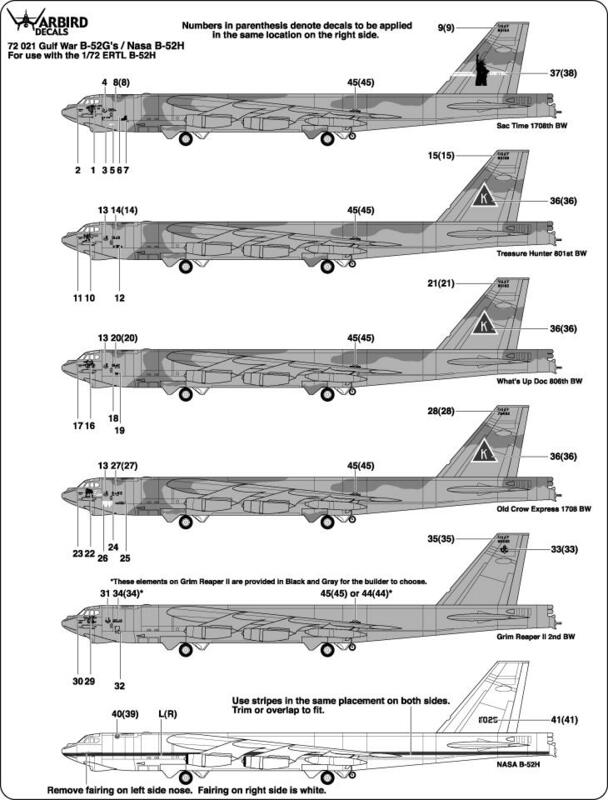 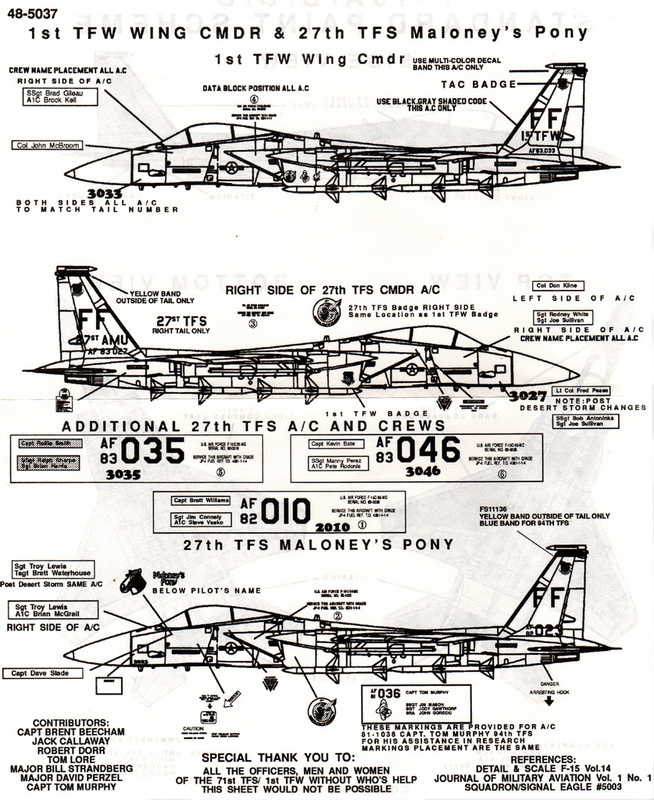 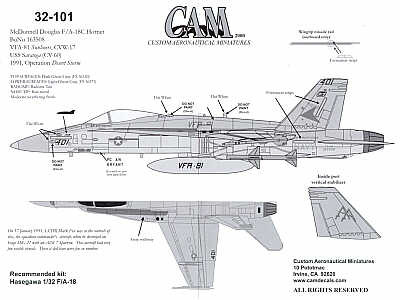 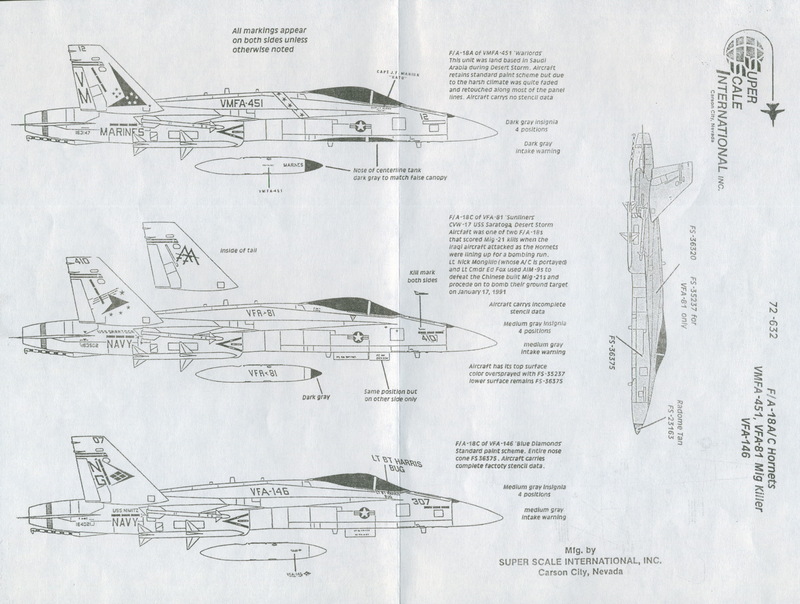 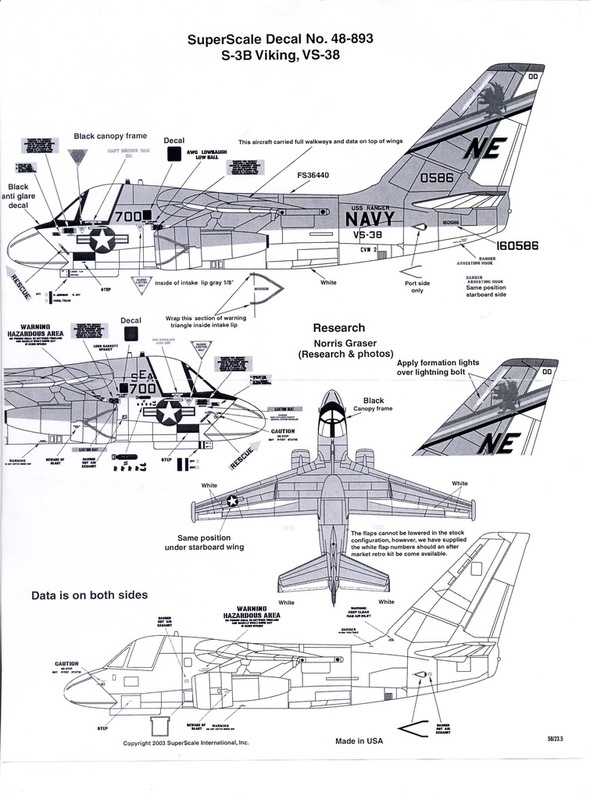 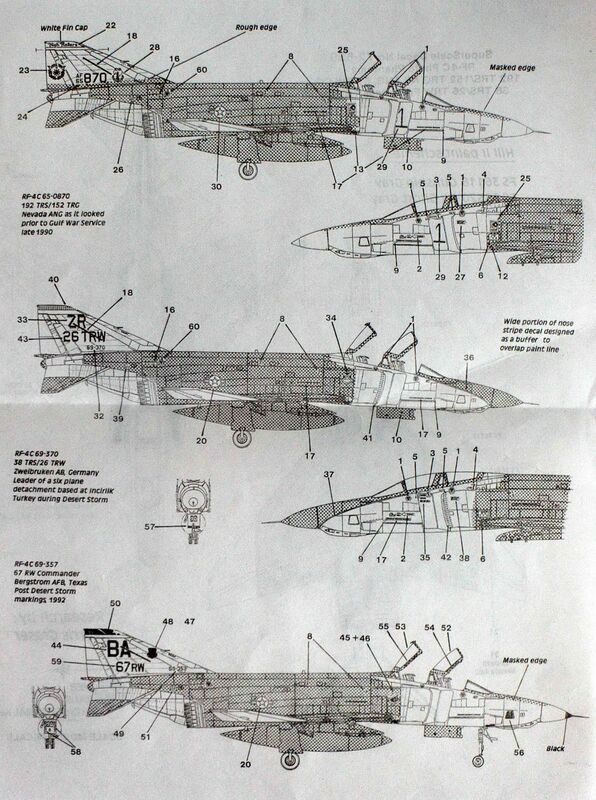 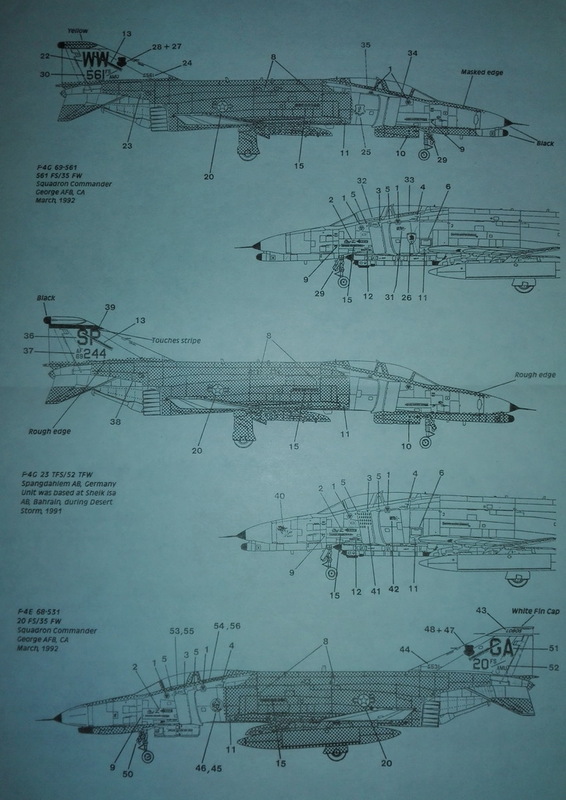 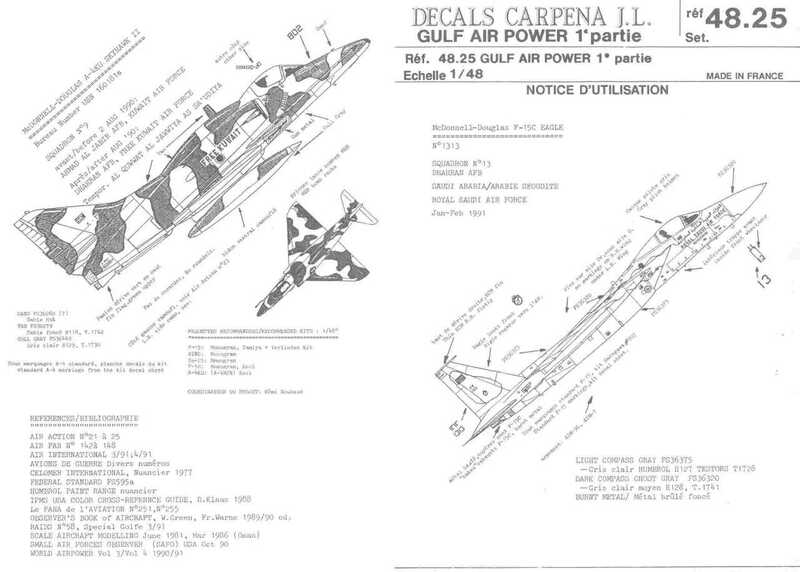 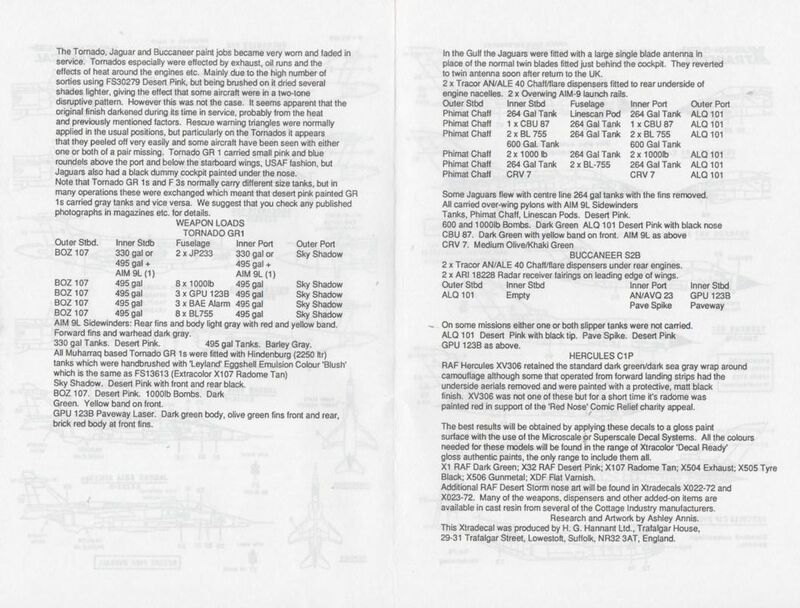 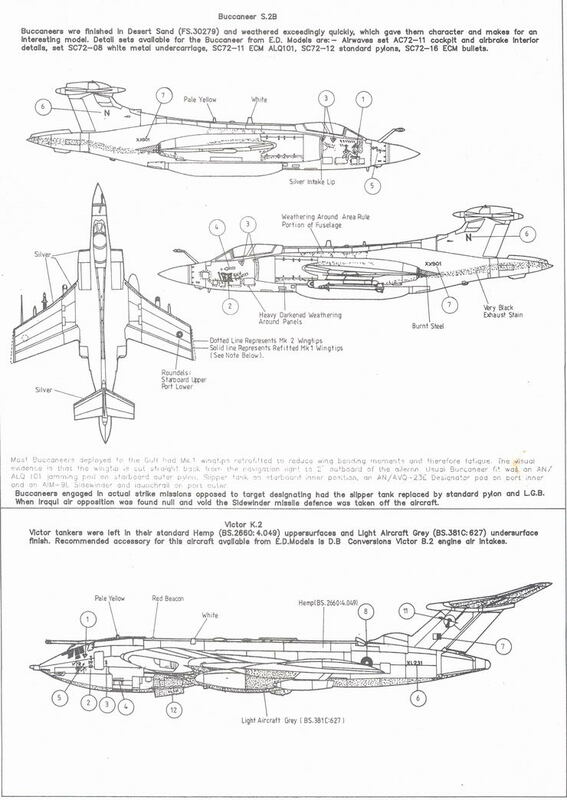 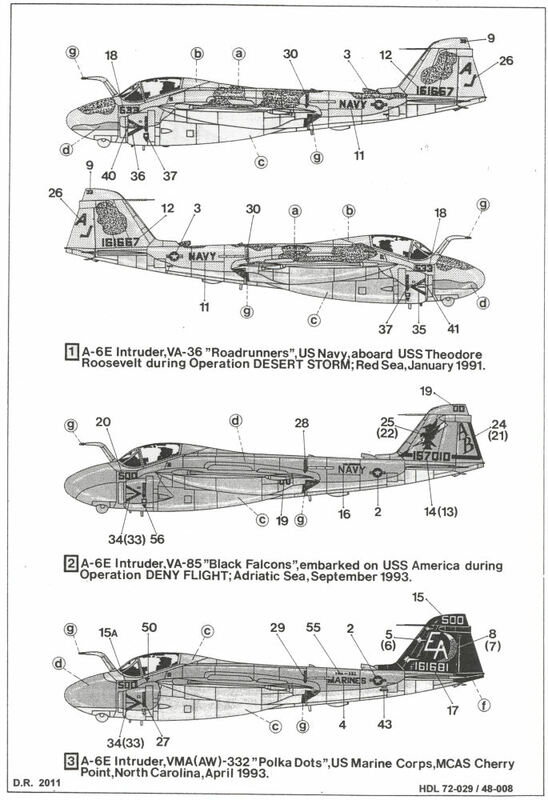 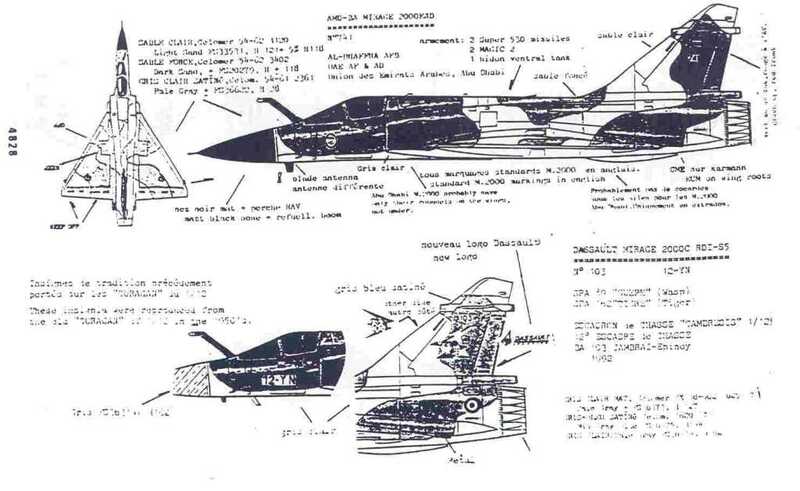 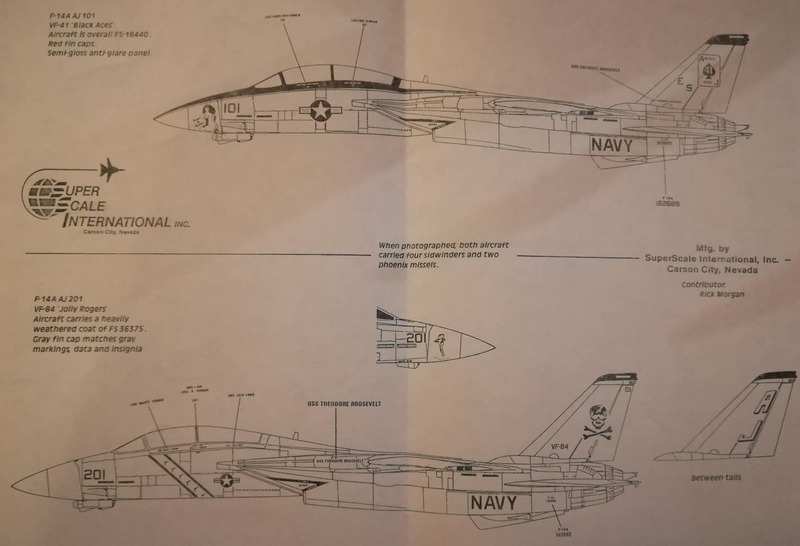 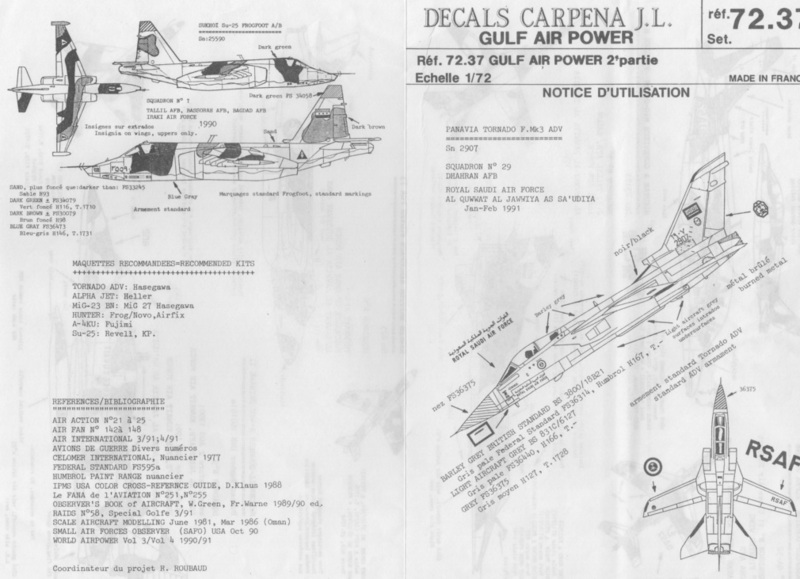 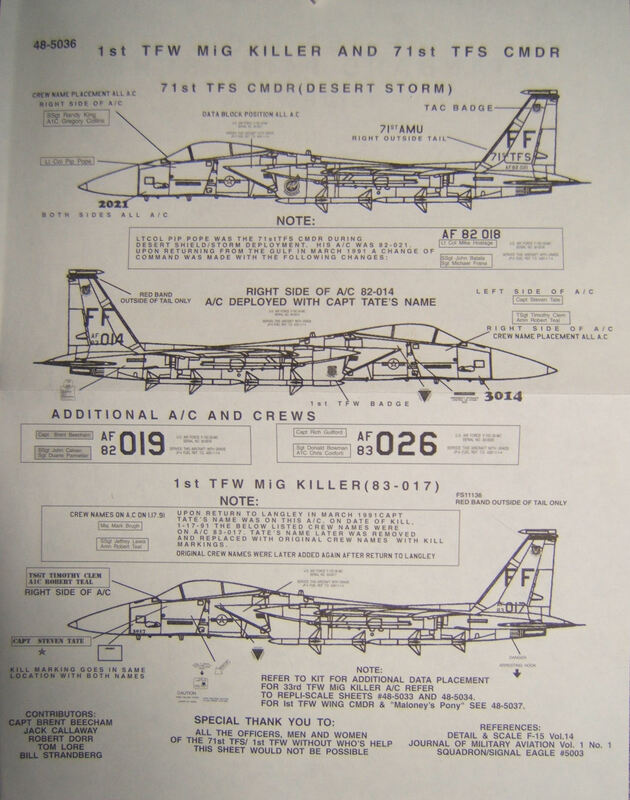 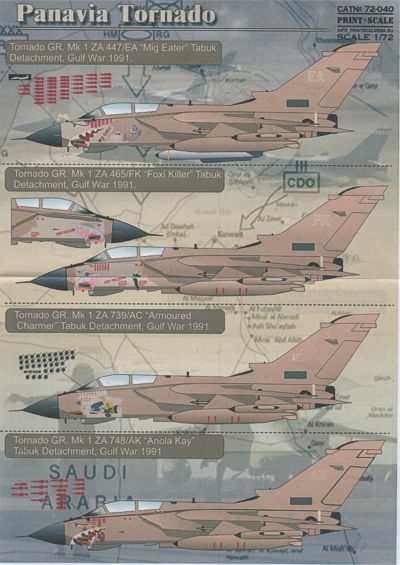 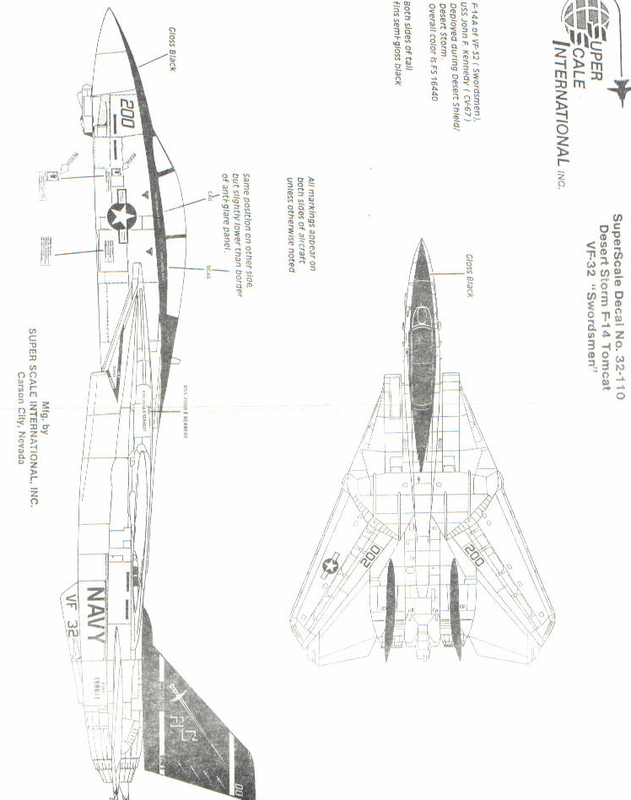 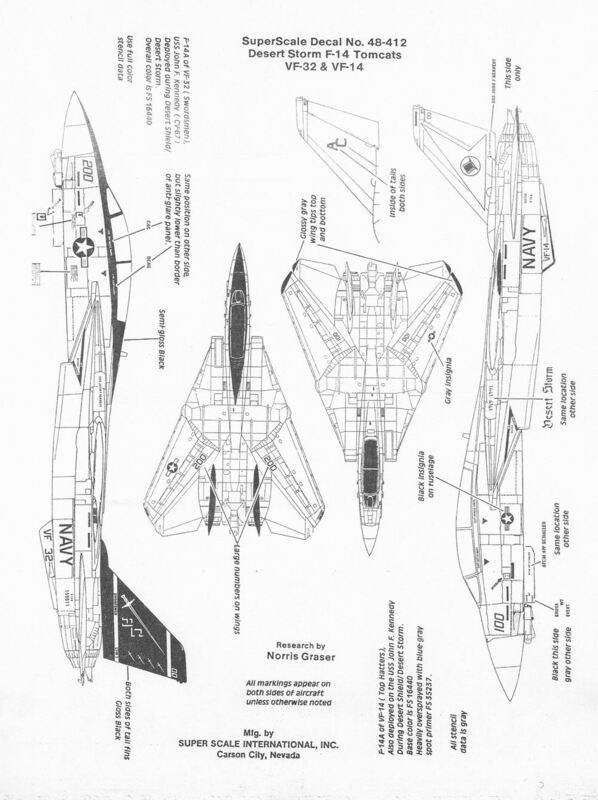 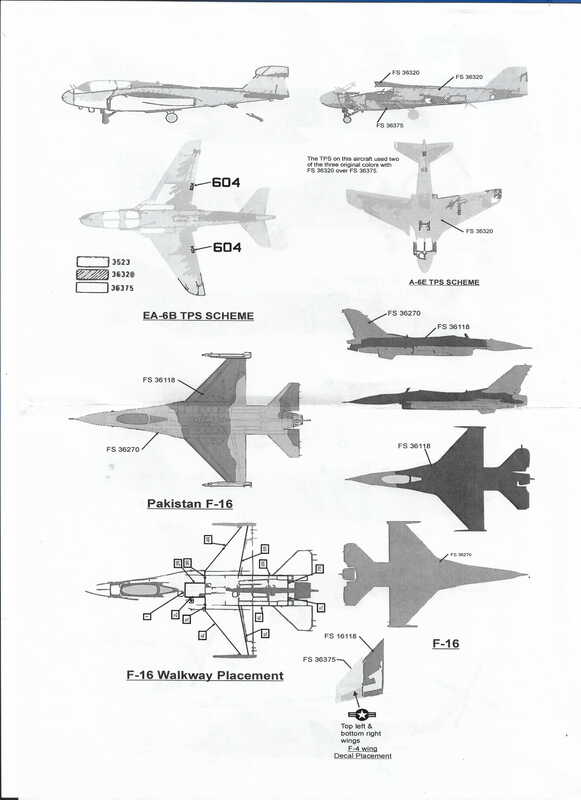 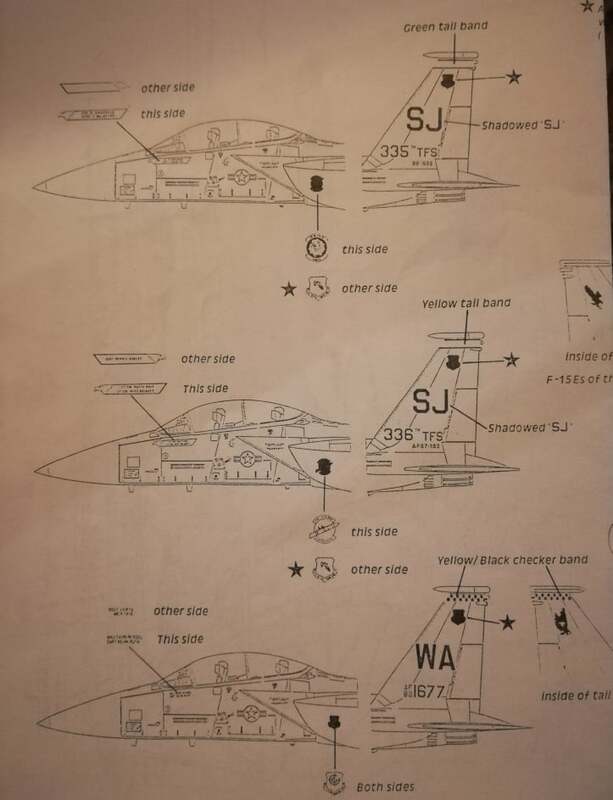 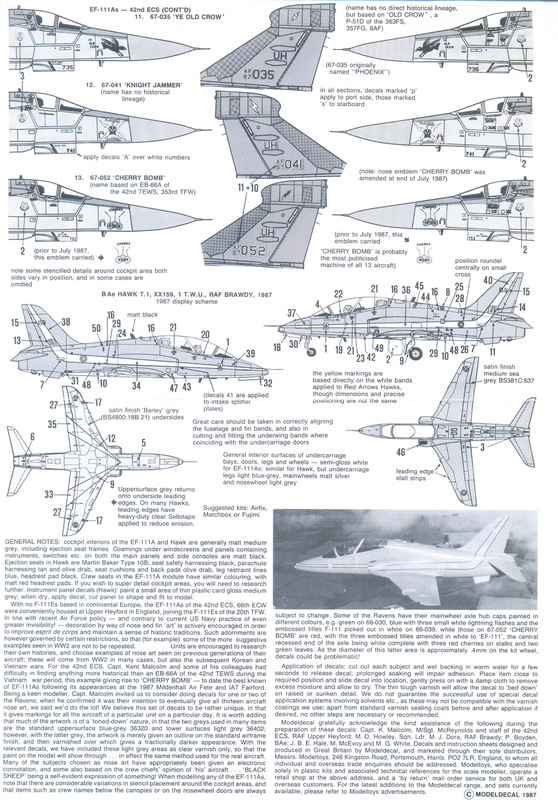 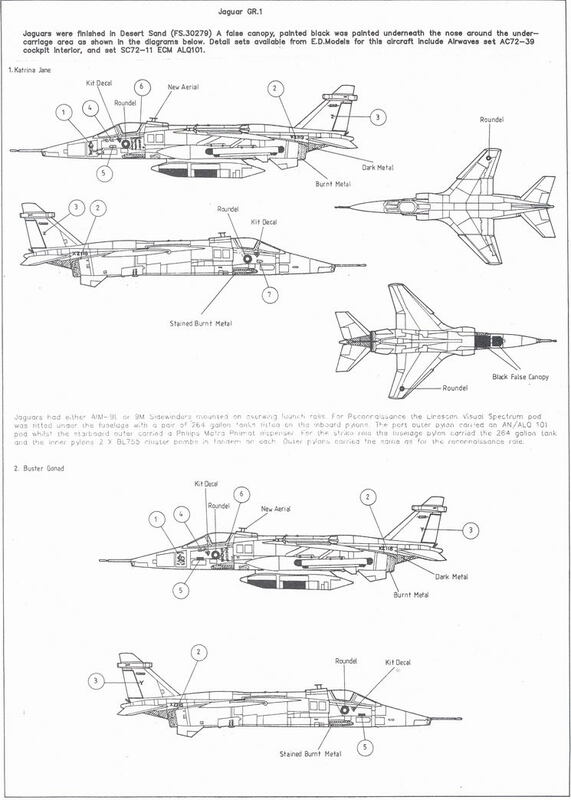 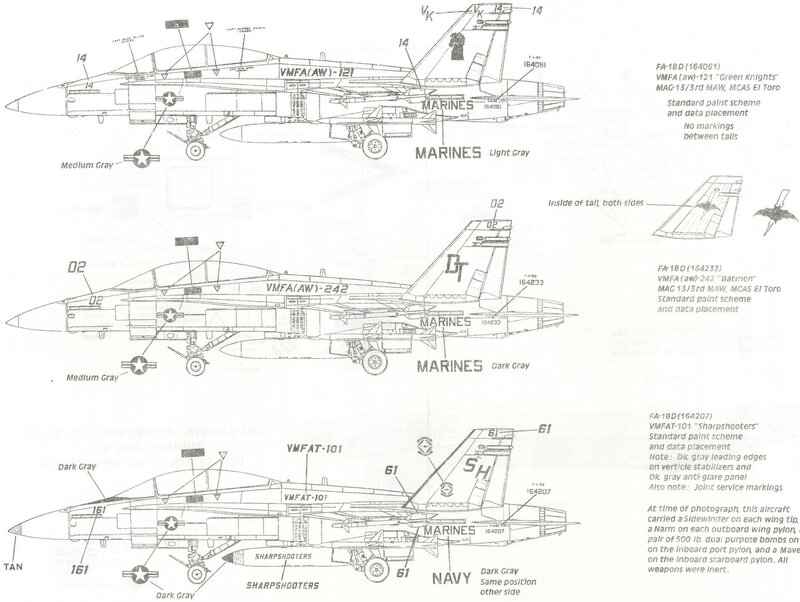 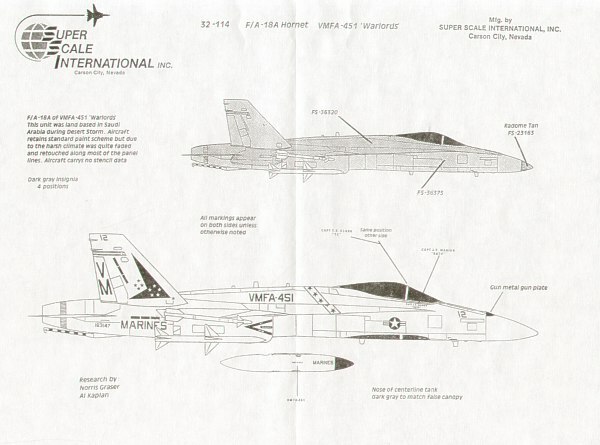 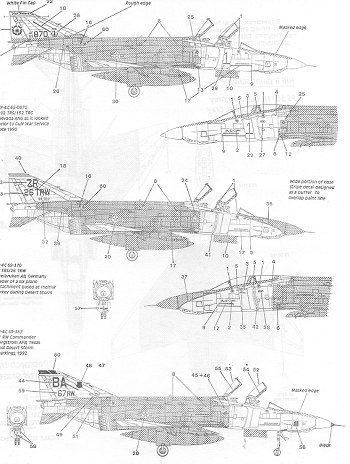 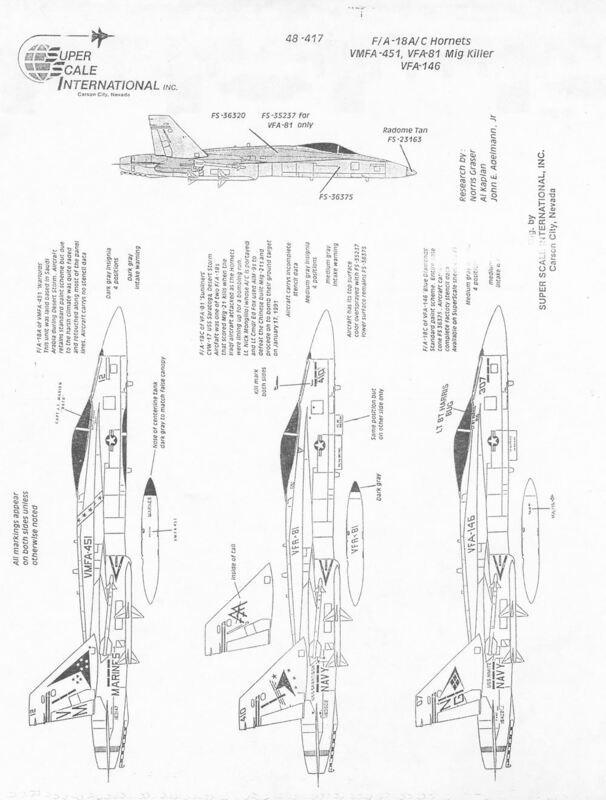 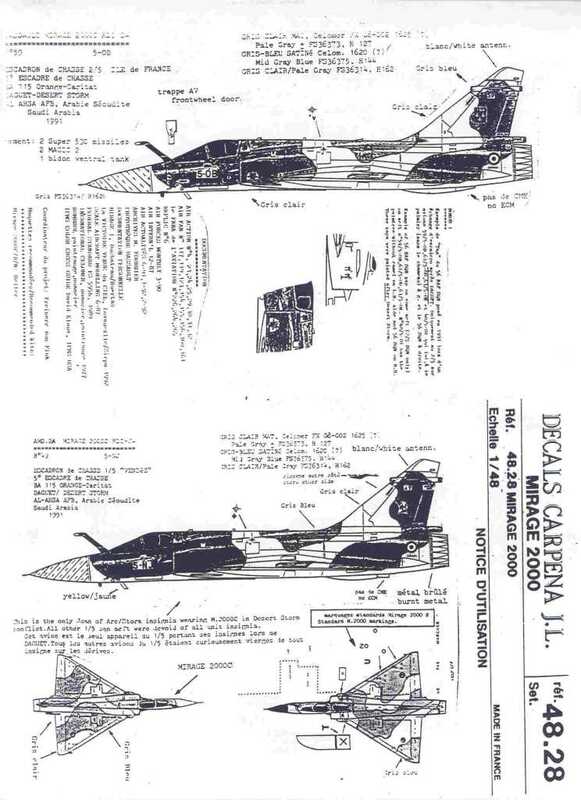 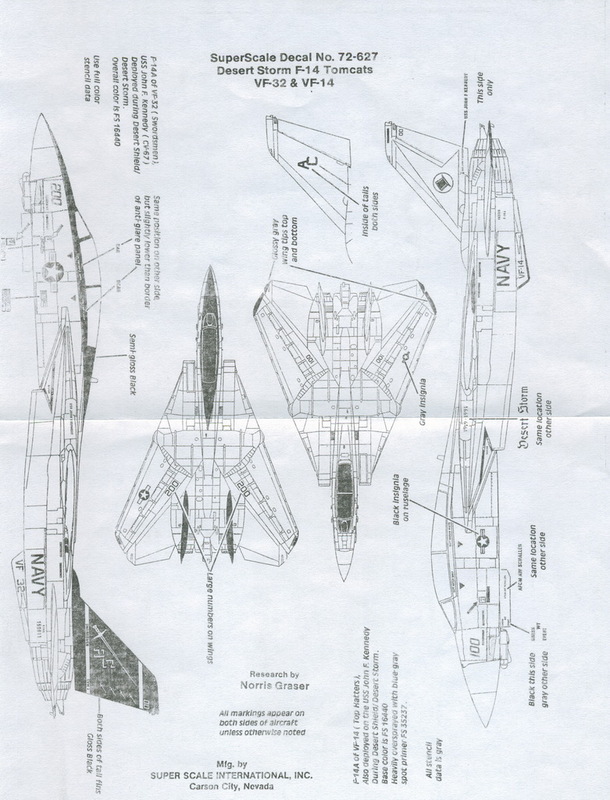 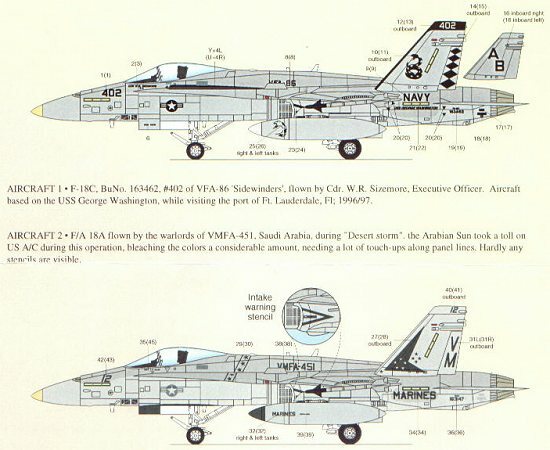 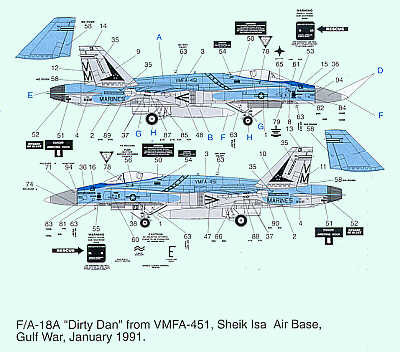 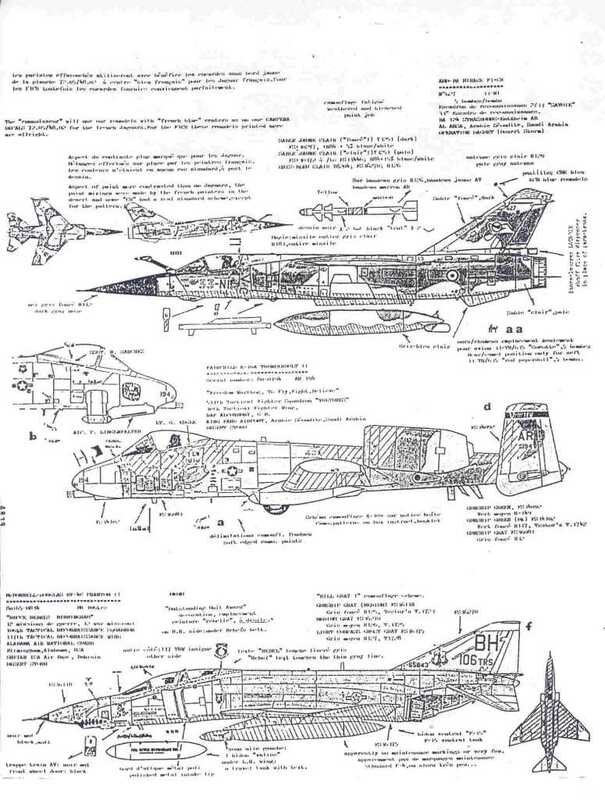 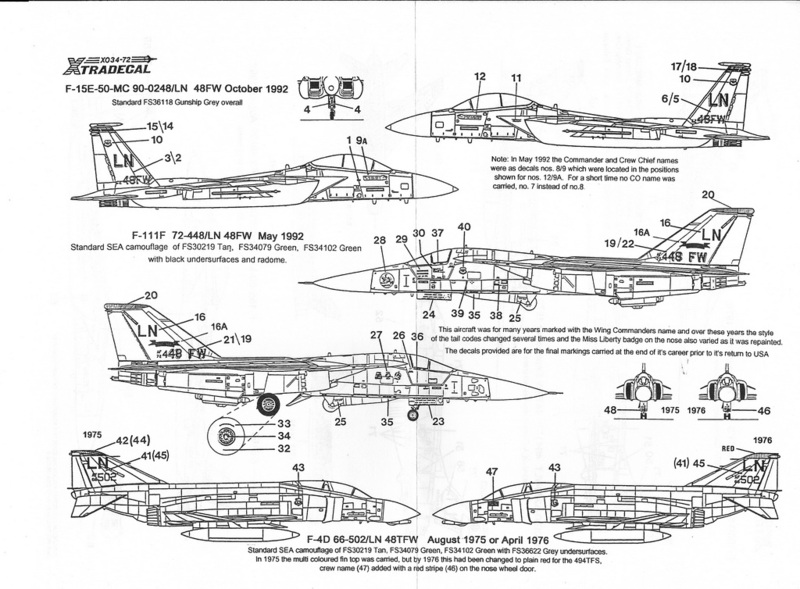 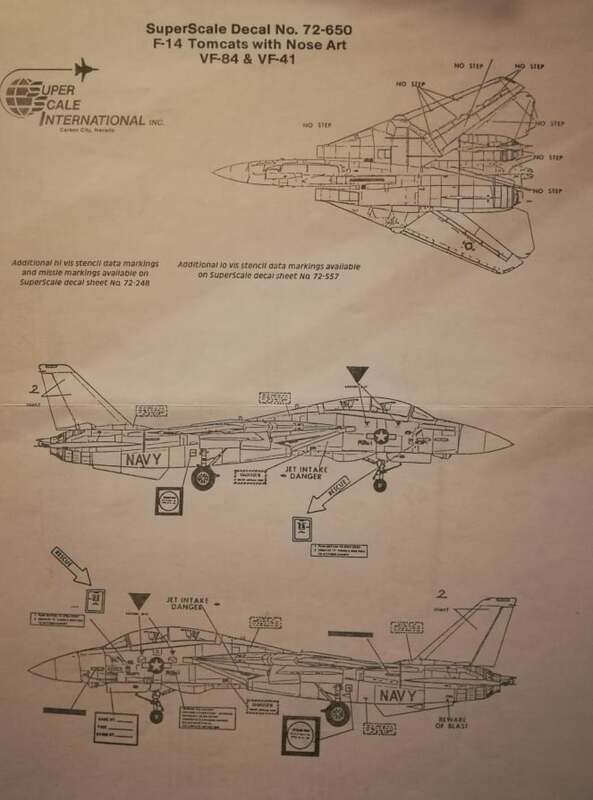 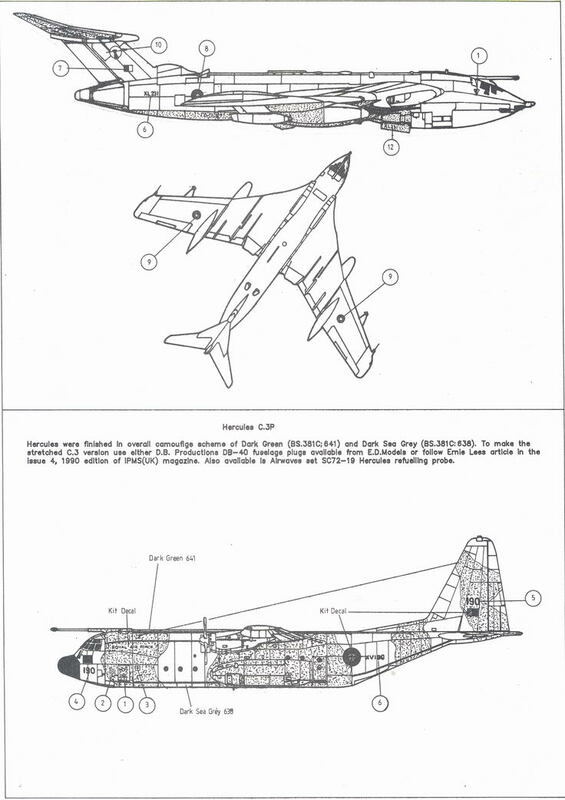 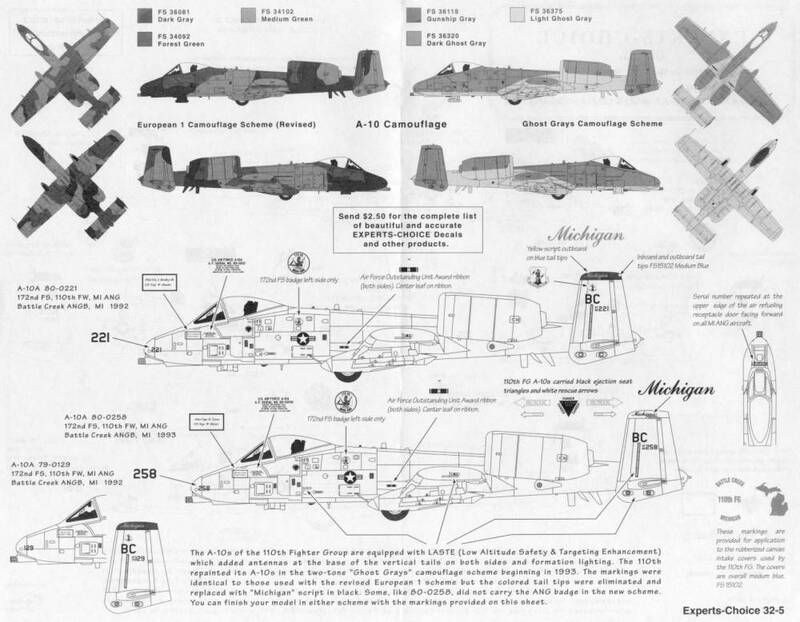 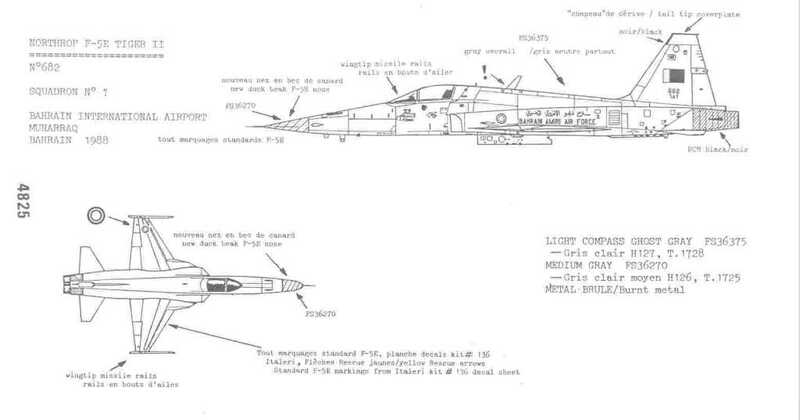 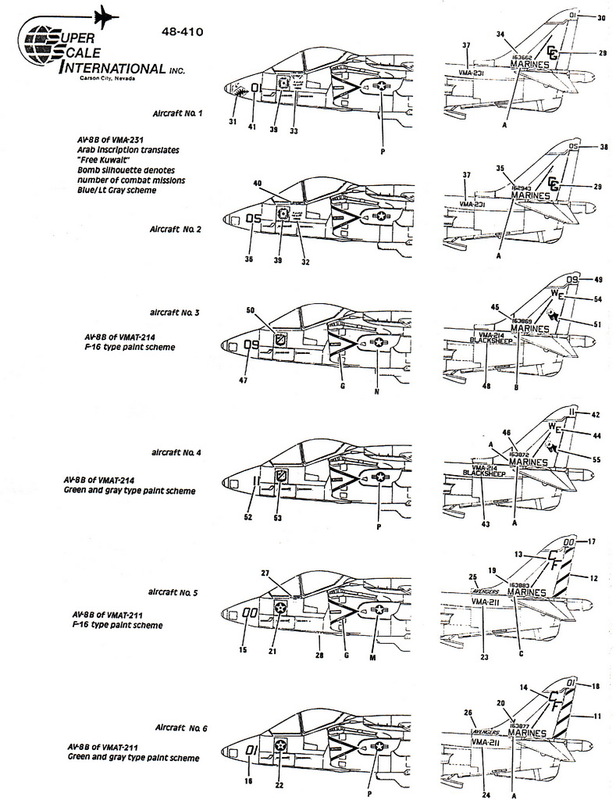 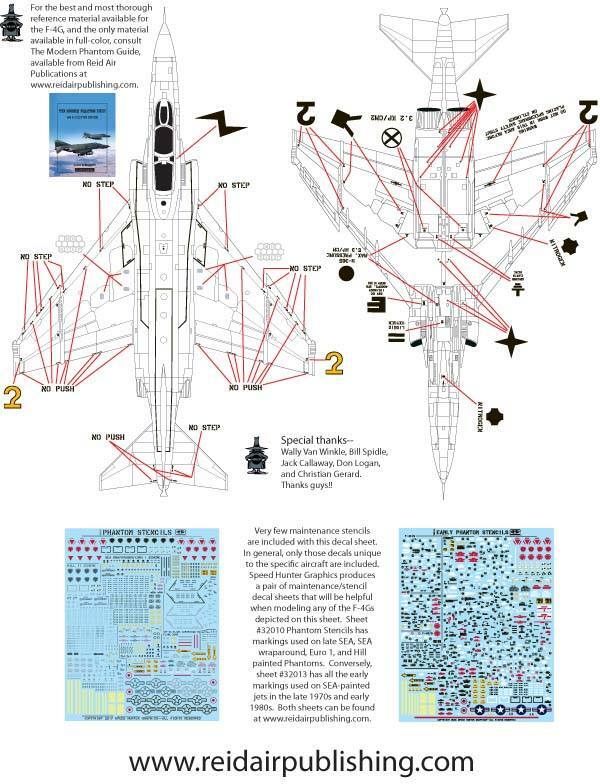 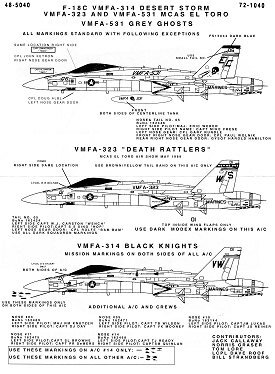 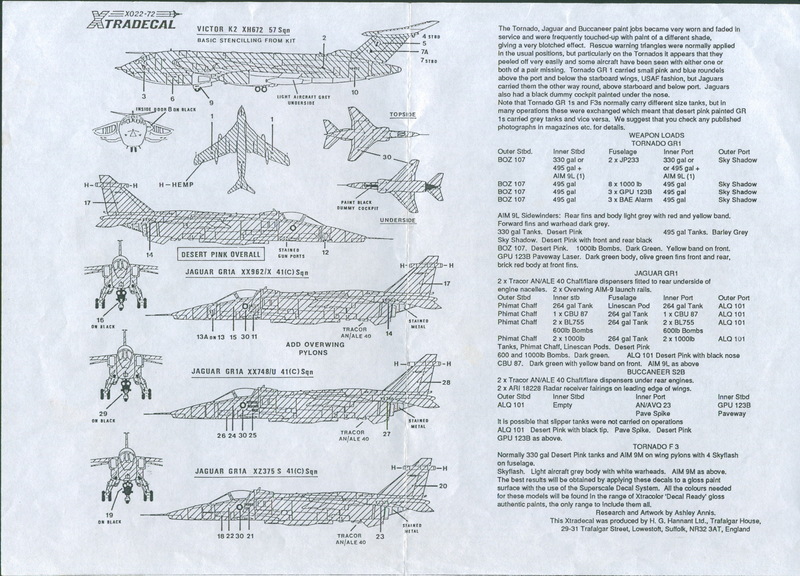 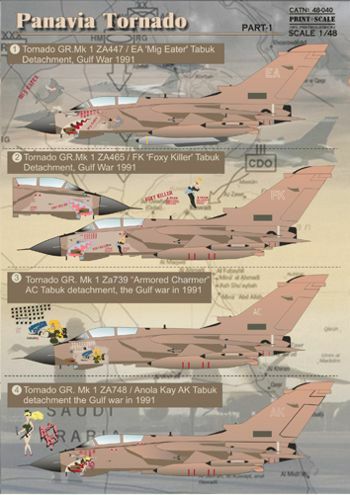 Note for marking - planes didnt carry the bomb tally during the war, it was added later. 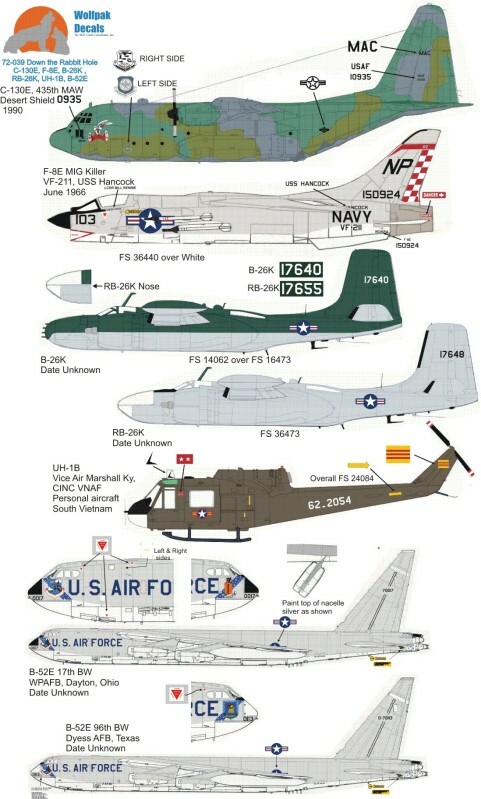 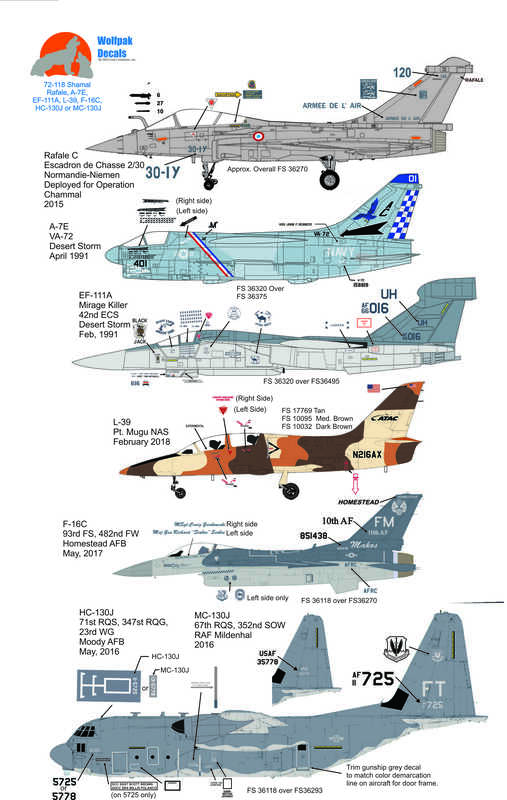 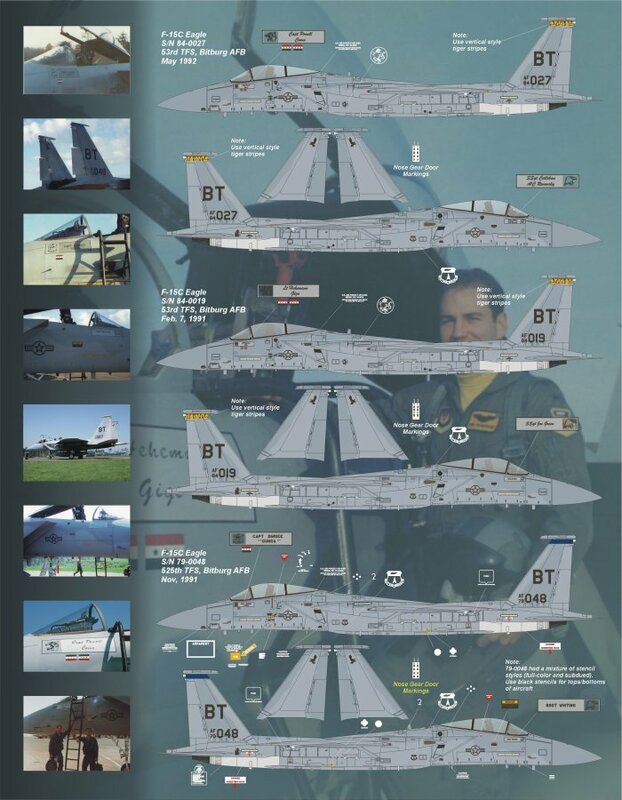 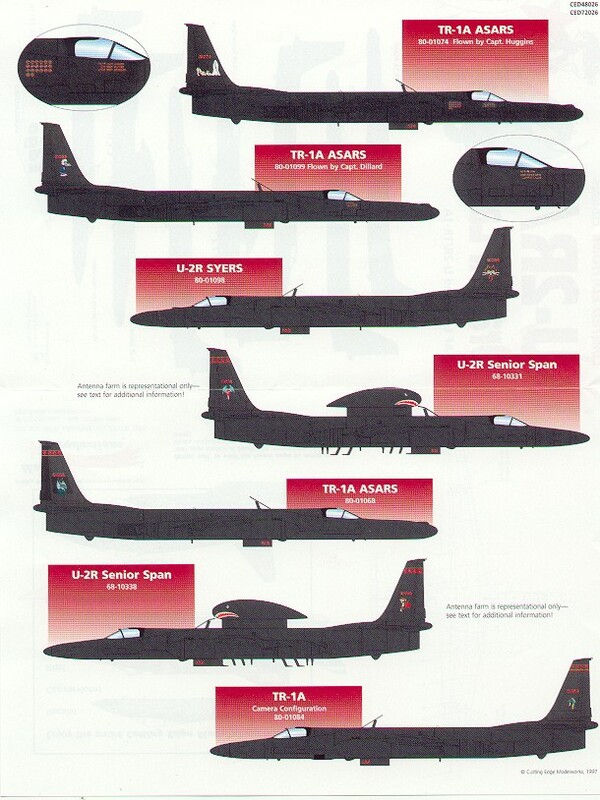 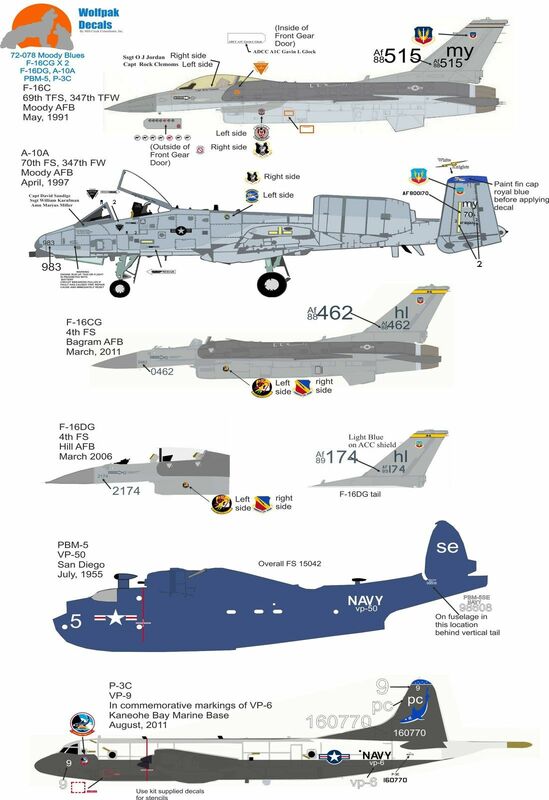 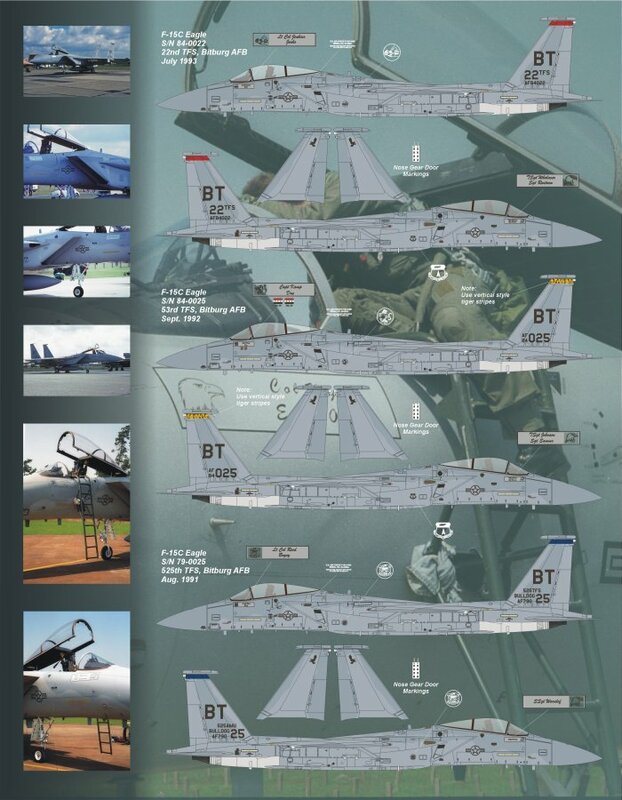 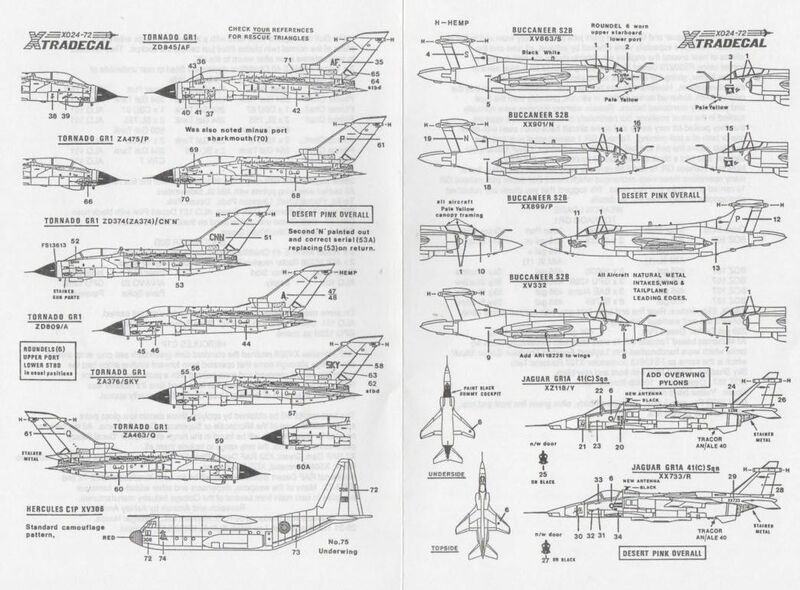 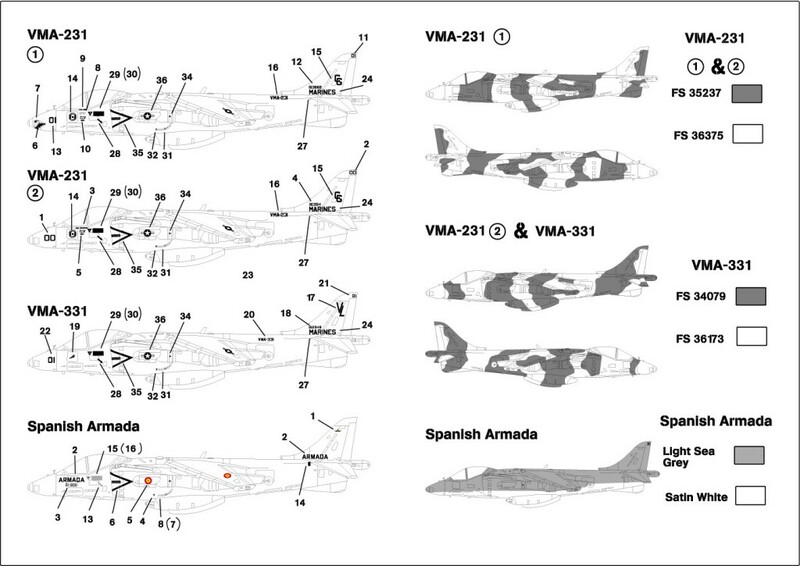 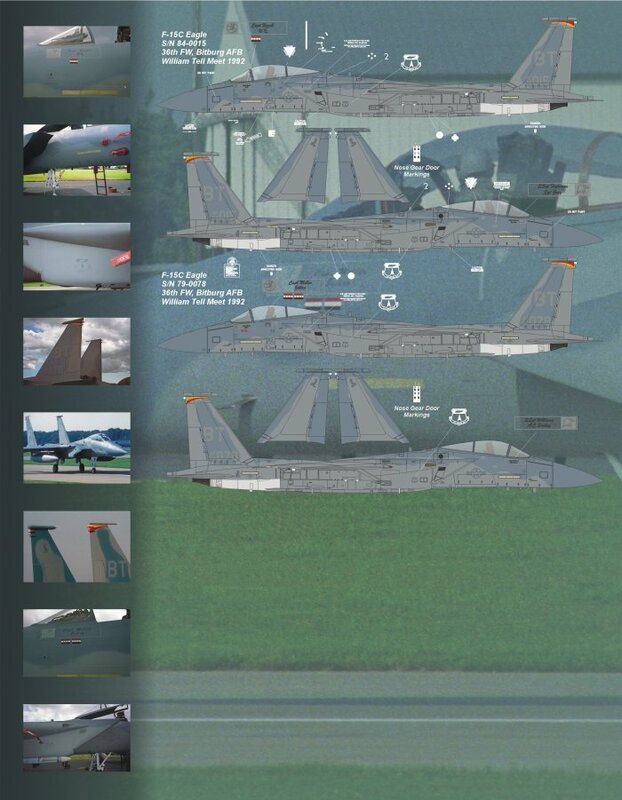 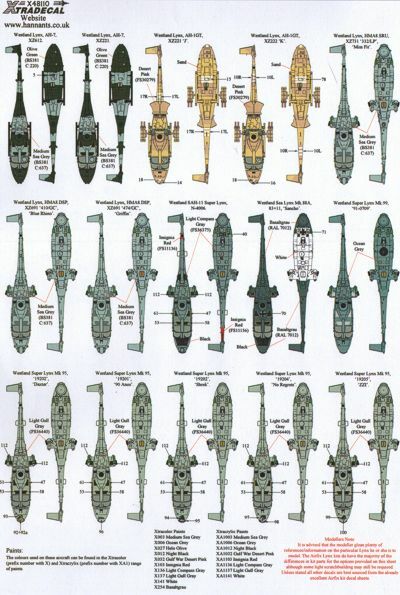 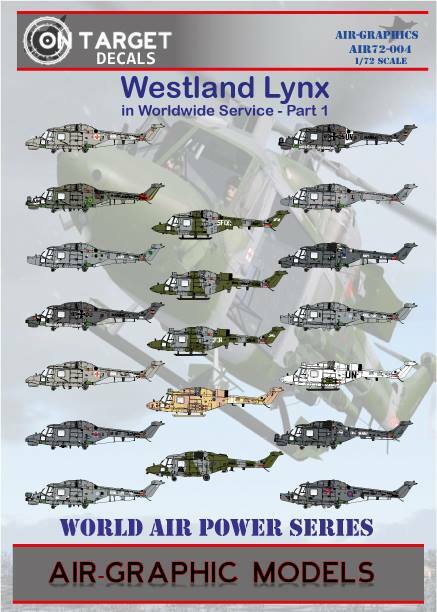 All planes have them, the difference was only the number of missions. 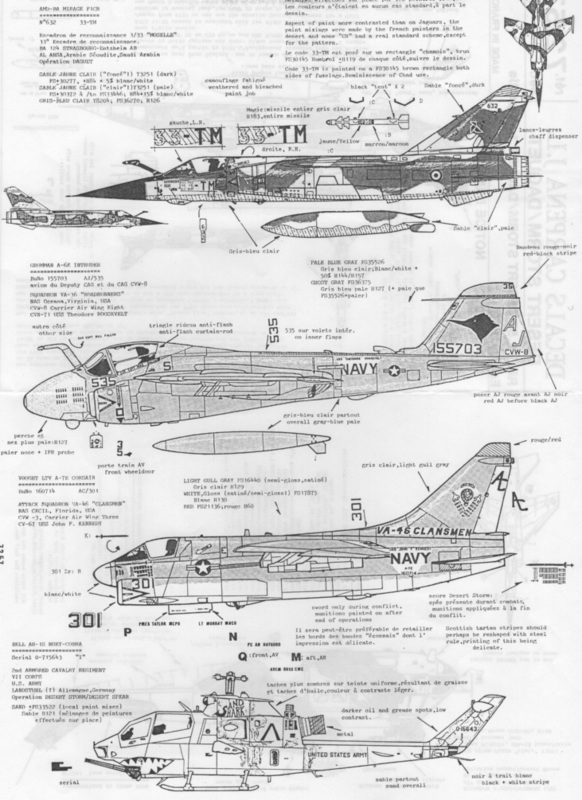 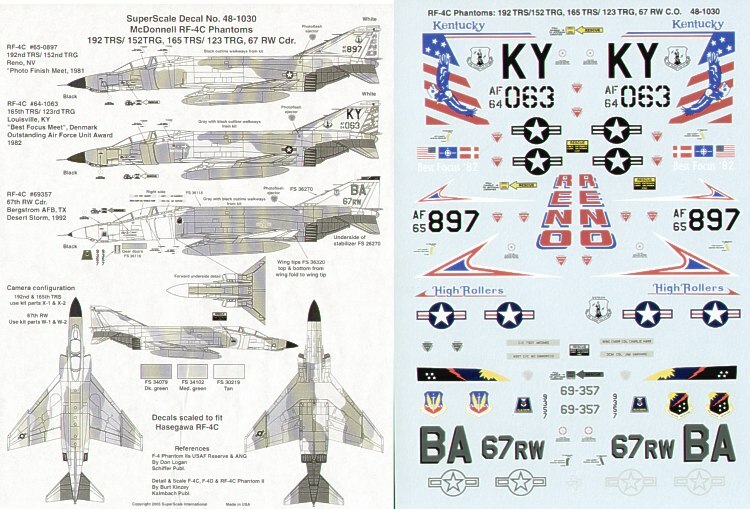 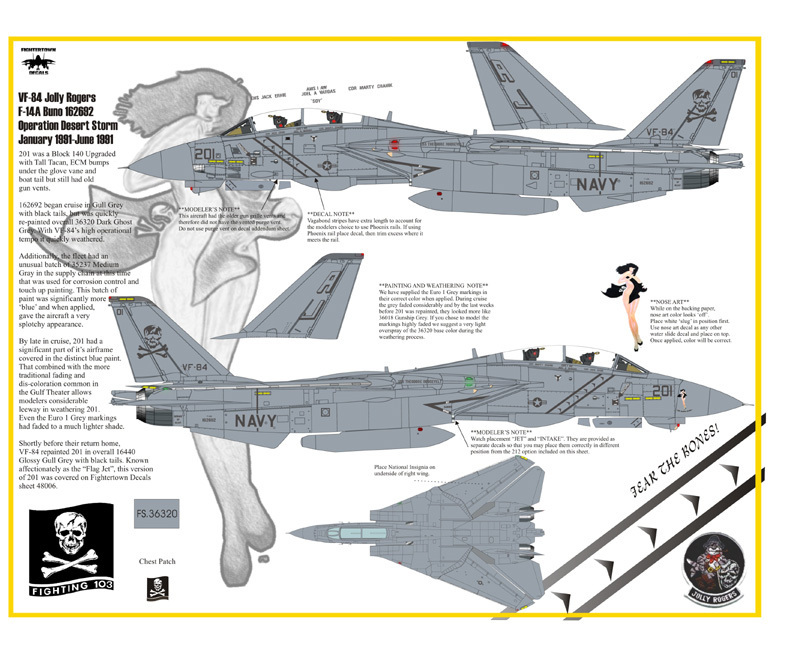 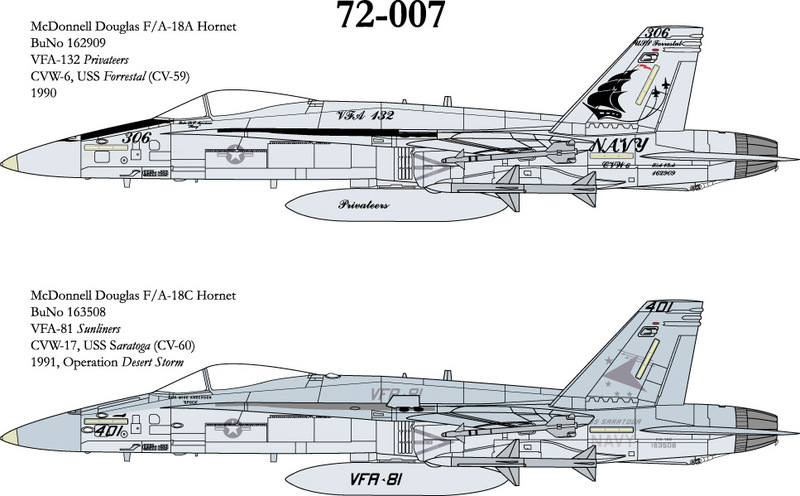 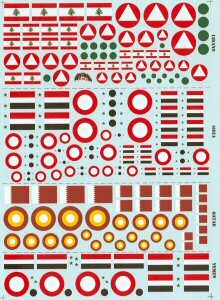 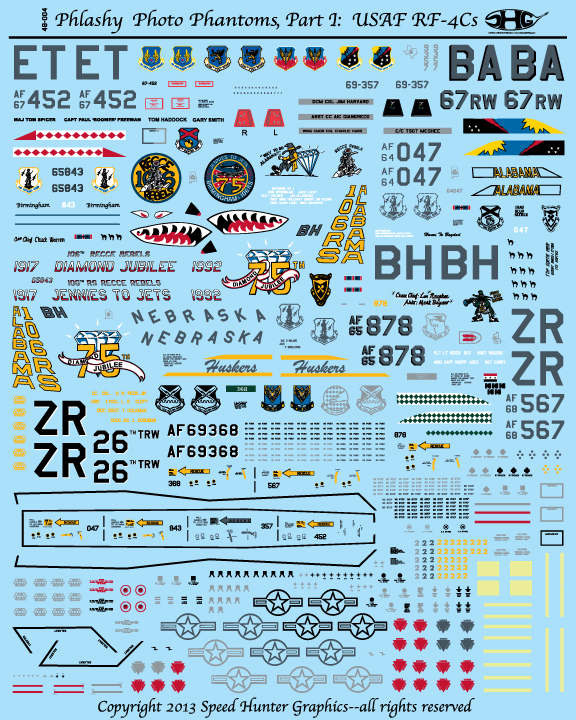 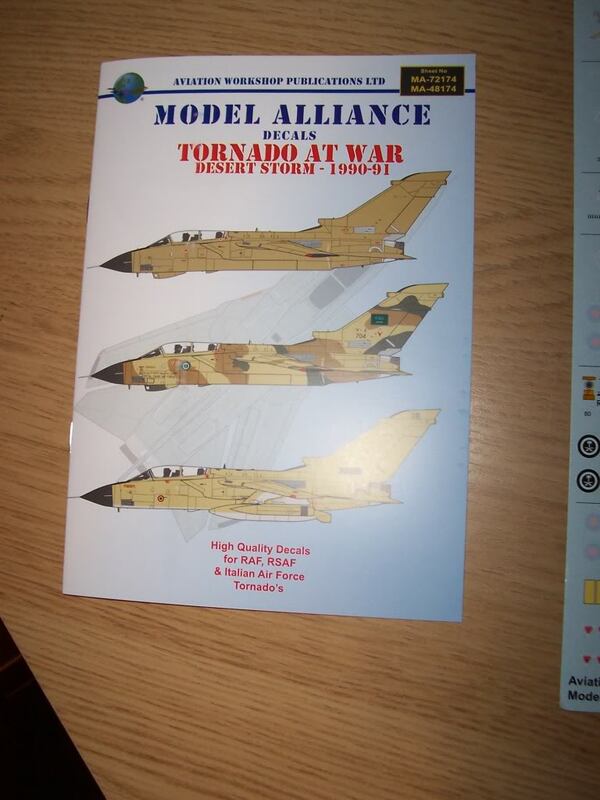 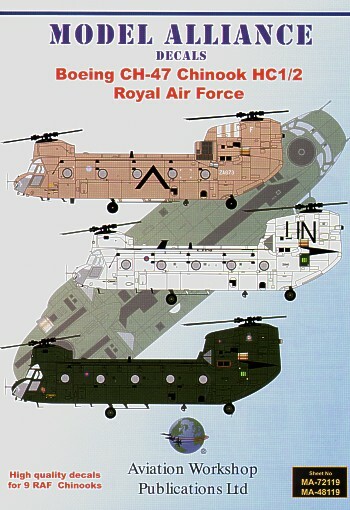 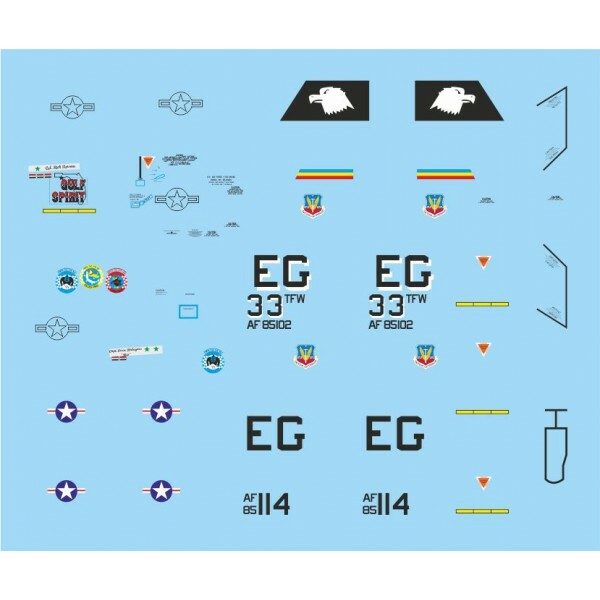 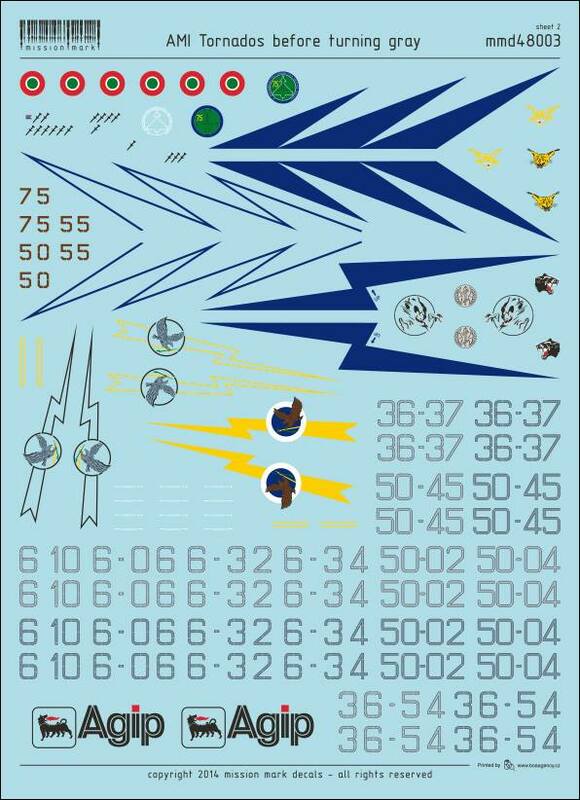 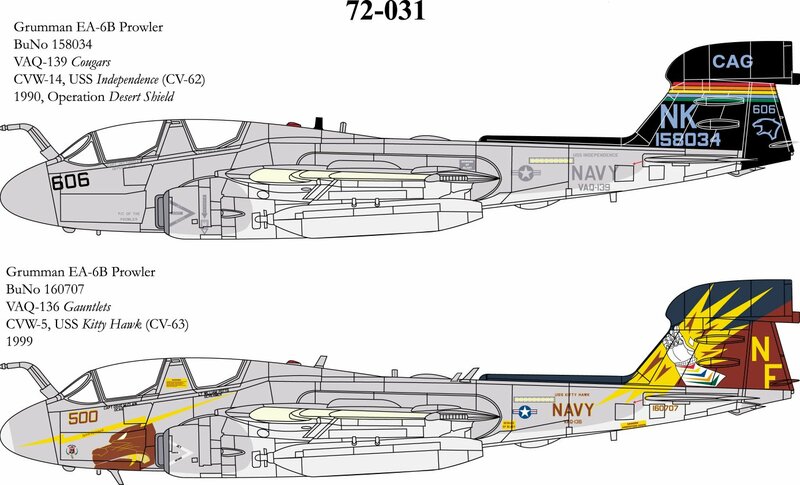 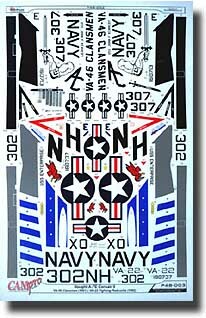 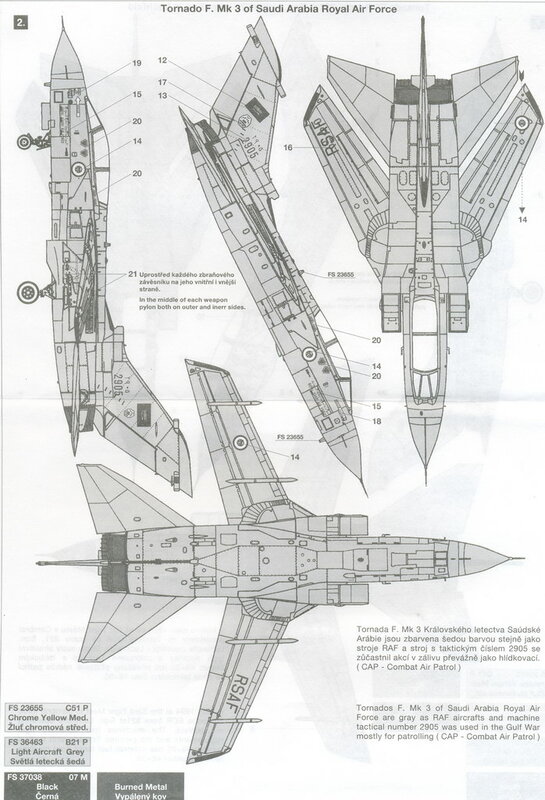 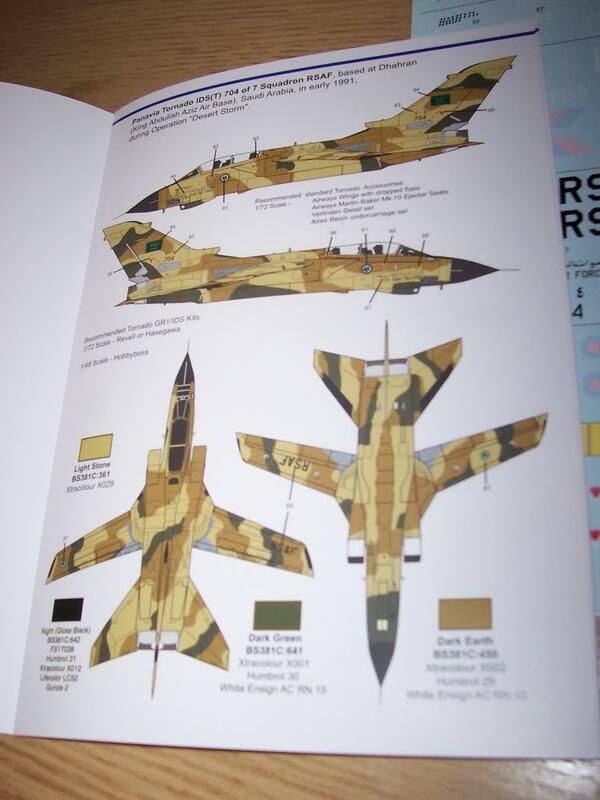 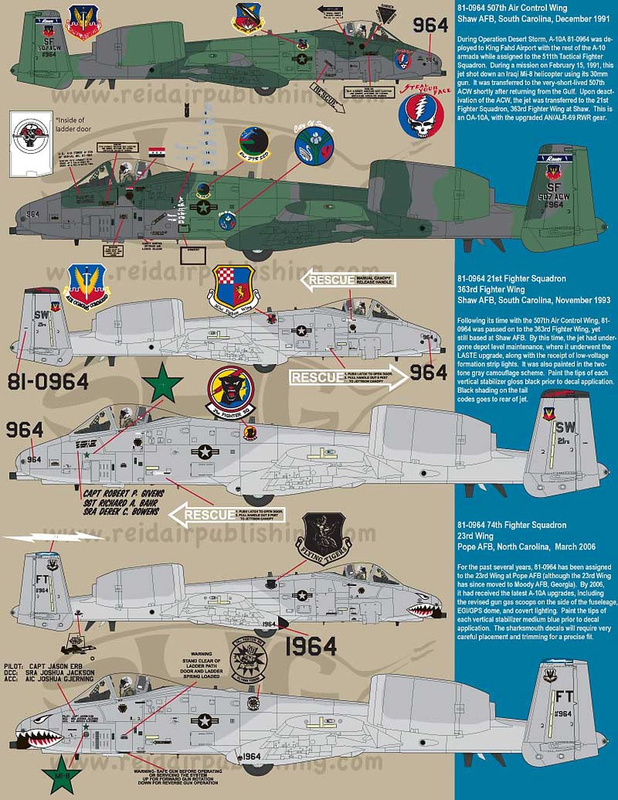 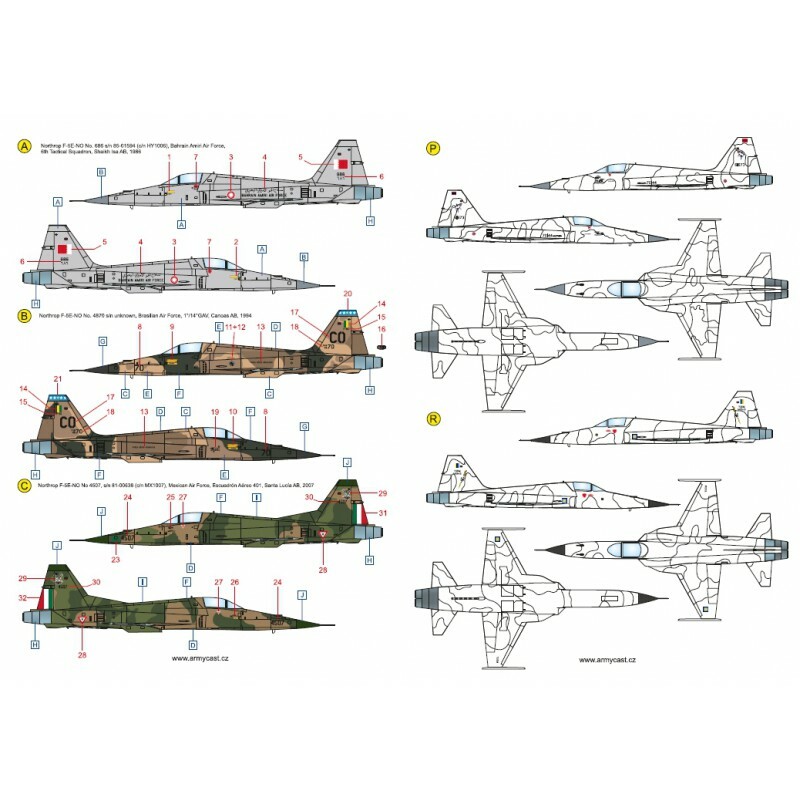 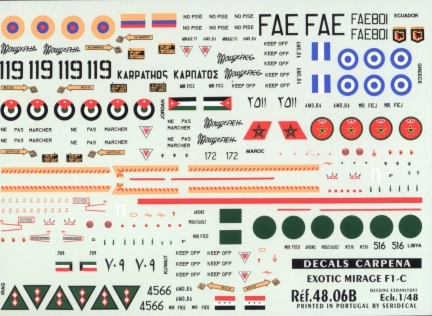 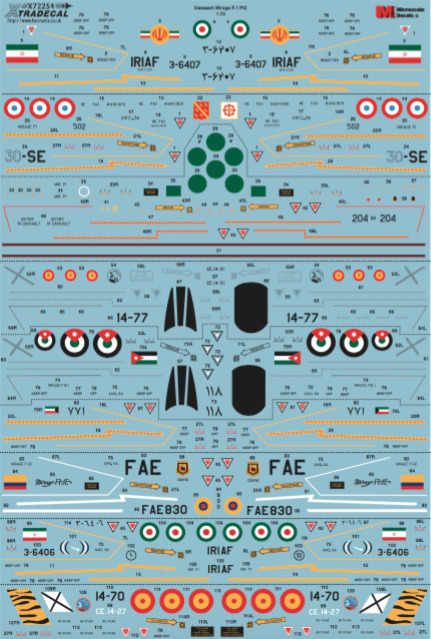 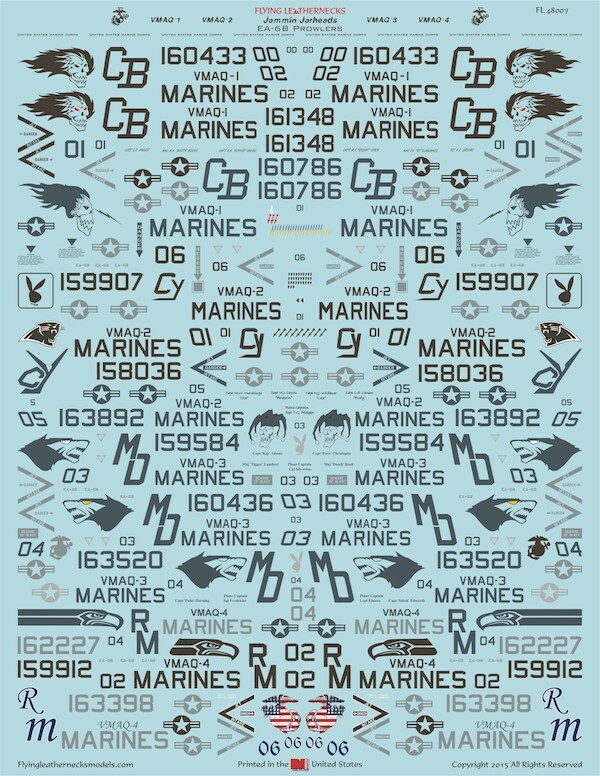 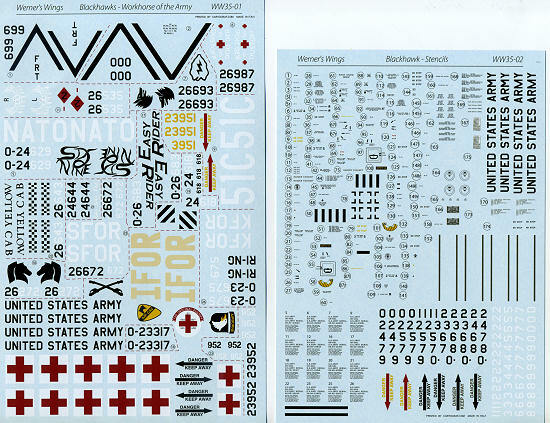 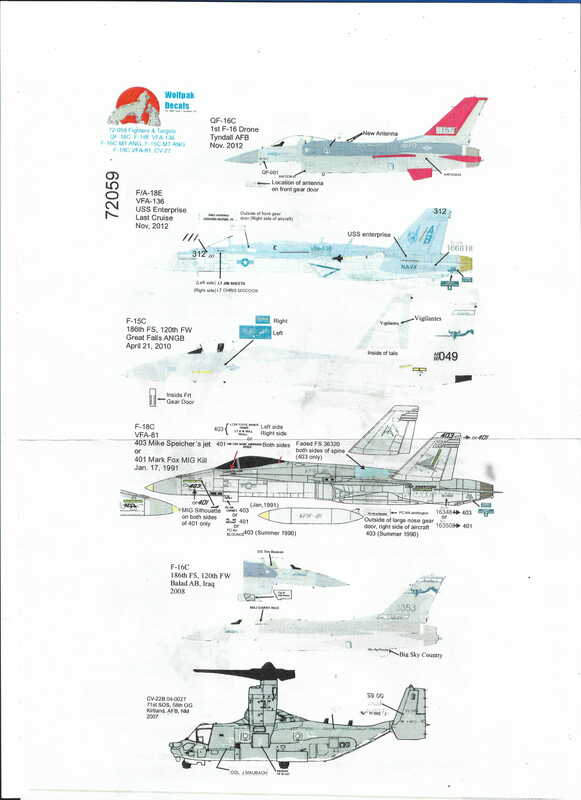 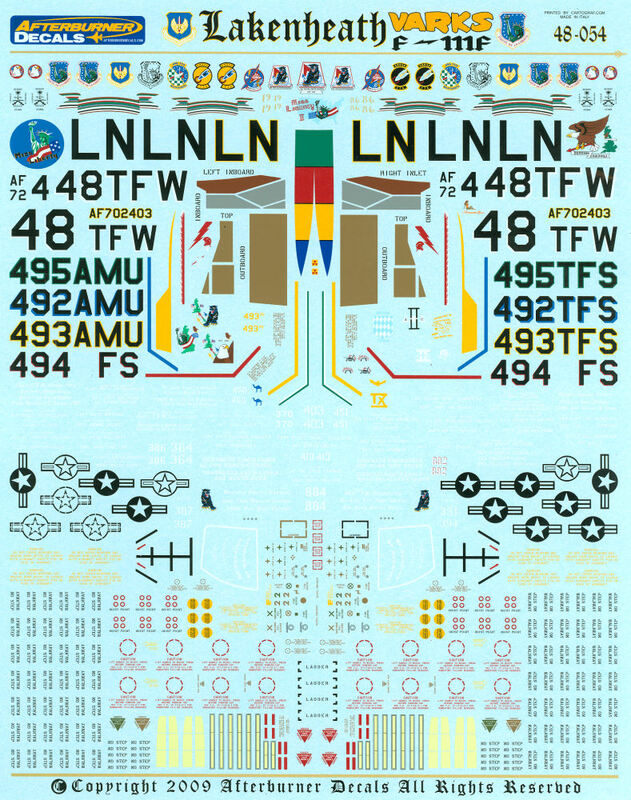 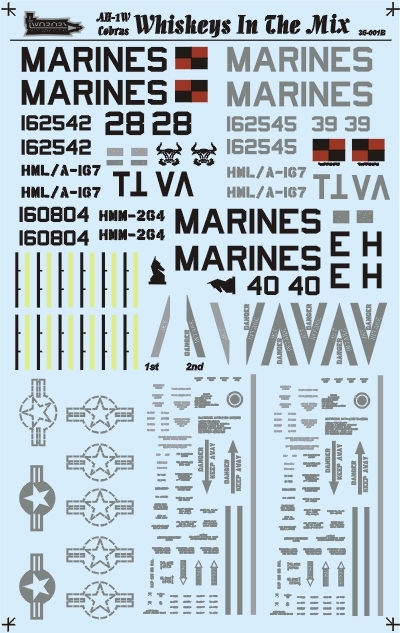 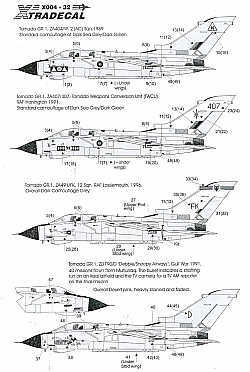 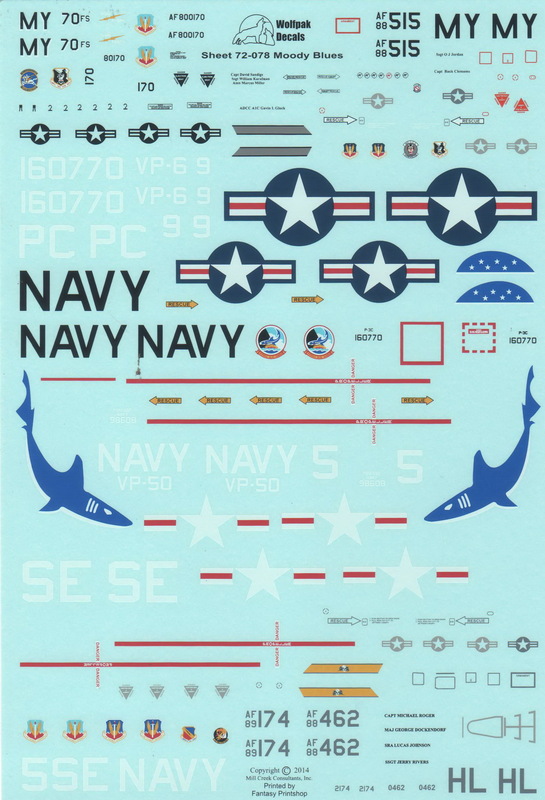 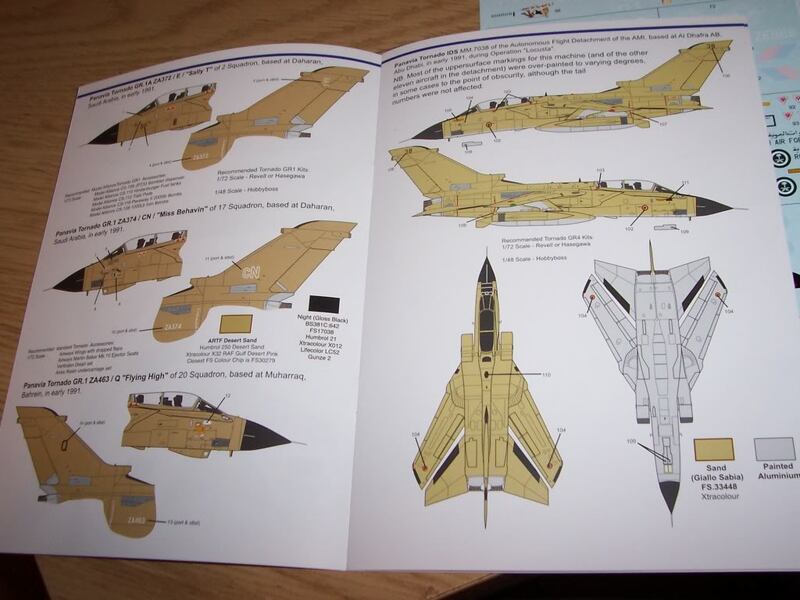 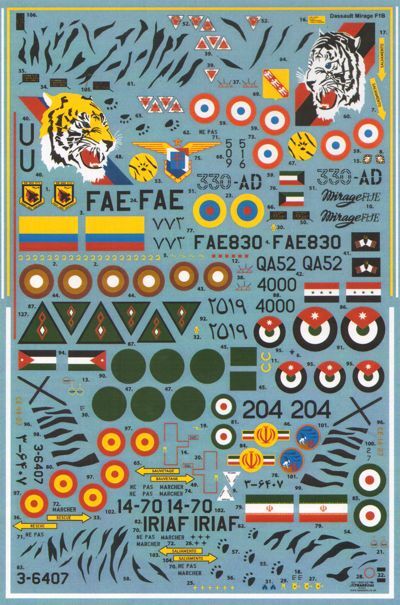 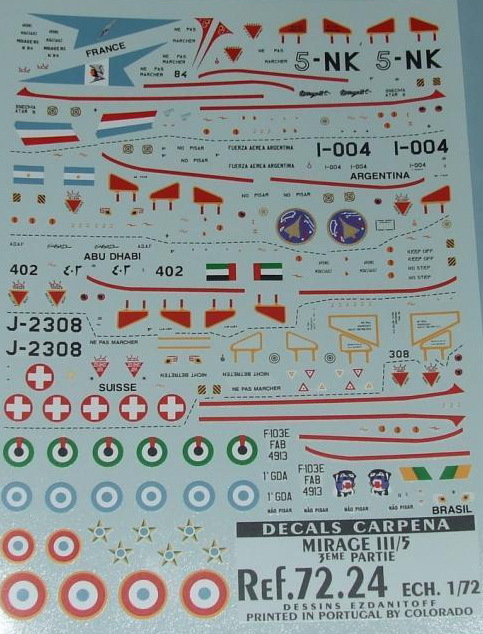 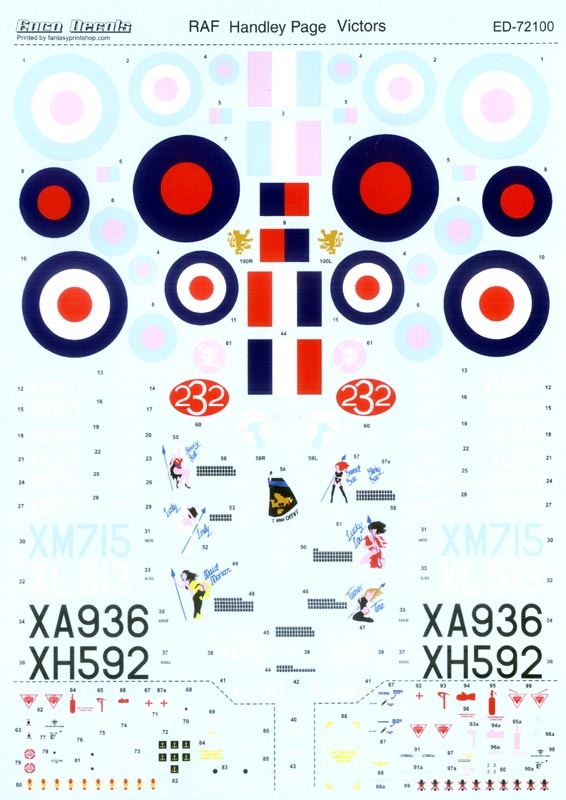 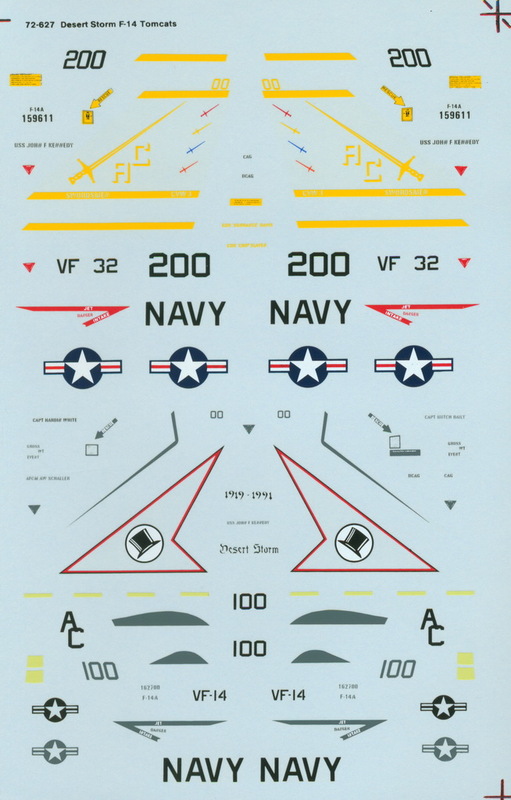 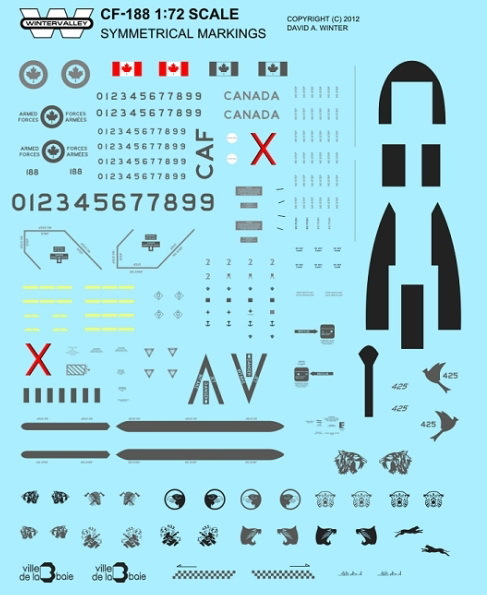 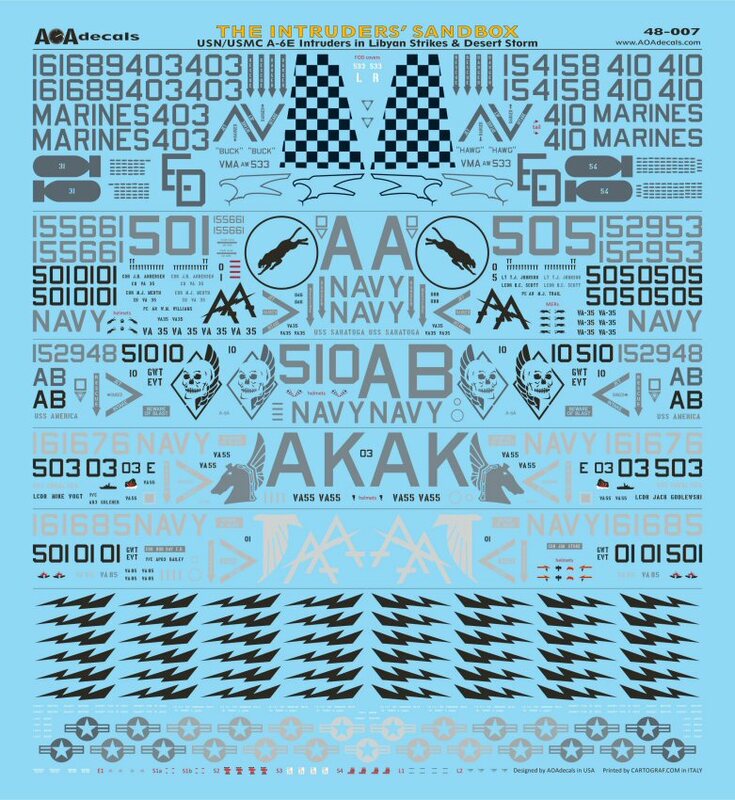 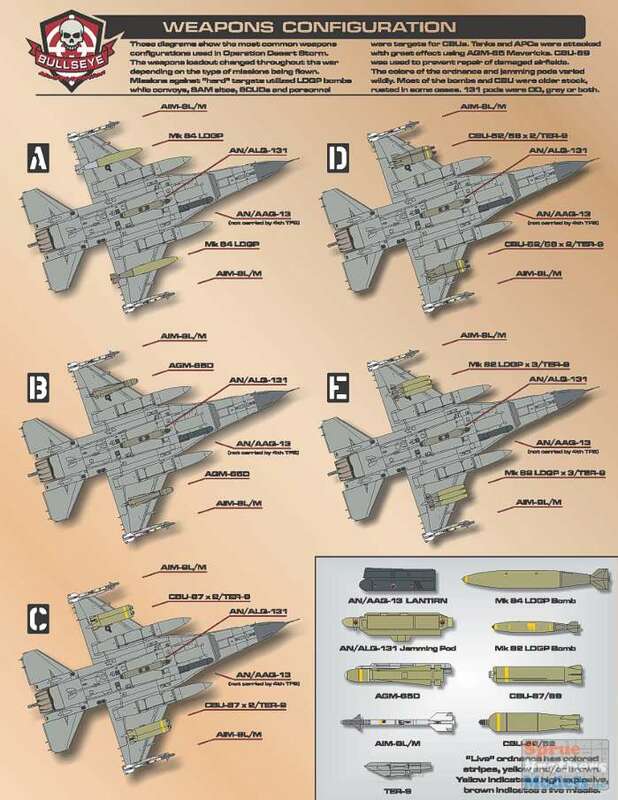 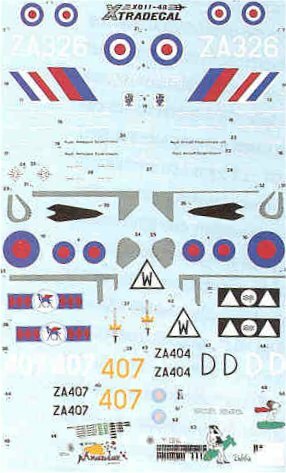 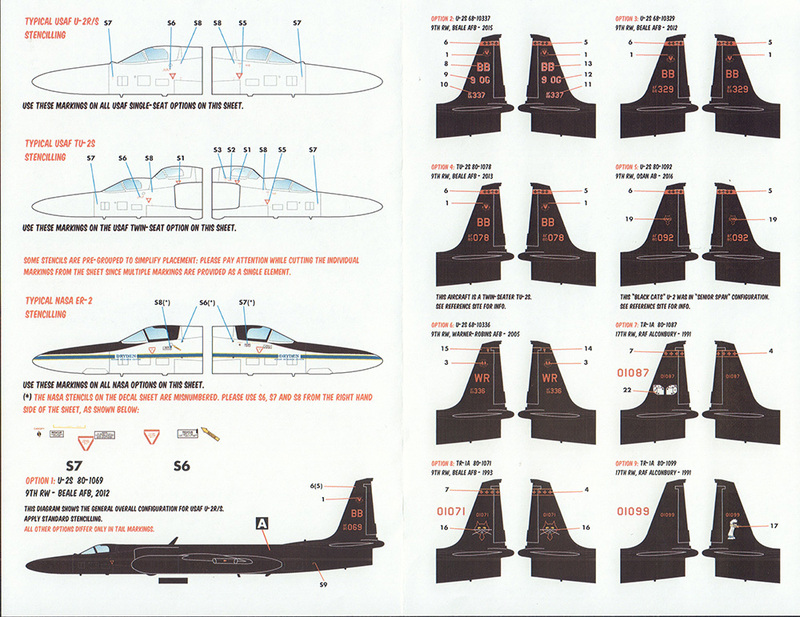 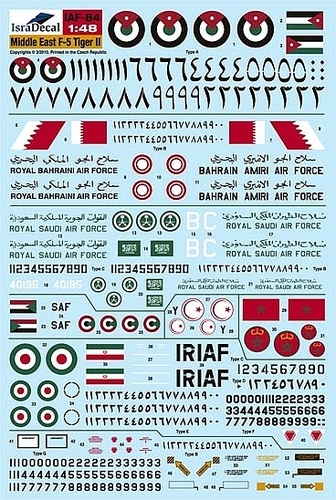 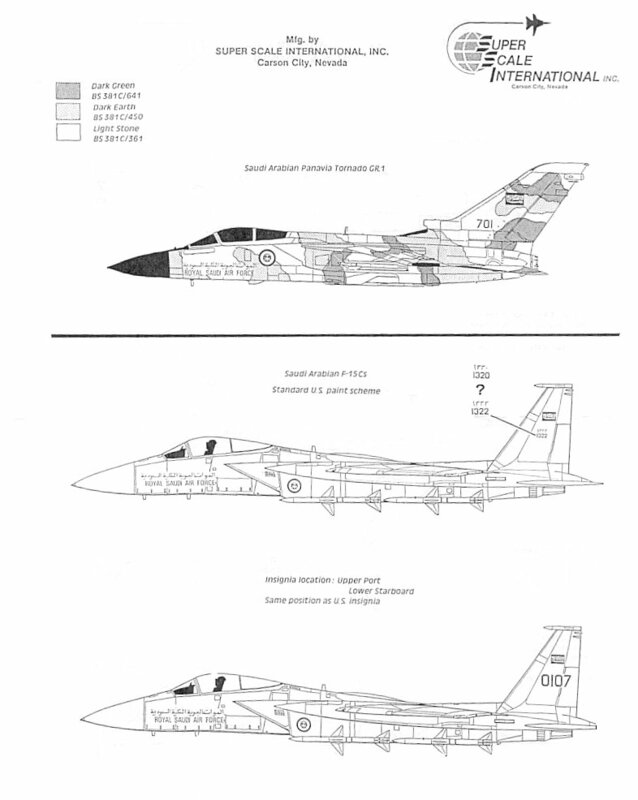 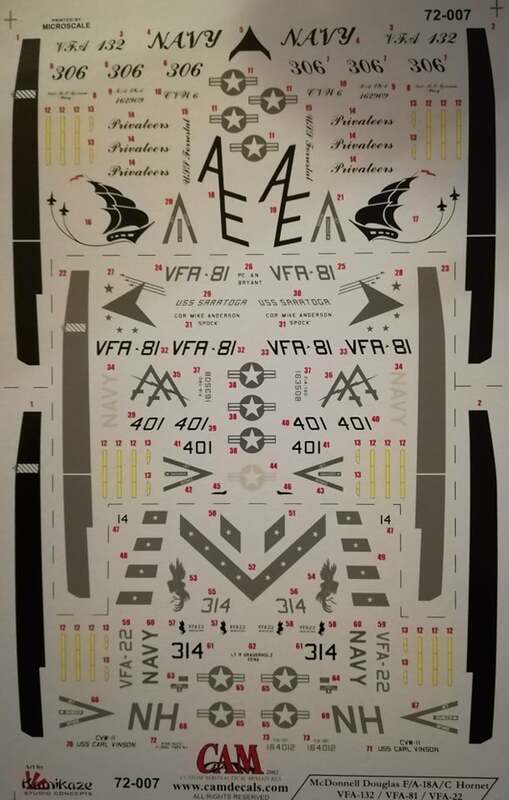 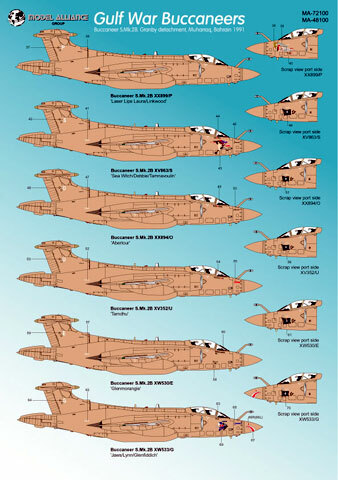 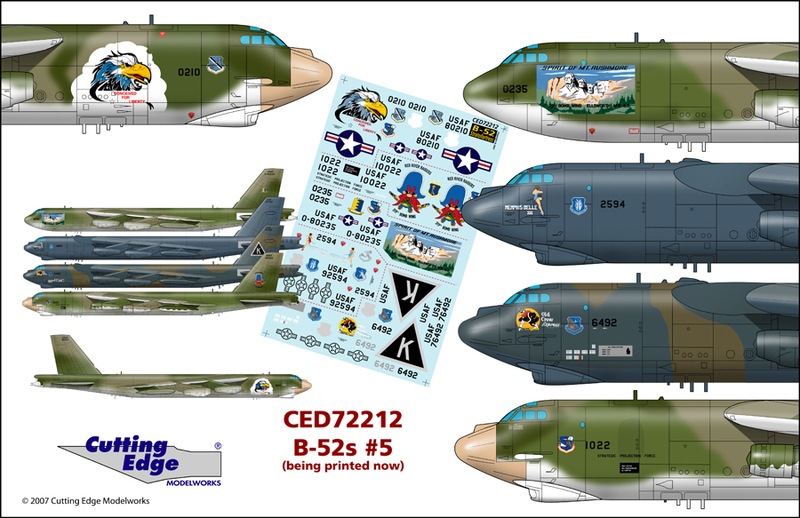 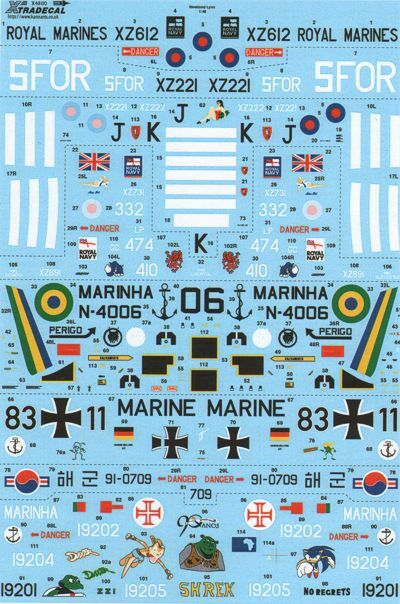 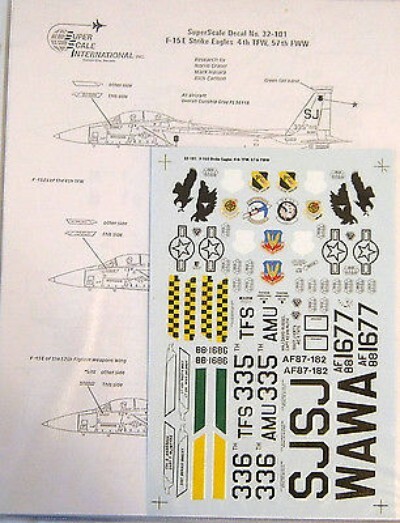 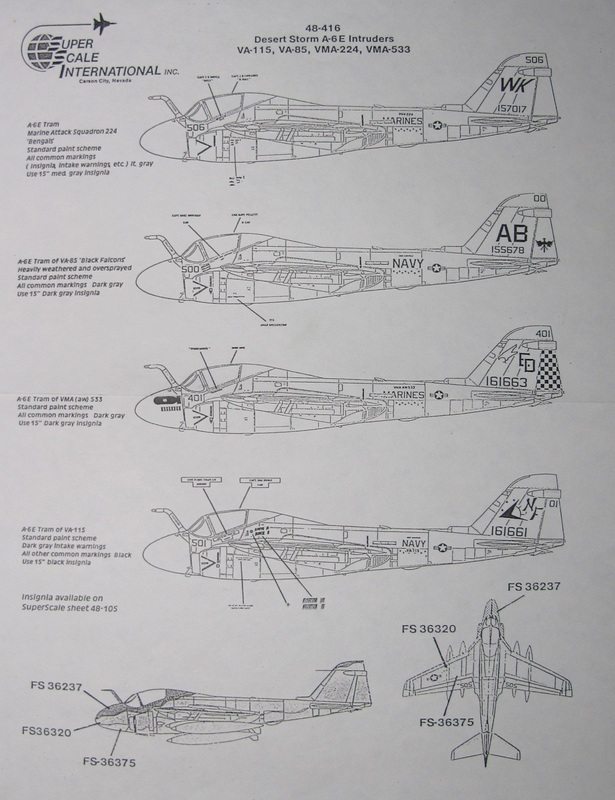 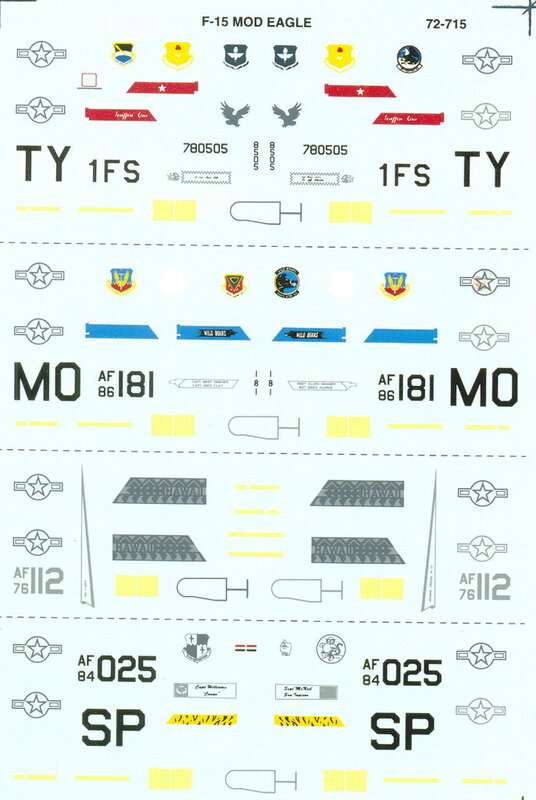 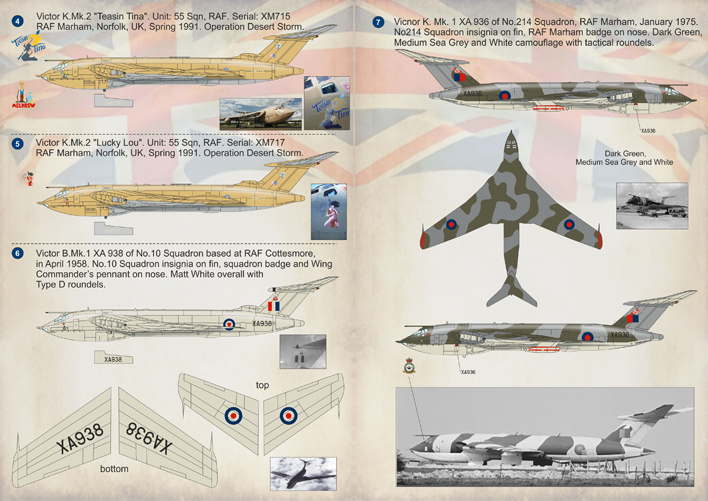 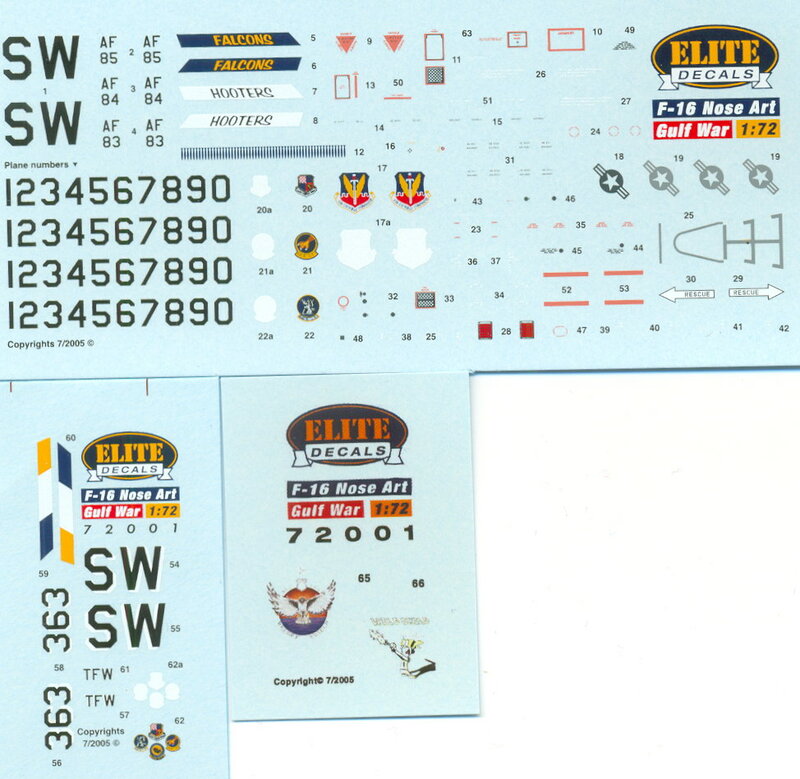 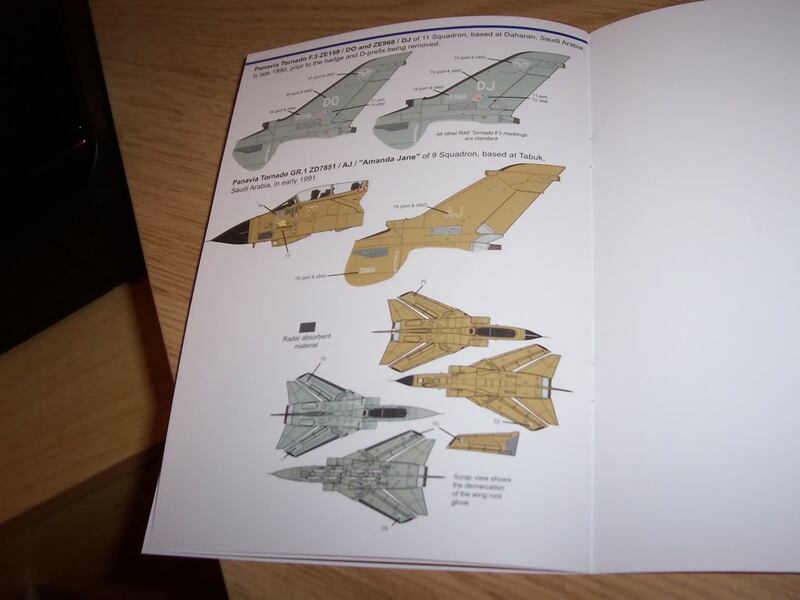 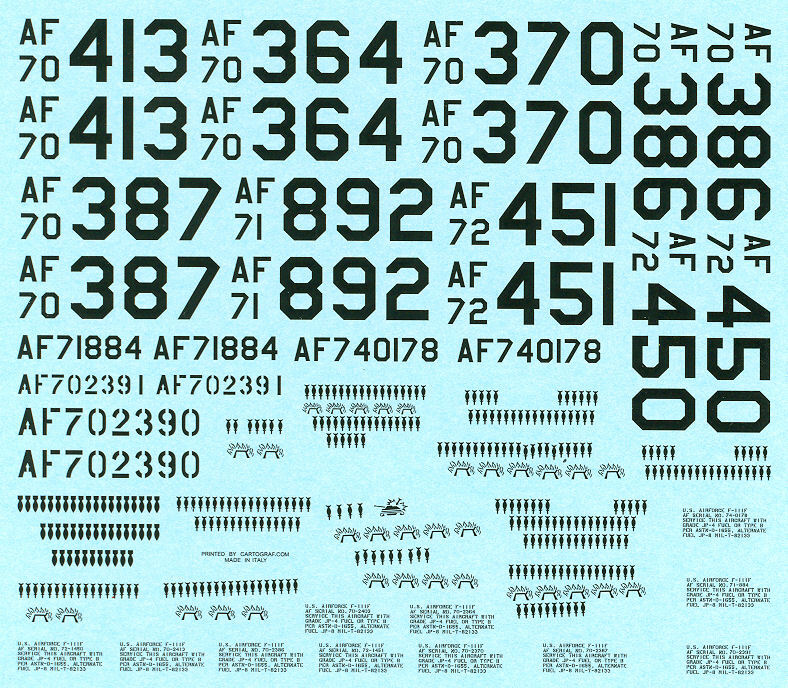 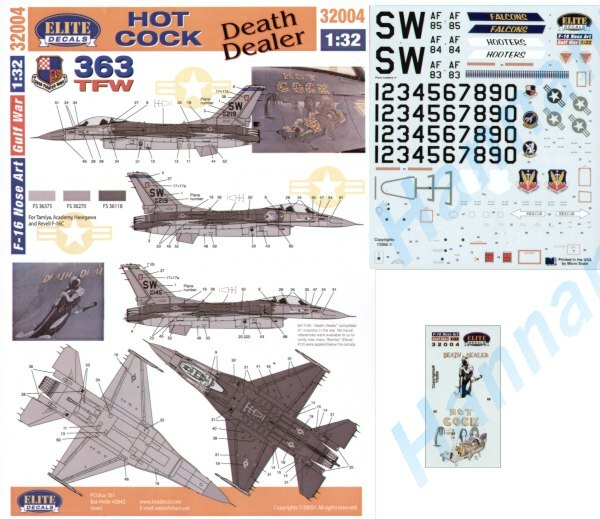 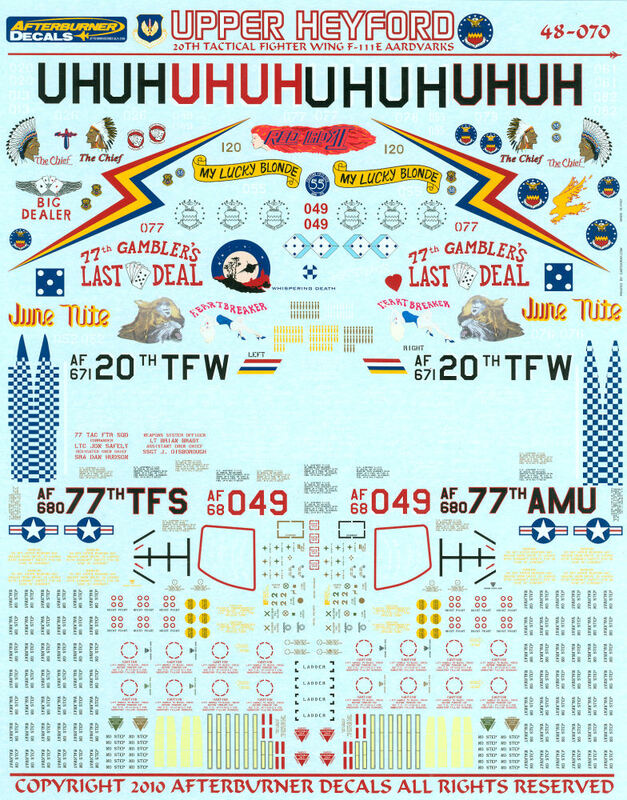 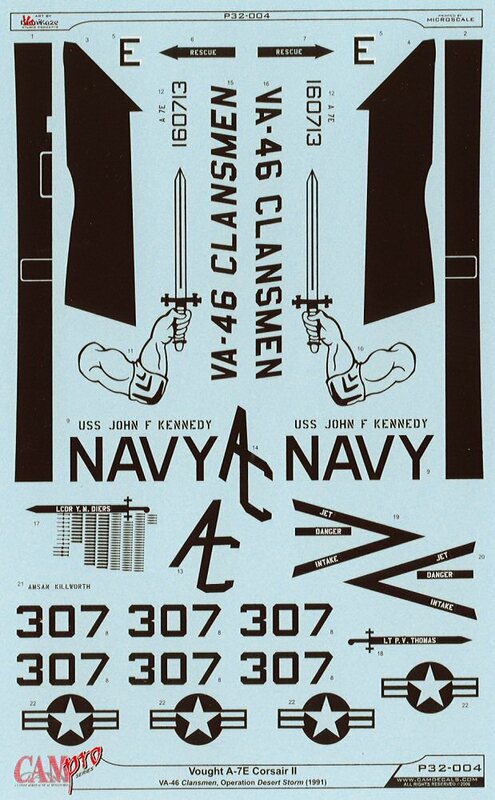 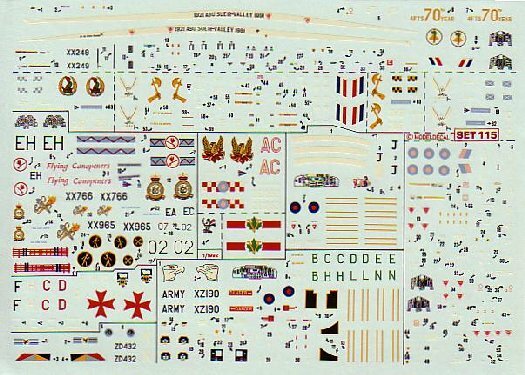 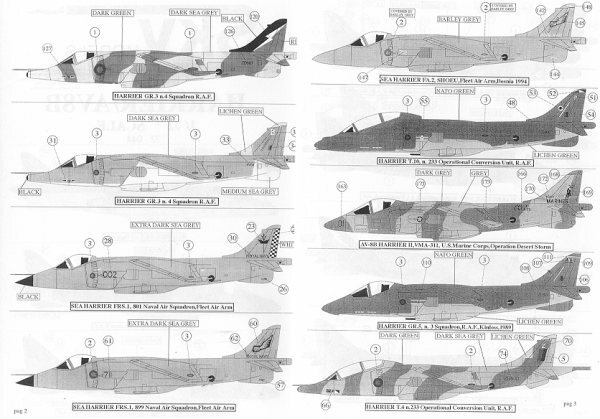 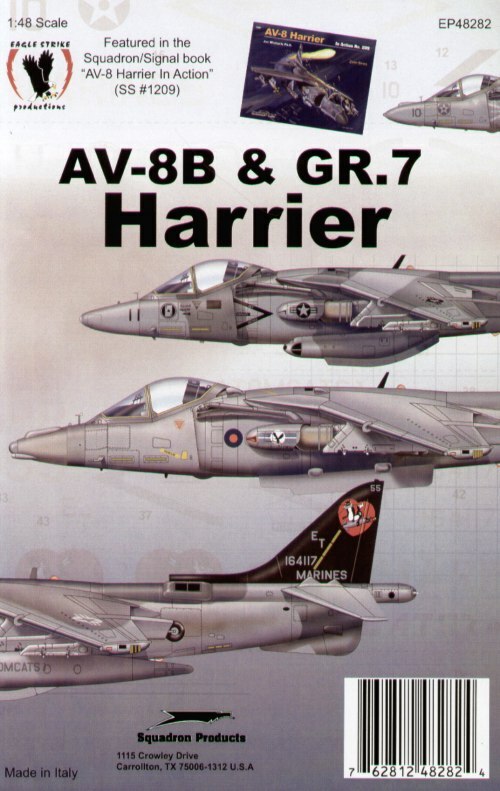 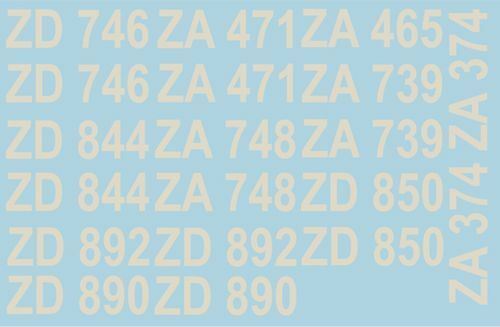 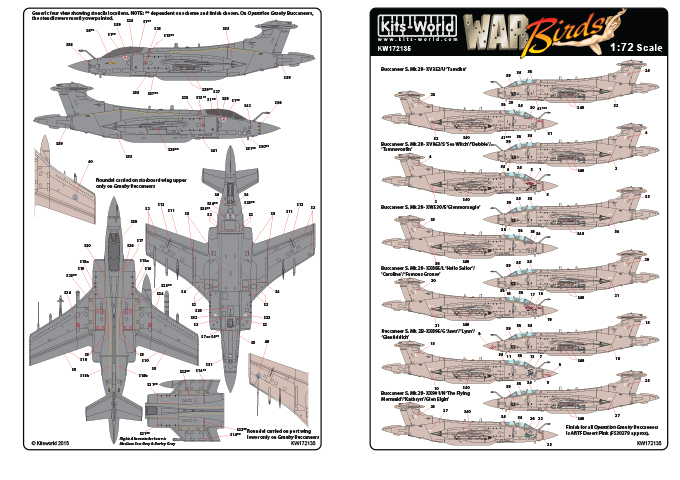 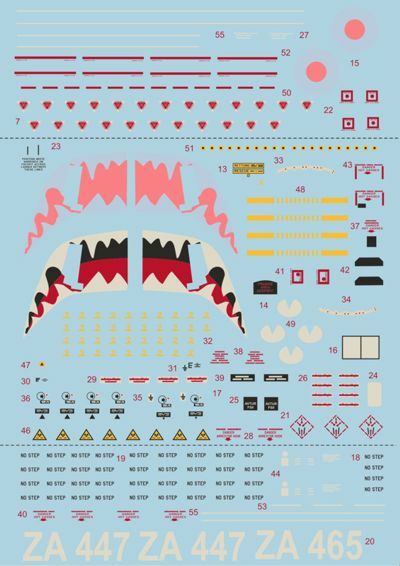 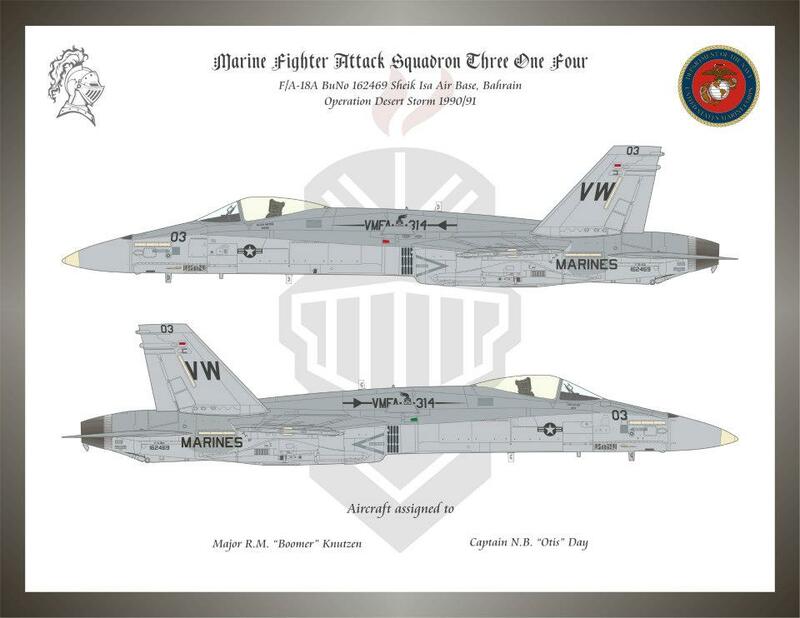 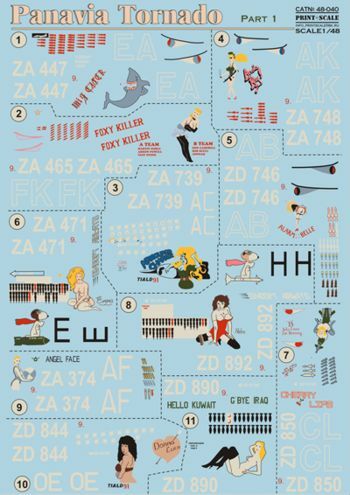 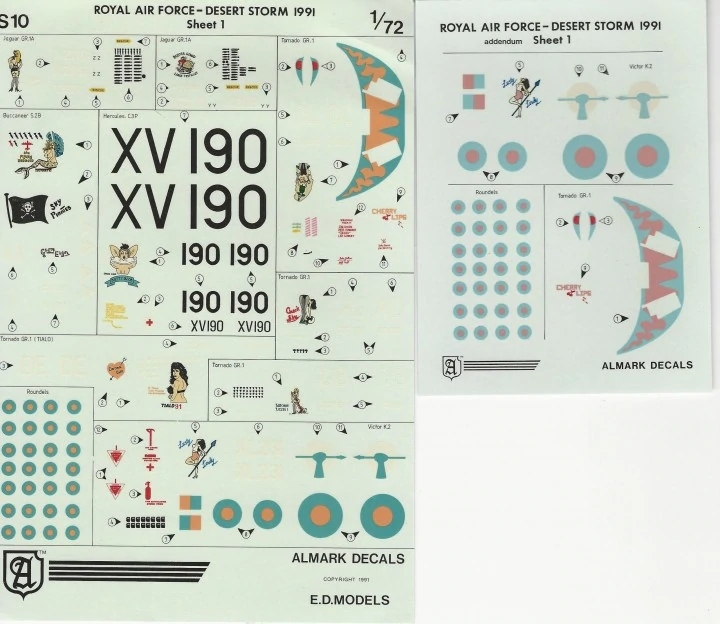 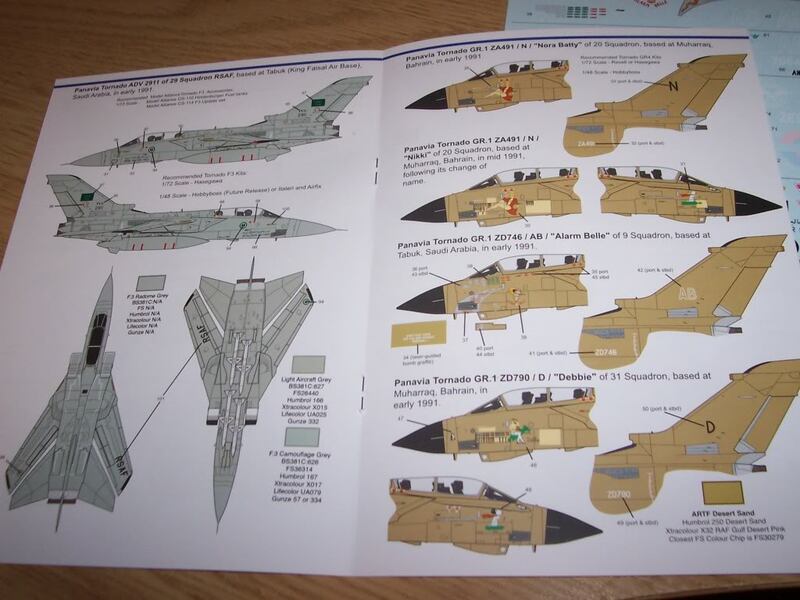 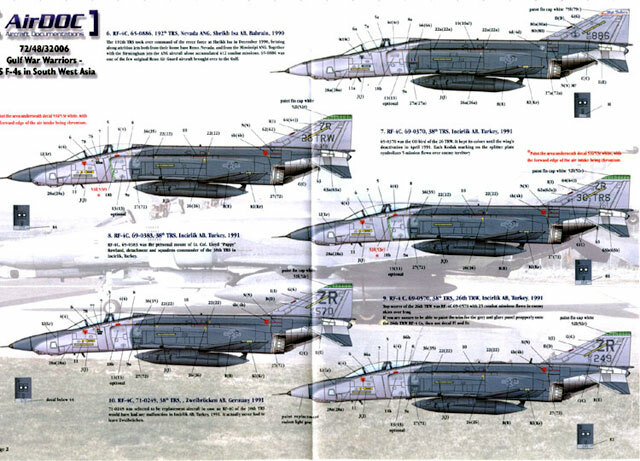 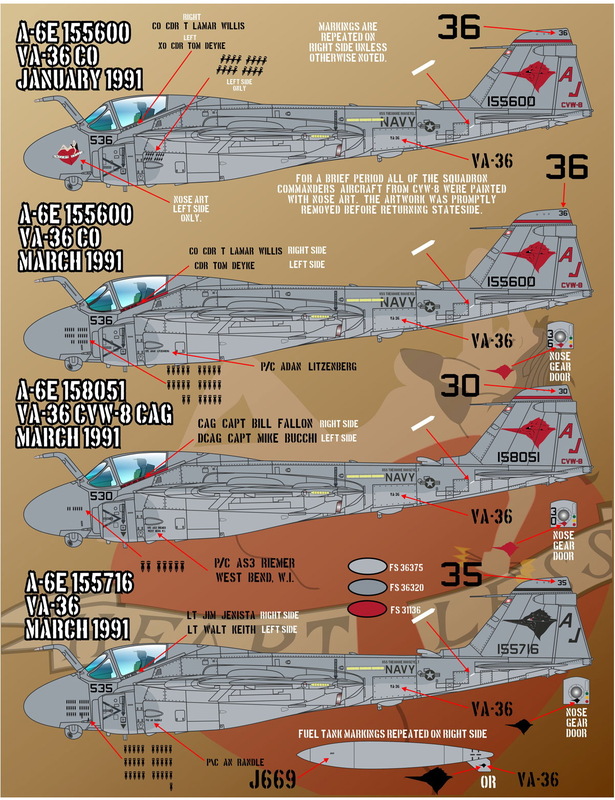 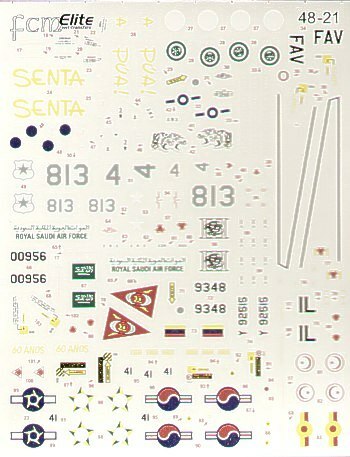 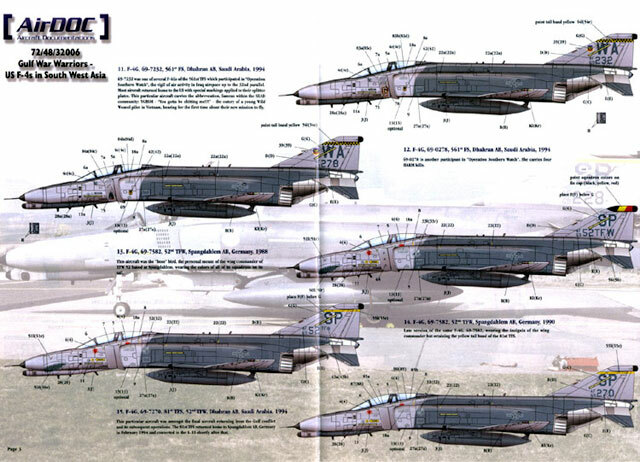 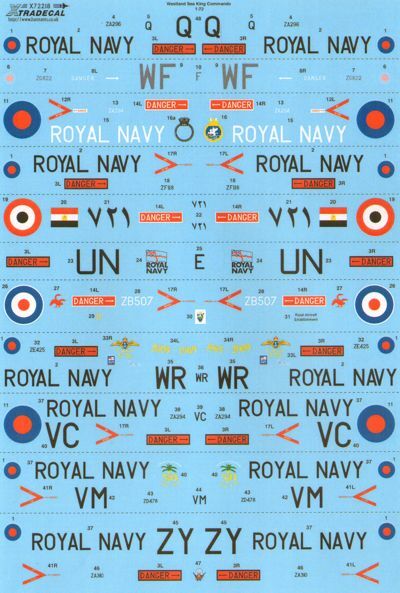 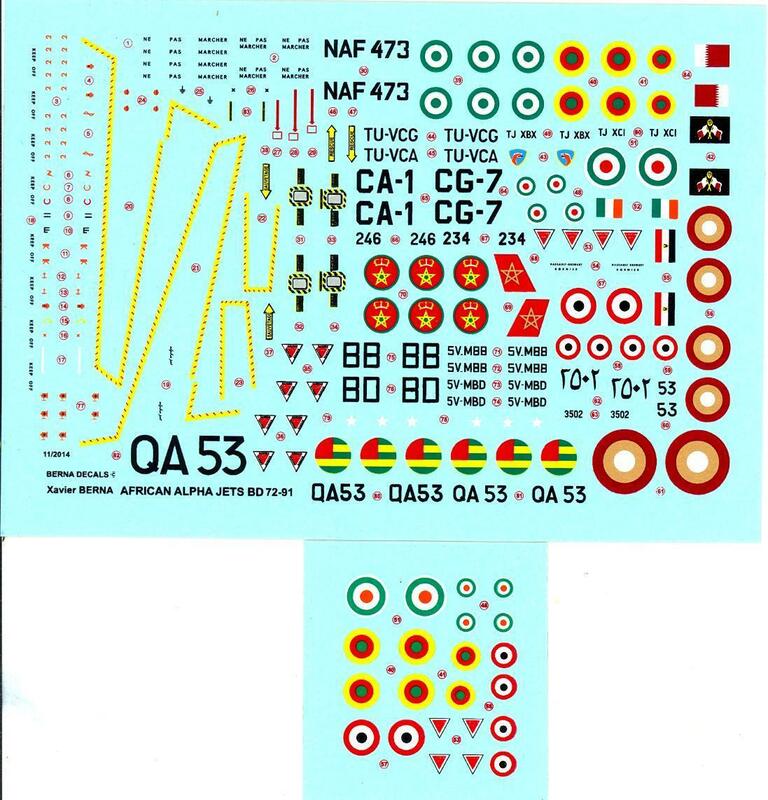 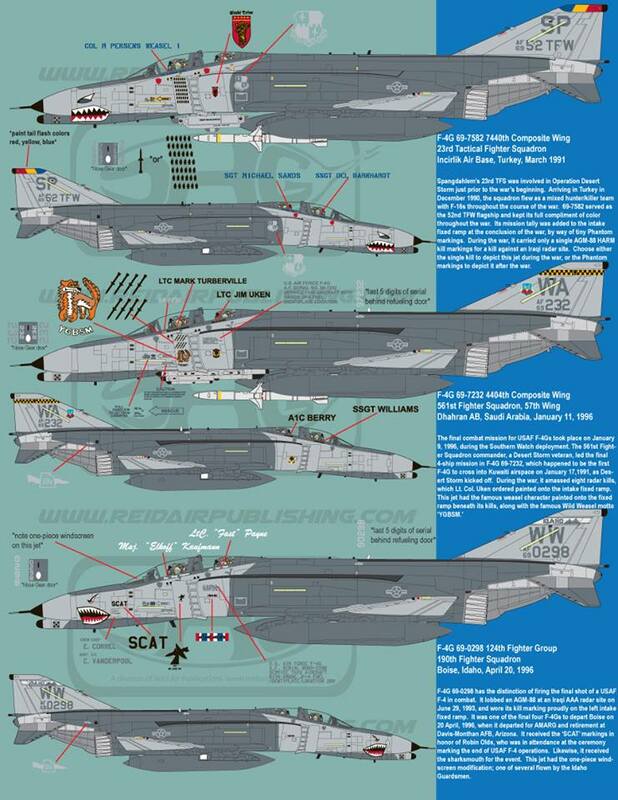 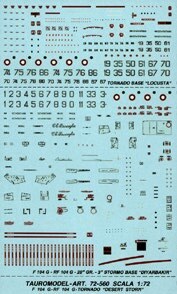 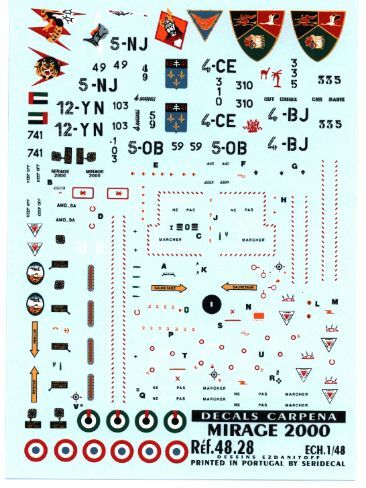 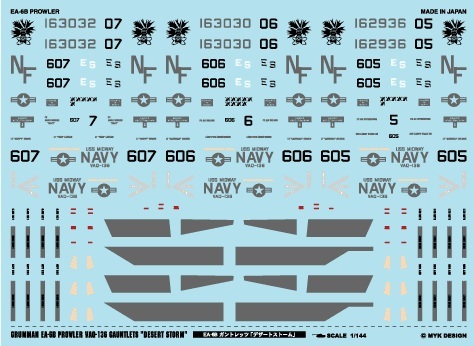 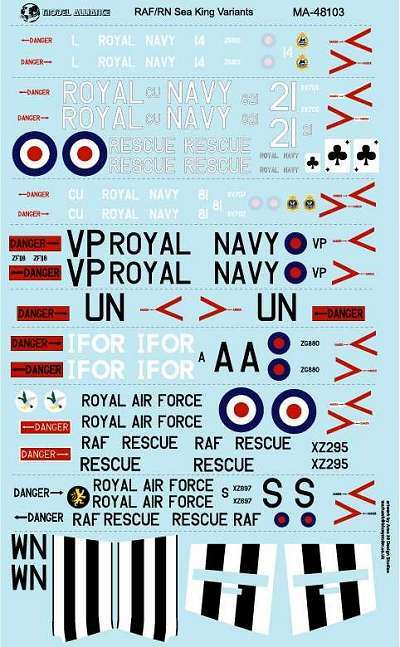 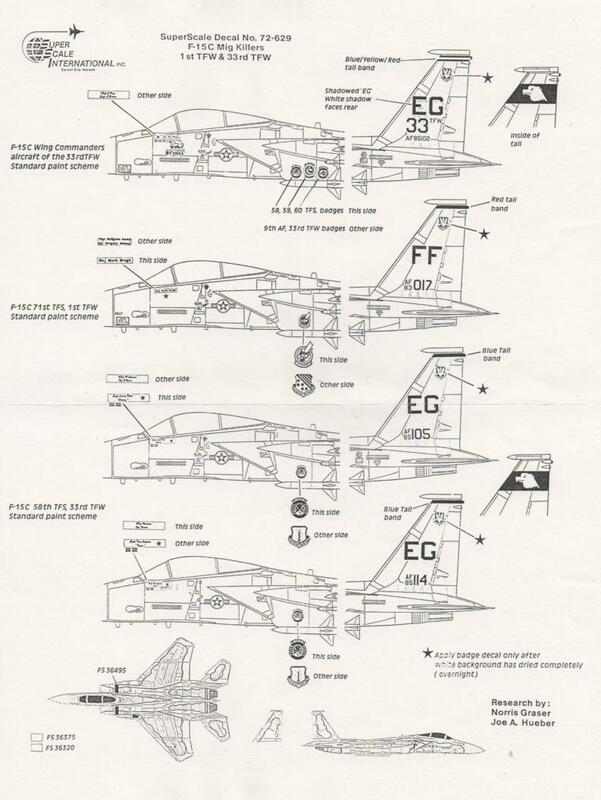 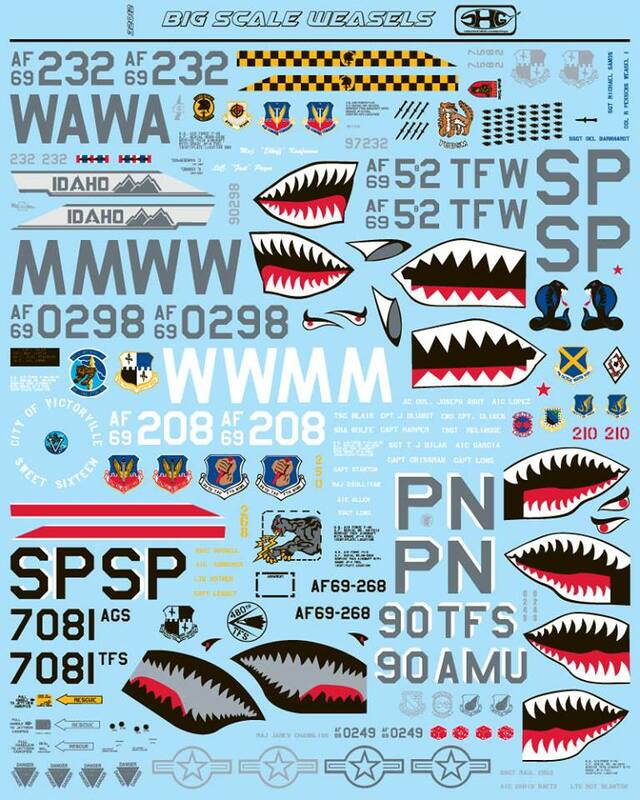 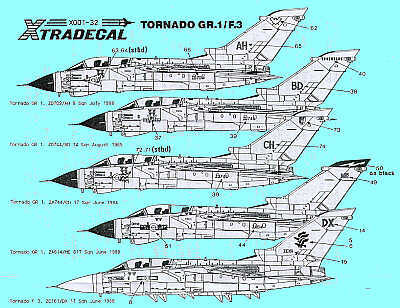 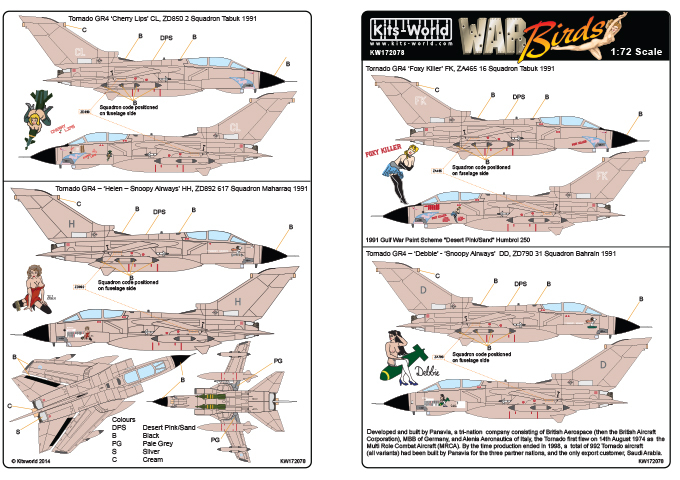 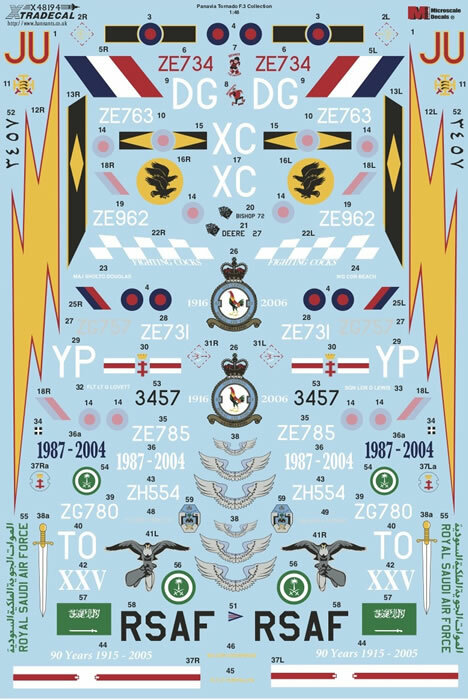 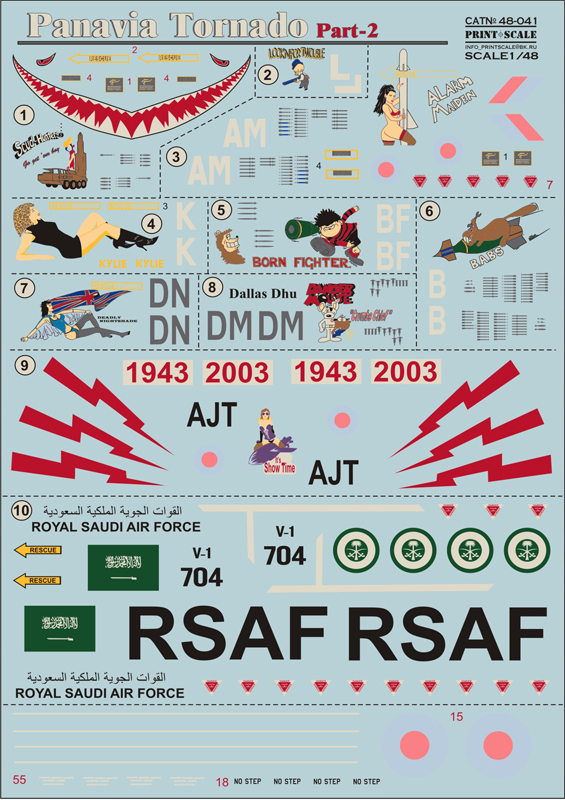 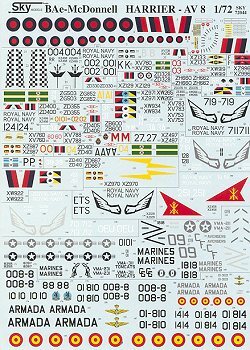 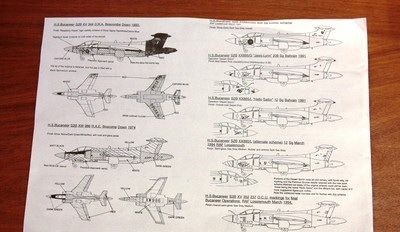 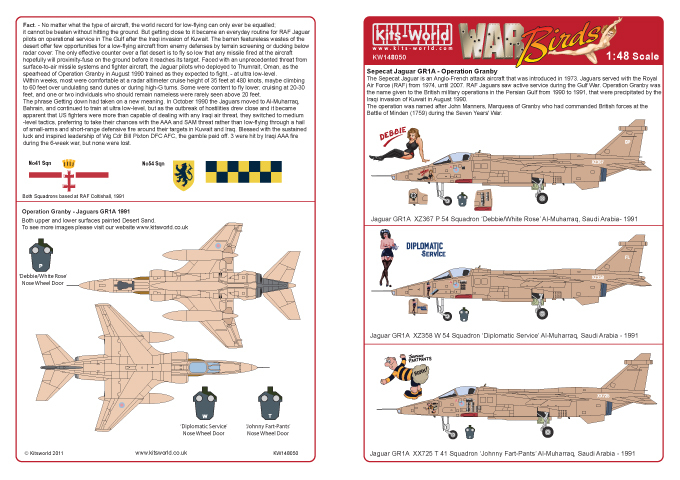 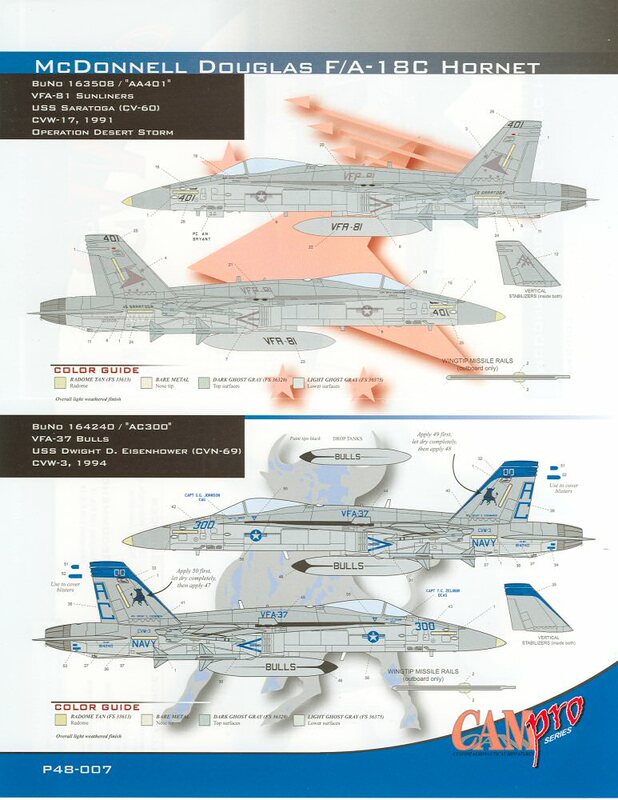 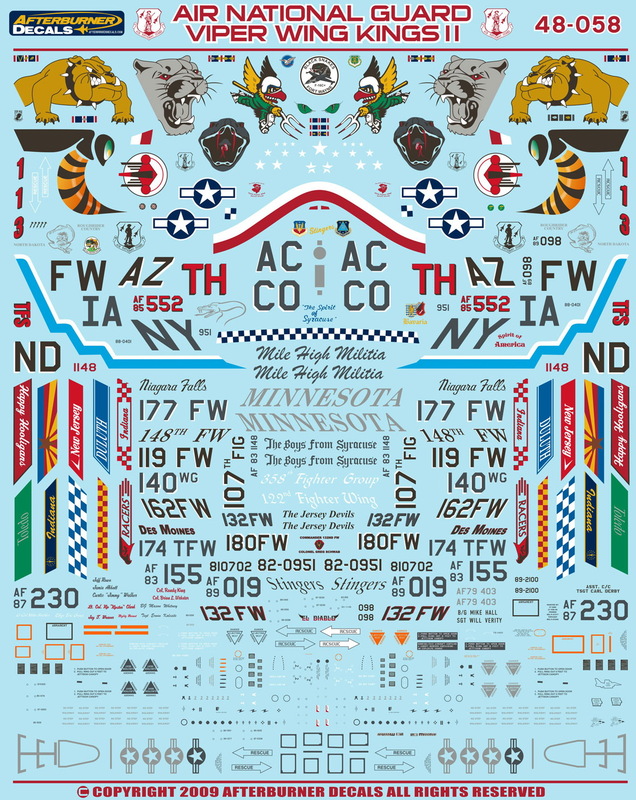 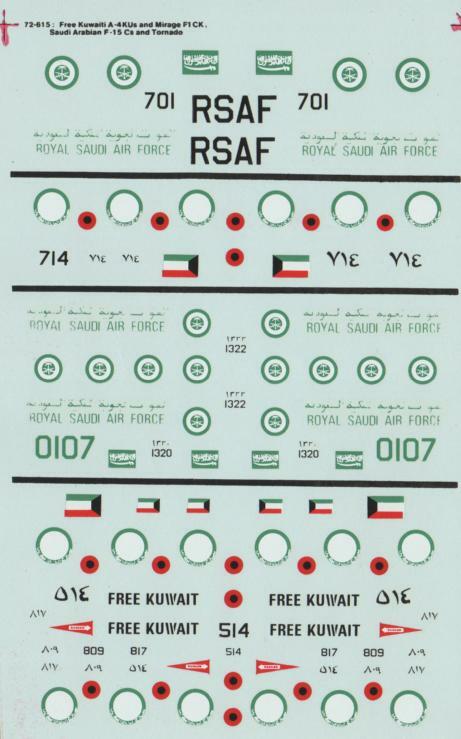 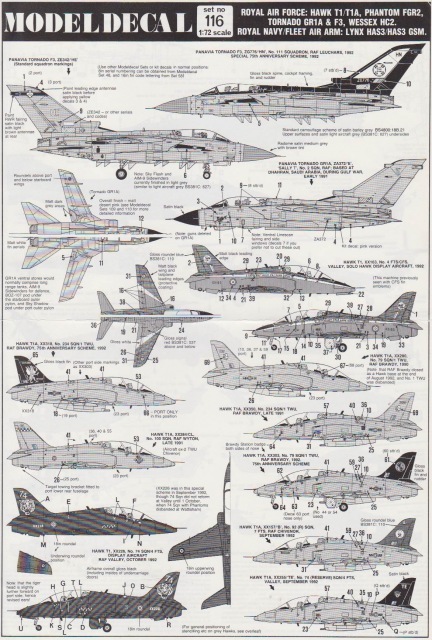 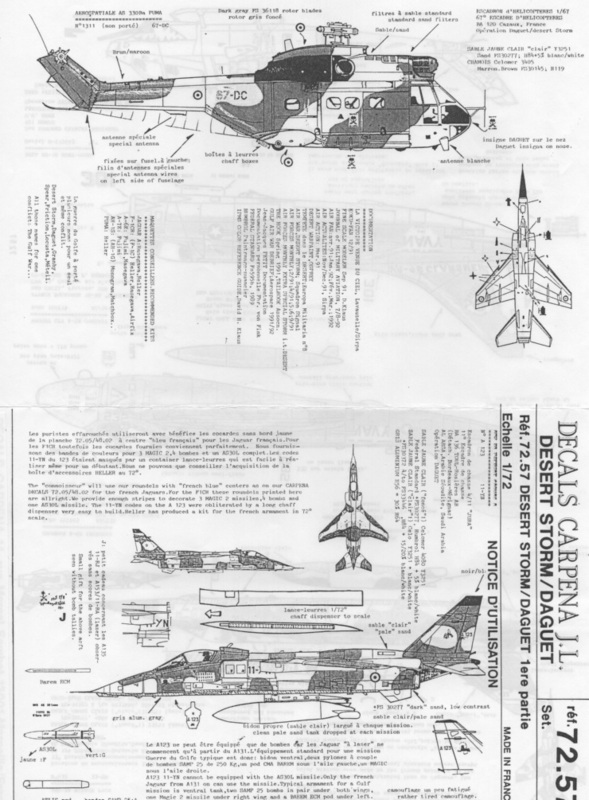 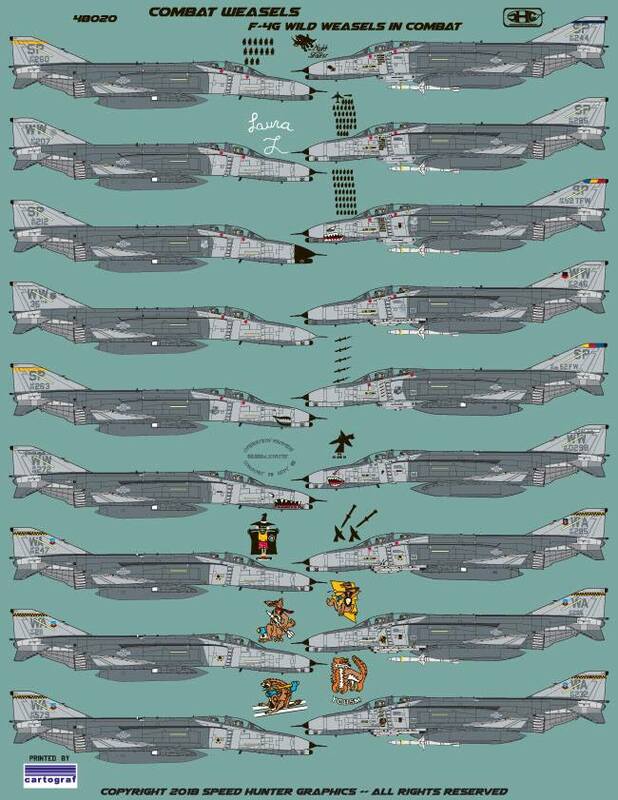 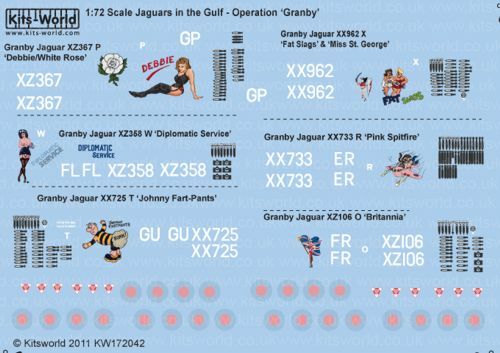 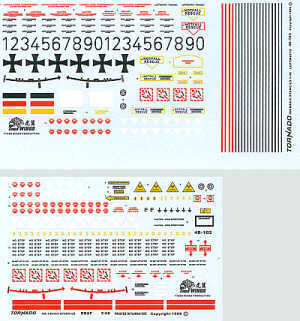 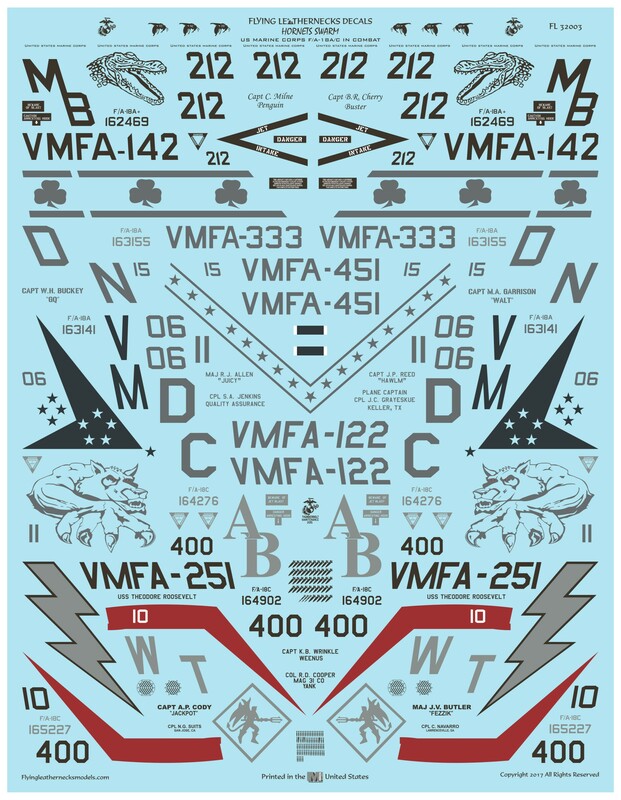 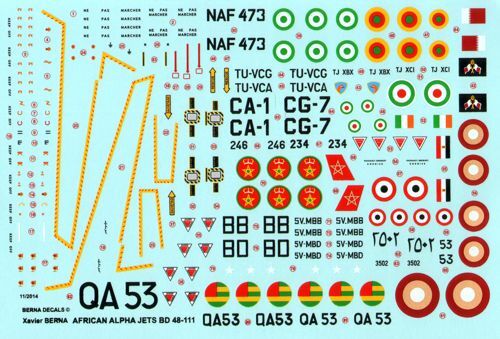 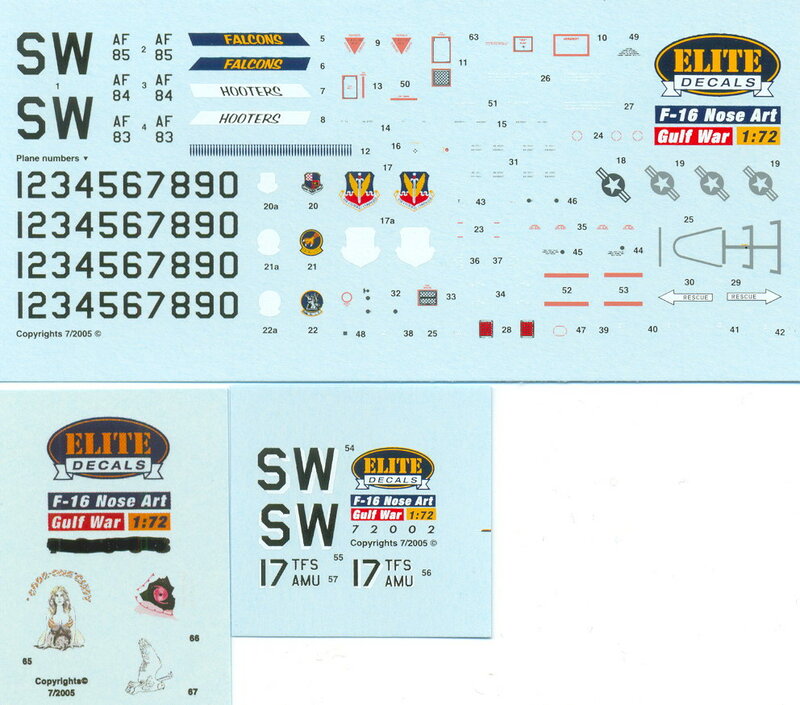 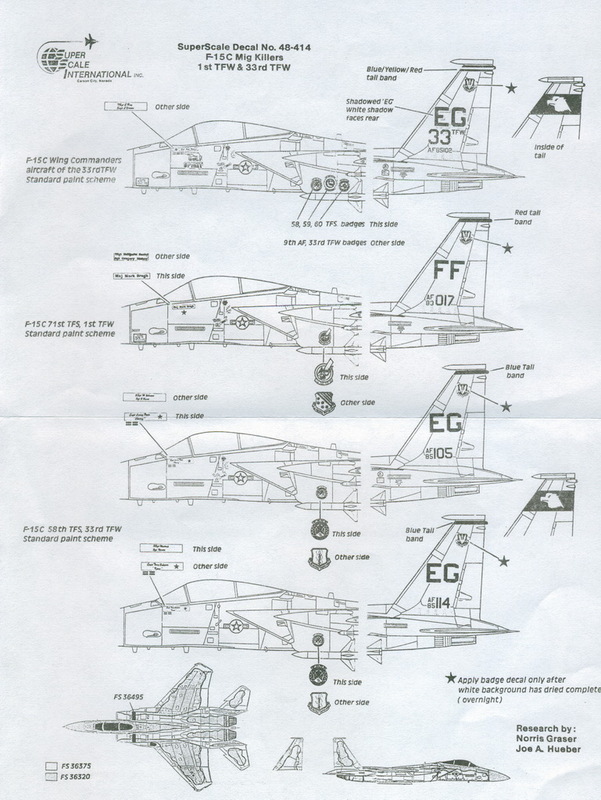 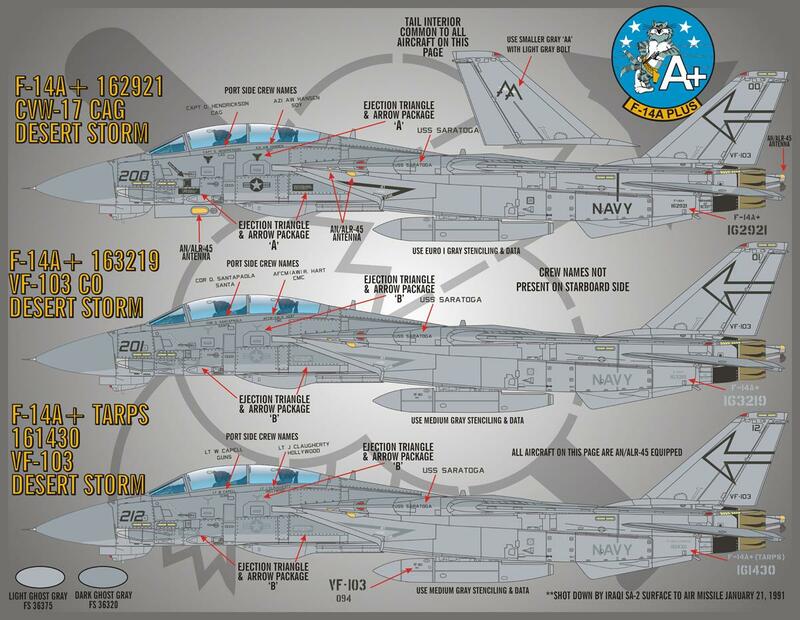 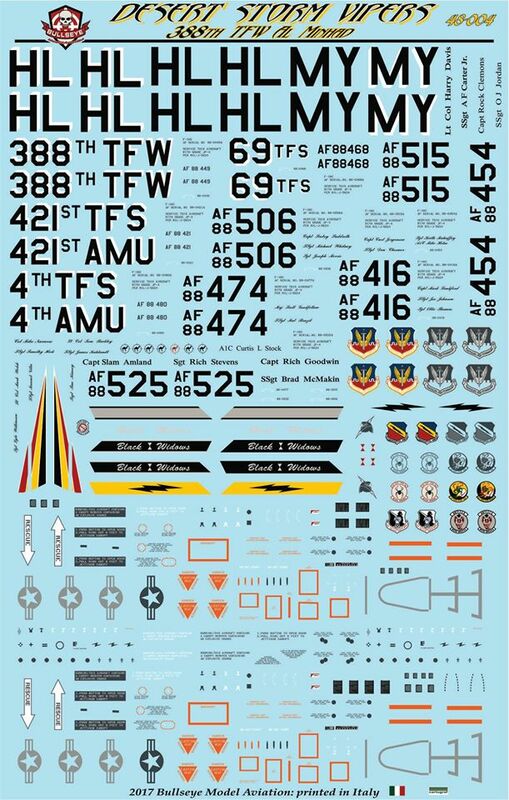 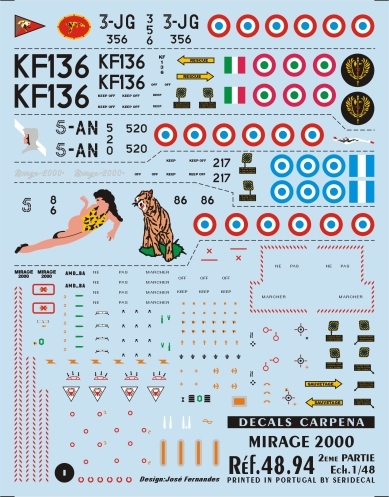 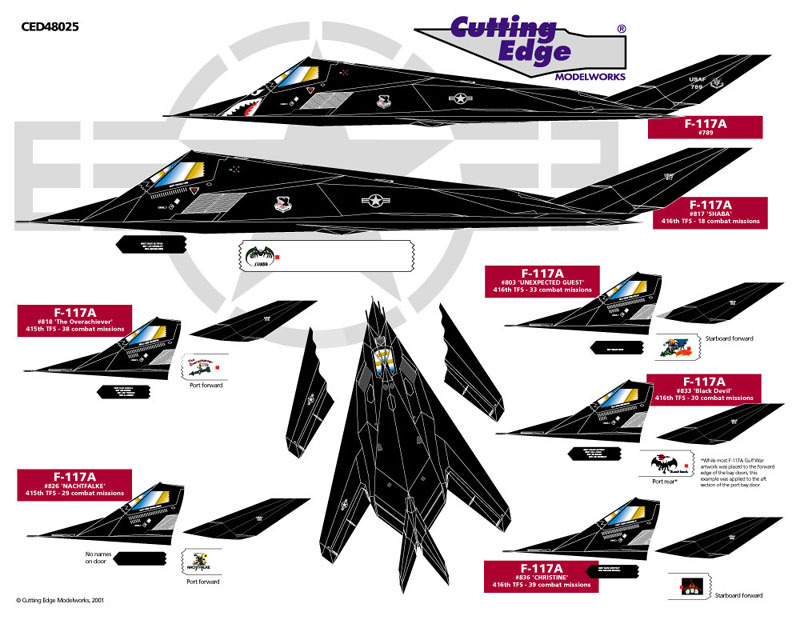 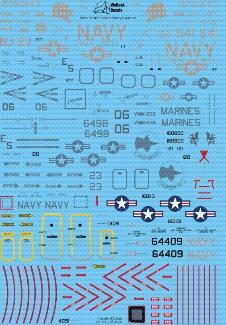 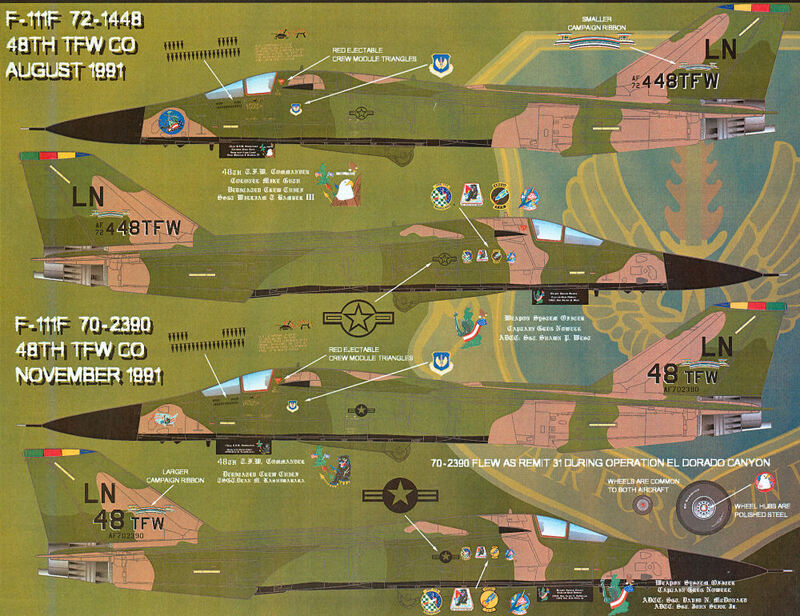 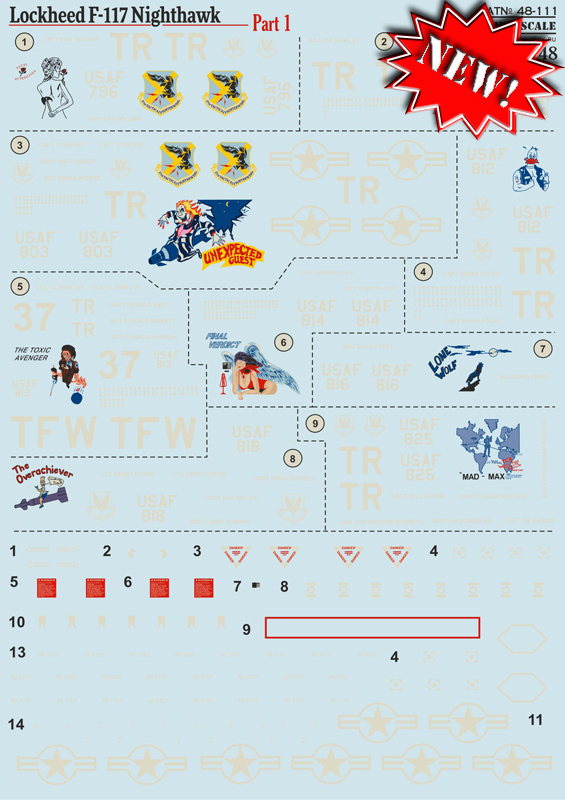 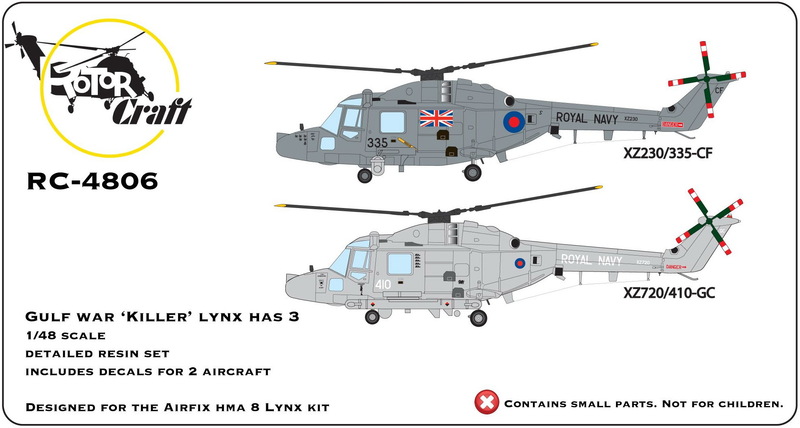 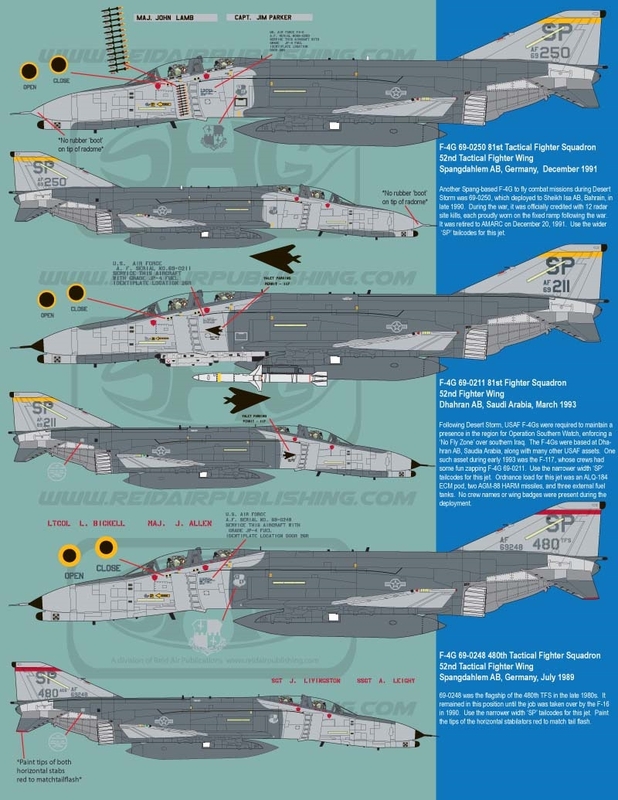 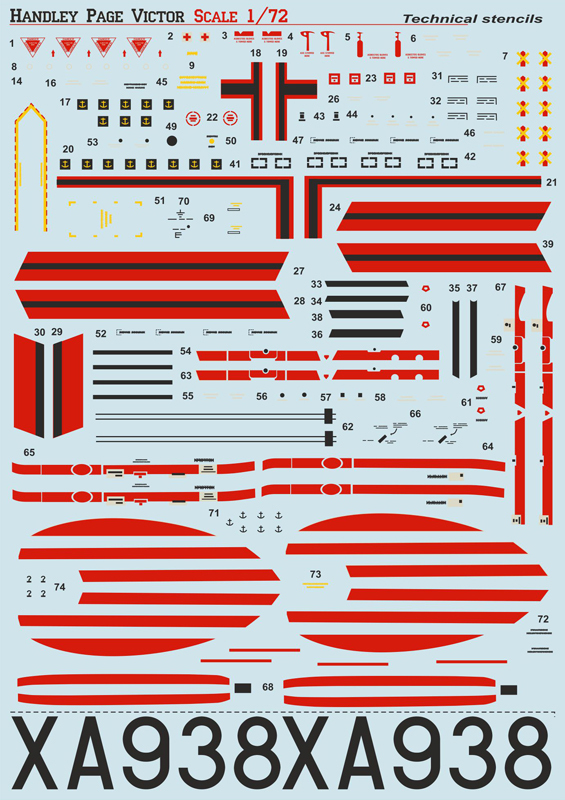 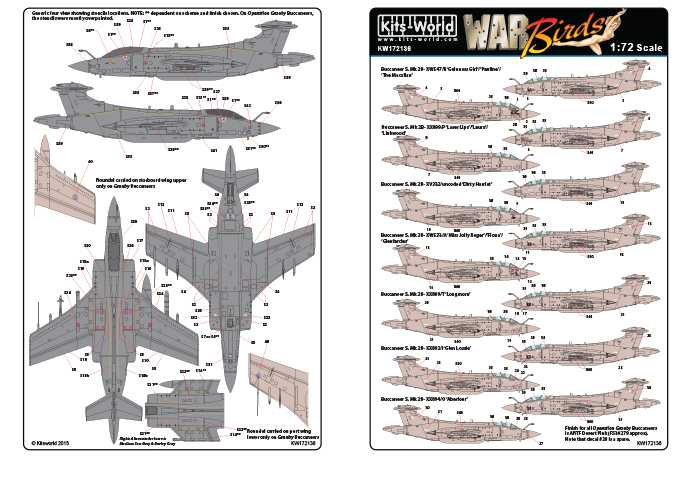 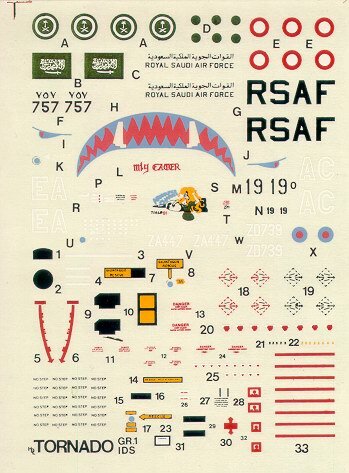 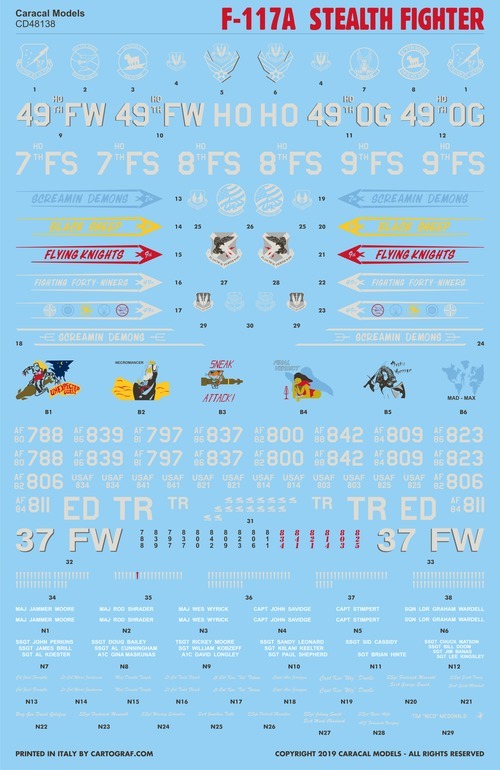 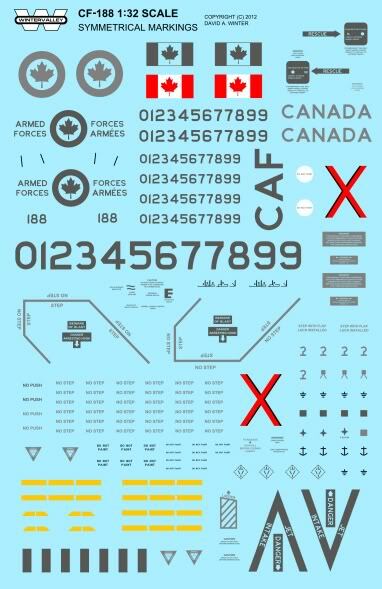 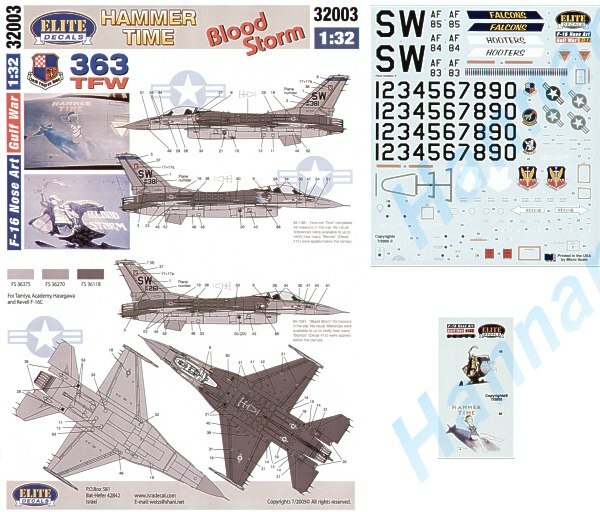 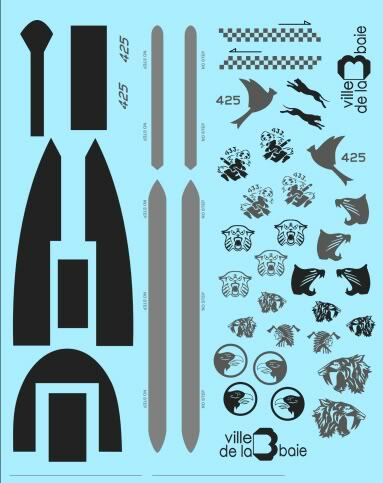 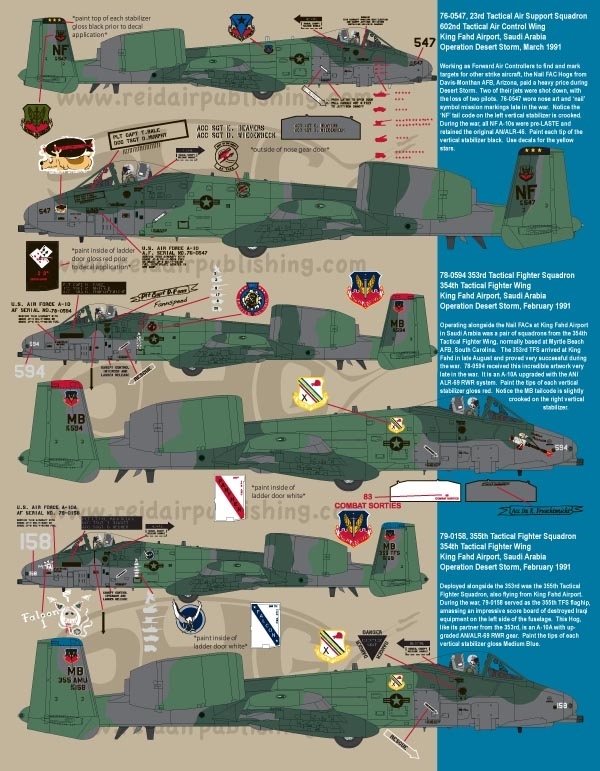 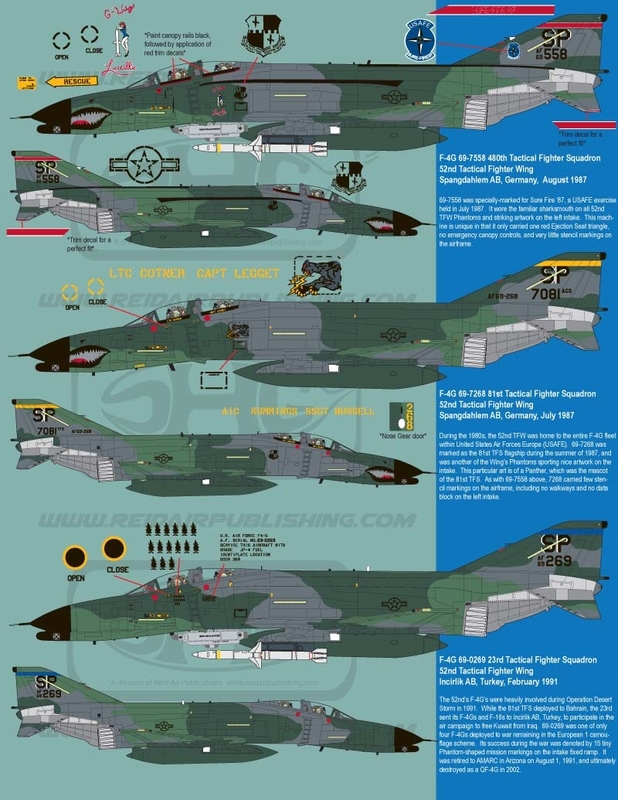 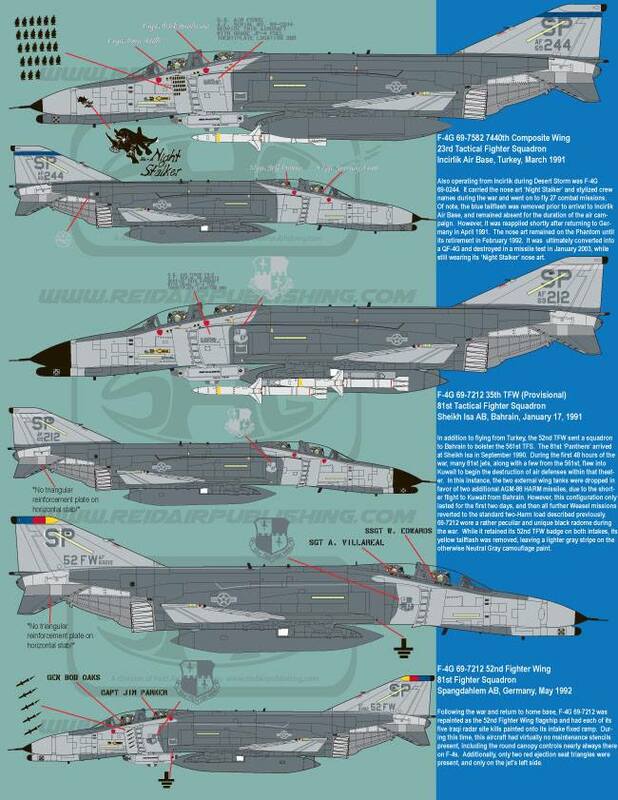 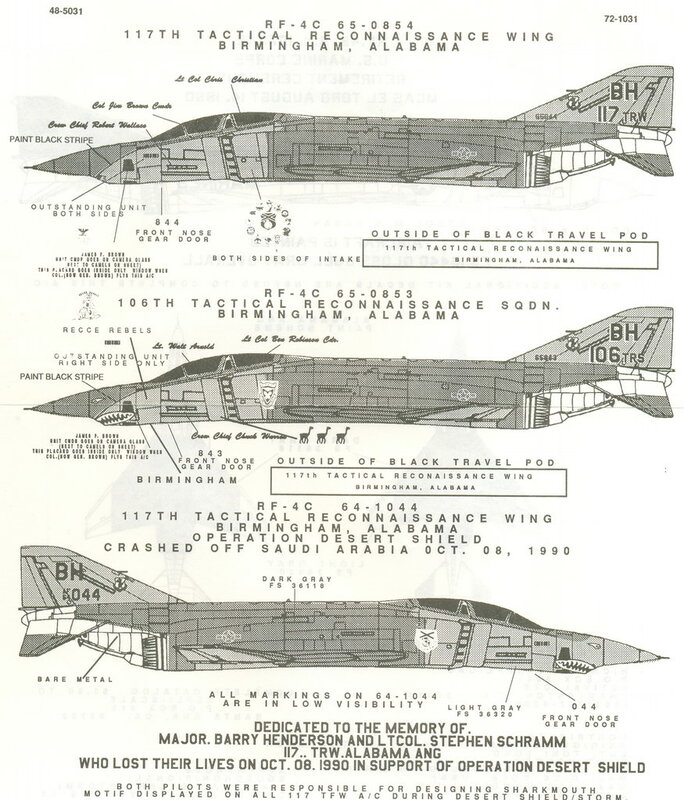 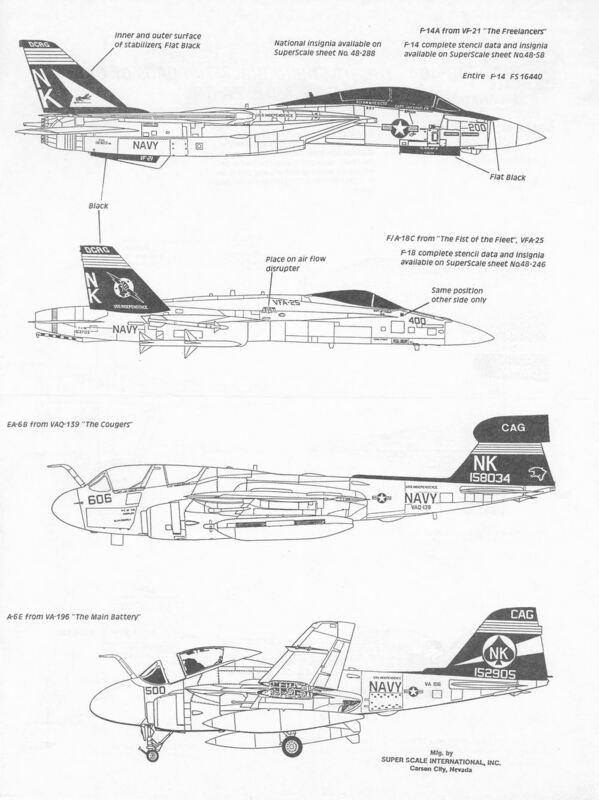 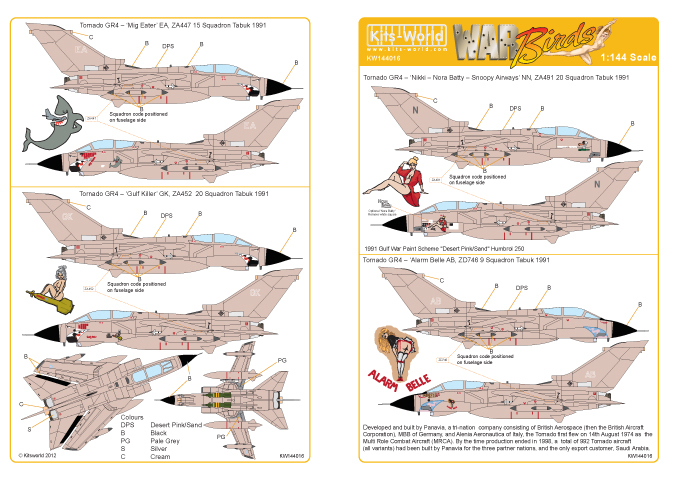 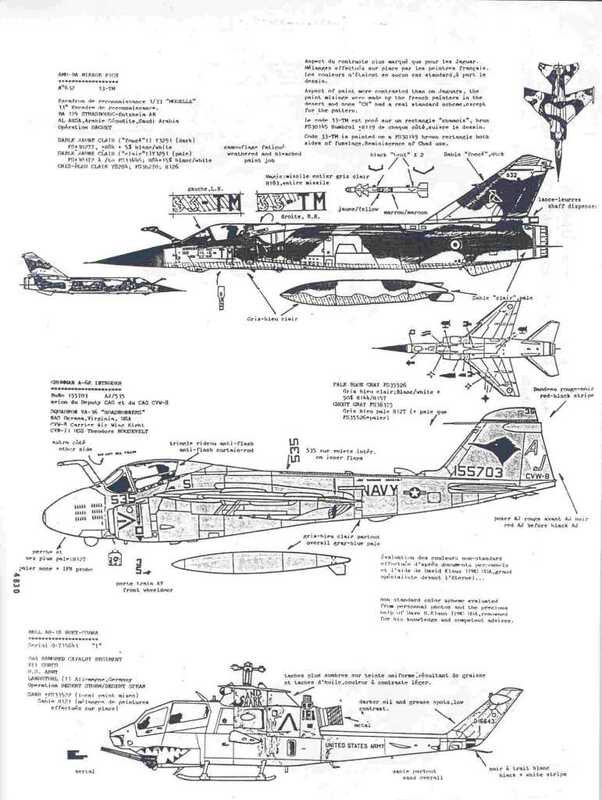 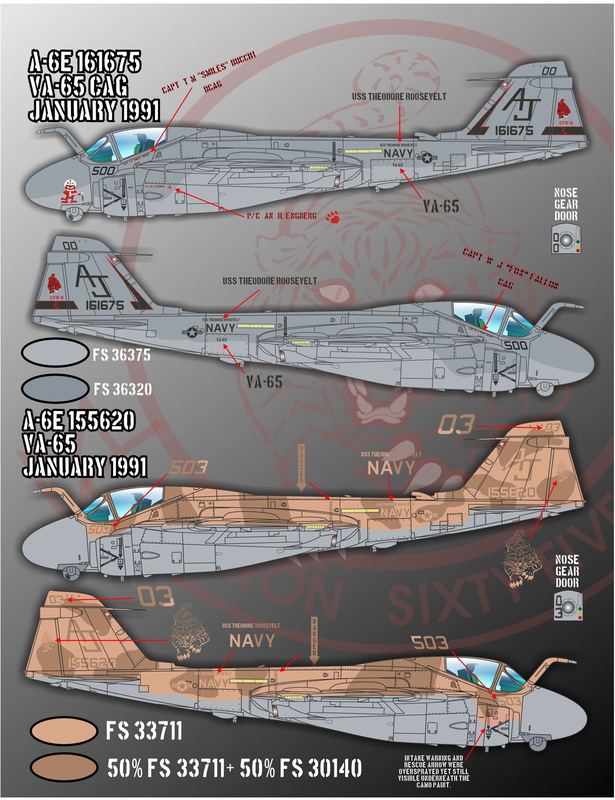 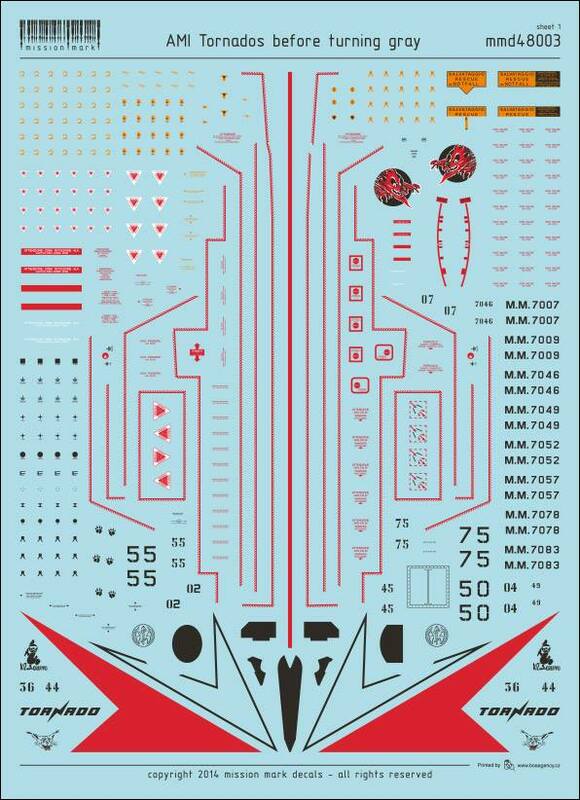 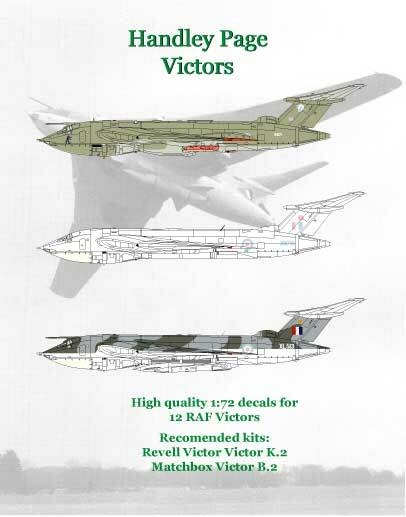 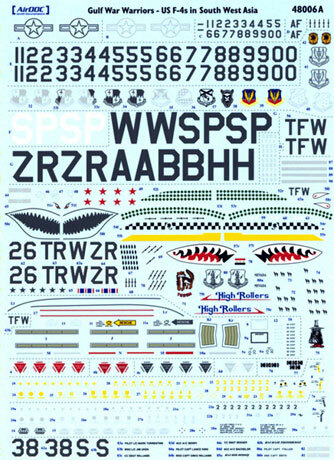 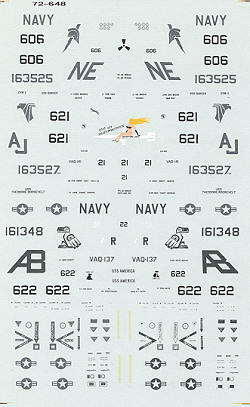 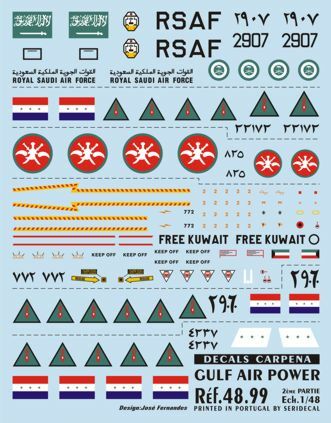 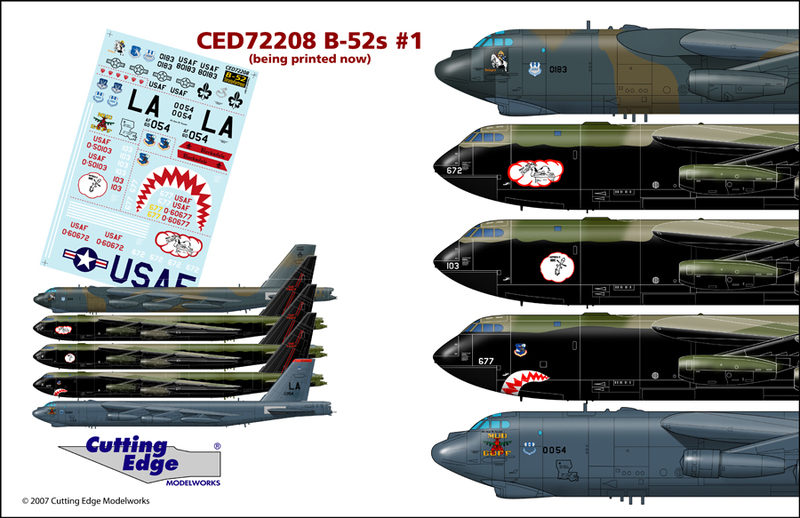 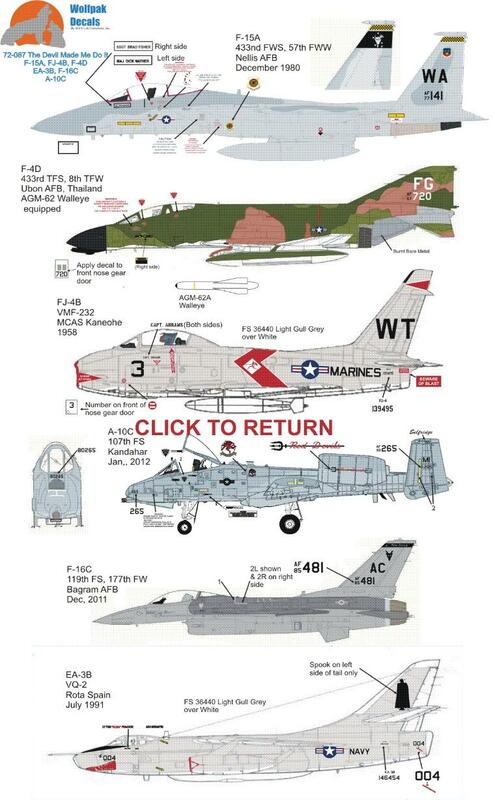 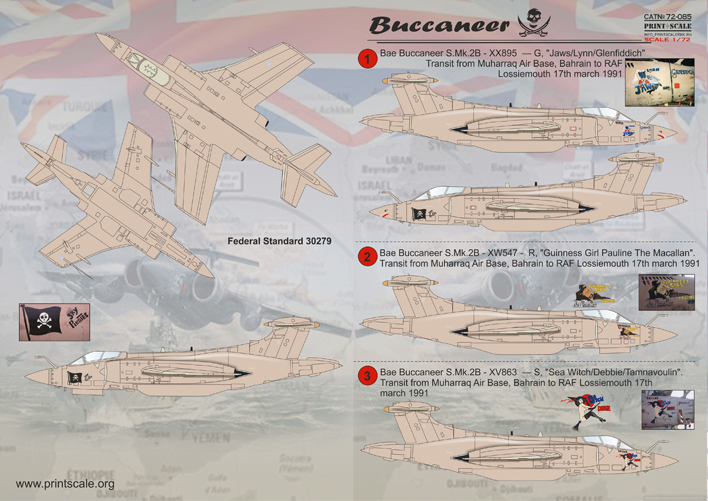 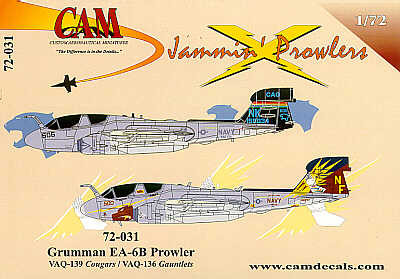 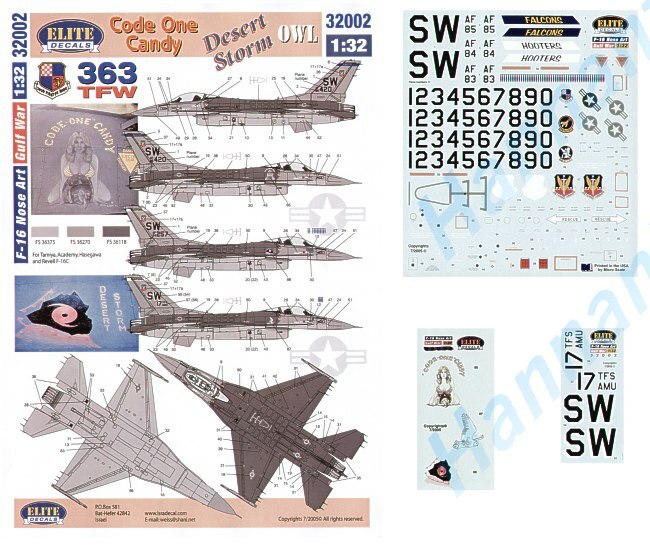 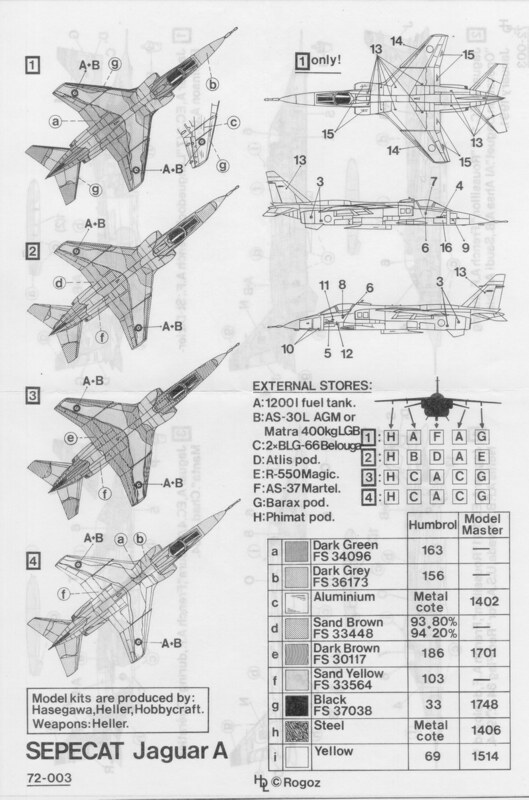 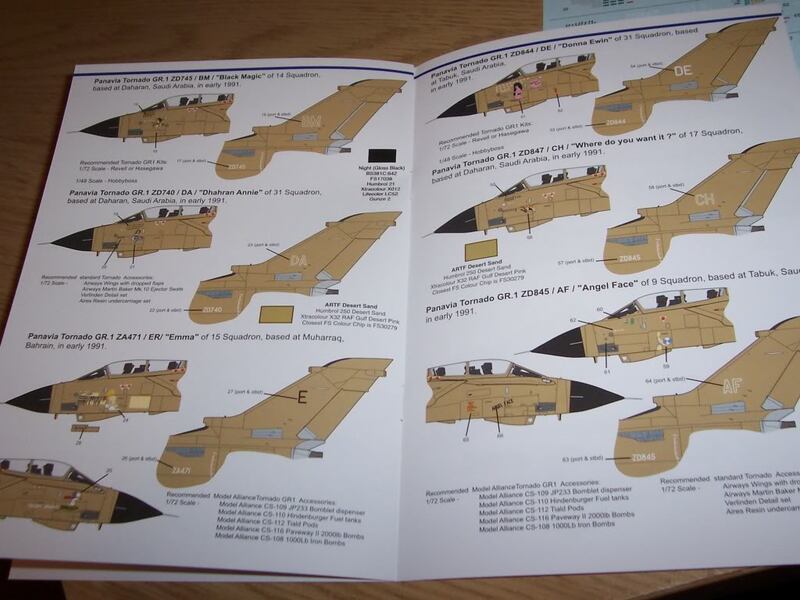 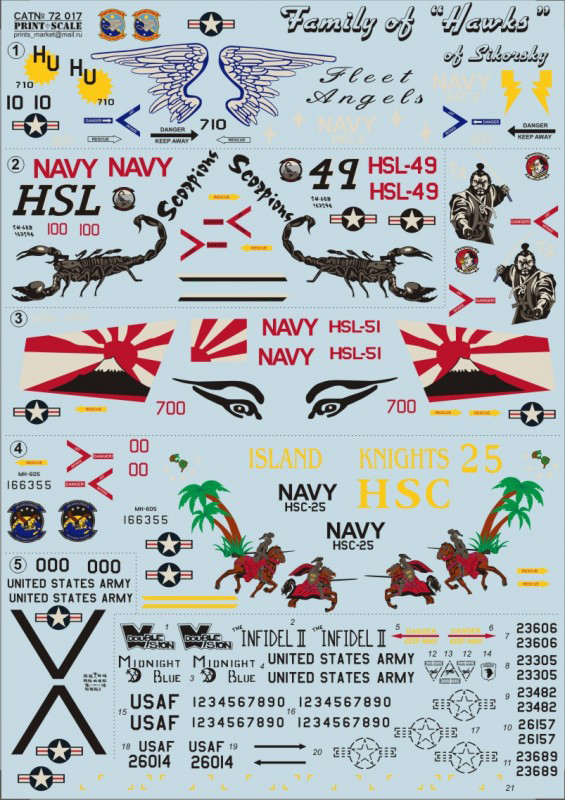 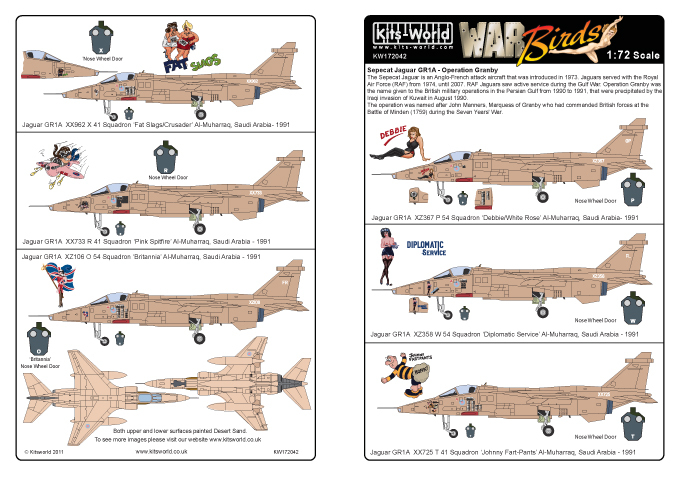 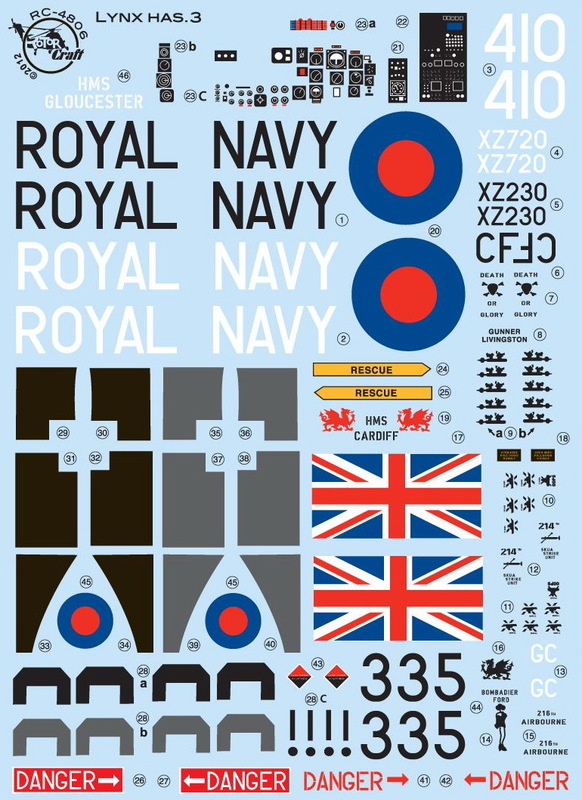 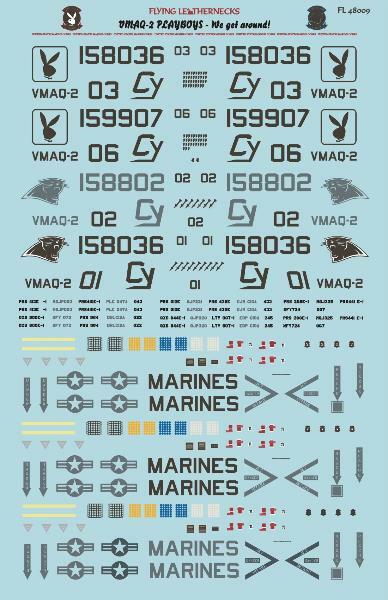 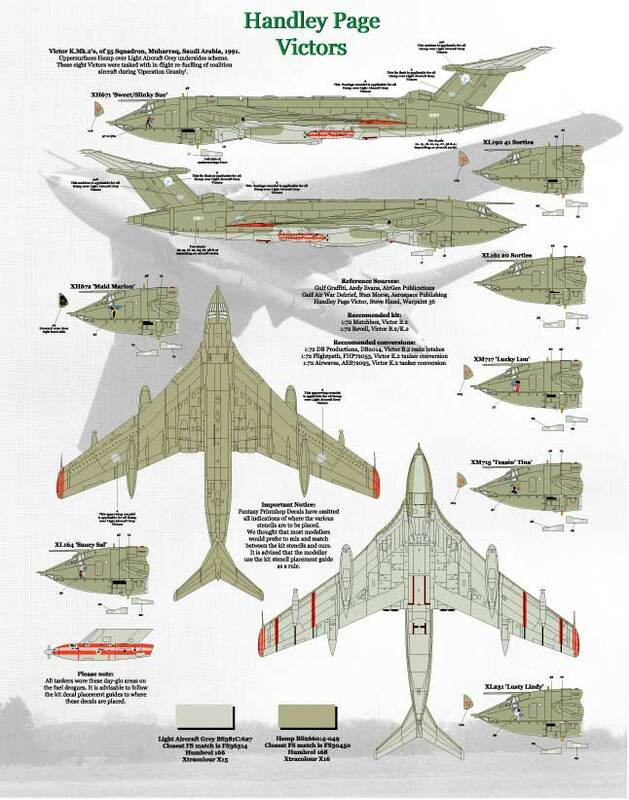 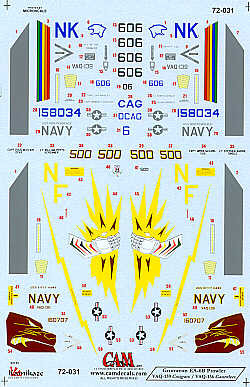 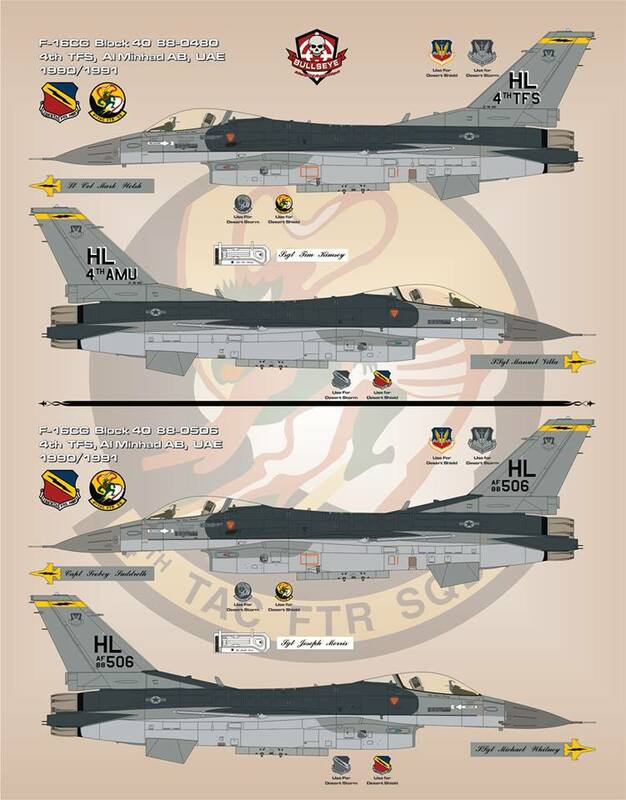 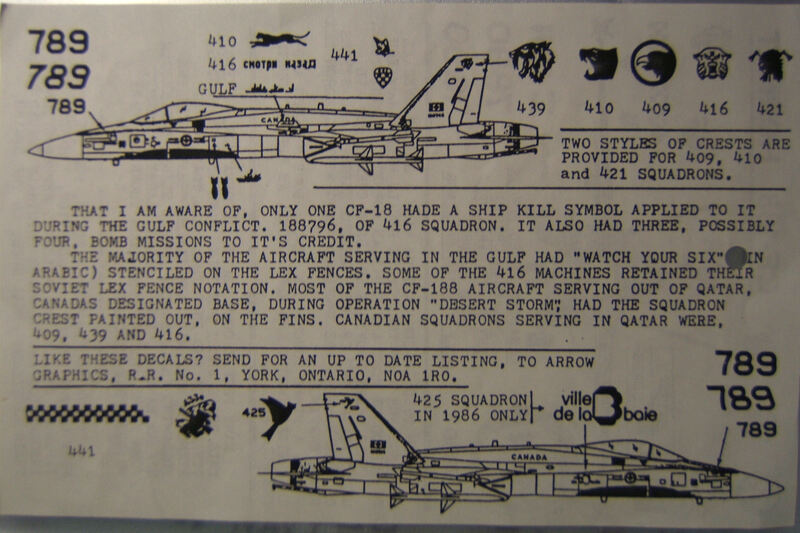 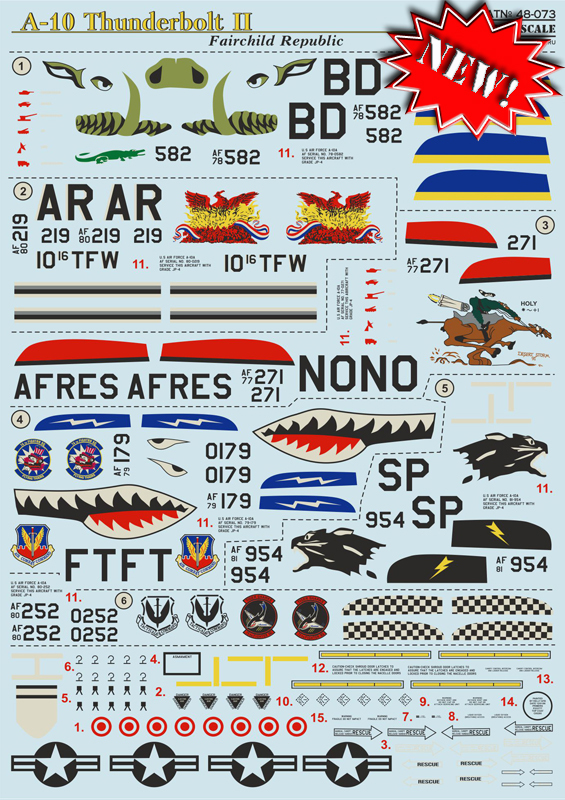 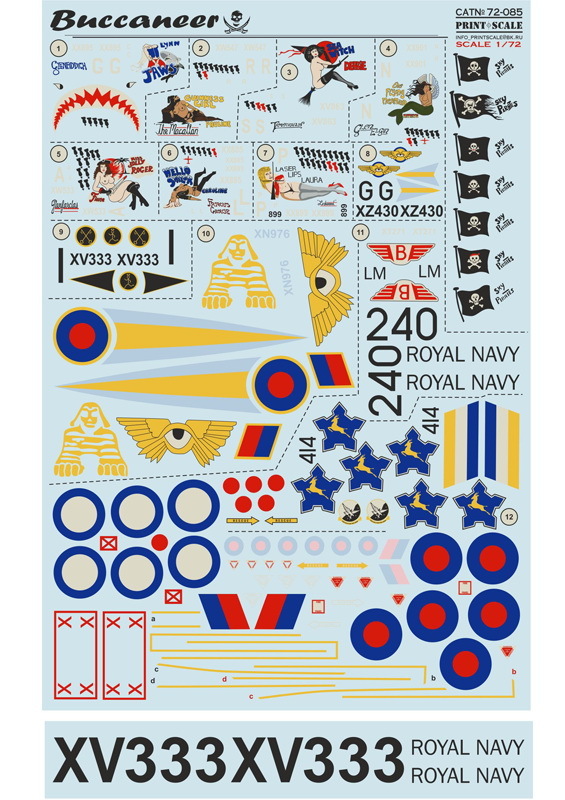 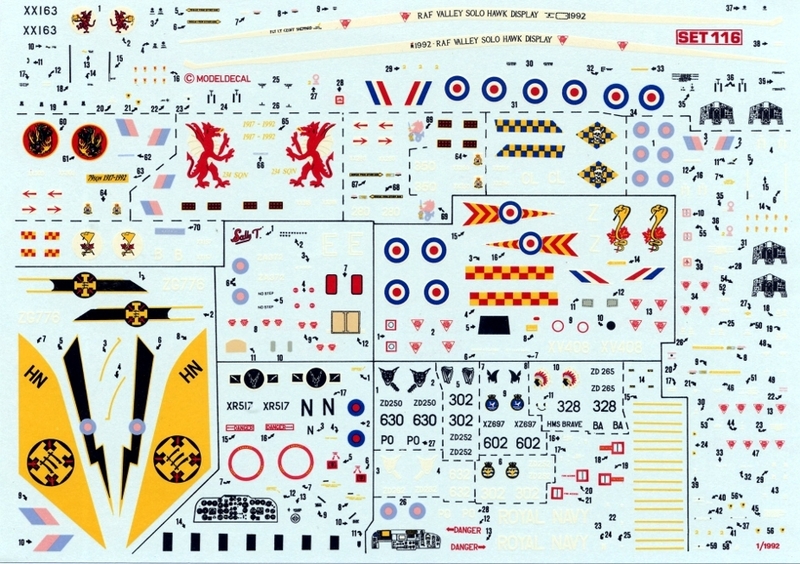 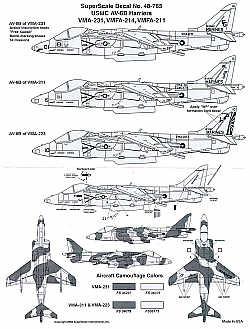 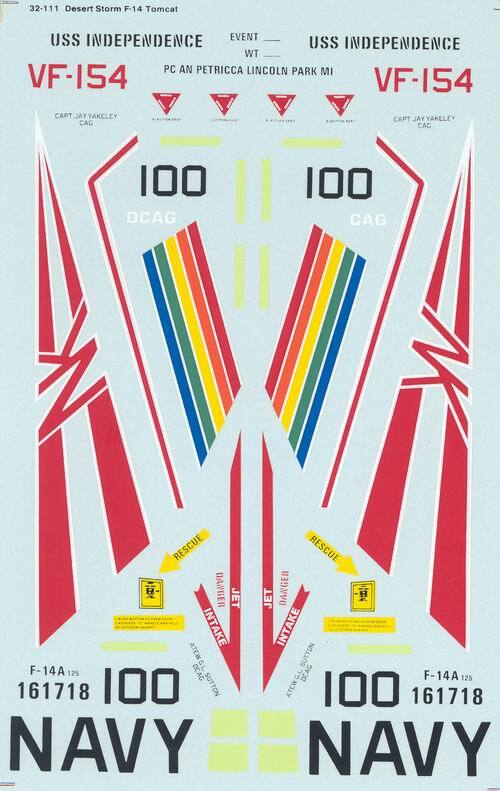 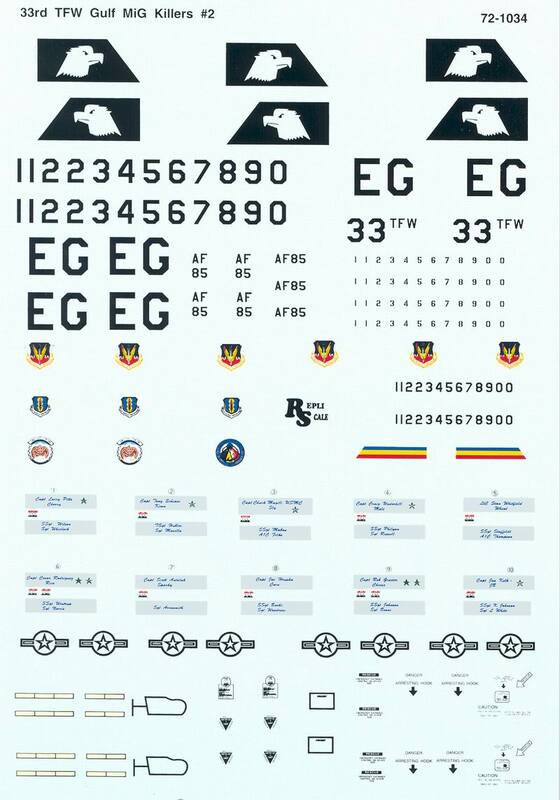 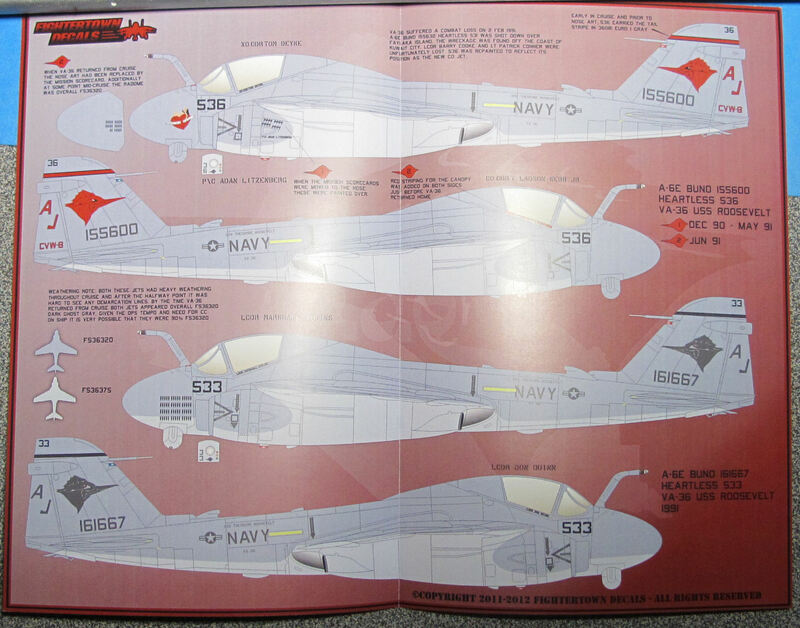 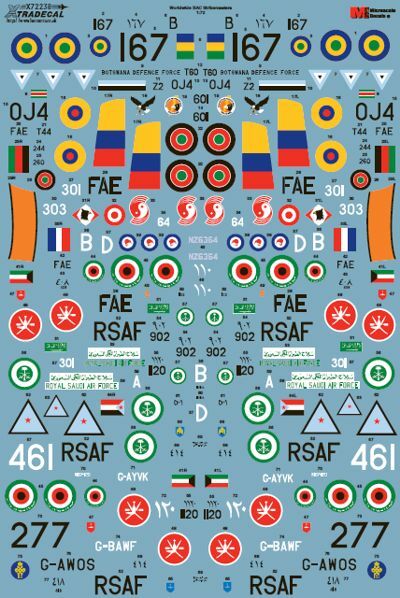 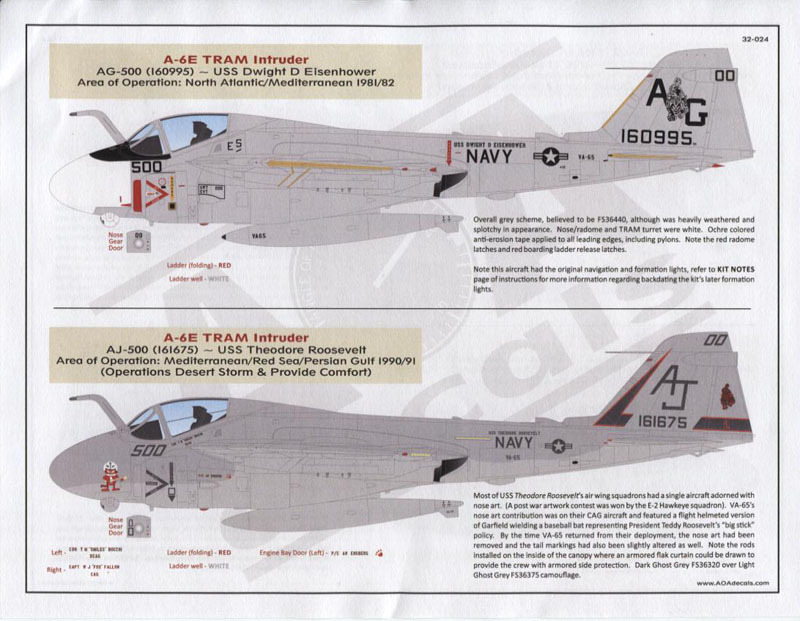 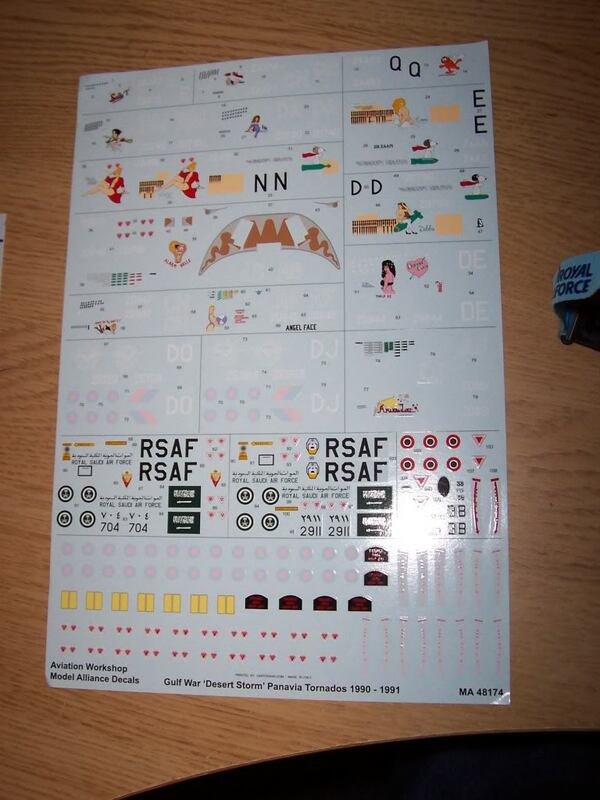 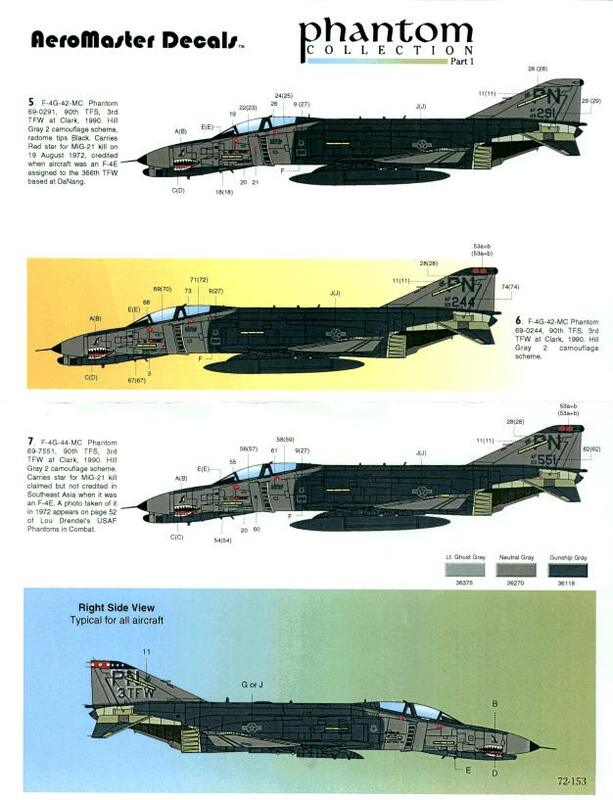 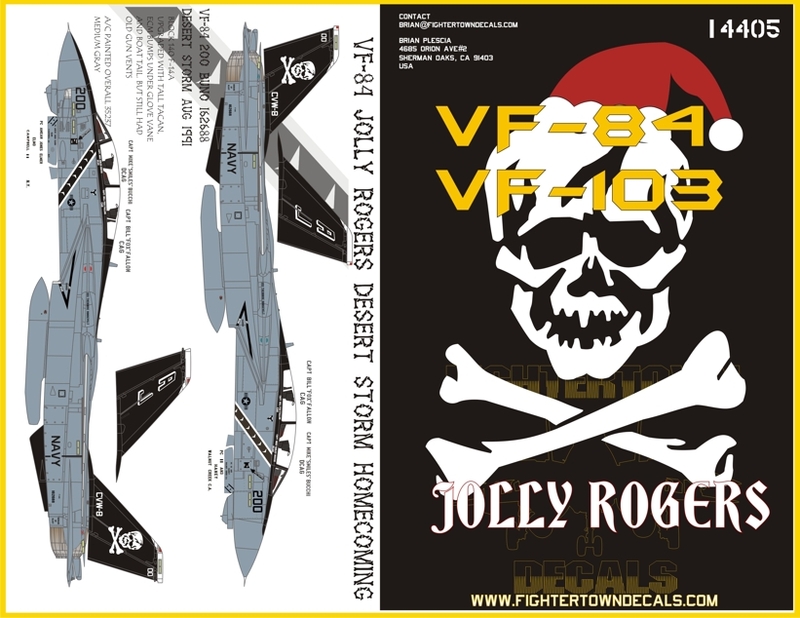 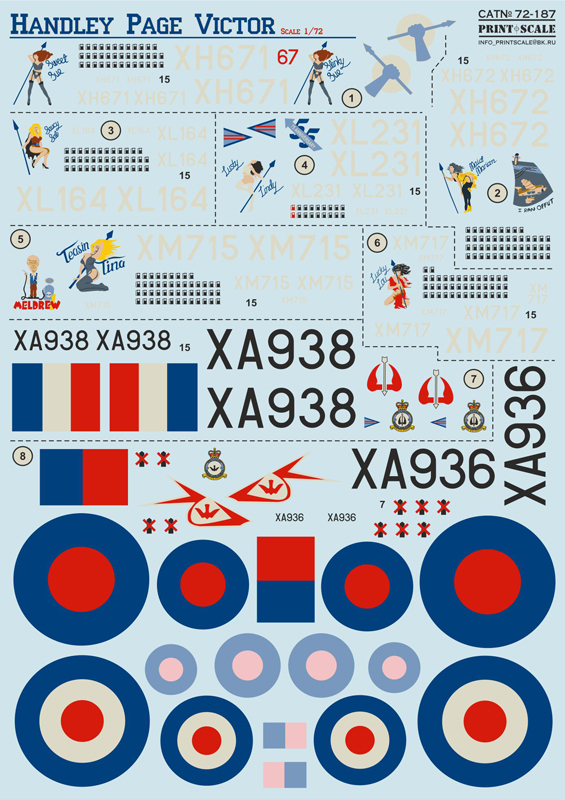 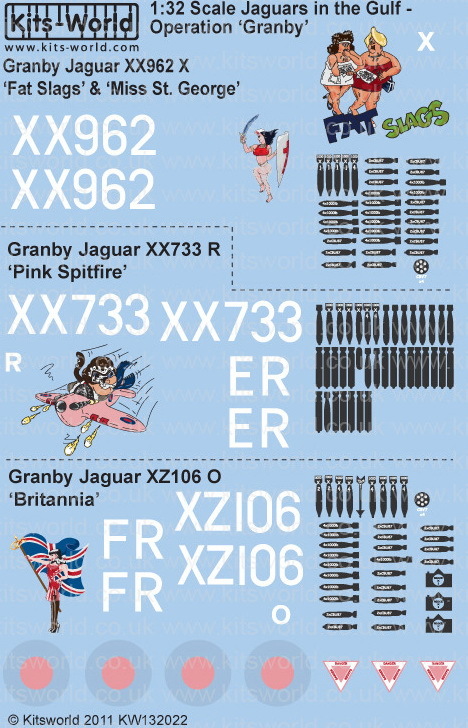 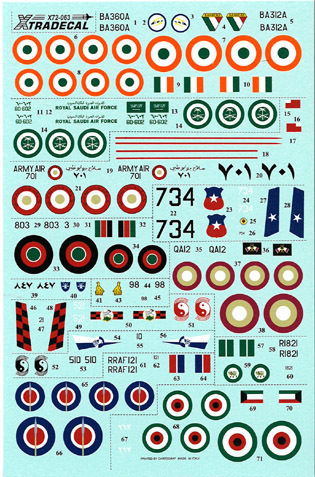 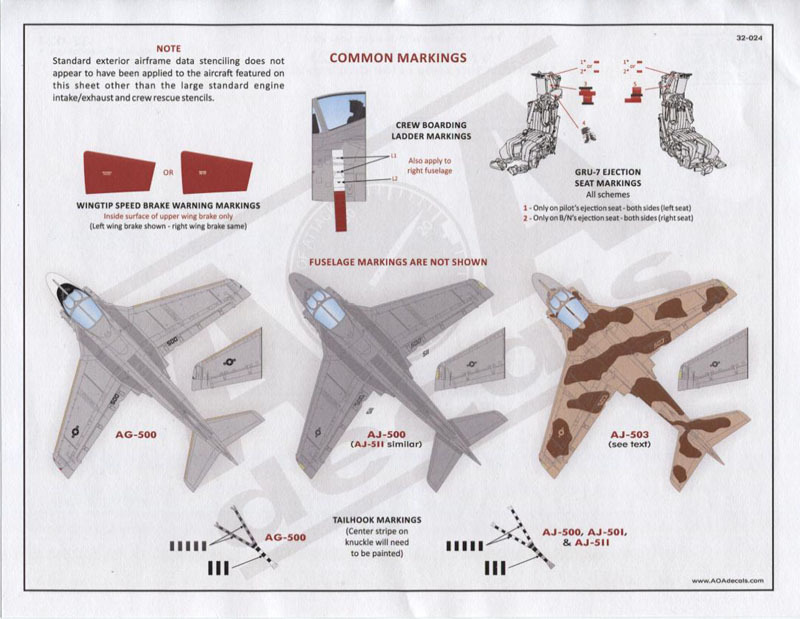 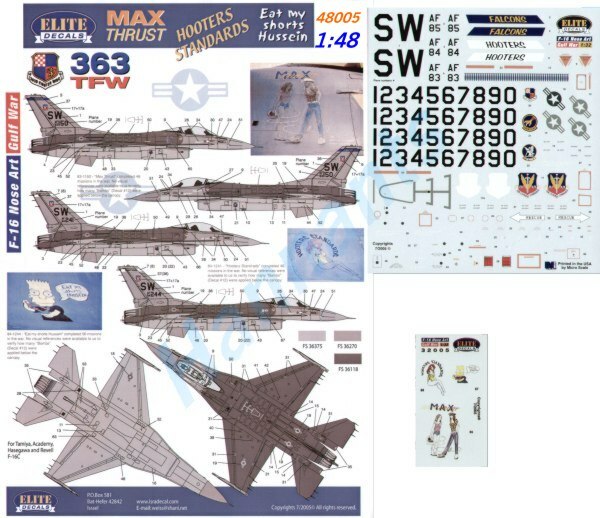 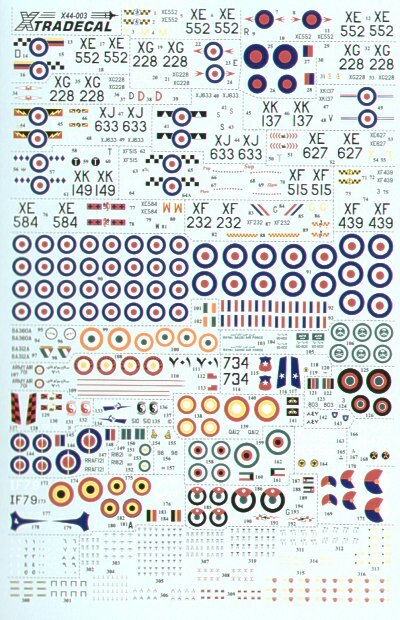 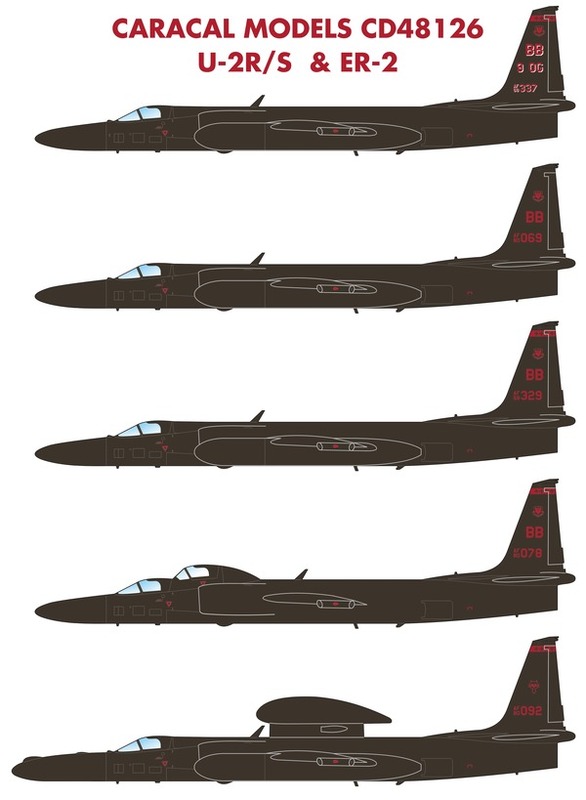 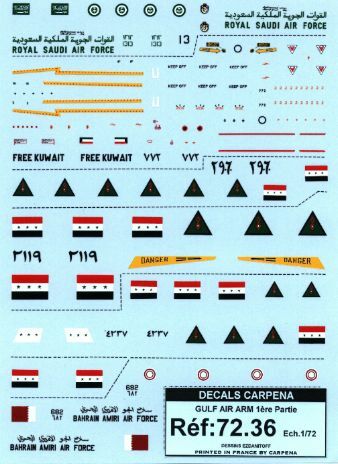 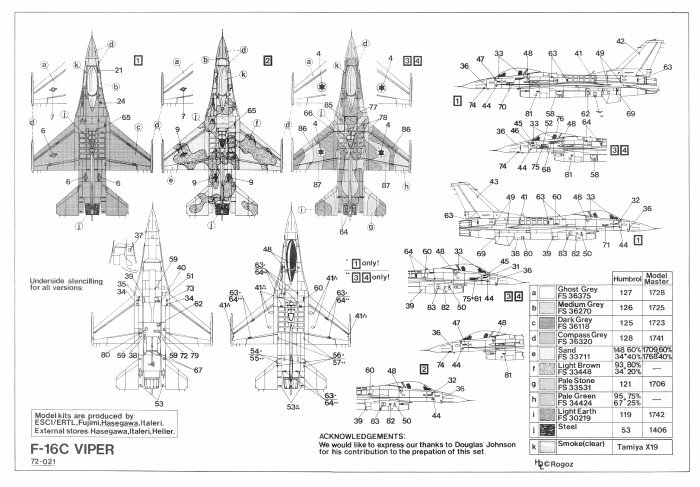 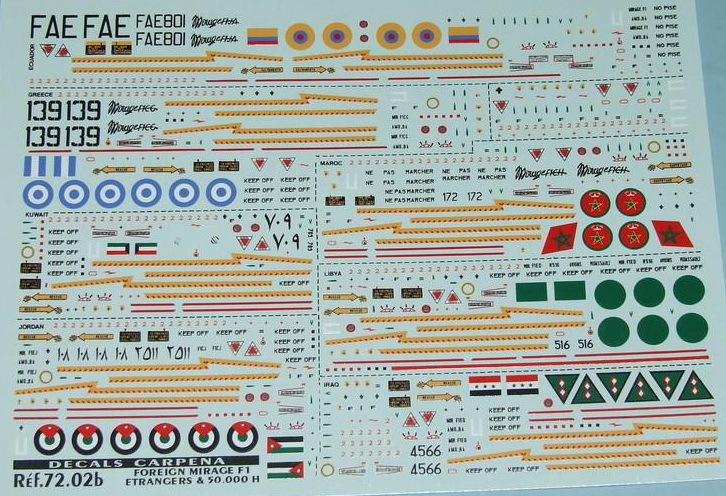 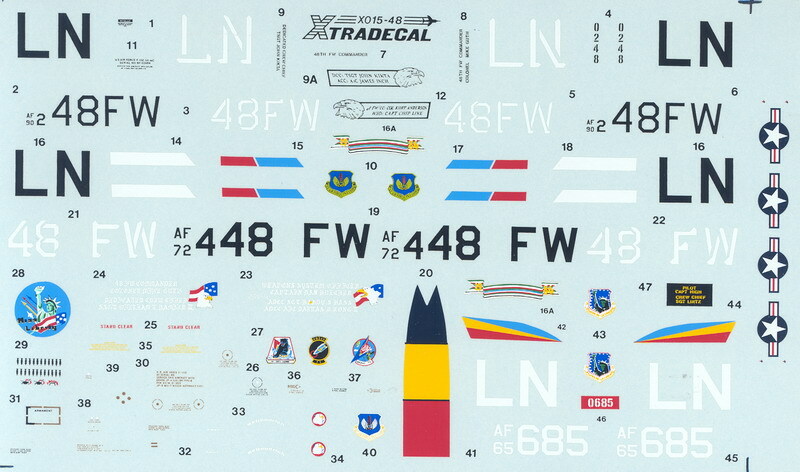 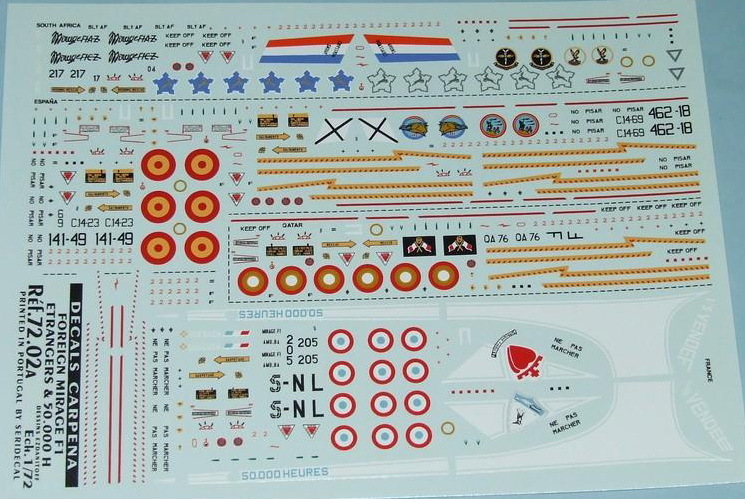 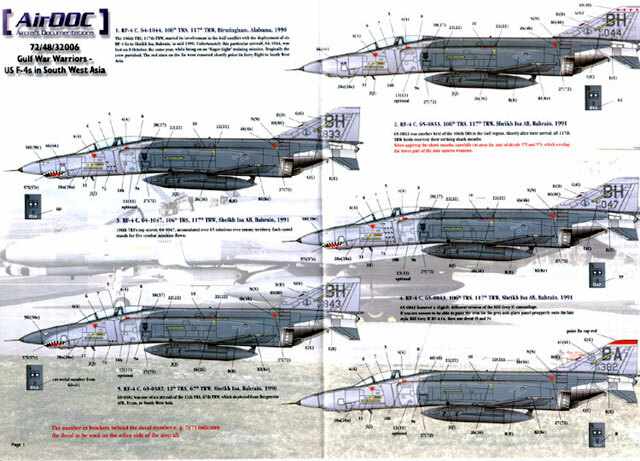 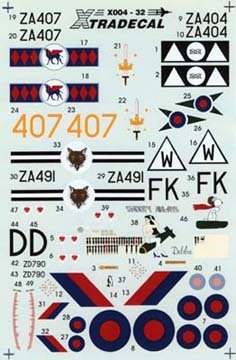 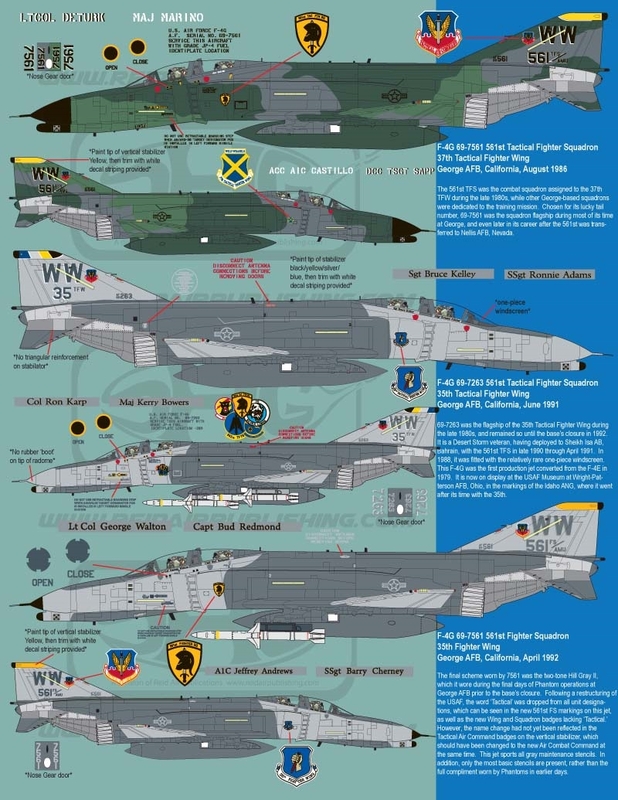 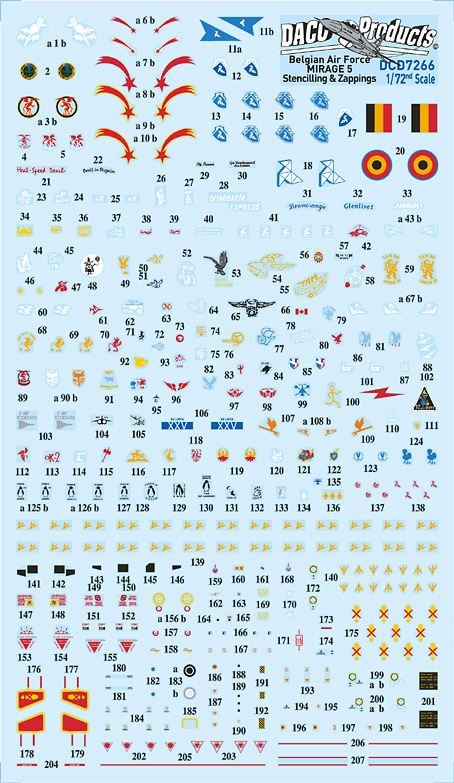 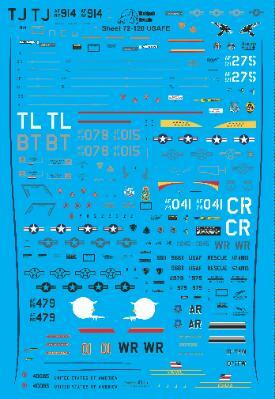 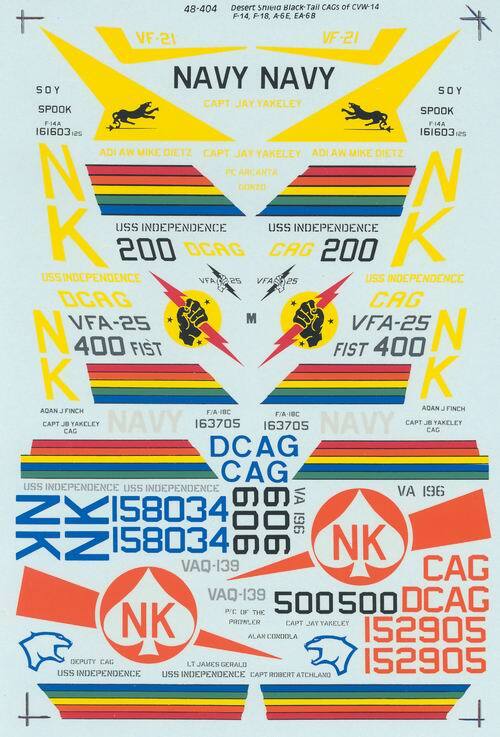 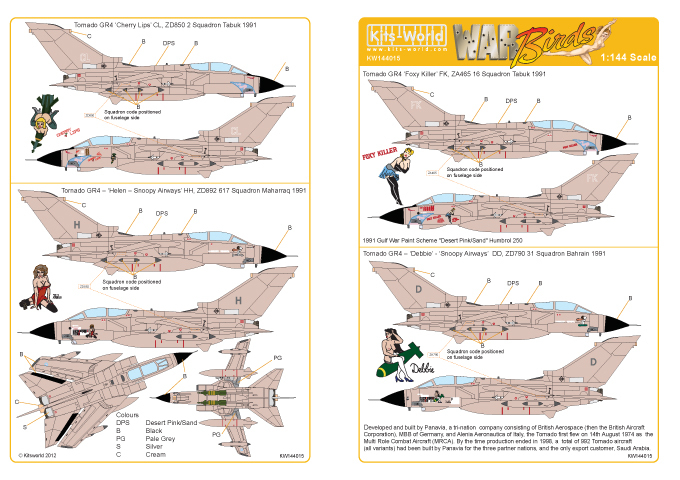 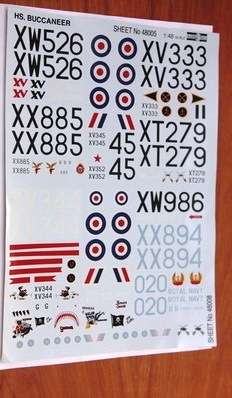 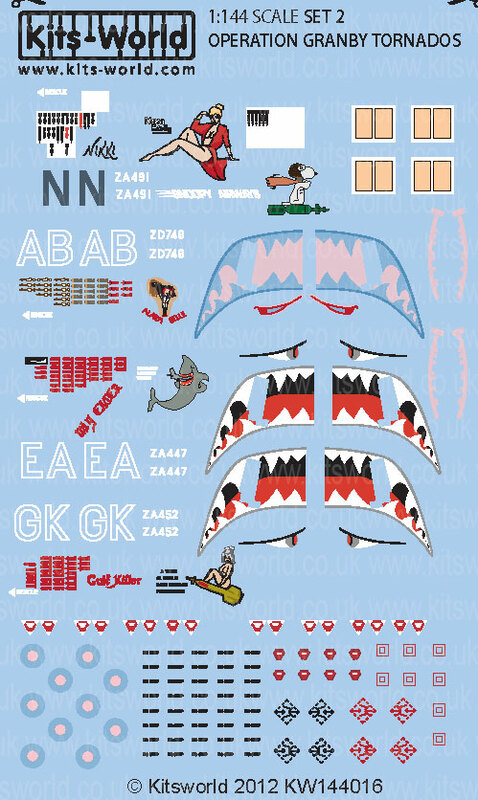 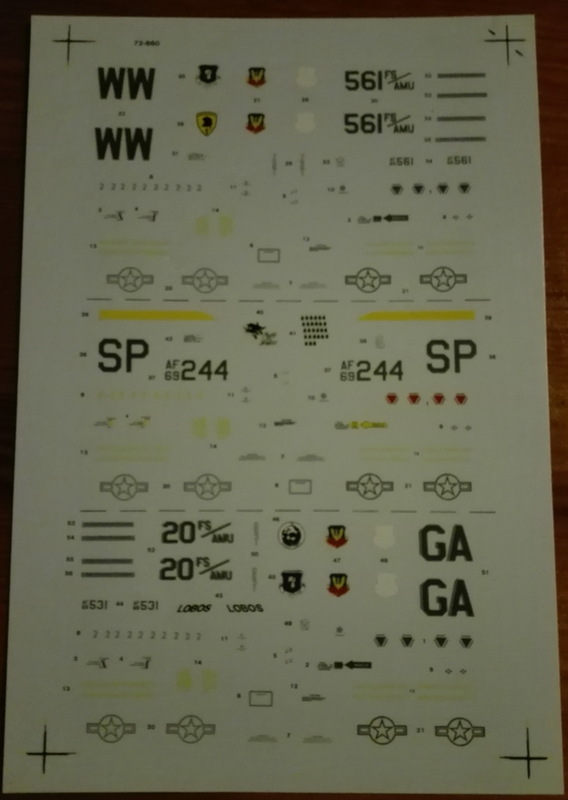 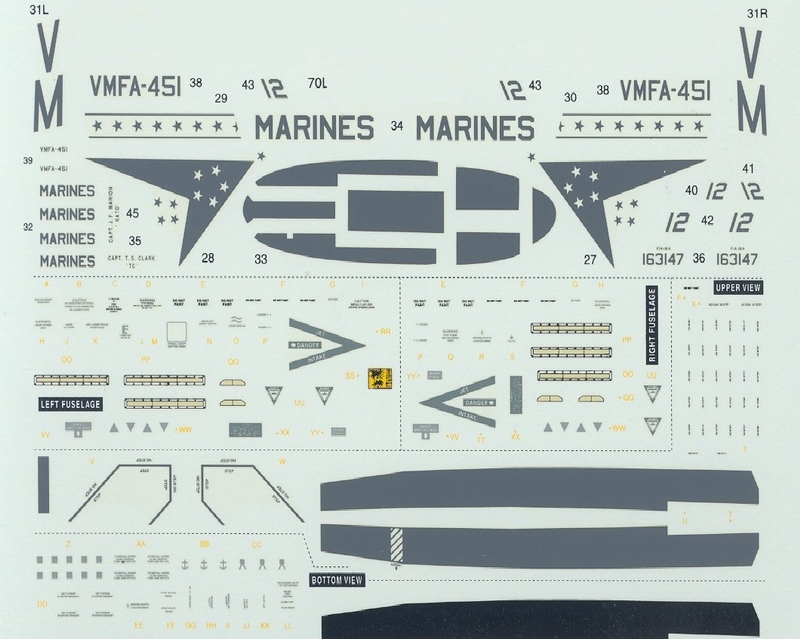 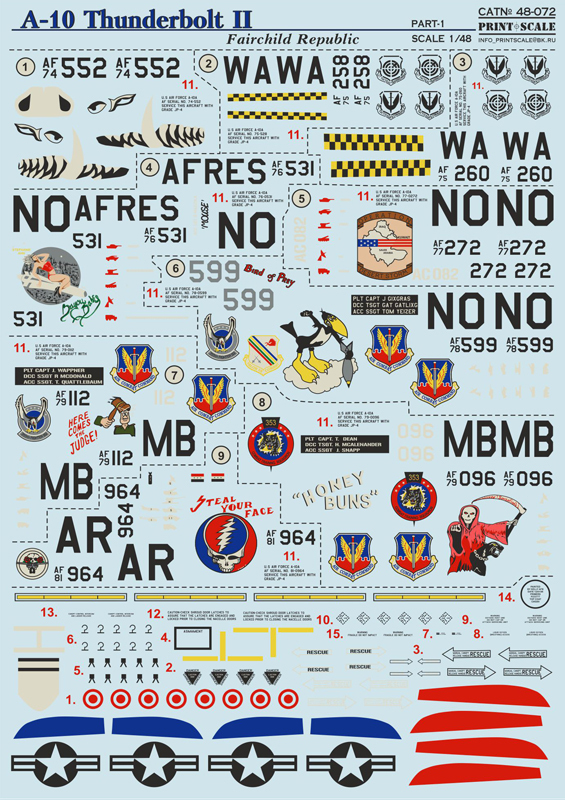 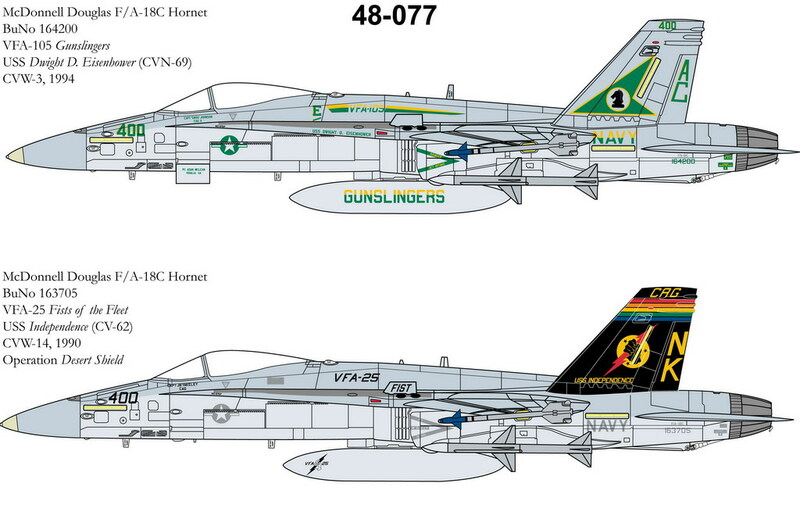 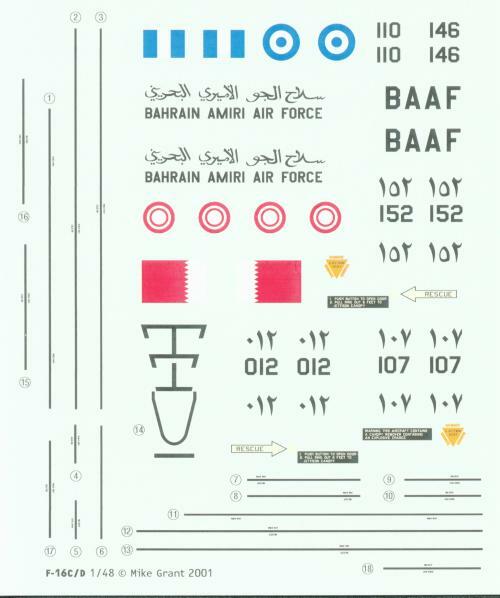 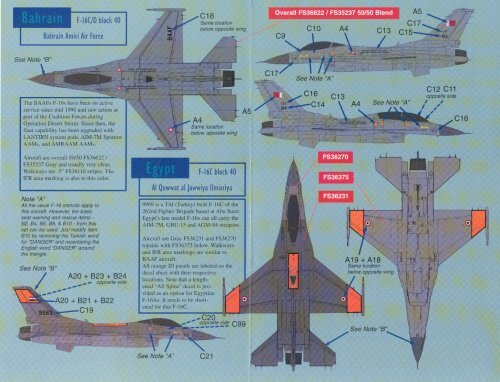 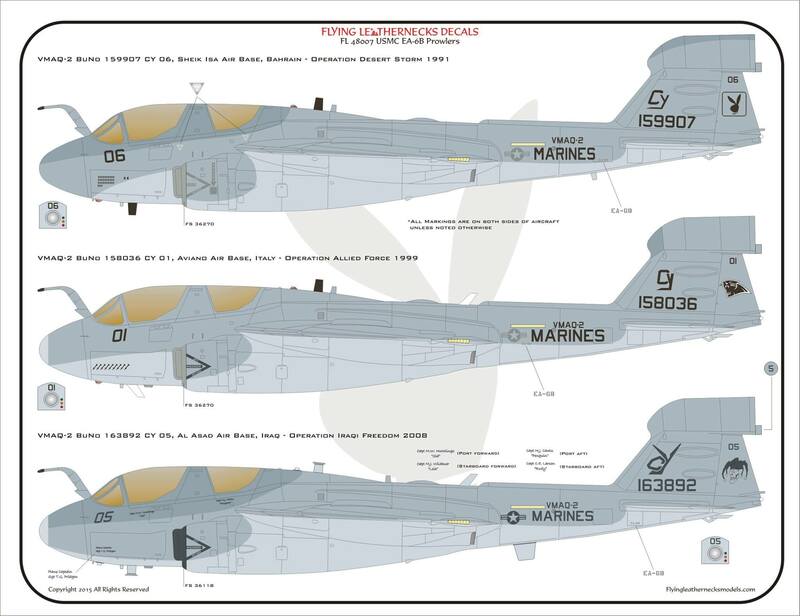 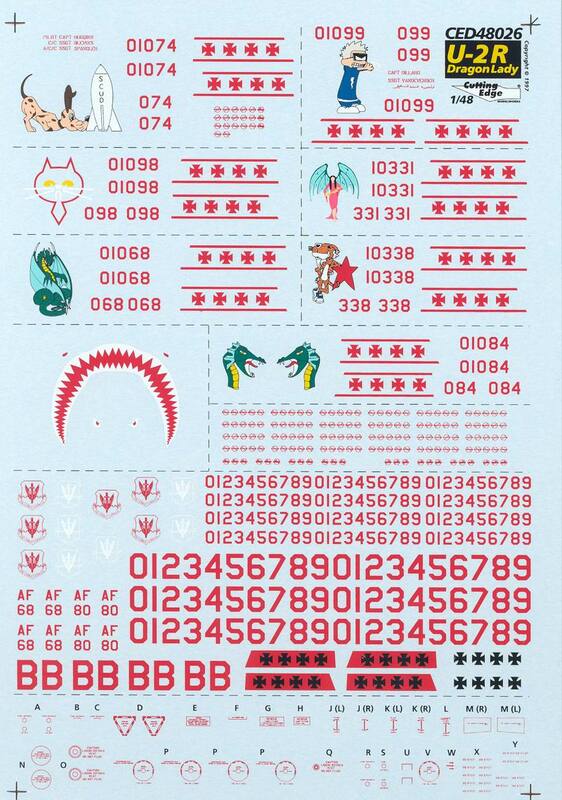 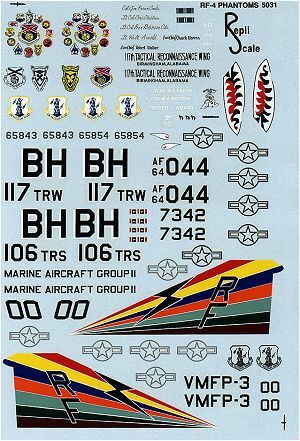 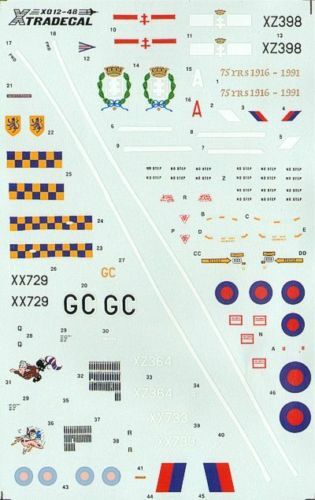 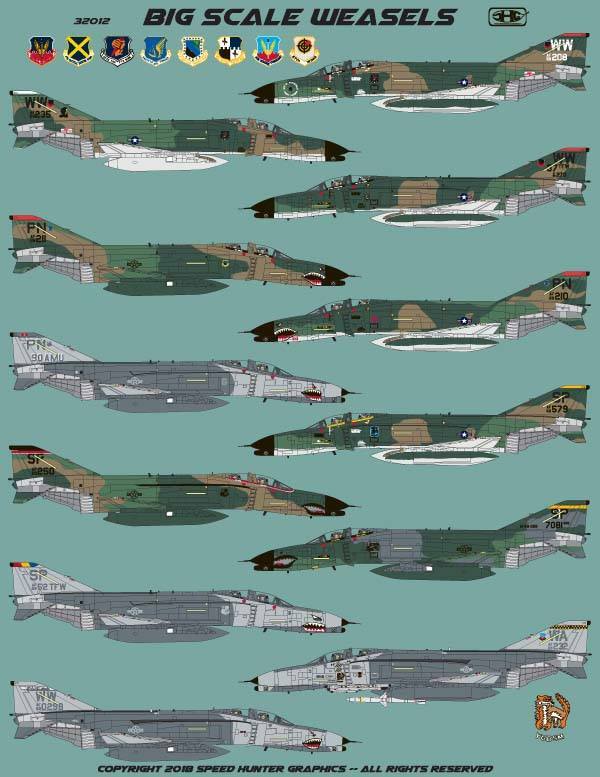 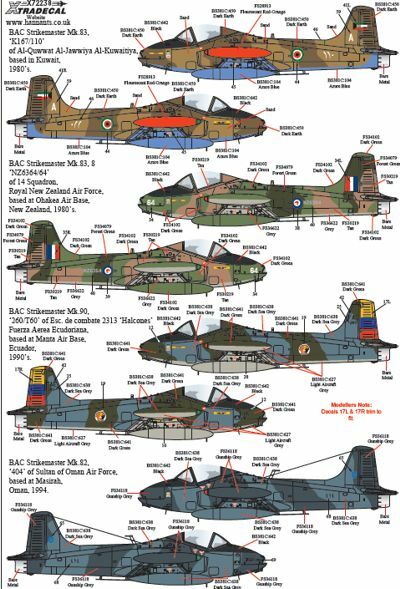 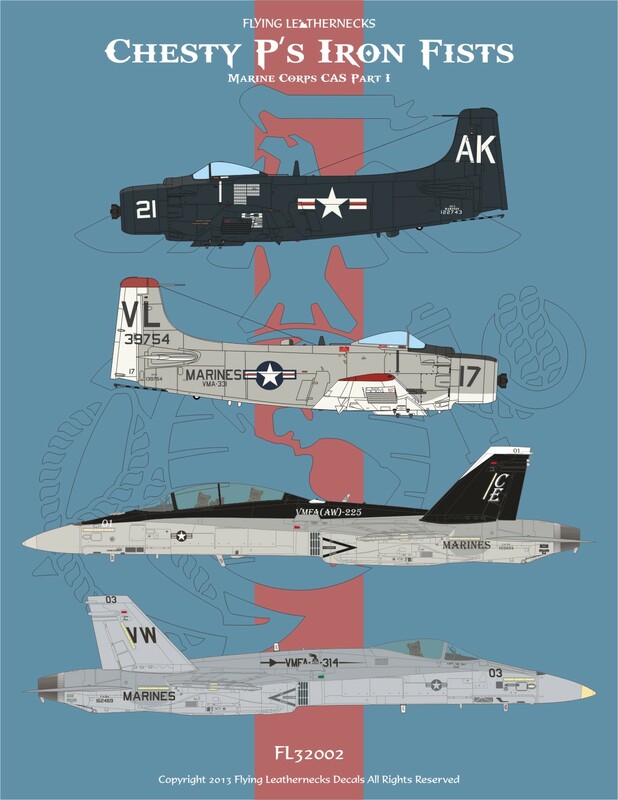 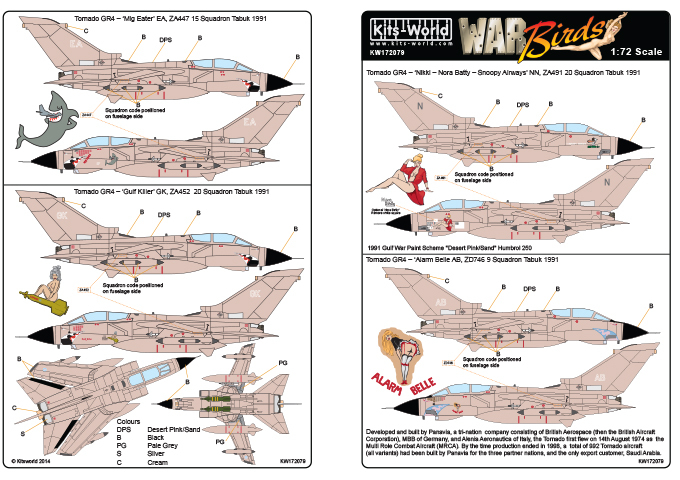 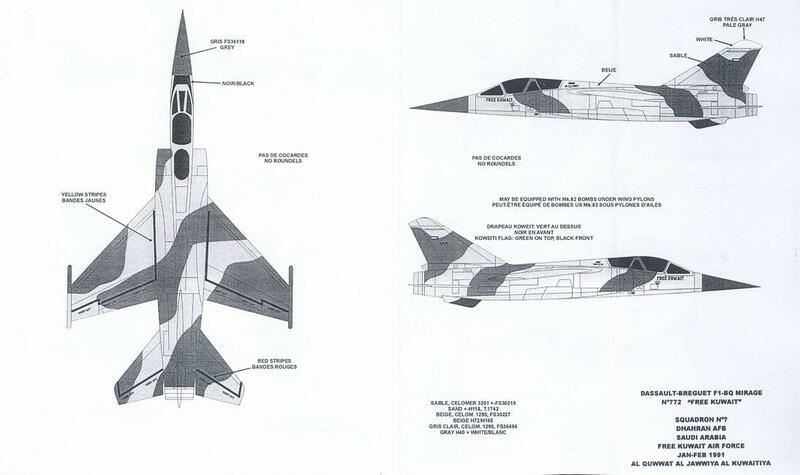 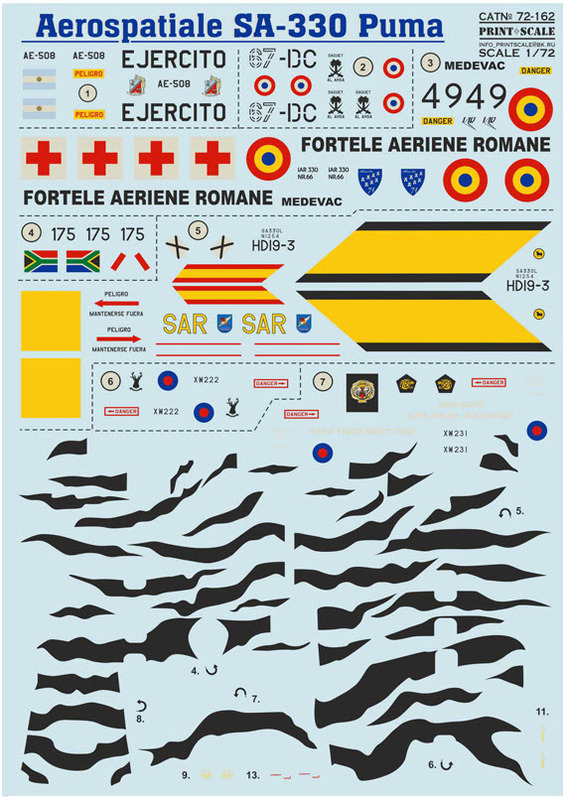 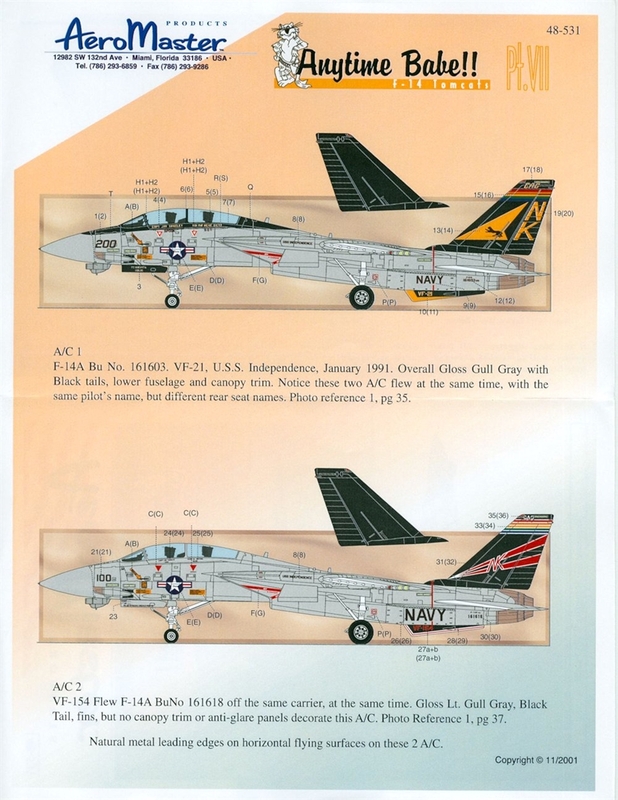 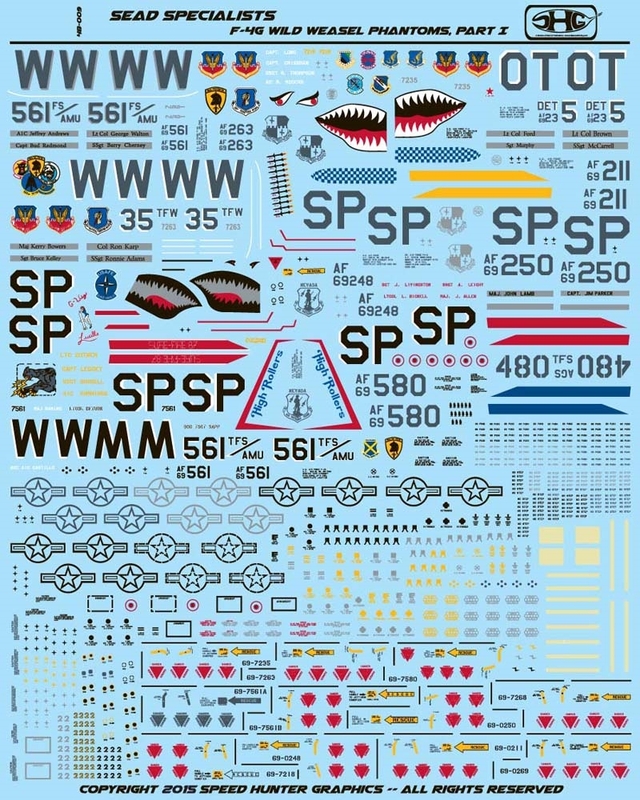 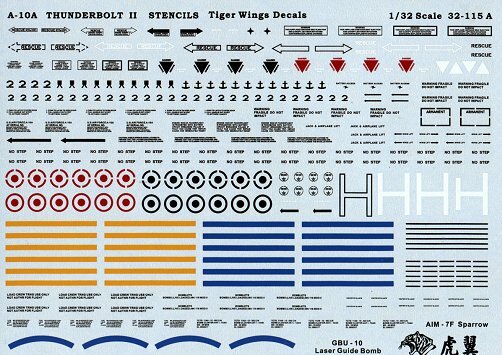 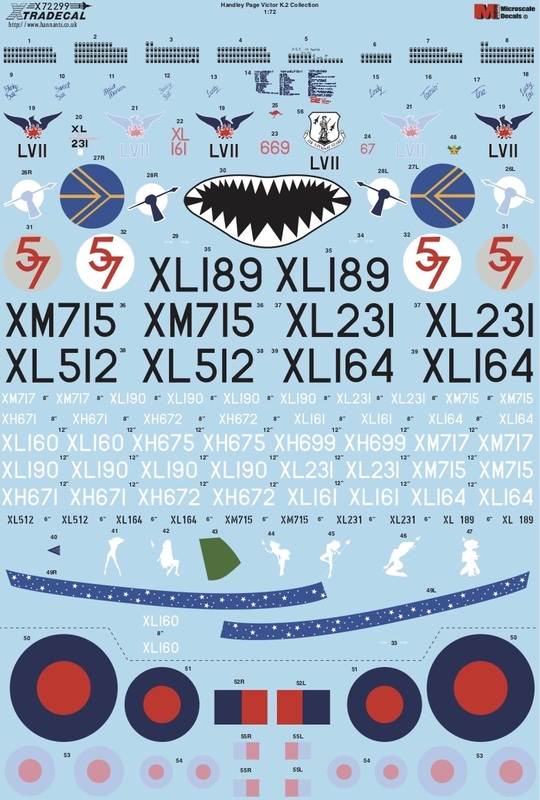 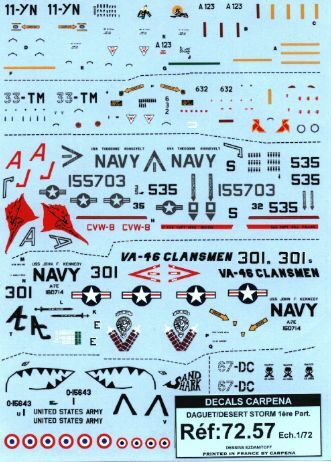 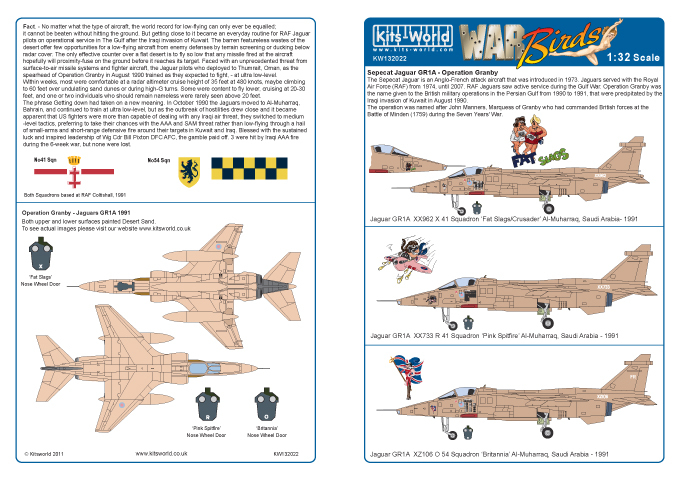 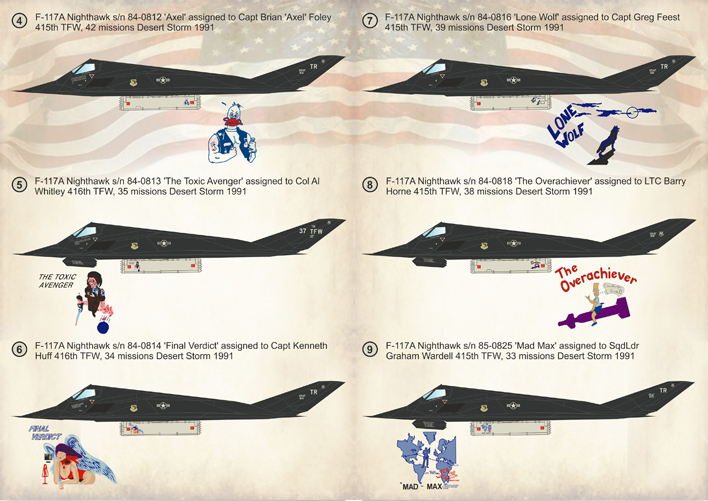 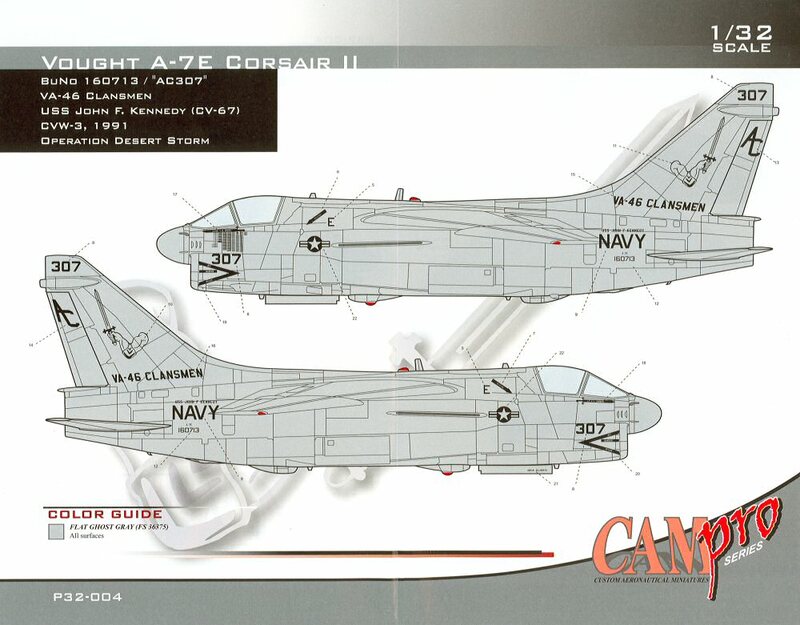 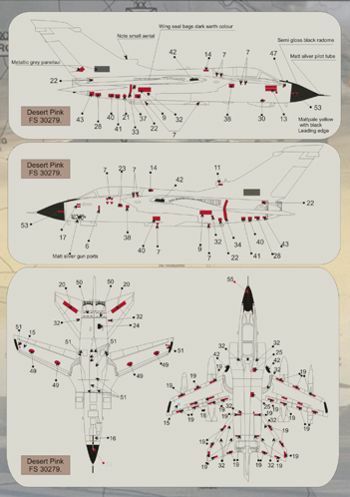 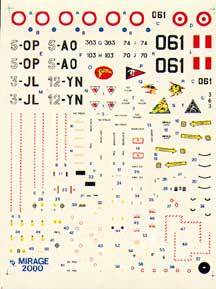 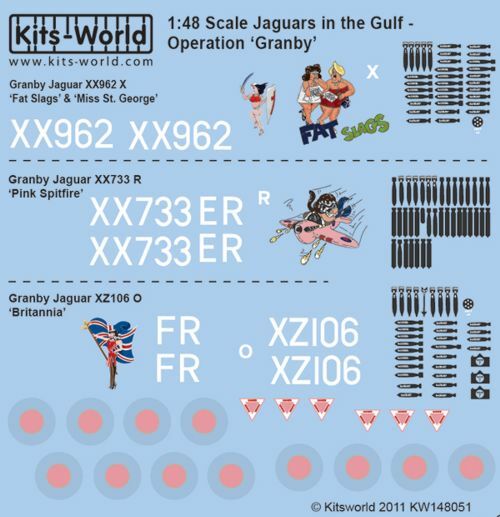 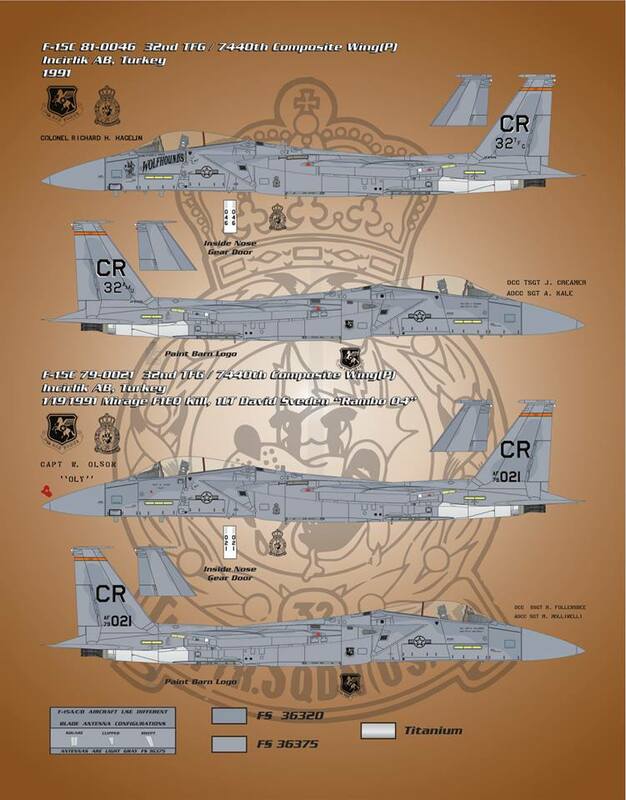 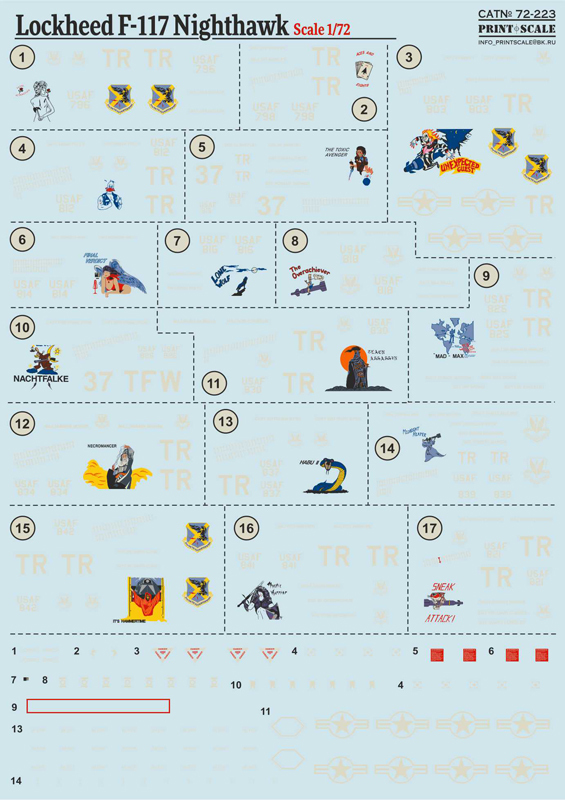 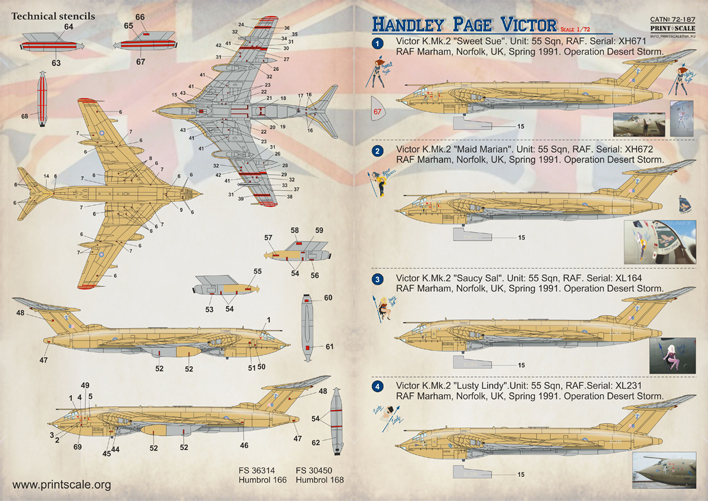 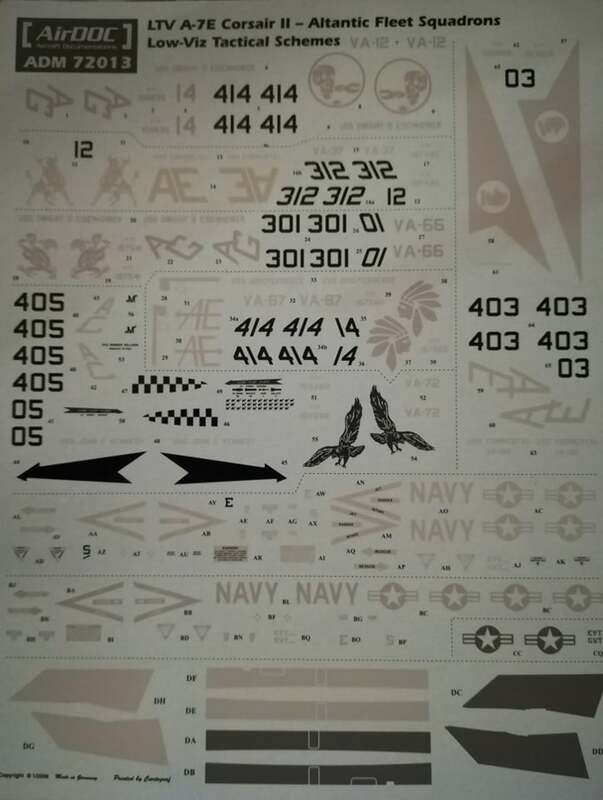 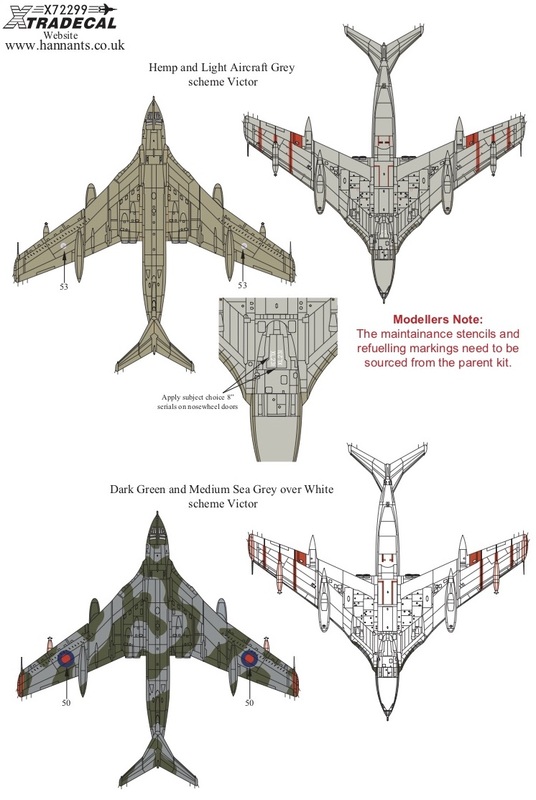 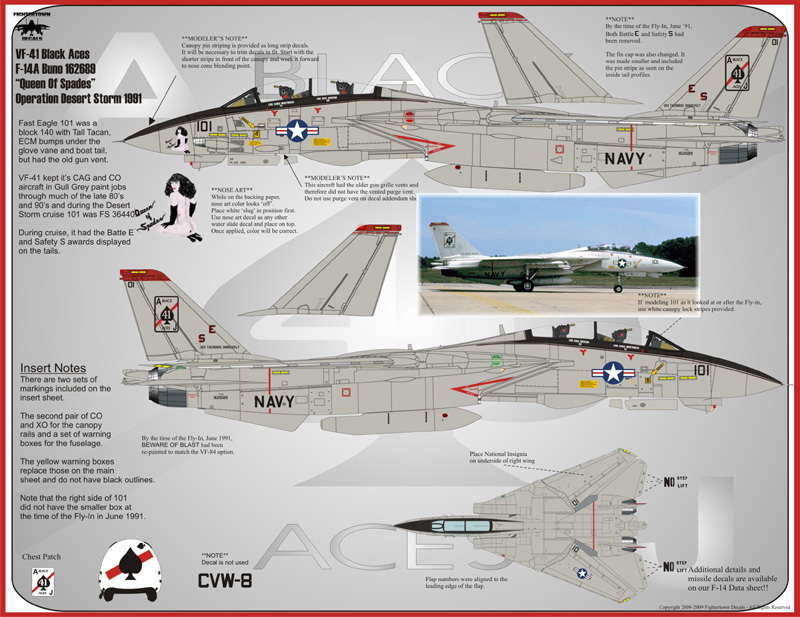 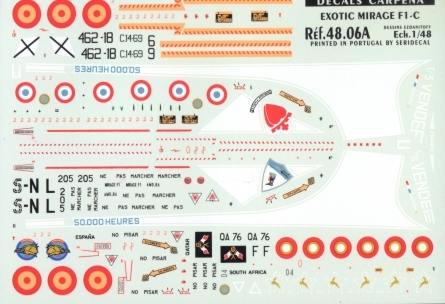 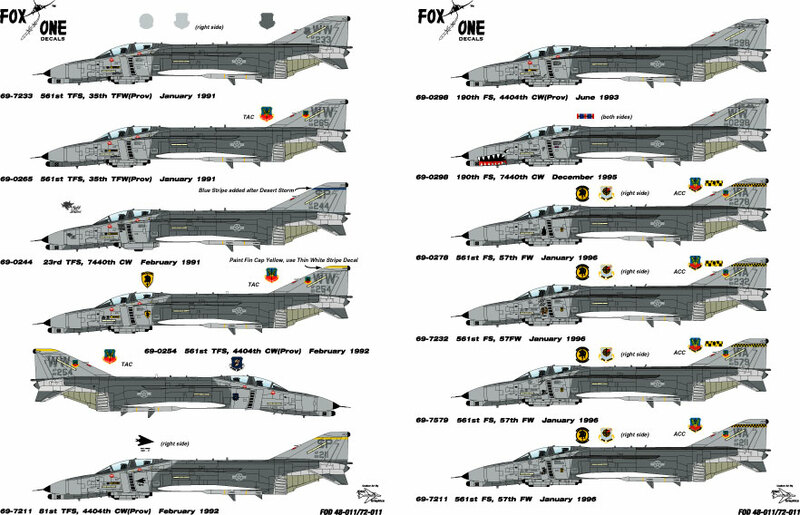 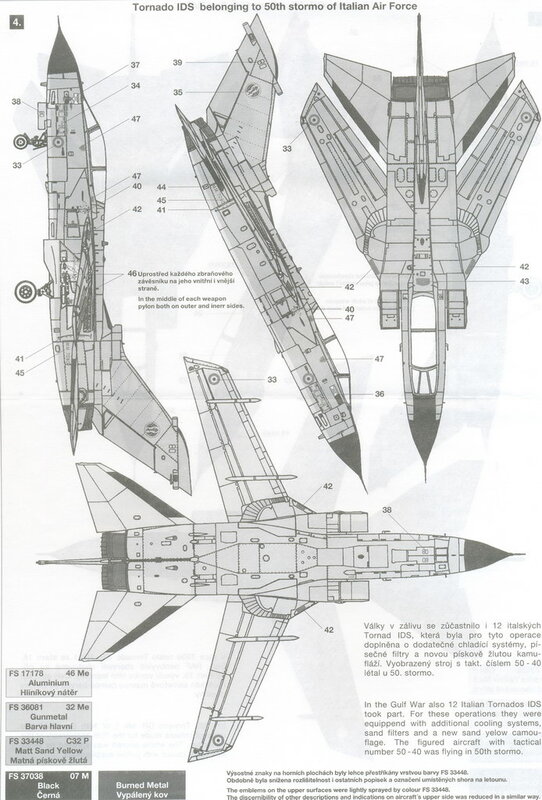 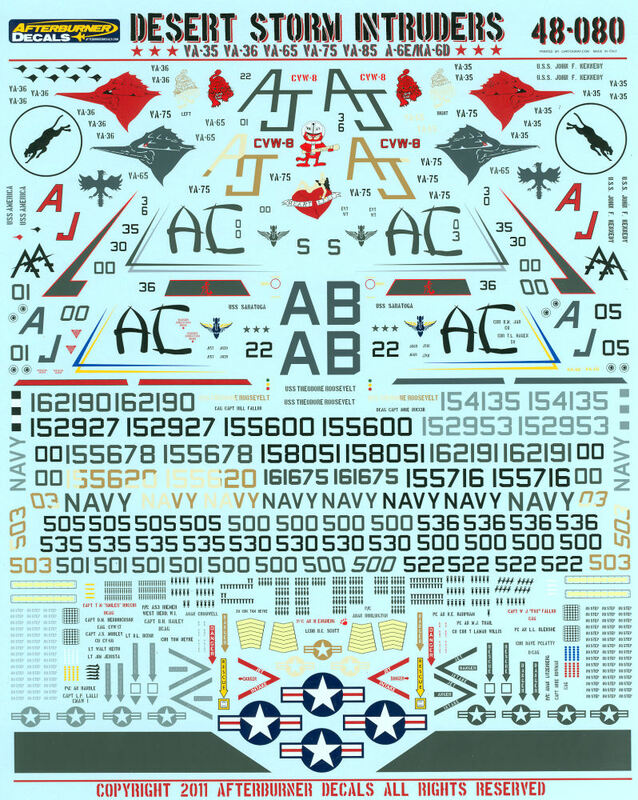 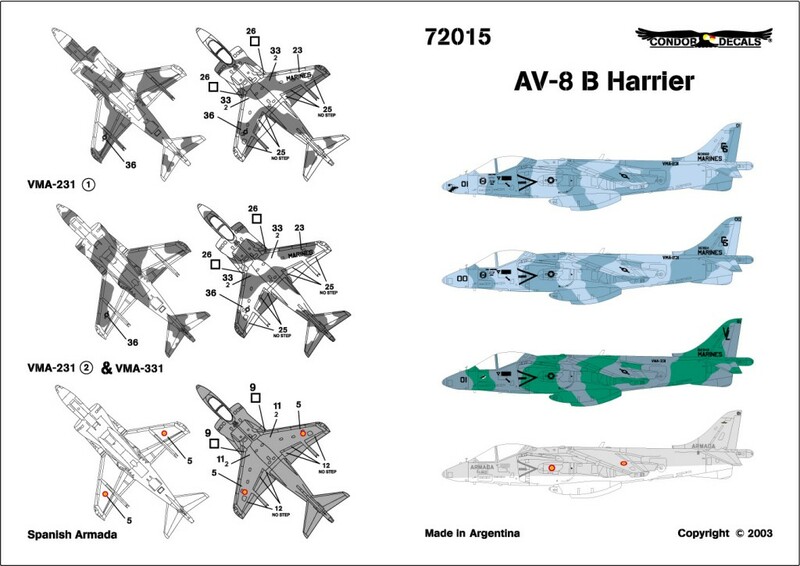 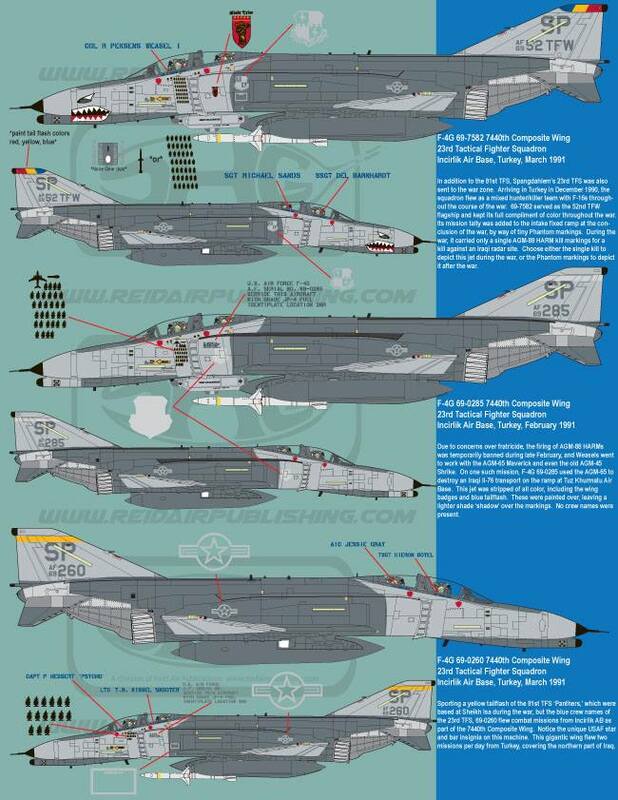 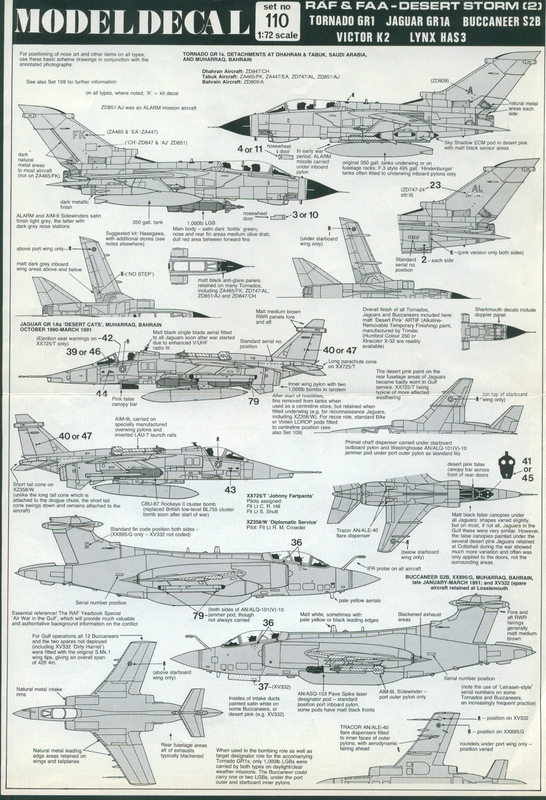 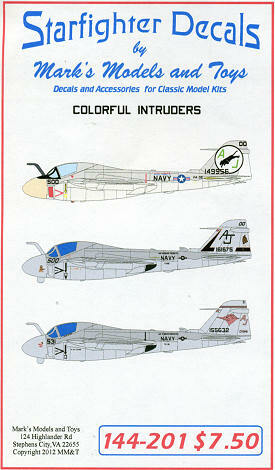 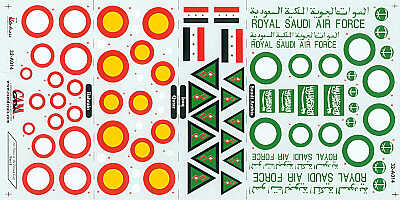 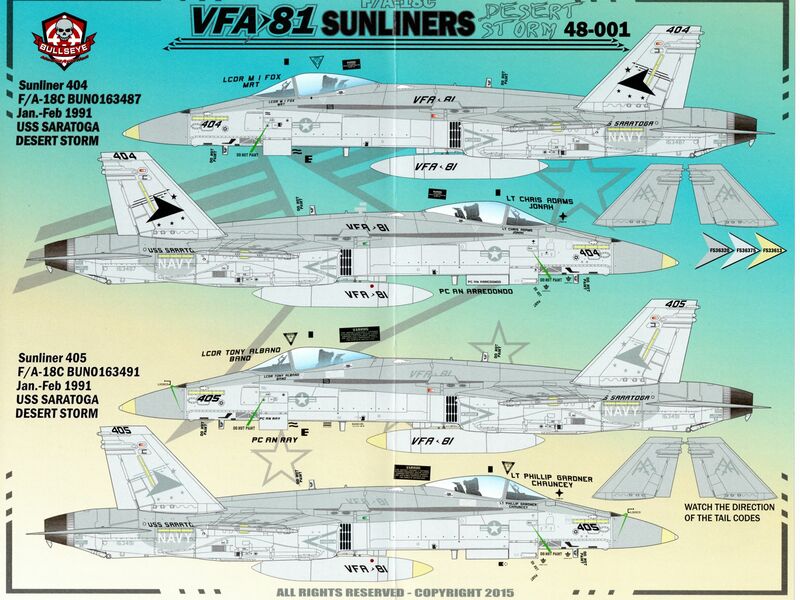 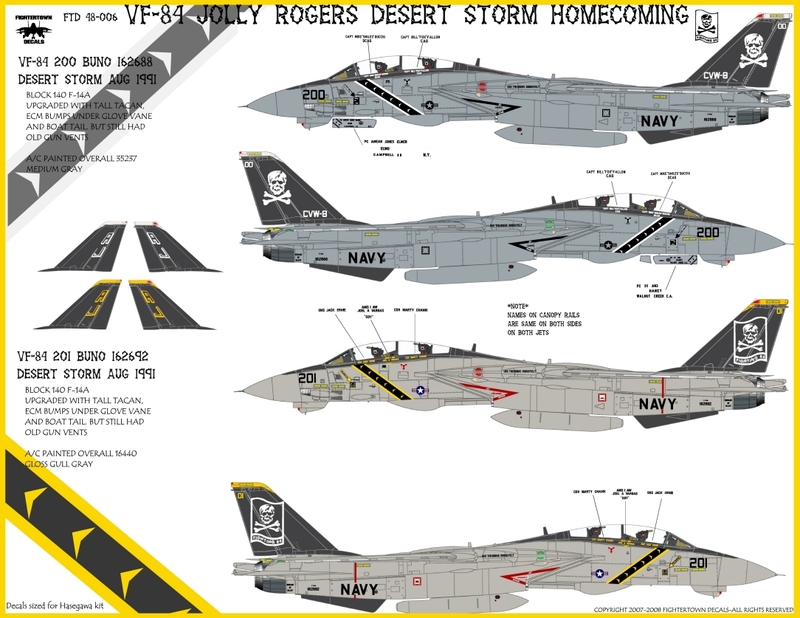 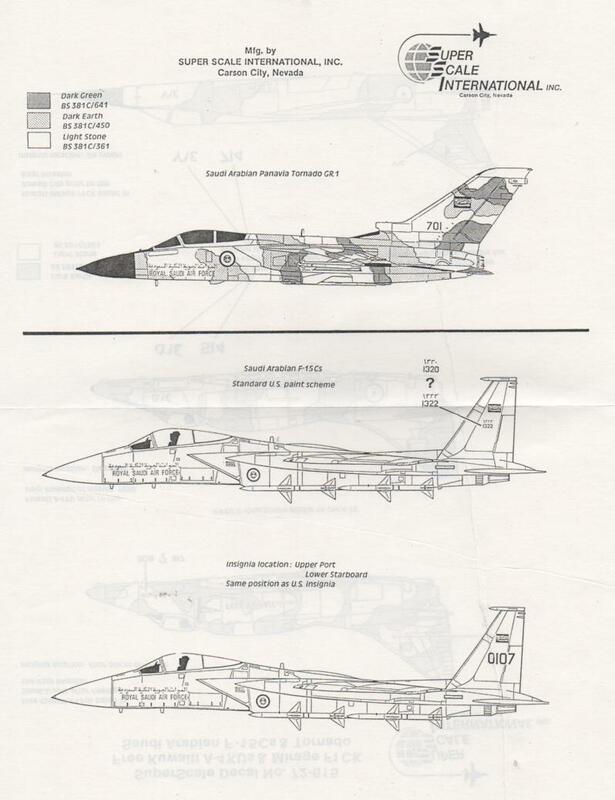 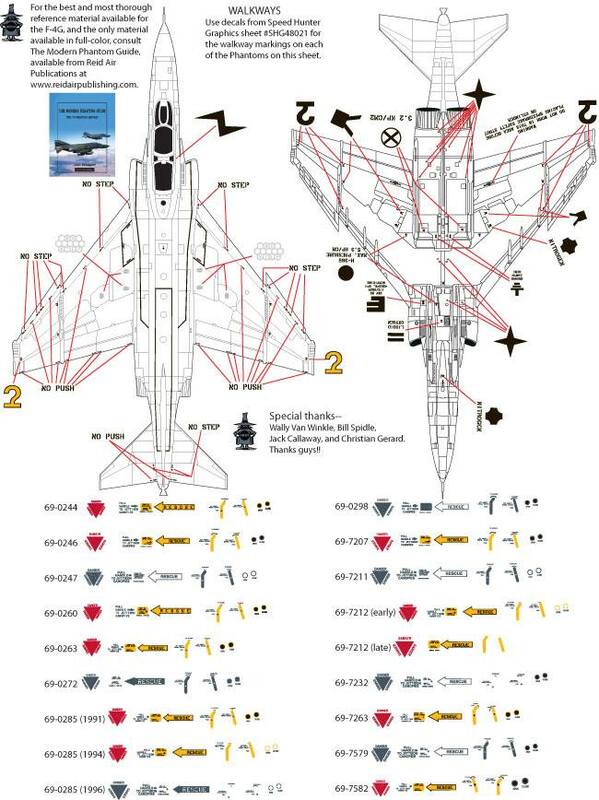 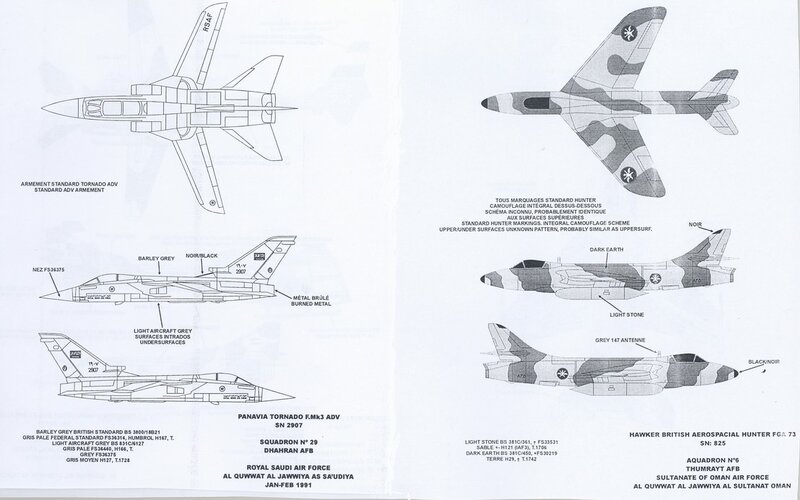 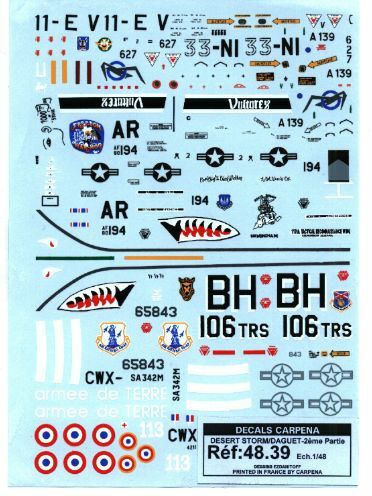 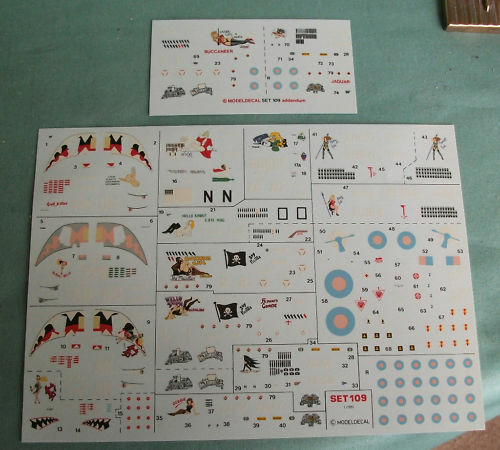 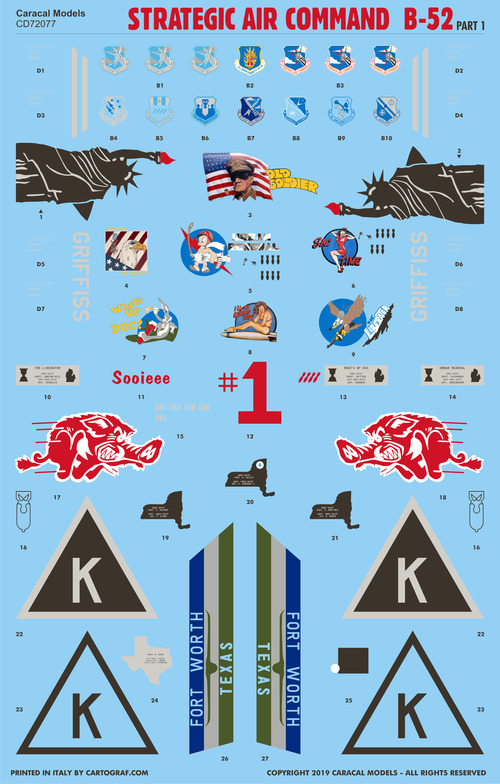 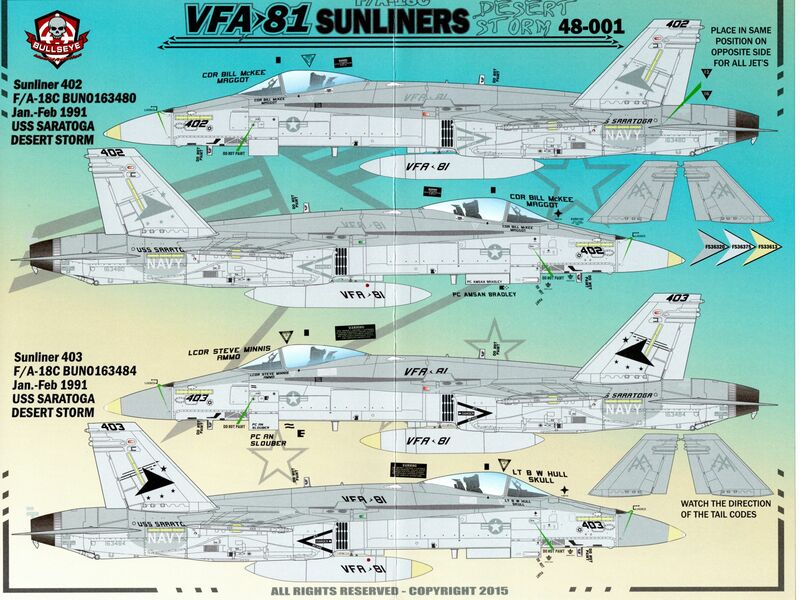 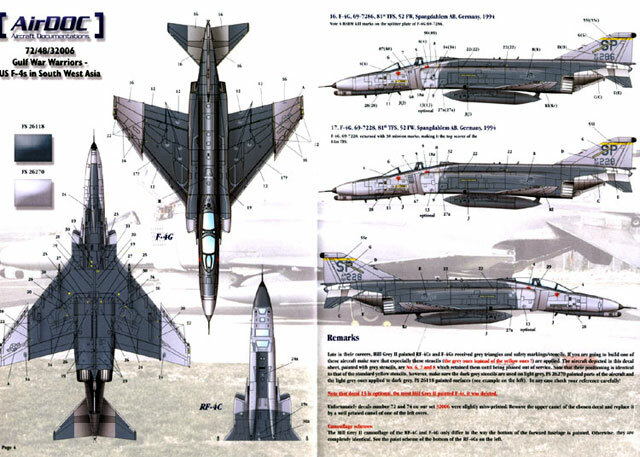 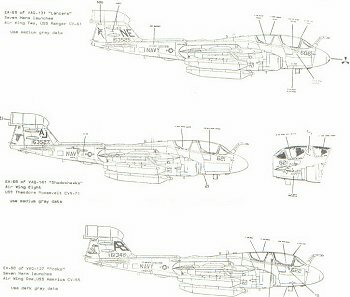 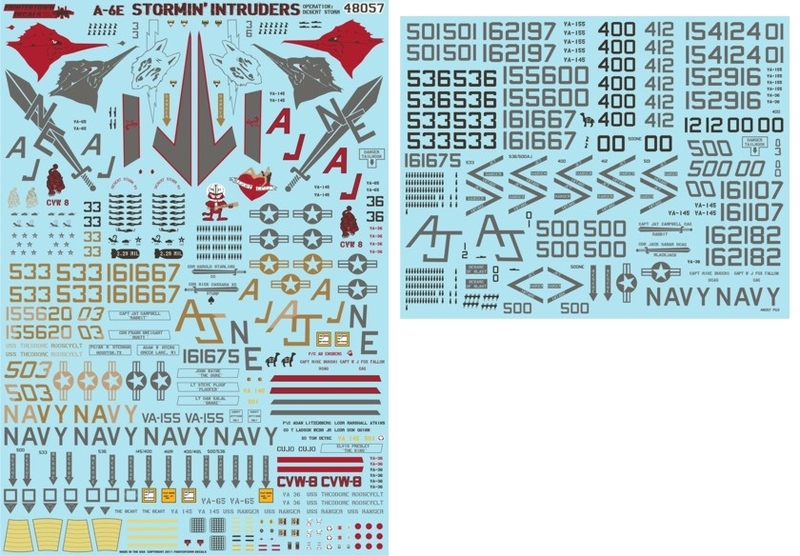 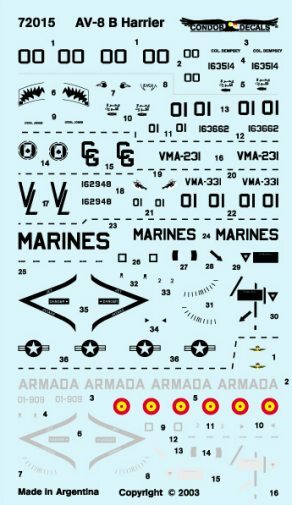 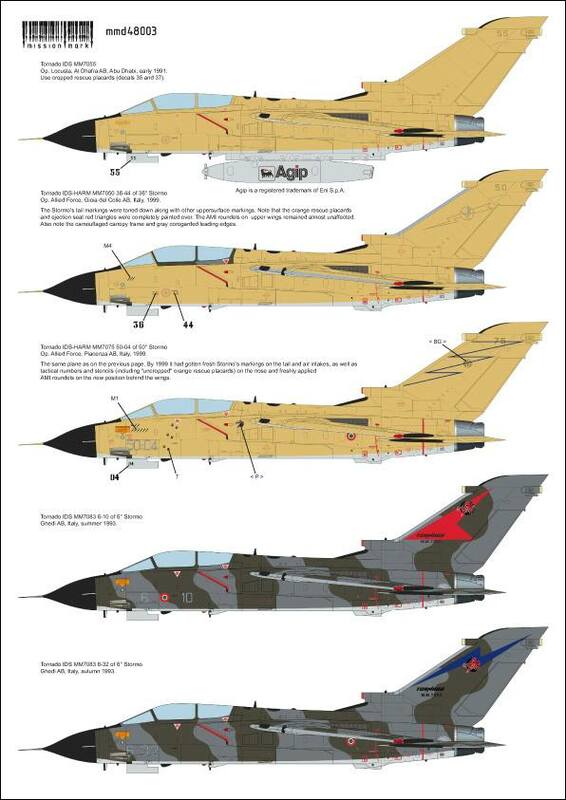 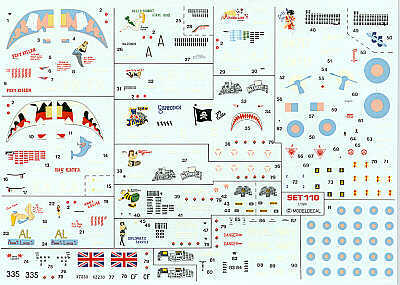 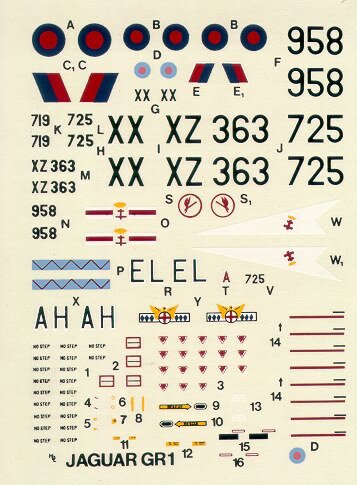 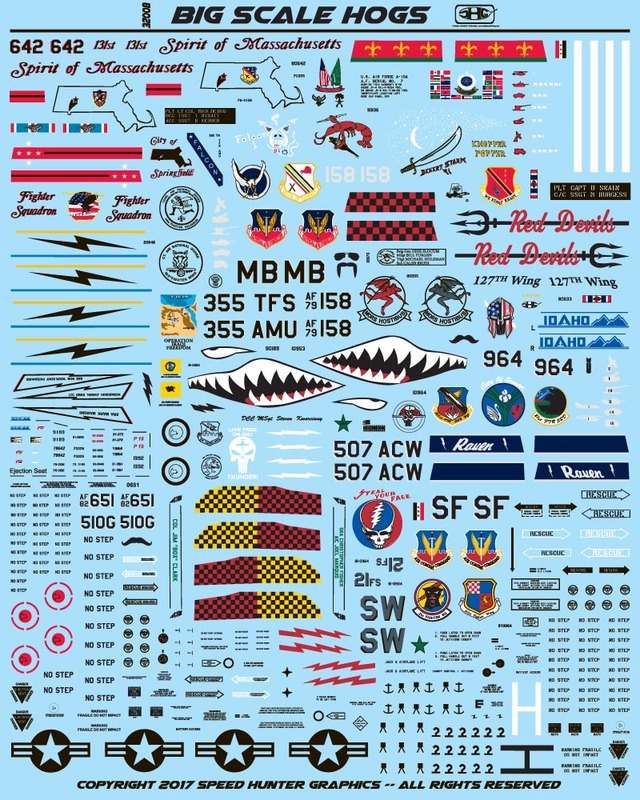 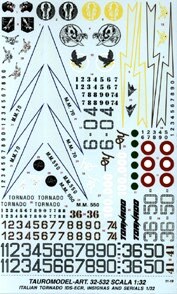 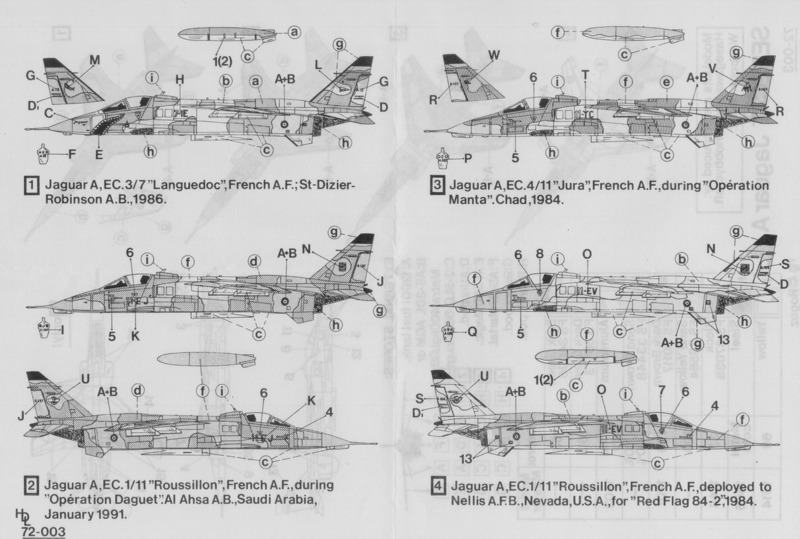 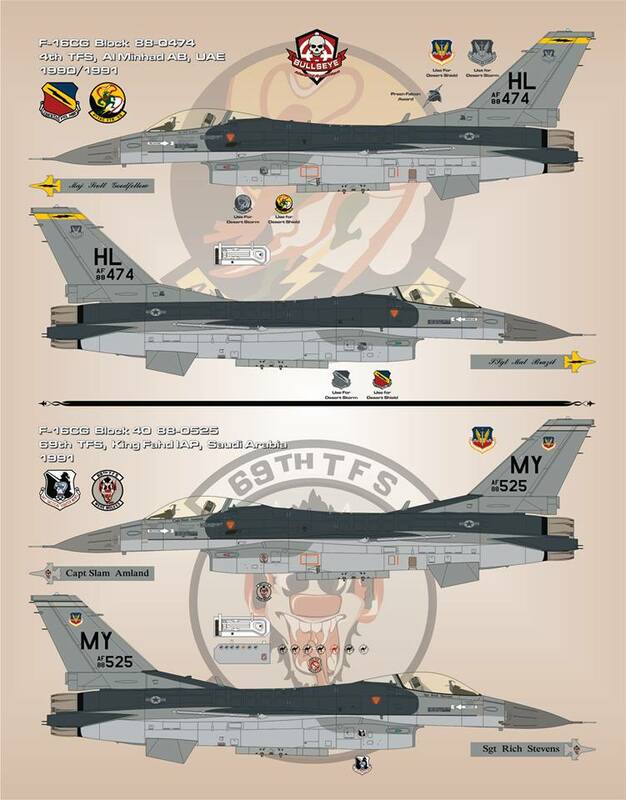 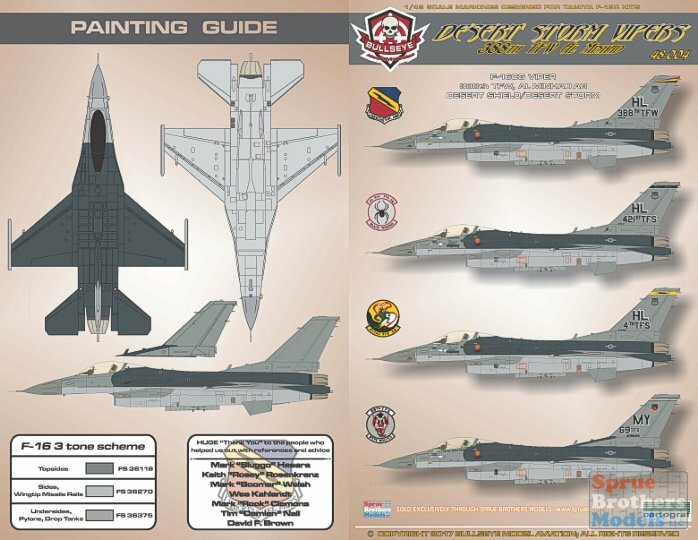 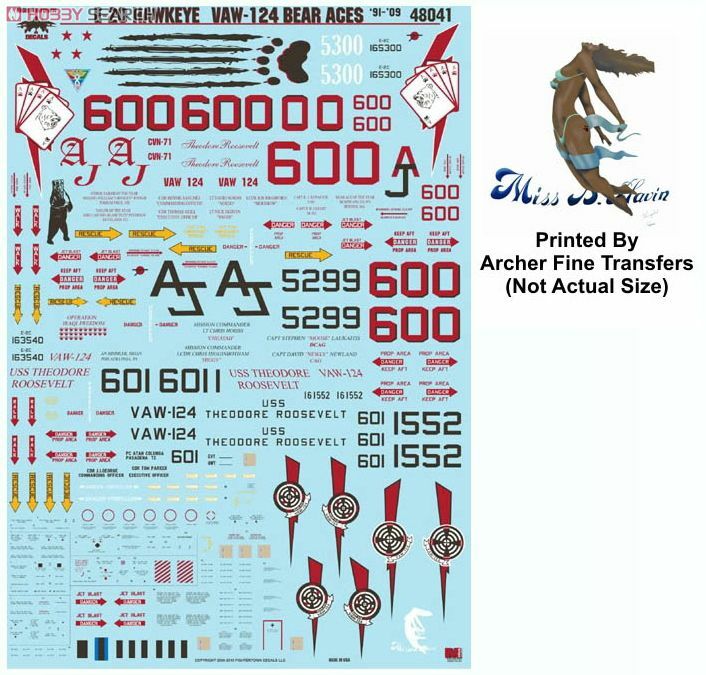 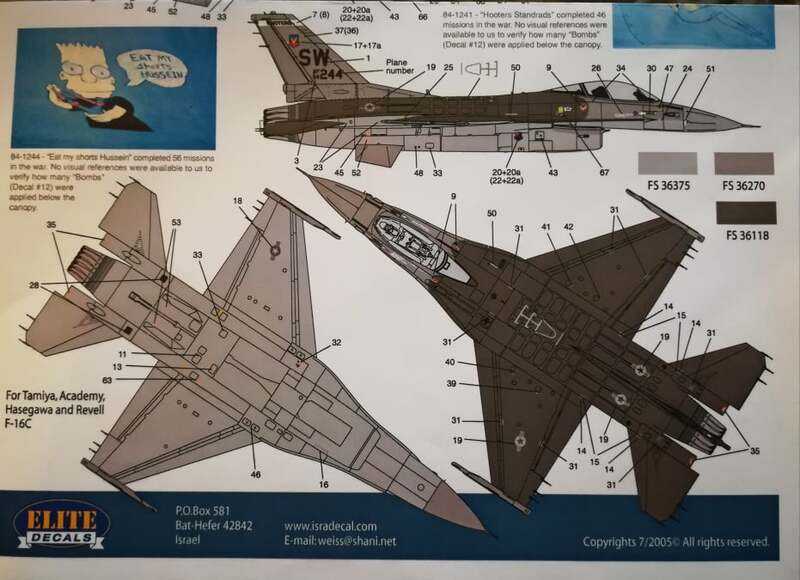 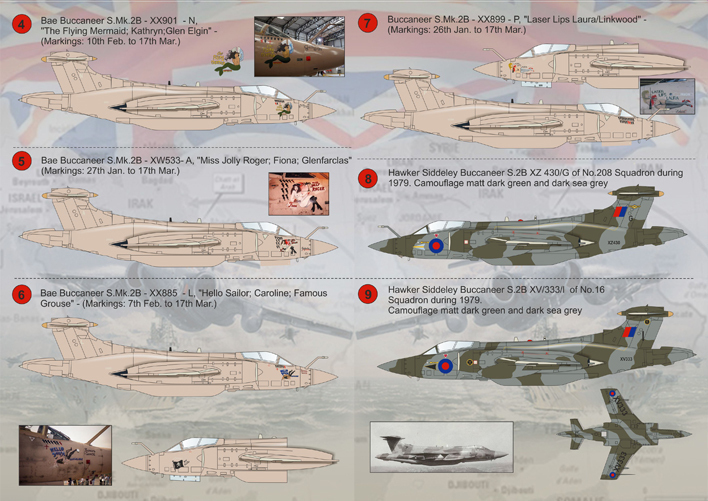 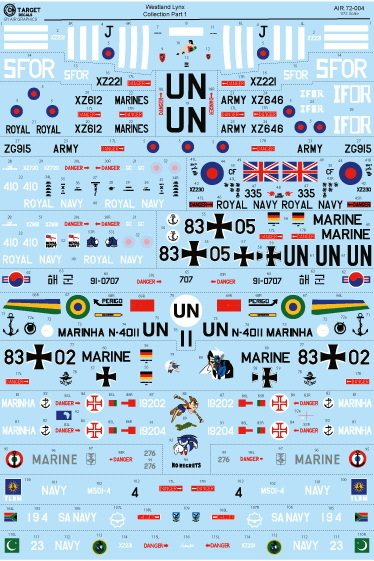 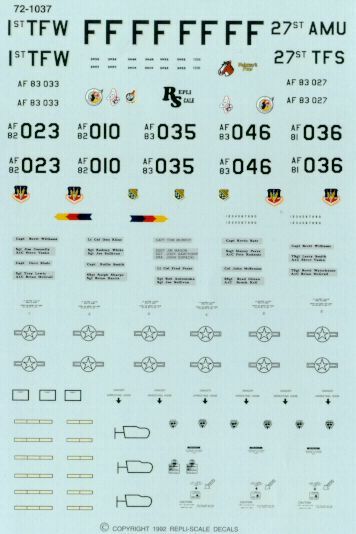 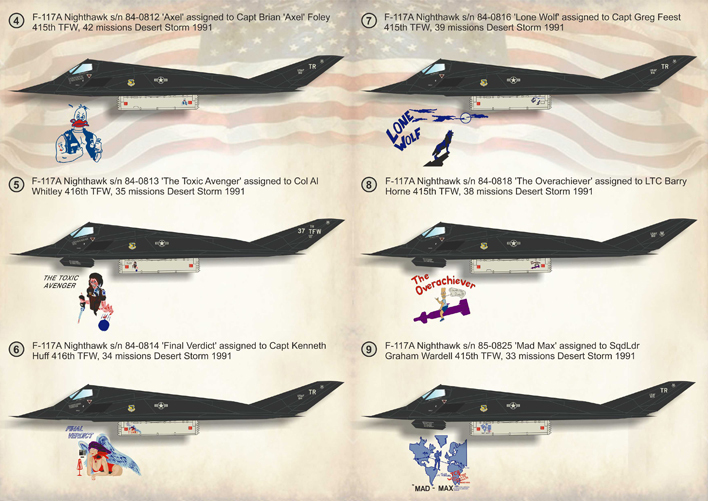 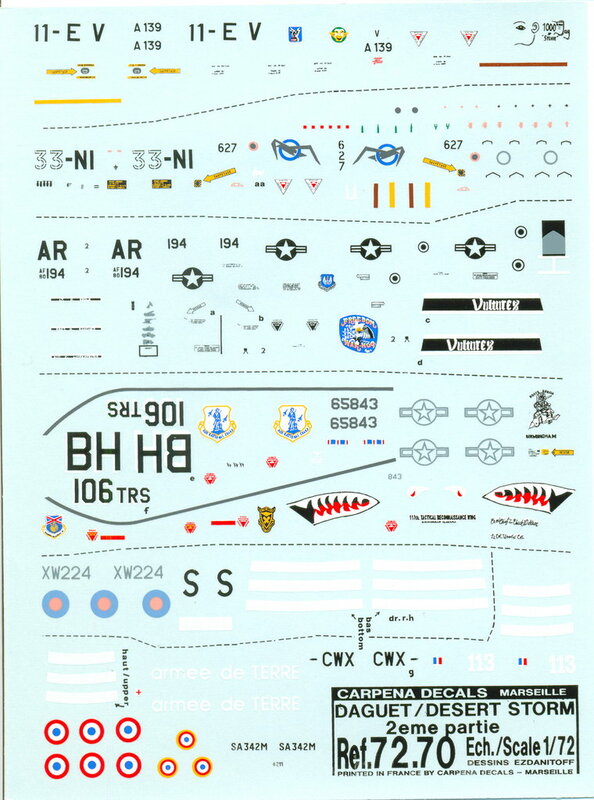 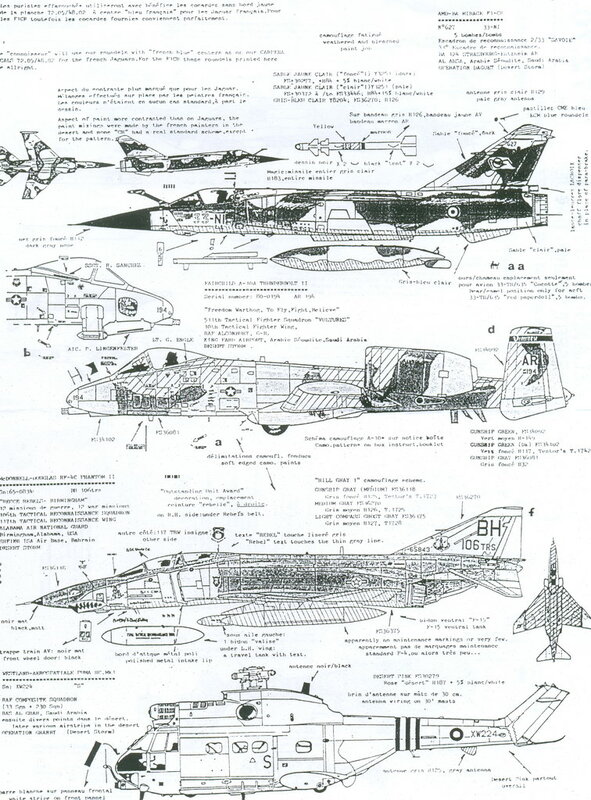 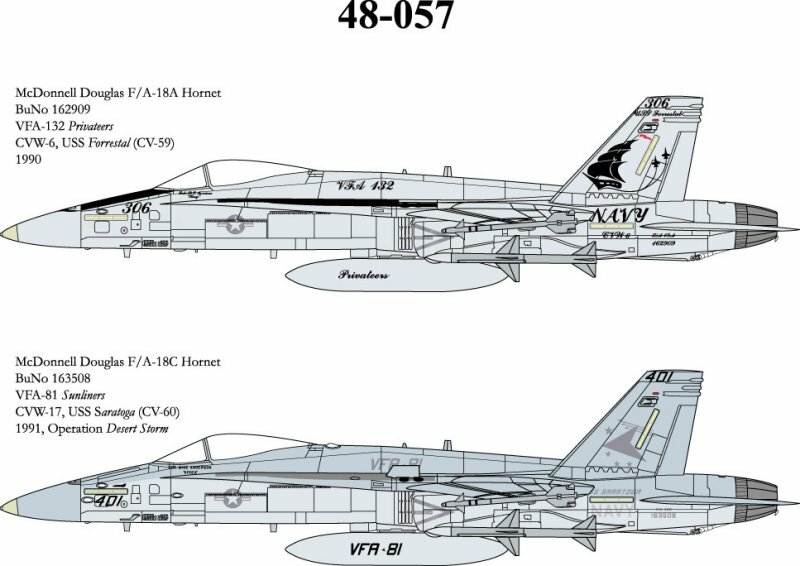 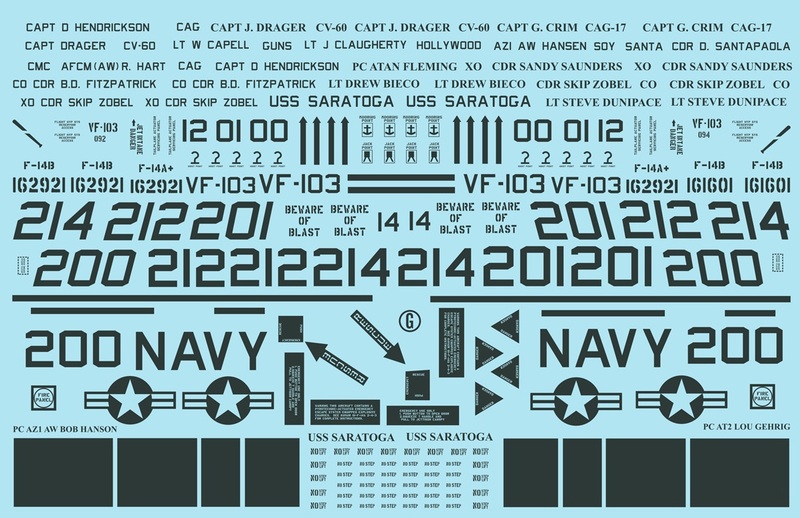 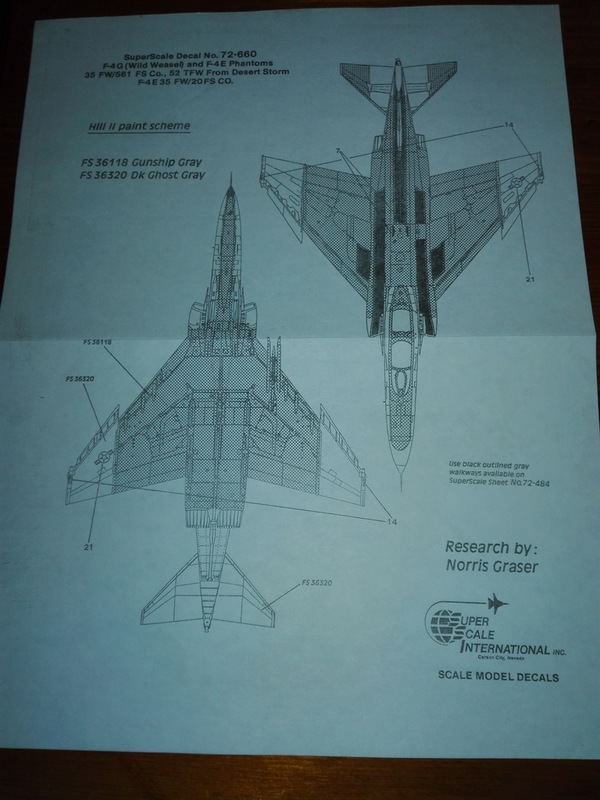 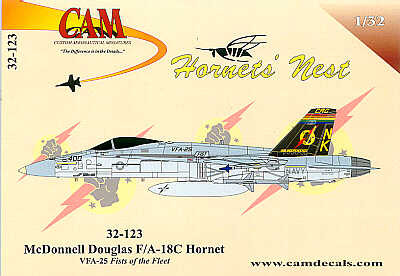 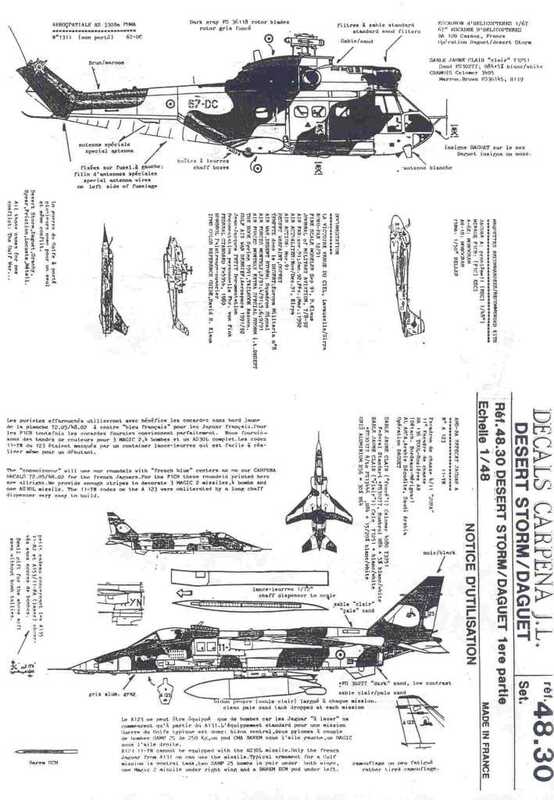 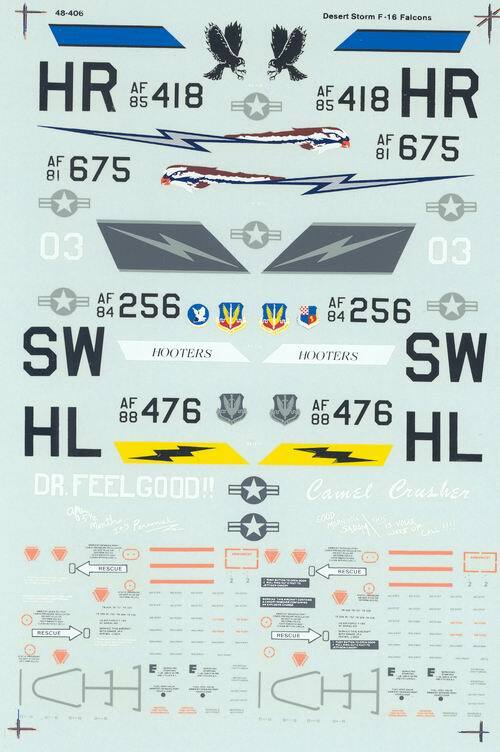 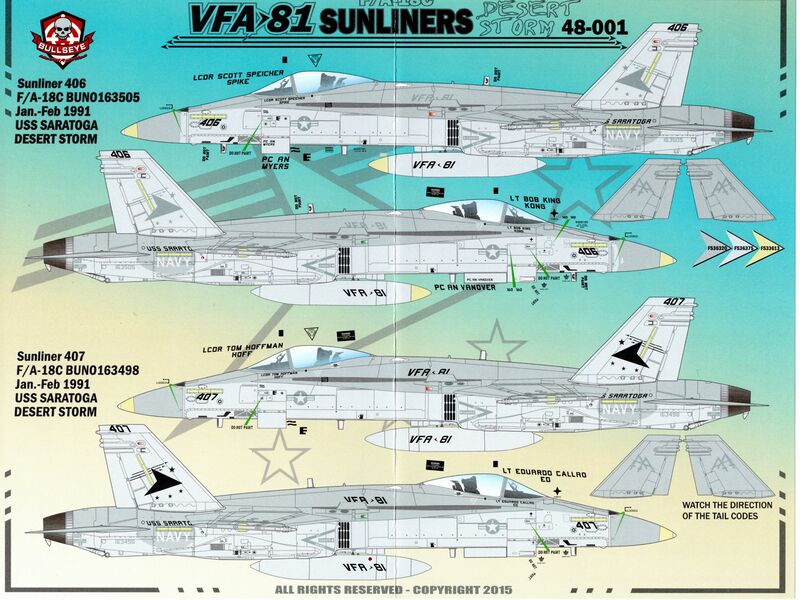 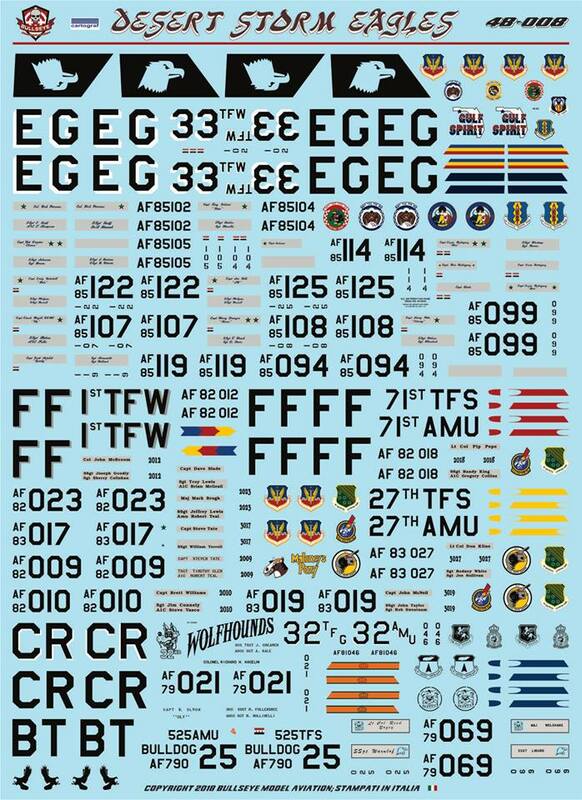 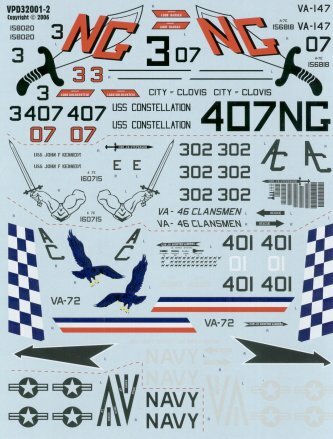 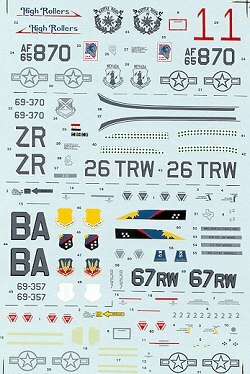 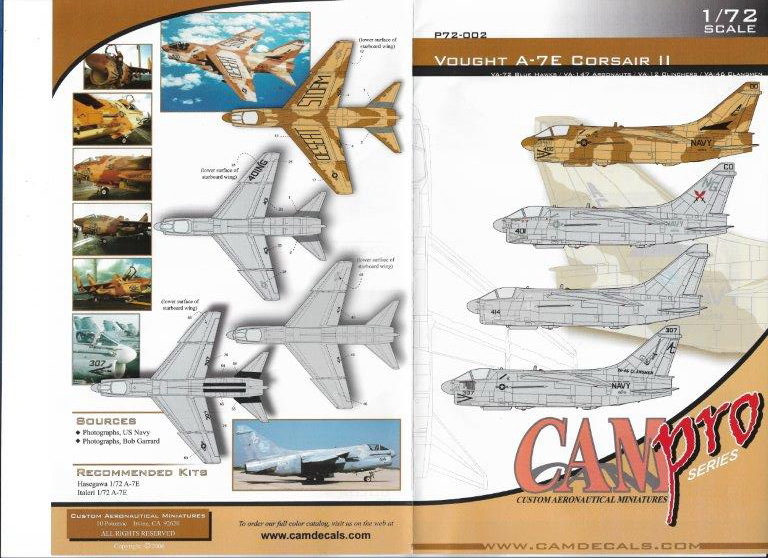 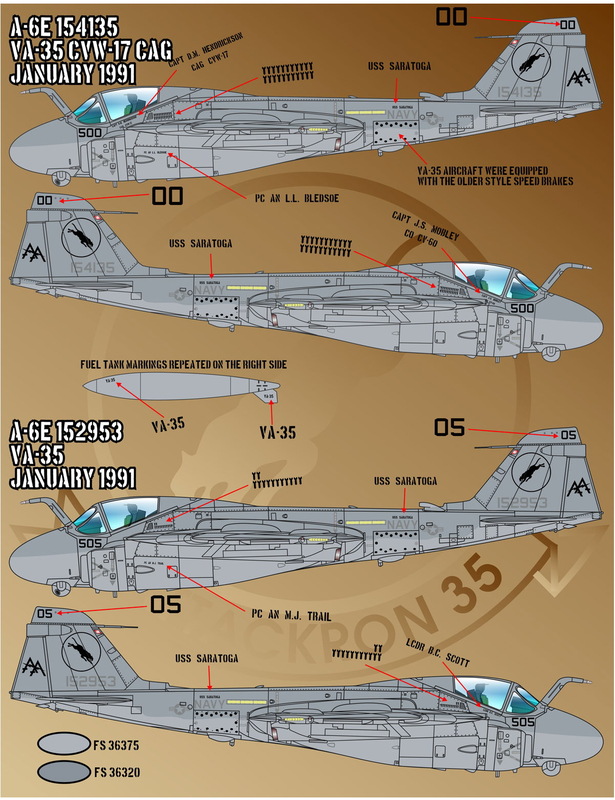 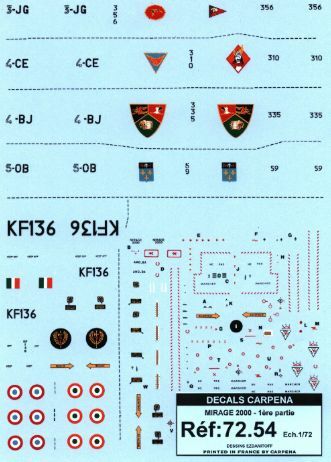 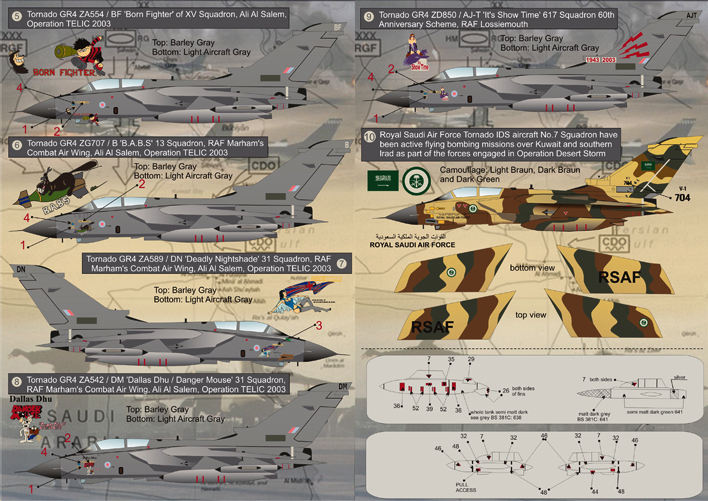 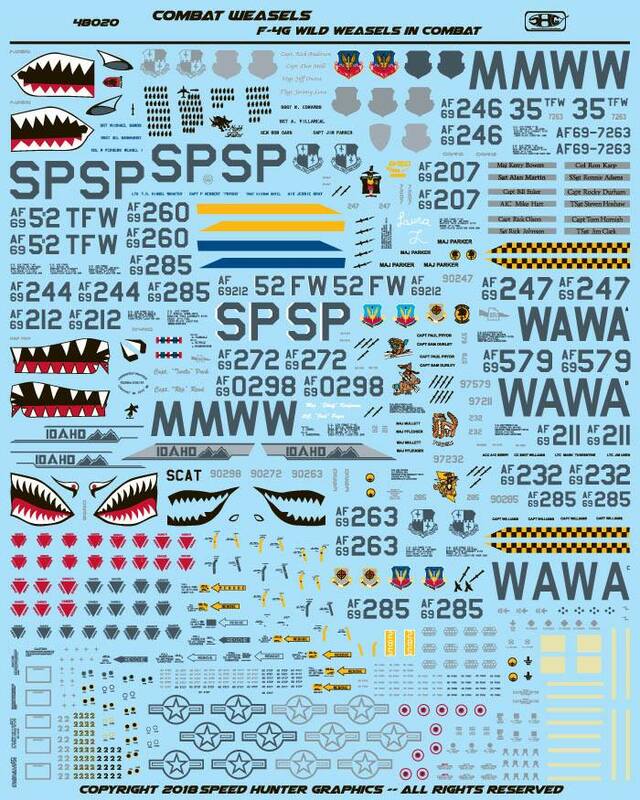 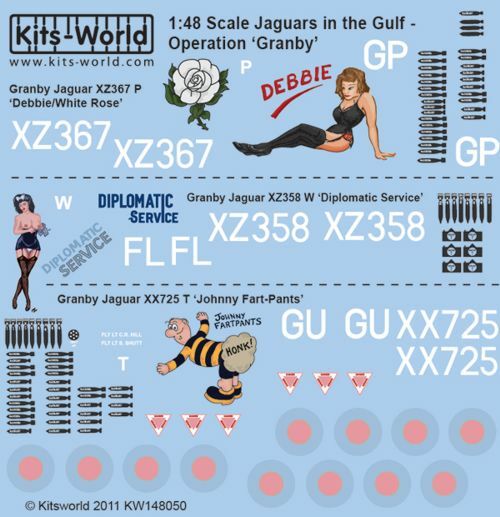 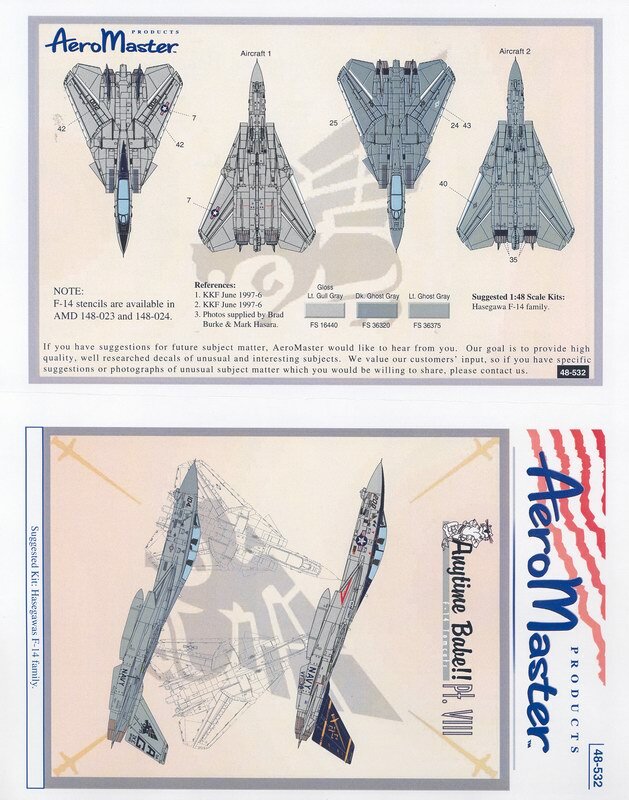 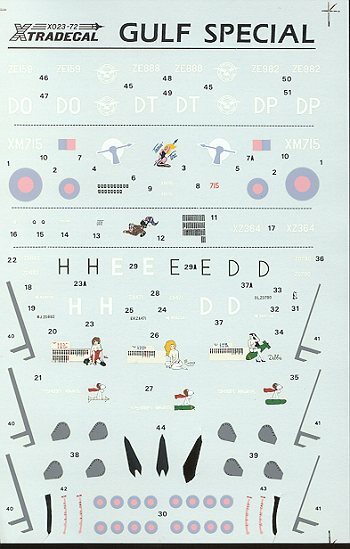 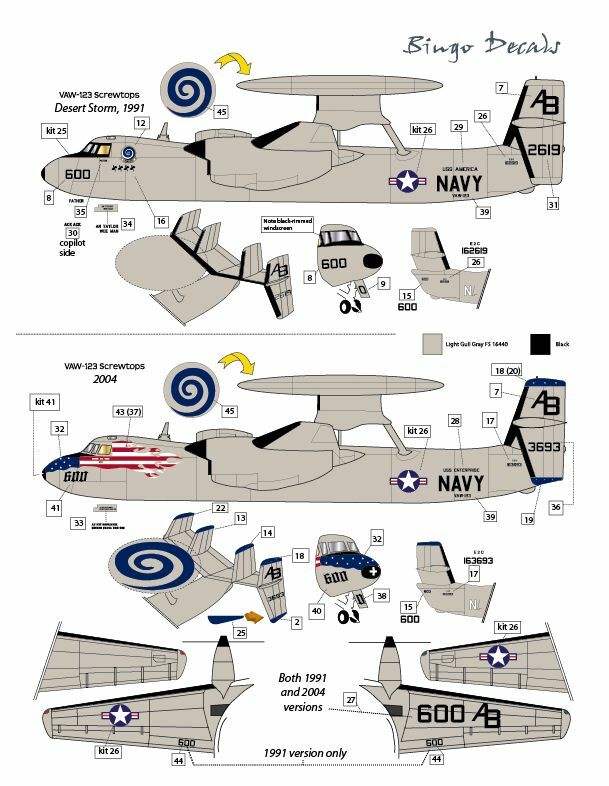 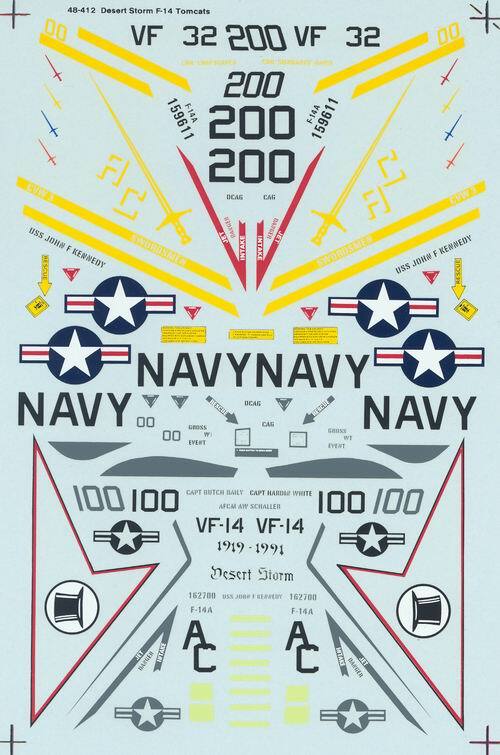 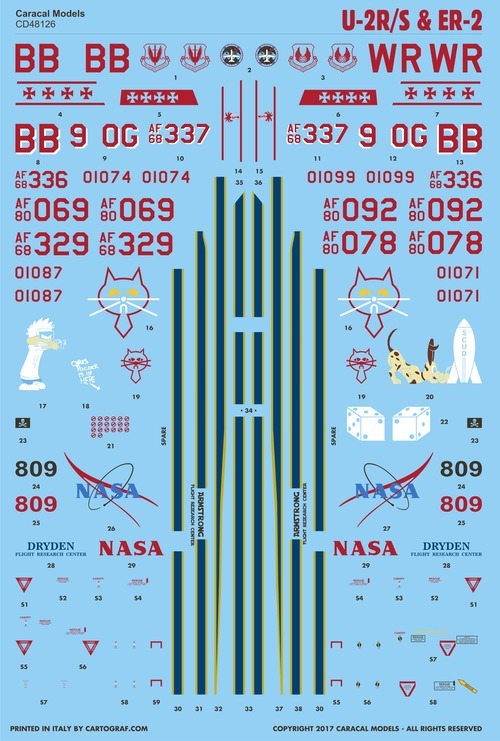 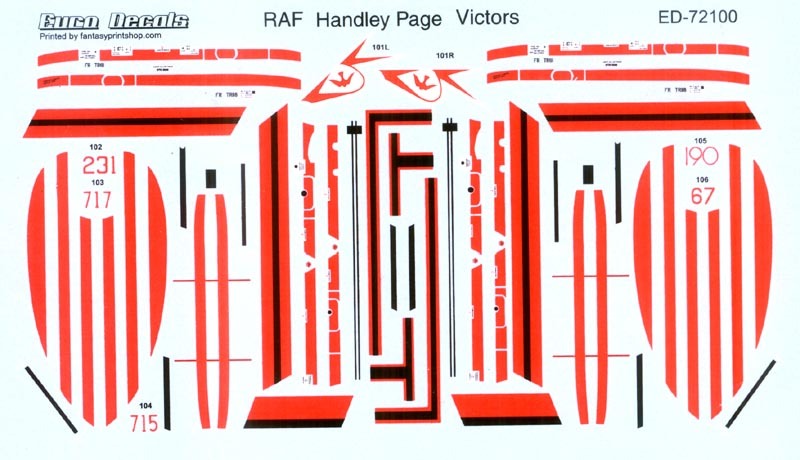 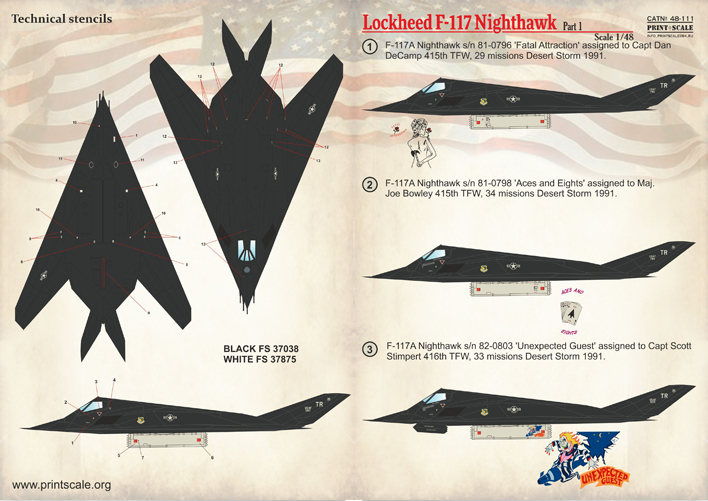 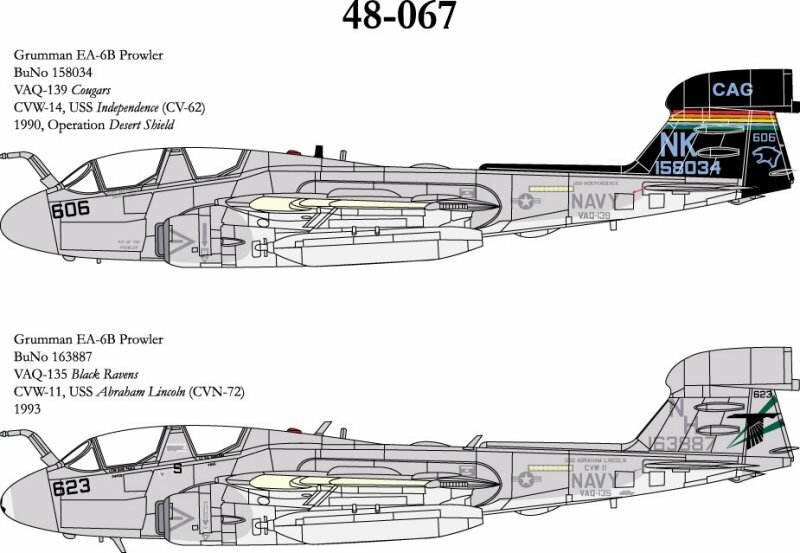 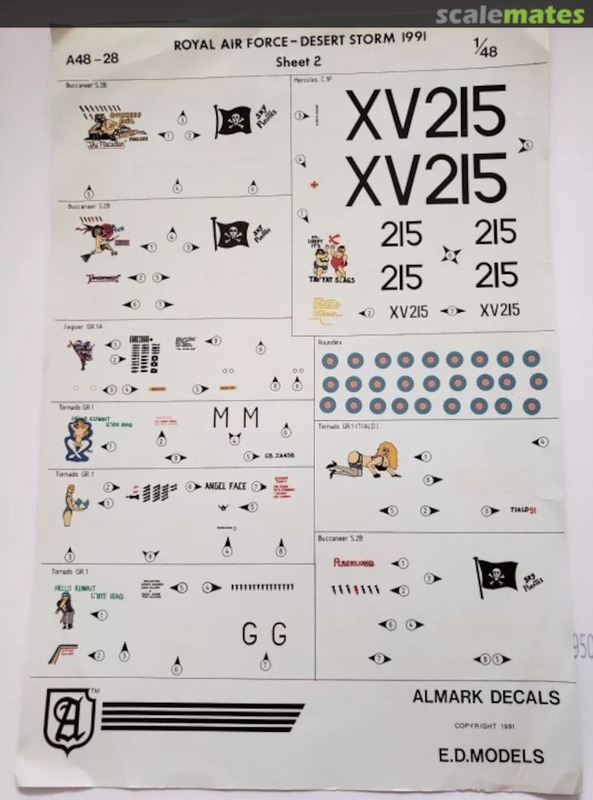 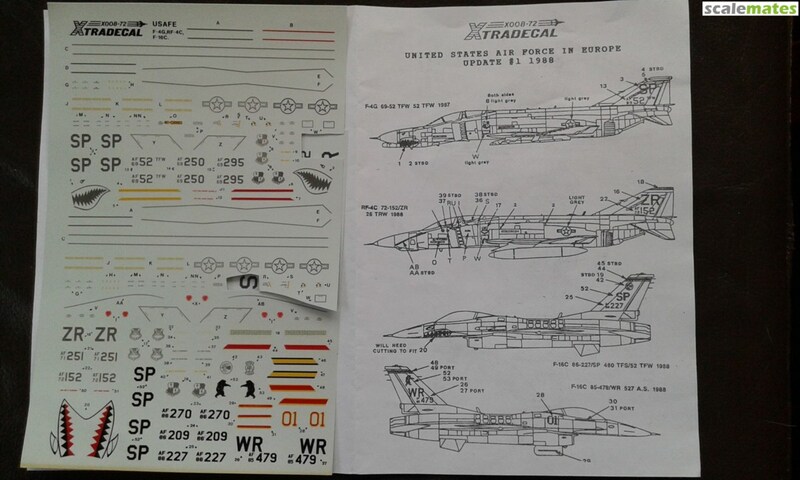 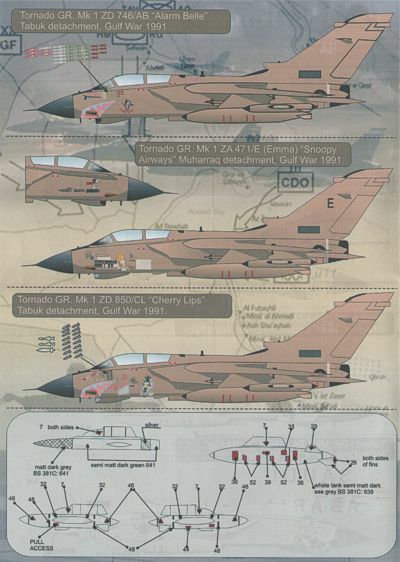 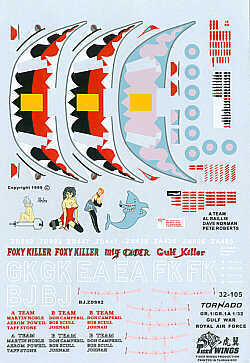 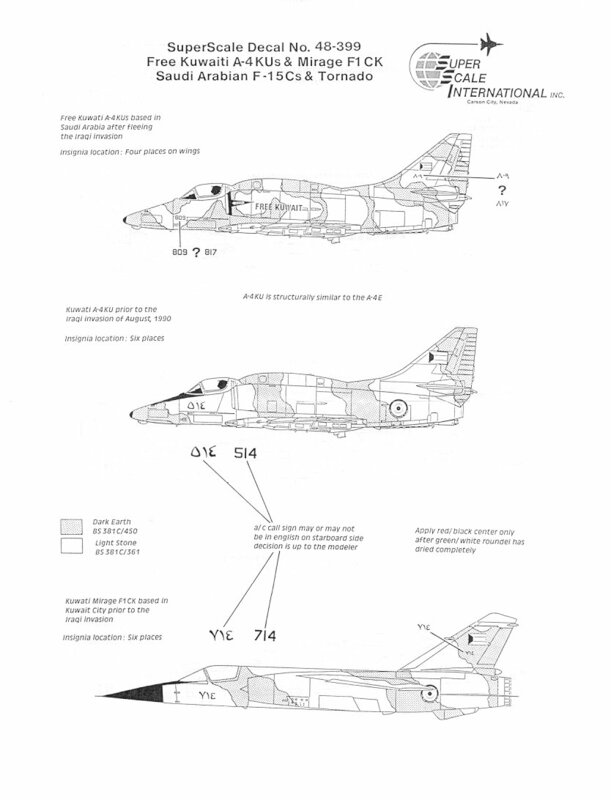 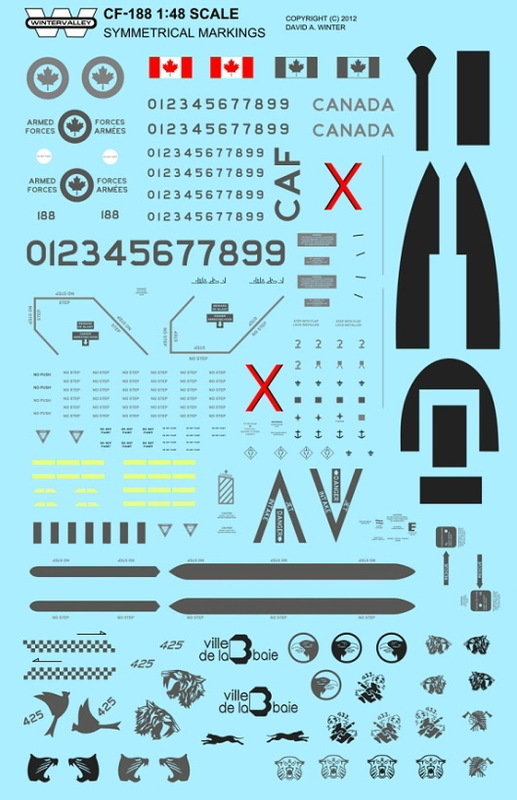 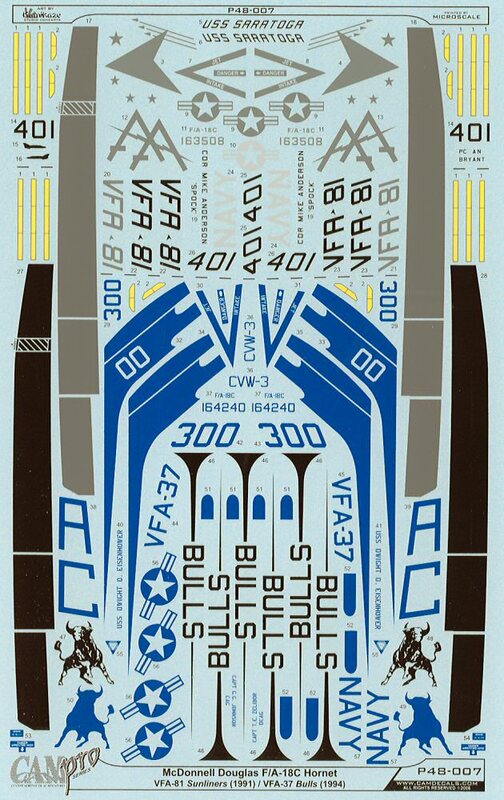 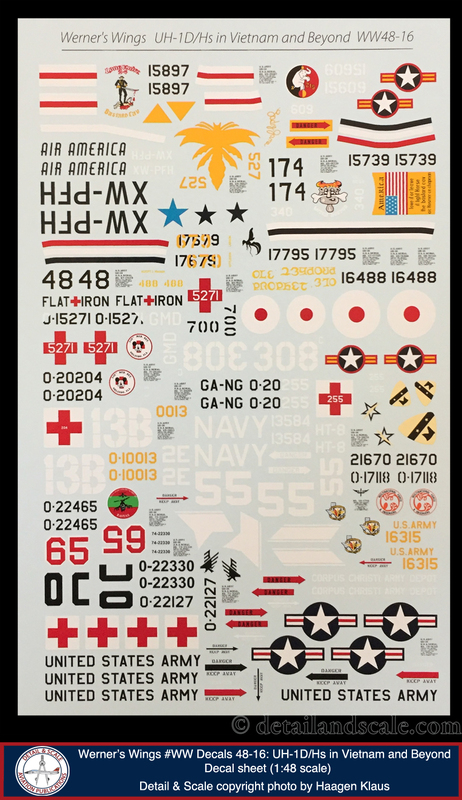 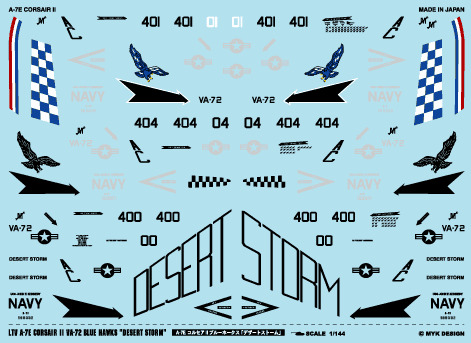 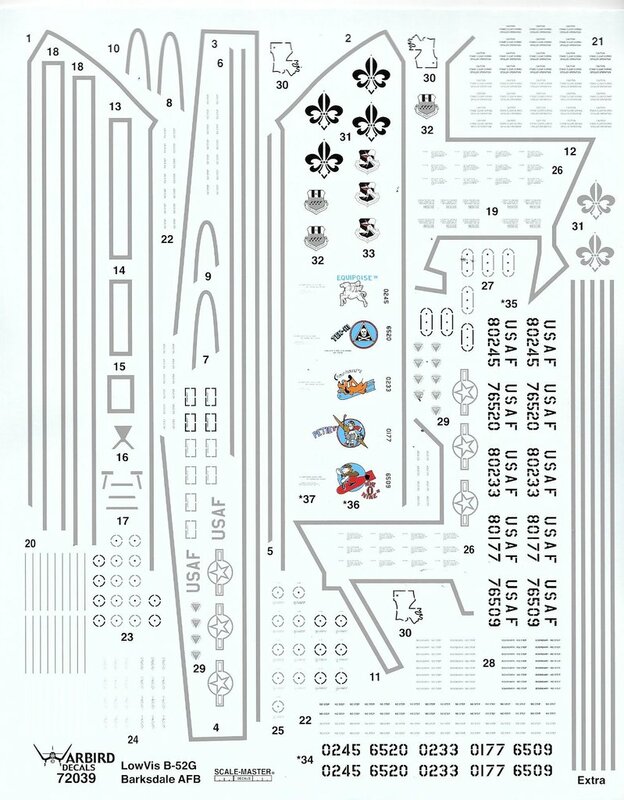 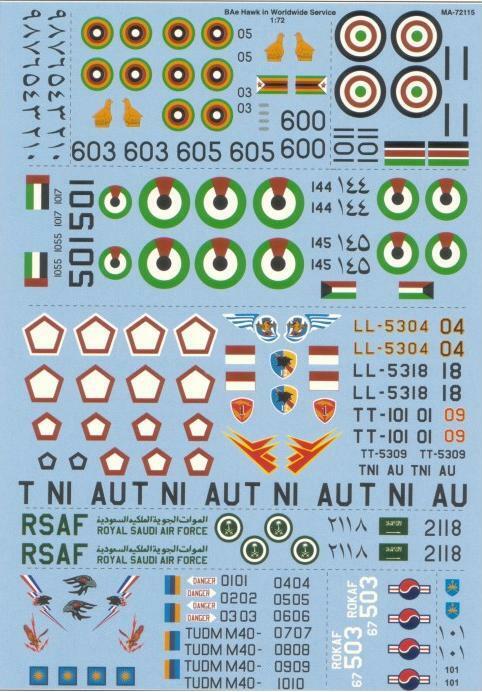 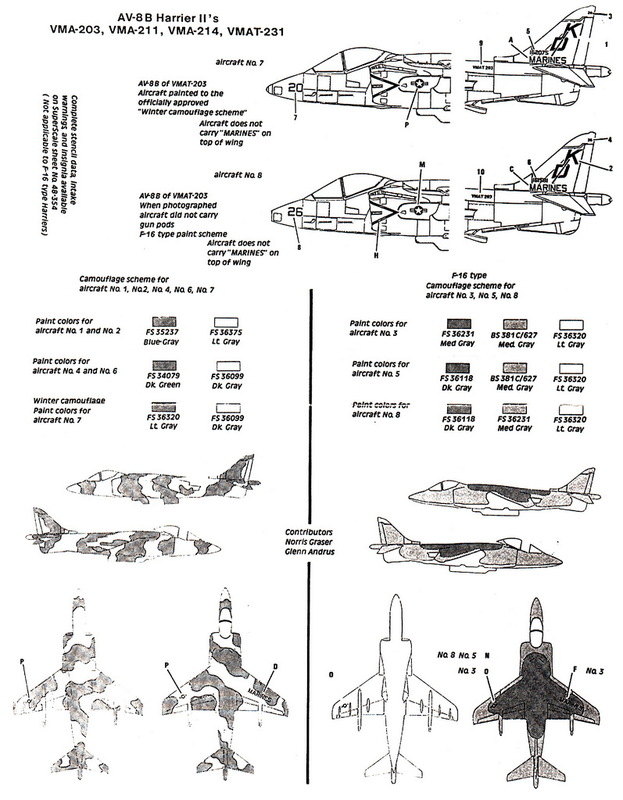 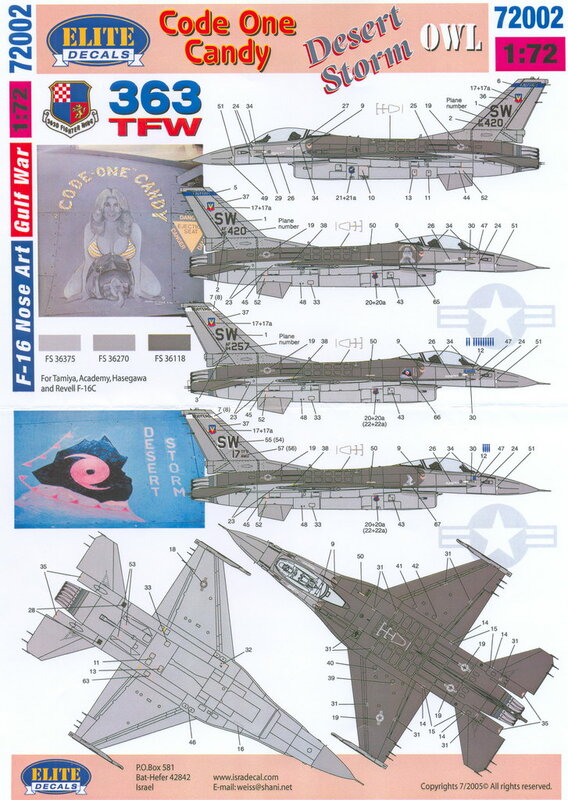 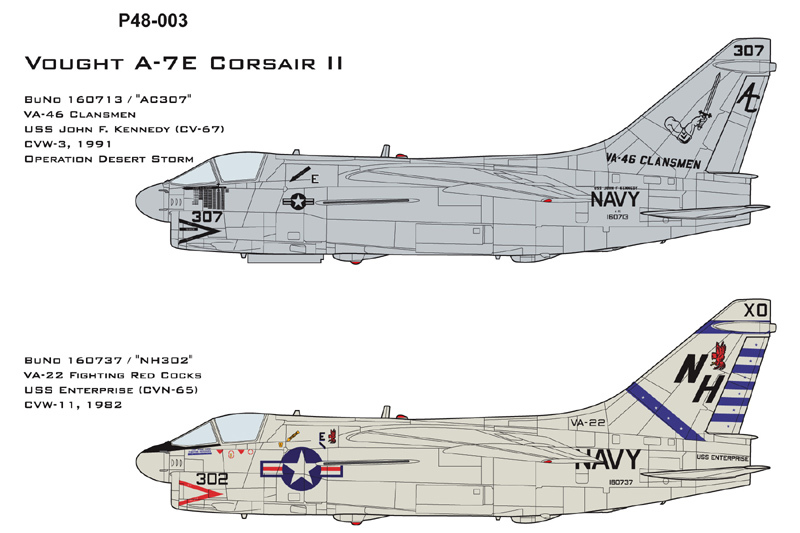 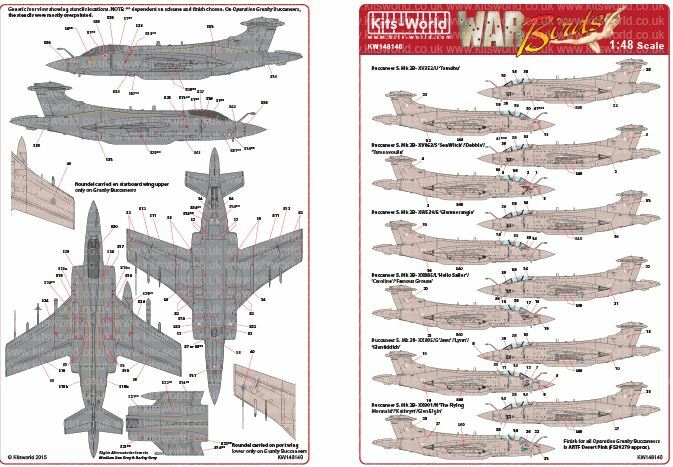 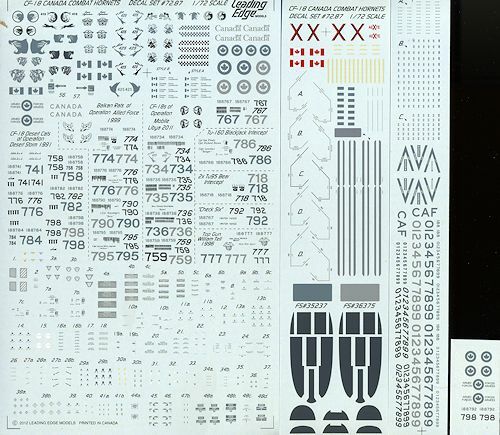 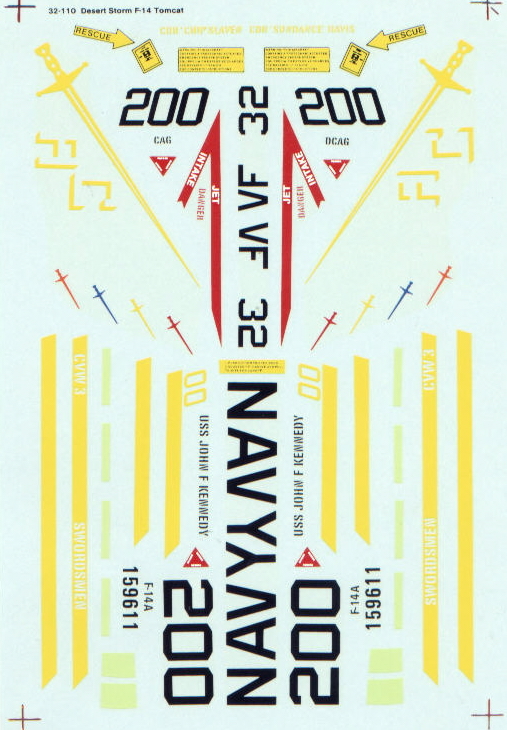 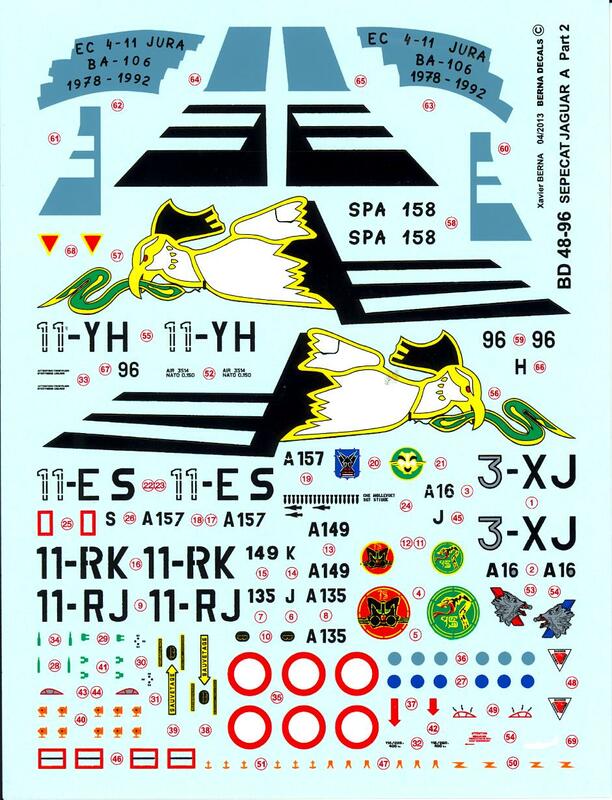 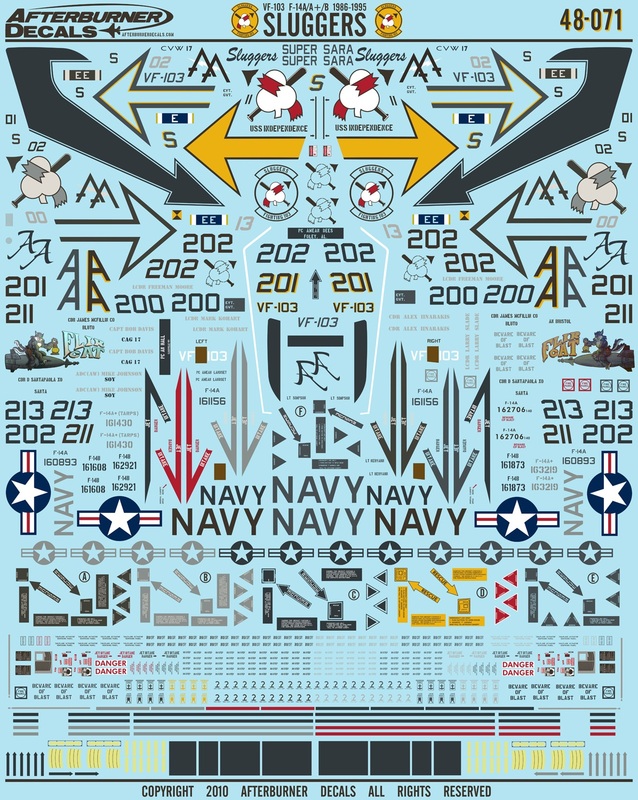 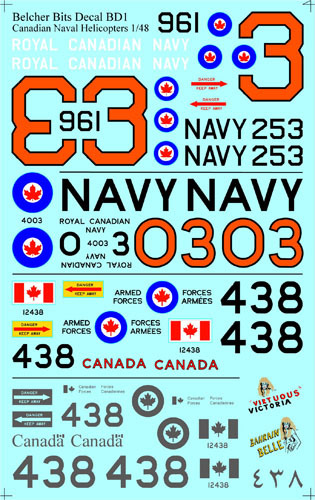 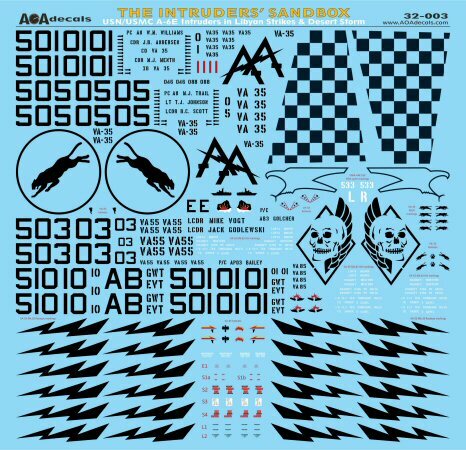 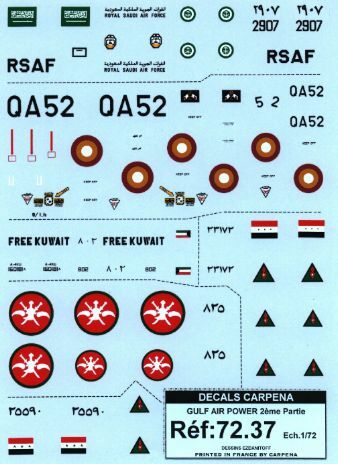 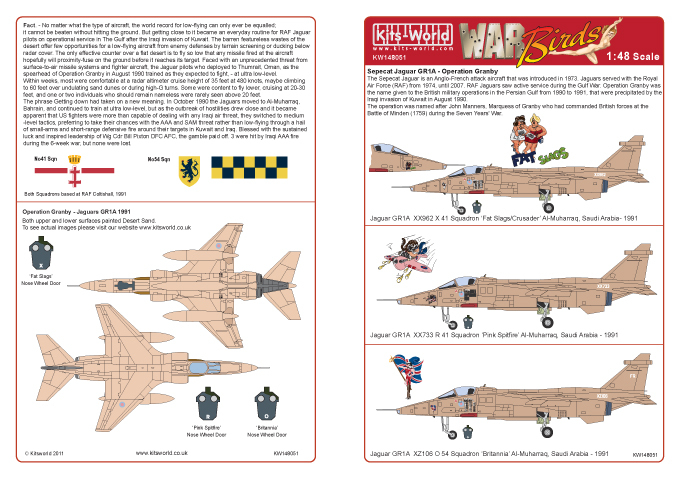 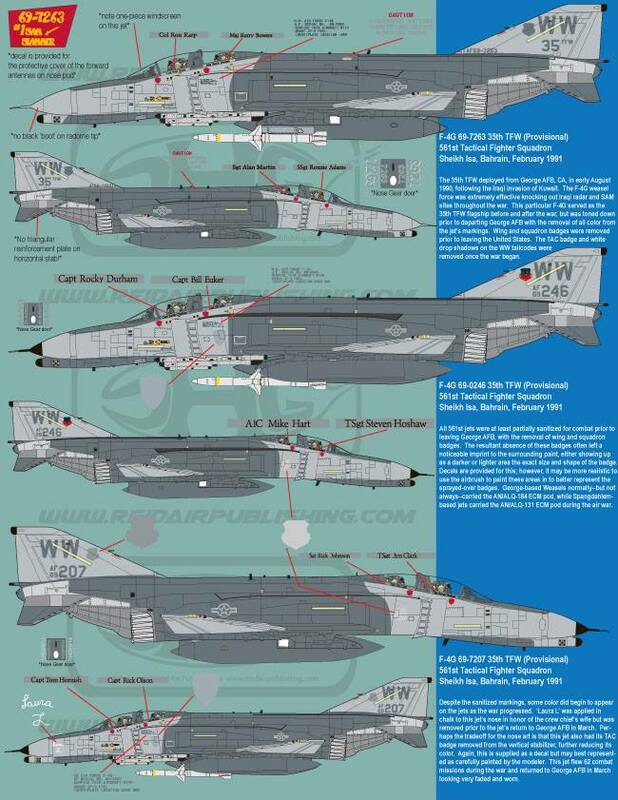 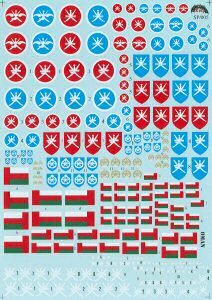 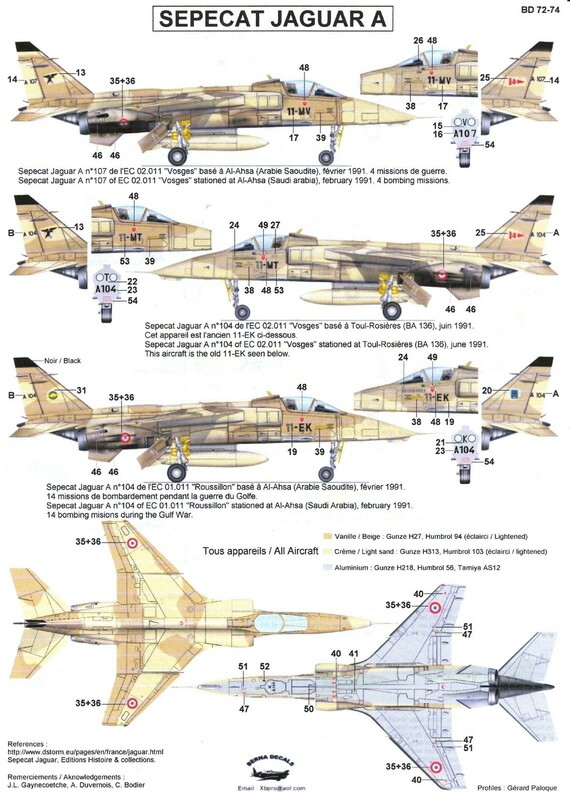 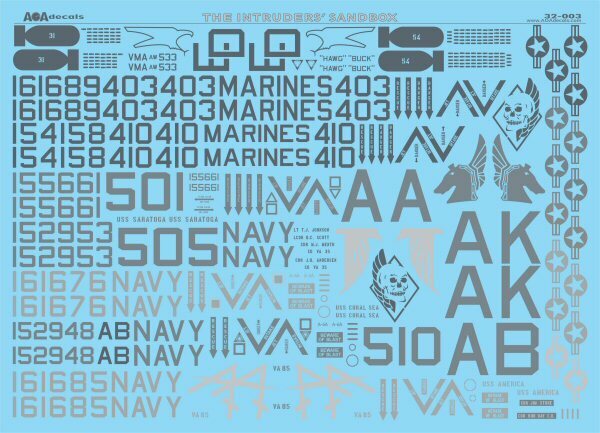 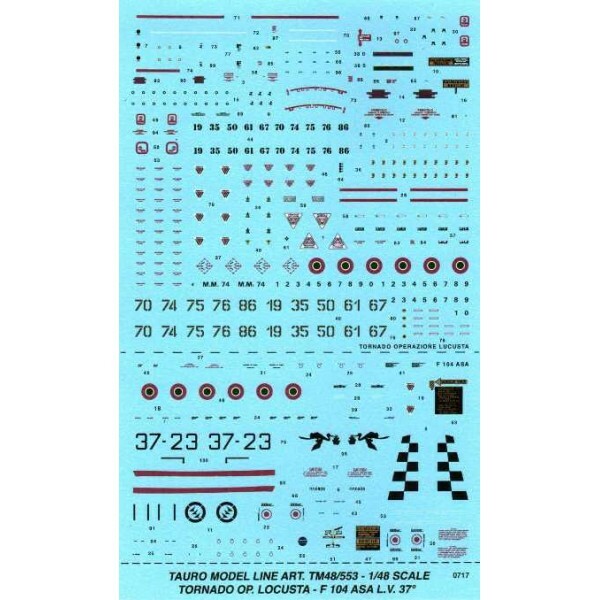 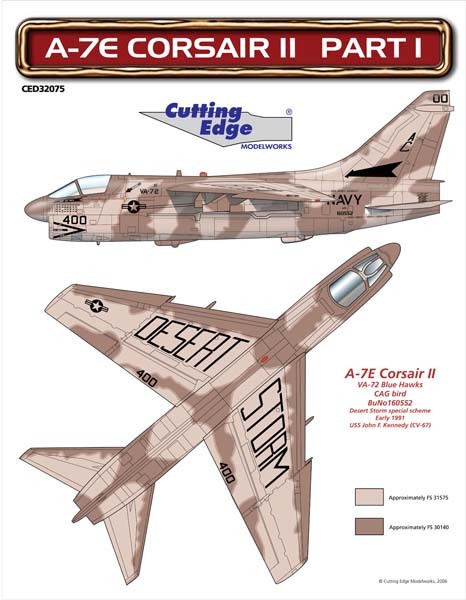 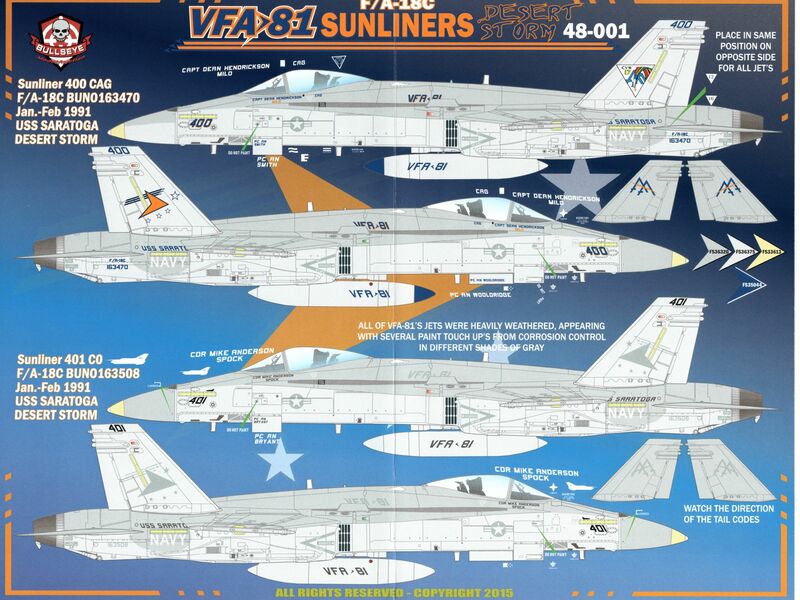 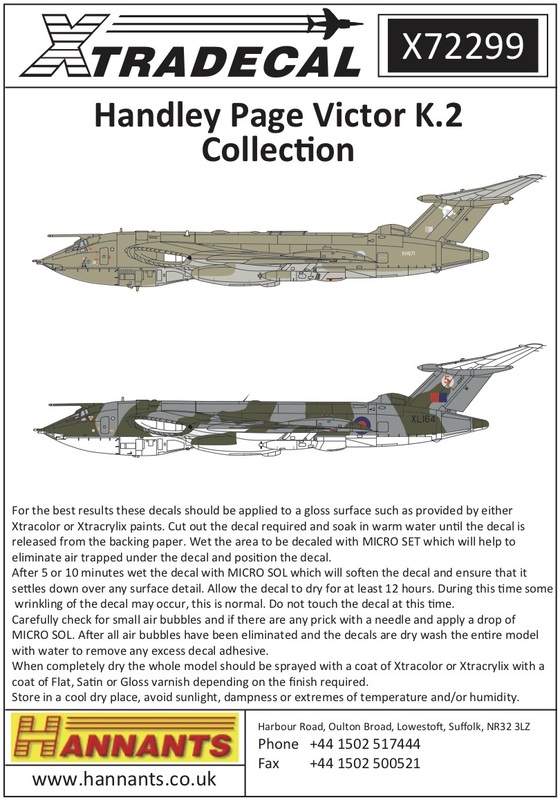 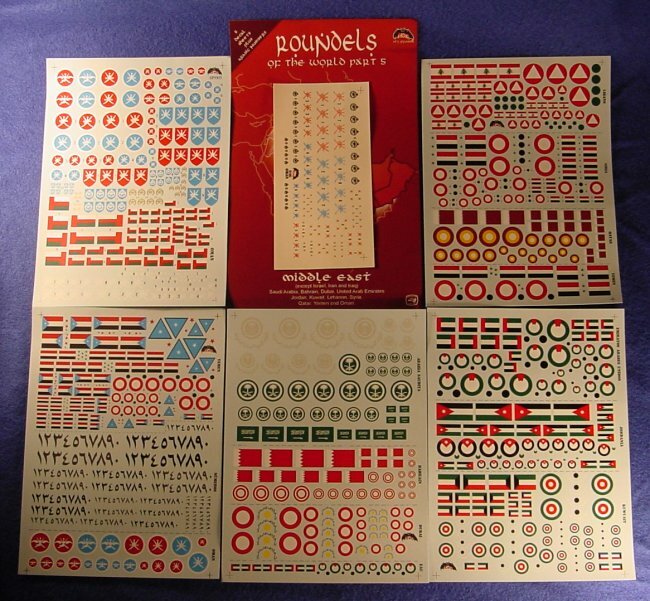 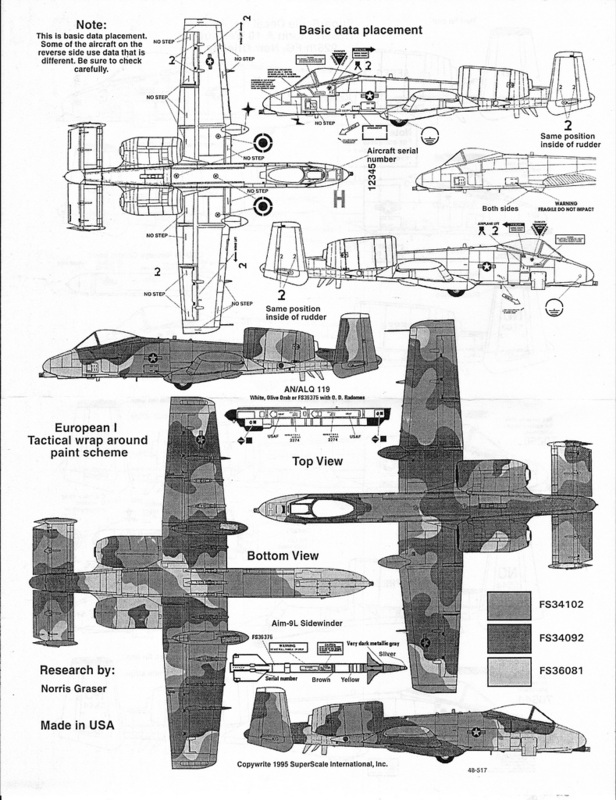 Xtradecal - X02048 RAF Gr.1 XZ118 "Buster Gonad"
Check six decals by Colorslide - CS72005 XX895/G "Jaws/Lynn/Glenfiddich"; XX885/L "Caroline, Hello Sailor"
NOTE: There is a mistake in the instructions for the Kuwaiti and UAE Hawks. 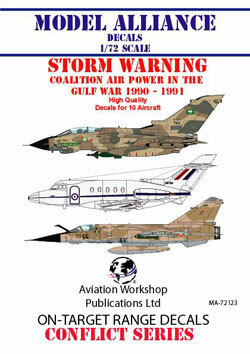 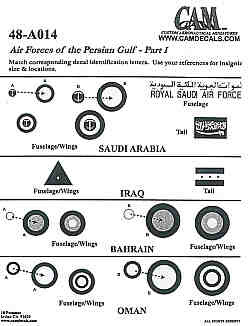 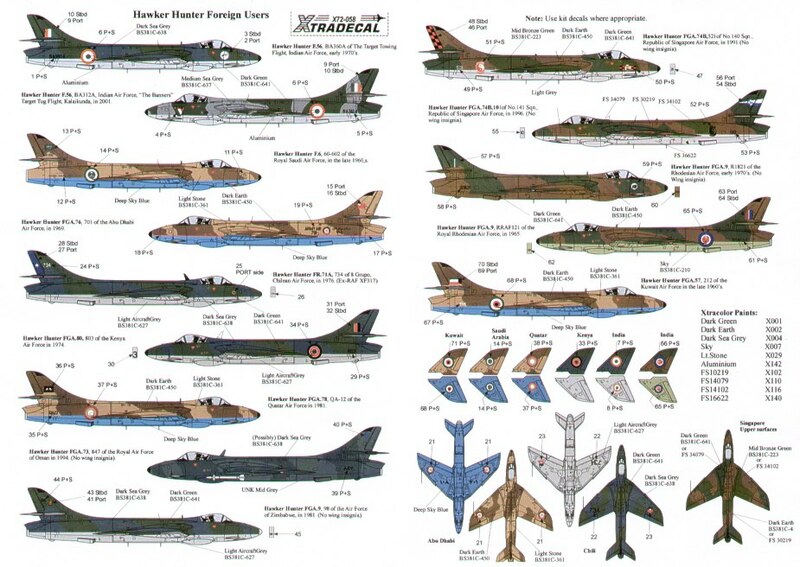 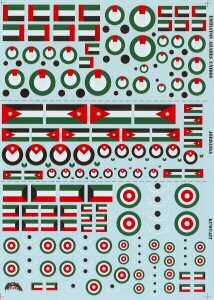 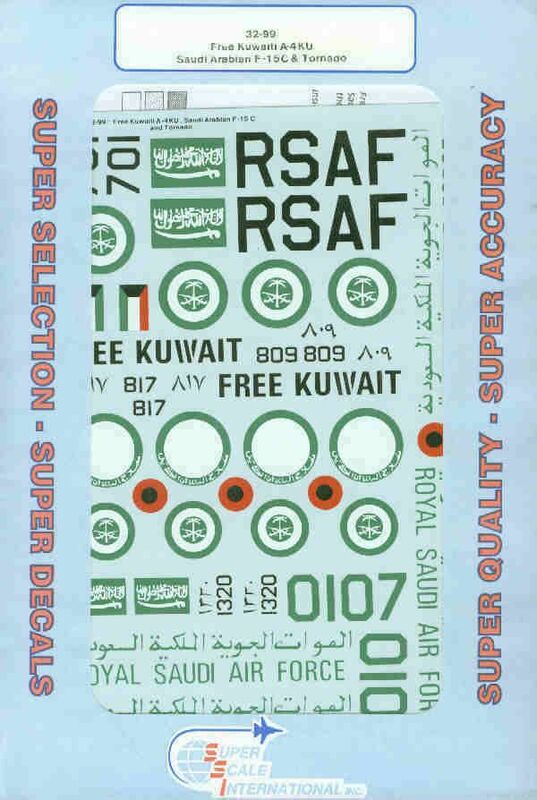 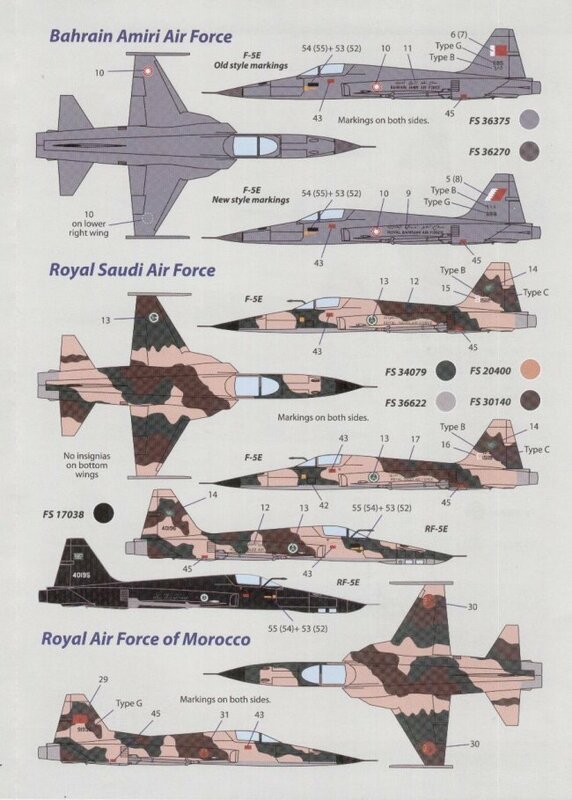 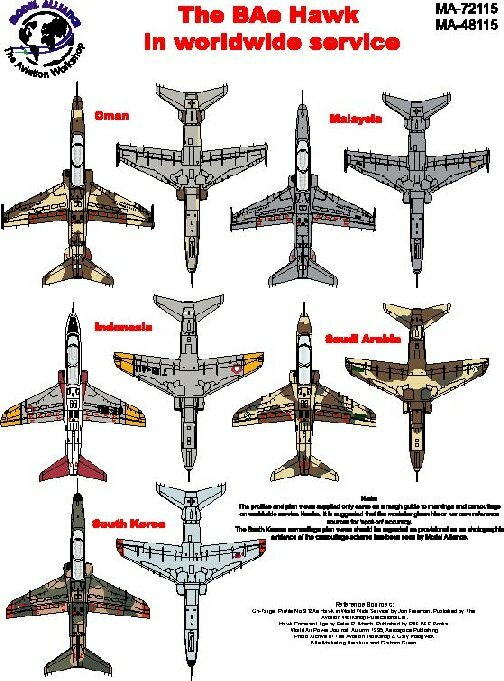 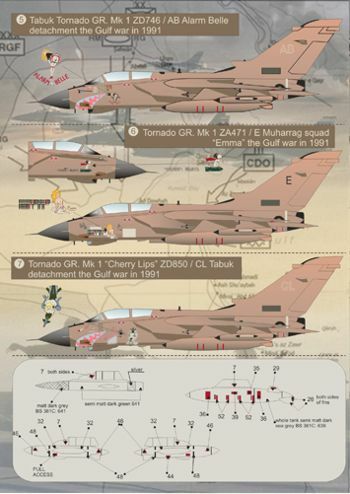 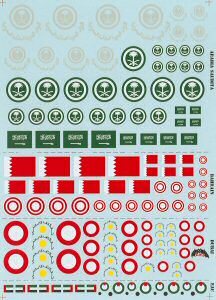 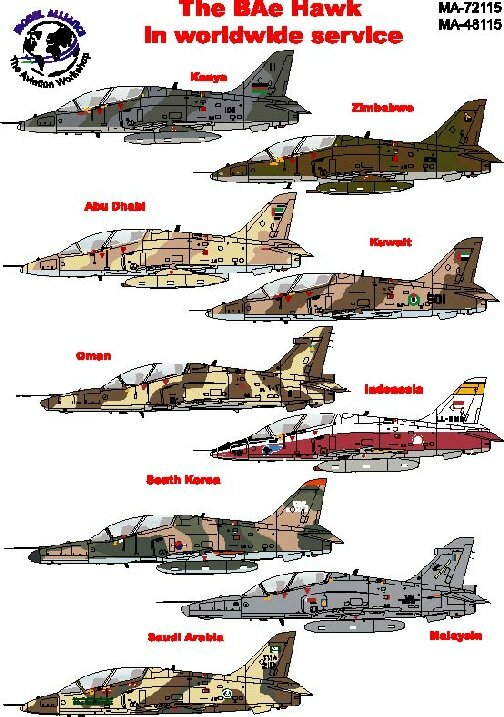 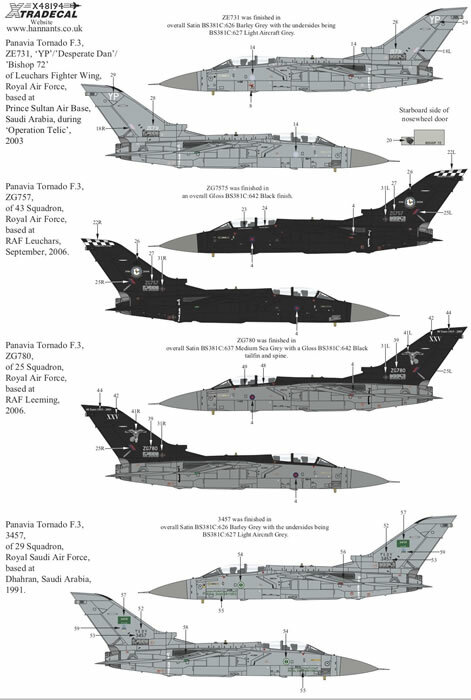 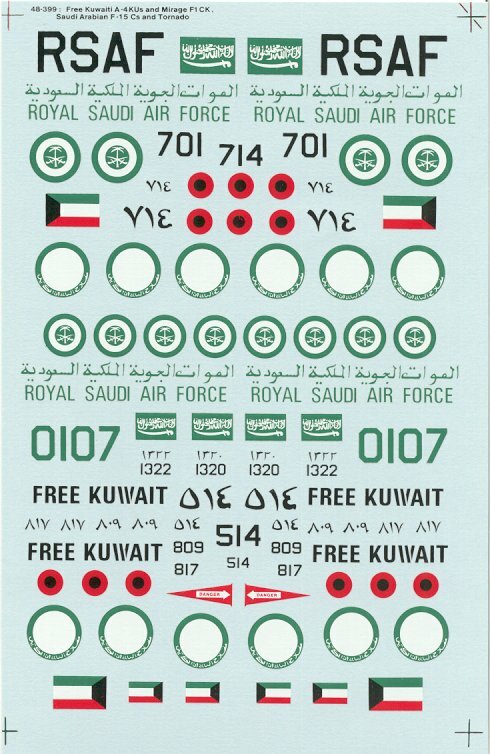 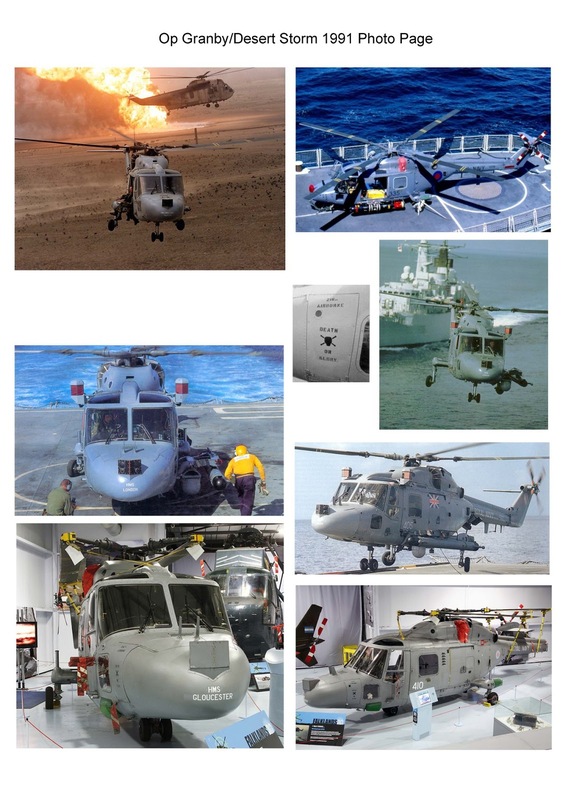 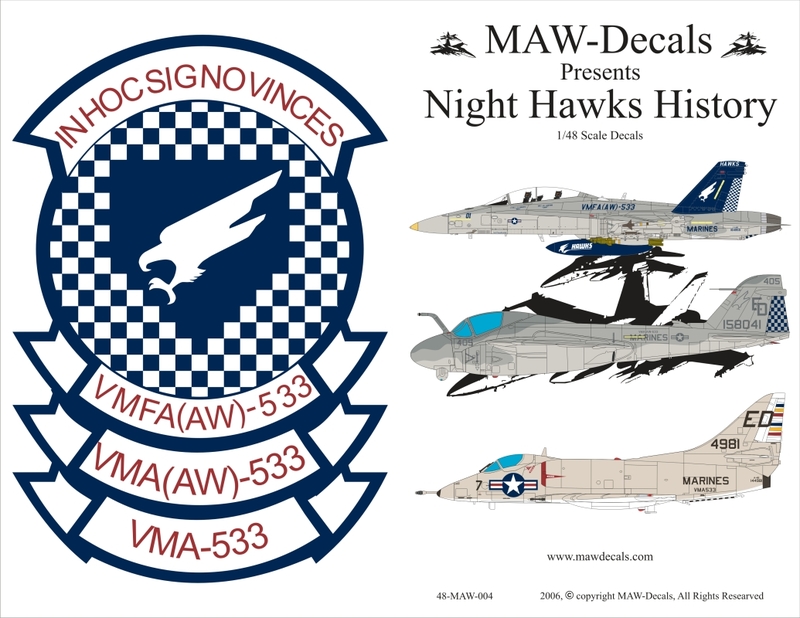 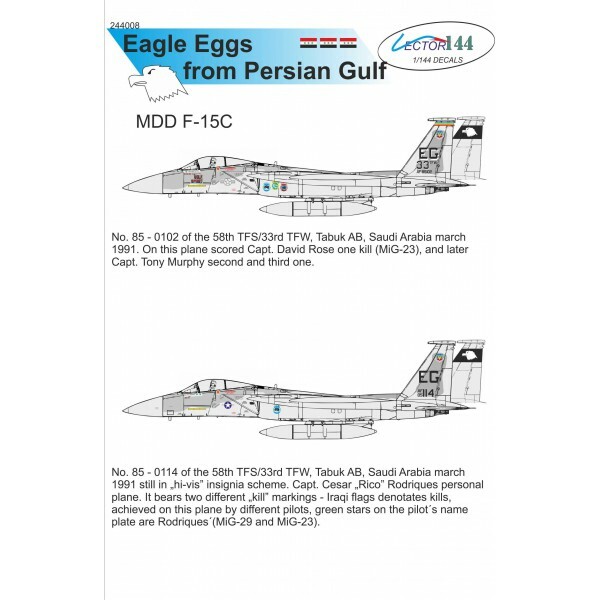 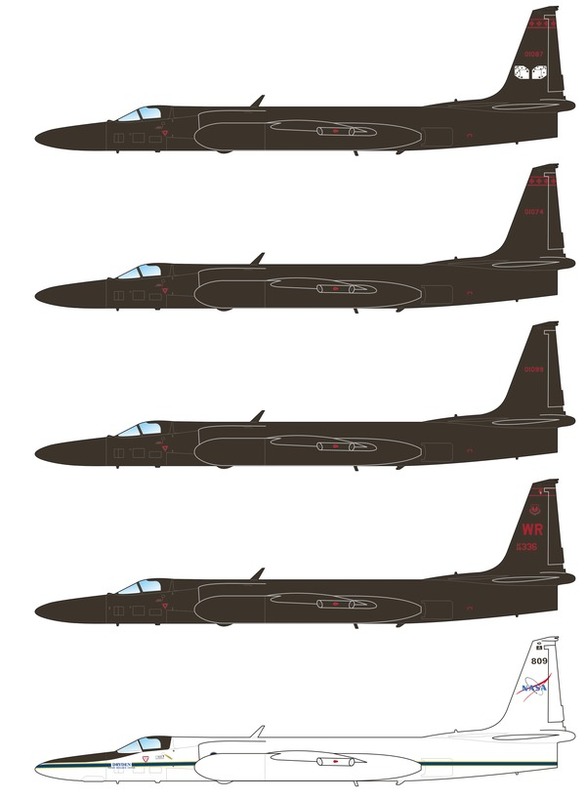 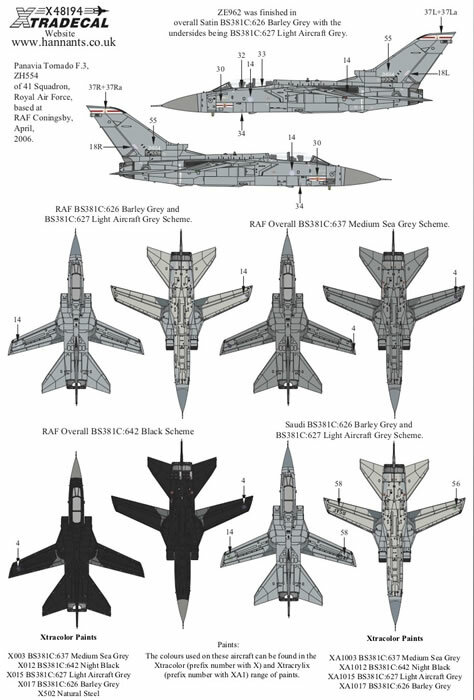 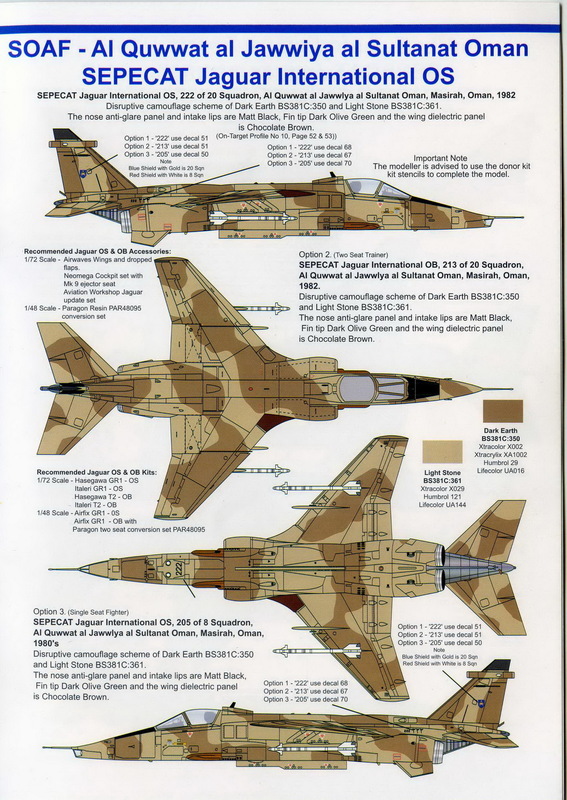 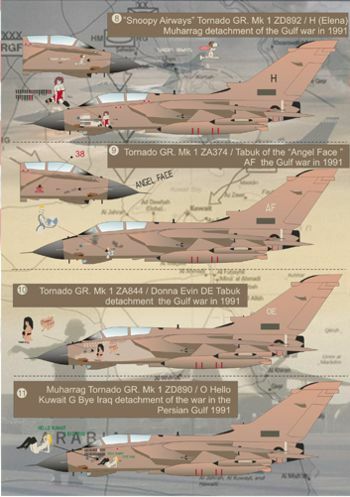 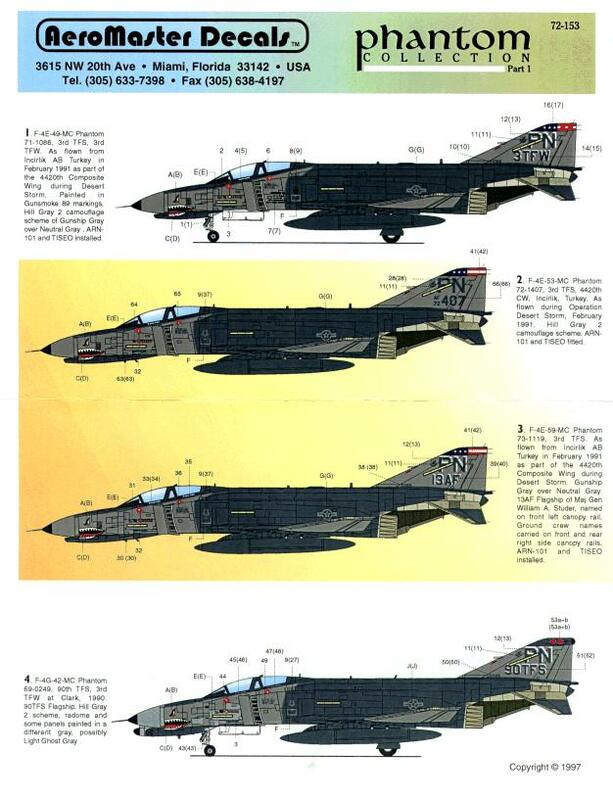 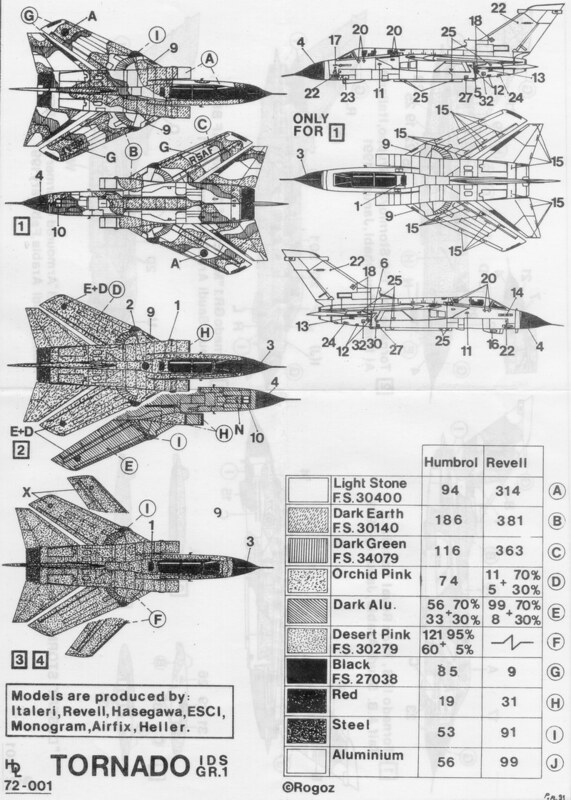 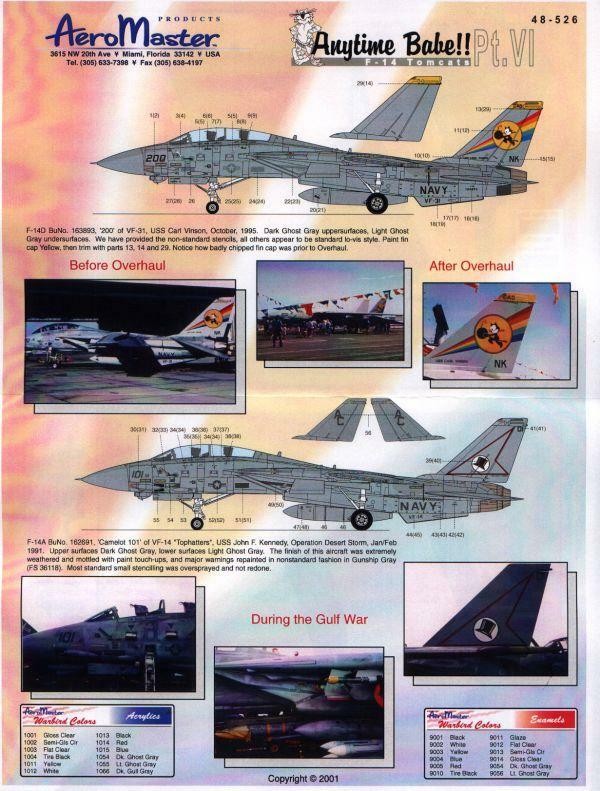 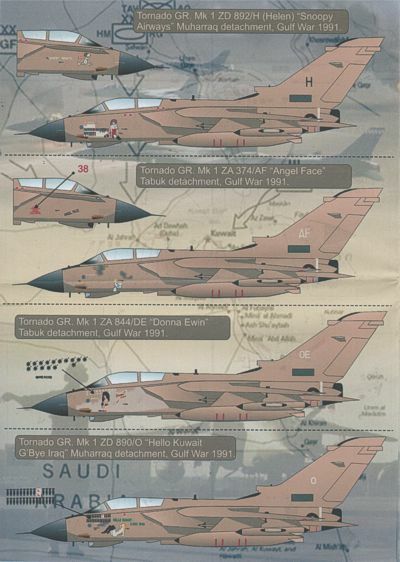 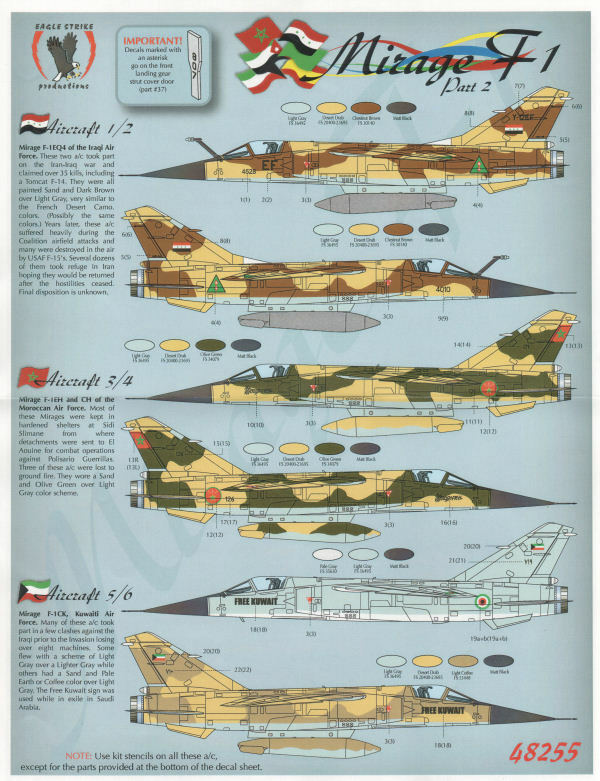 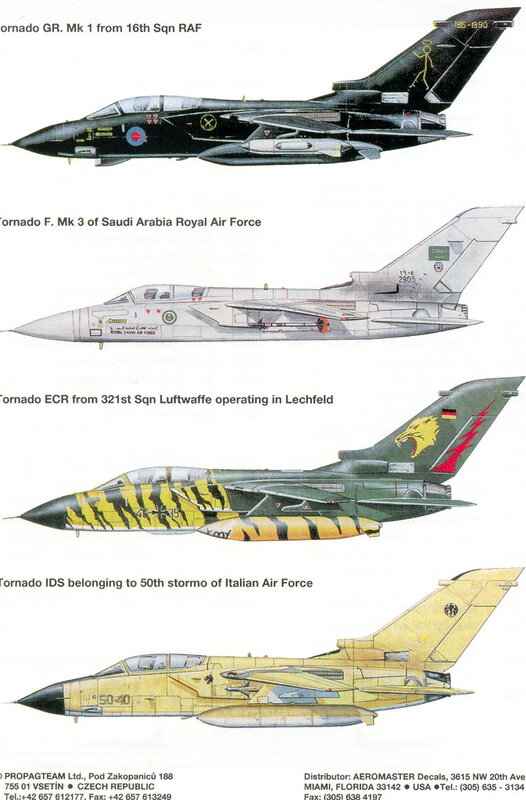 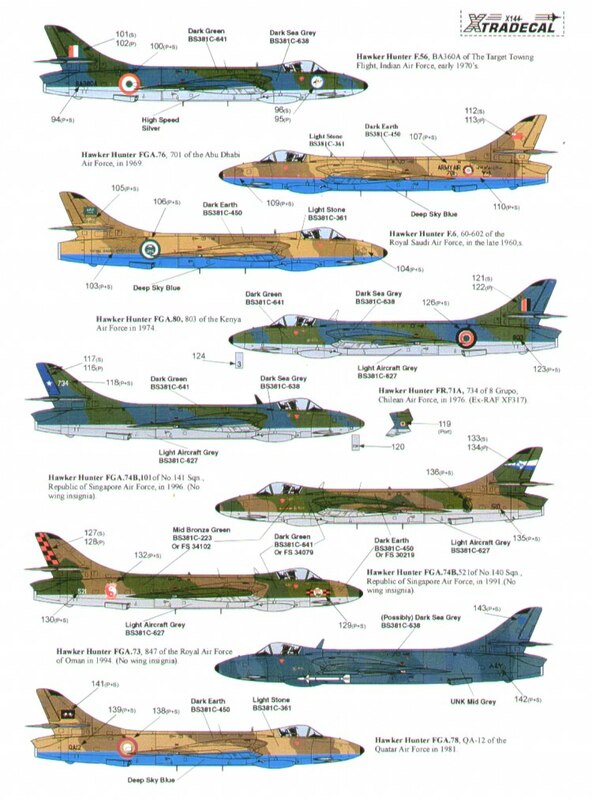 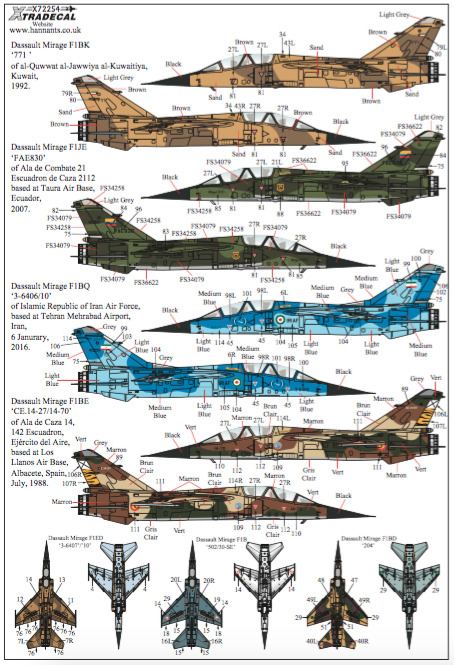 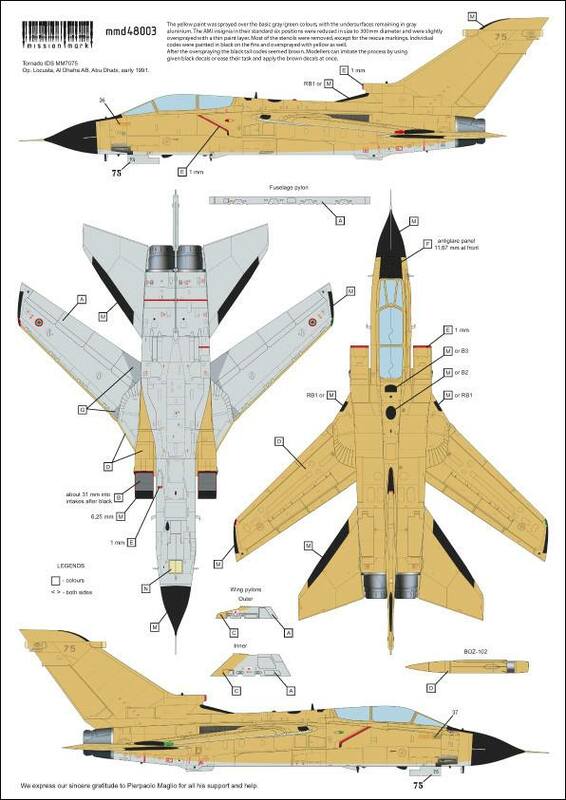 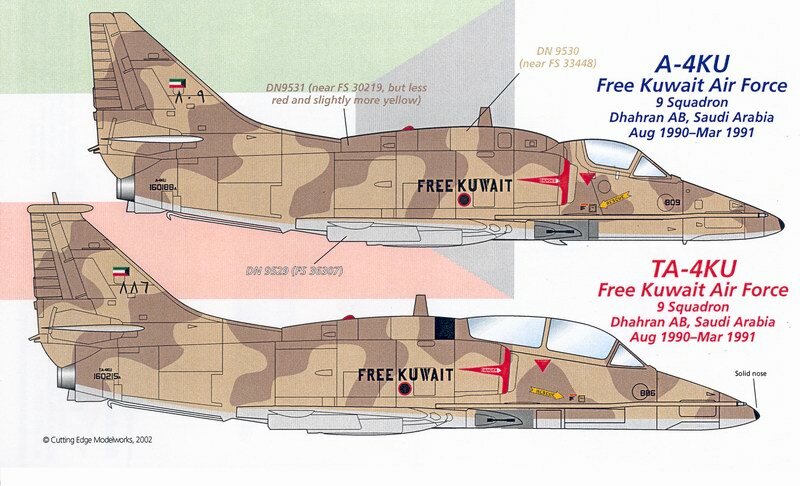 There should be no wing roundels on Kuwaiti Hawks. 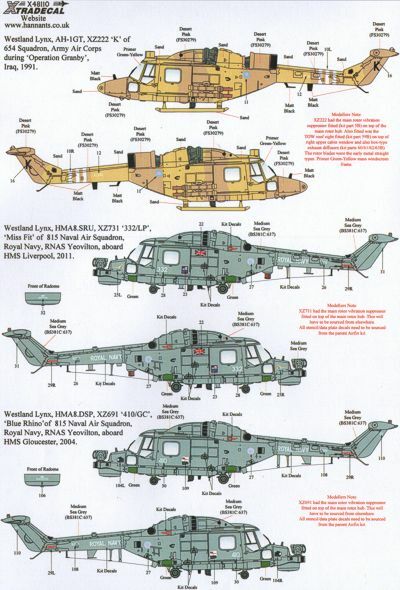 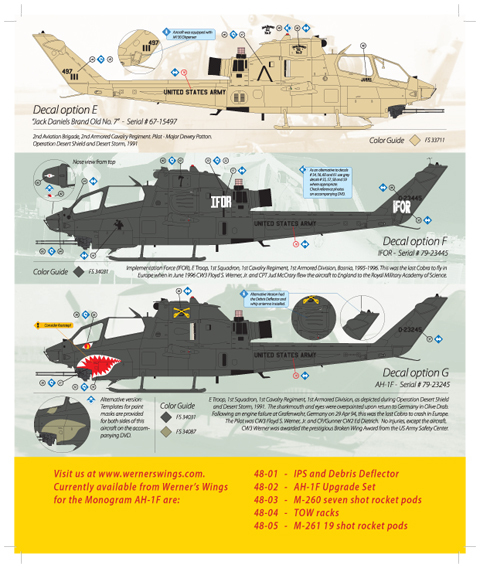 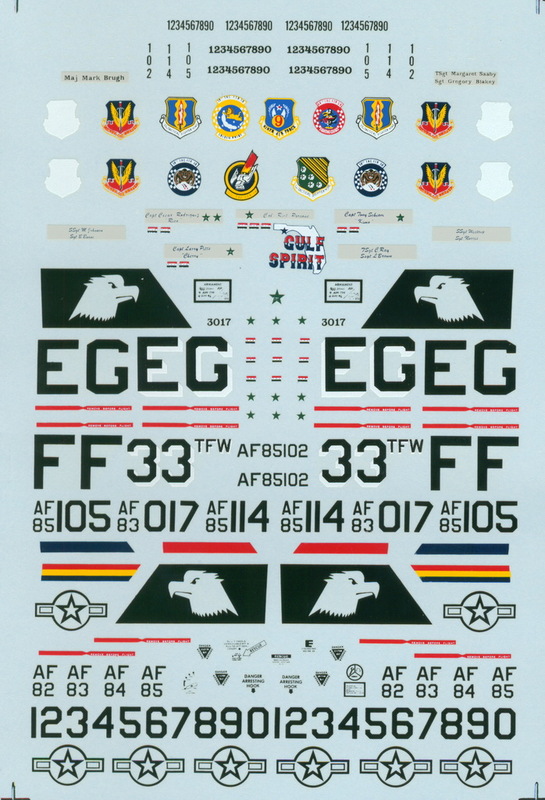 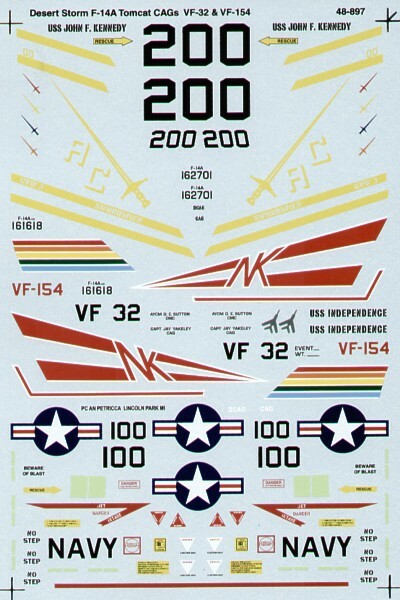 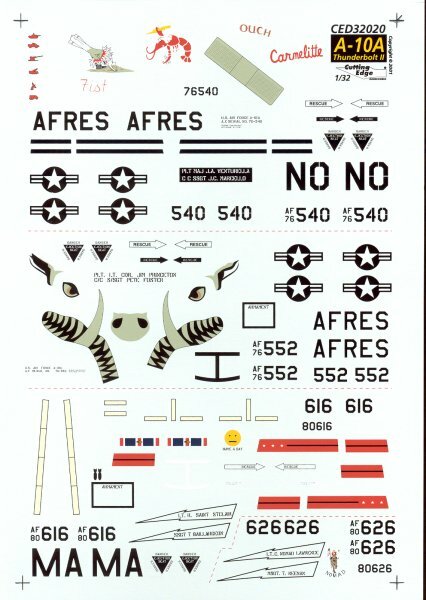 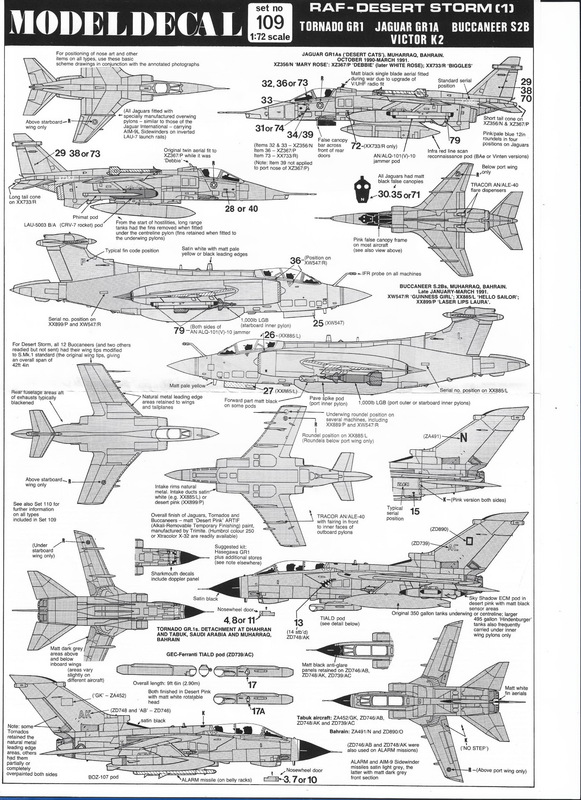 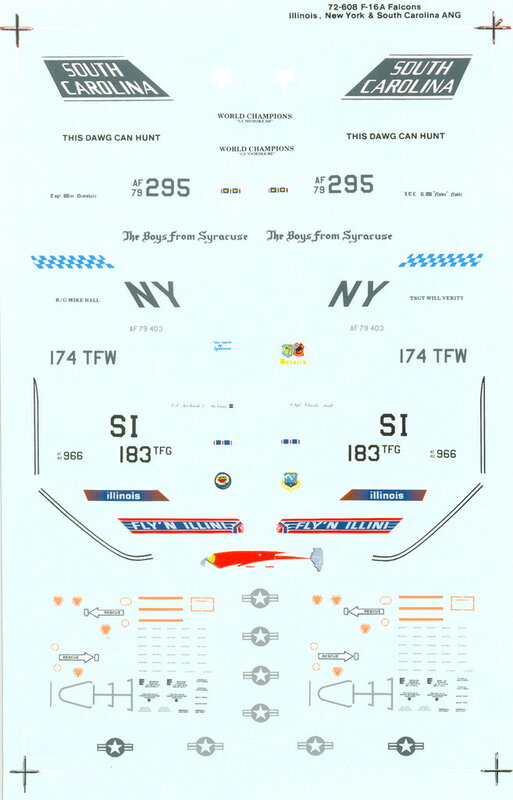 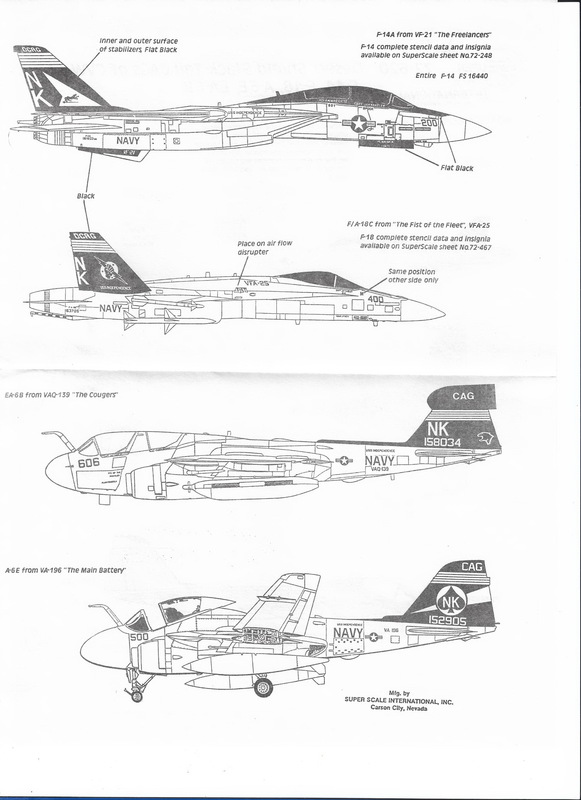 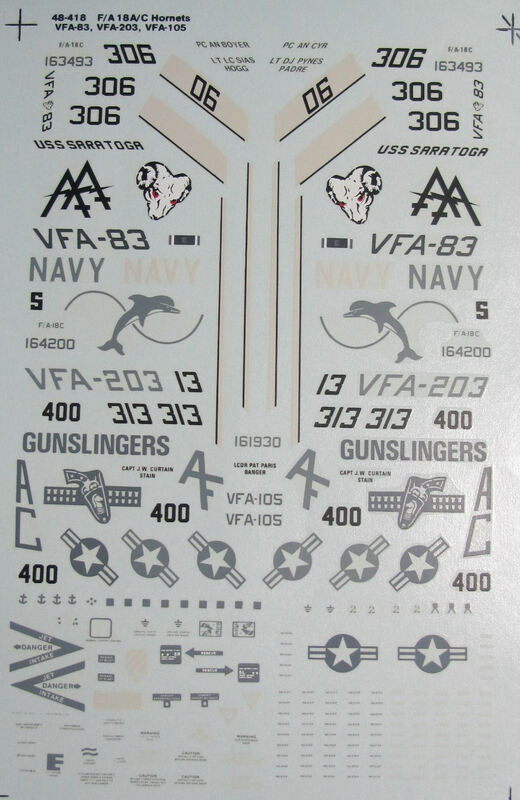 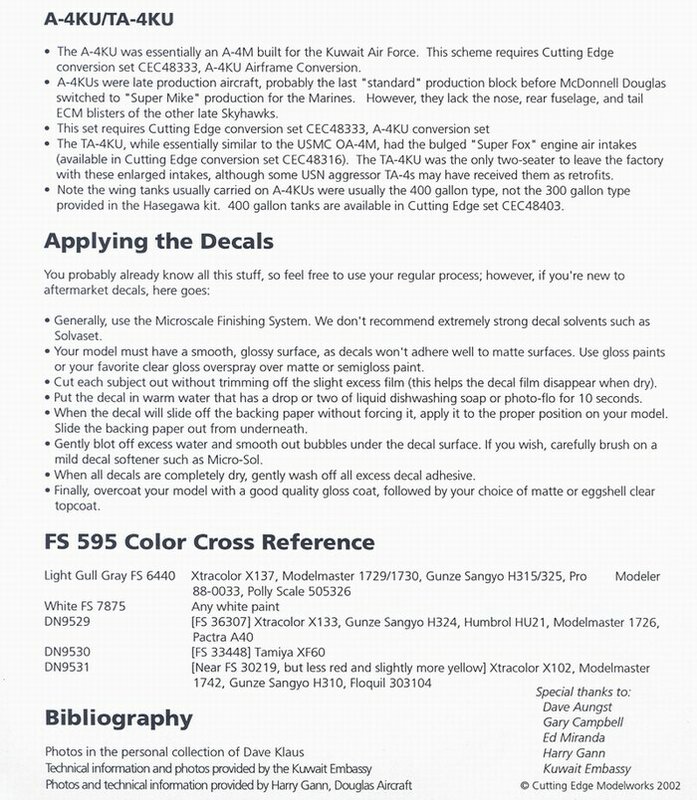 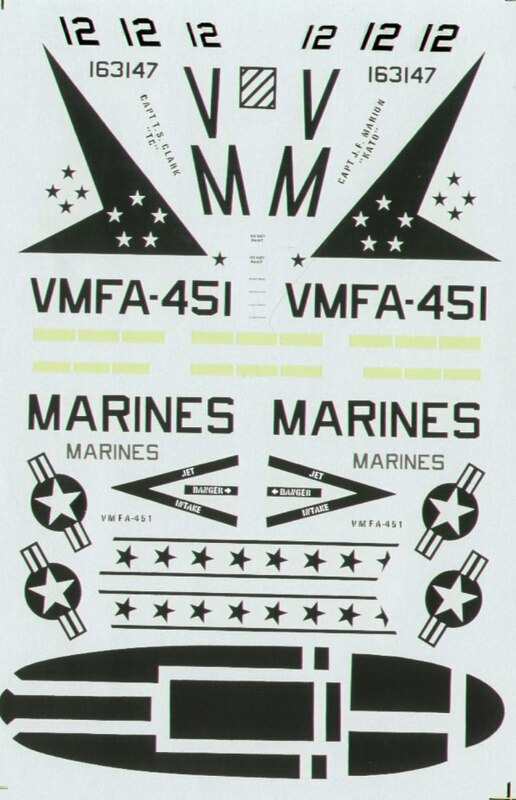 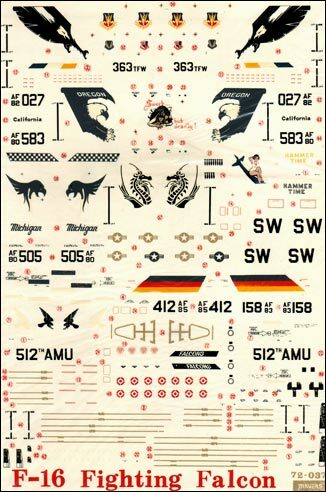 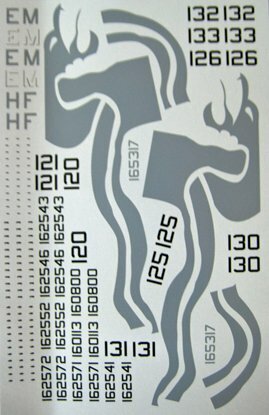 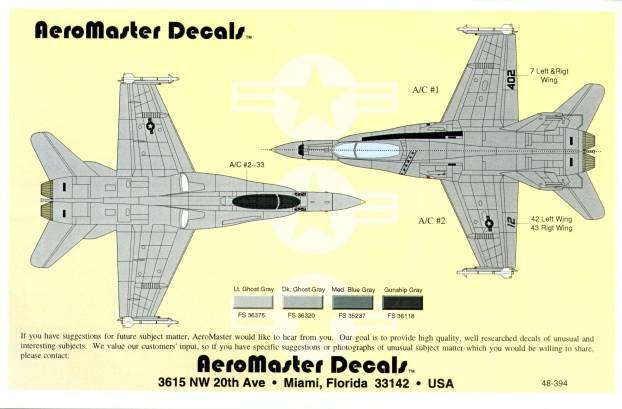 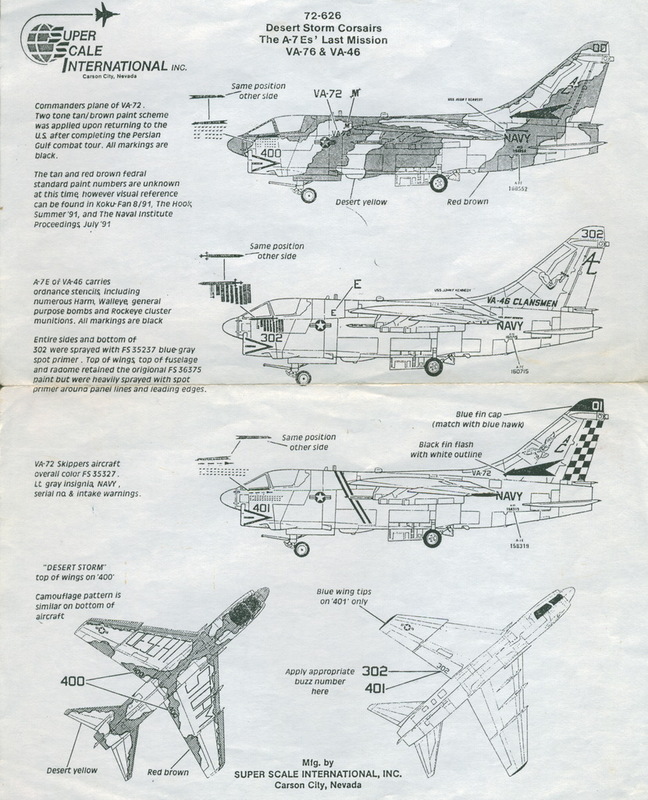 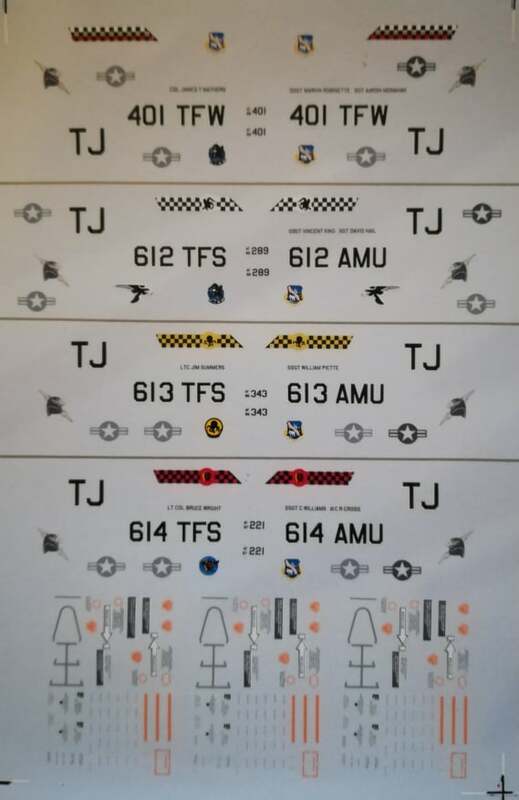 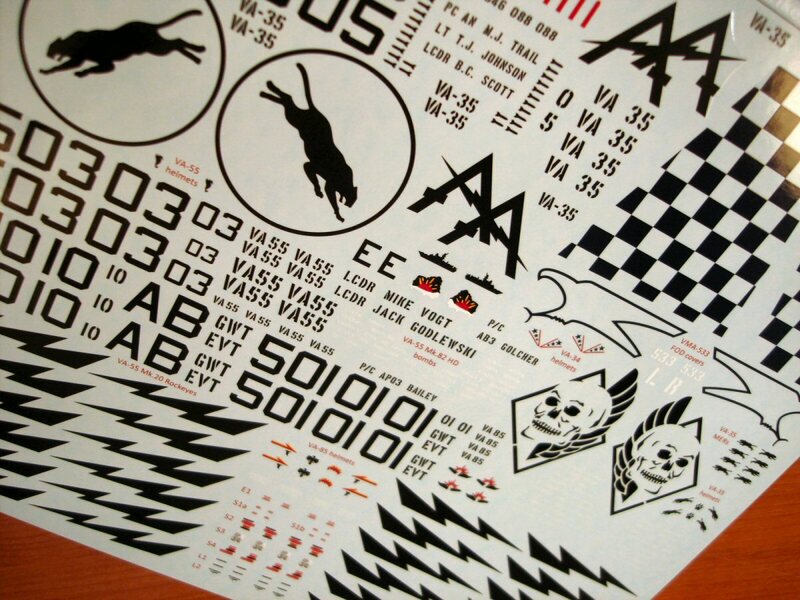 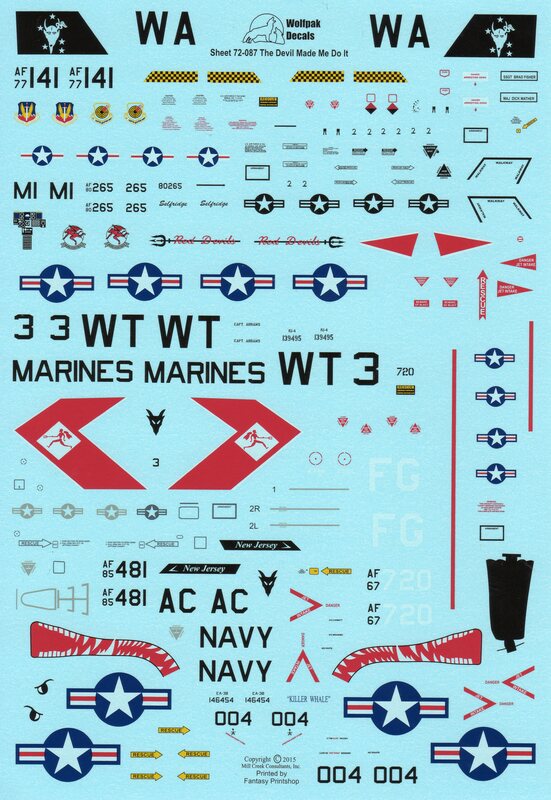 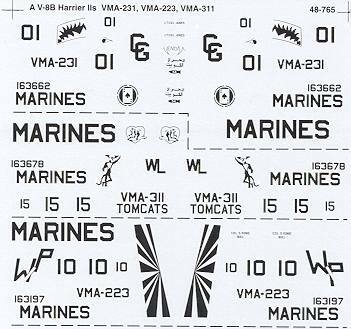 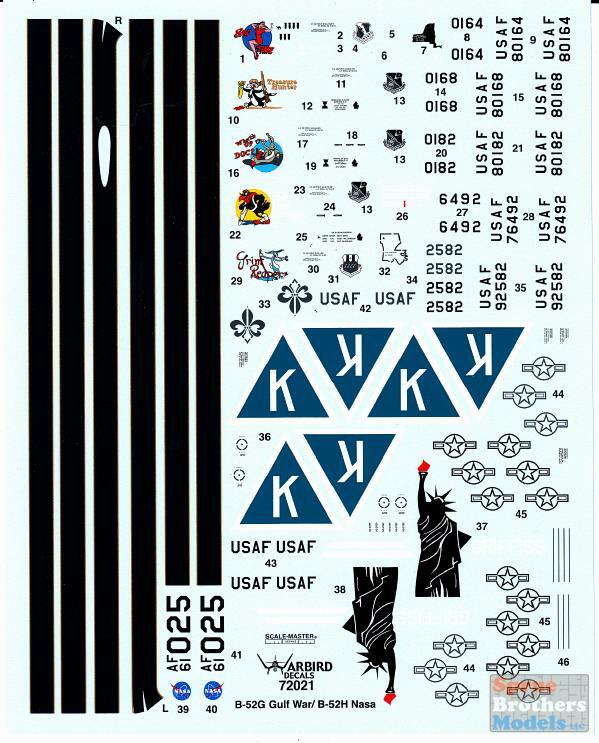 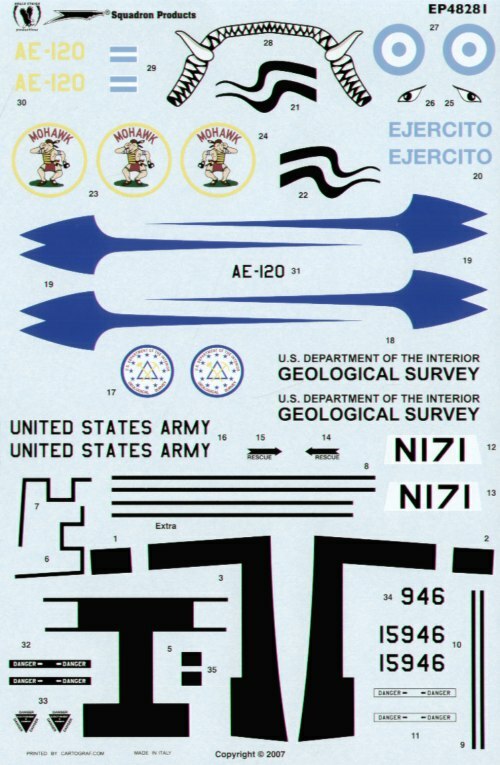 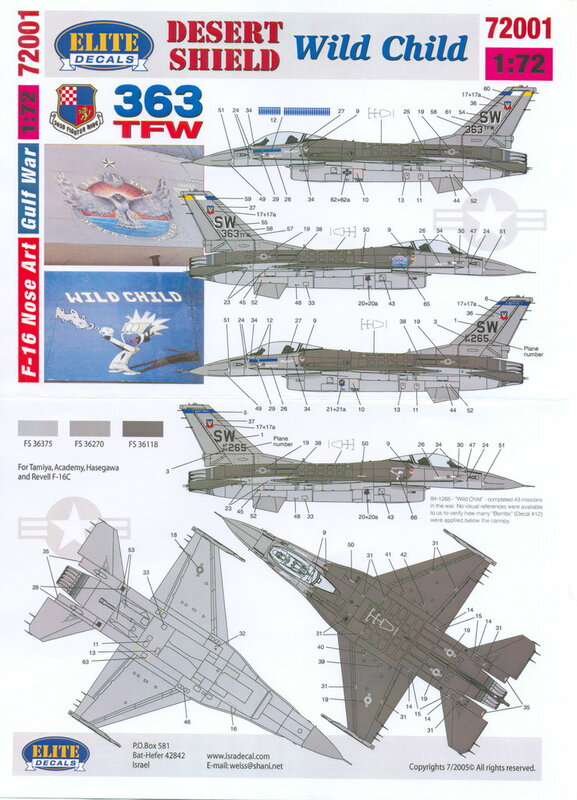 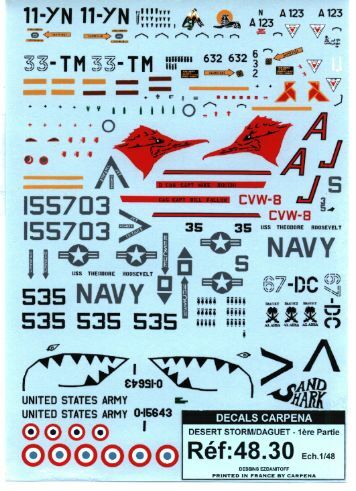 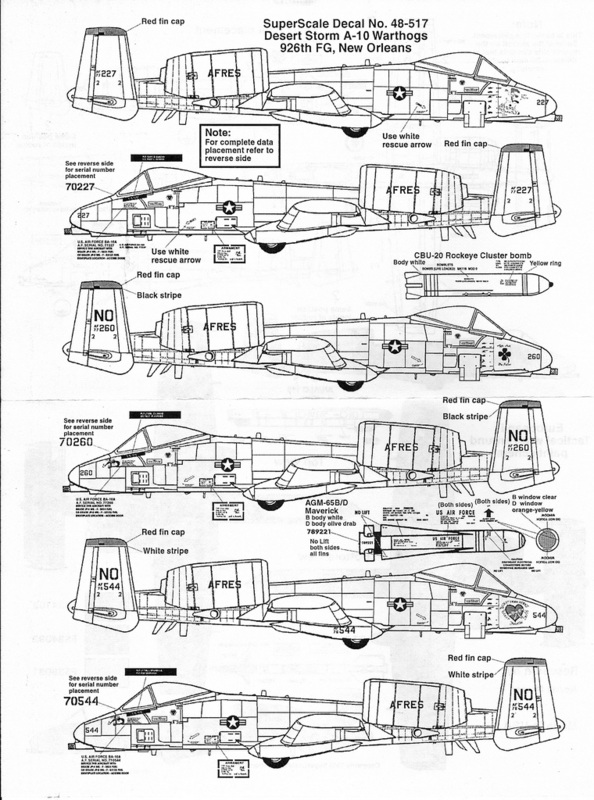 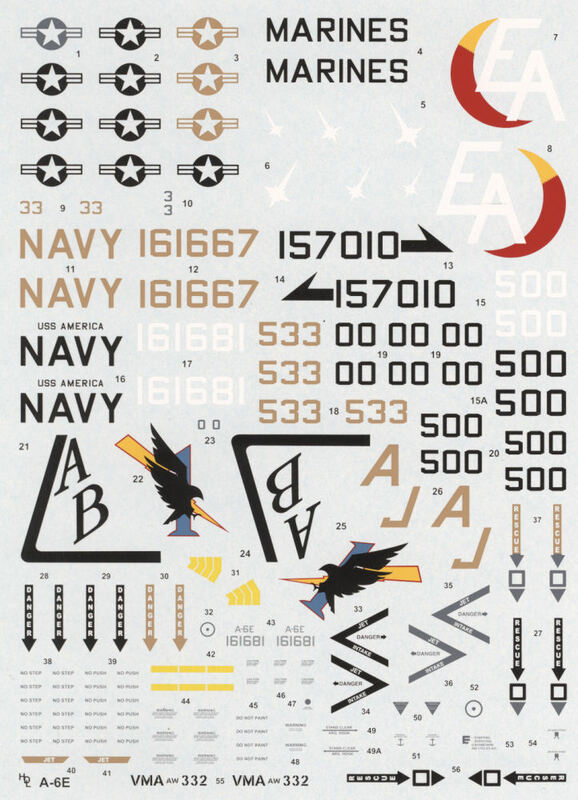 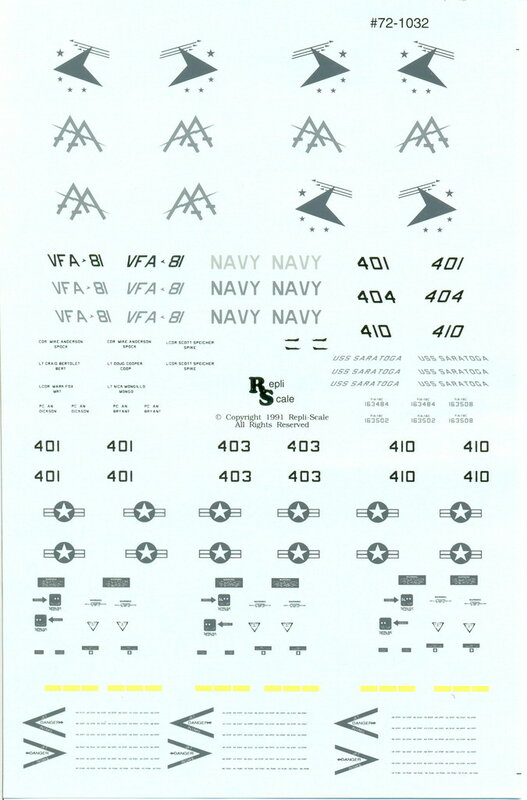 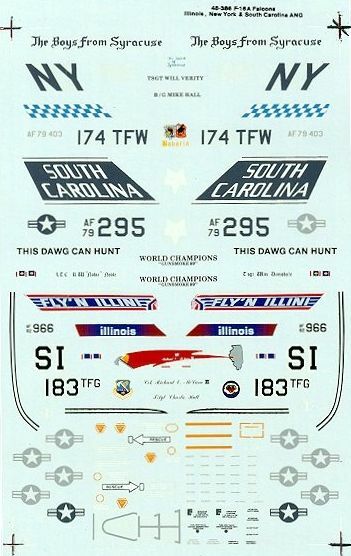 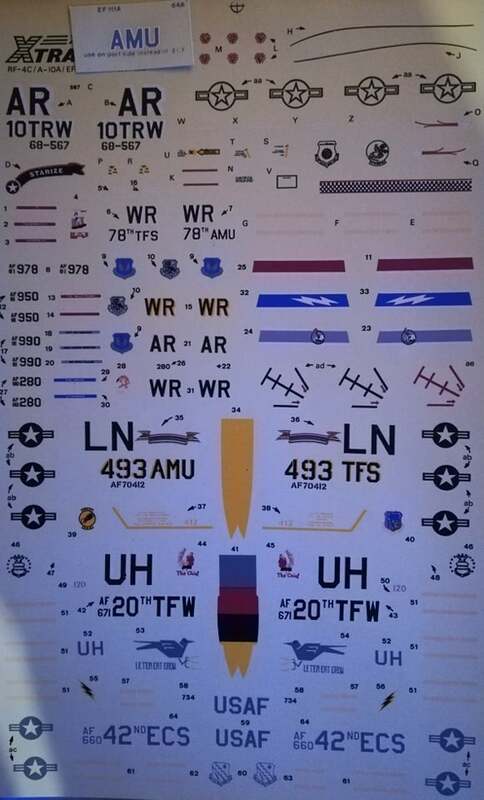 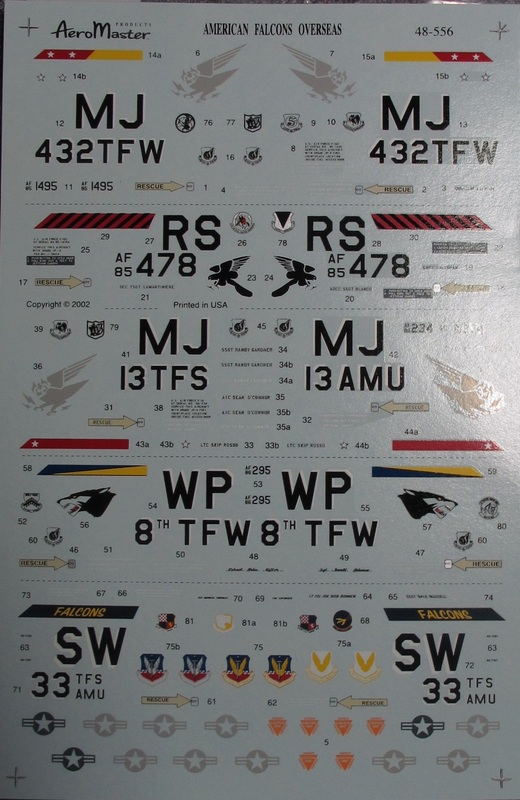 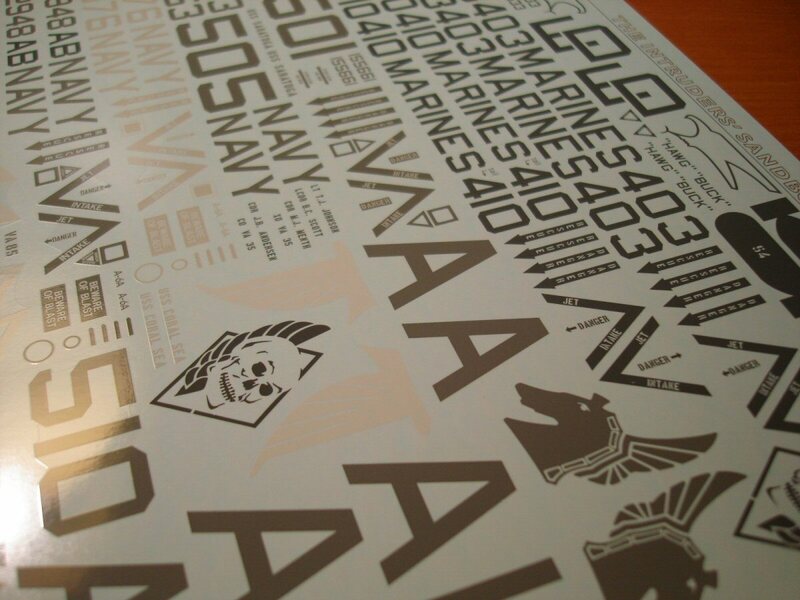 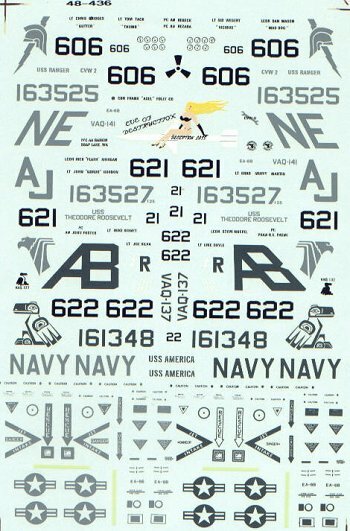 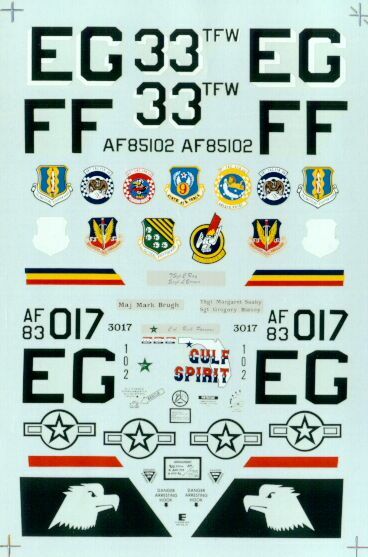 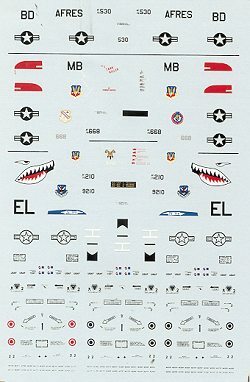 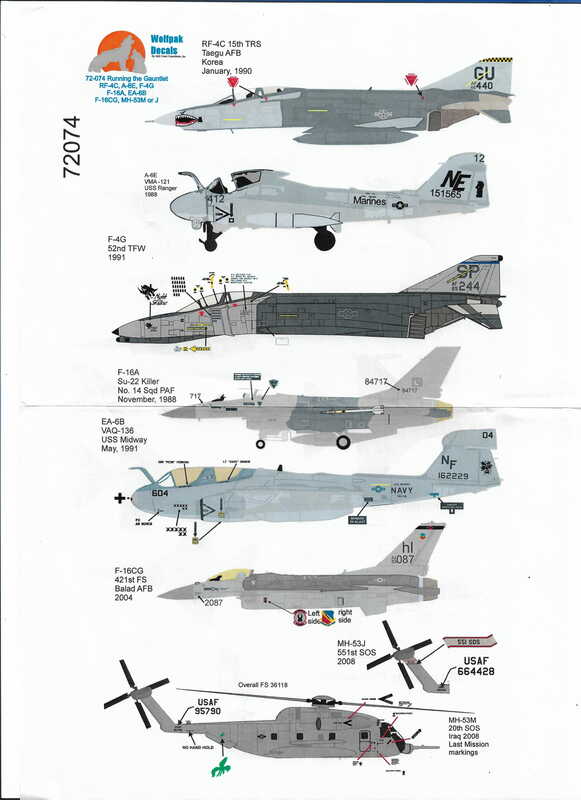 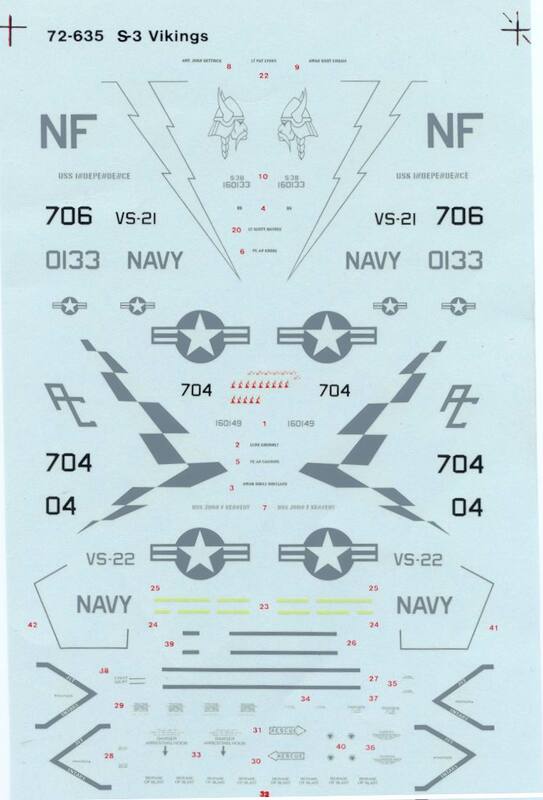 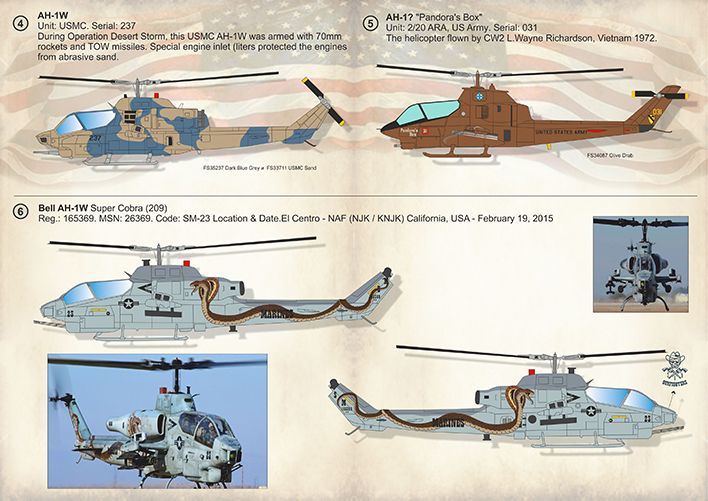 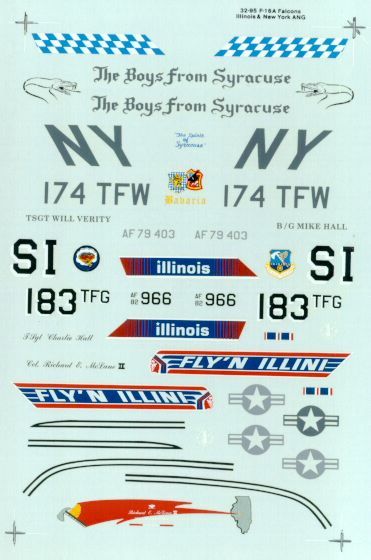 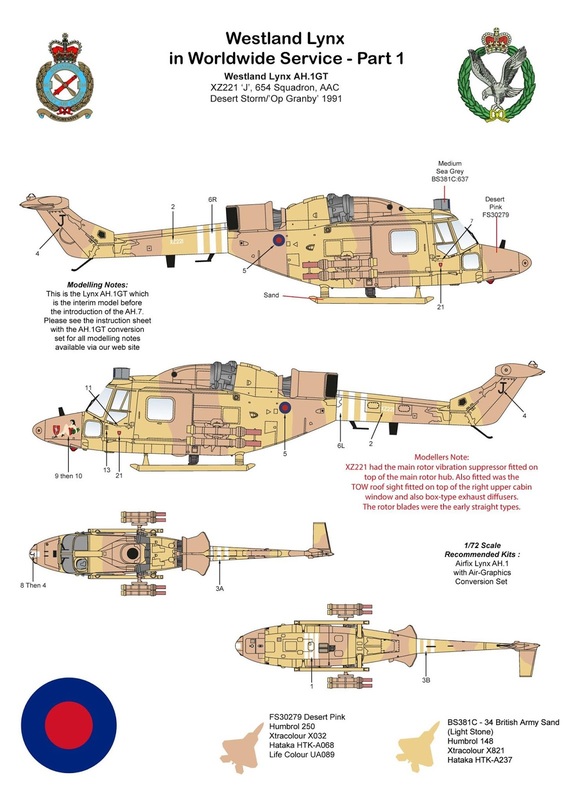 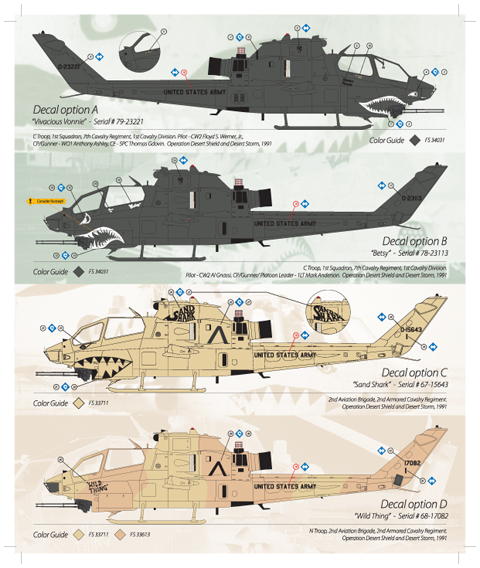 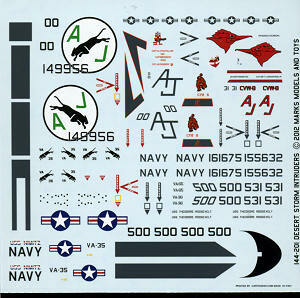 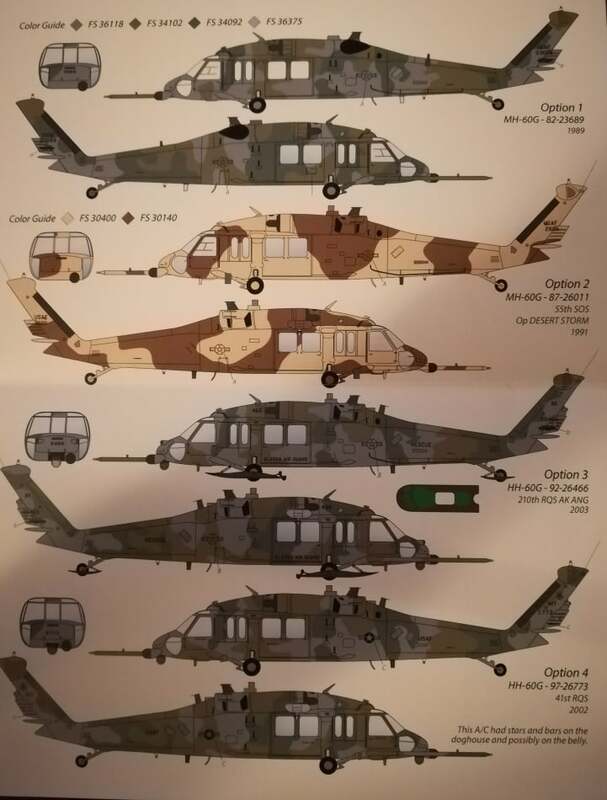 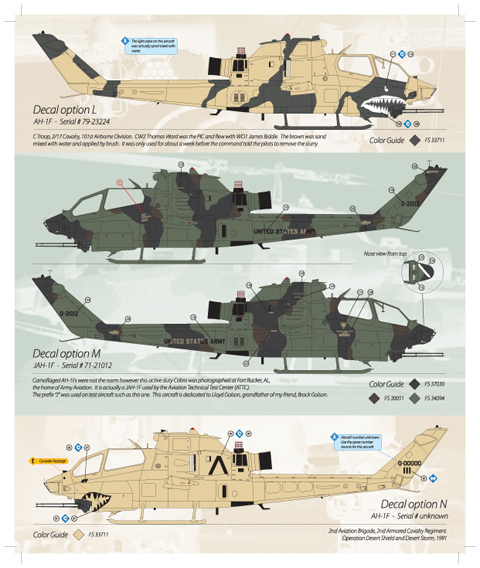 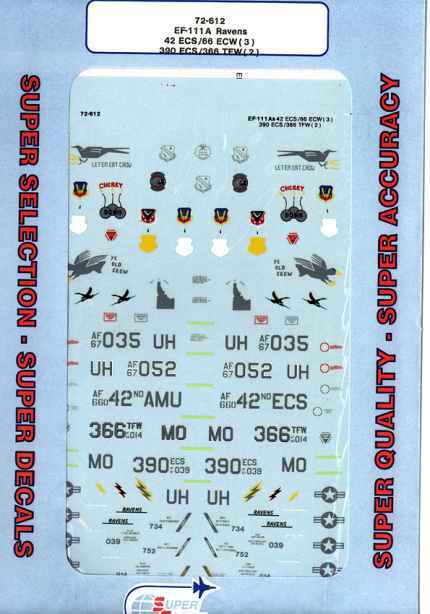 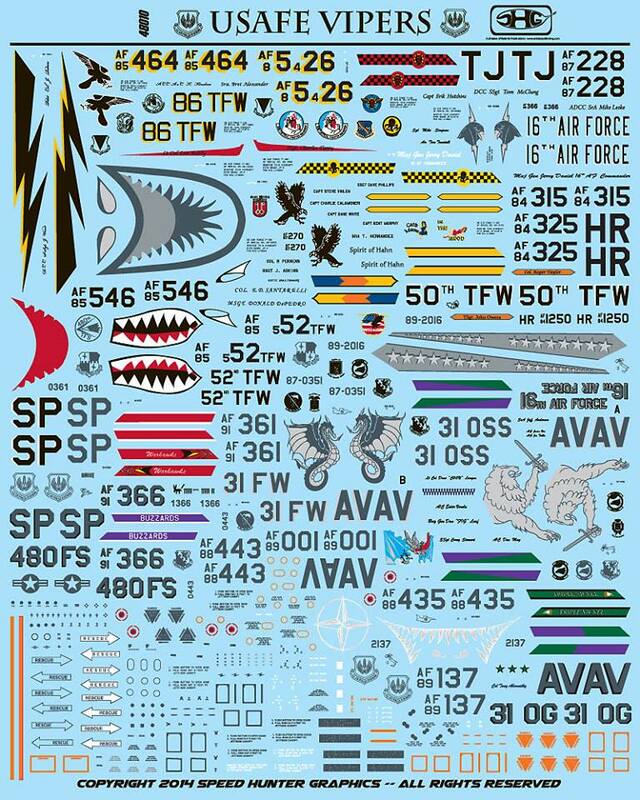 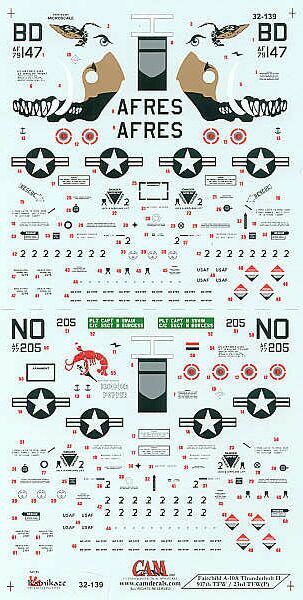 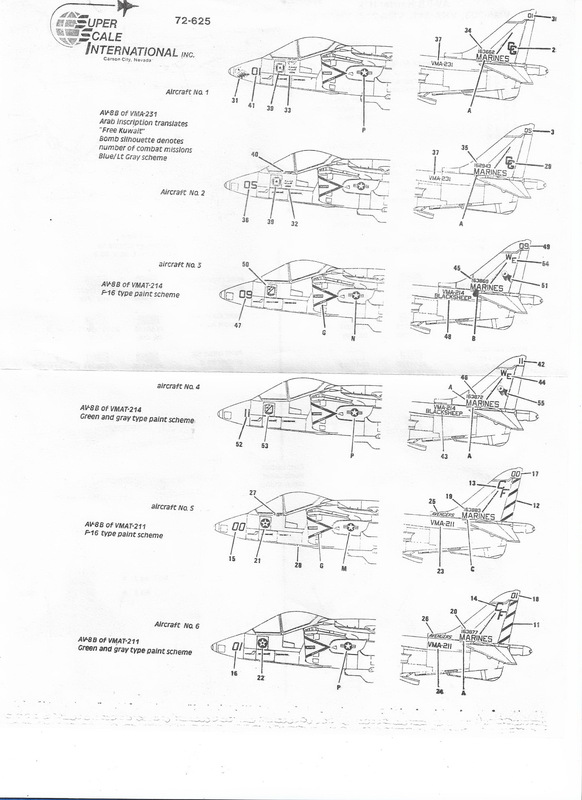 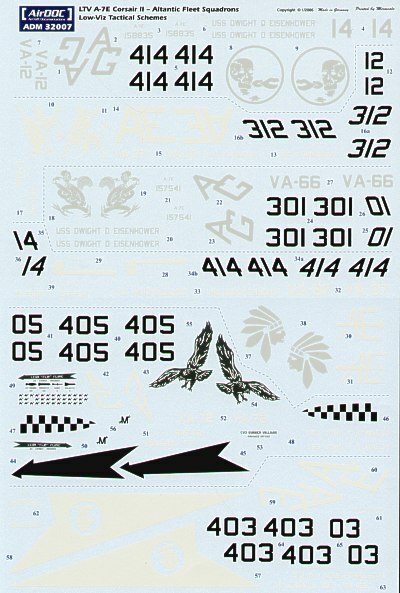 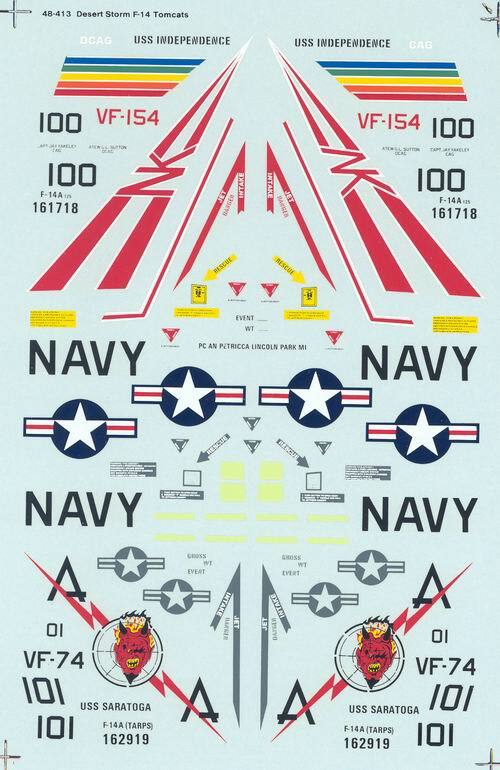 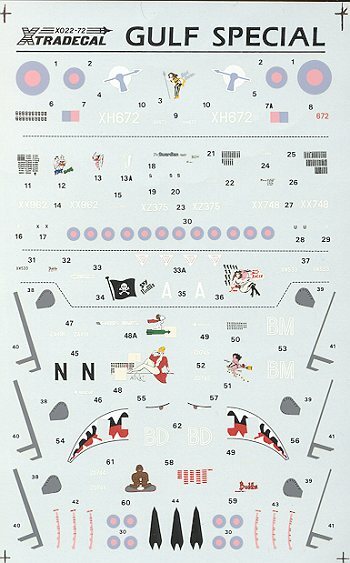 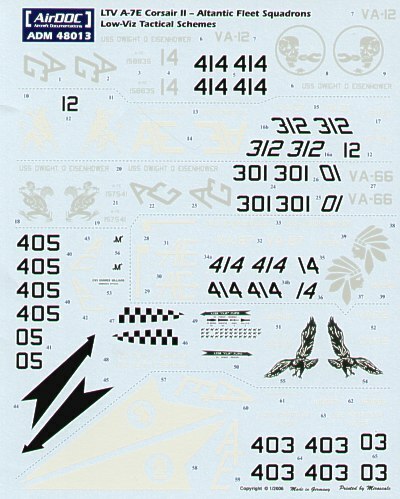 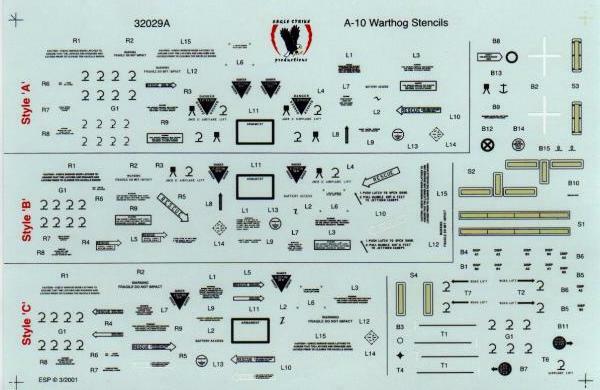 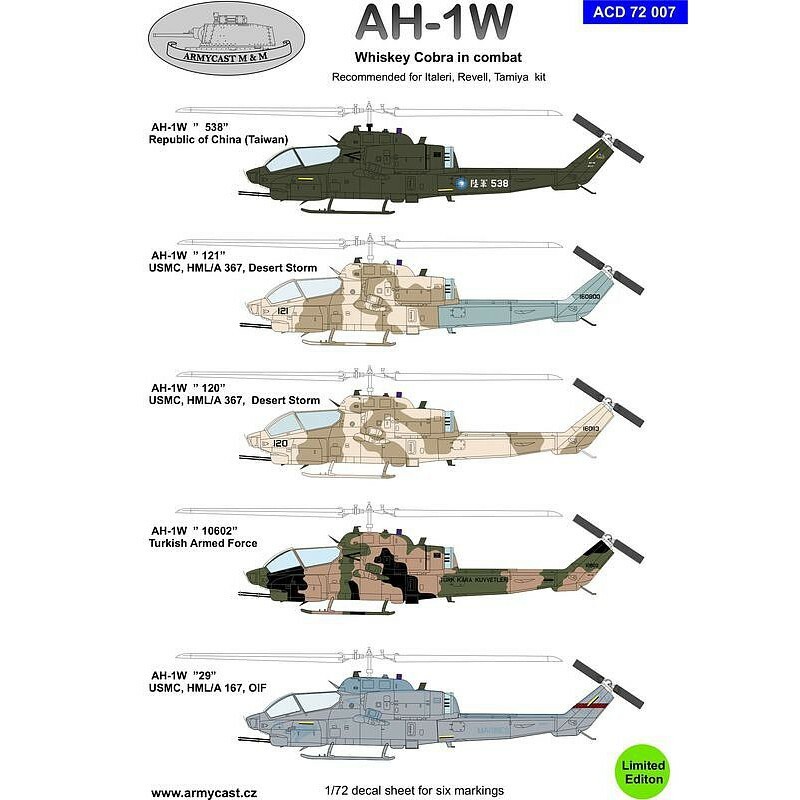 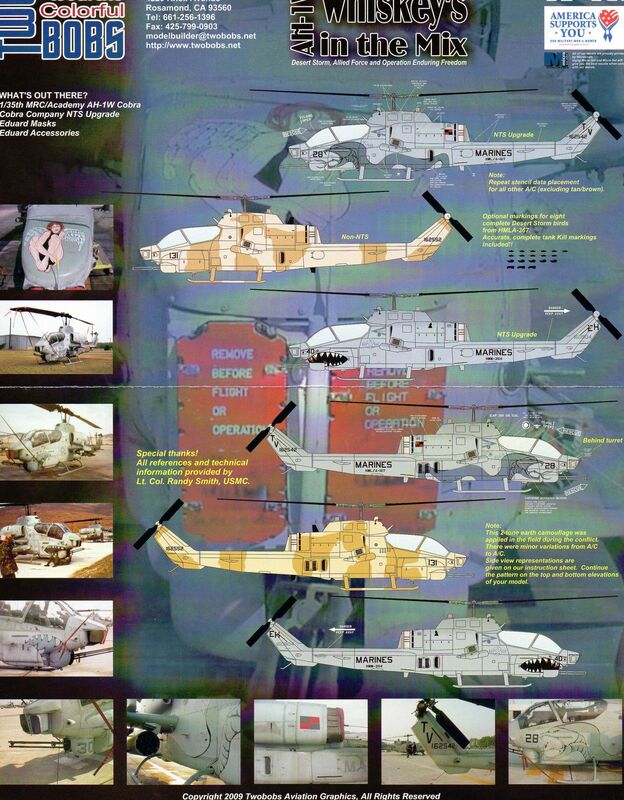 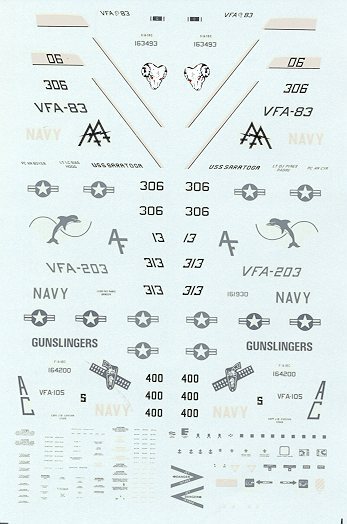 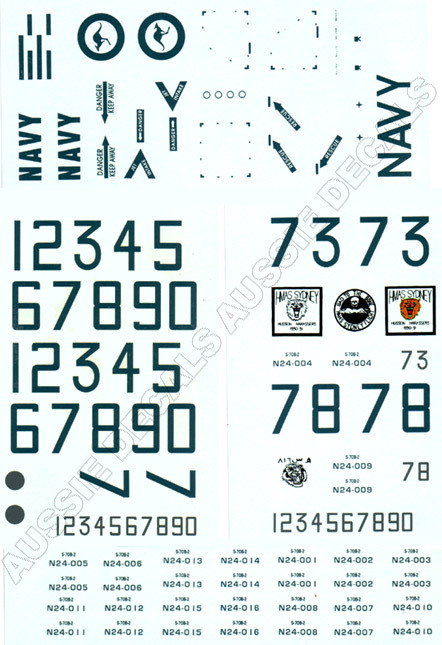 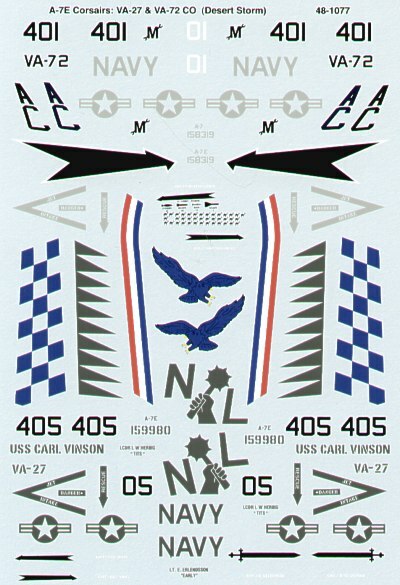 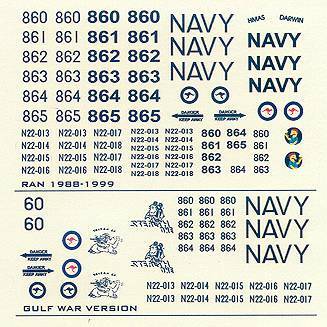 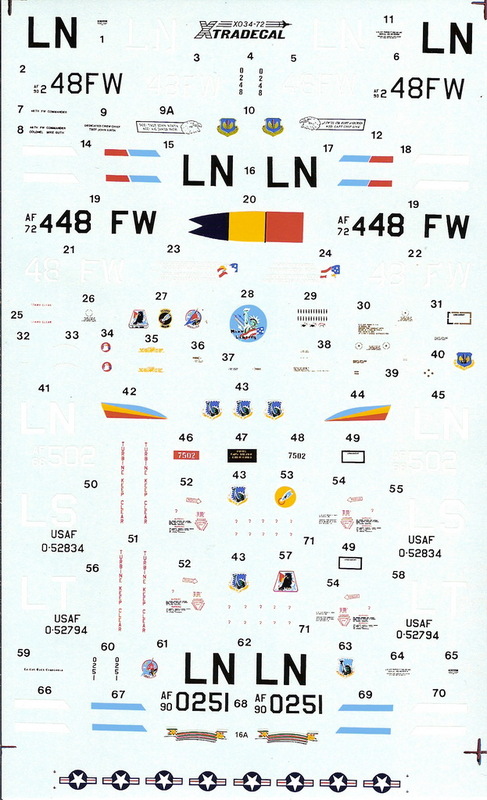 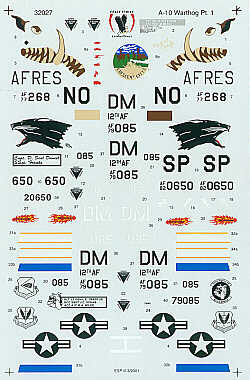 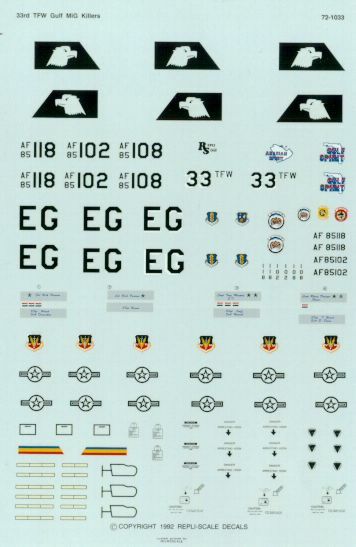 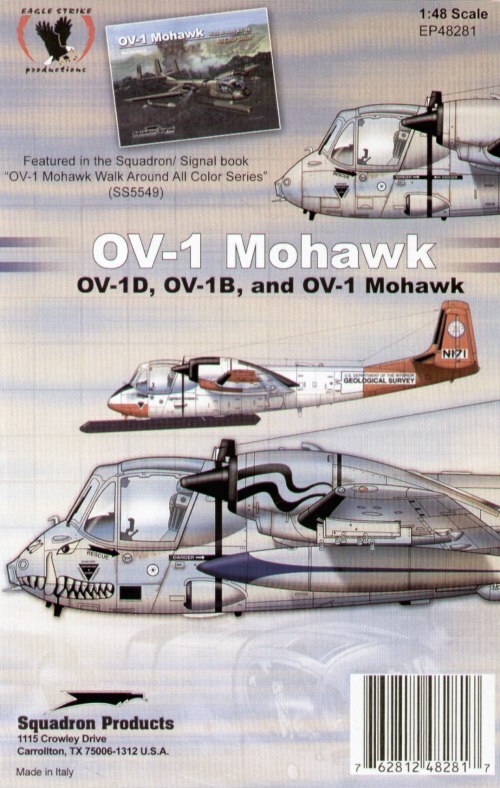 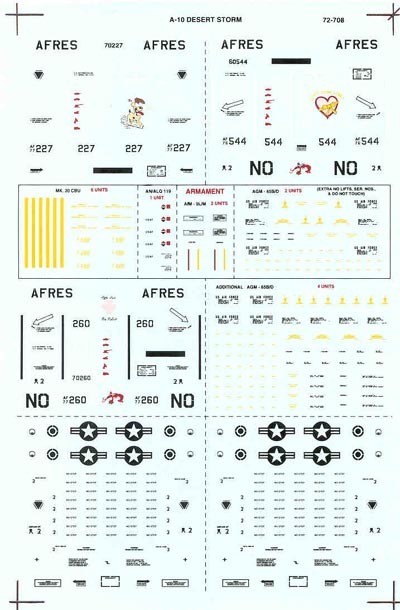 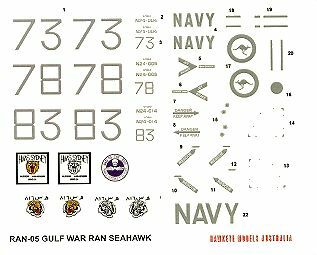 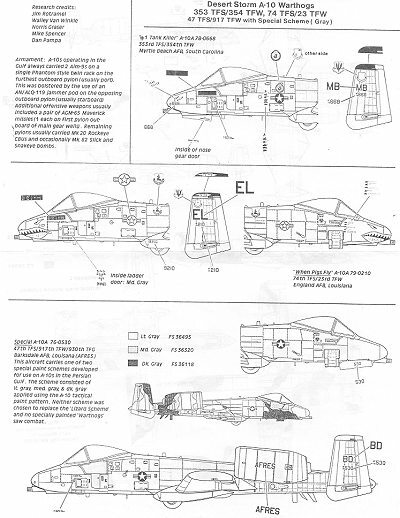 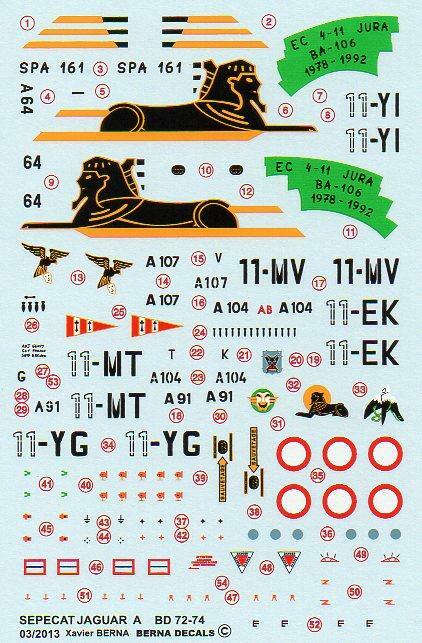 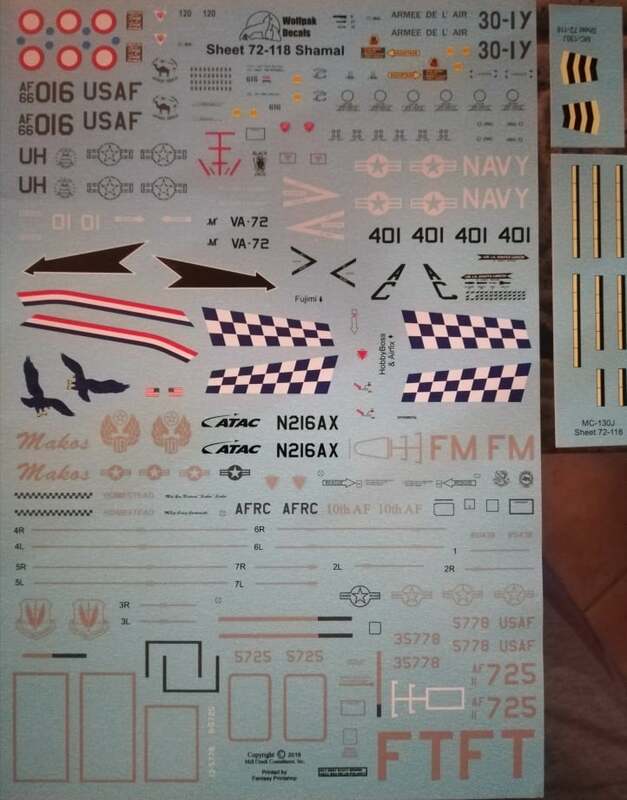 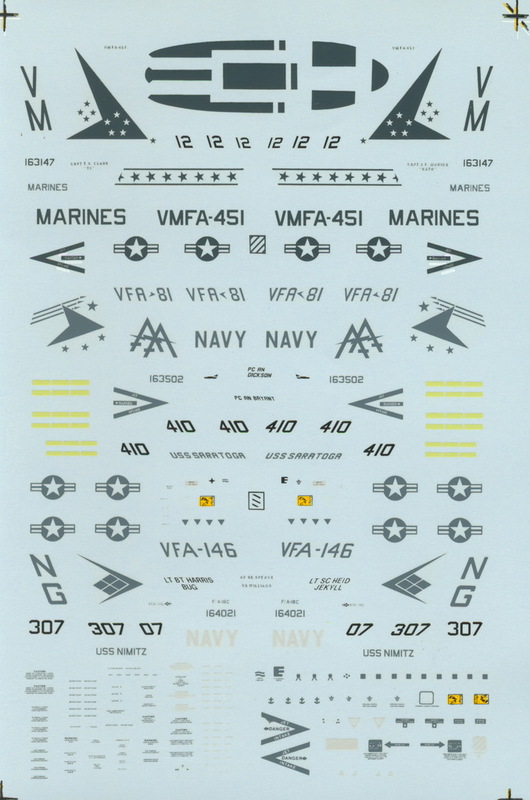 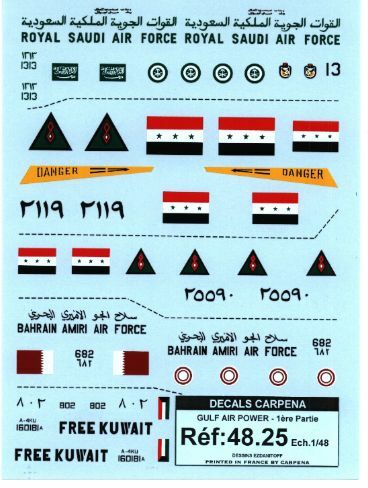 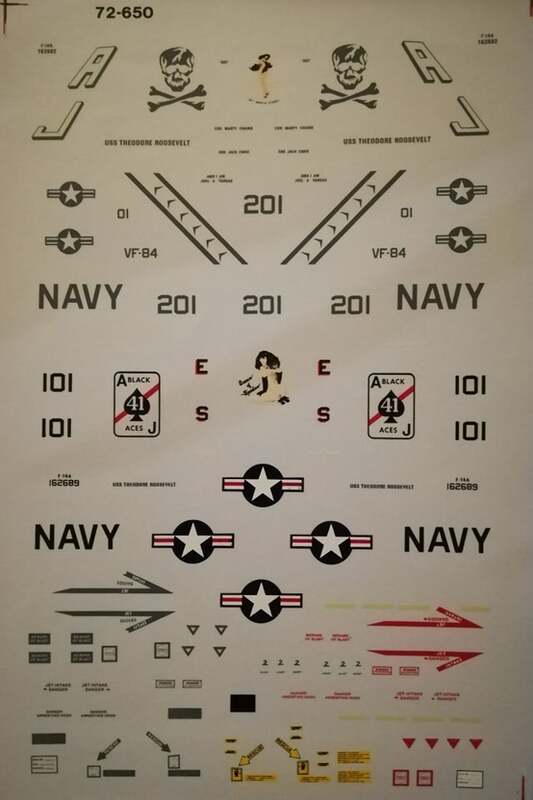 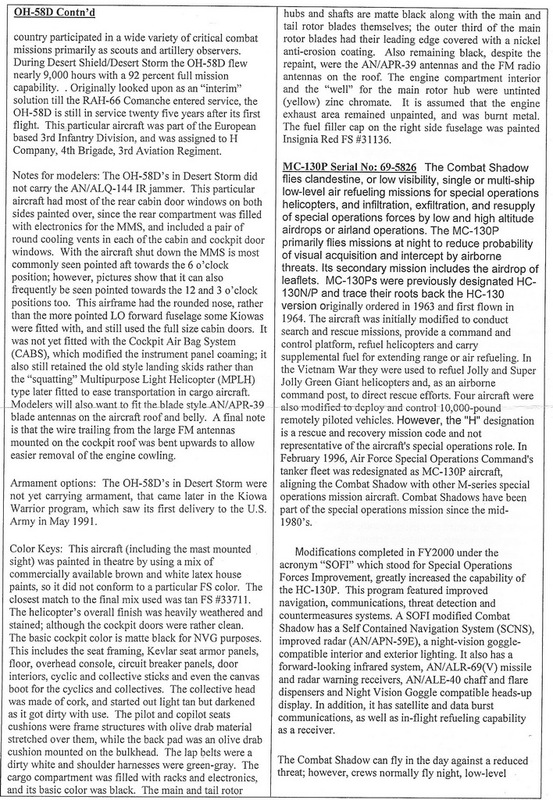 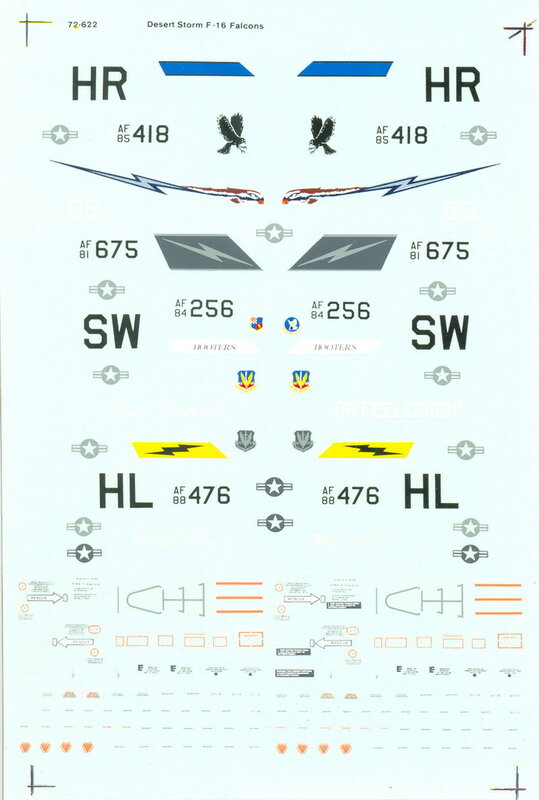 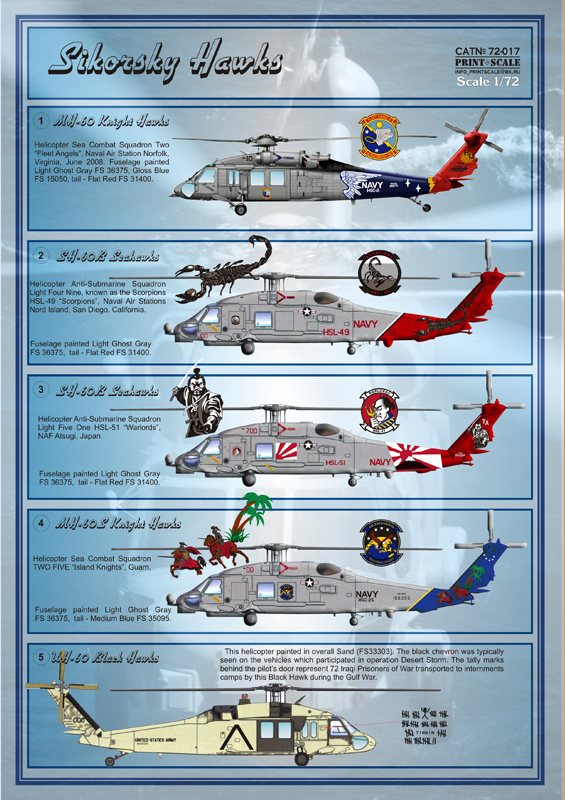 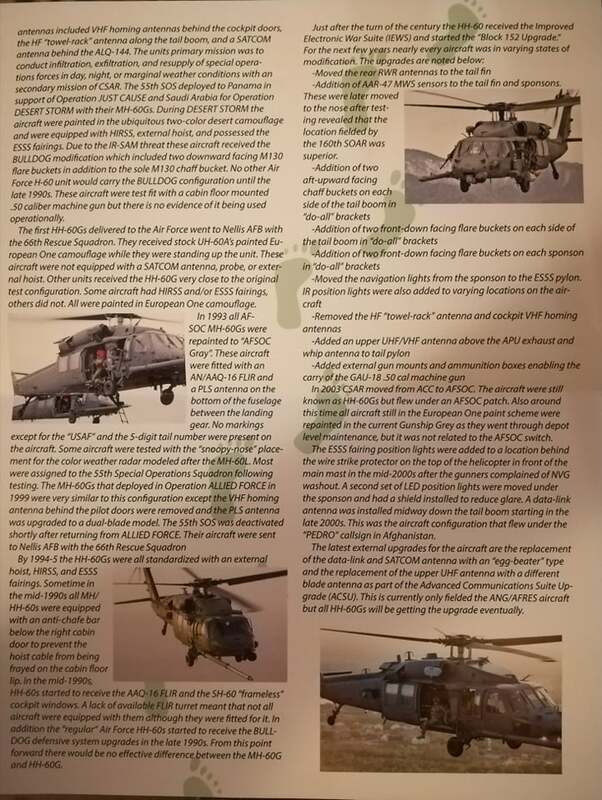 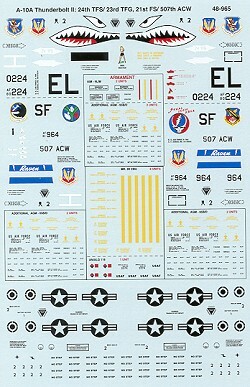 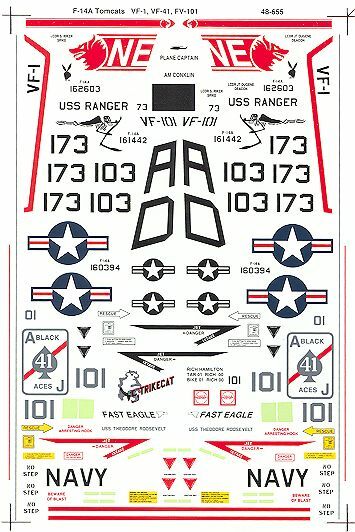 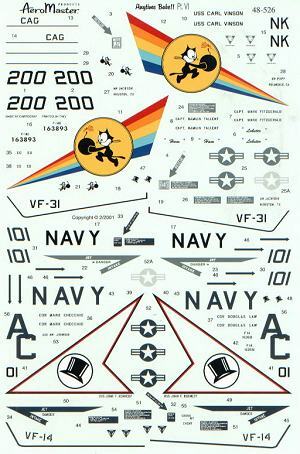 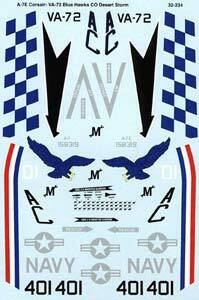 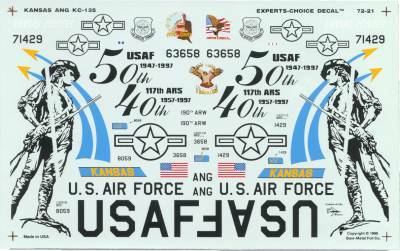 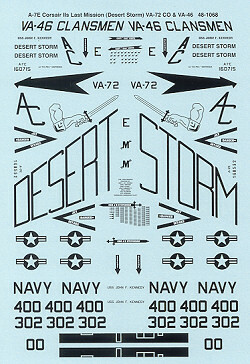 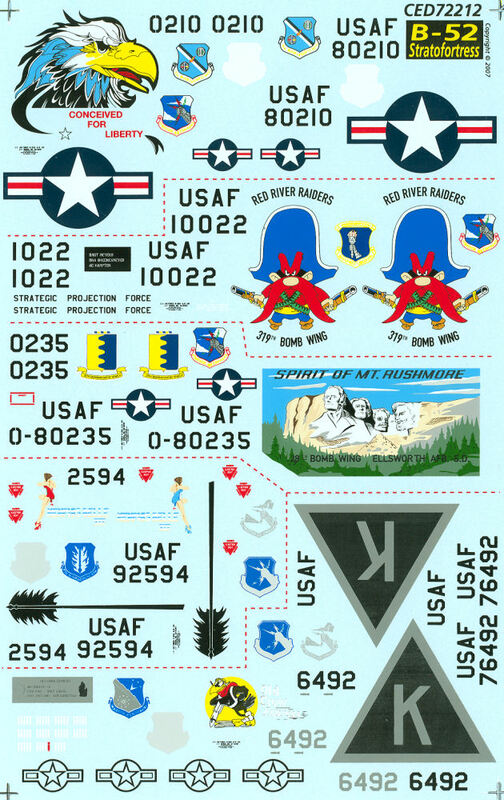 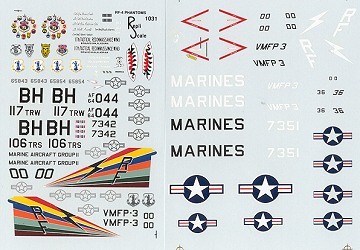 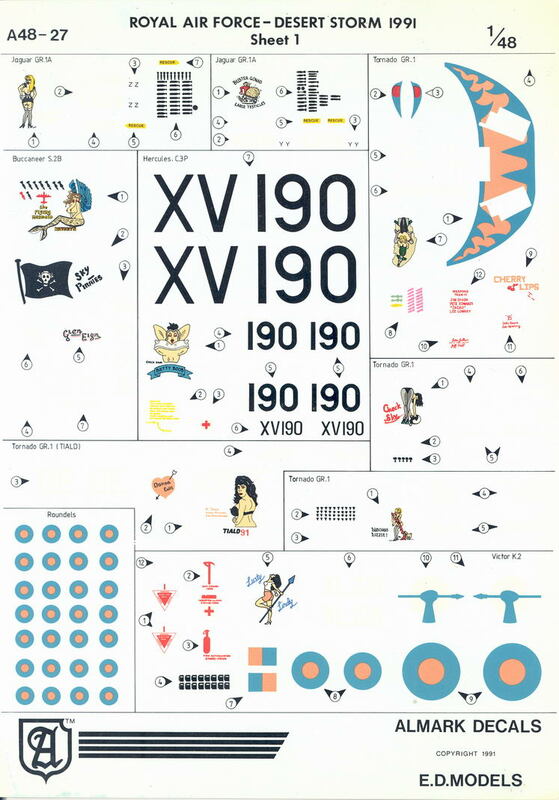 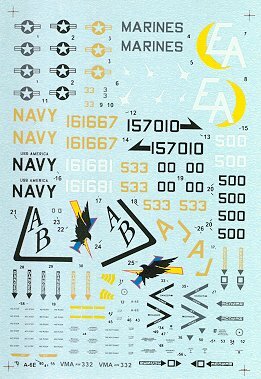 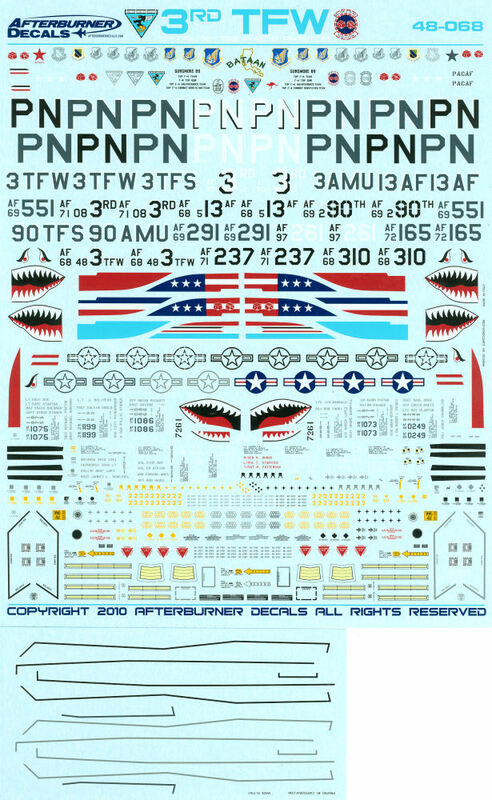 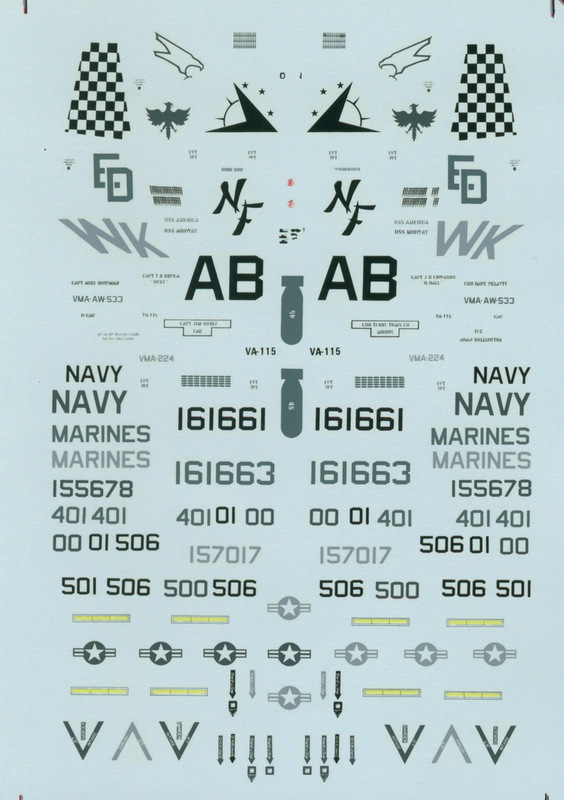 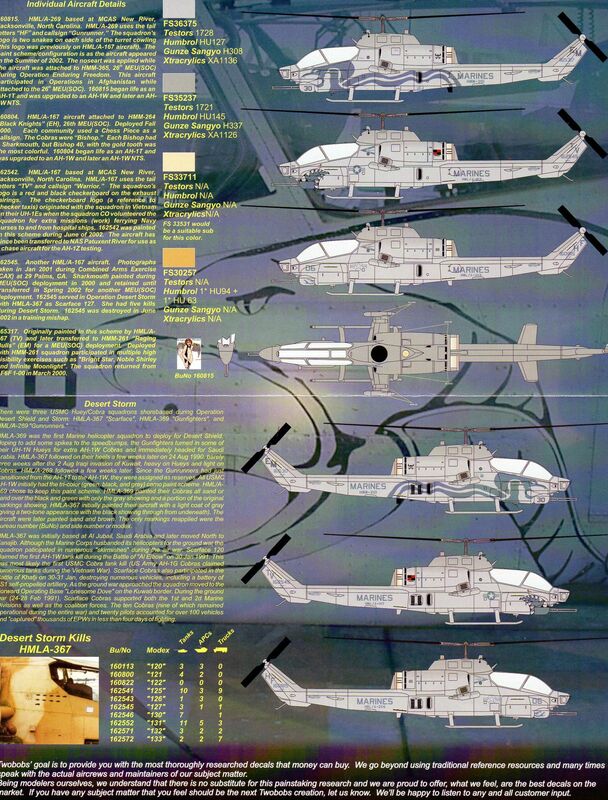 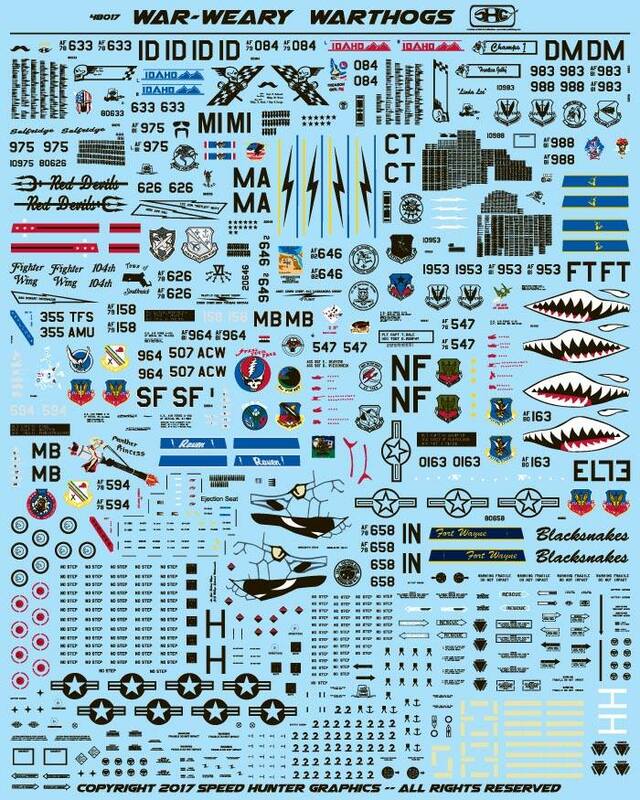 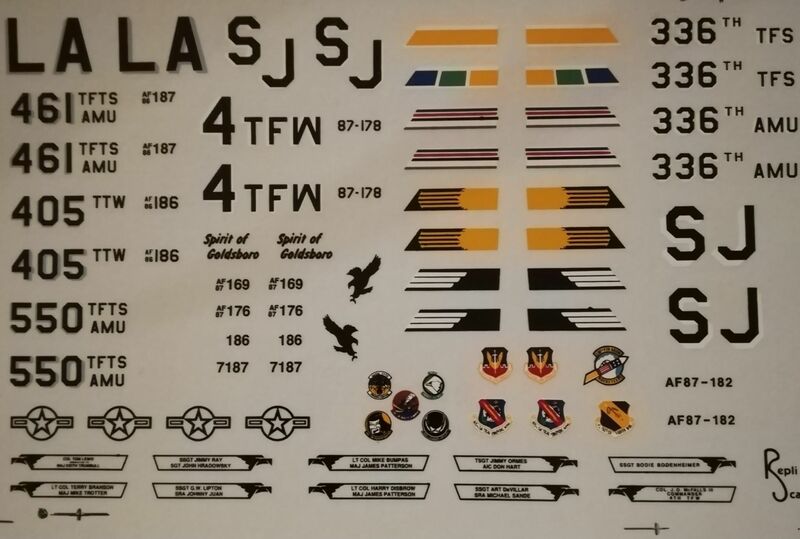 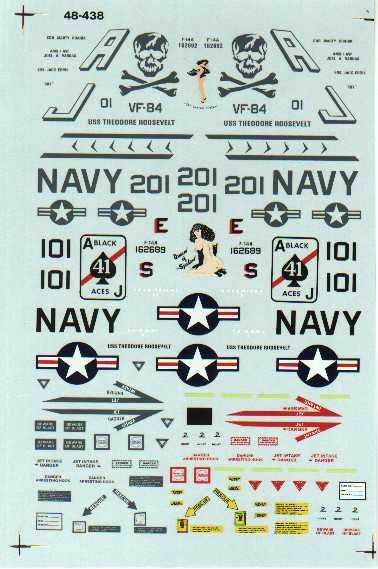 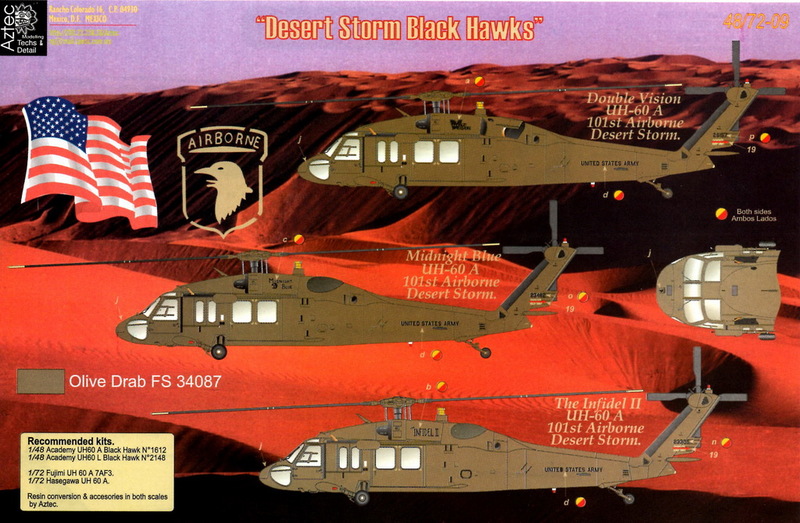 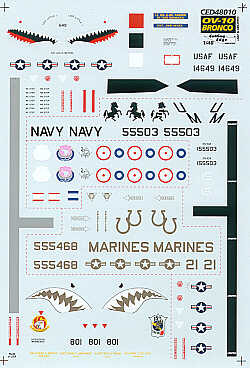 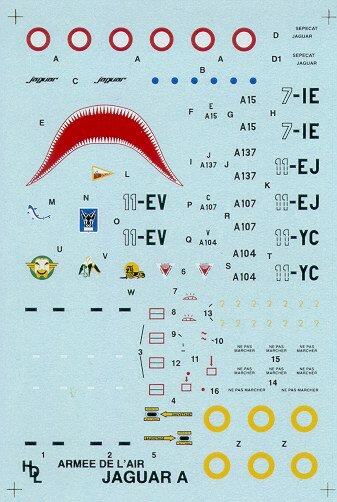 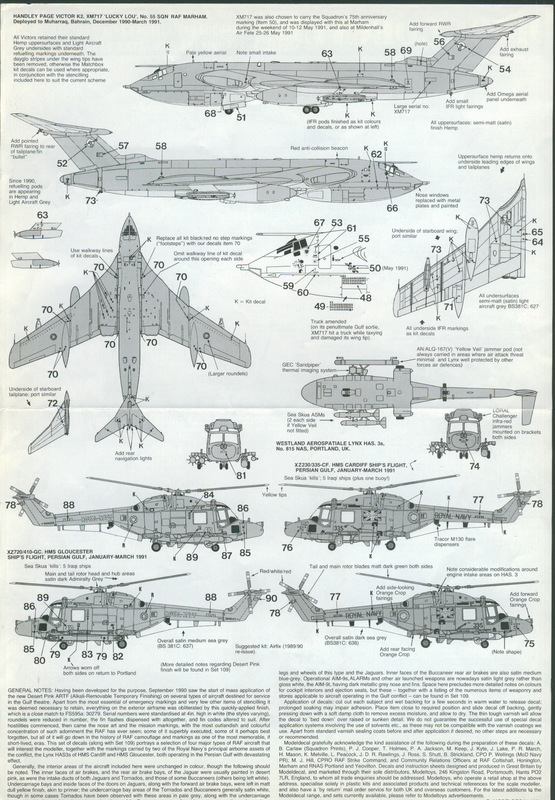 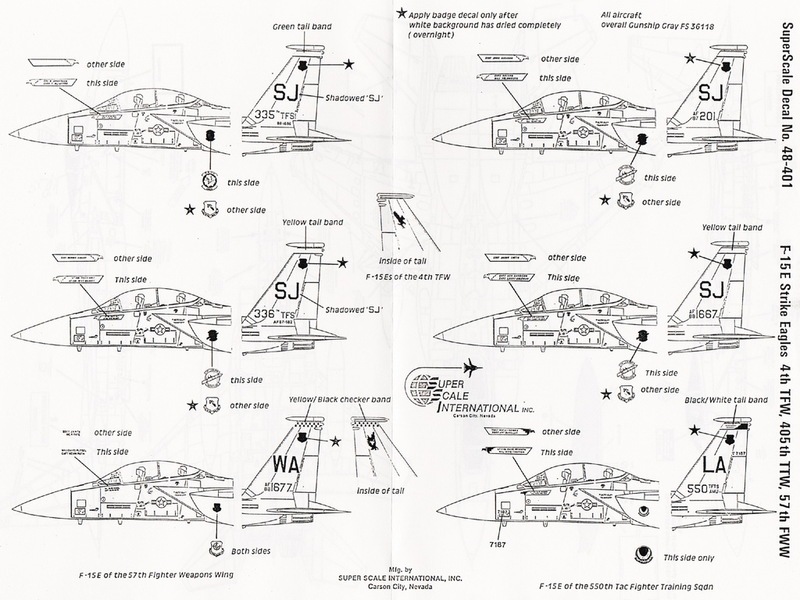 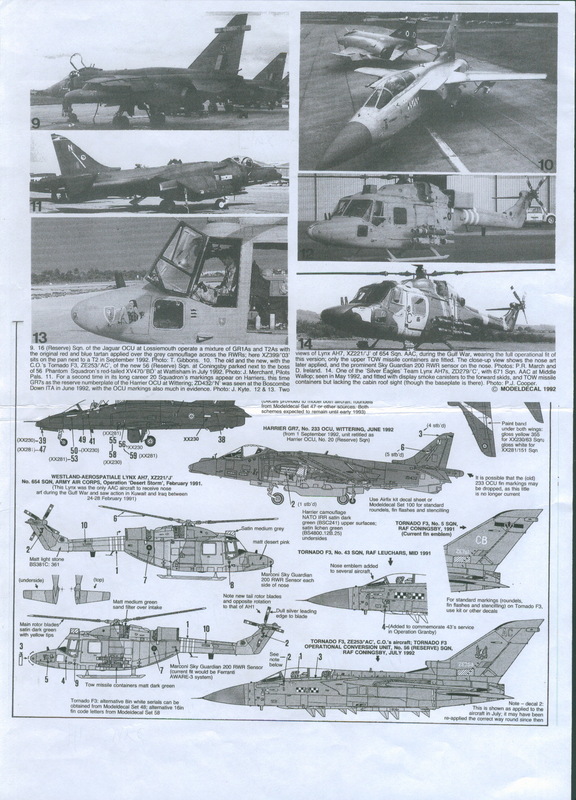 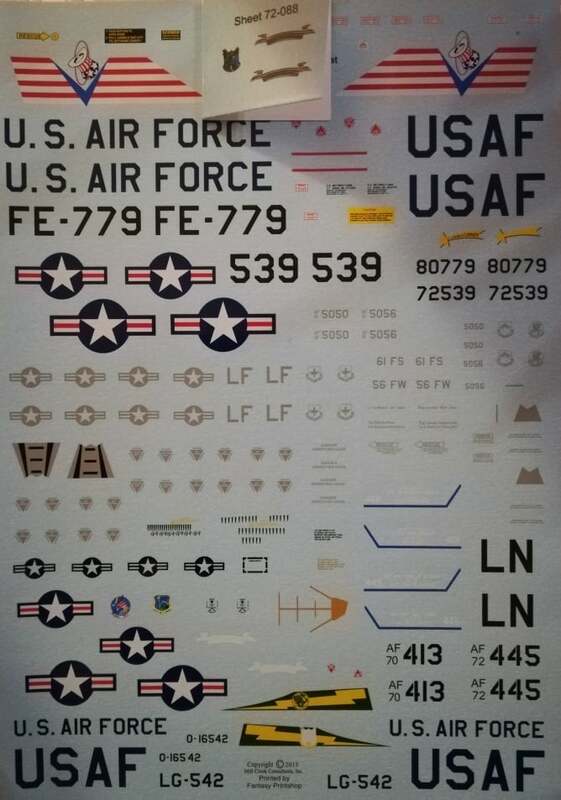 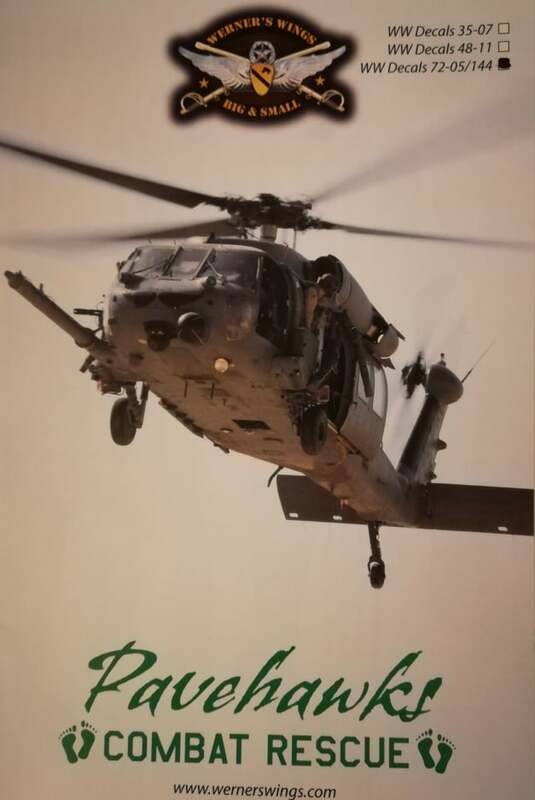 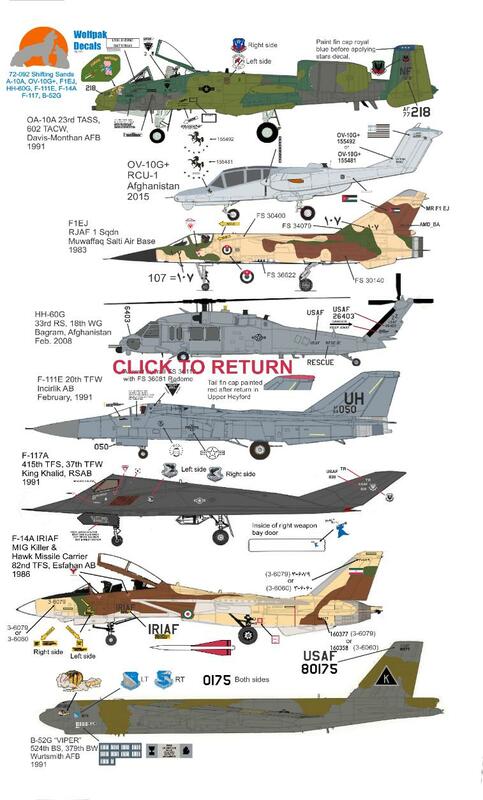 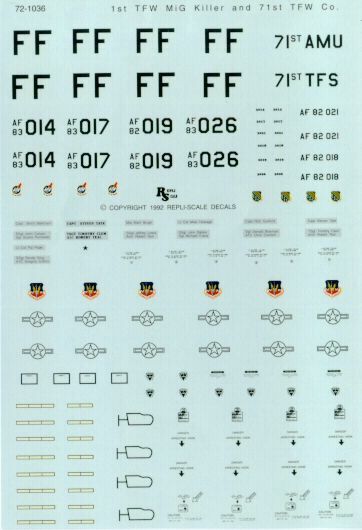 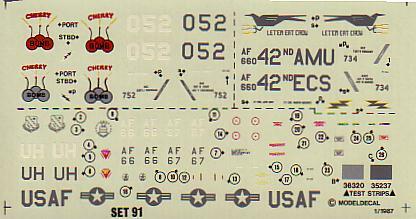 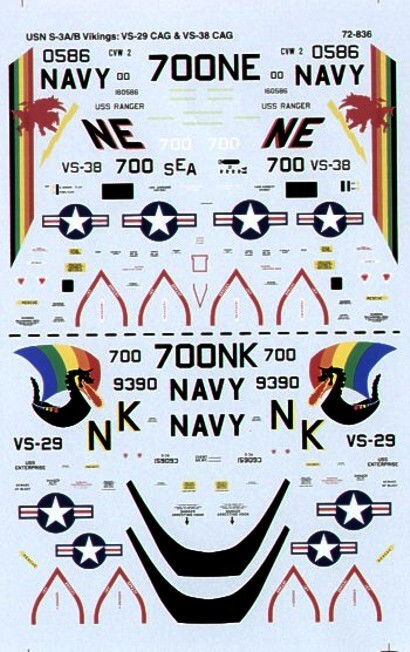 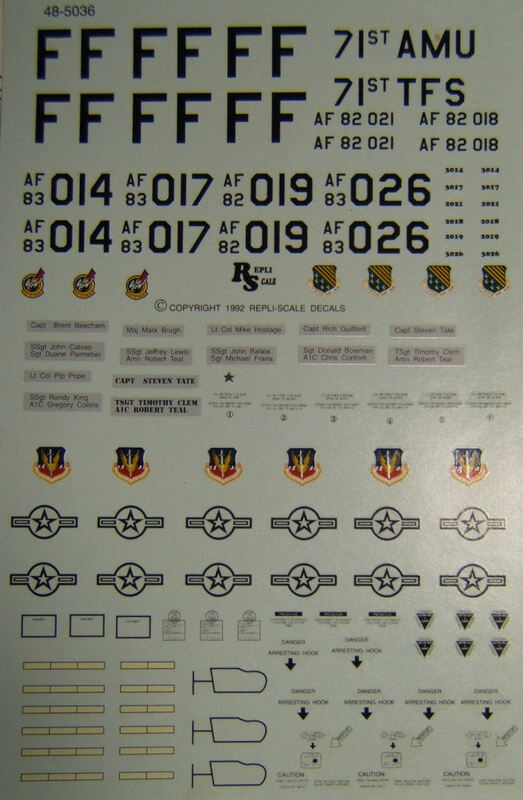 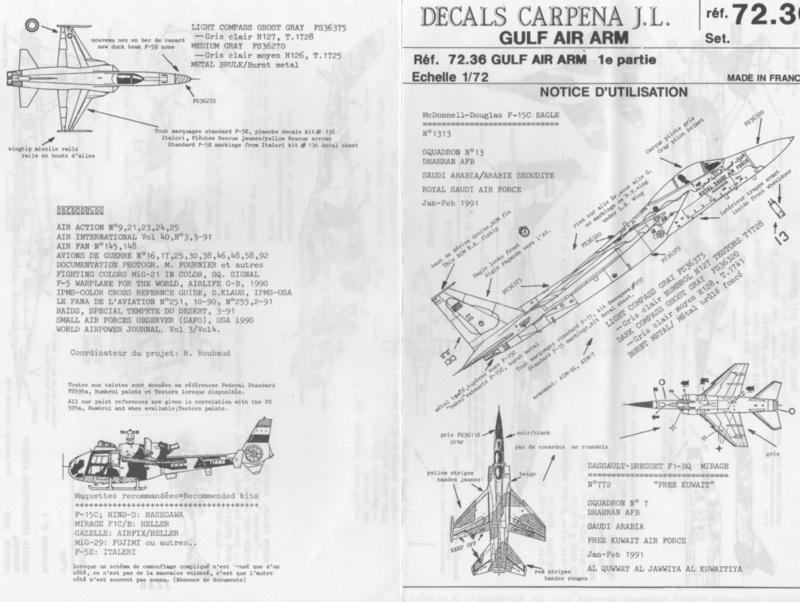 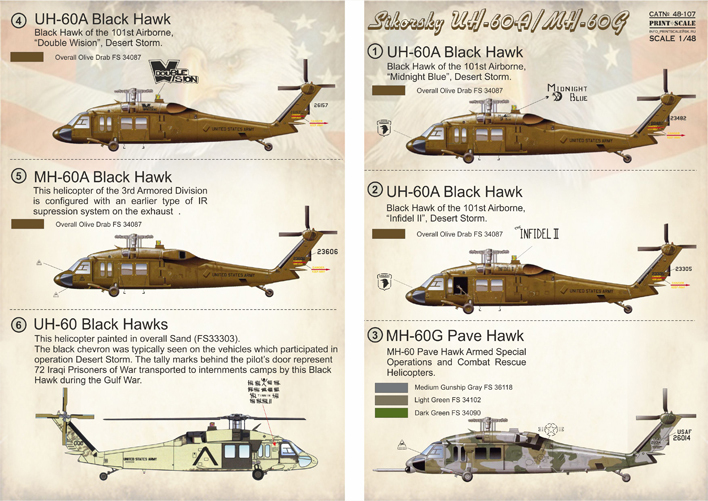 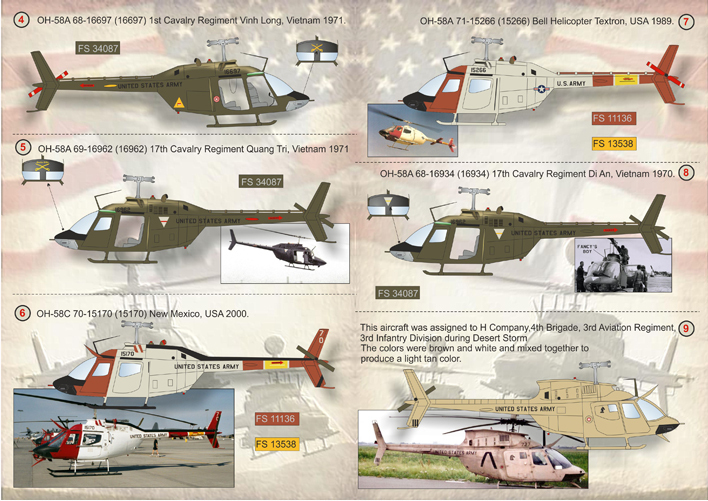 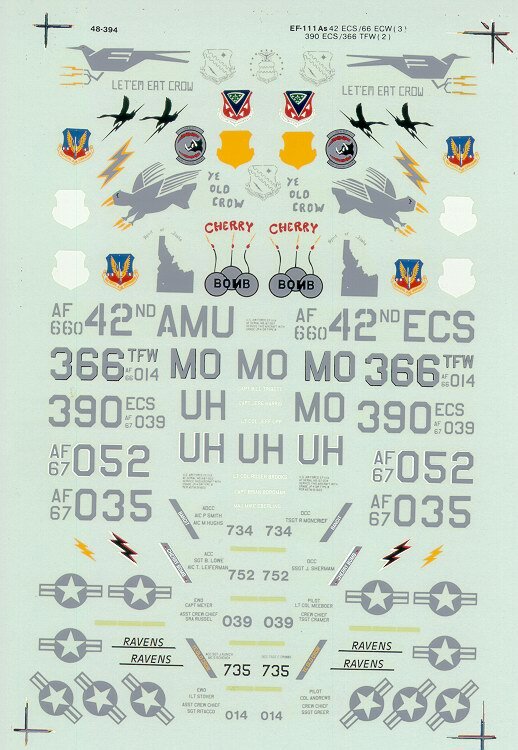 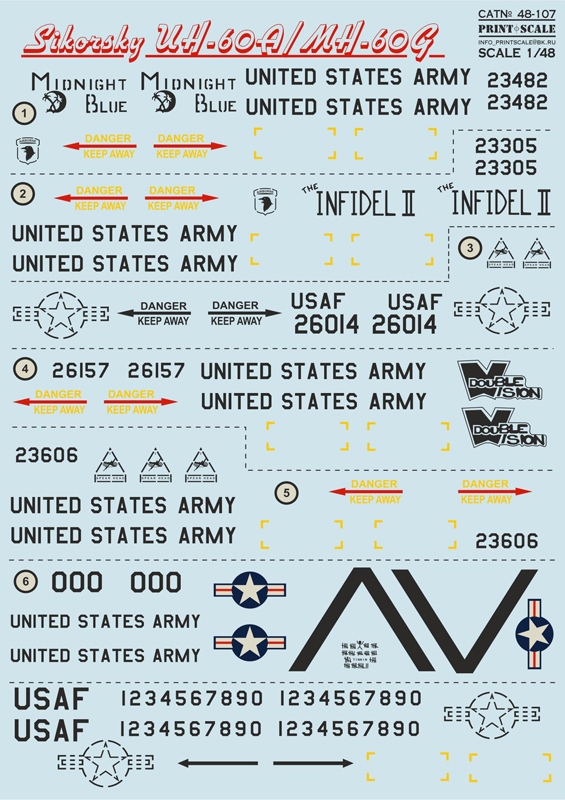 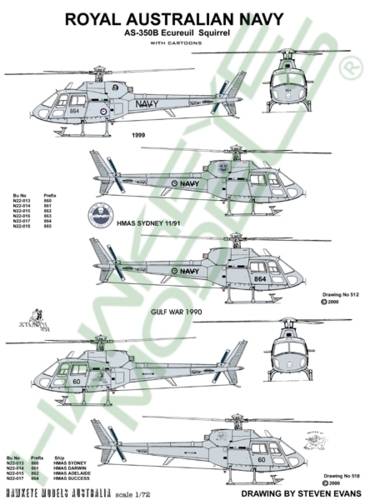 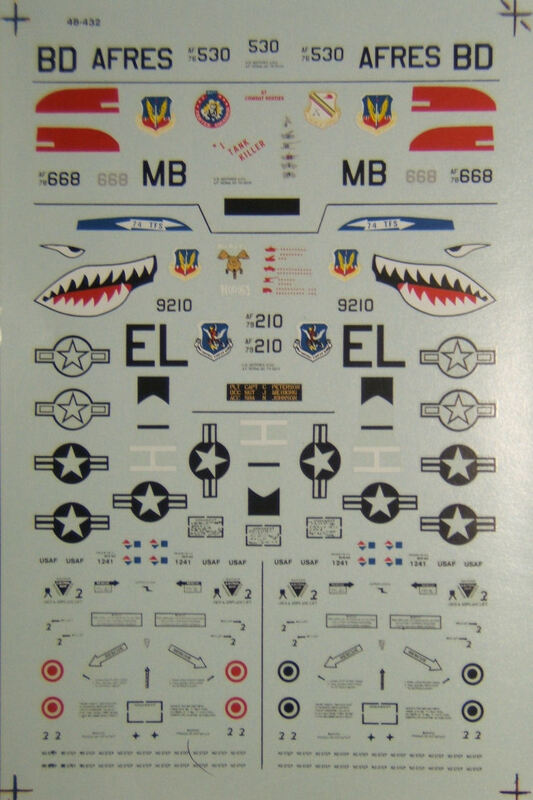 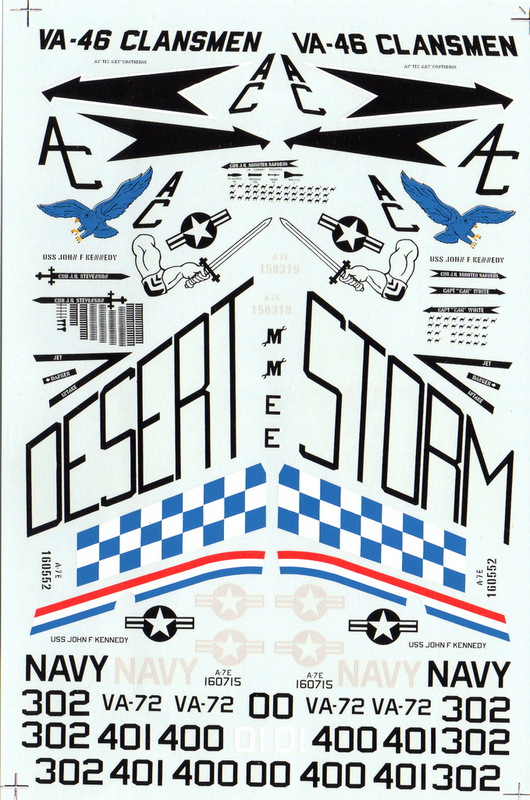 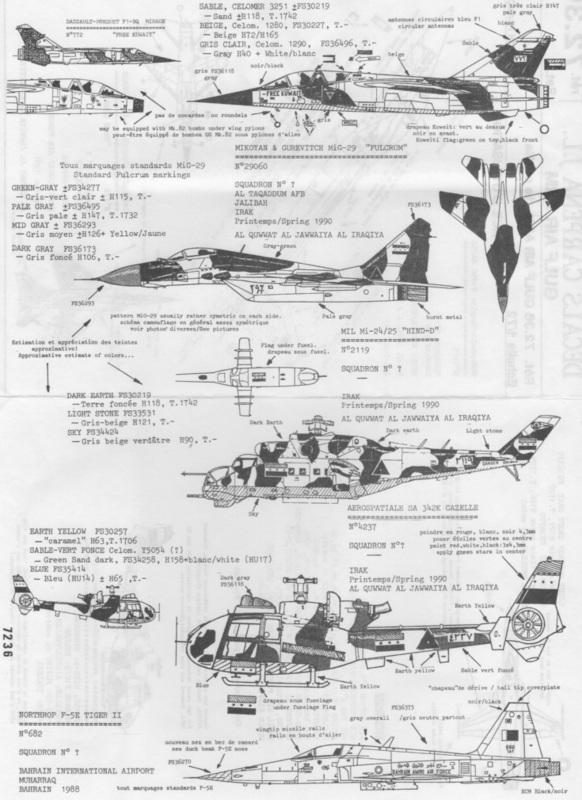 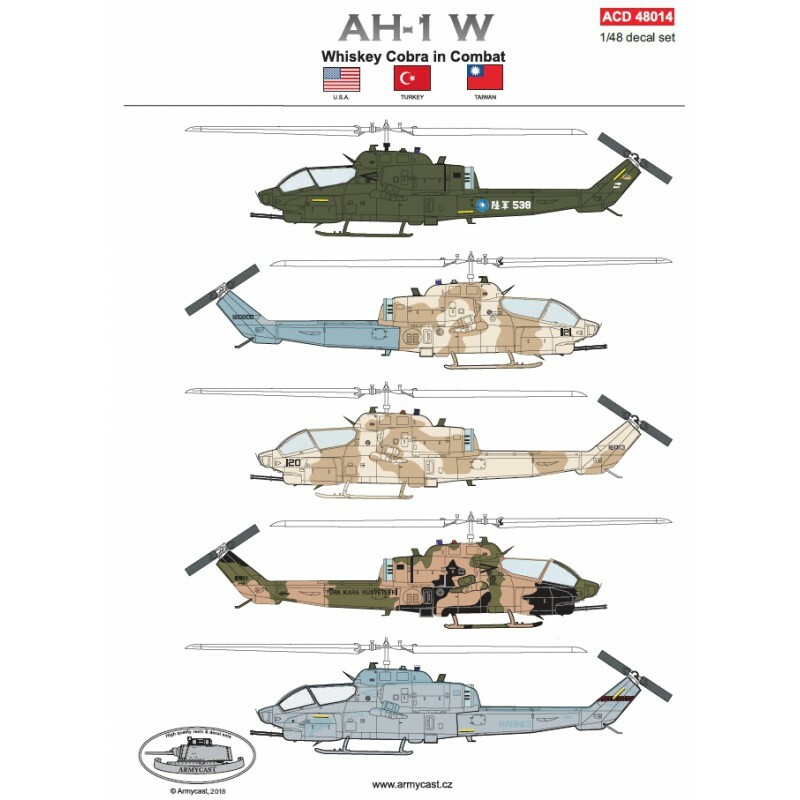 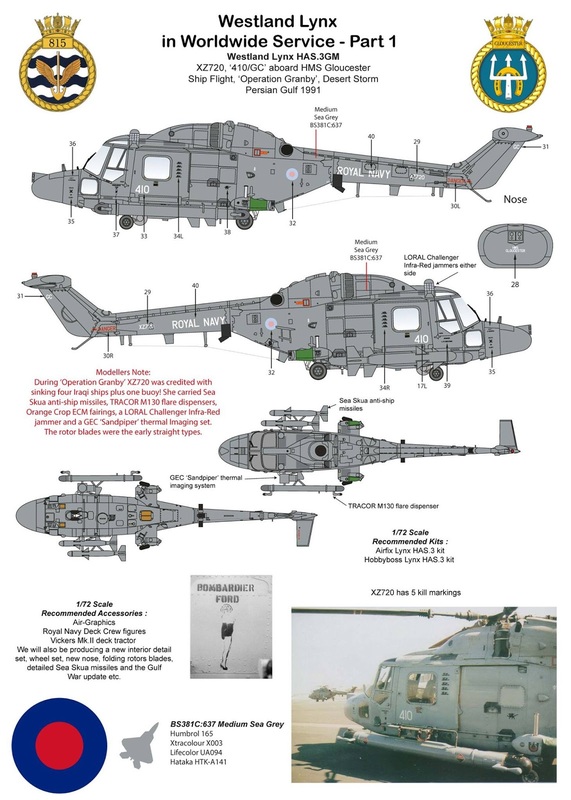 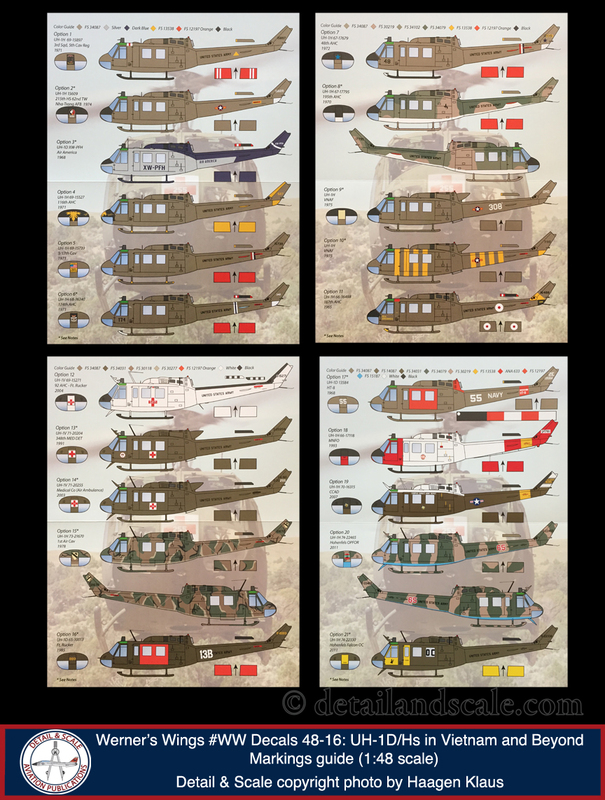 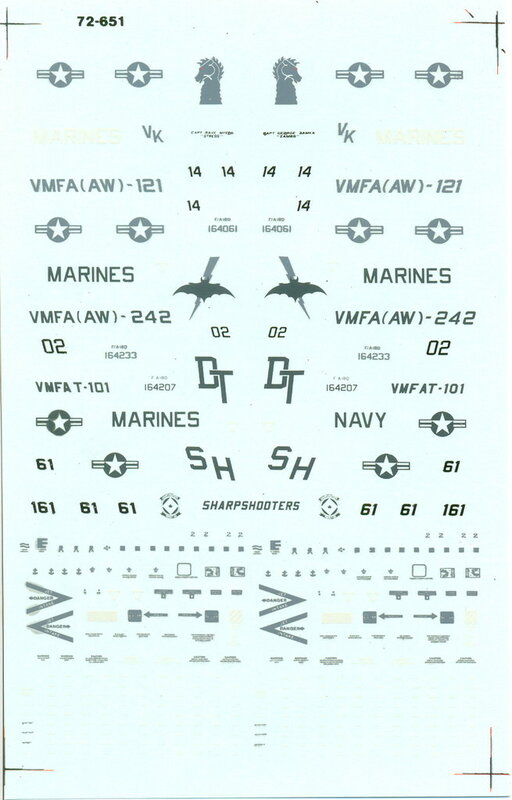 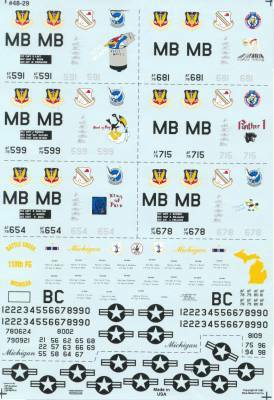 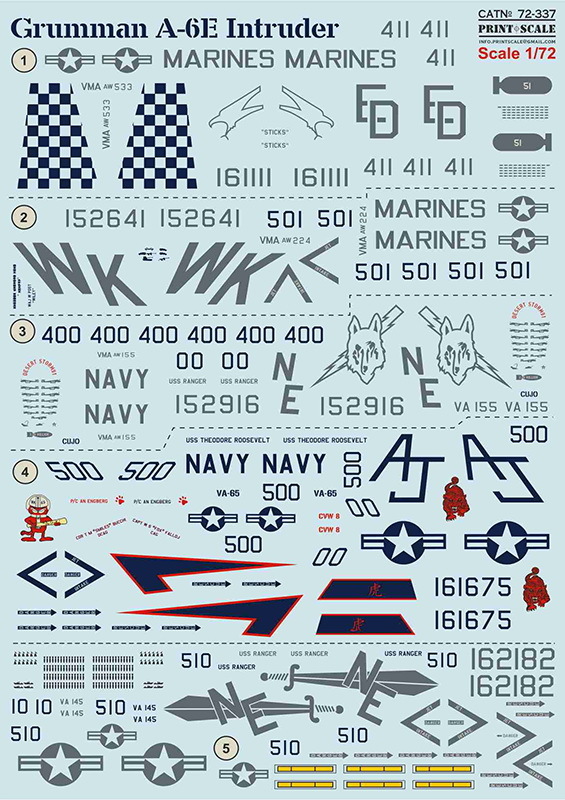 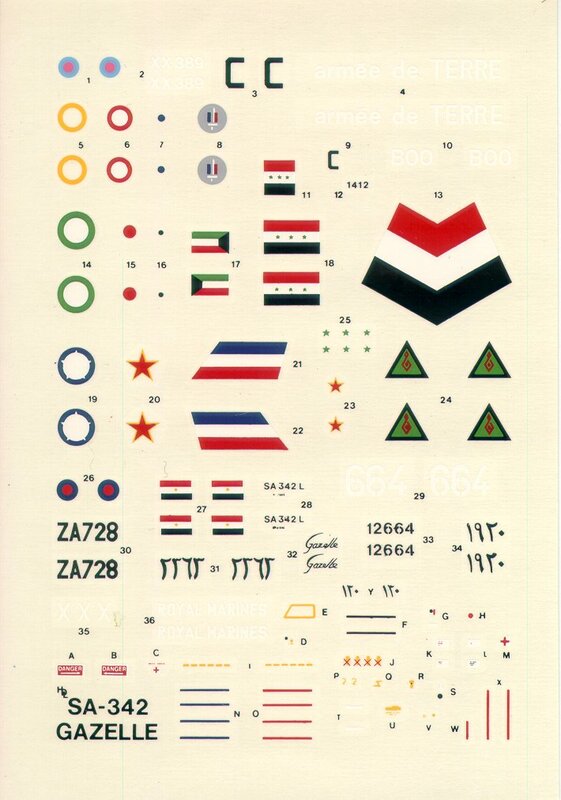 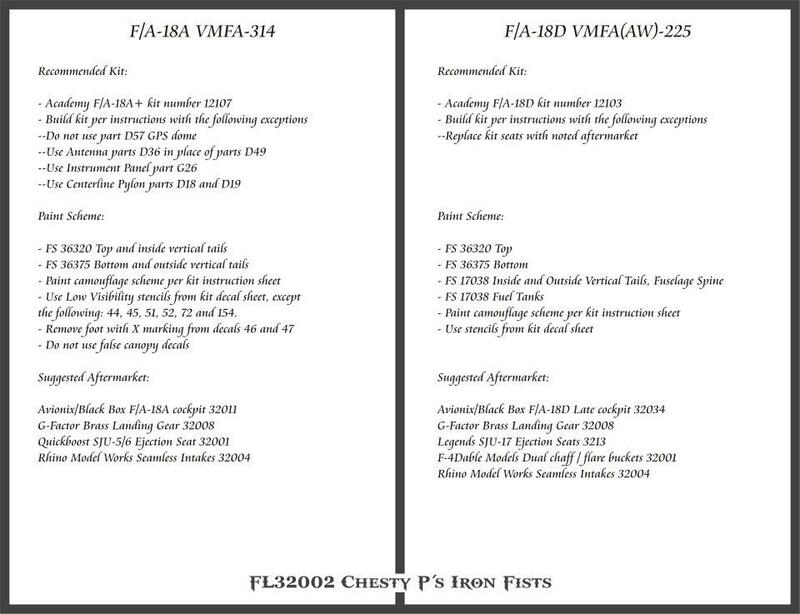 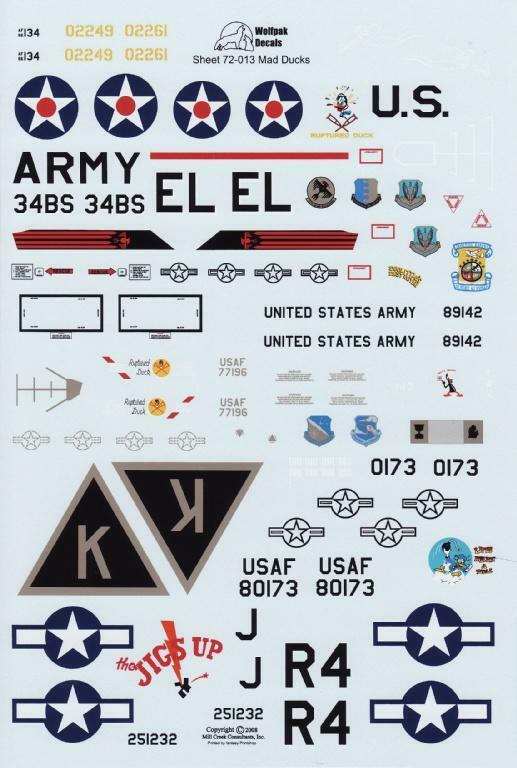 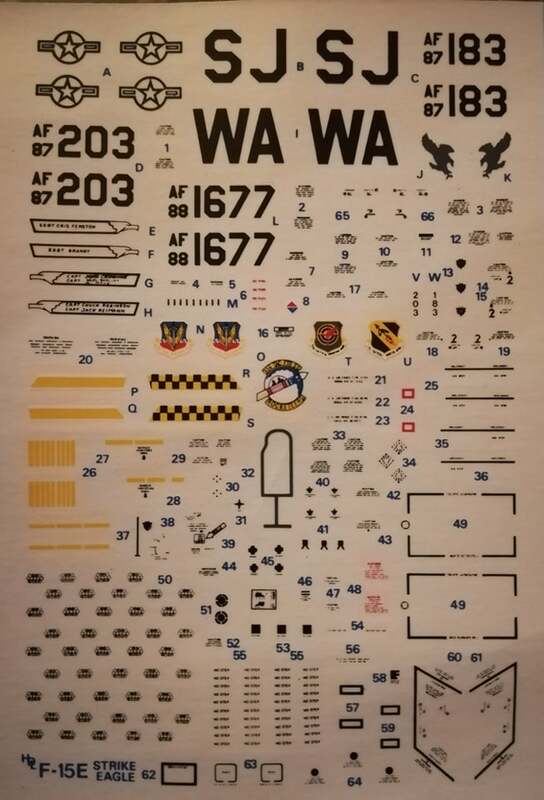 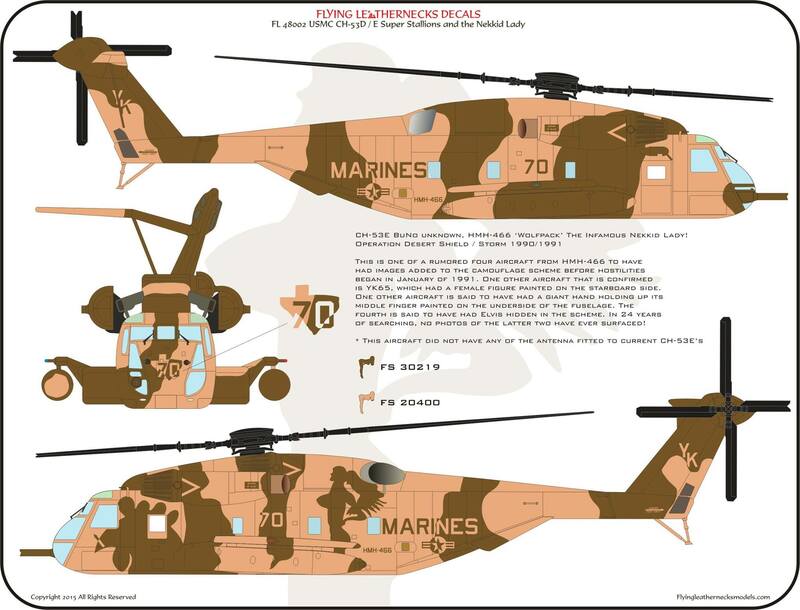 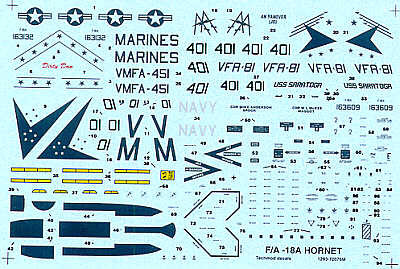 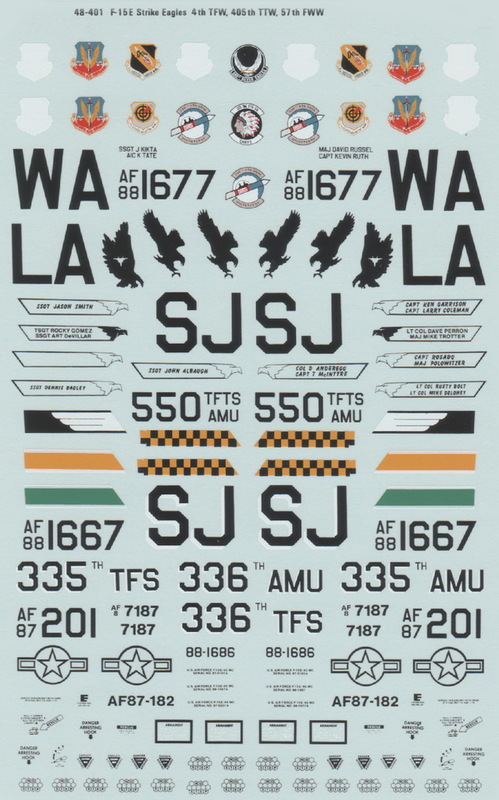 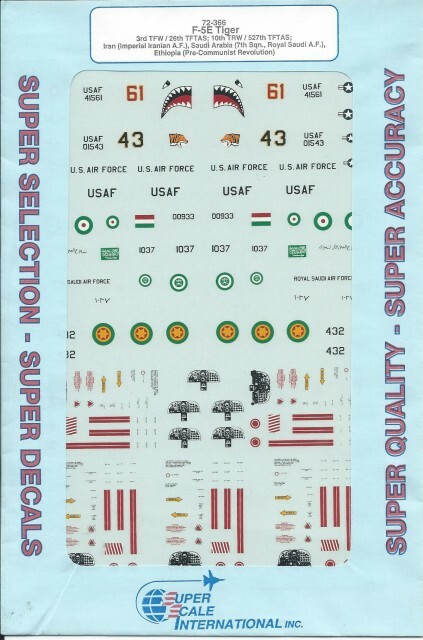 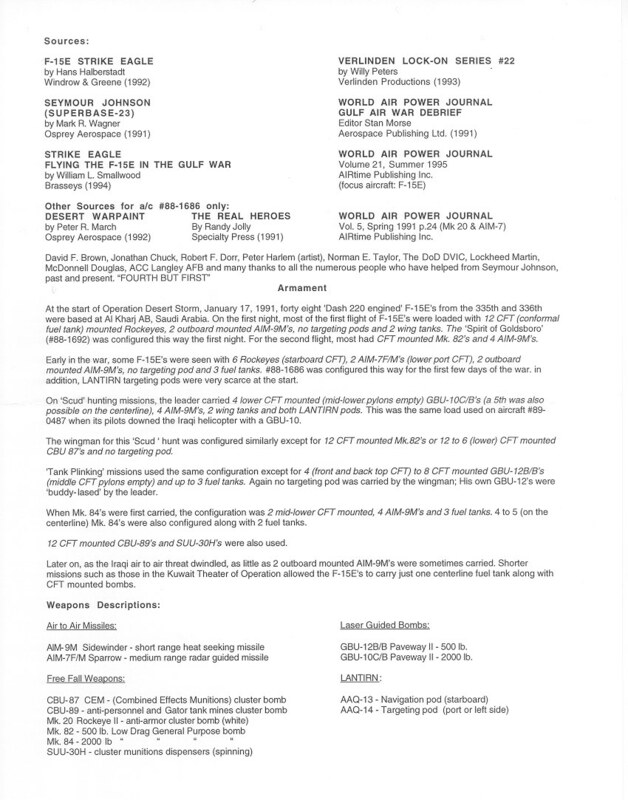 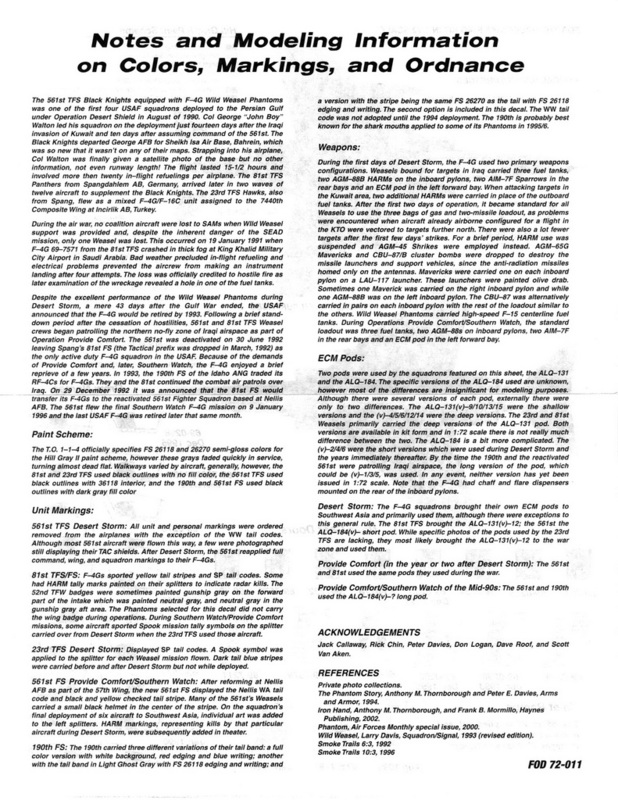 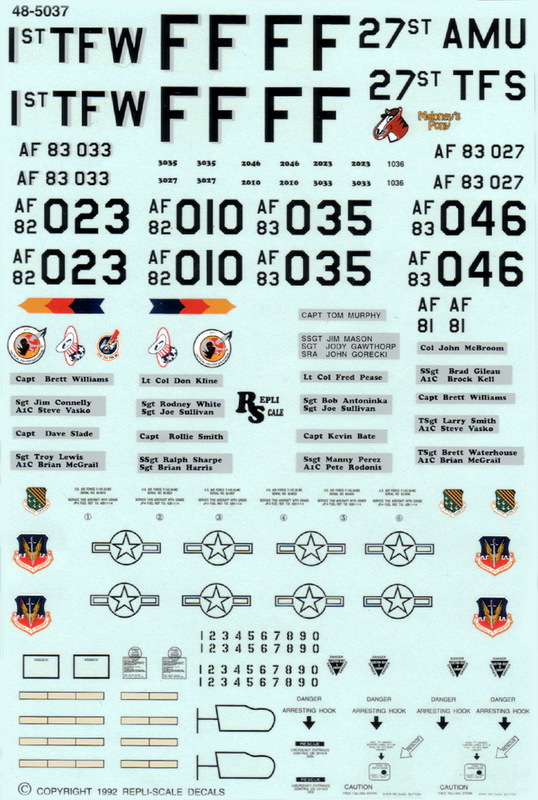 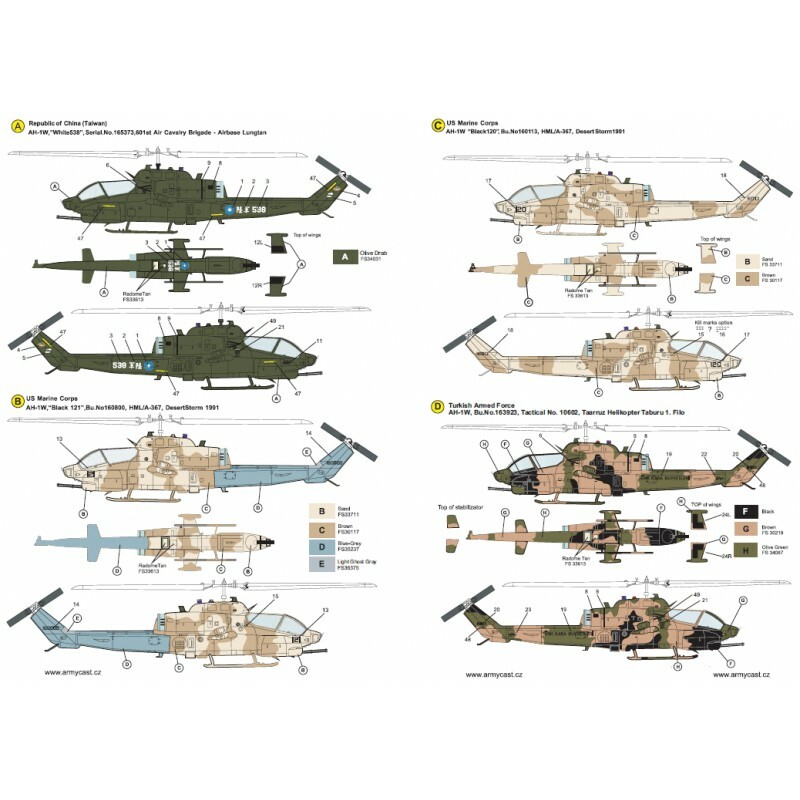 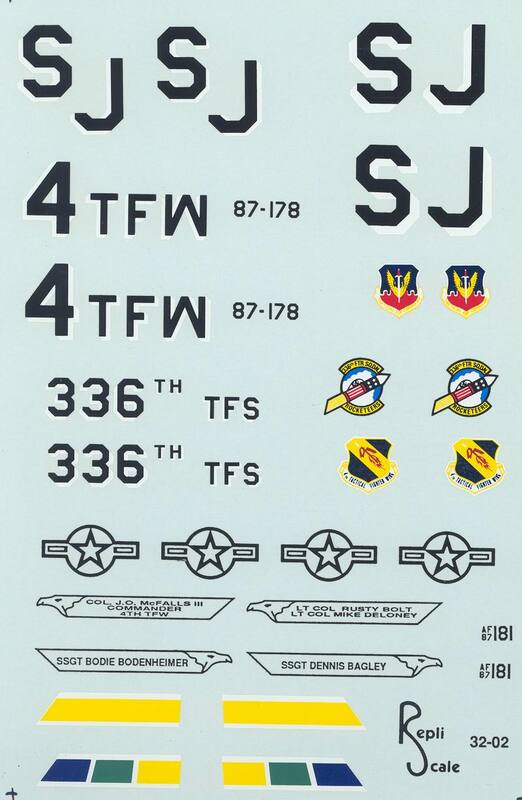 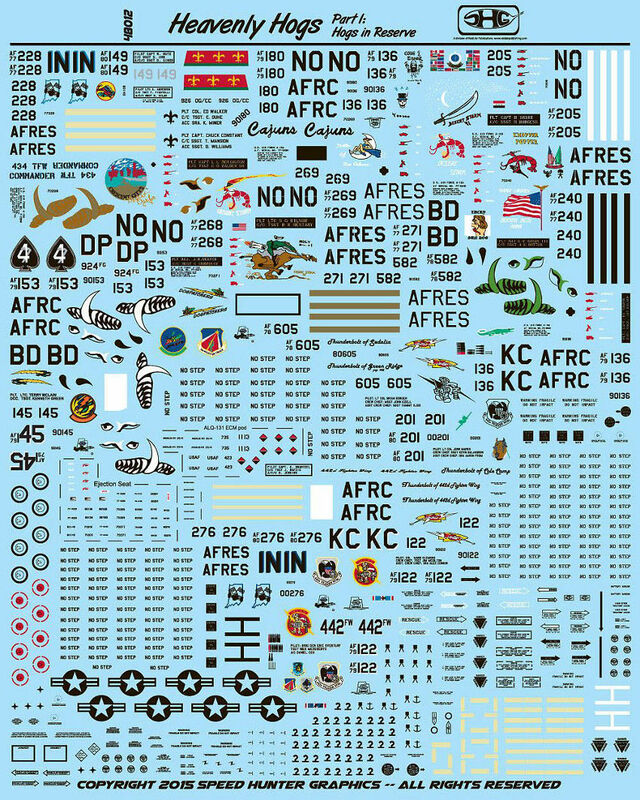 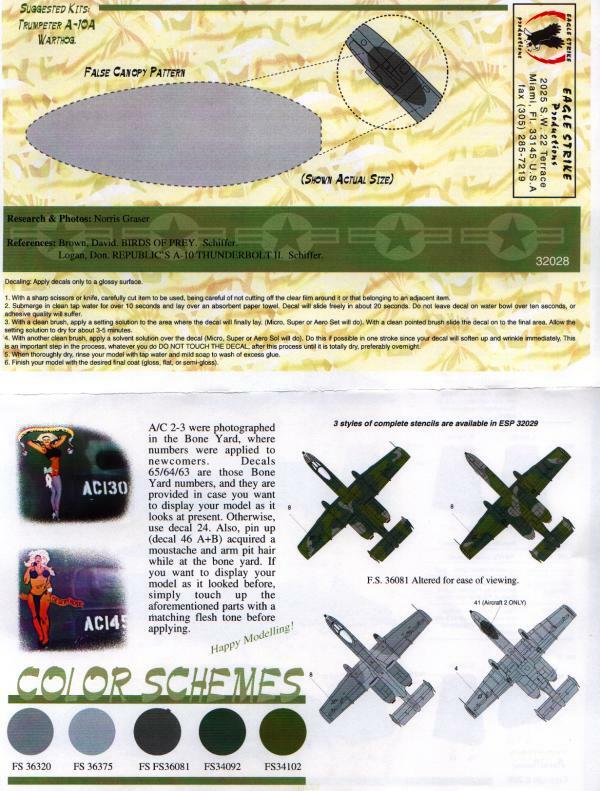 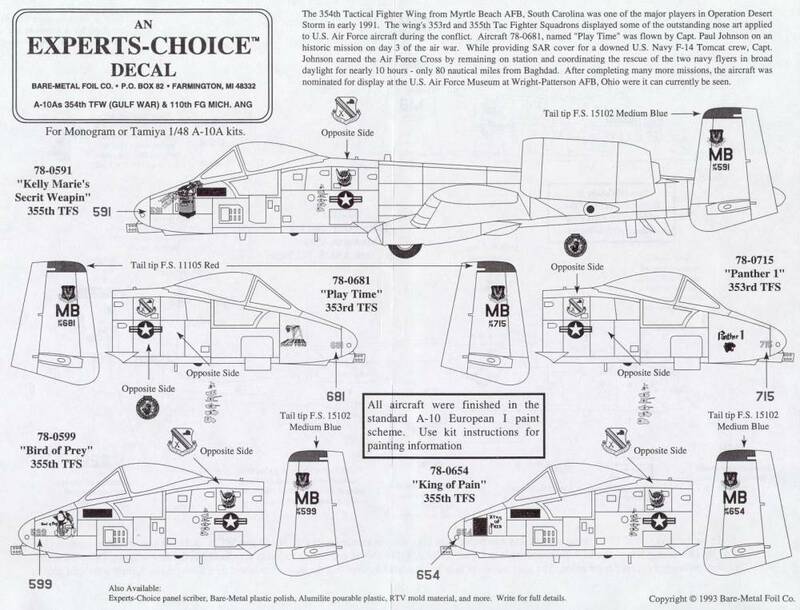 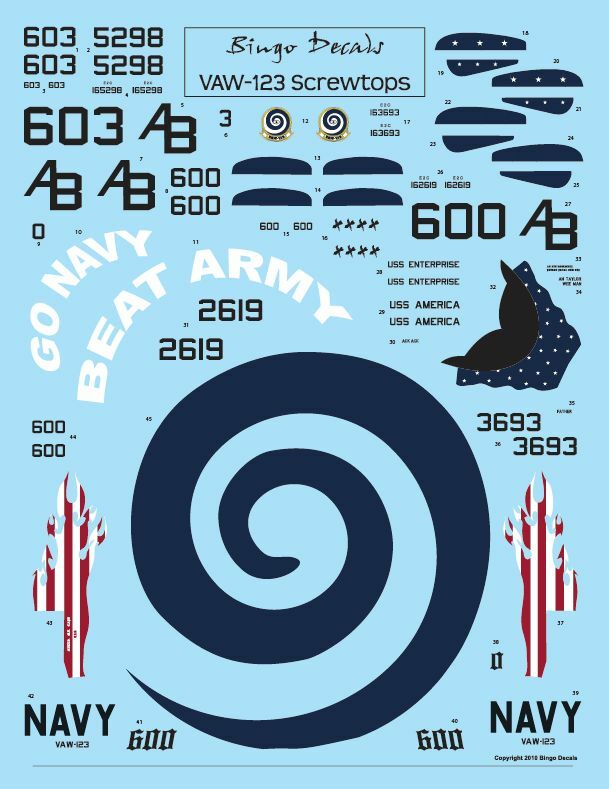 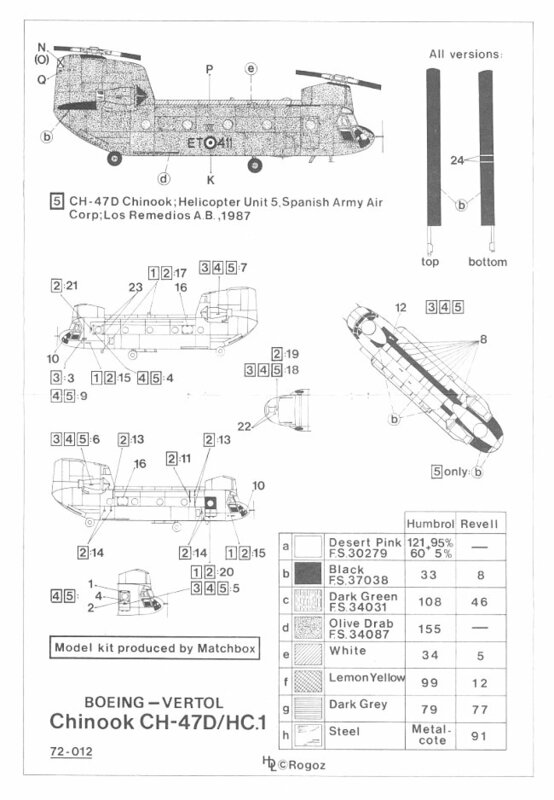 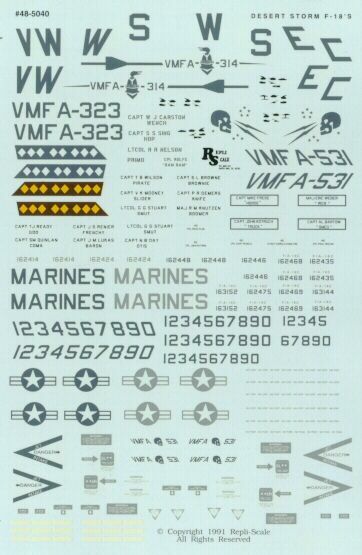 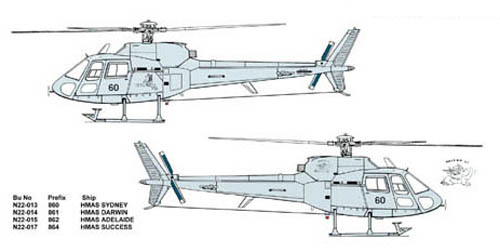 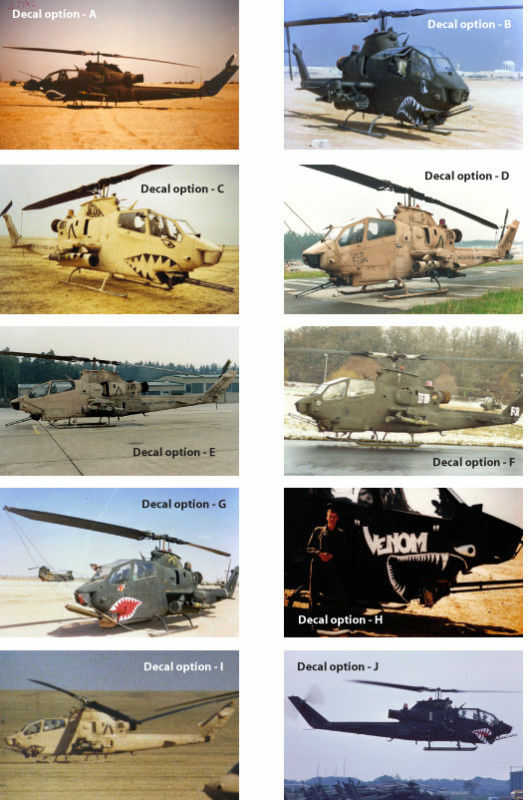 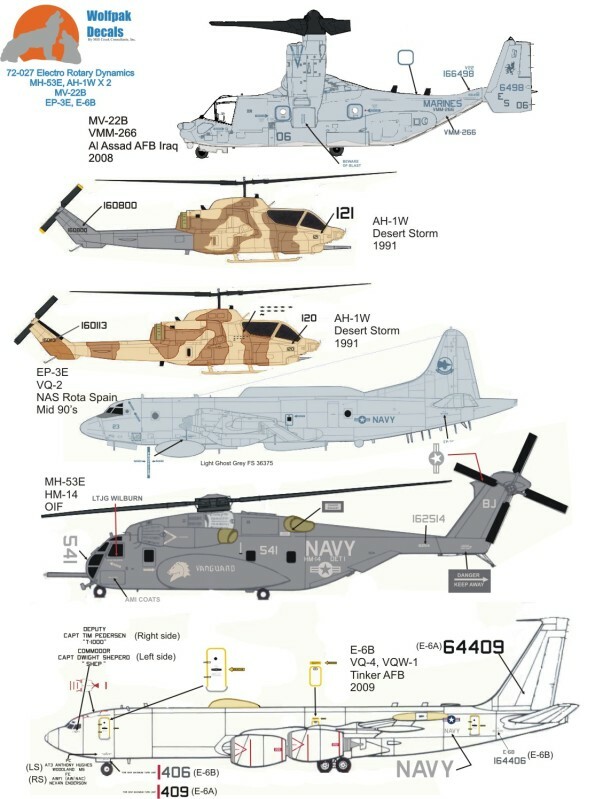 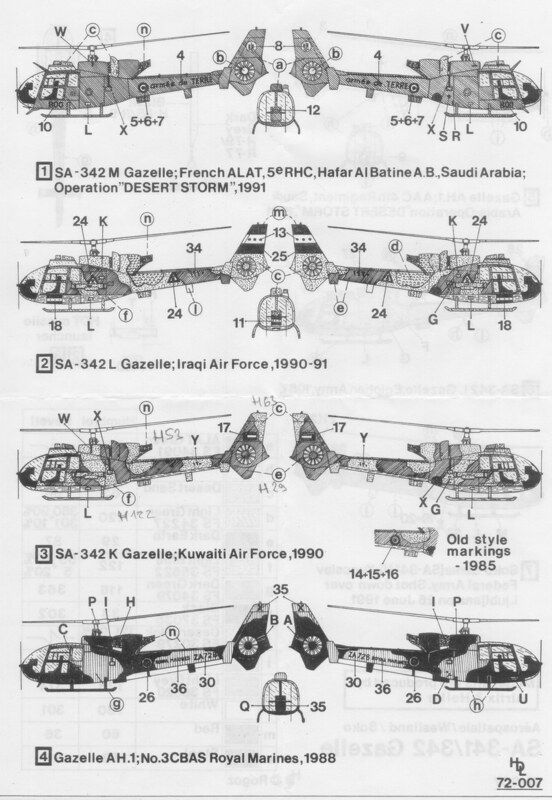 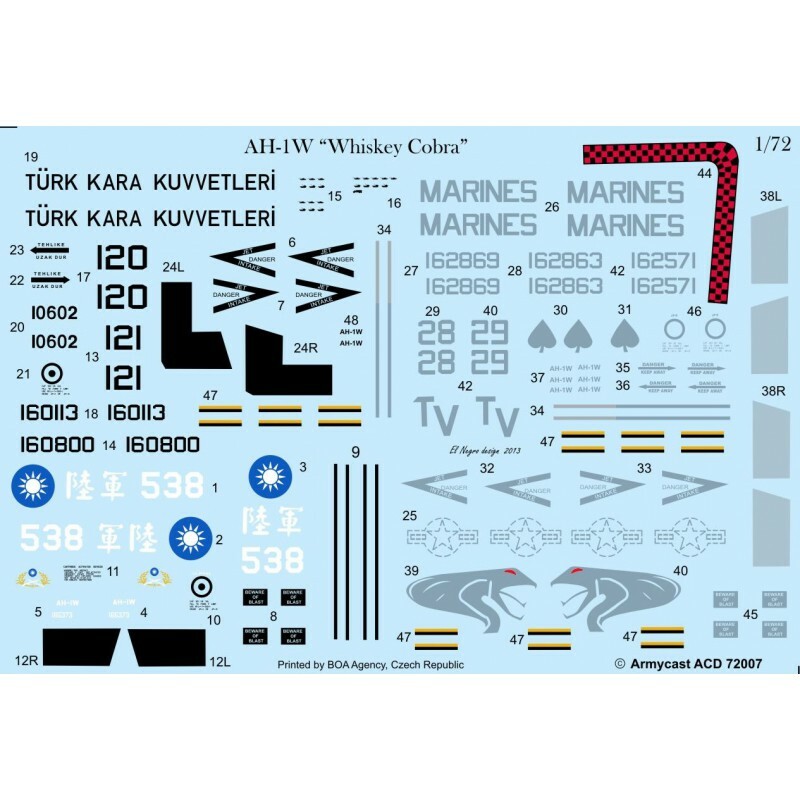 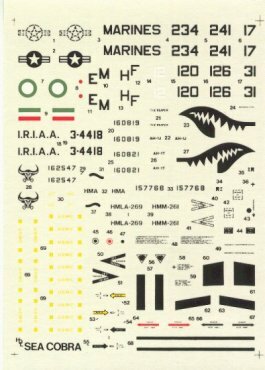 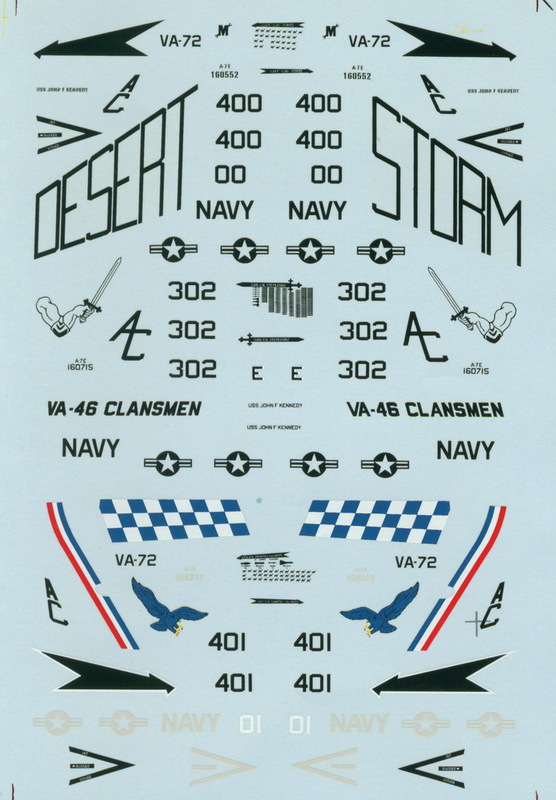 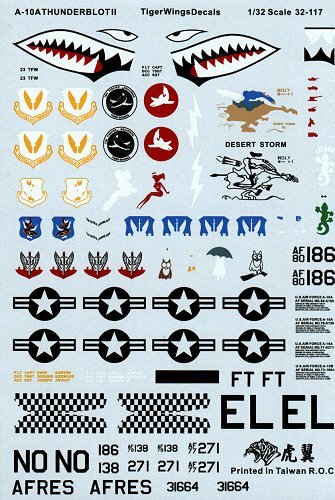 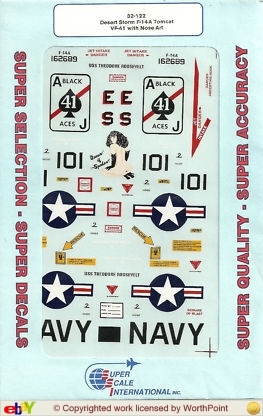 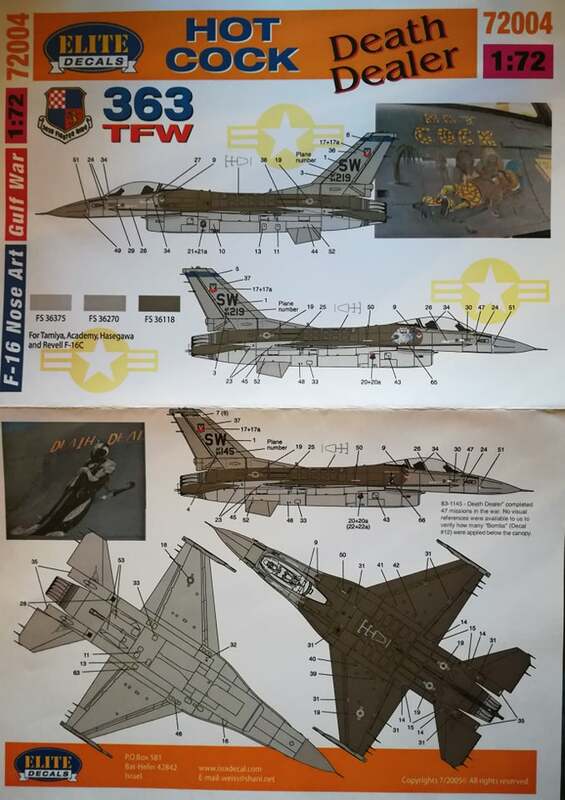 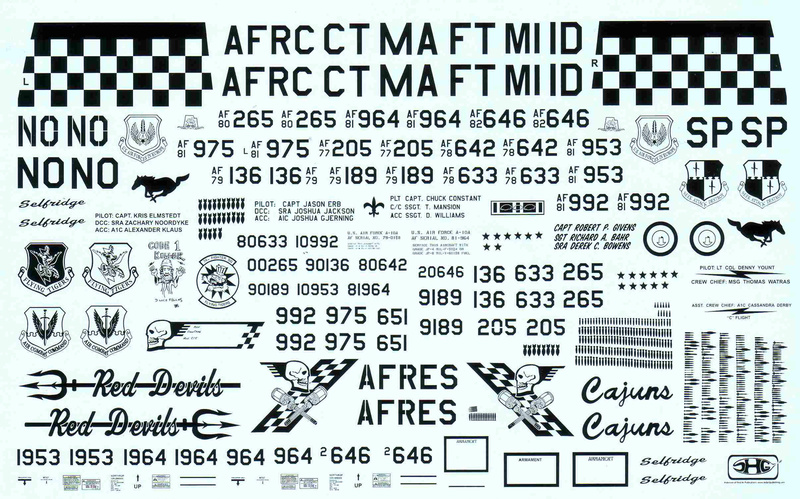 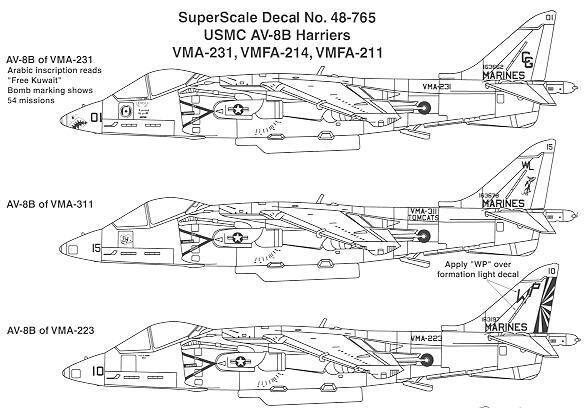 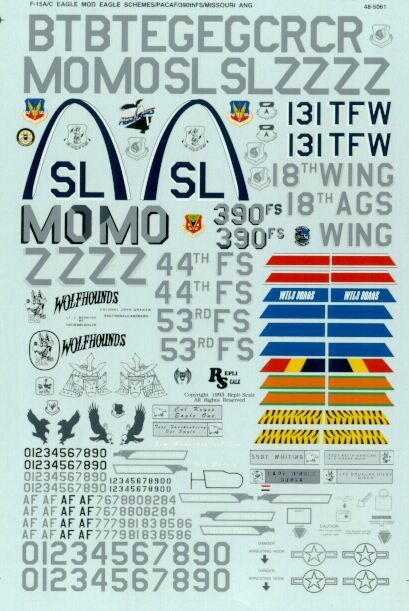 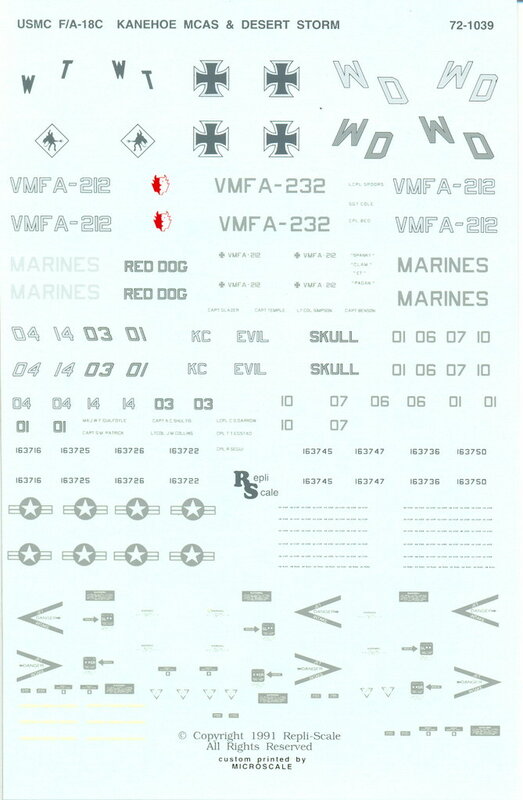 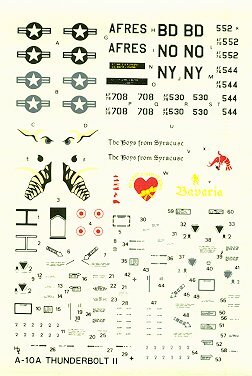 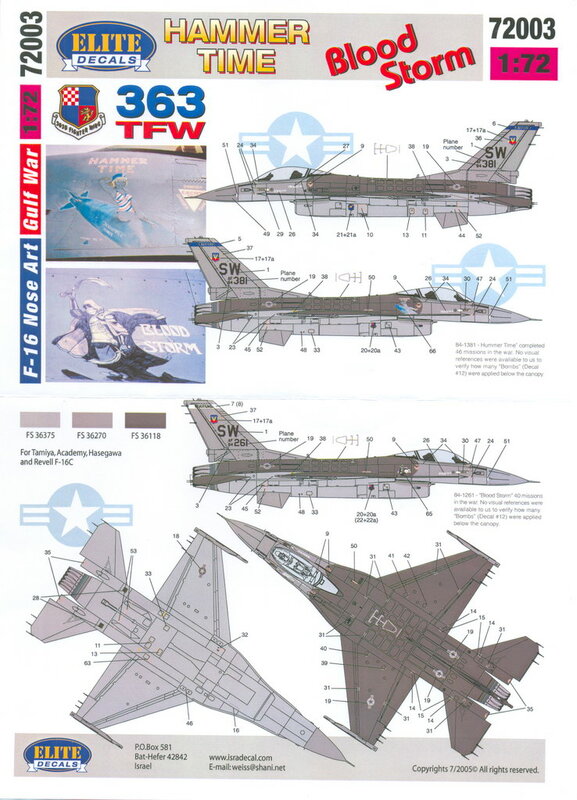 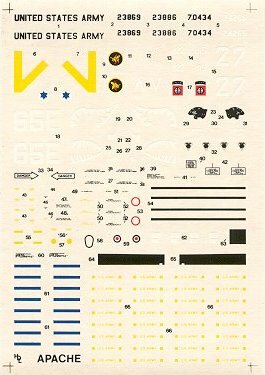 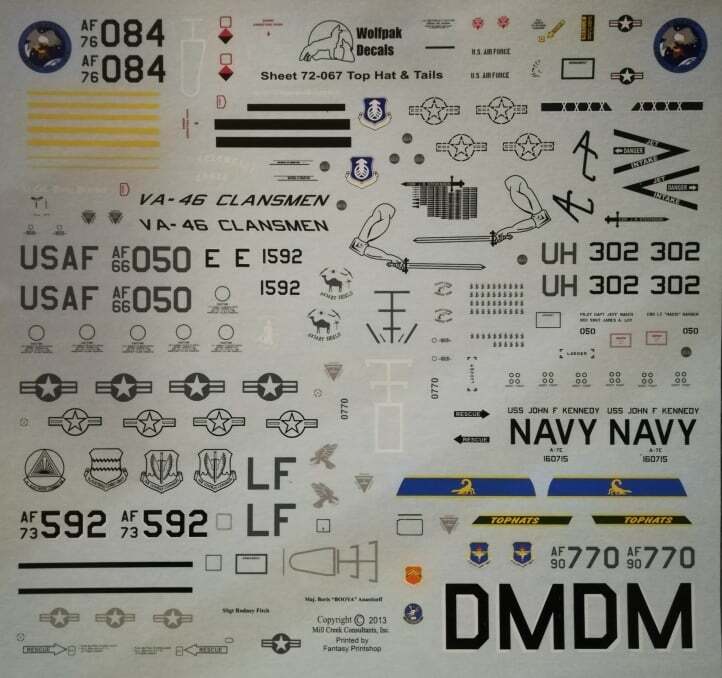 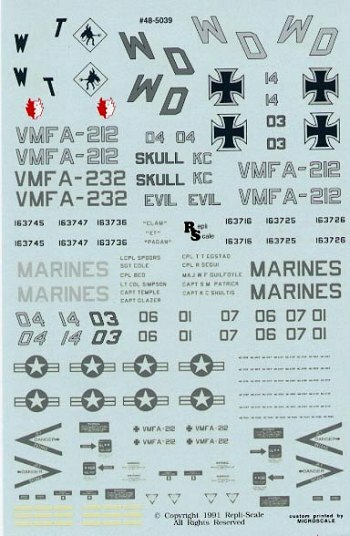 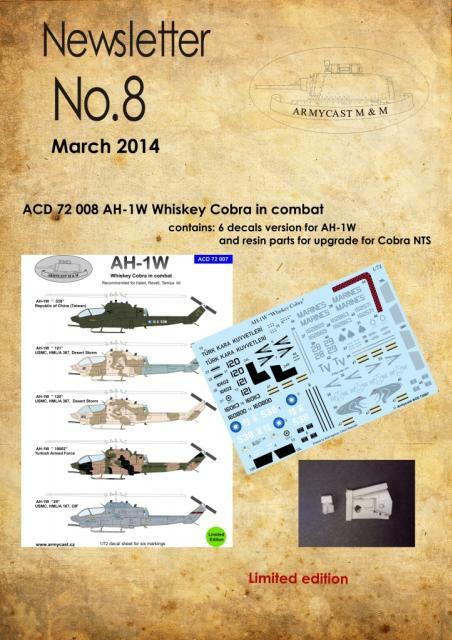 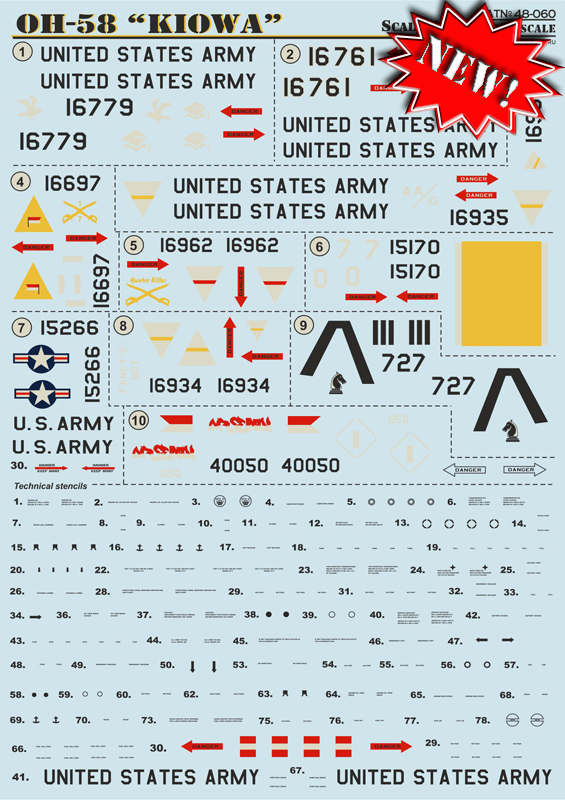 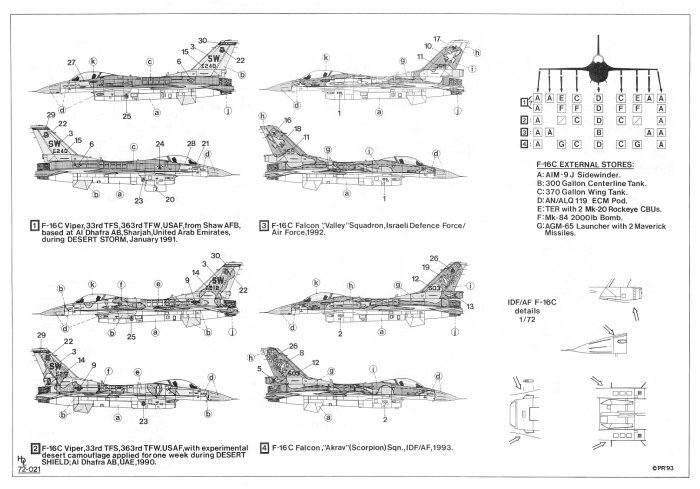 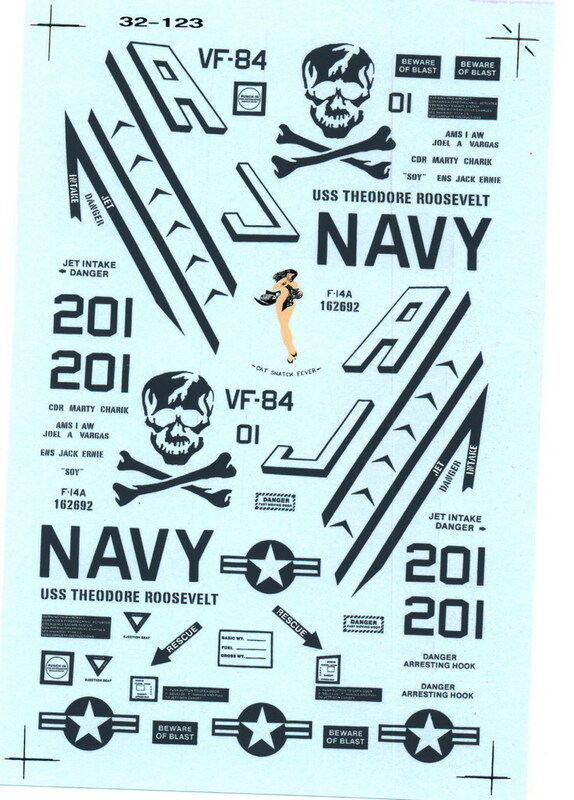 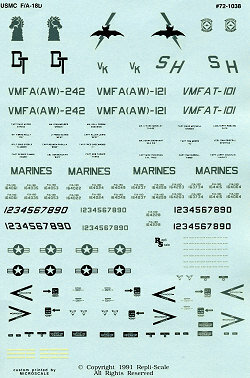 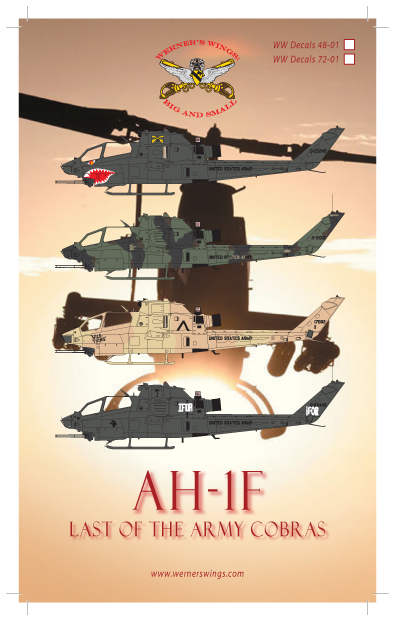 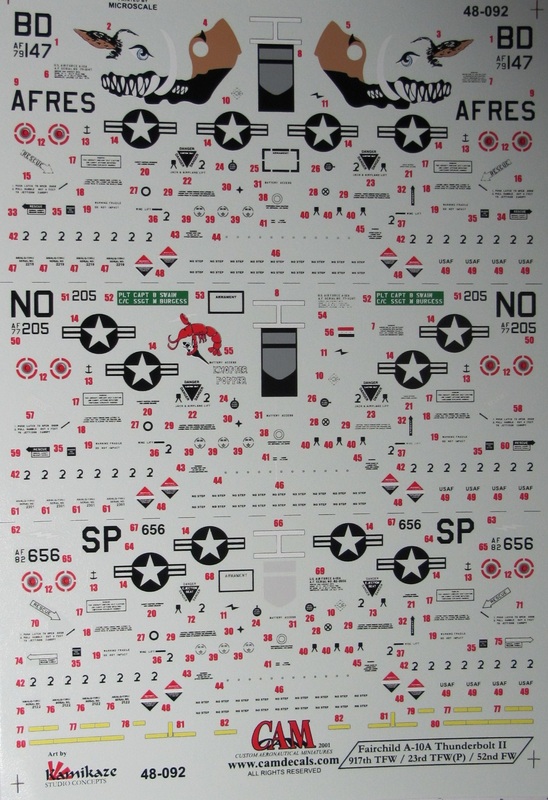 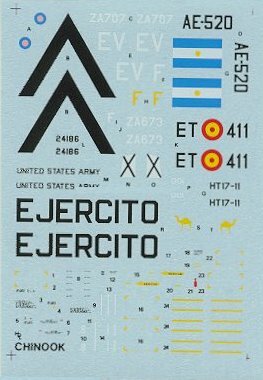 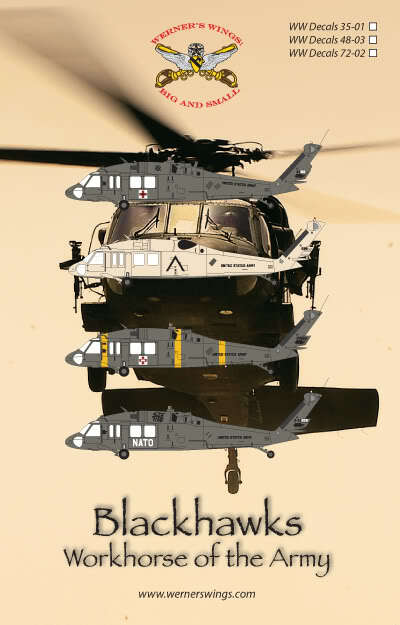 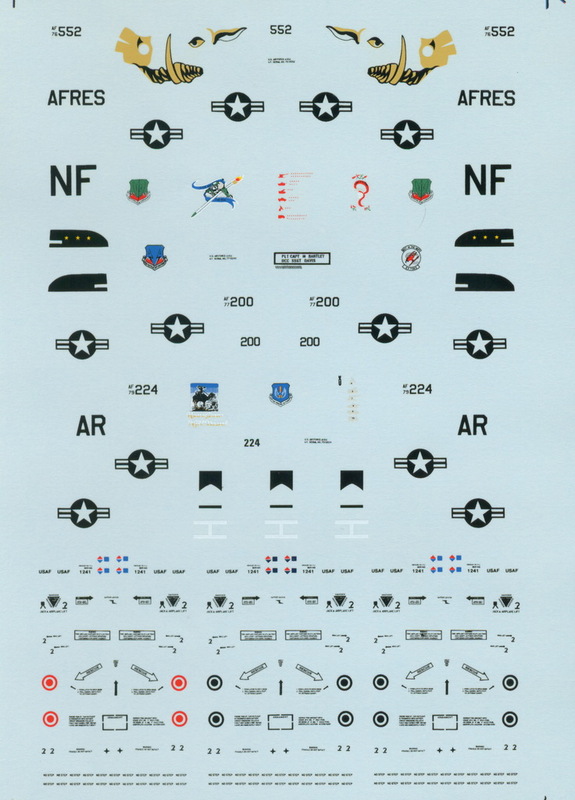 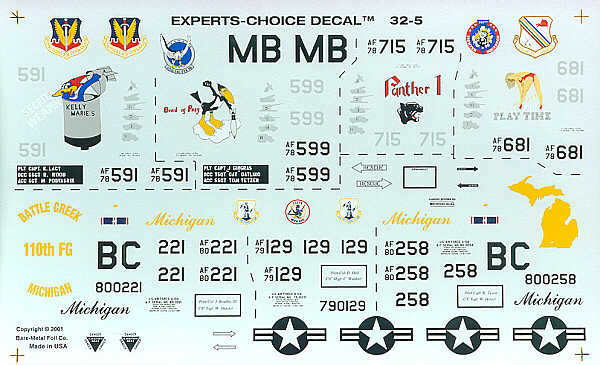 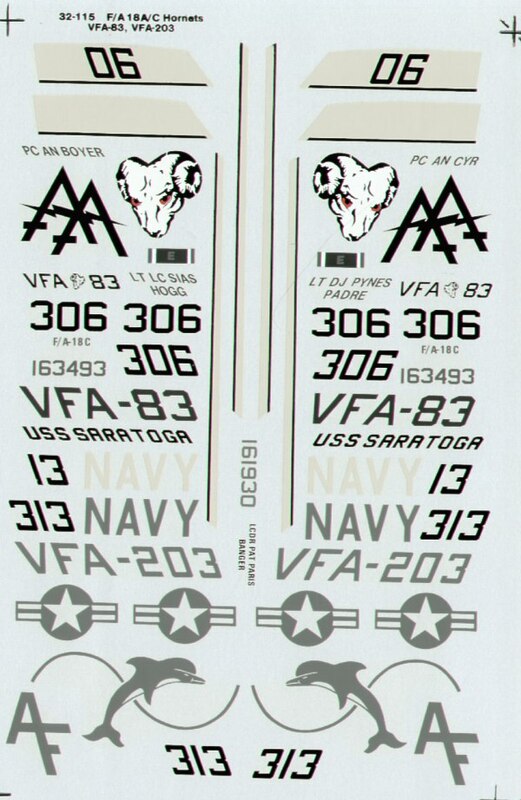 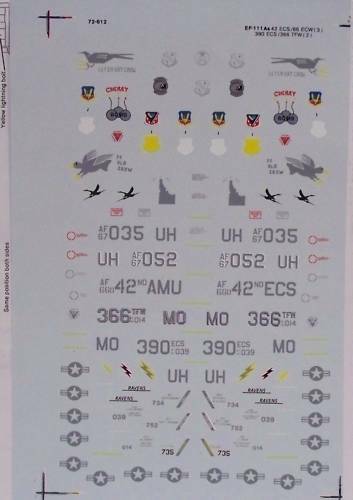 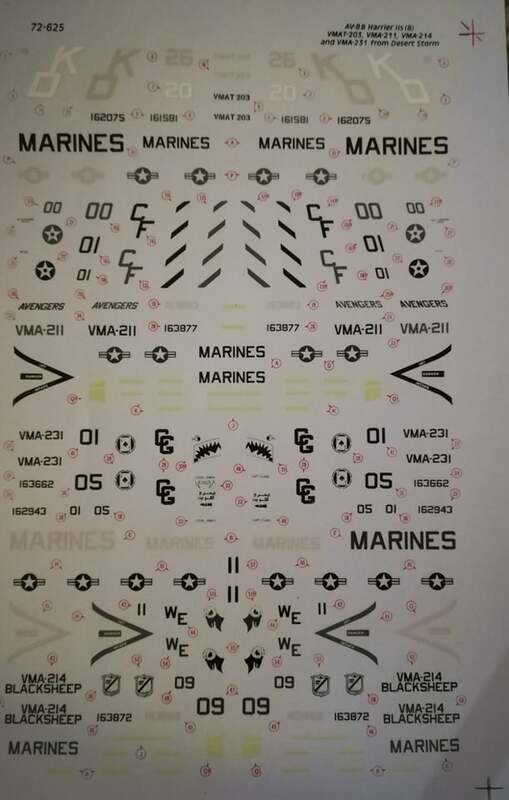 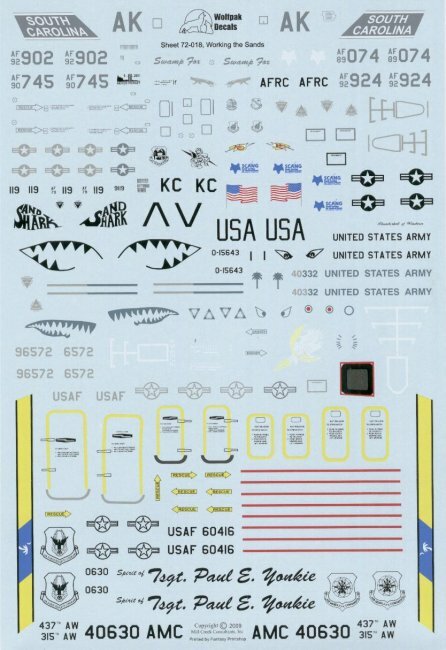 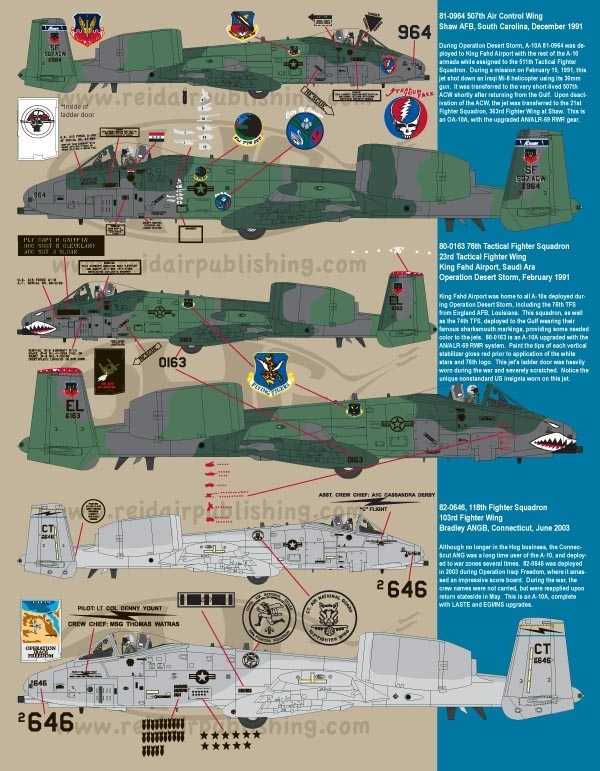 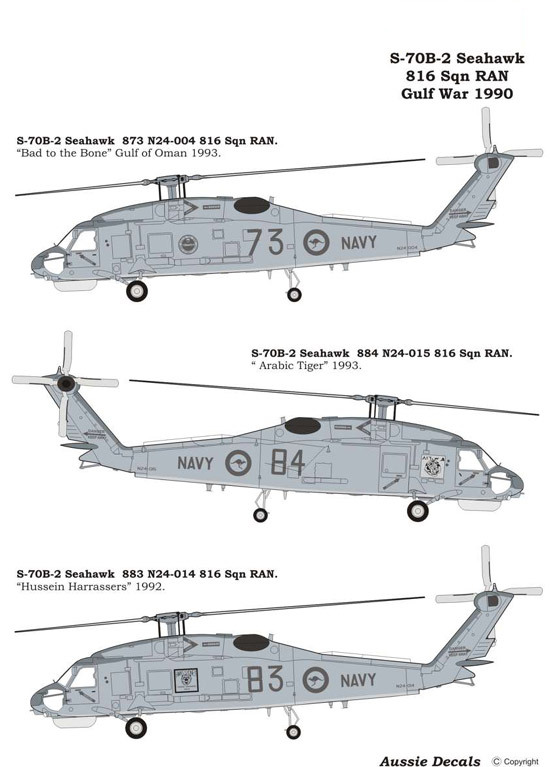 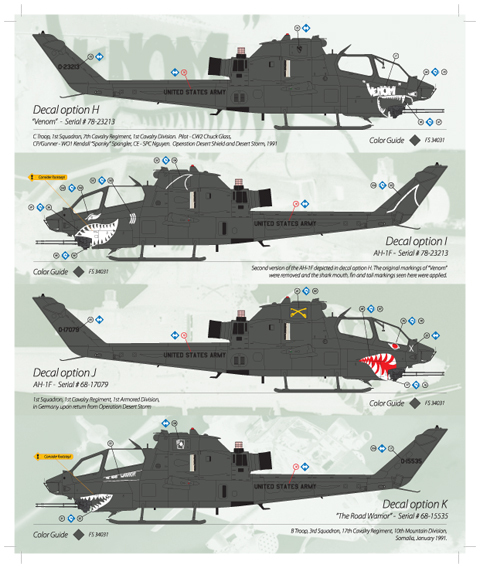 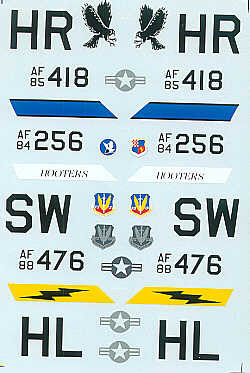 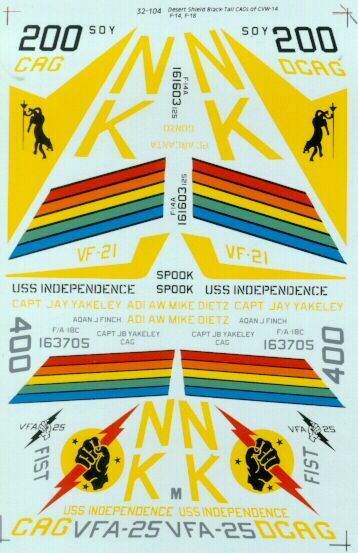 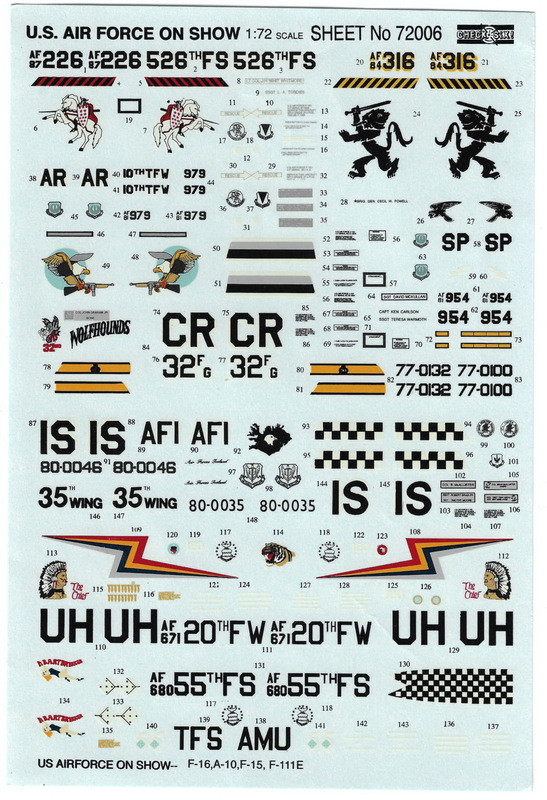 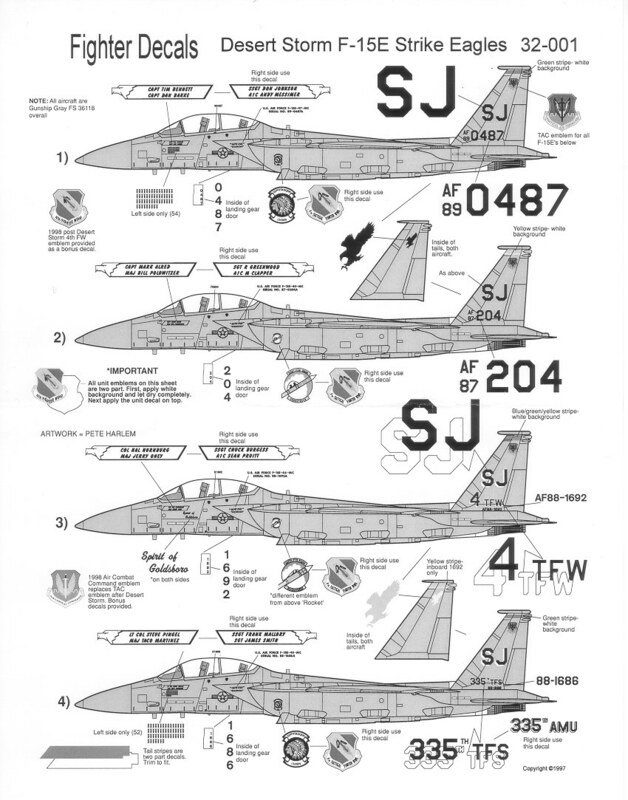 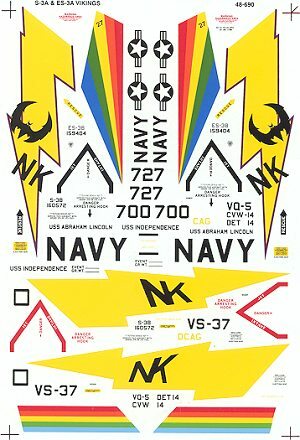 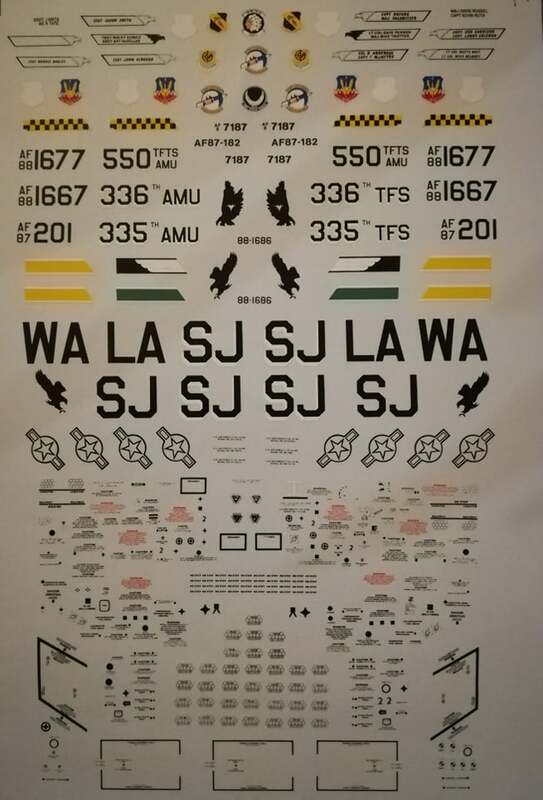 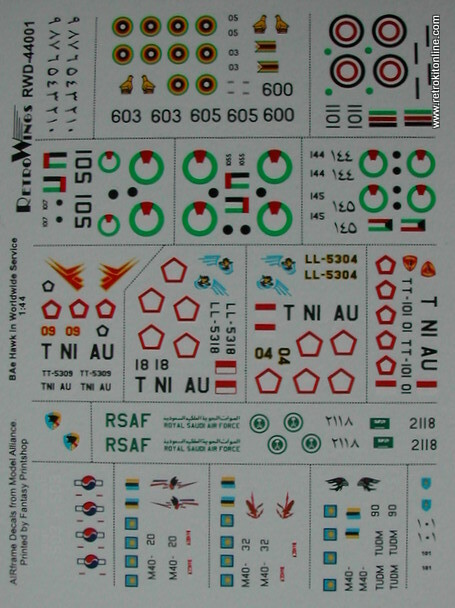 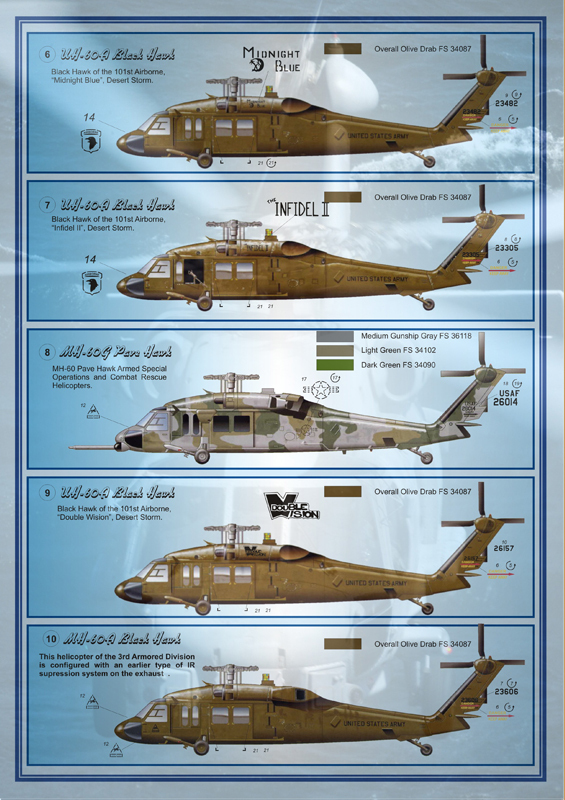 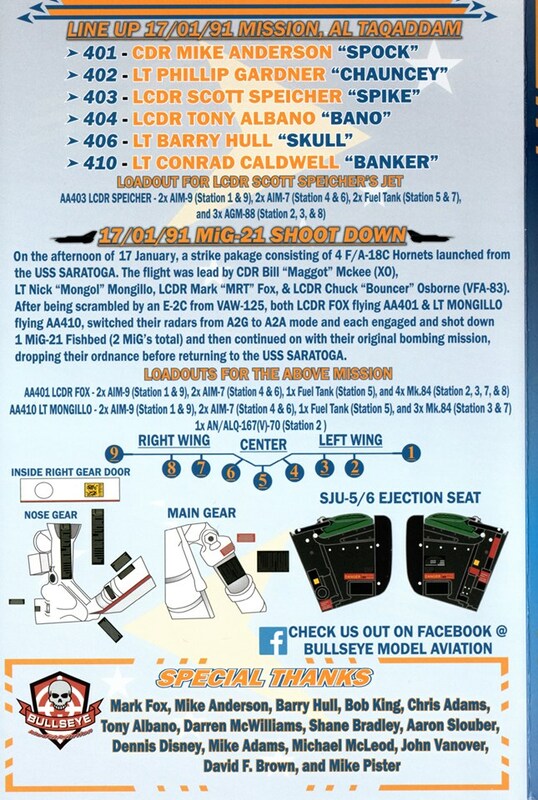 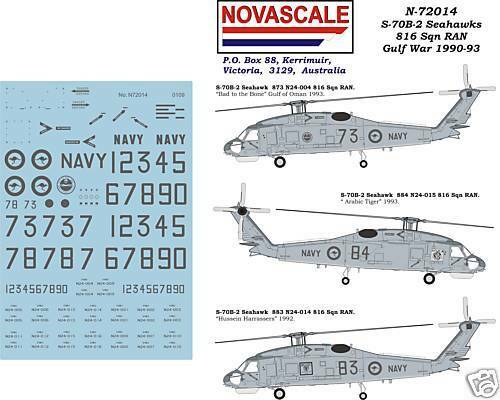 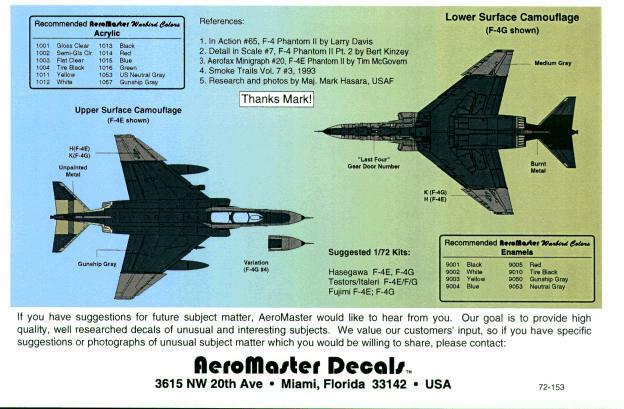 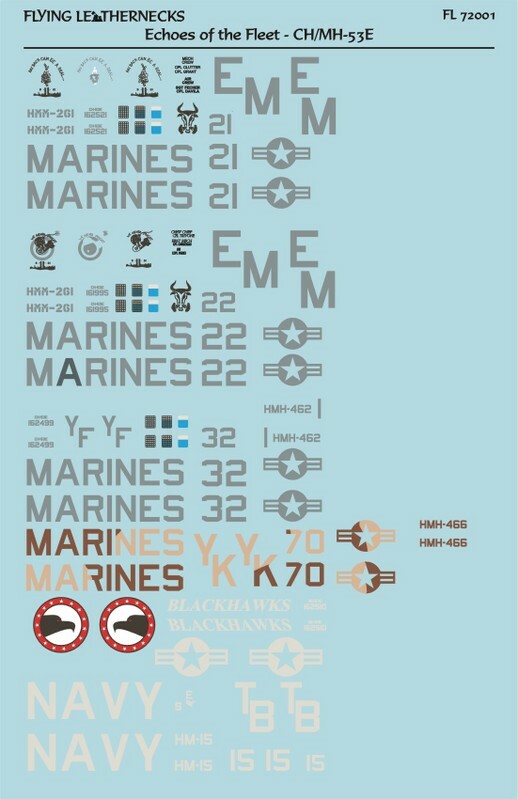 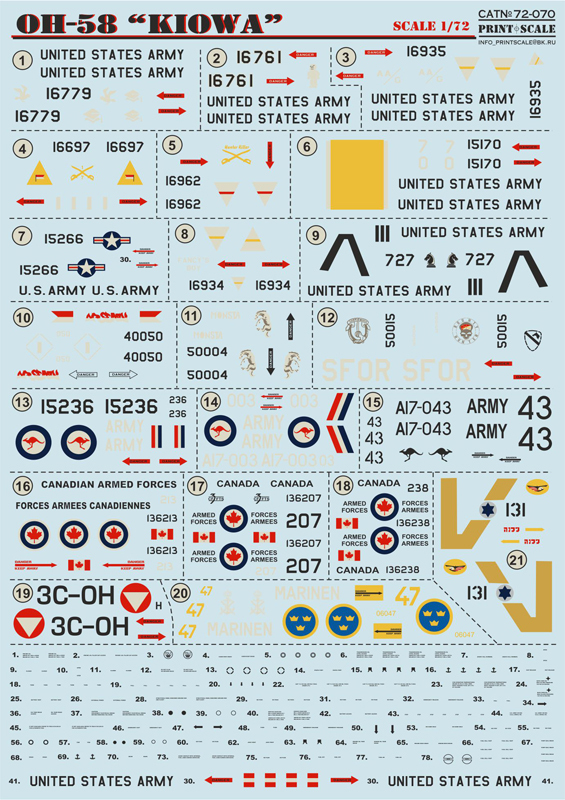 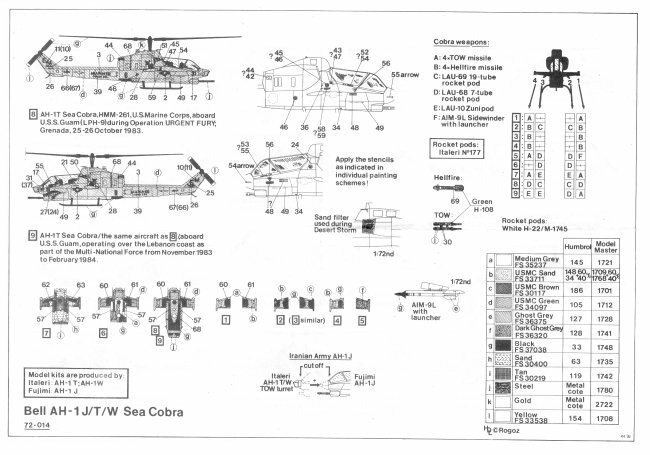 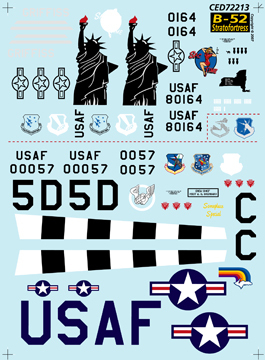 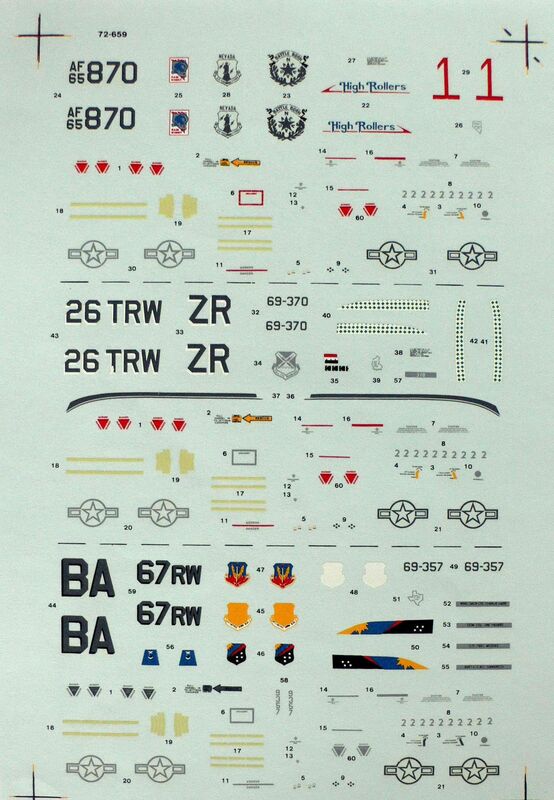 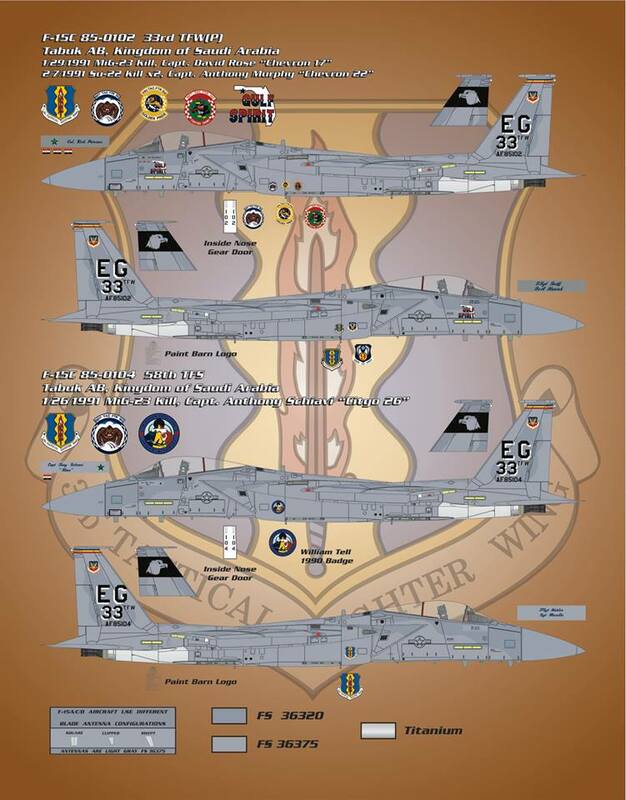 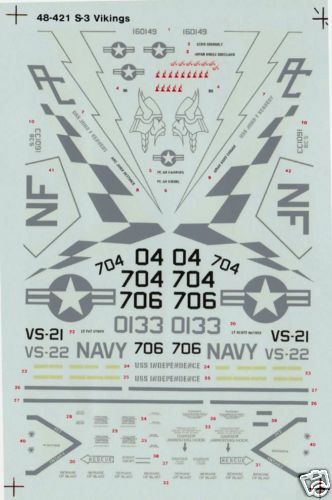 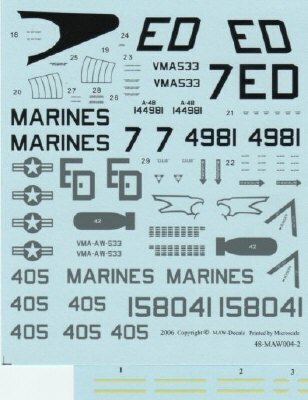 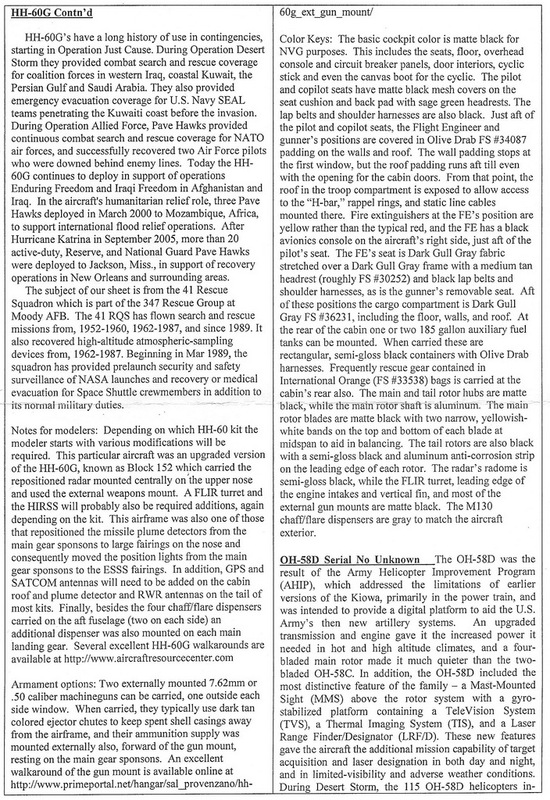 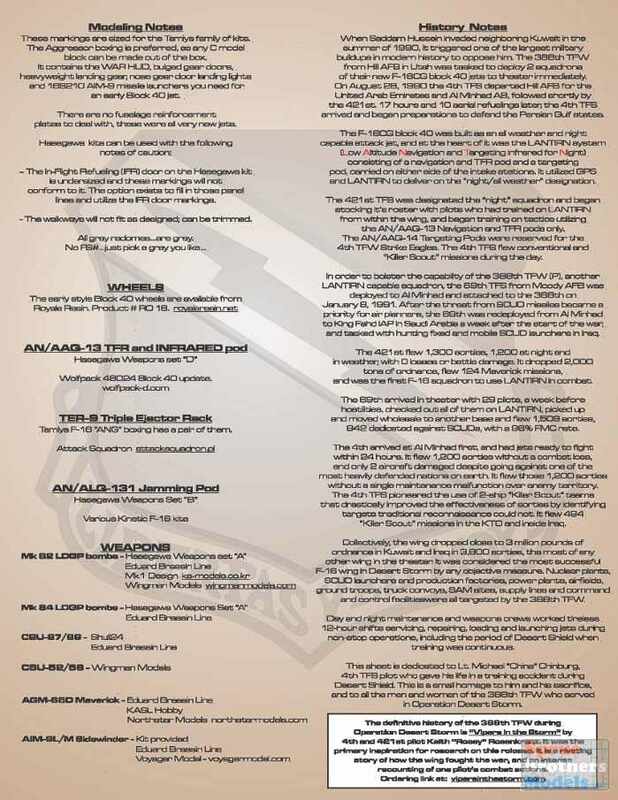 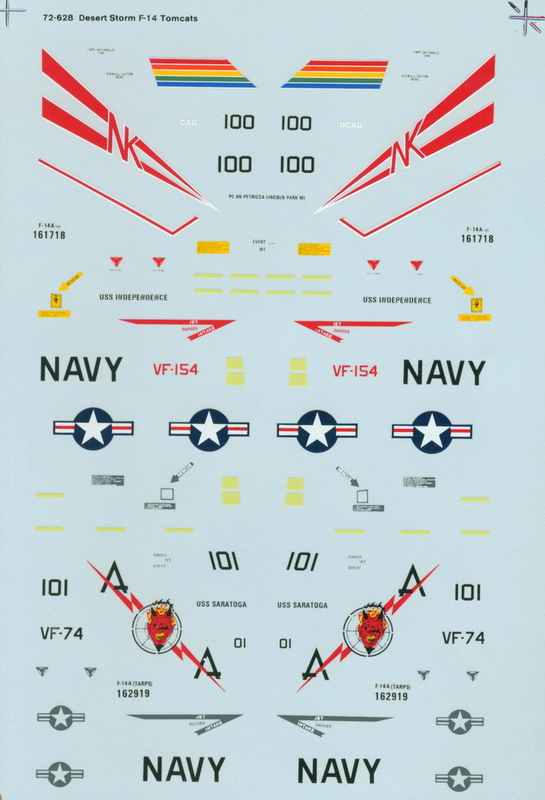 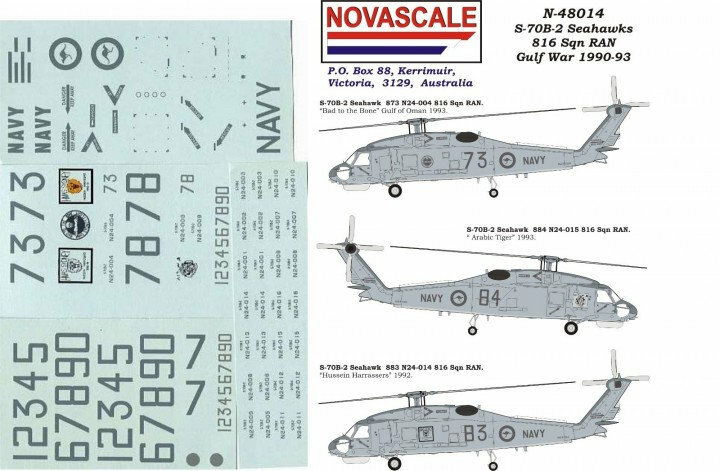 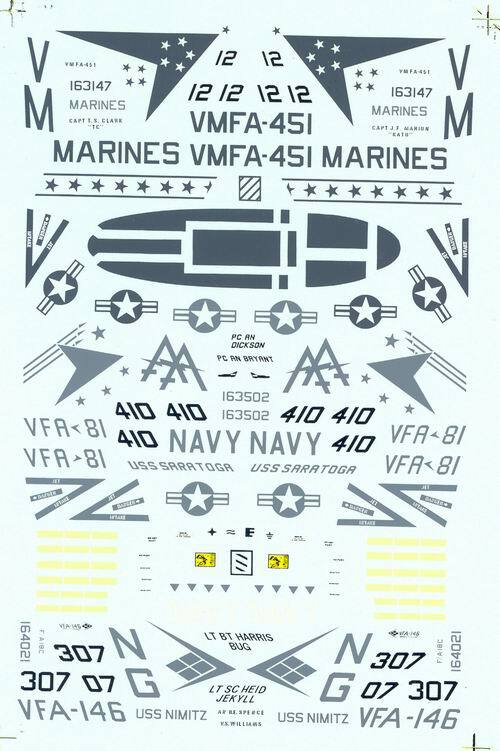 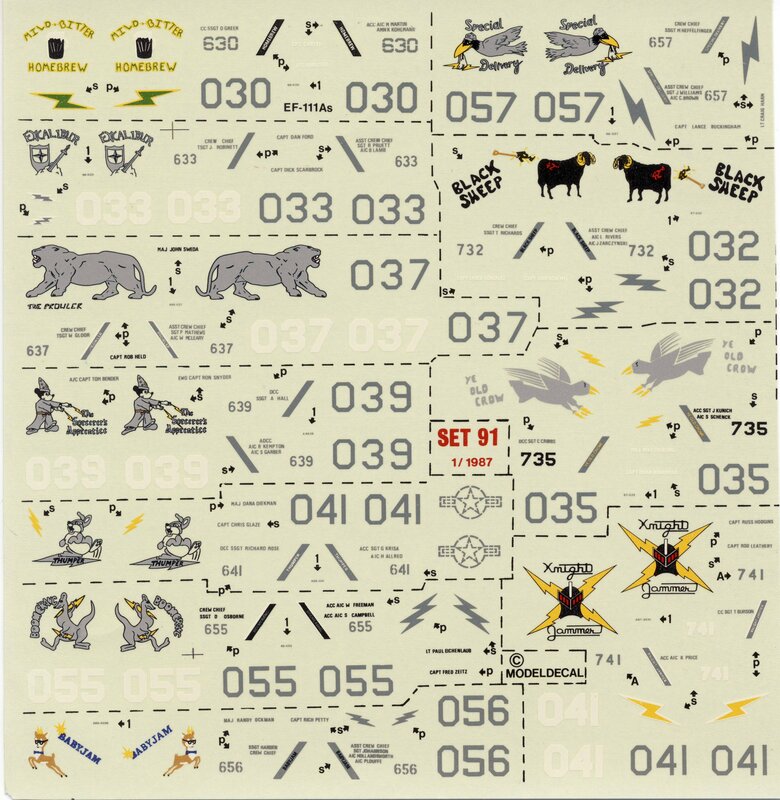 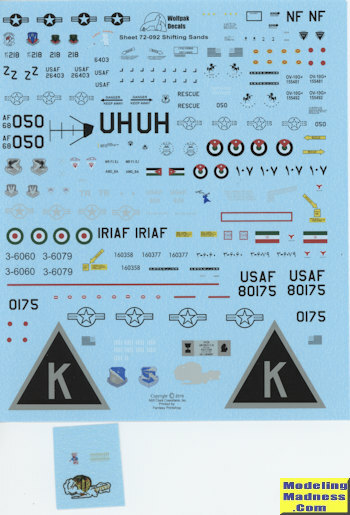 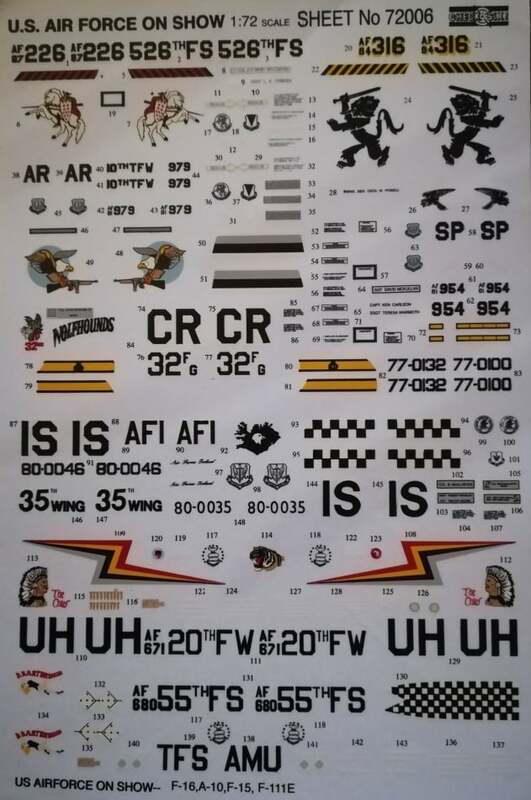 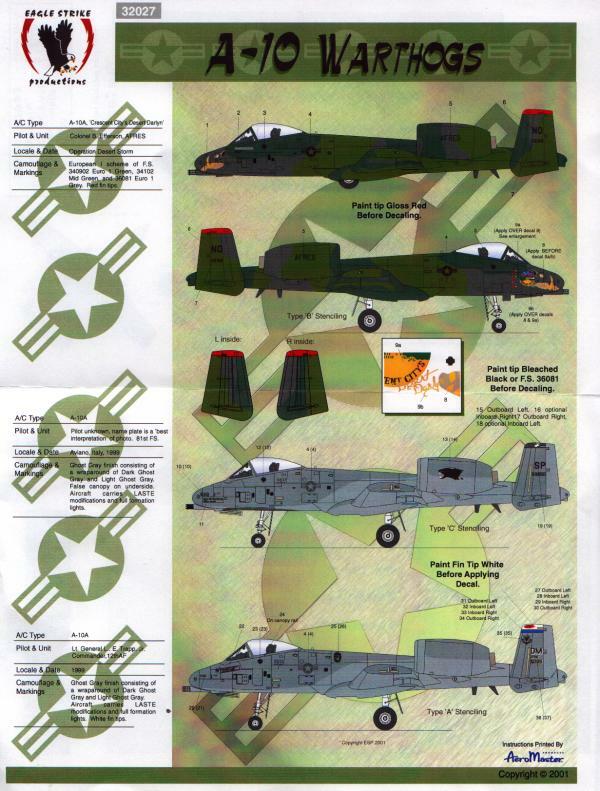 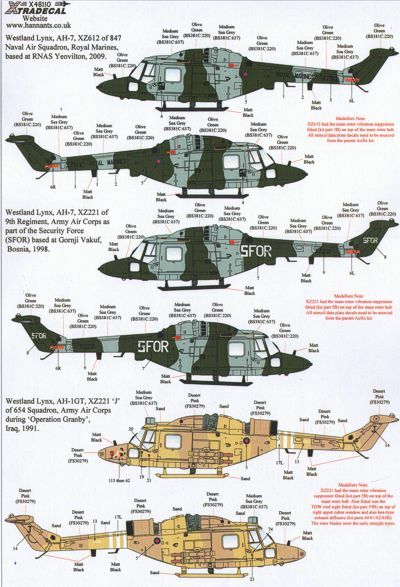 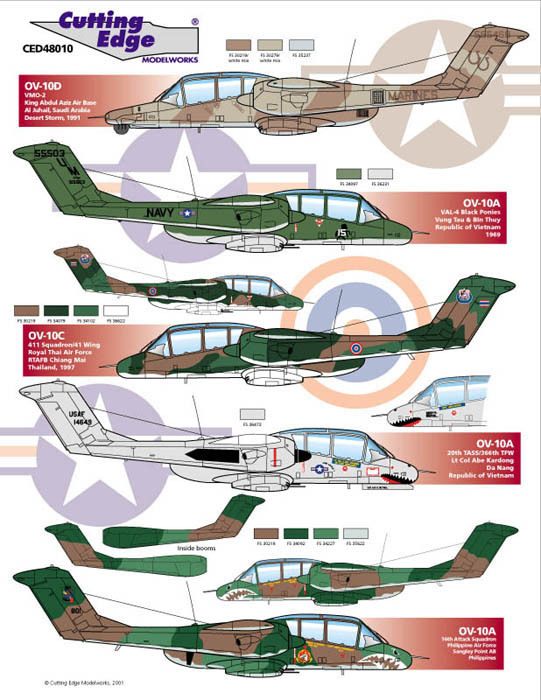 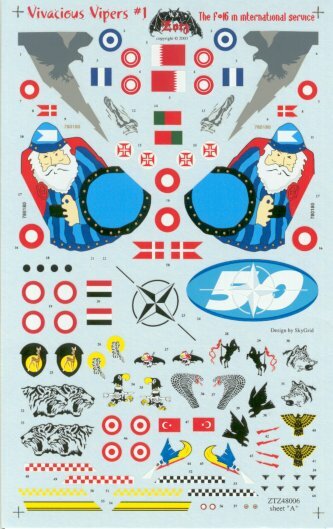 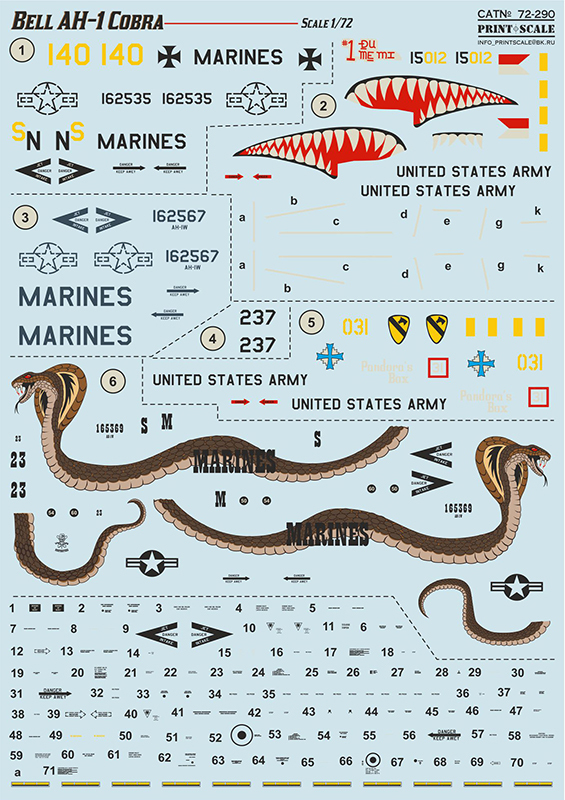 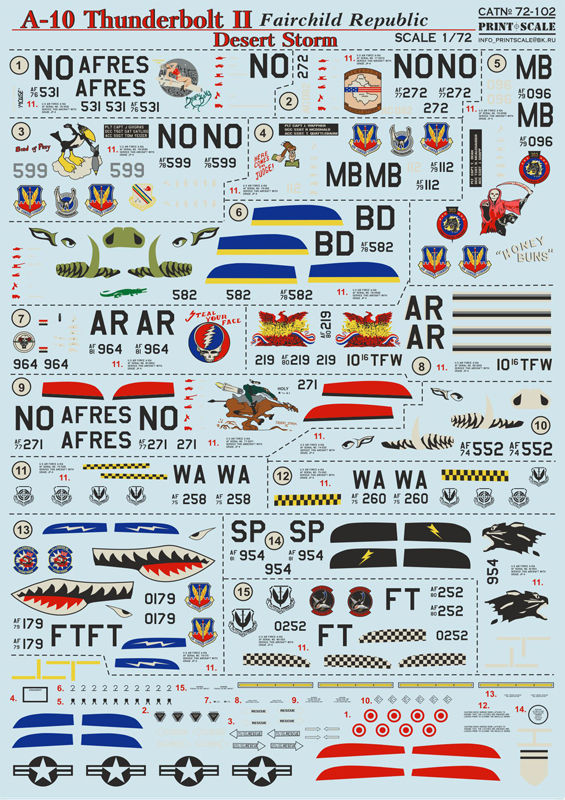 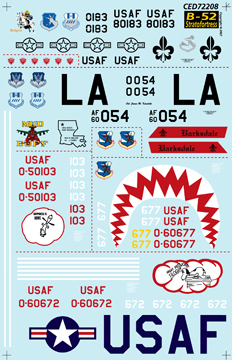 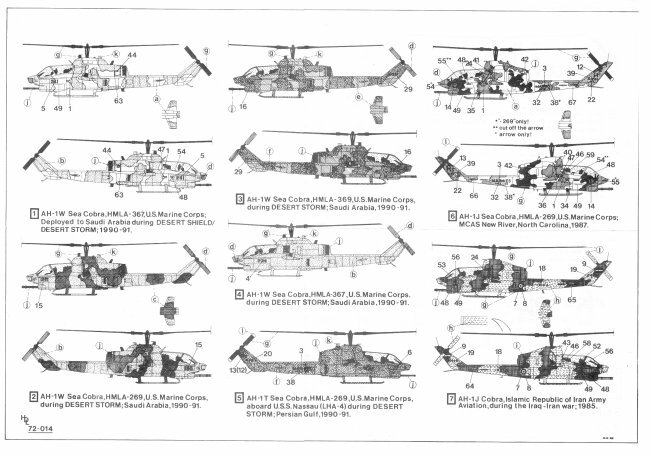 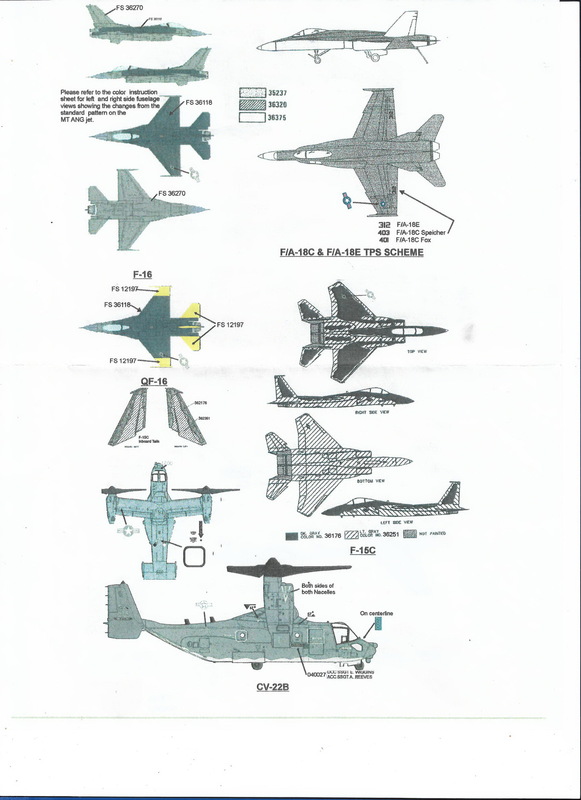 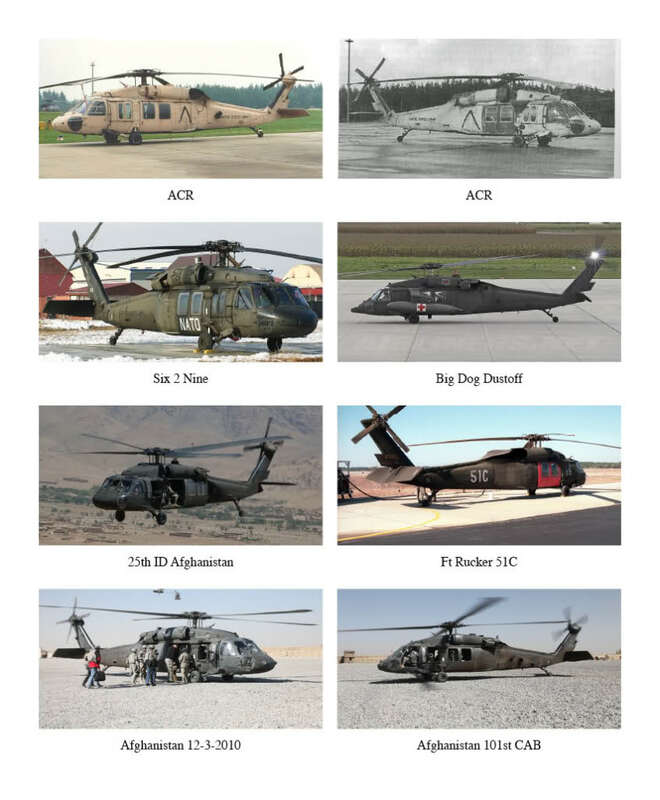 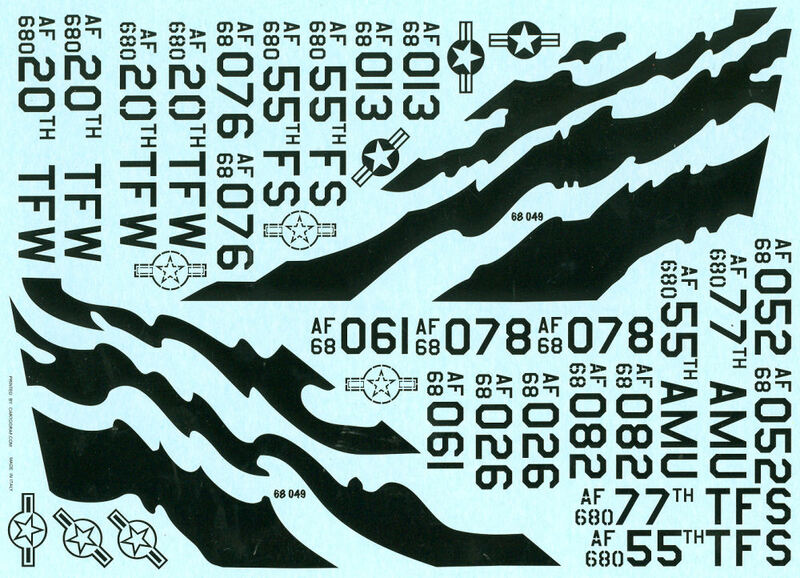 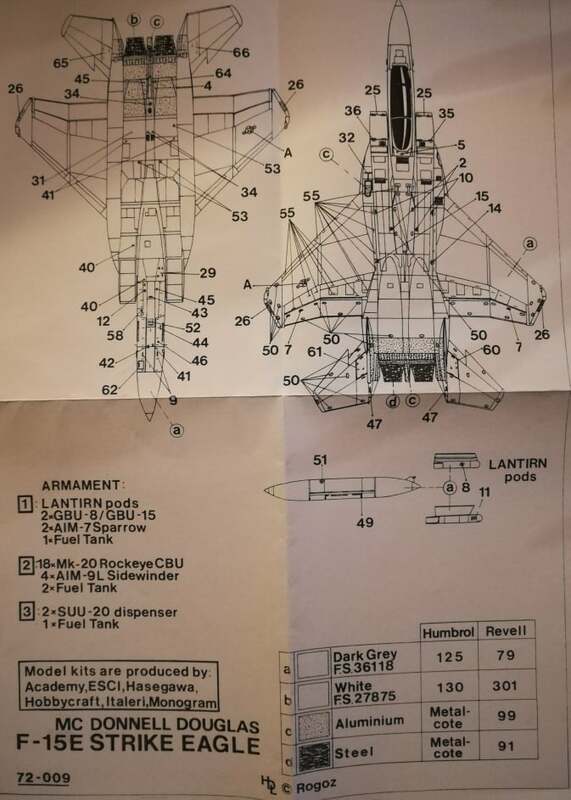 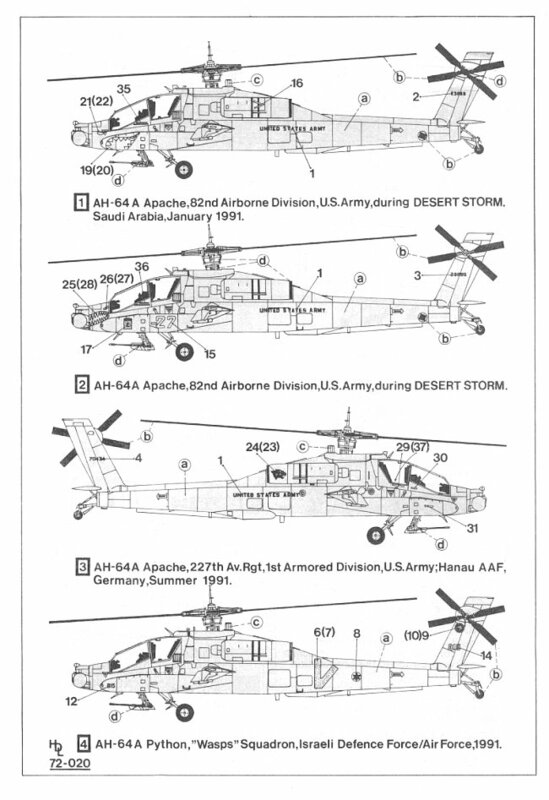 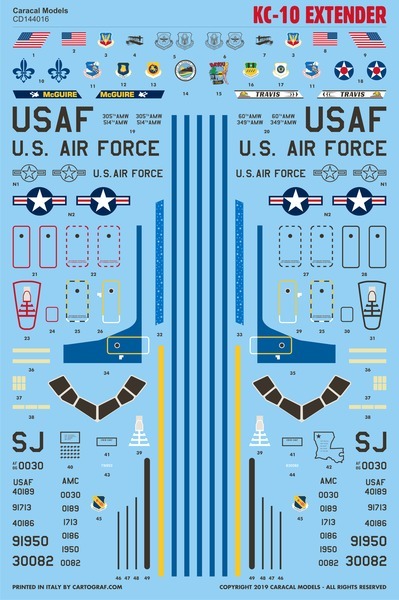 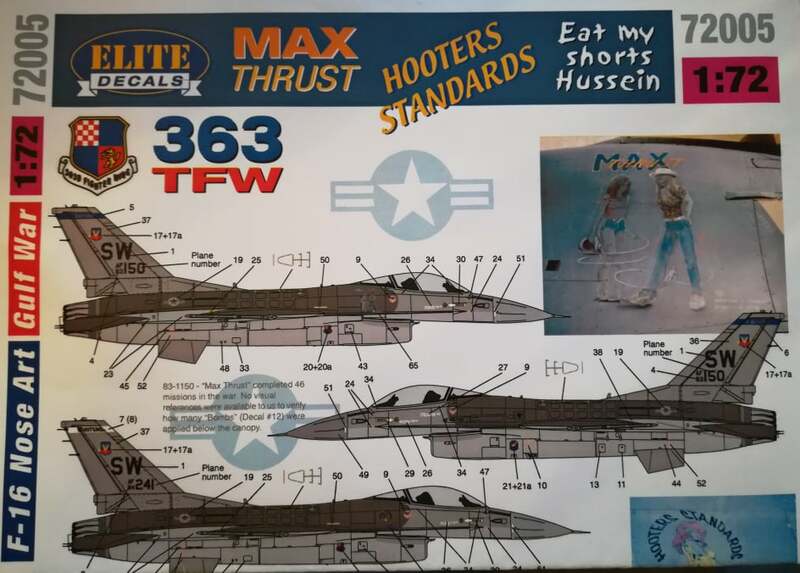 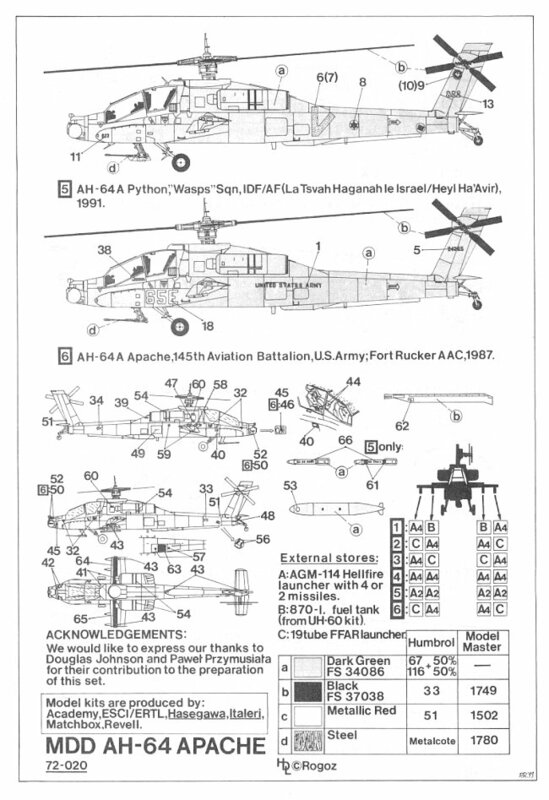 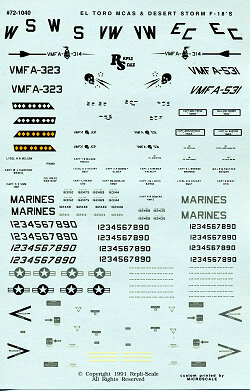 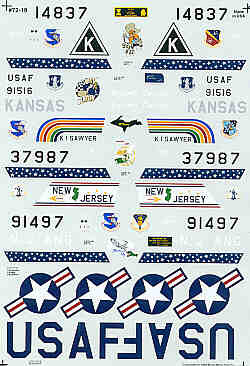 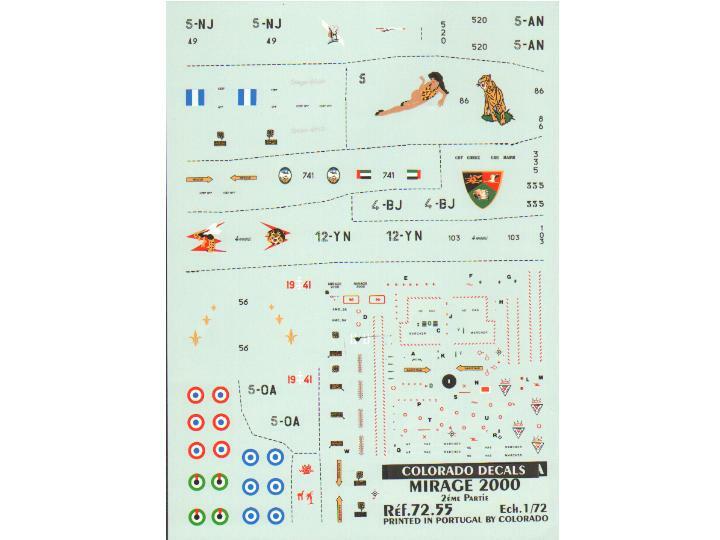 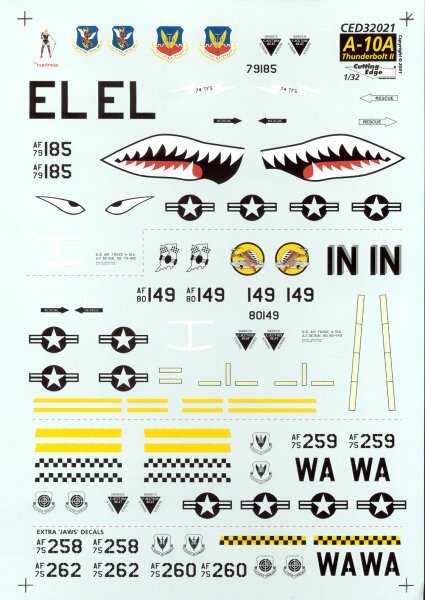 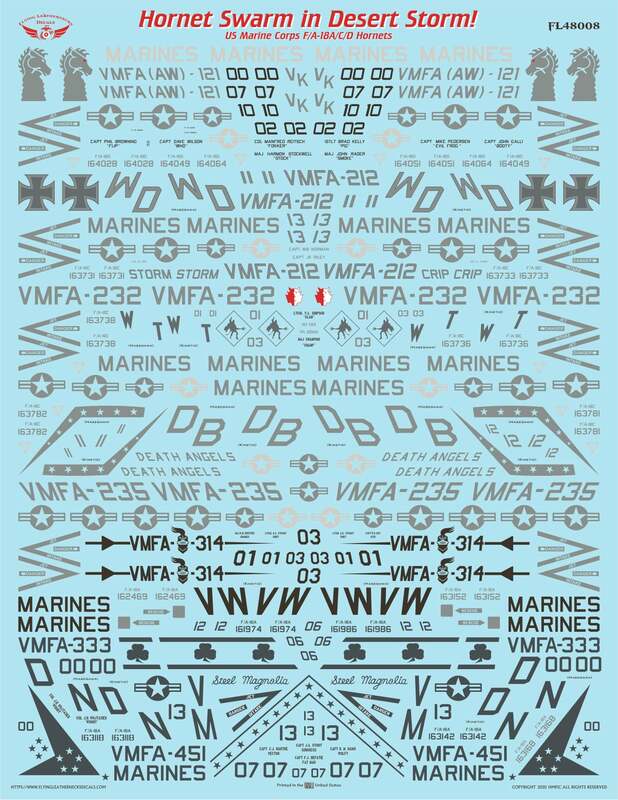 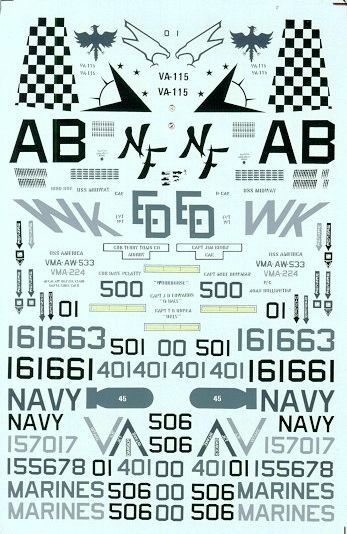 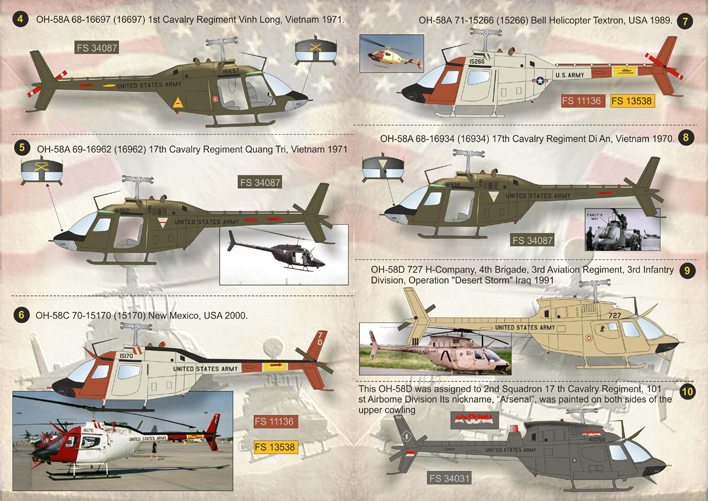 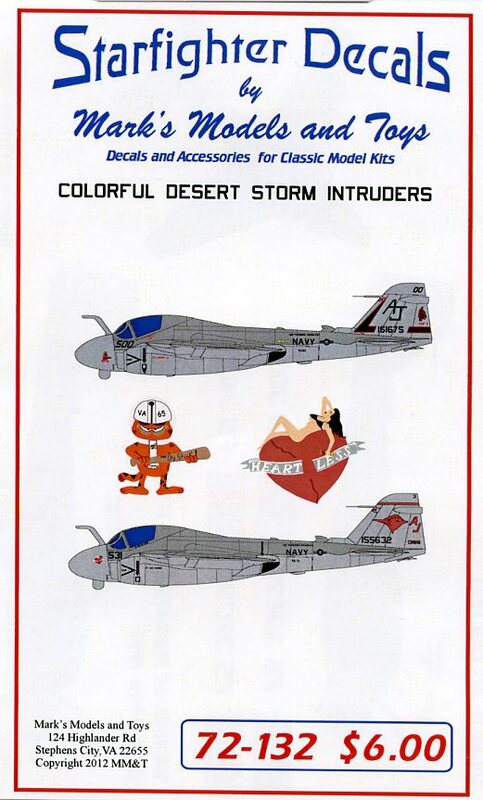 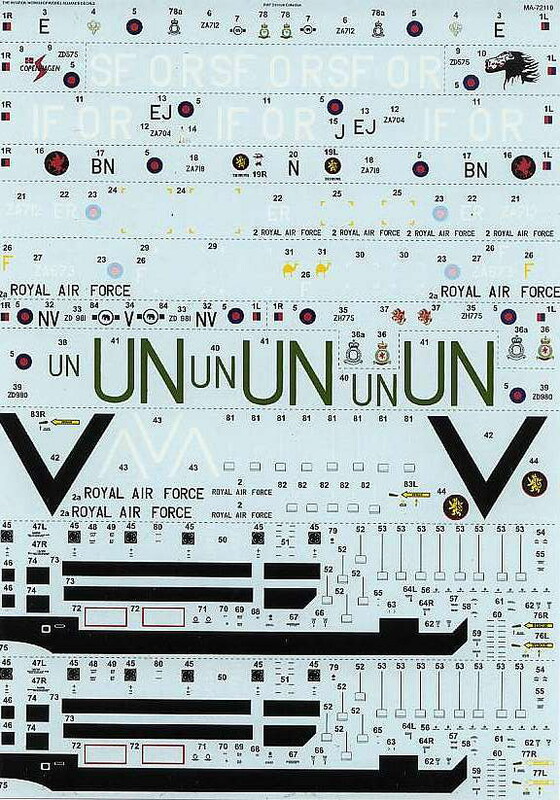 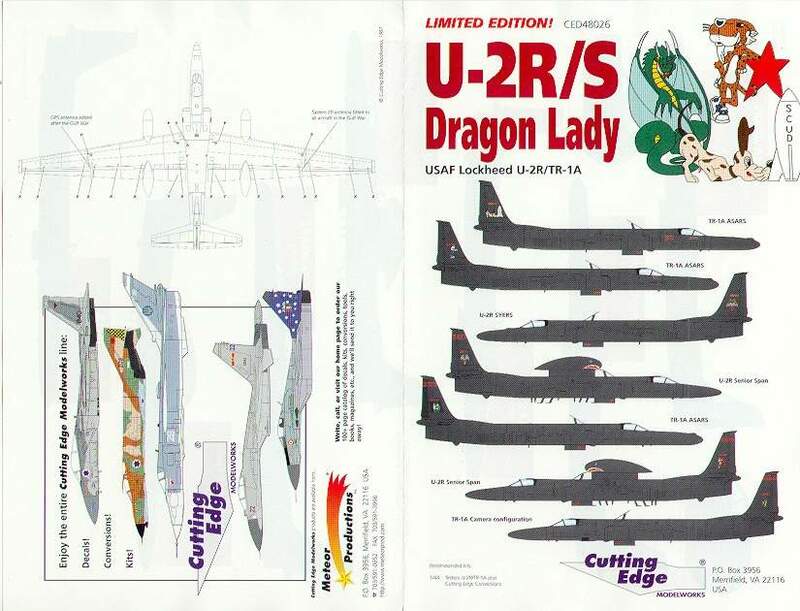 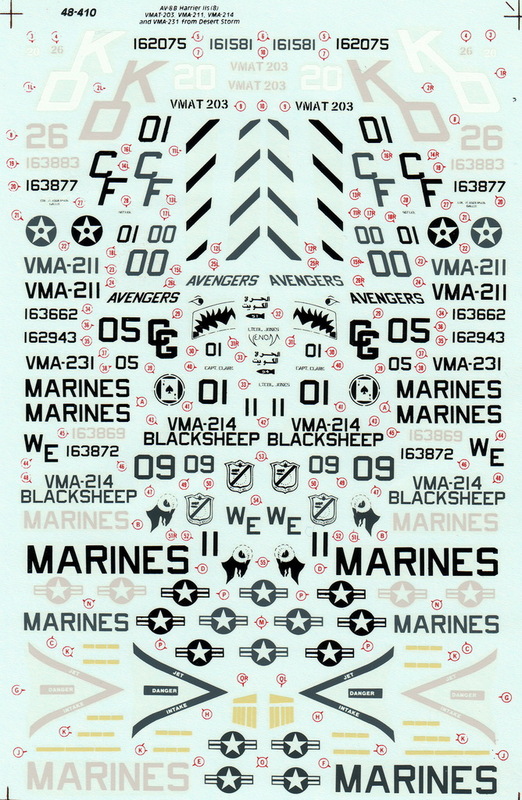 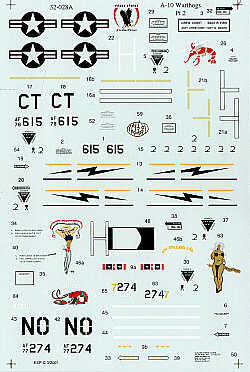 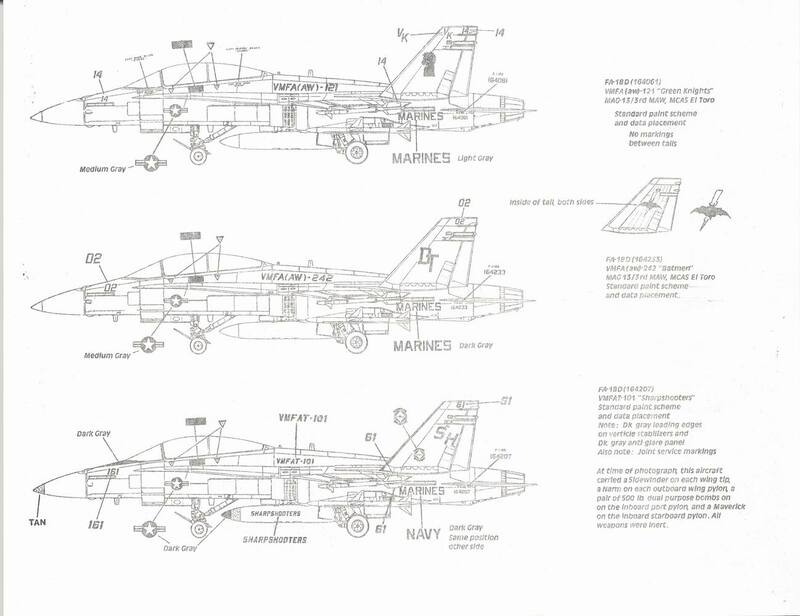 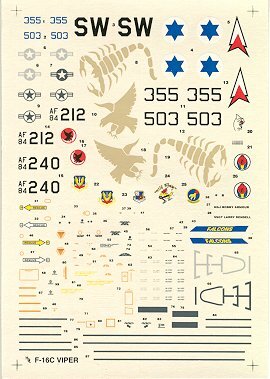 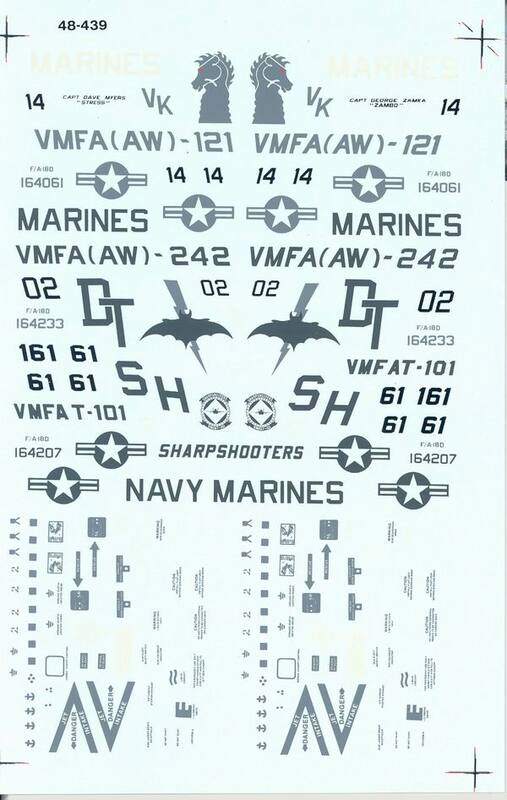 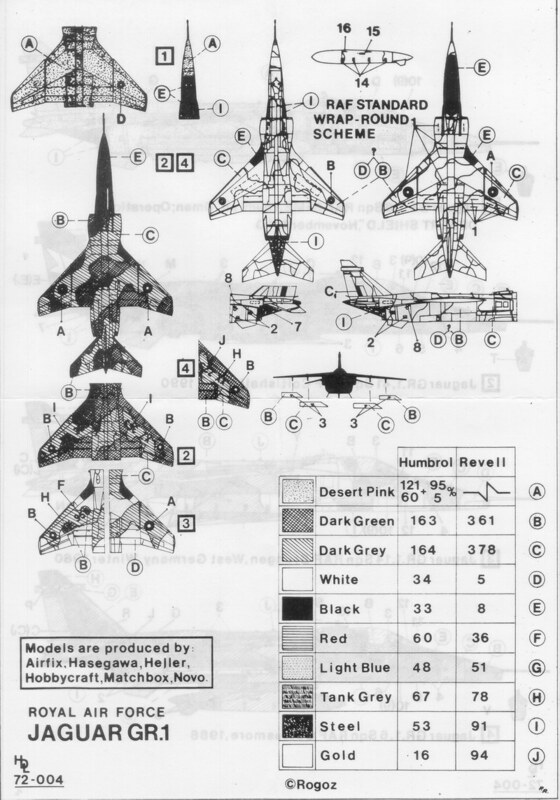 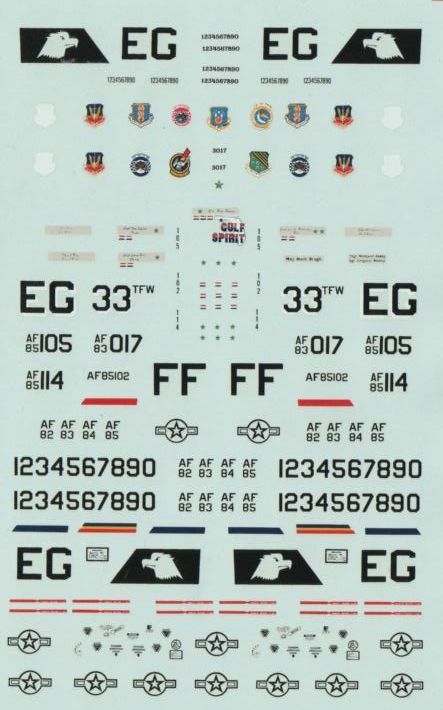 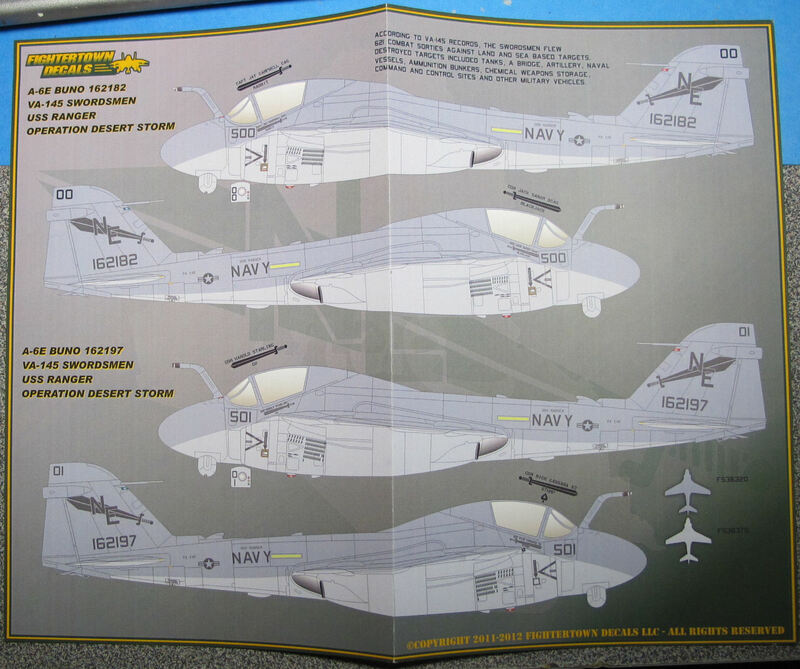 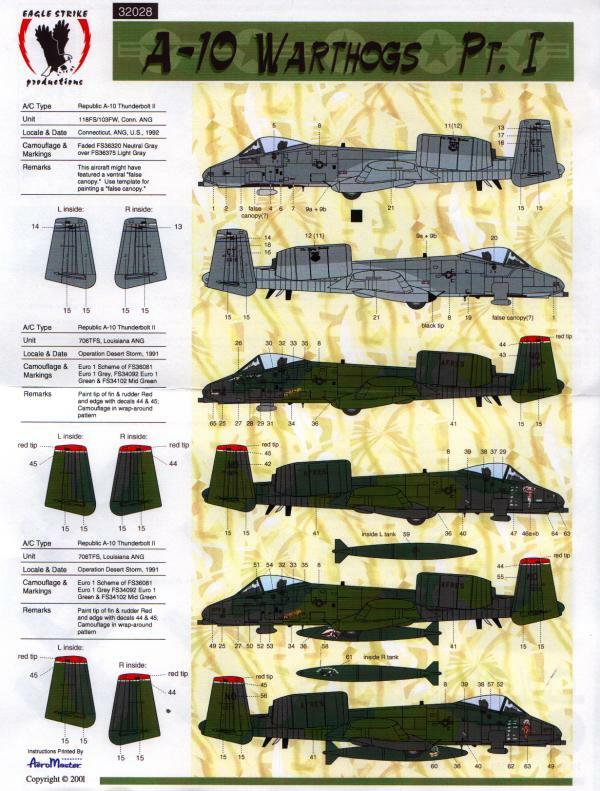 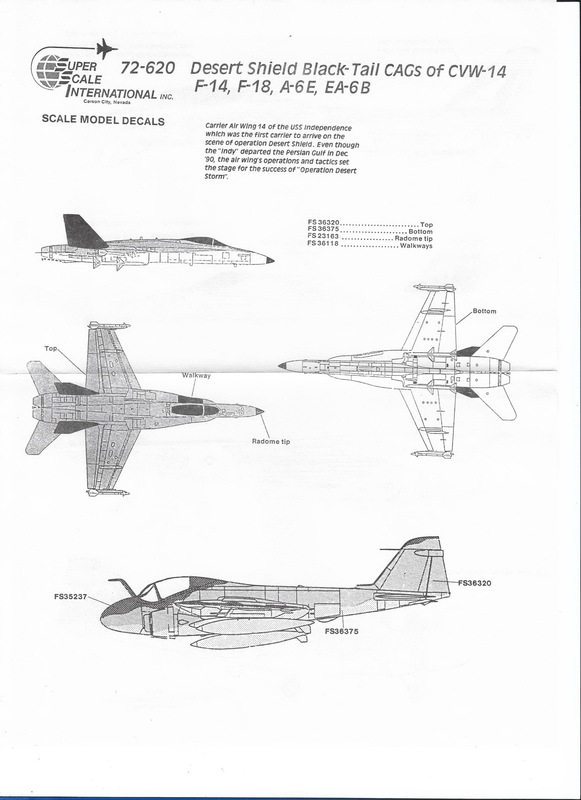 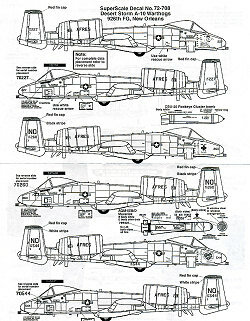 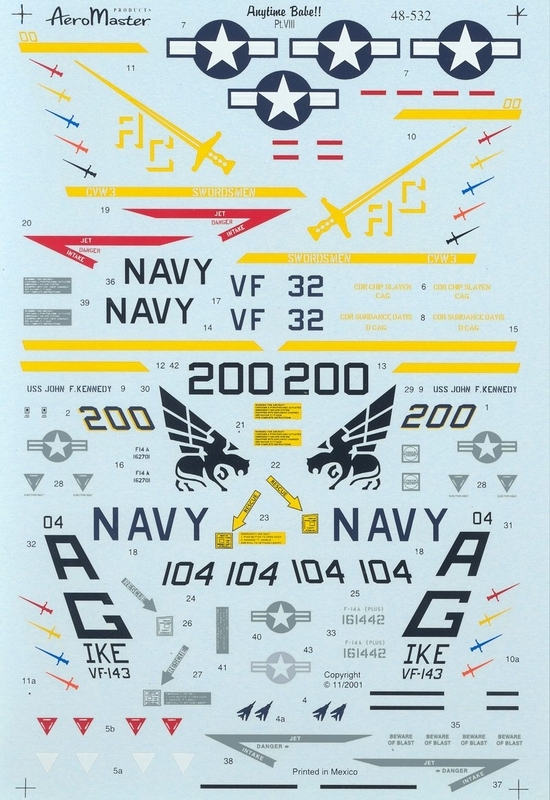 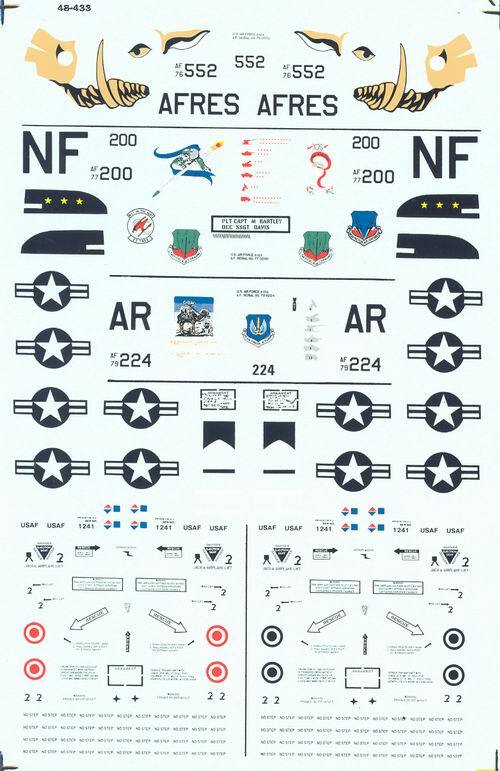 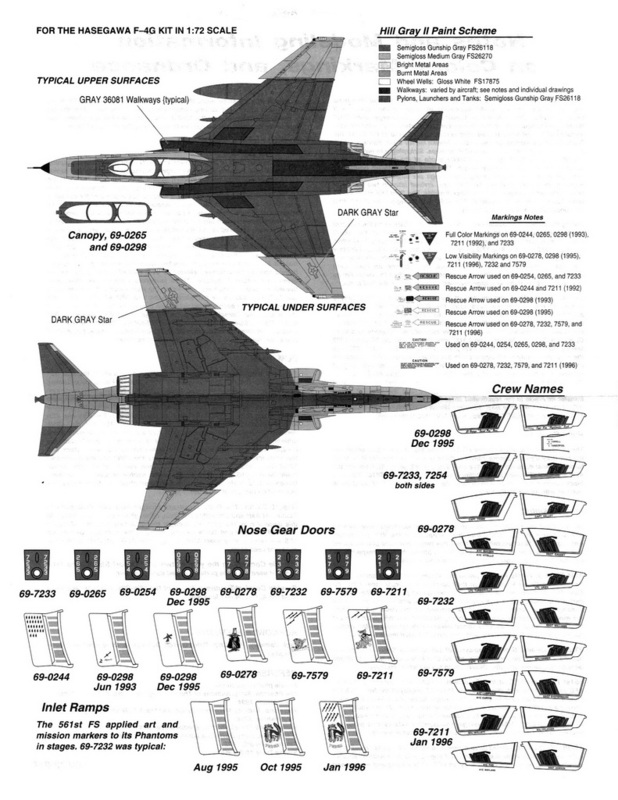 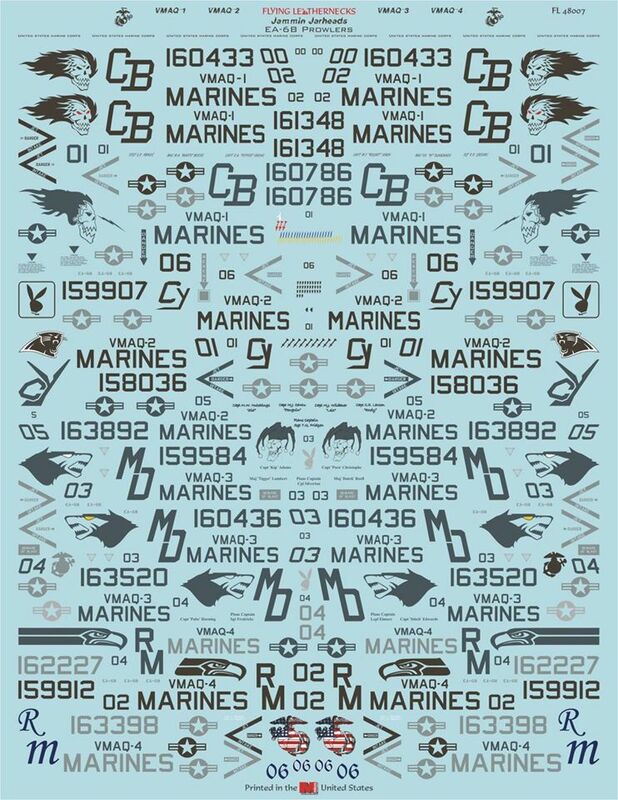 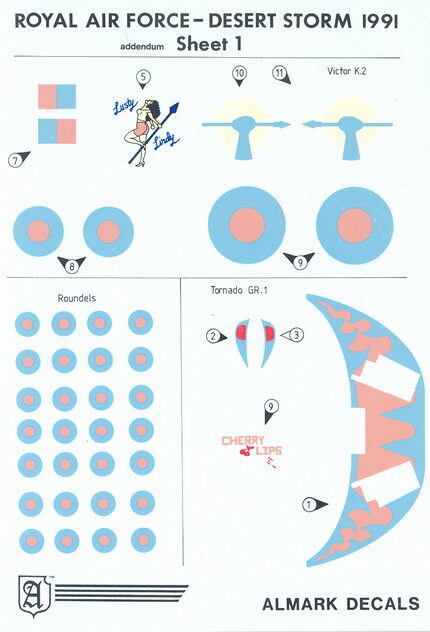 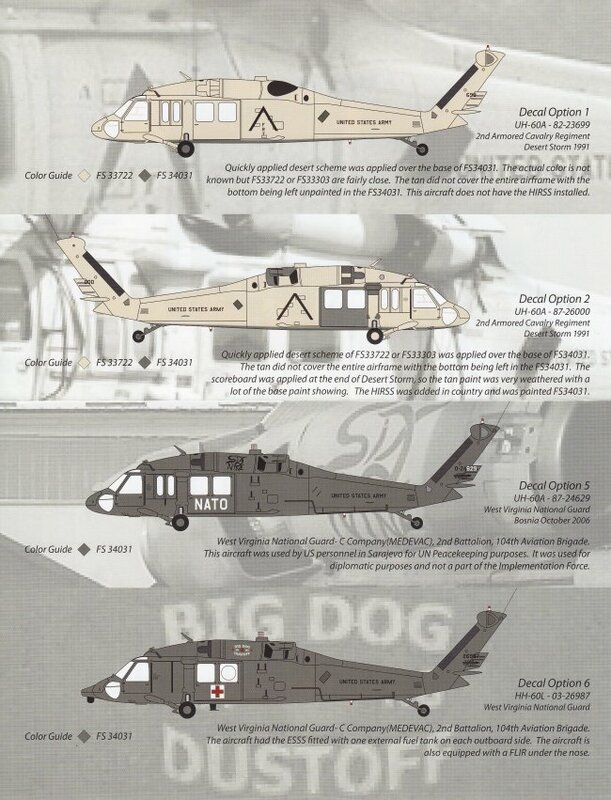 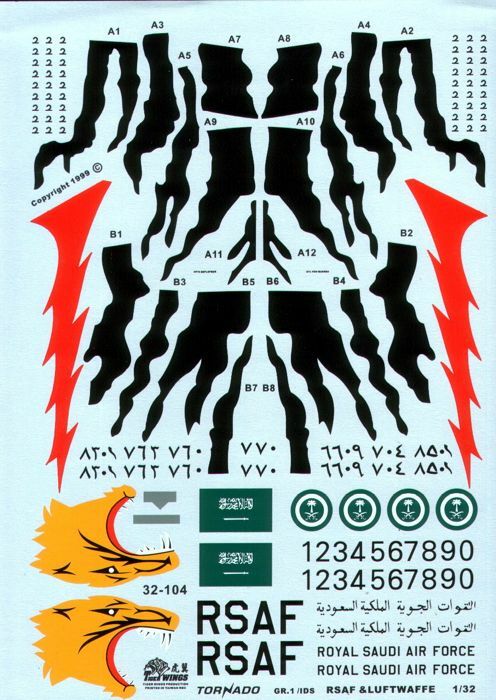 Hawkeye Decals/Aviation Workshop/Model Alliance - USA-1 UH-60A Decal sheet for US Army UH-60A Blackhawks shown on pages 72 & 74 of the Squadron / Signal Blackhawk Walkaround #19. 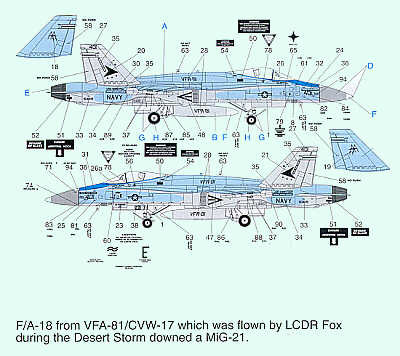 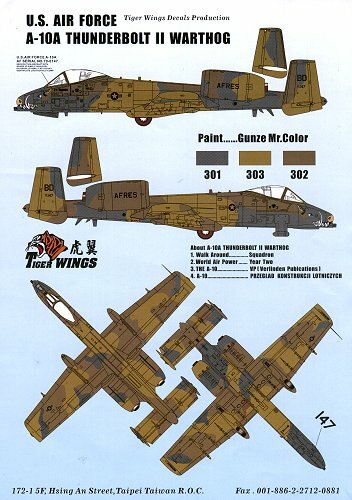 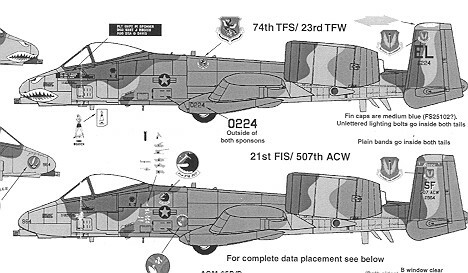 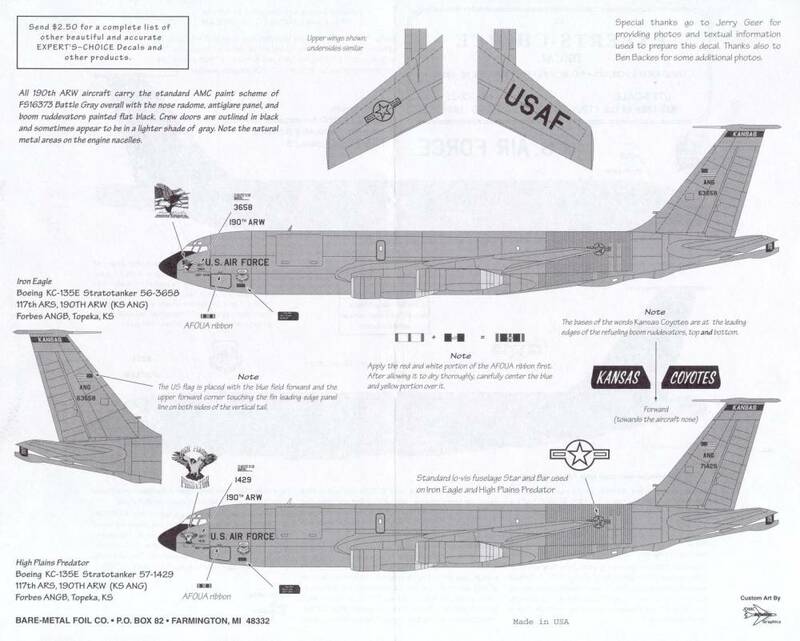 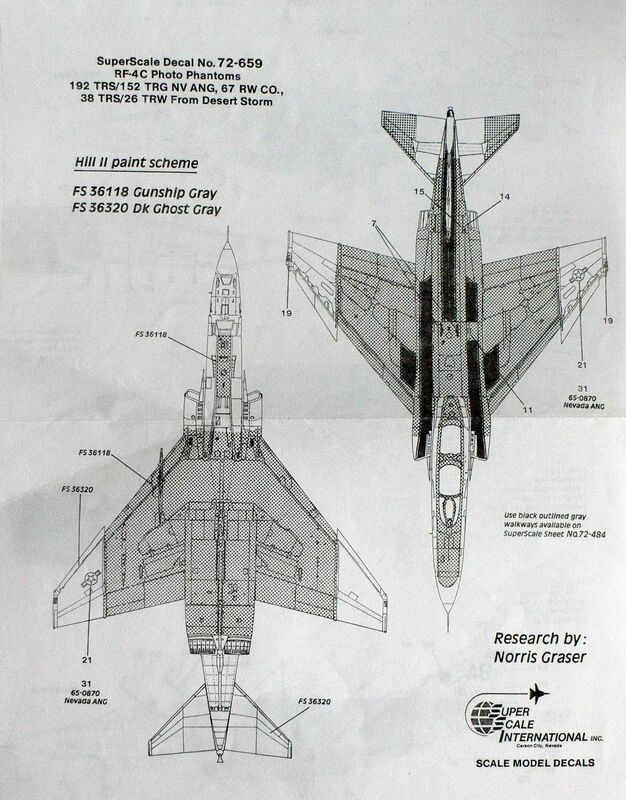 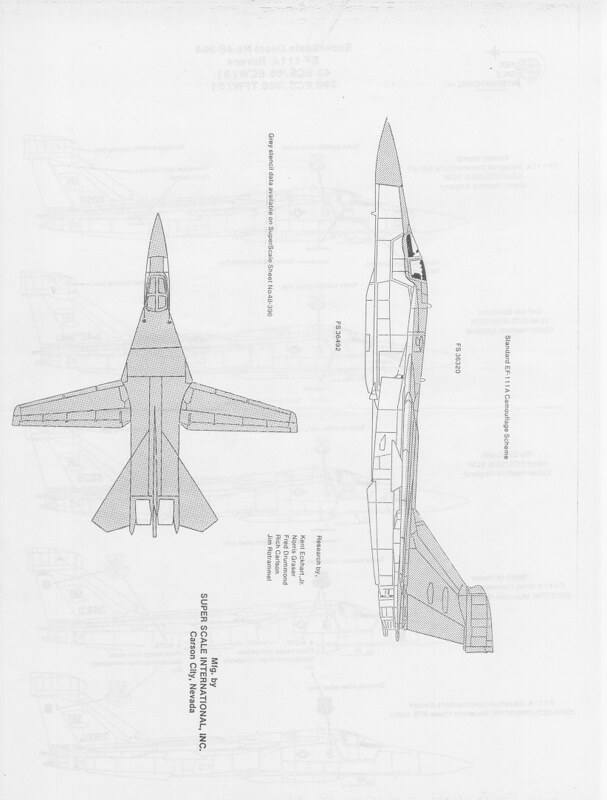 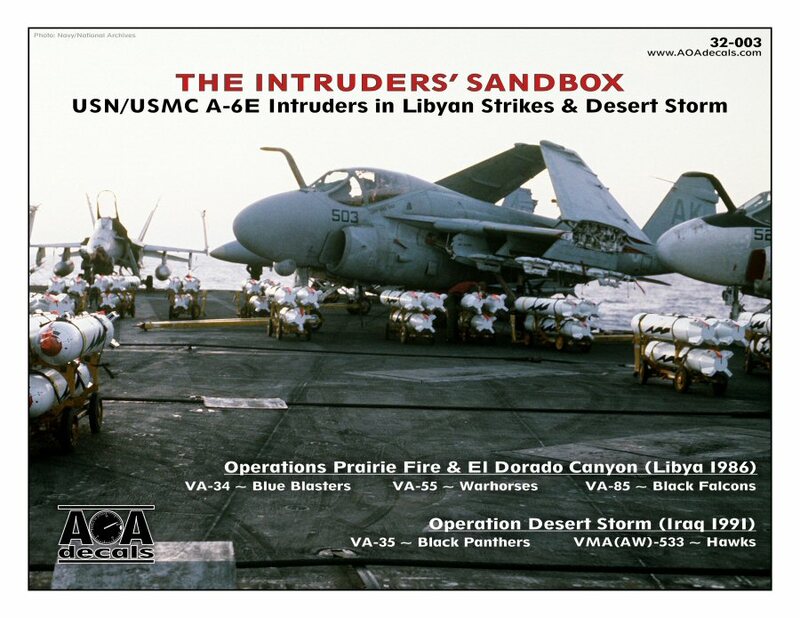 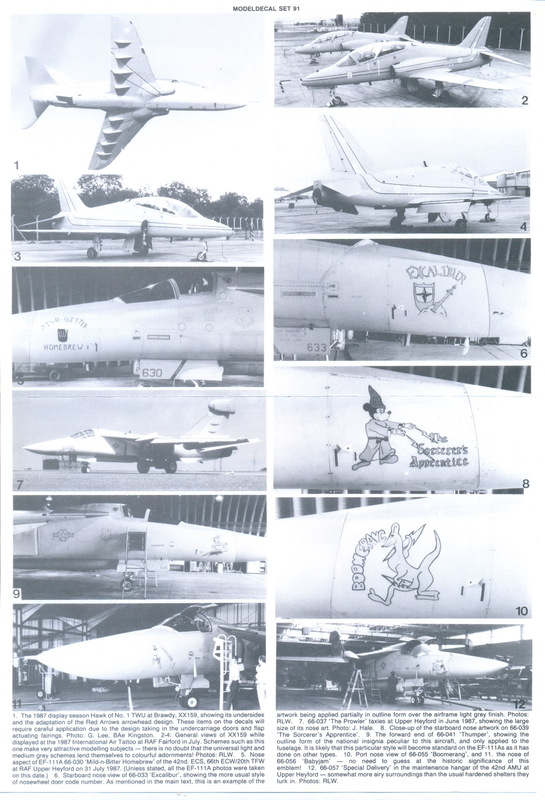 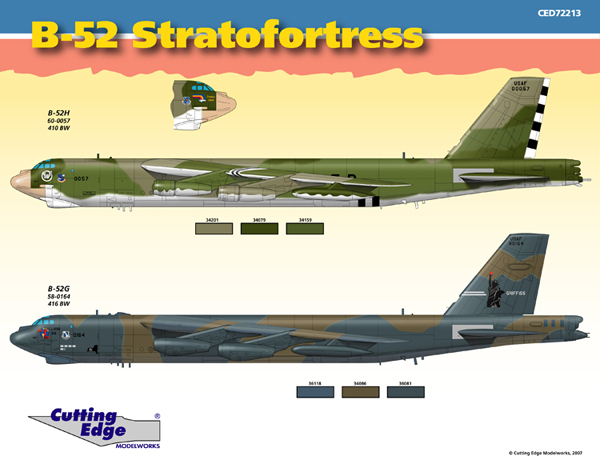 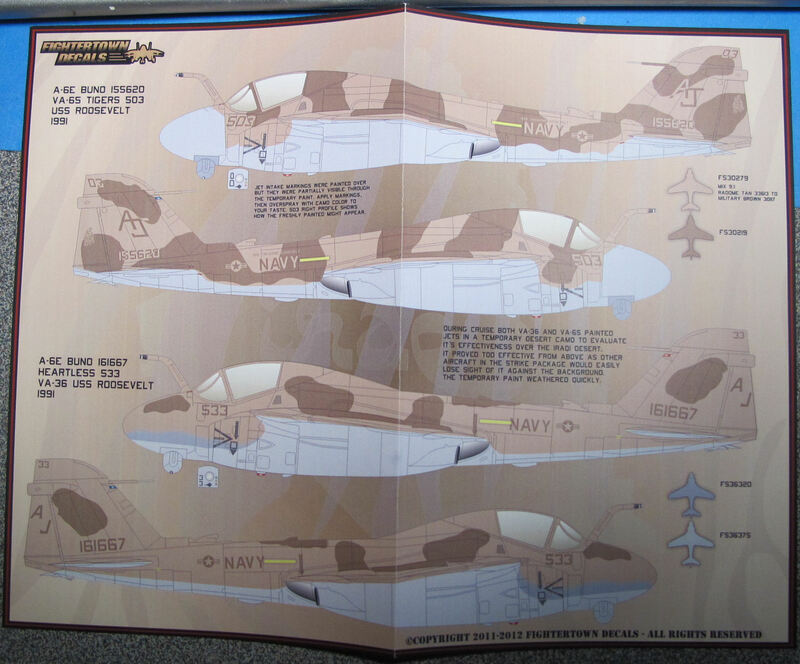 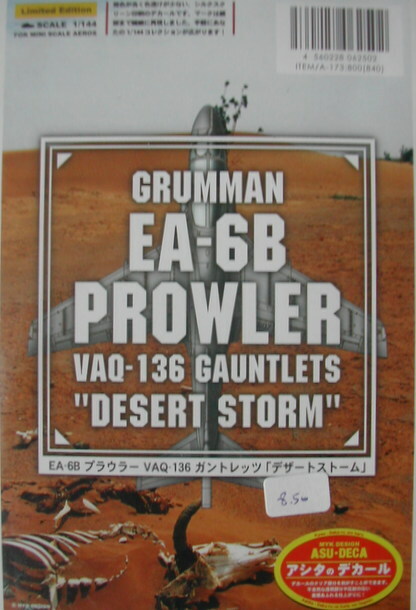 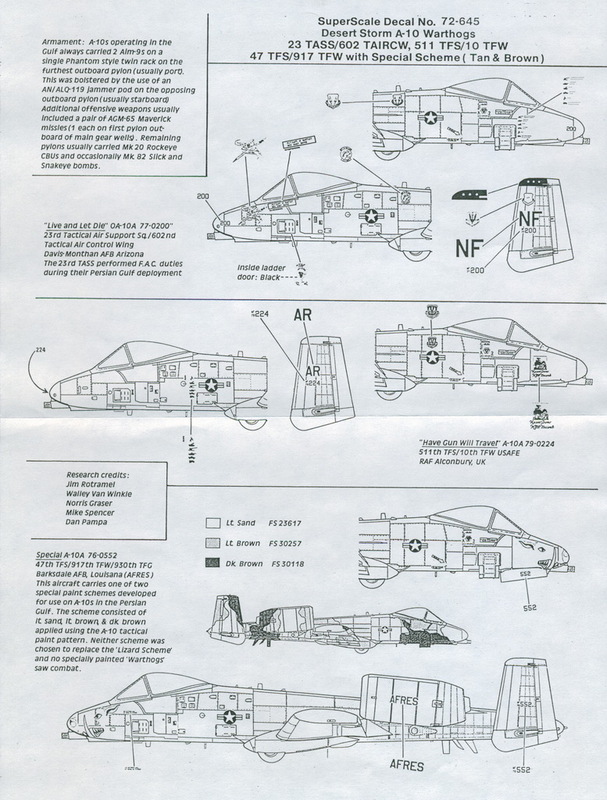 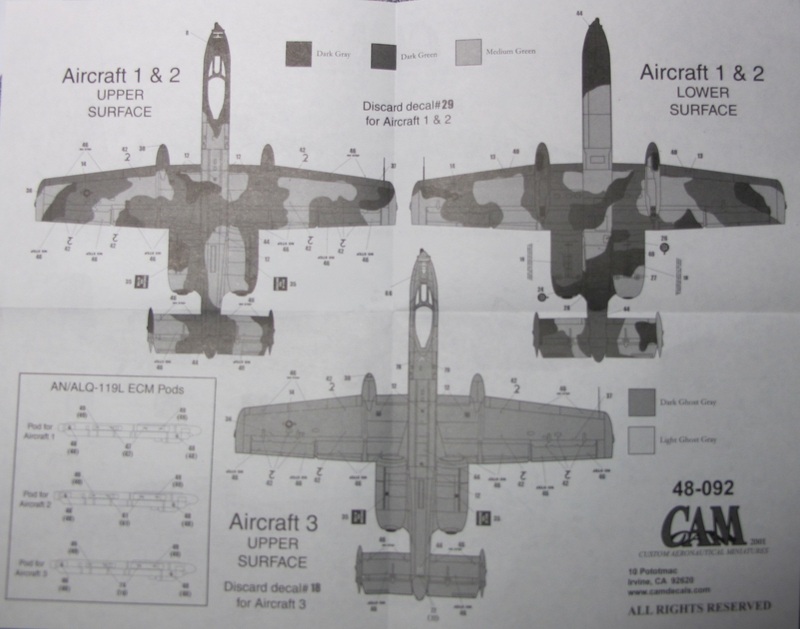 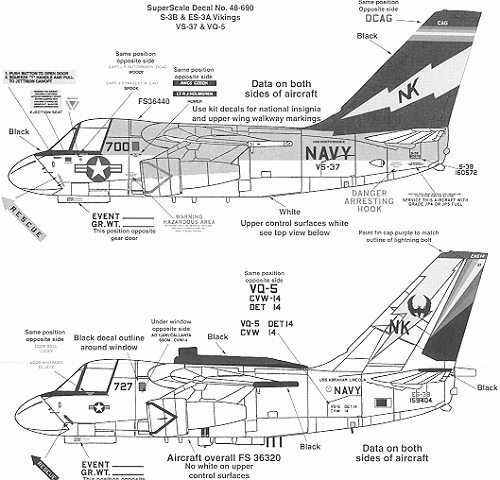 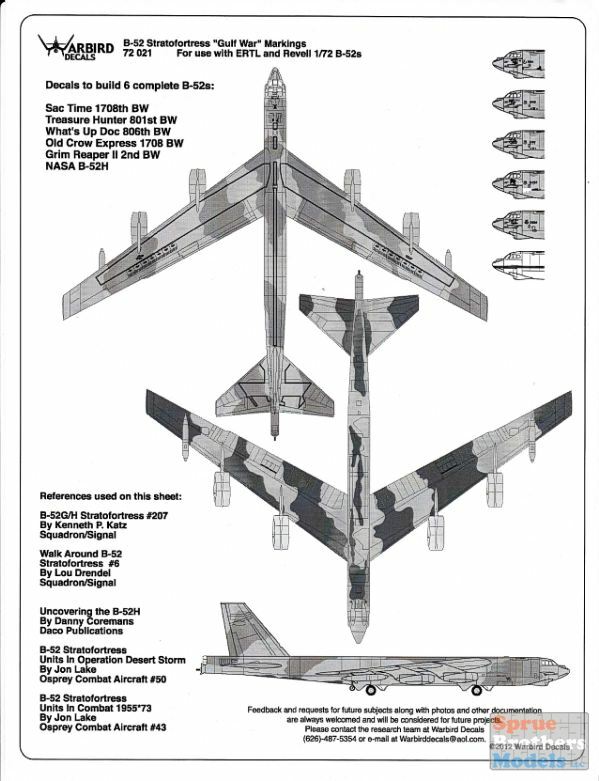 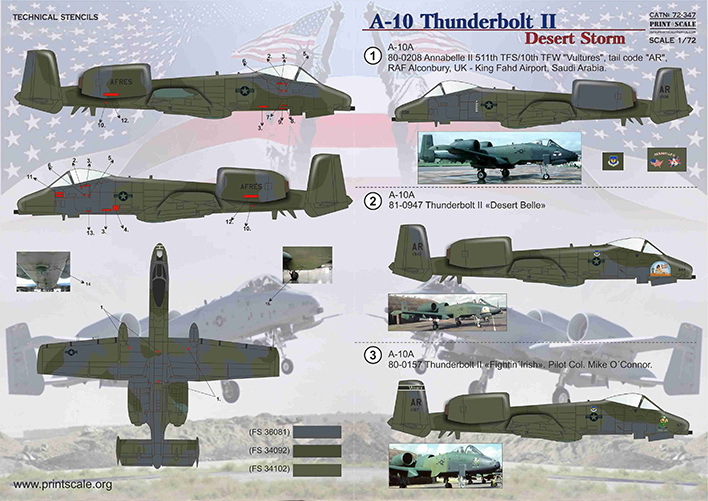 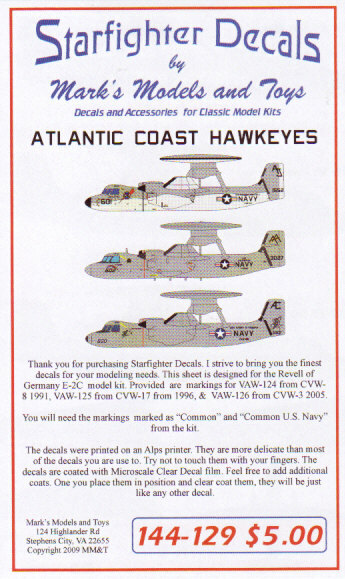 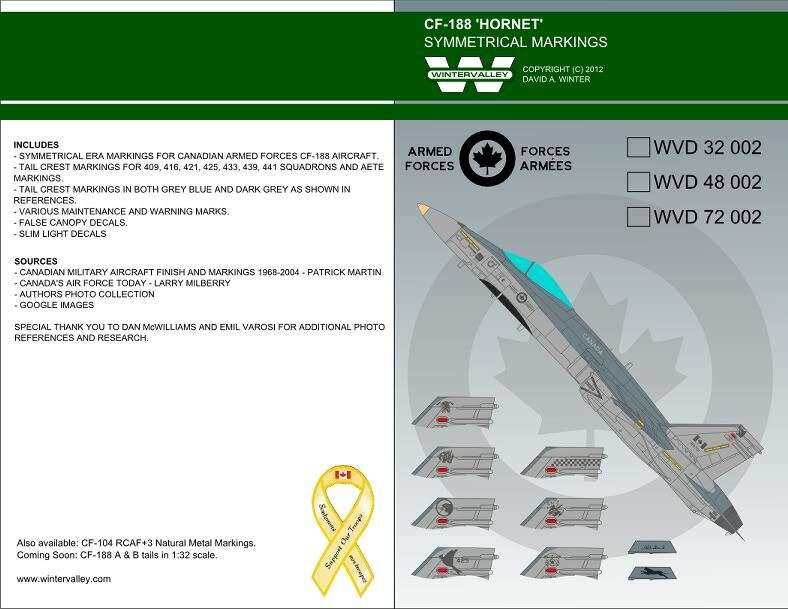 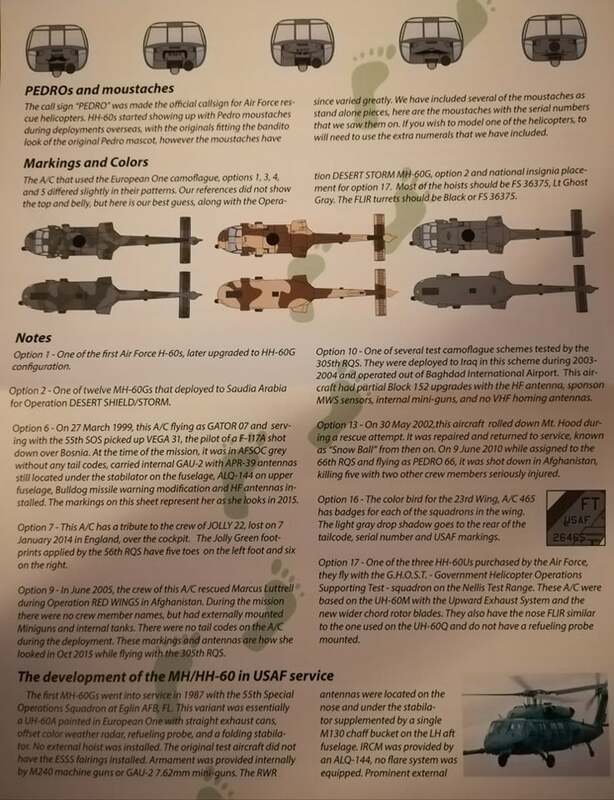 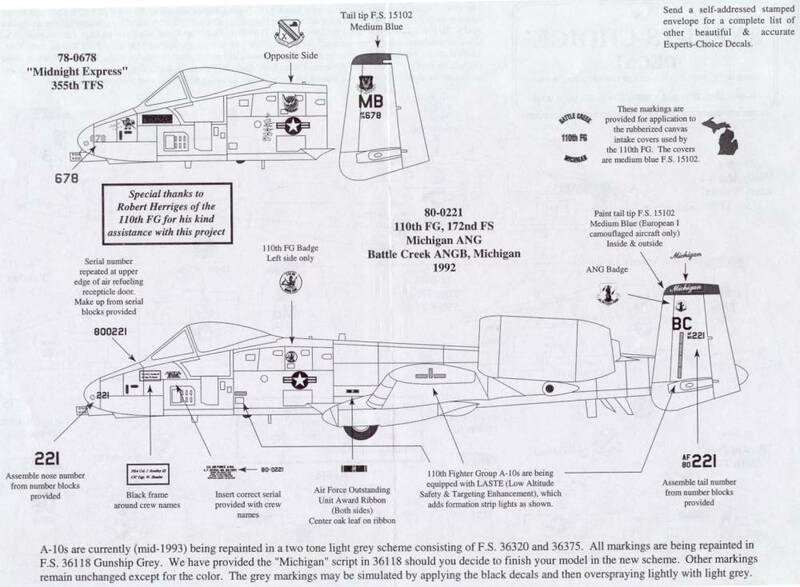 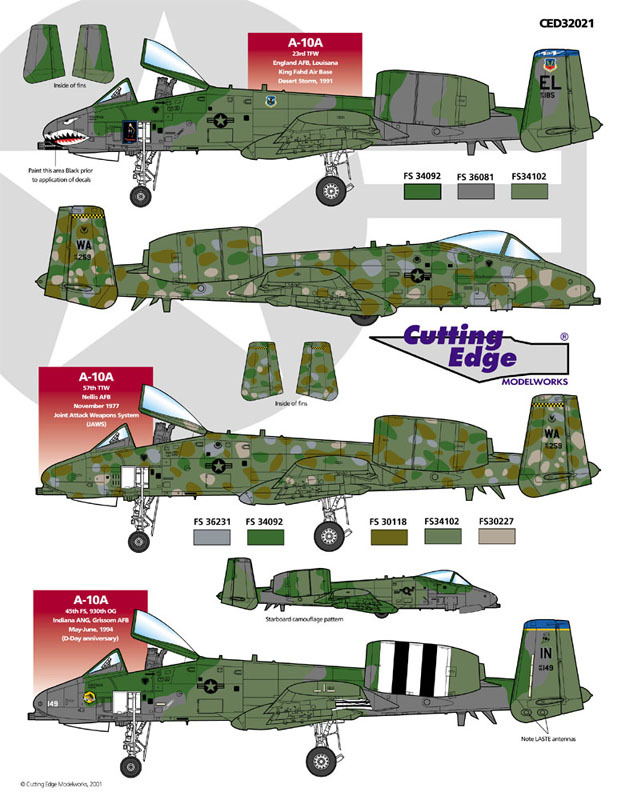 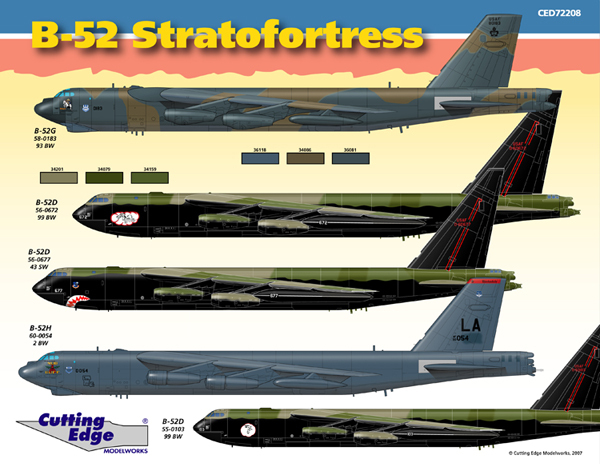 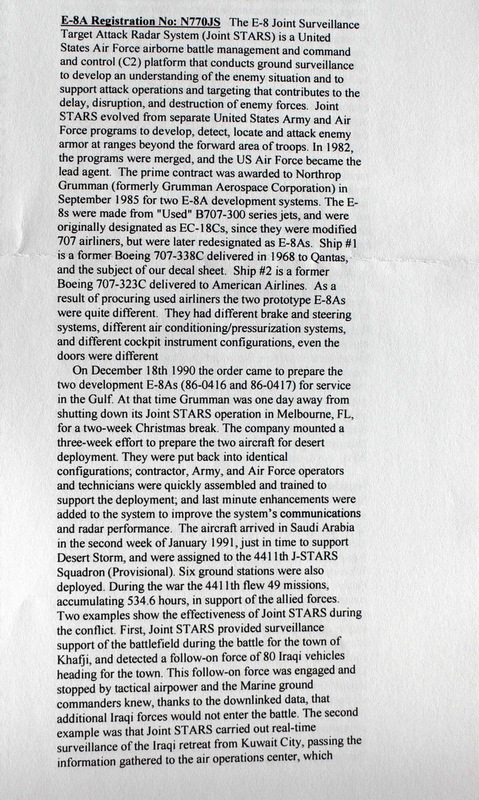 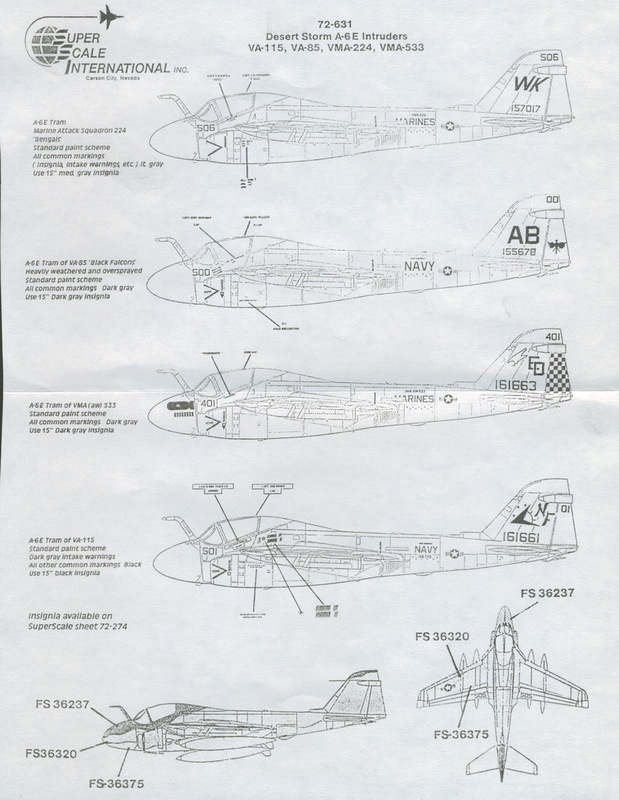 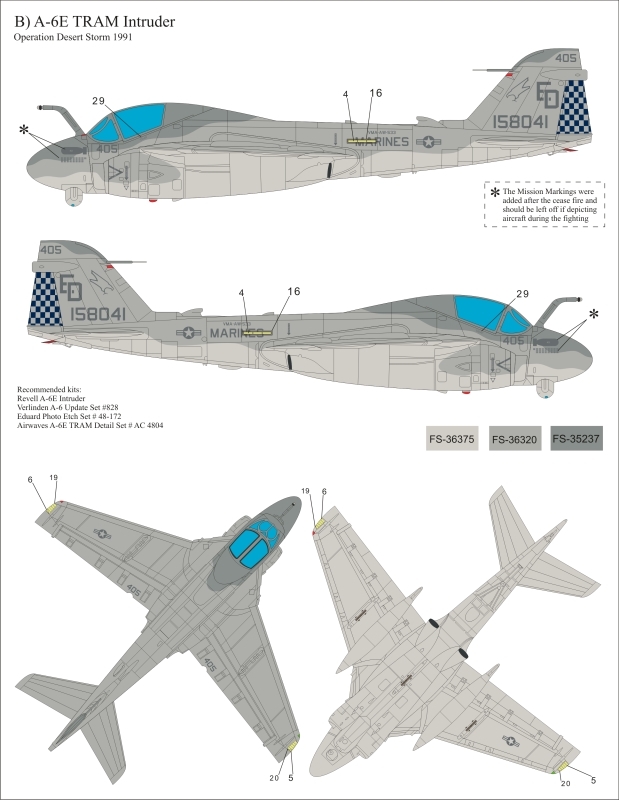 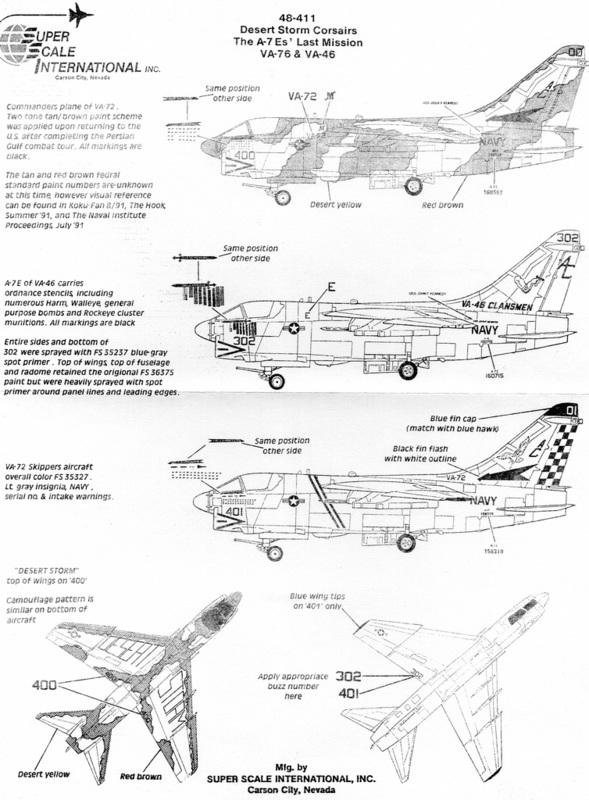 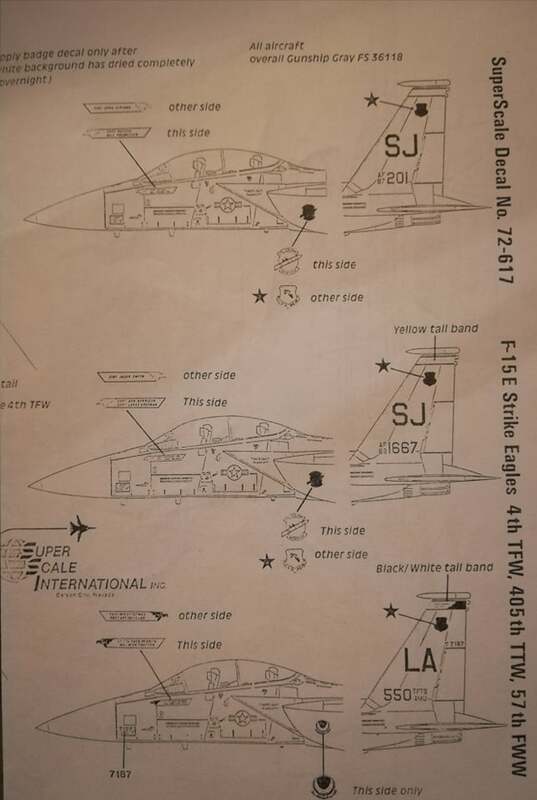 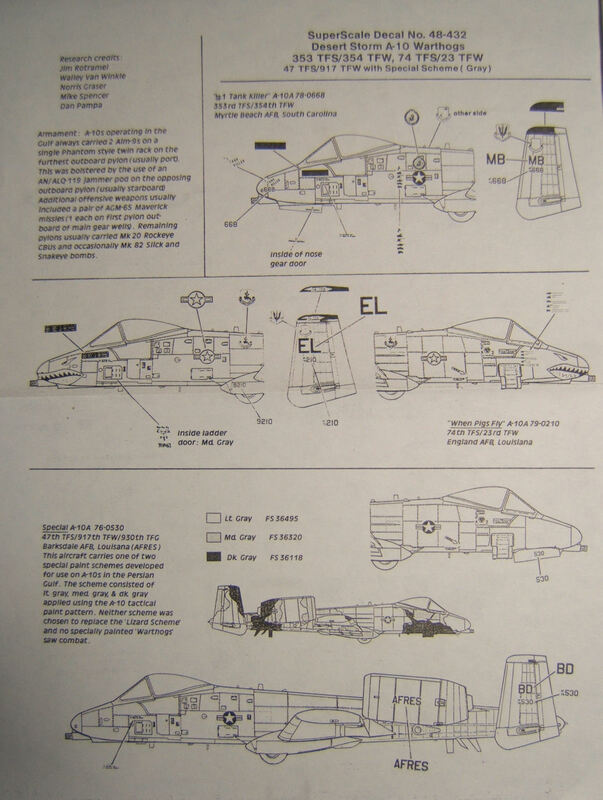 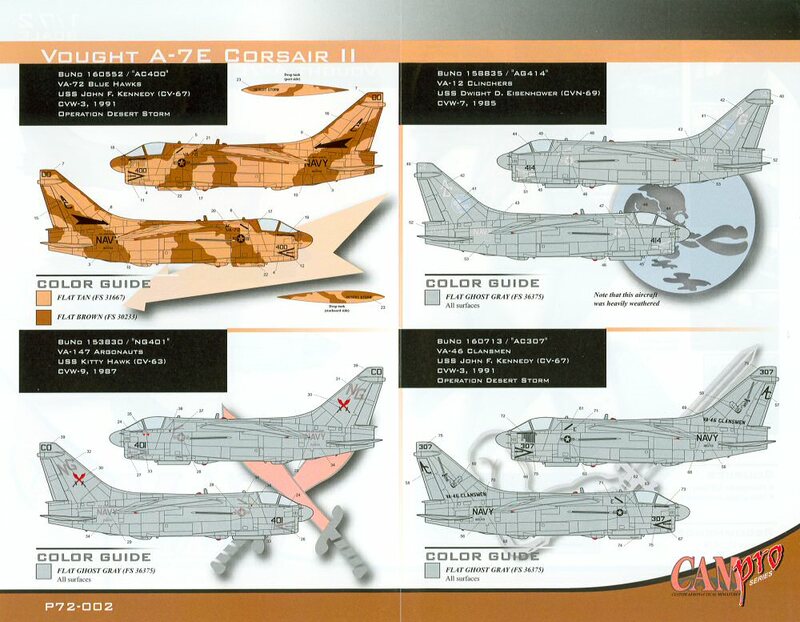 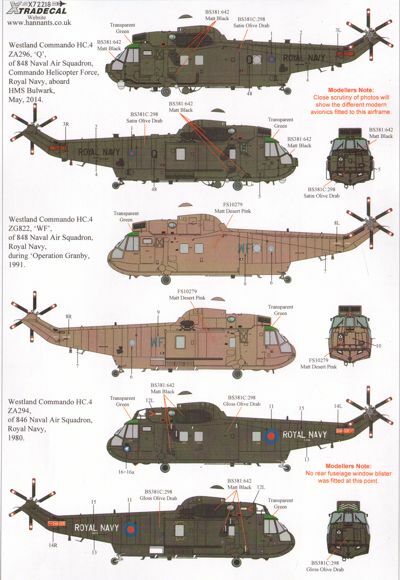 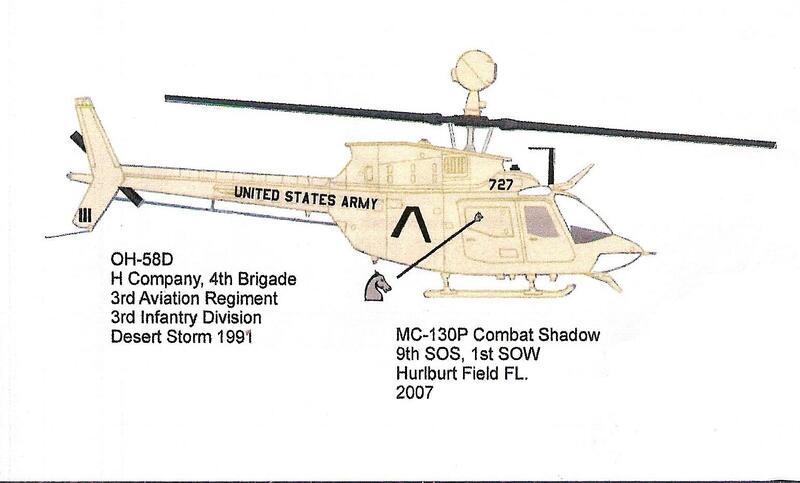 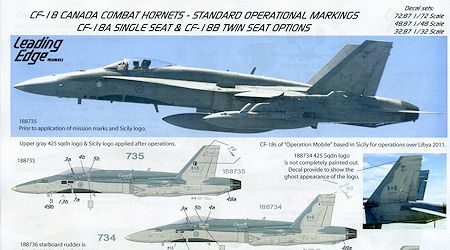 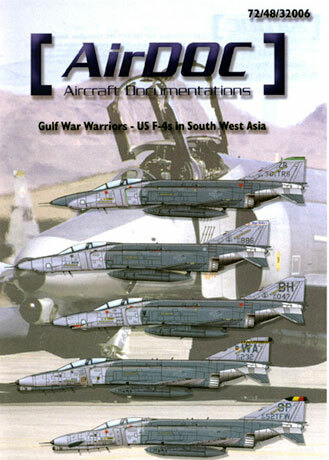 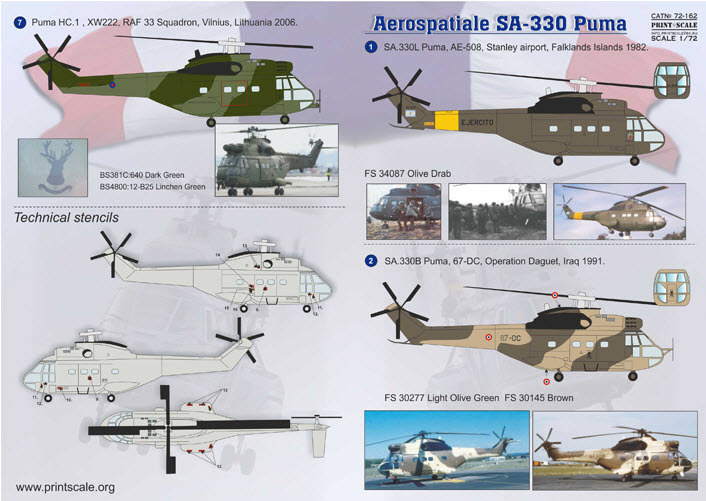 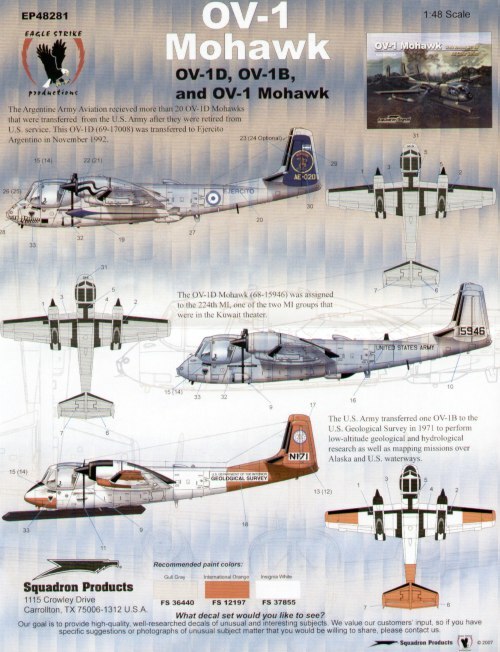 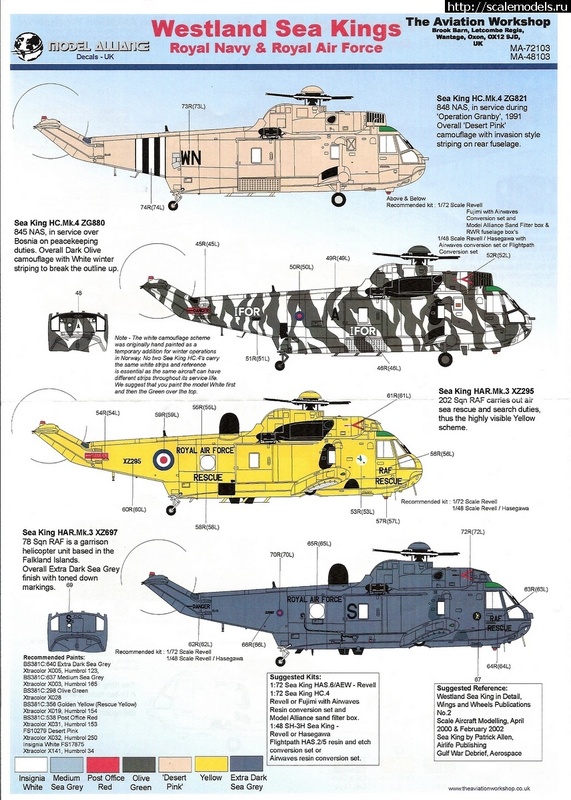 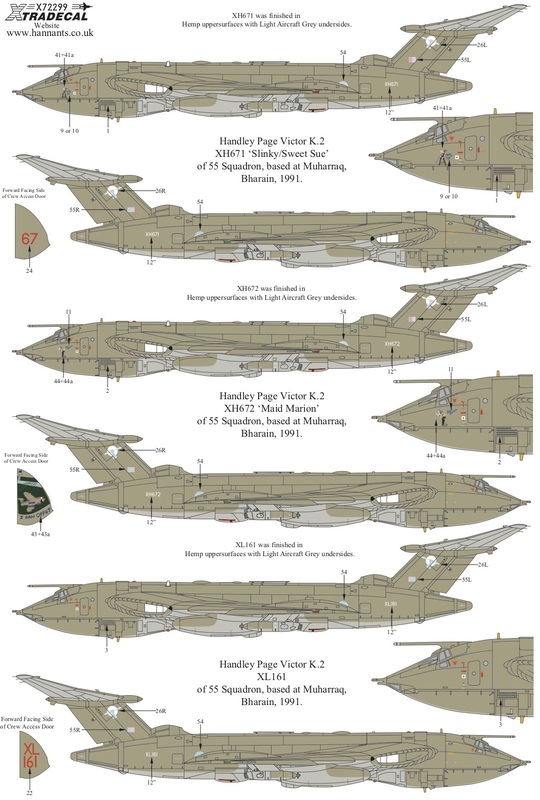 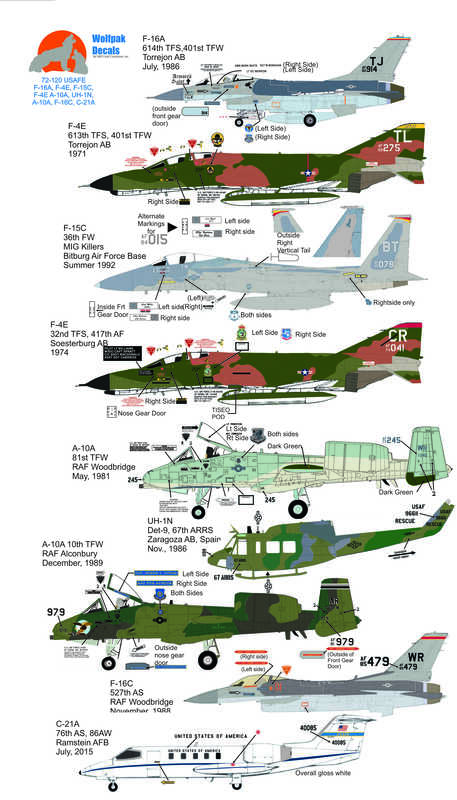 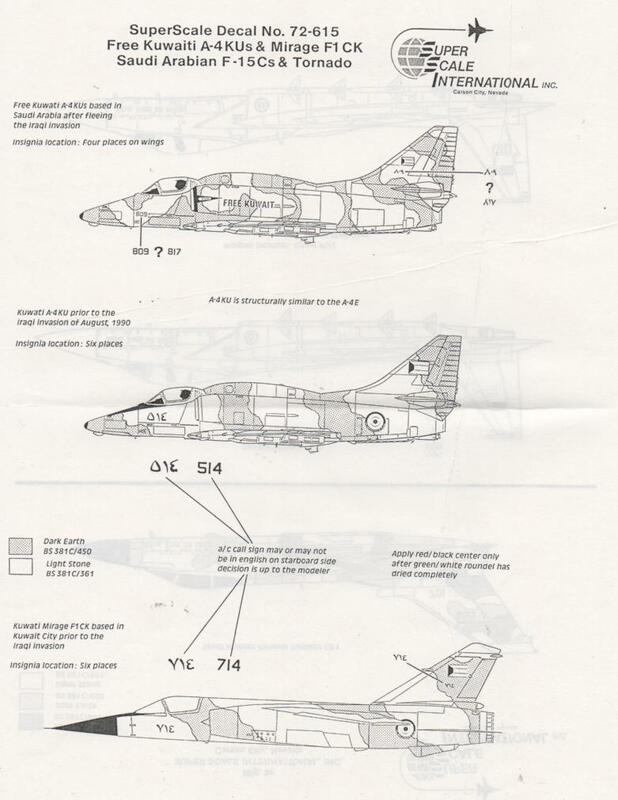 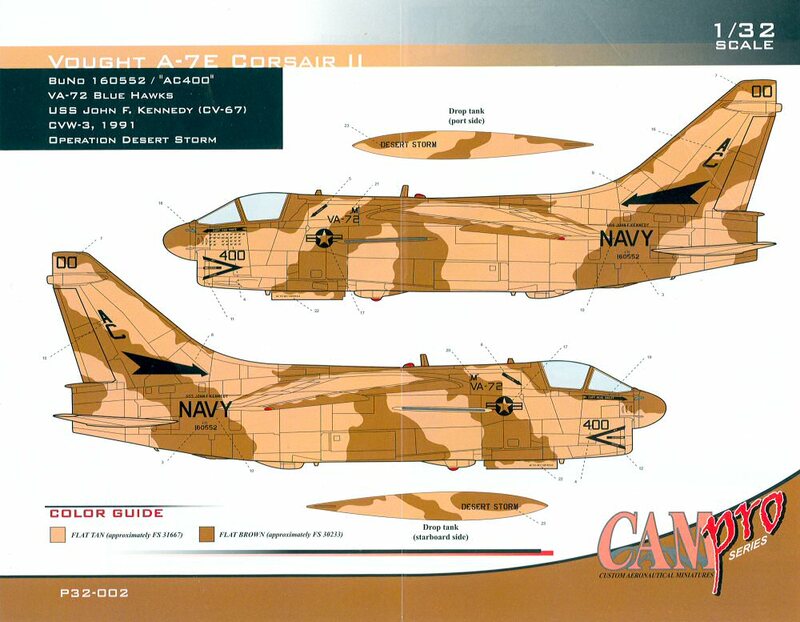 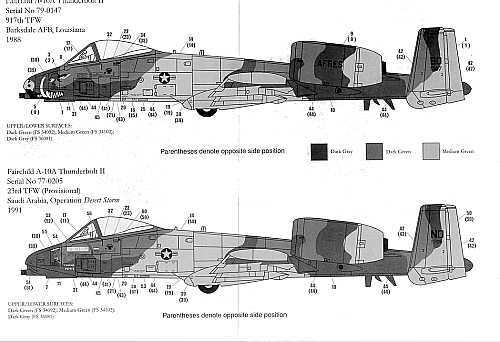 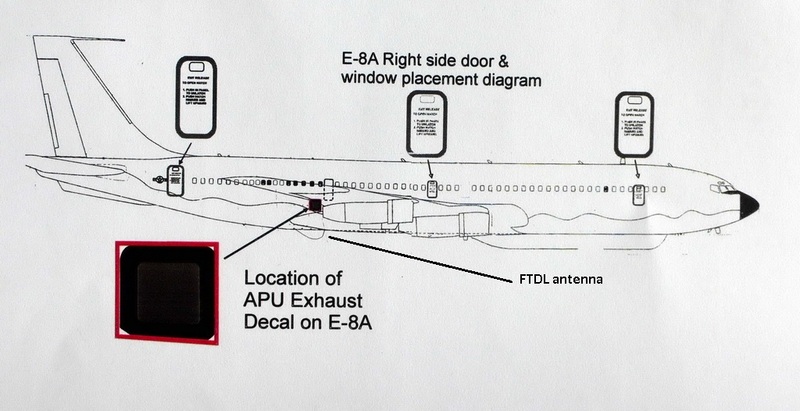 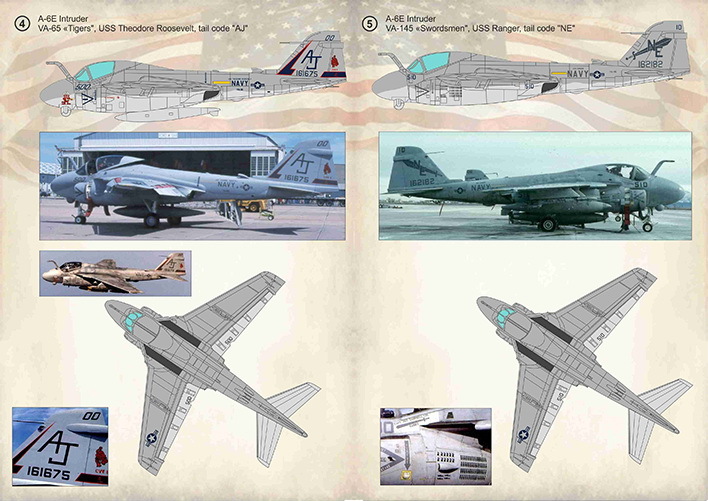 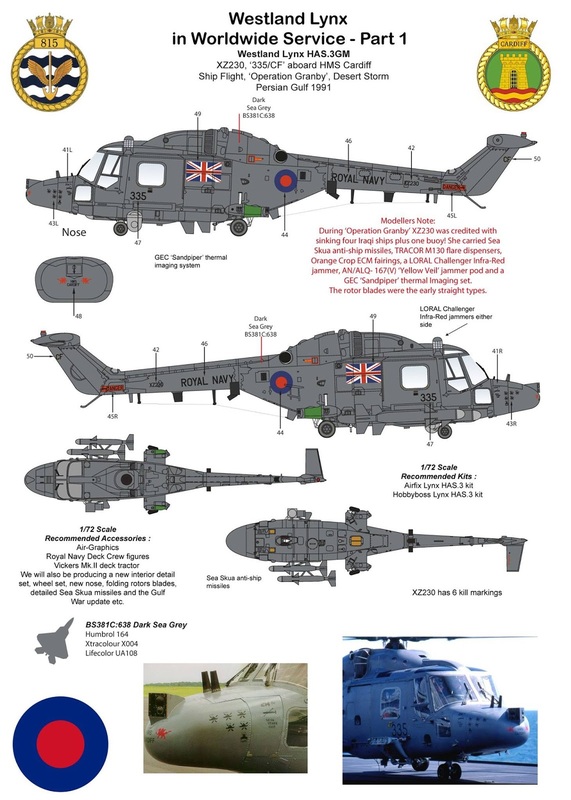 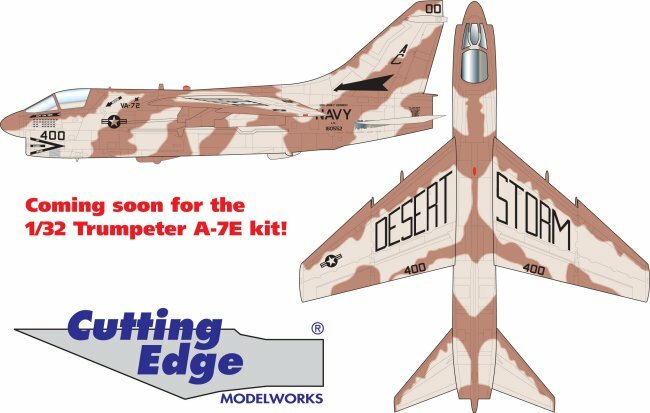 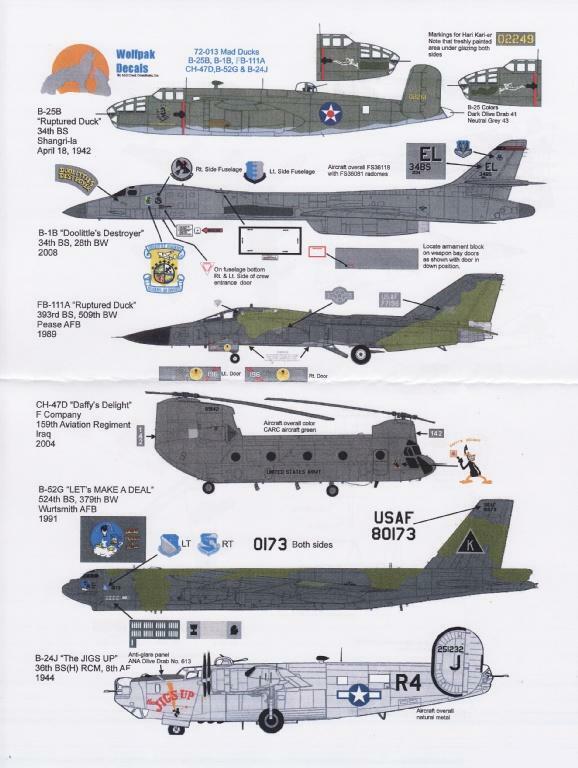 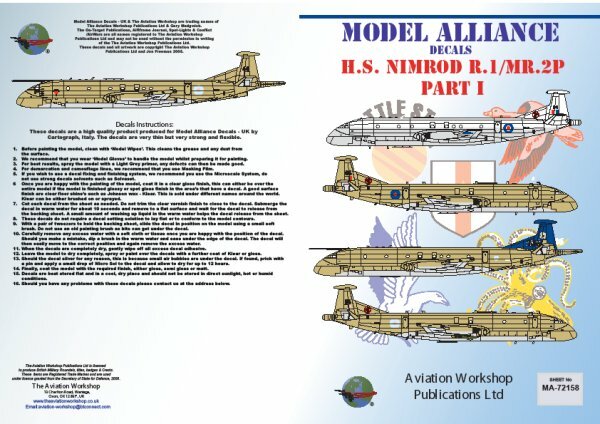 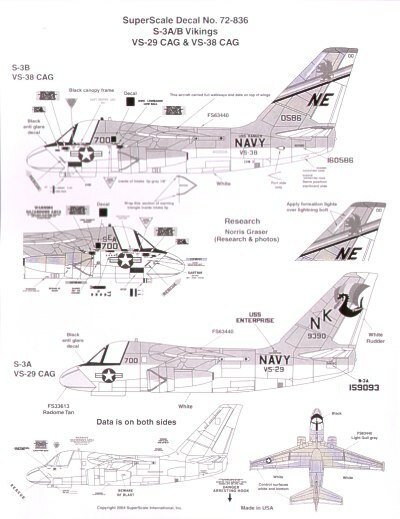 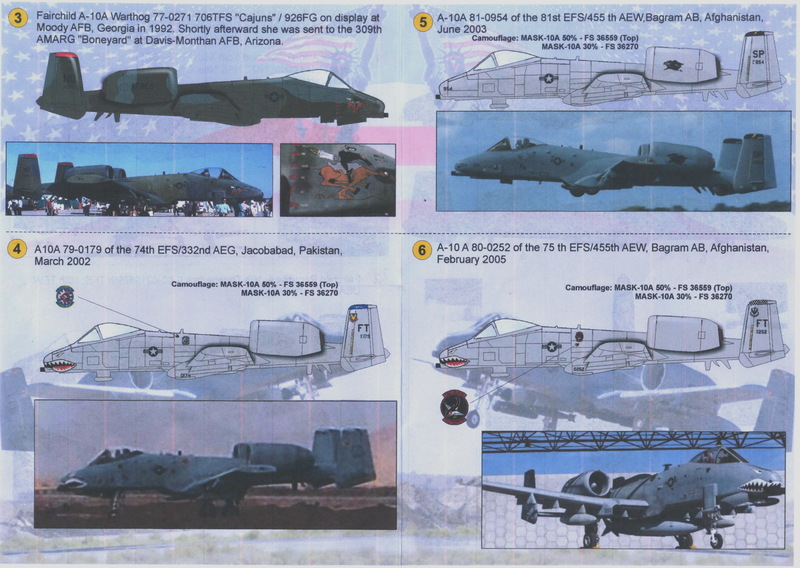 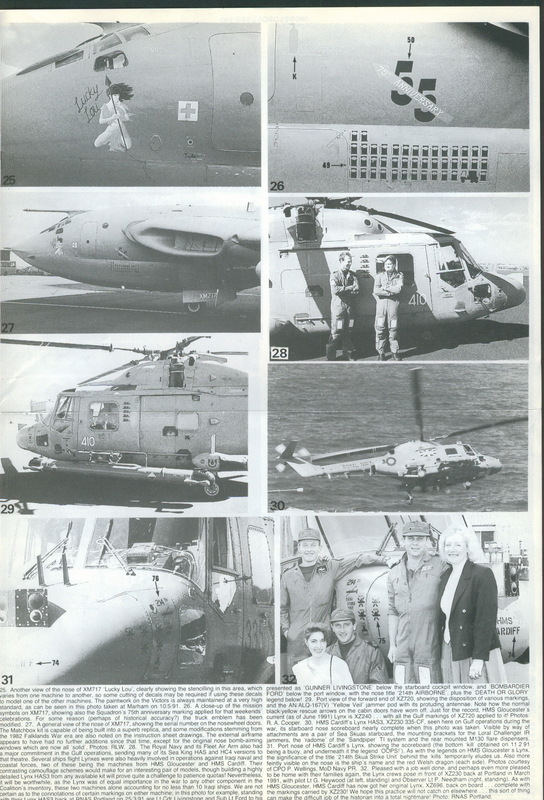 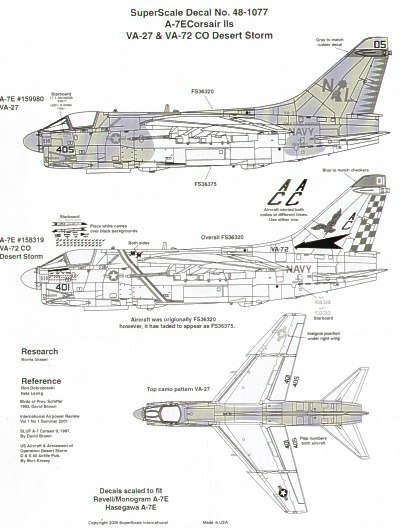 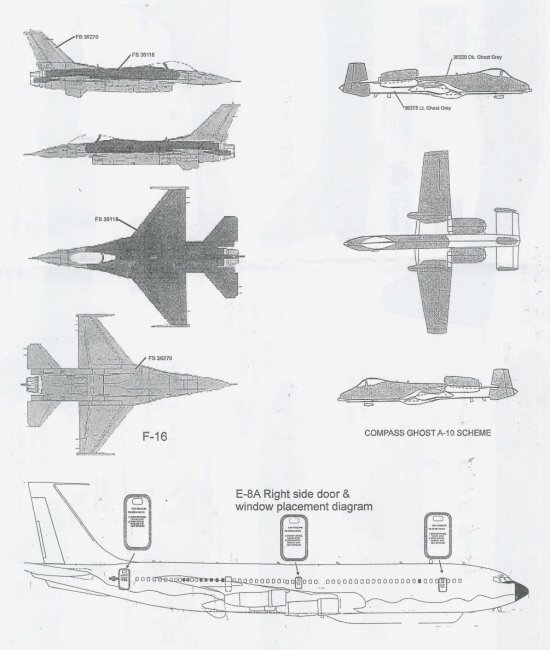 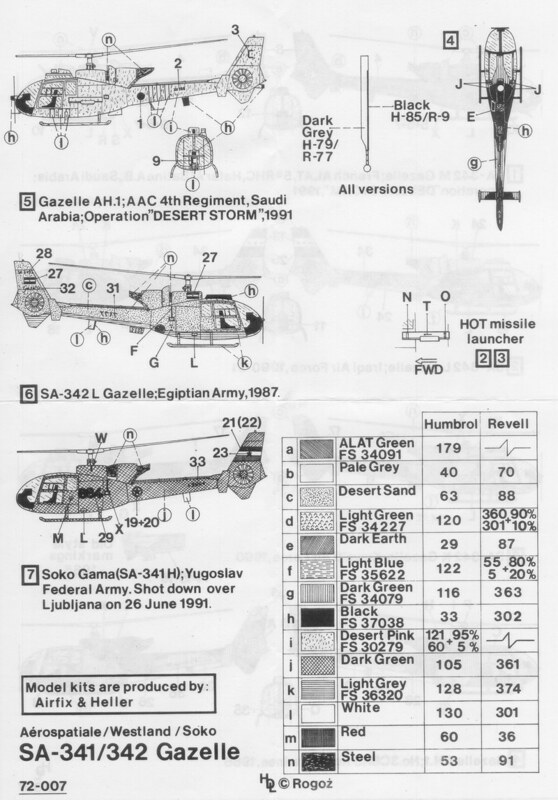 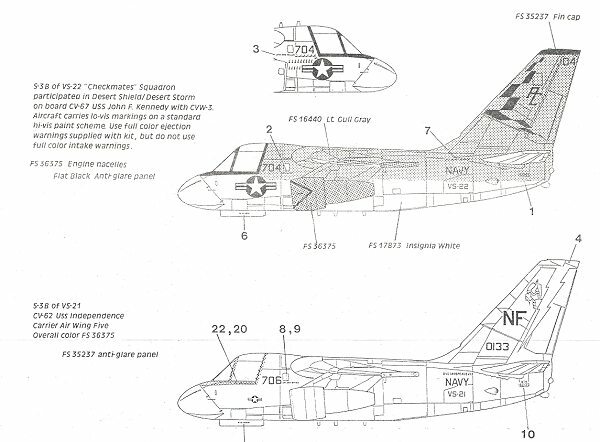 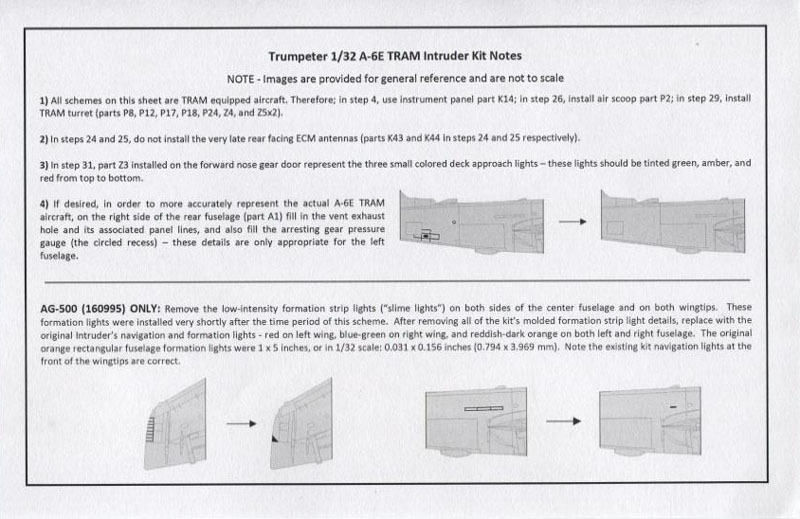 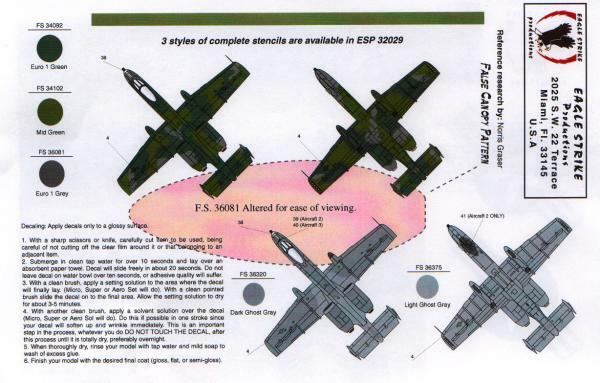 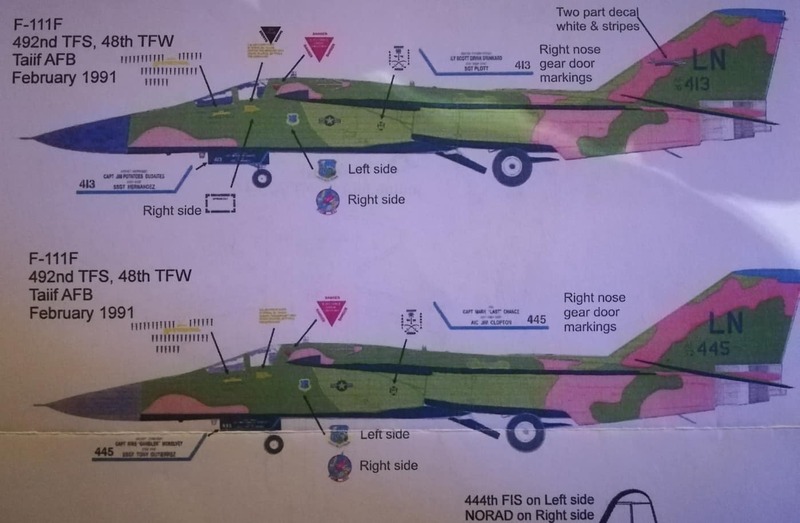 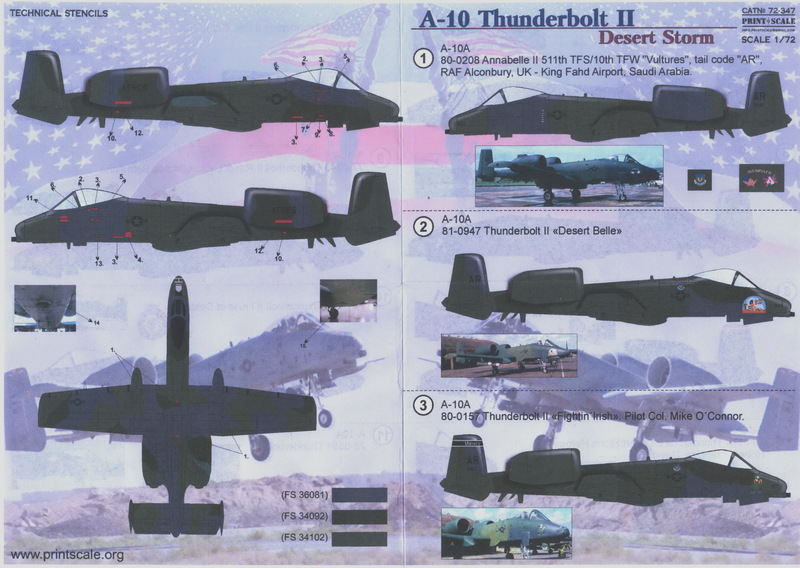 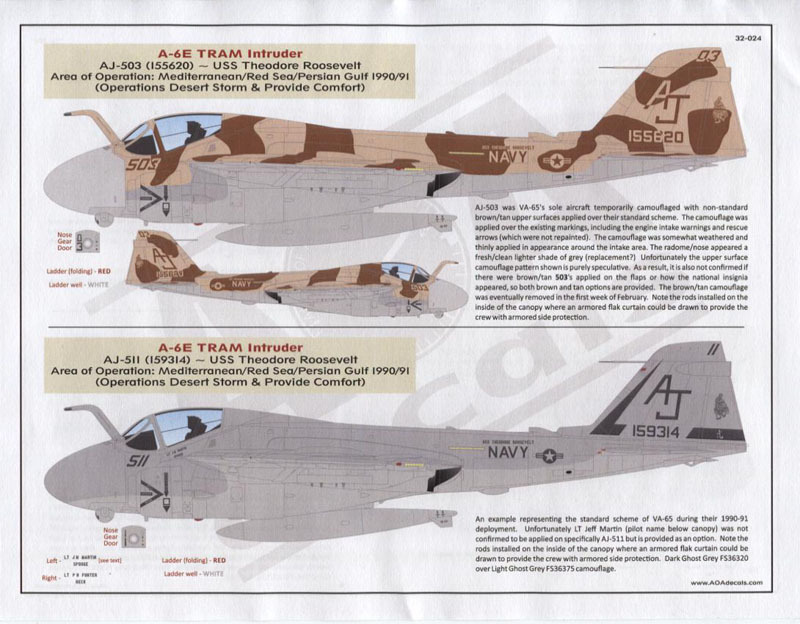 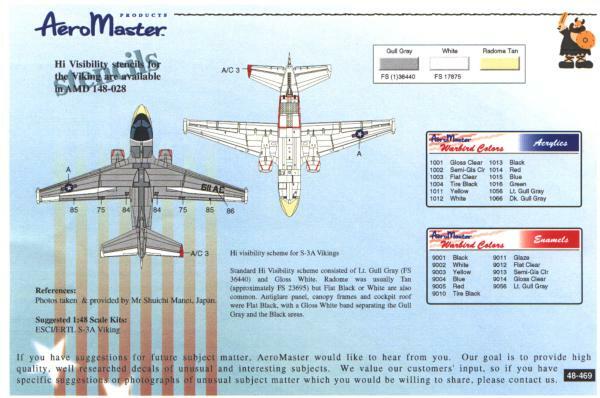 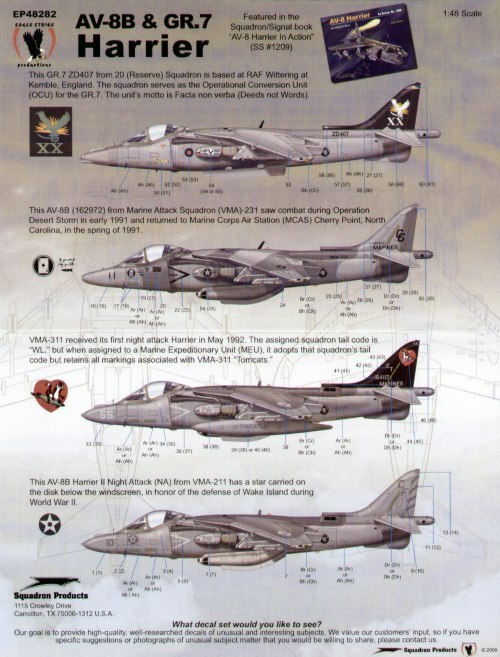 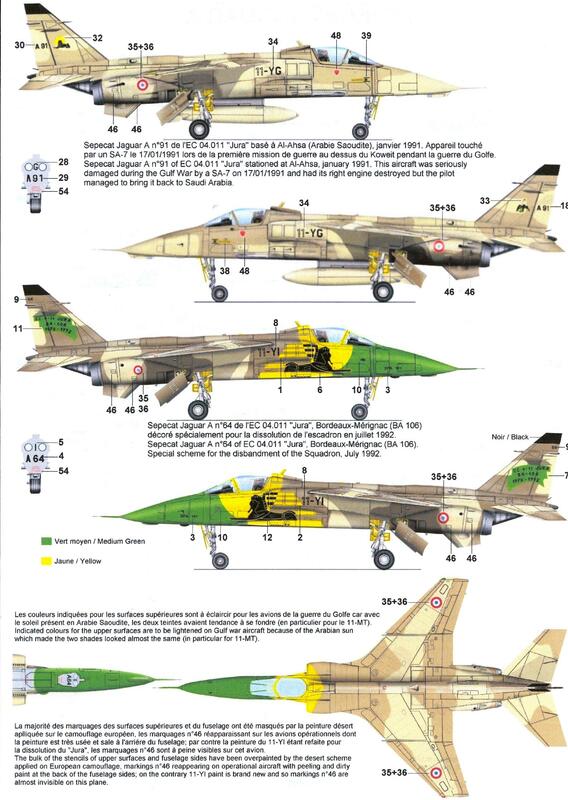 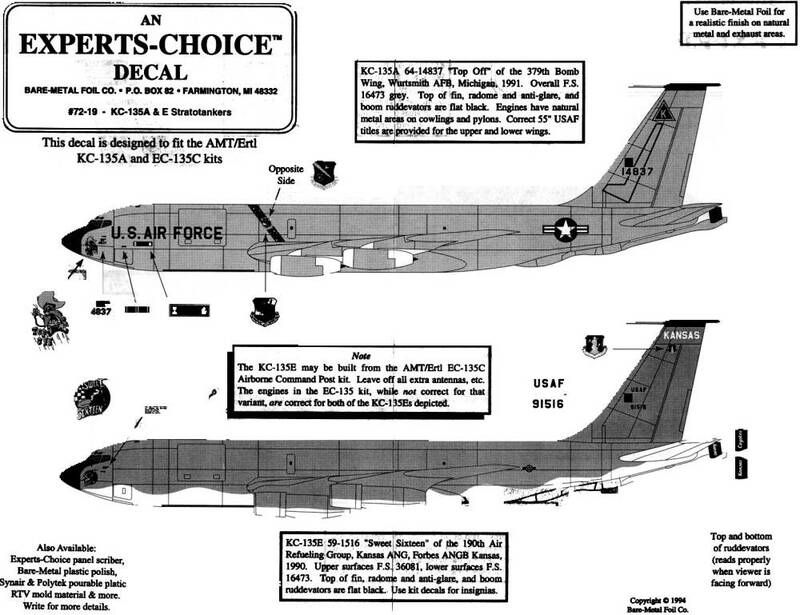 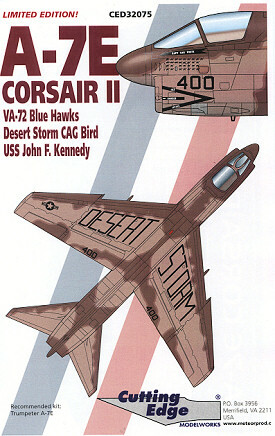 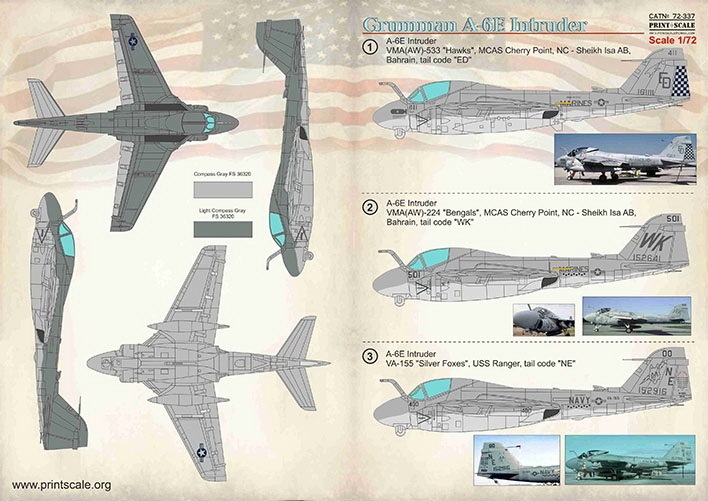 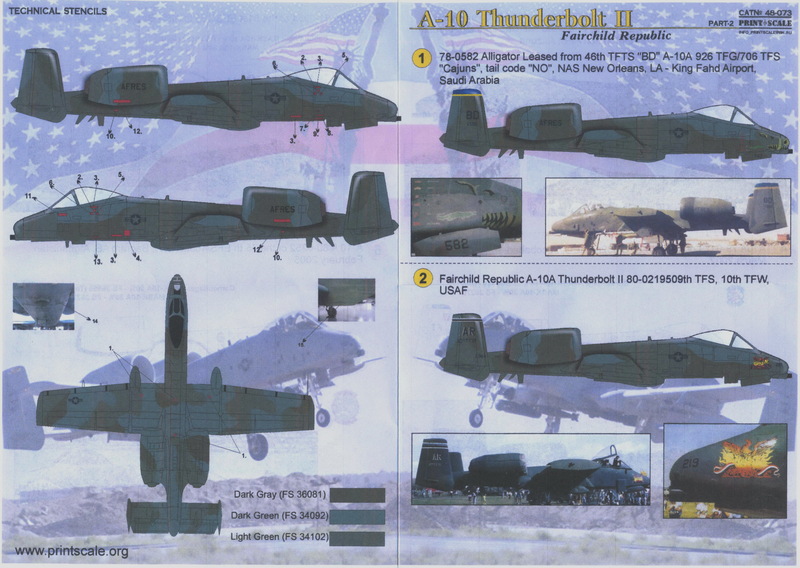 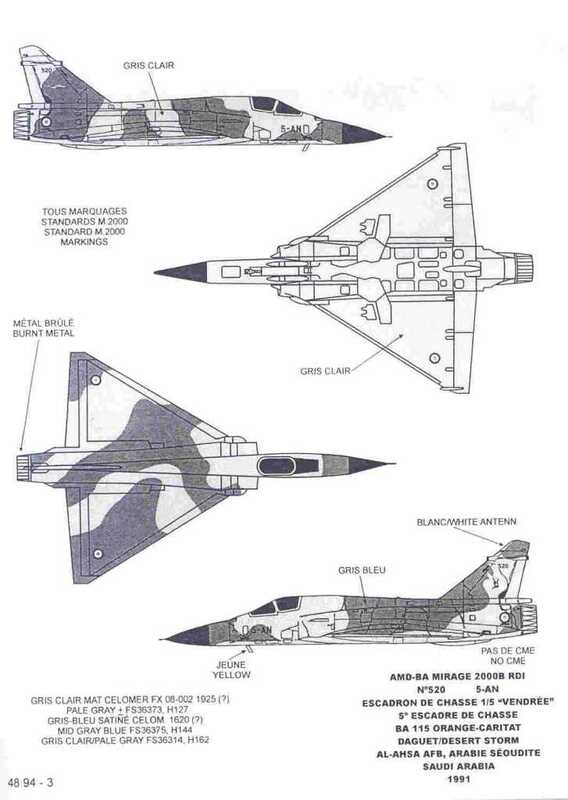 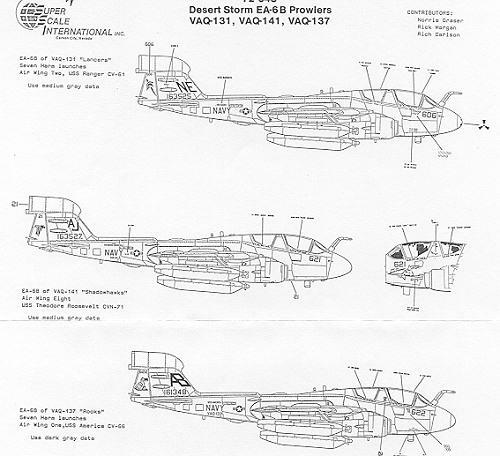 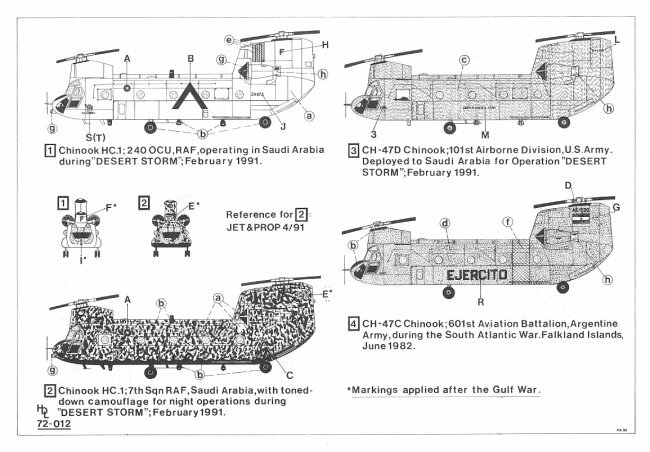 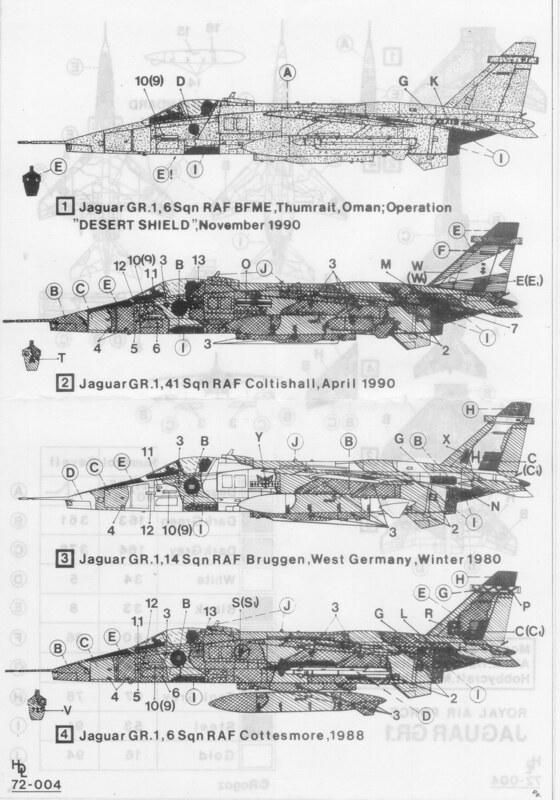 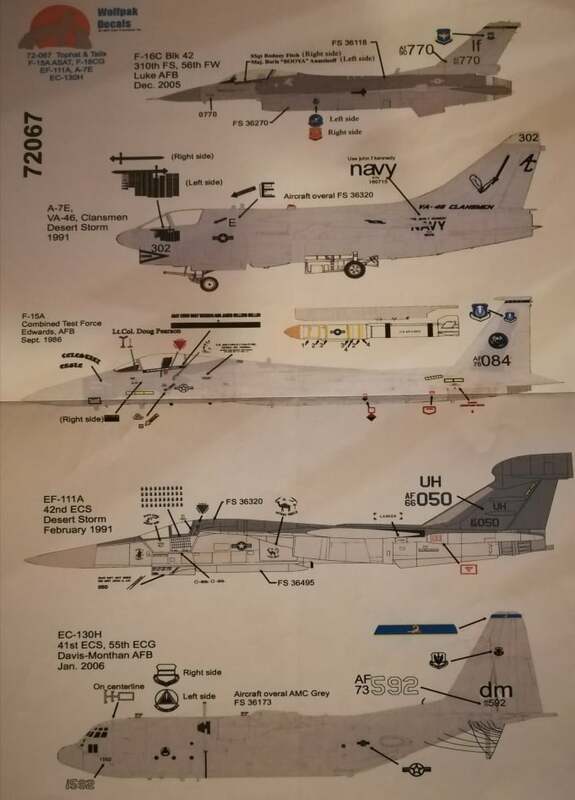 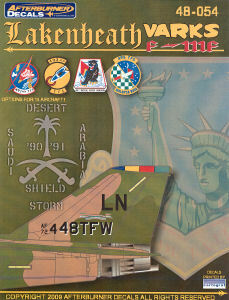 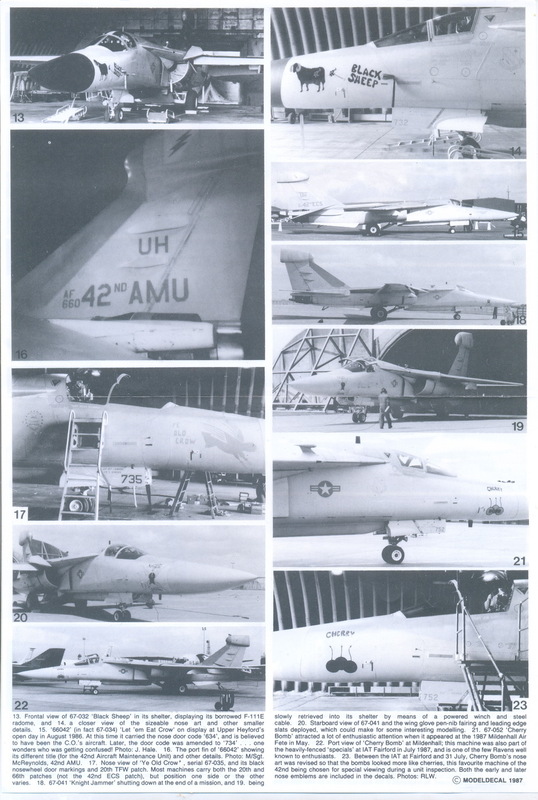 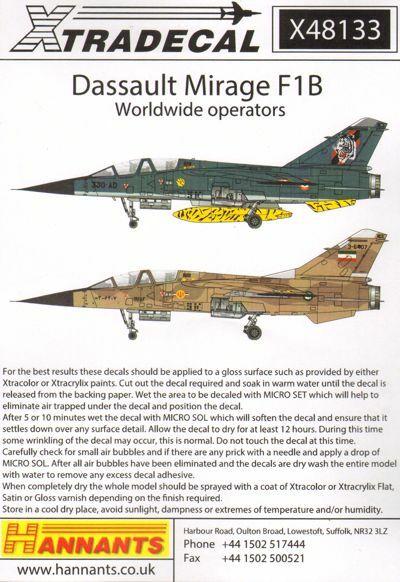 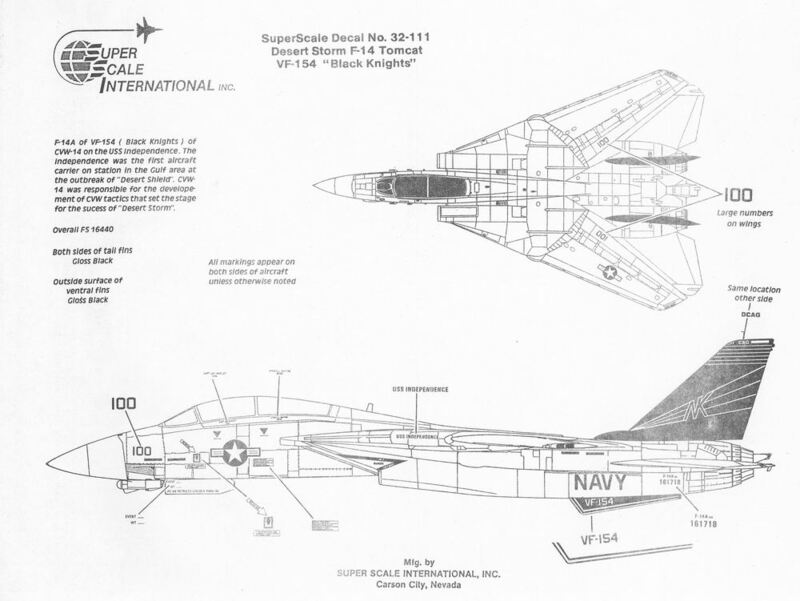 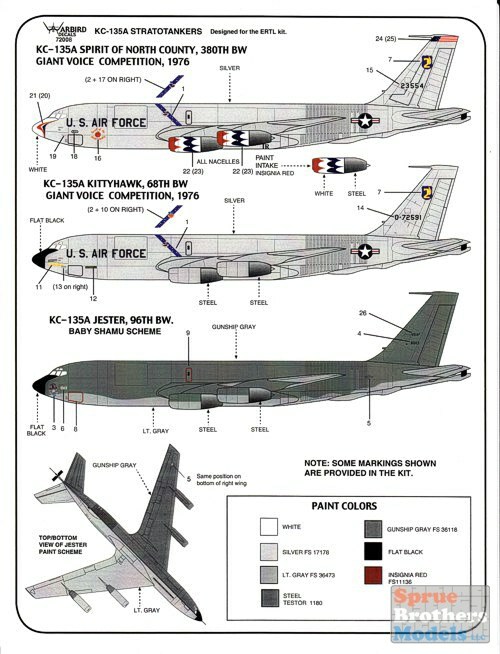 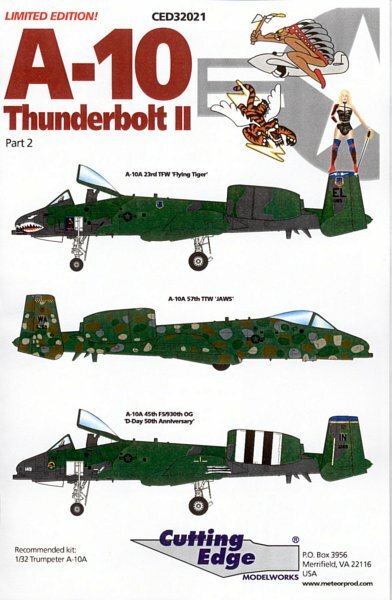 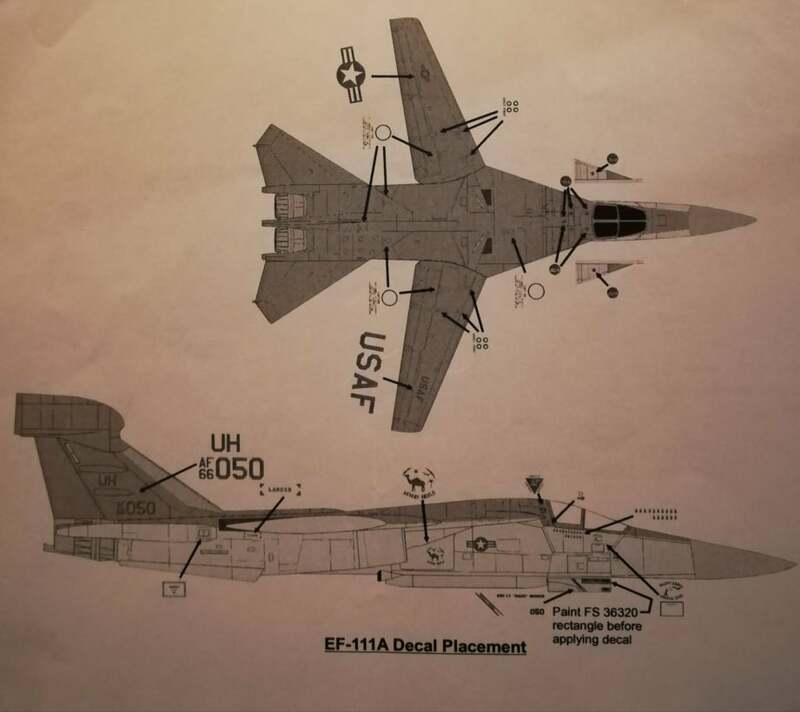 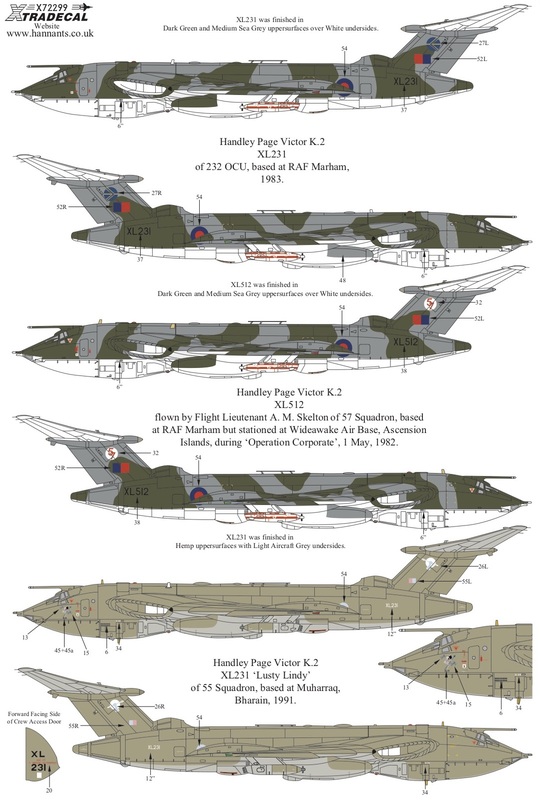 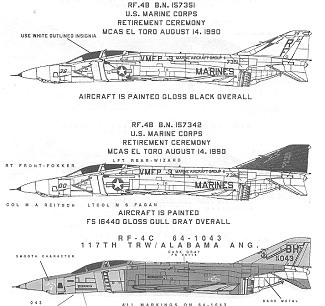 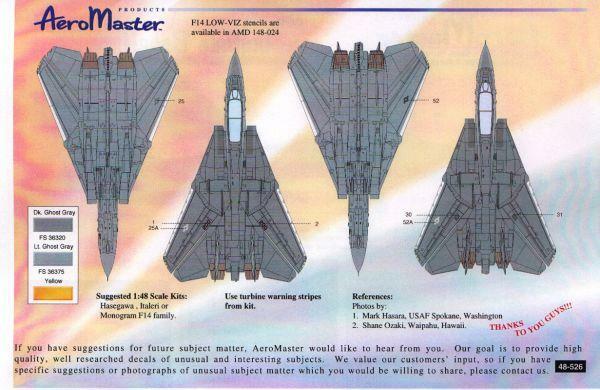 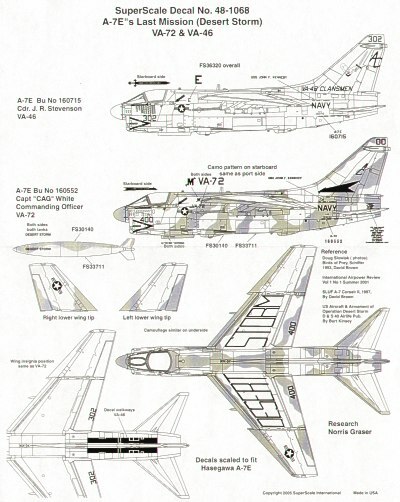 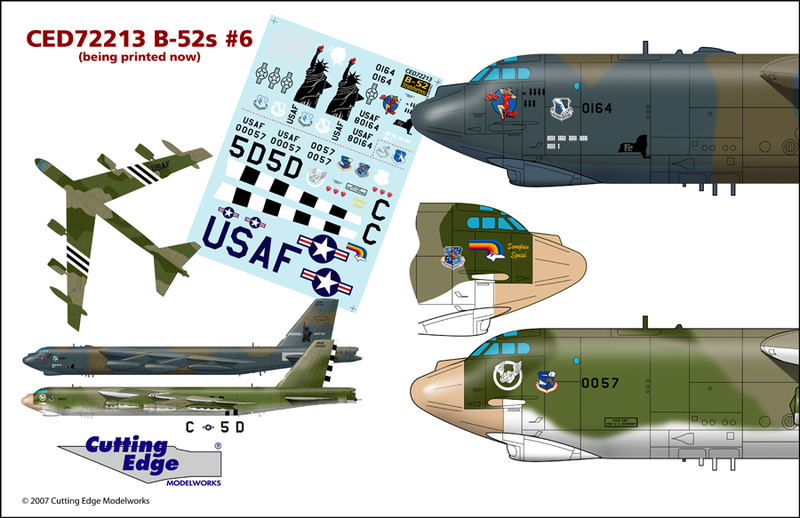 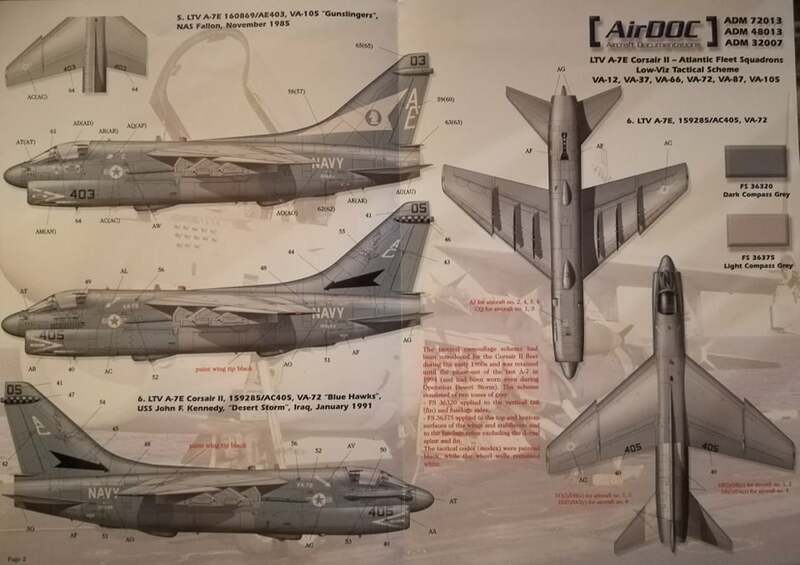 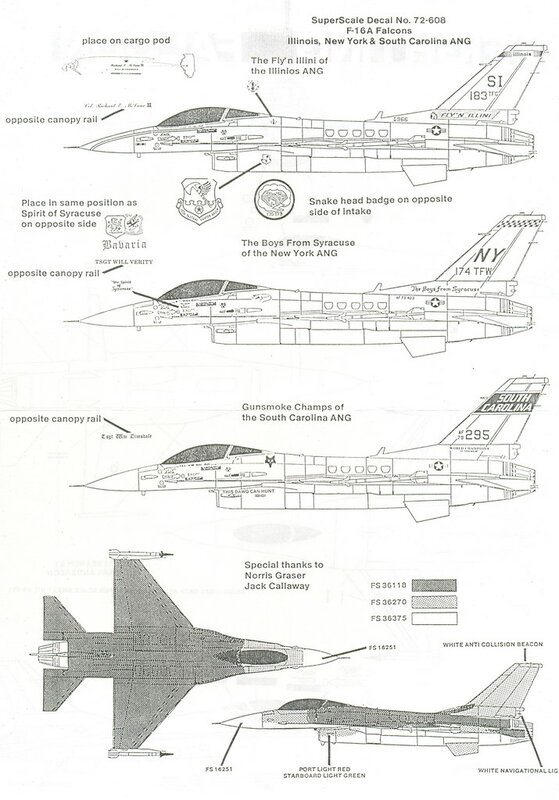 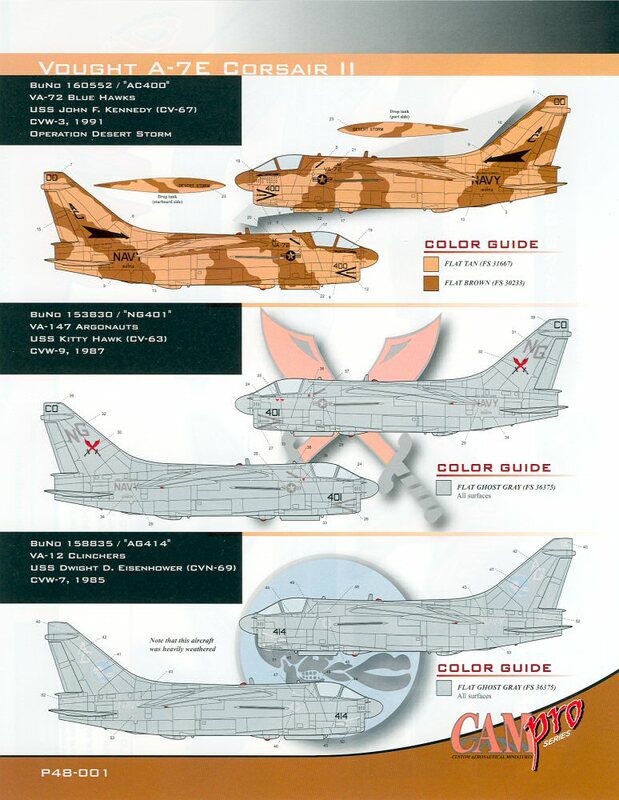 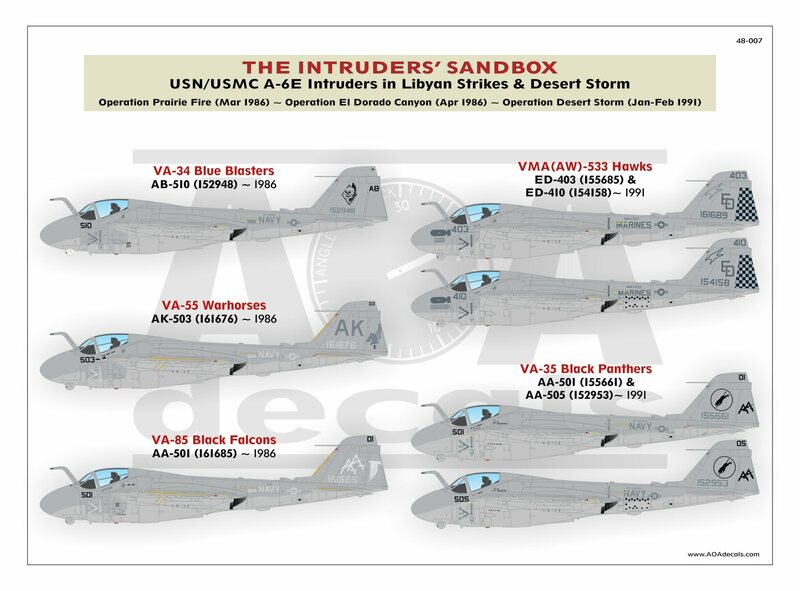 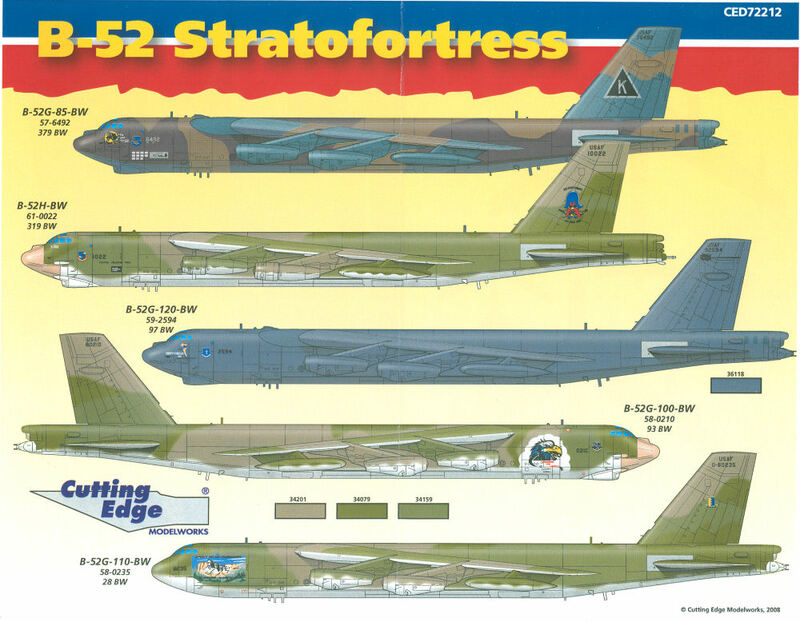 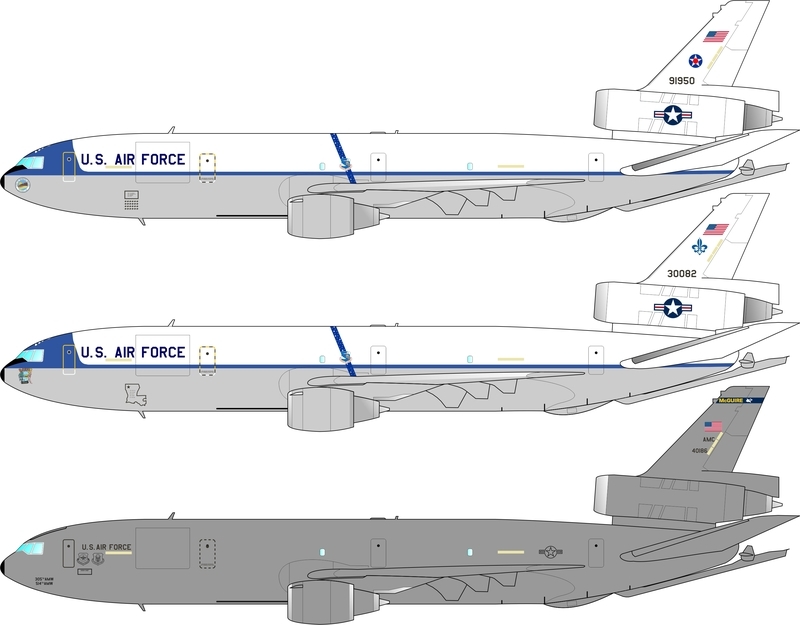 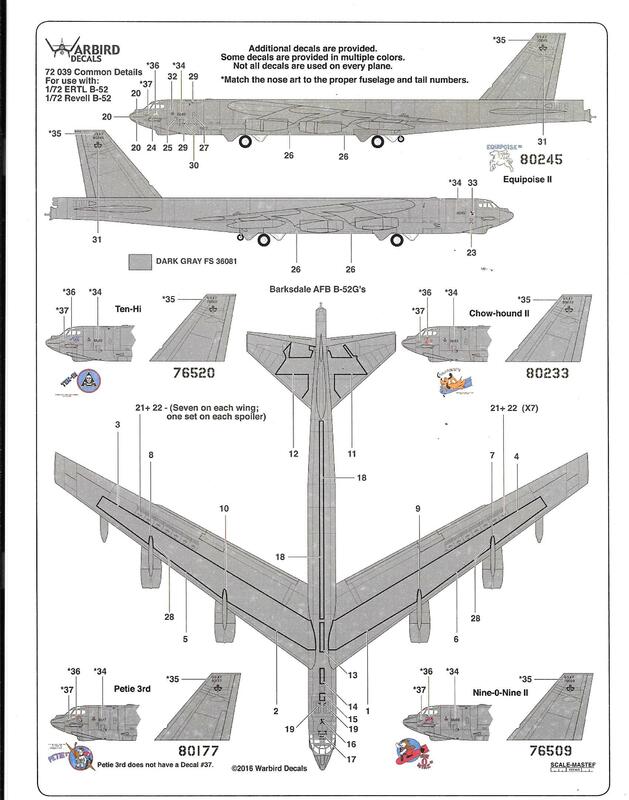 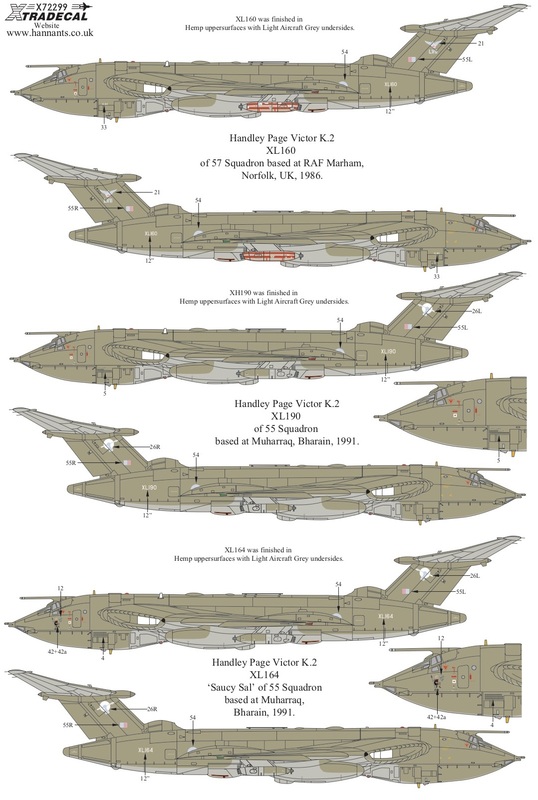 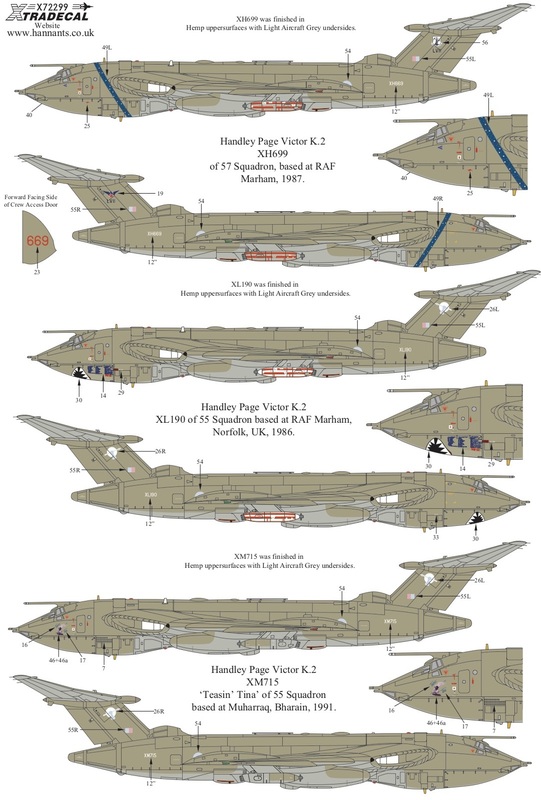 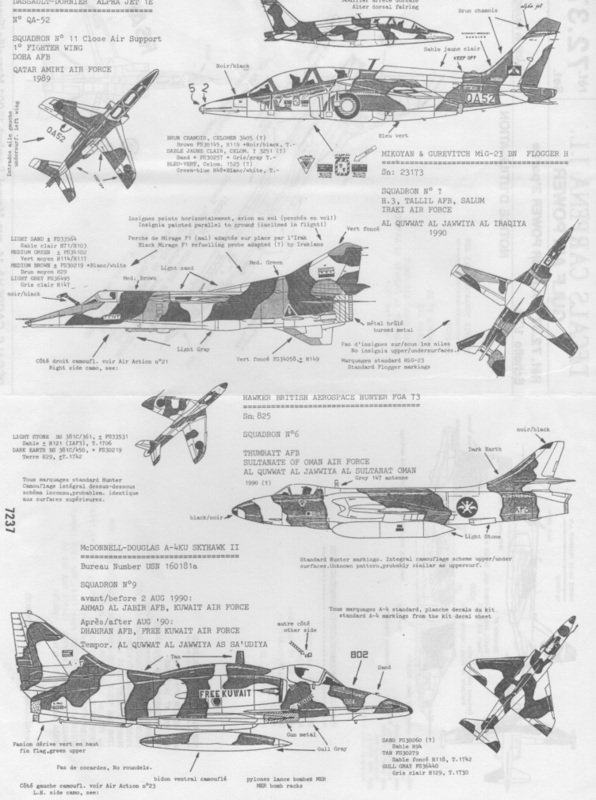 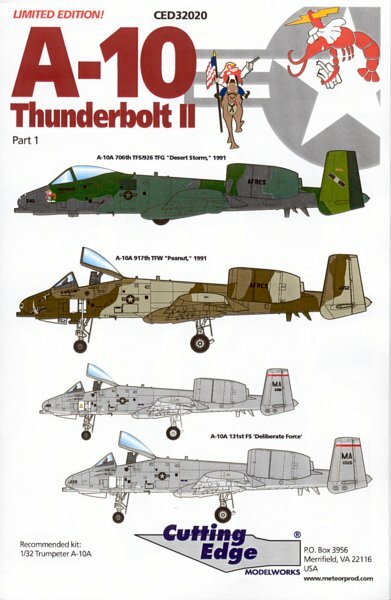 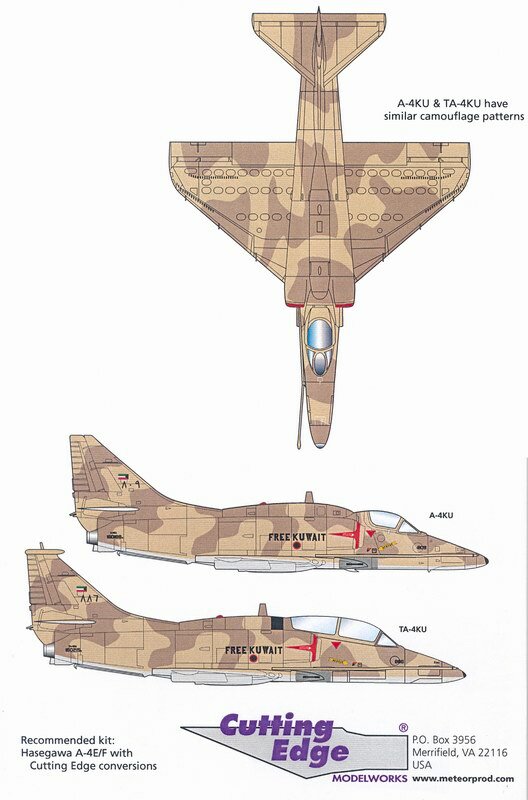 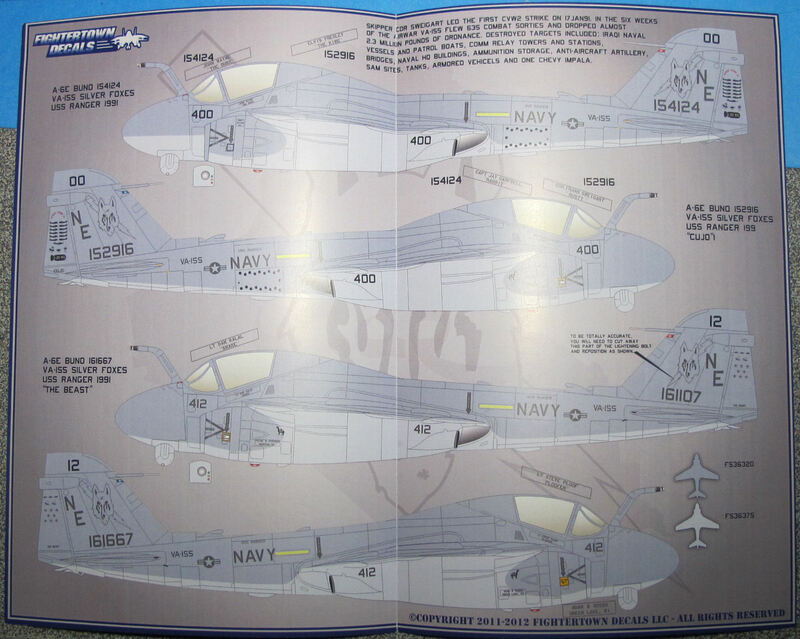 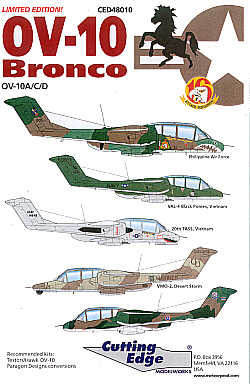 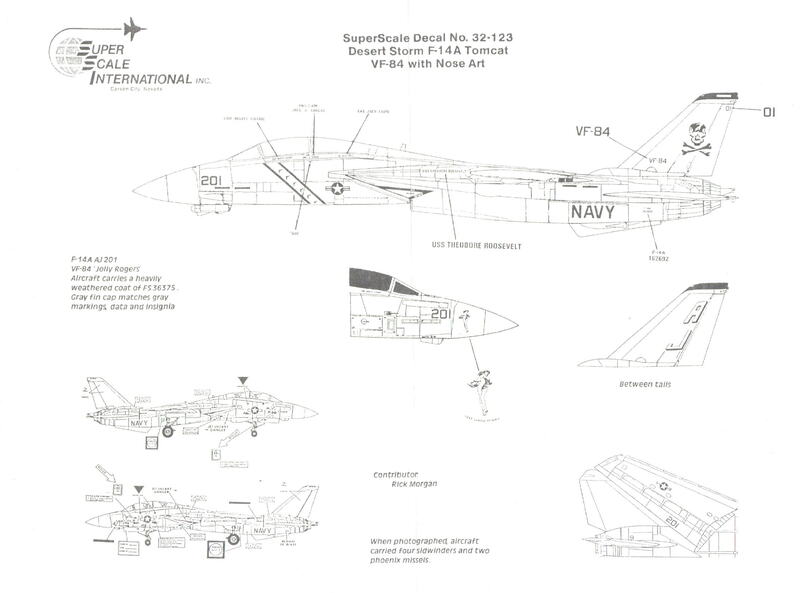 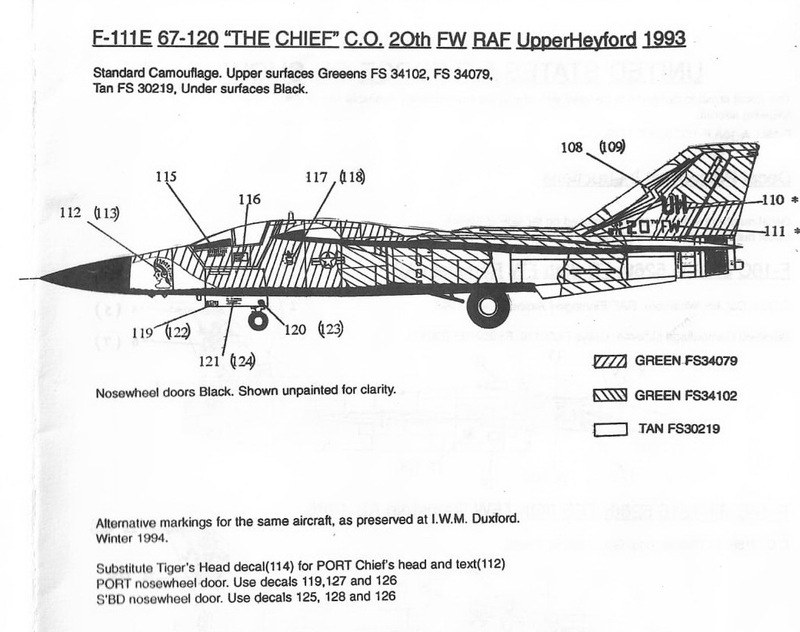 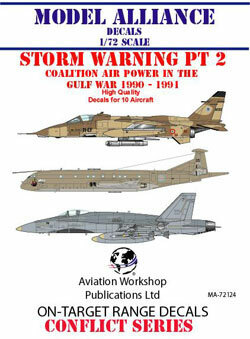 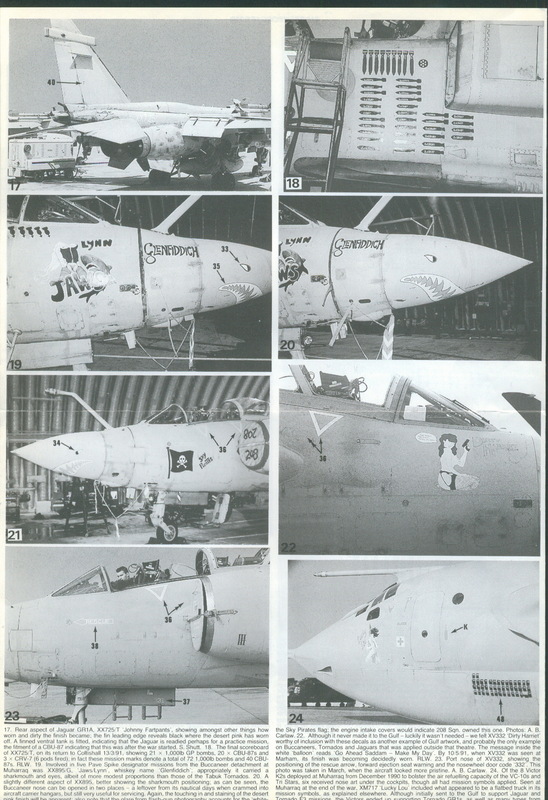 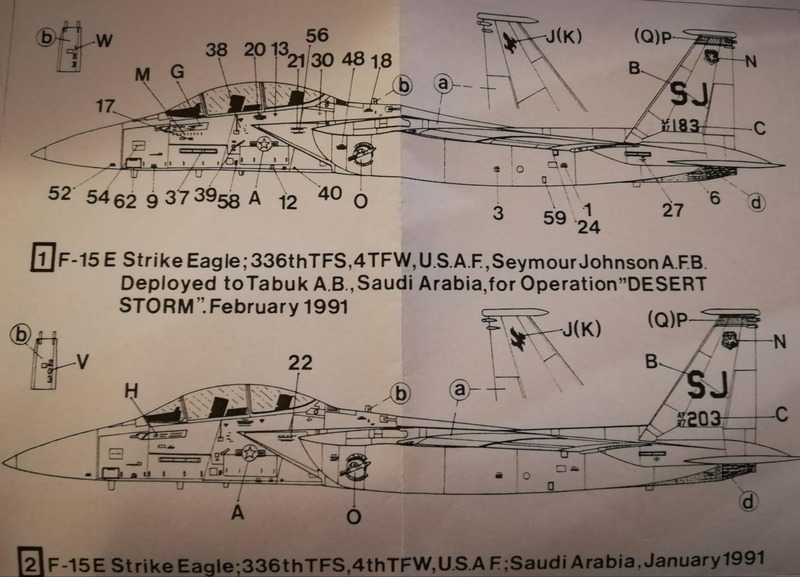 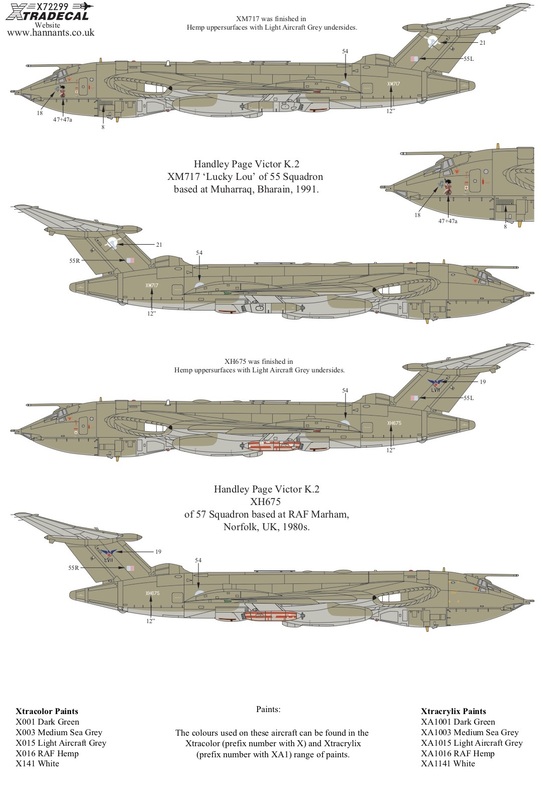 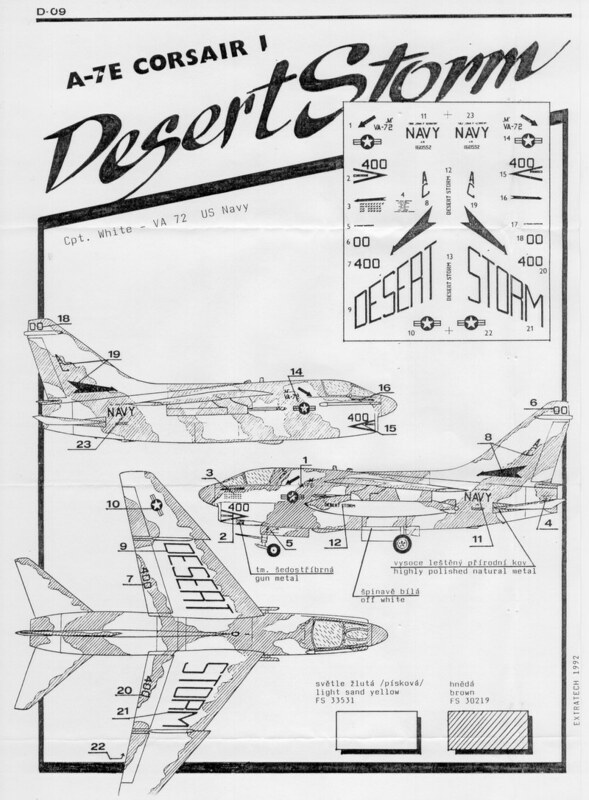 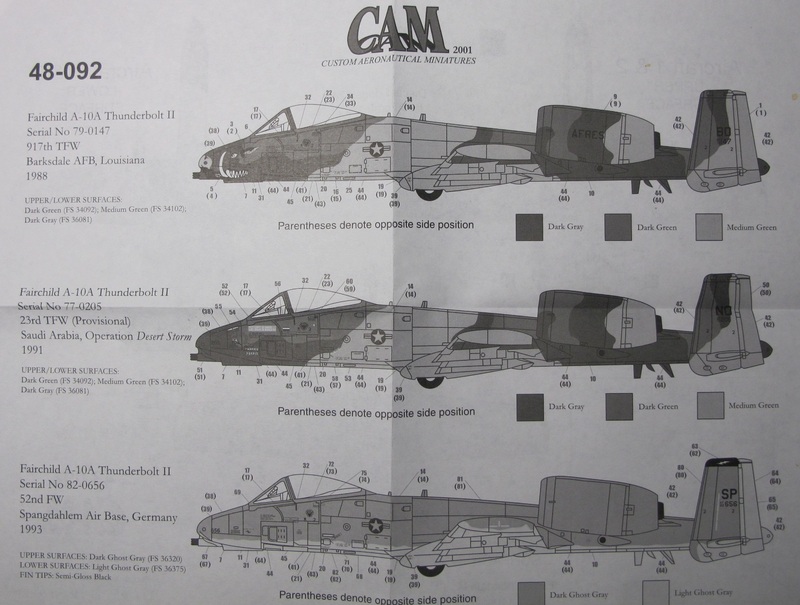 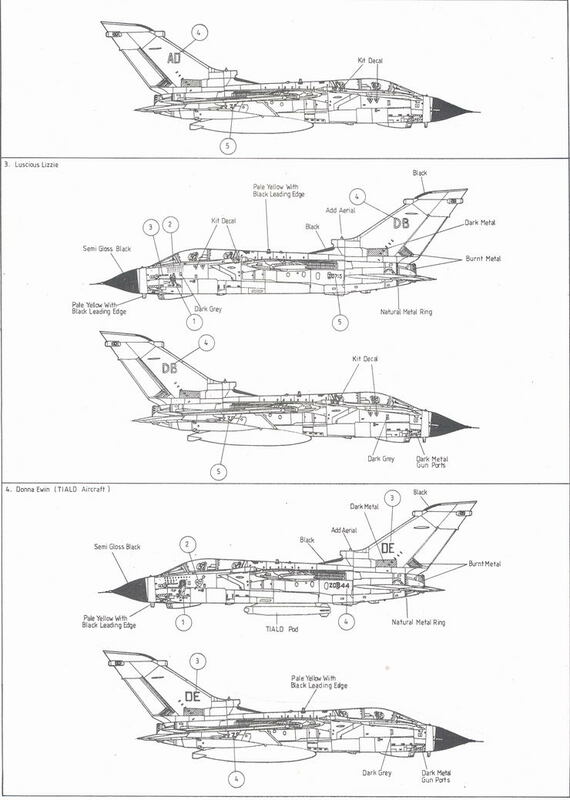 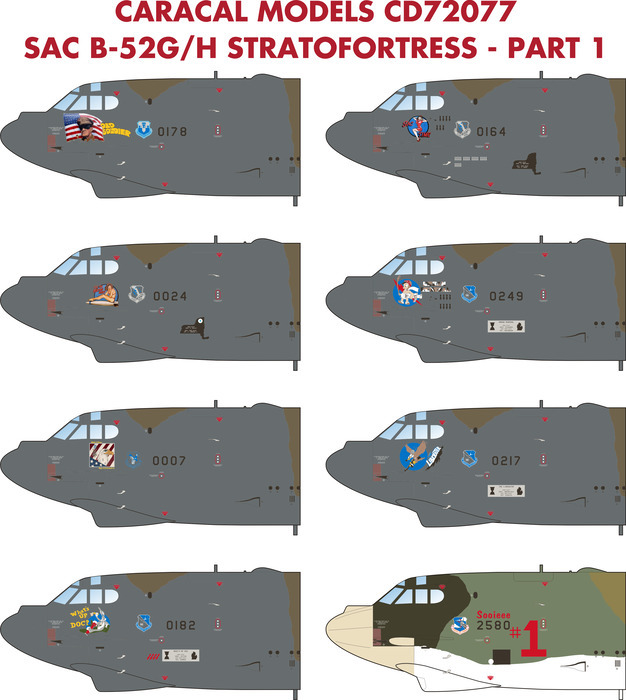 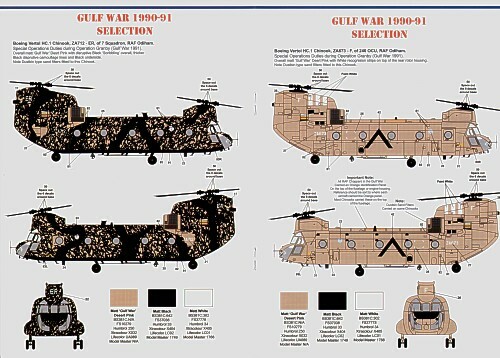 87-26000 - This aircraft was painted in overall Sand FS33303 with Olive Drab doors and other areas showing OD where the Sand paint had worn off. 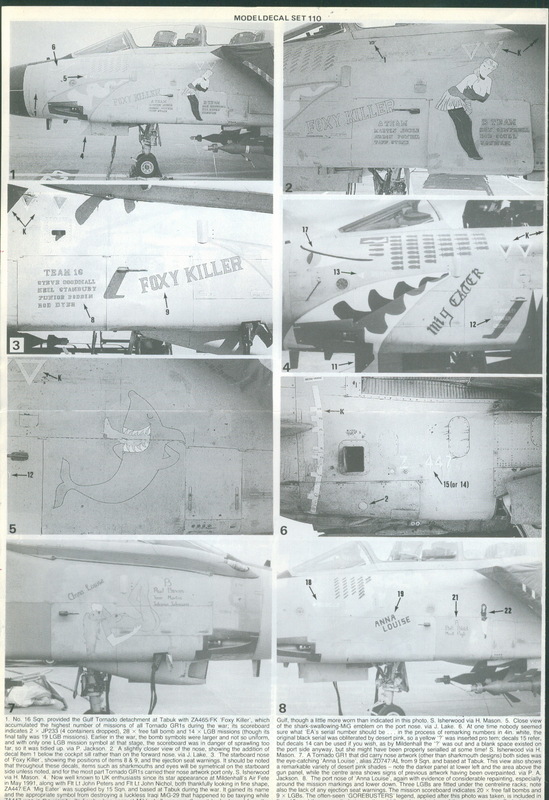 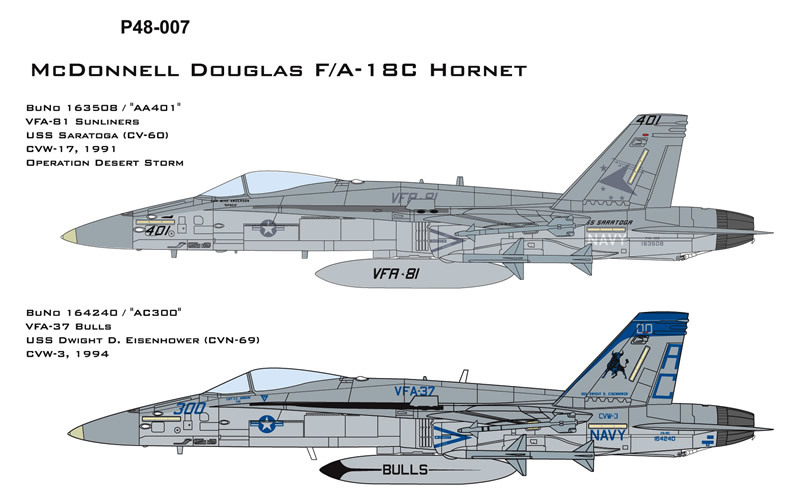 It carries tally marks behind the pilot's door representing 72 Iraqi POW carried to internment camps during the Gulf War, plus the word 'TINNIN'.